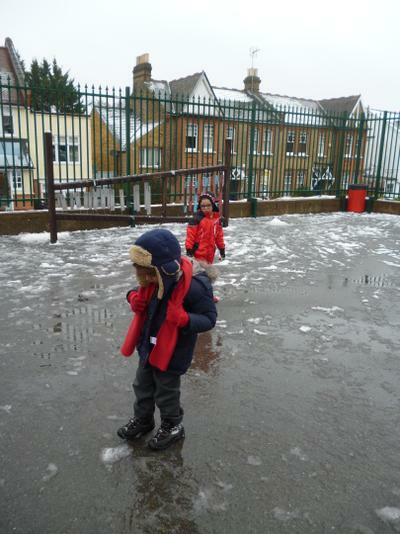 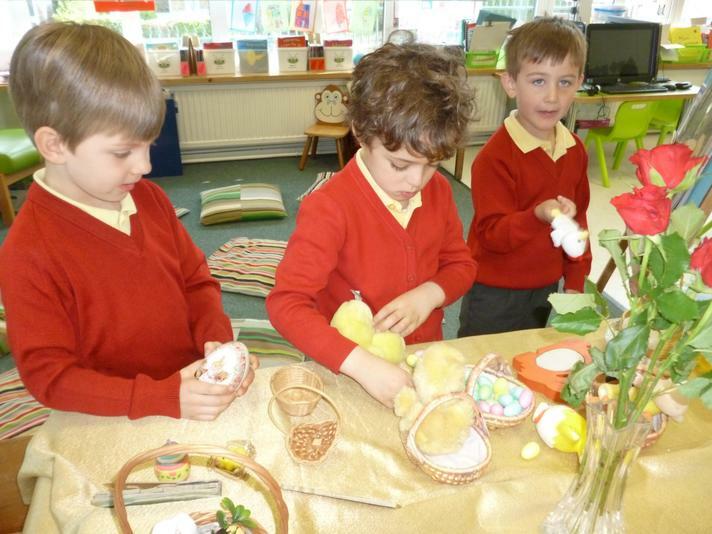 Our topic this half term is ‘In the garden’. 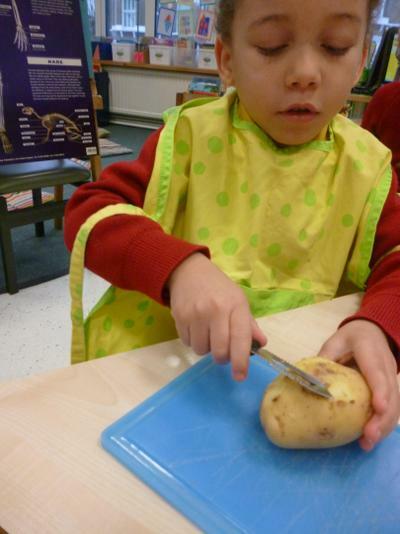 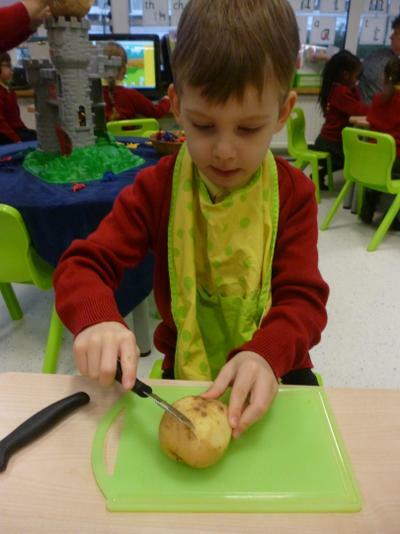 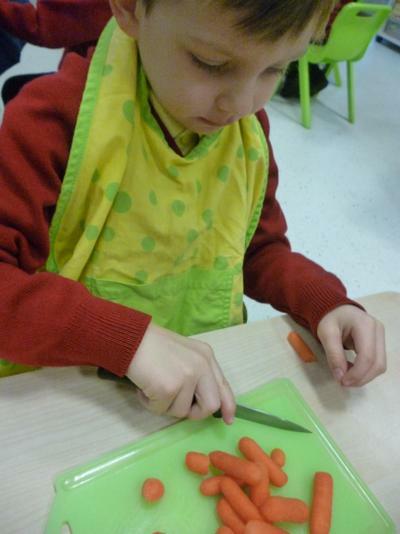 We will planting our very own vegetables, including carrots, radishes, peas and potatoes. 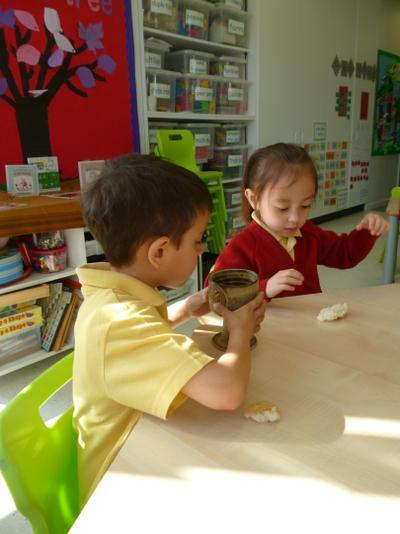 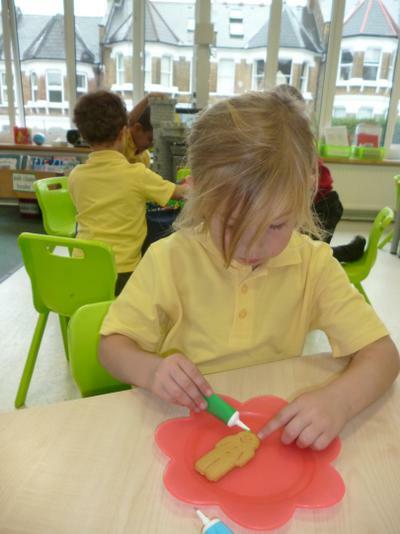 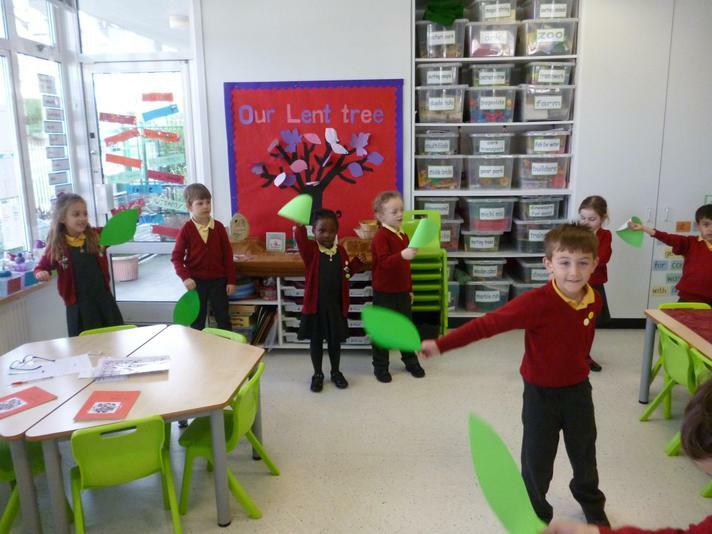 We will be learning plants grow and will be naming the main parts of a plant. 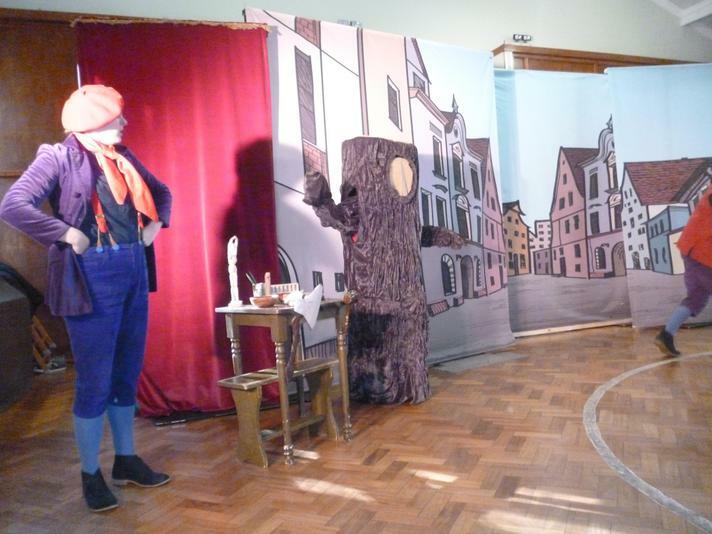 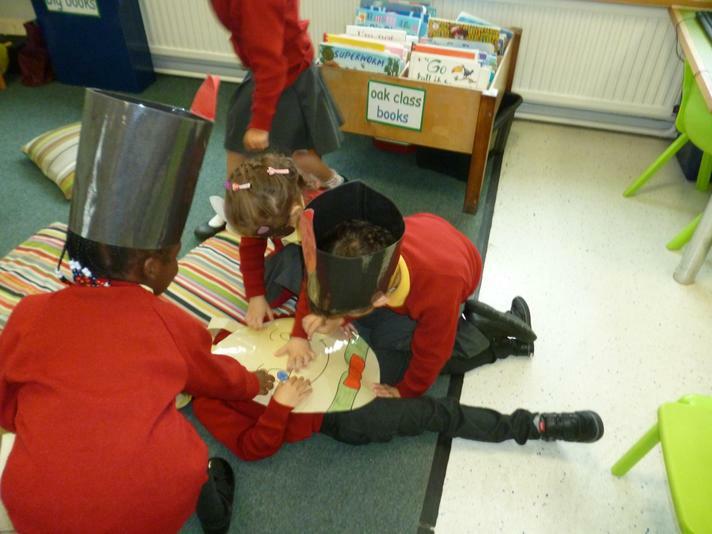 This half term in literacy, we will be activities around our big books, which are : 'Who's in the Shed?' 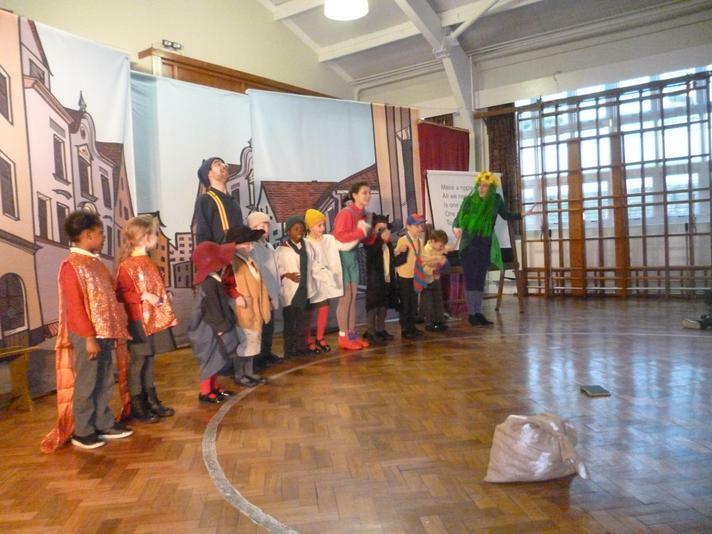 'To Town' and 'Dan the Flying Man'. 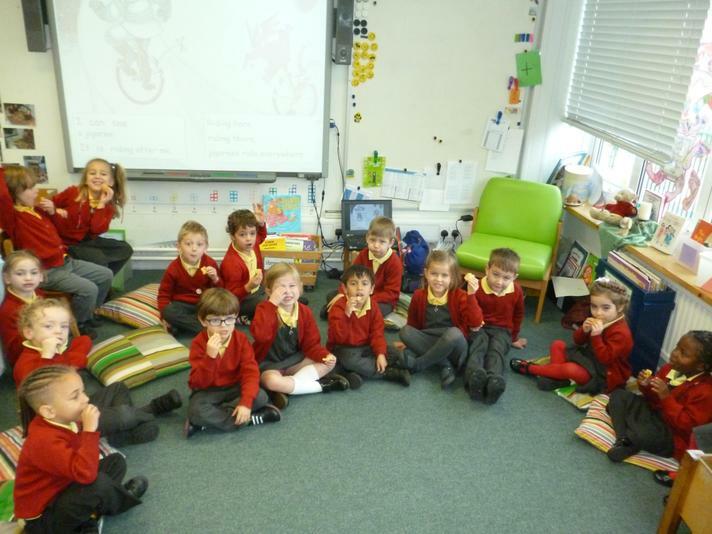 We will read our big book will focus the text, as well as strategies we can use to words. 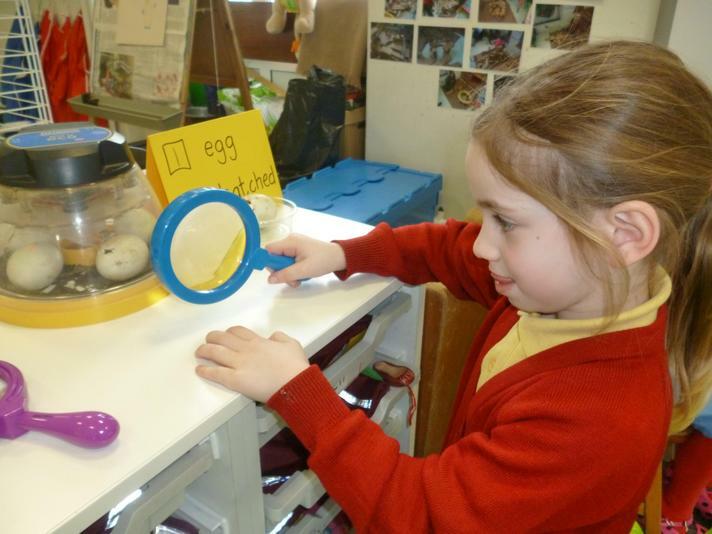 The reading strategies we have been focusing on are looking at the pictures to give us clues, using our out words eg rain, looking for smaller words within longer words eg falling and breaking down longer words into smaller chunks eg fun-fair for funfair. 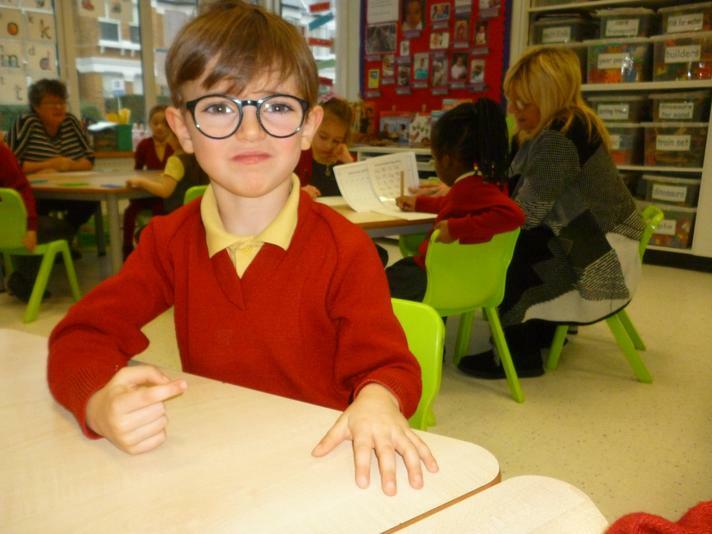 We also have been working on learning more sight when reading and have discussed how we do not sound these out. 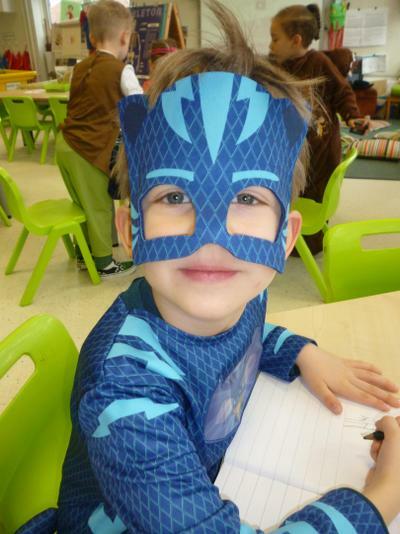 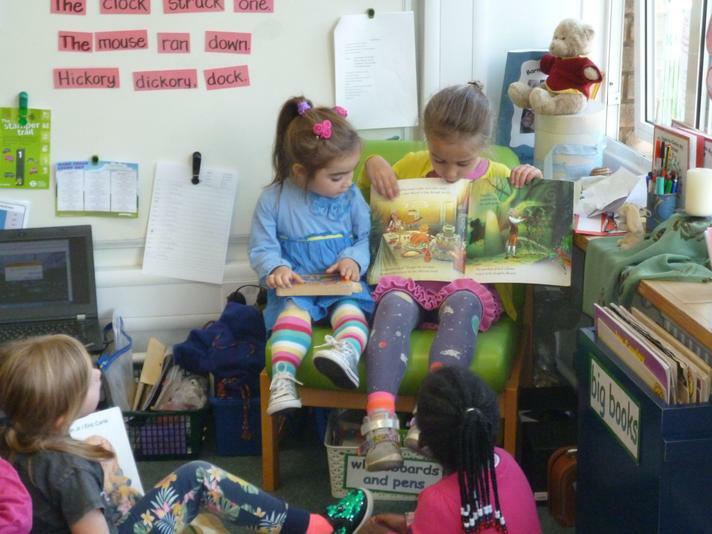 We encourage children of these reading strategies, as this balance facilitates them to read more complex text as well as improving their fluency. 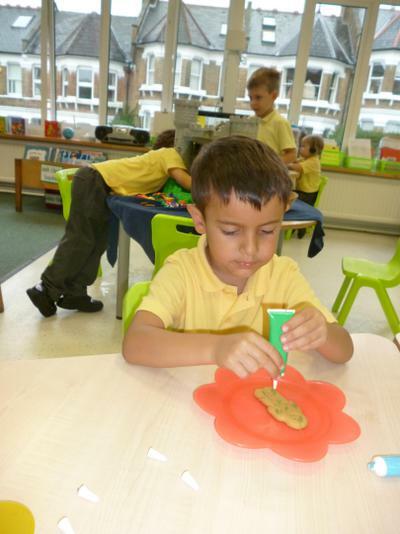 We will also be reading lots of information books and stories about plants and gardening. 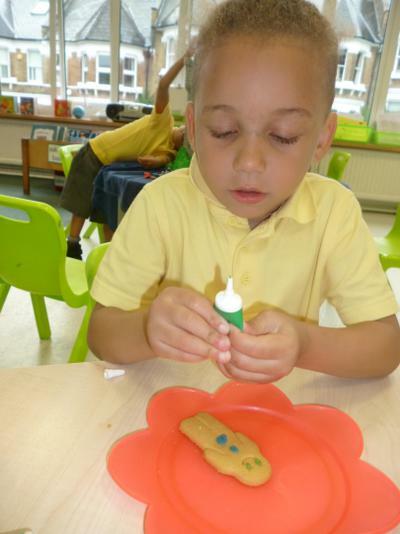 We will continue doing guided sessions twice a week. 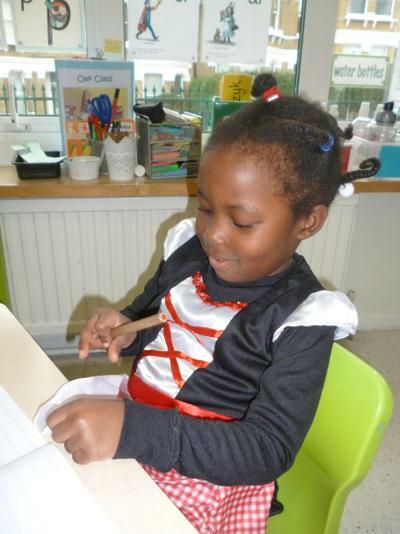 In guided sessions are group reading sessions, where reading strategies modelled to the children, and individual sessions are an opportunity for children to independently apply the reading skills we teach them in guided sessions. 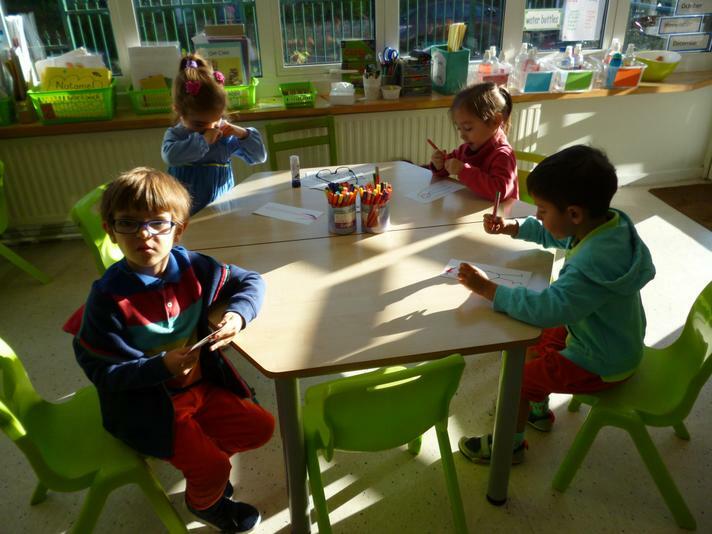 We are also emphasising the importance of reading for meaning with the children, and we are working on developing our comprehension skills. 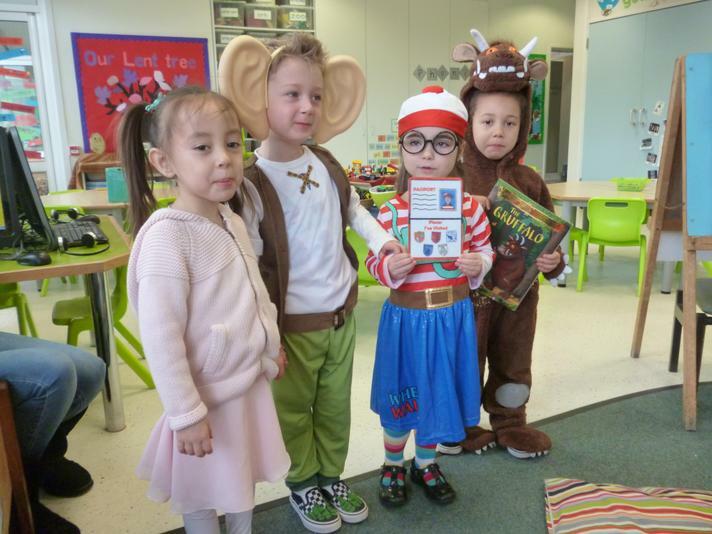 Please continue to support your child at home by reading with them daily, and helping them to learn their words on their bookmark. 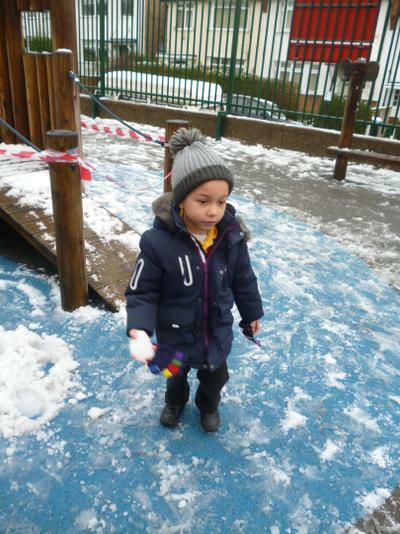 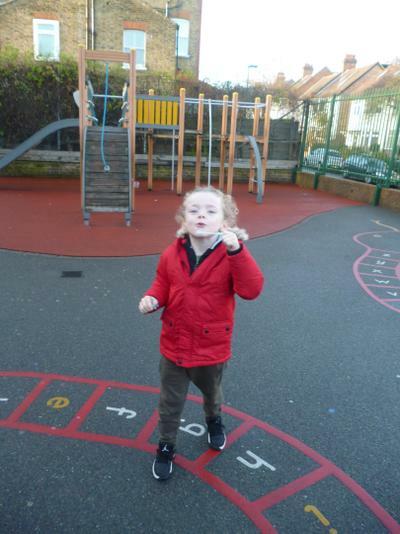 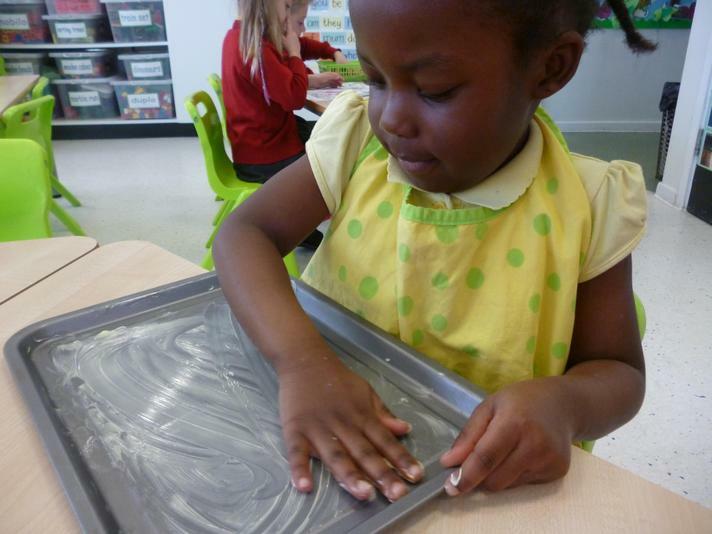 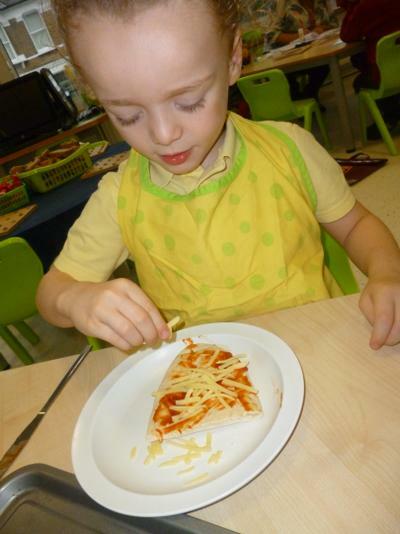 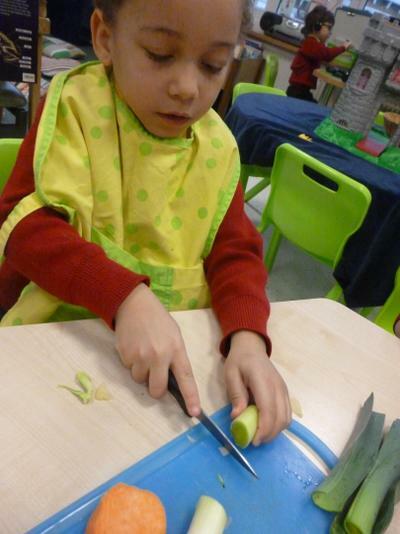 We are now nearly at the end of Letters and Sounds Phase 3, and will commence Phase 4 very soon. 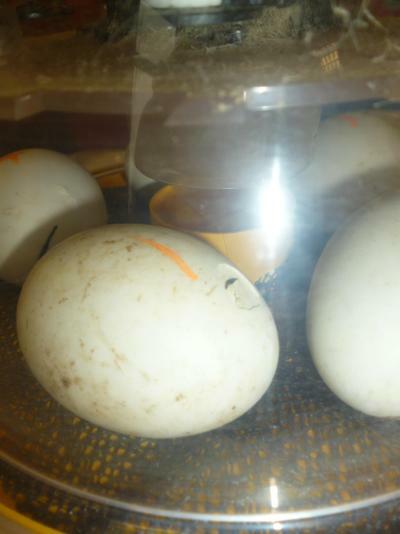 Phase 4 does not introduce any new sounds, but the sounds we have learnt so far, in the form of longer and more complex words. 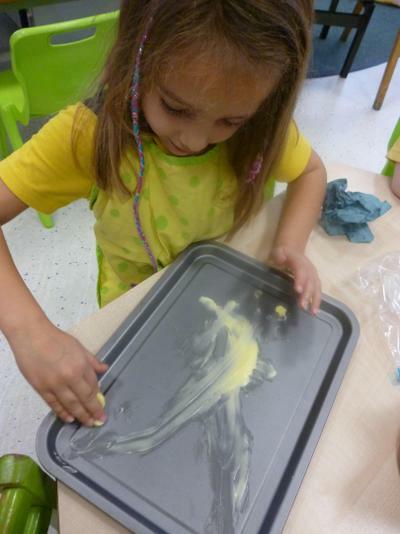 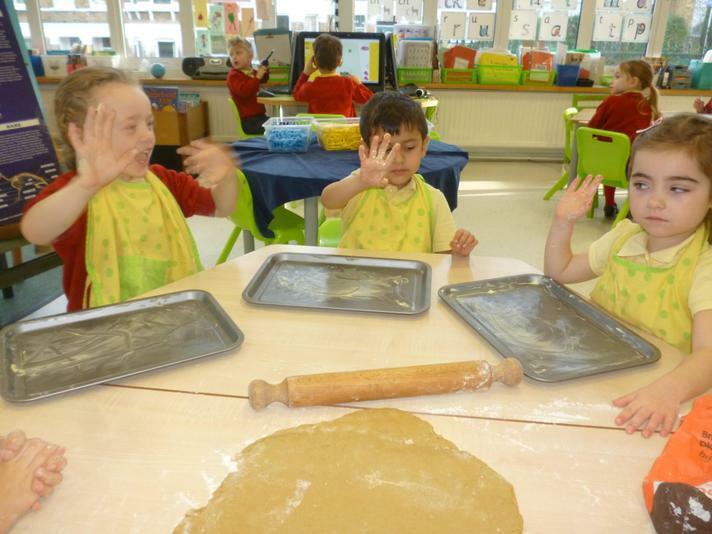 We will have fun Phase 4 activities every day. 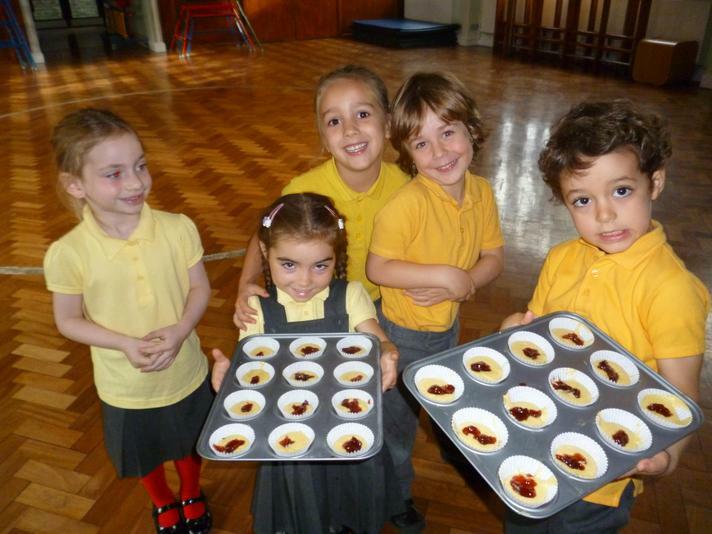 If you would like some you may do at home, please find a link at the bottom of the page. 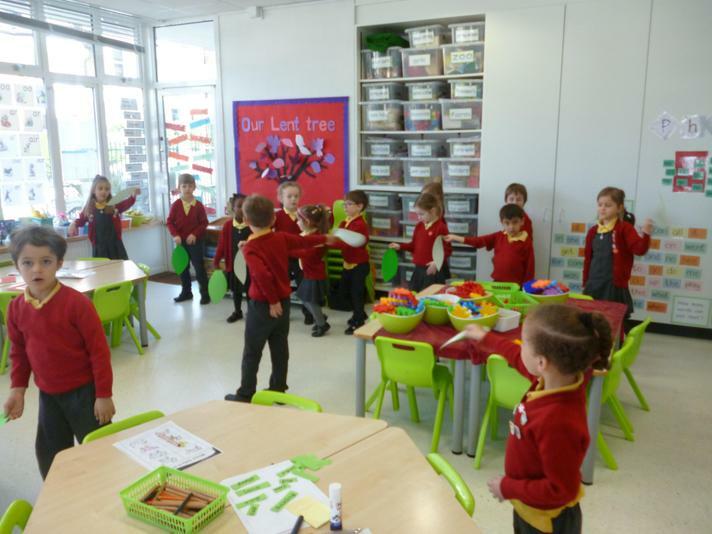 We will continue to practise our Phase 2 and 3 sounds, and also segmenting and blending our words to help us with our reading and writing. 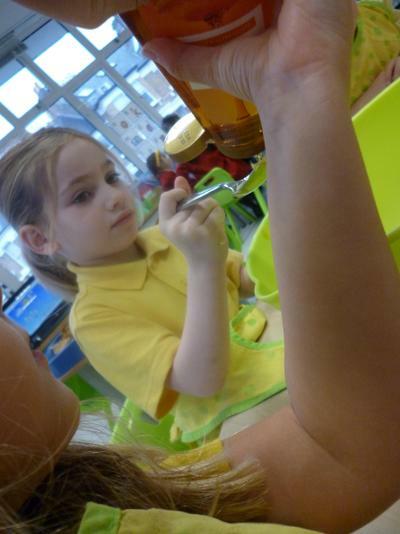 Please encourage and support your child to use their phonics when reading and writing at home, in order to consolidate what they have learnt at school. 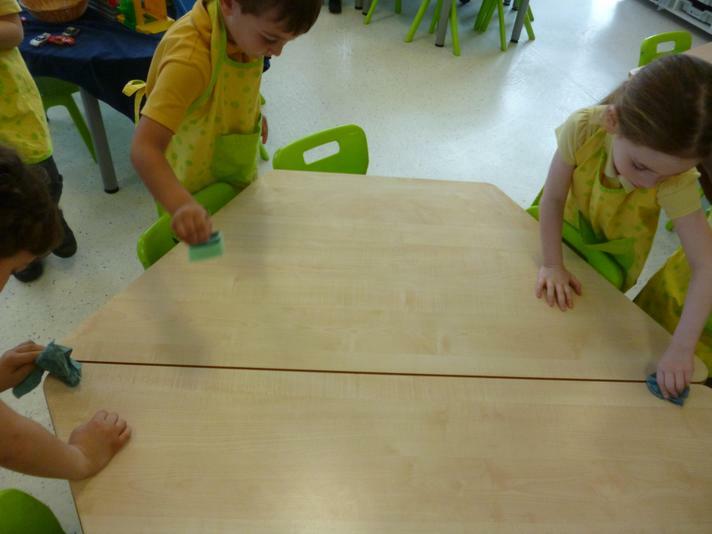 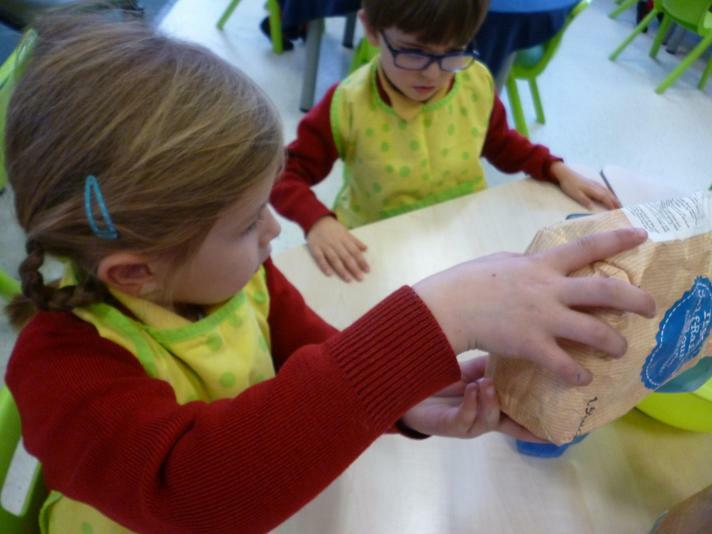 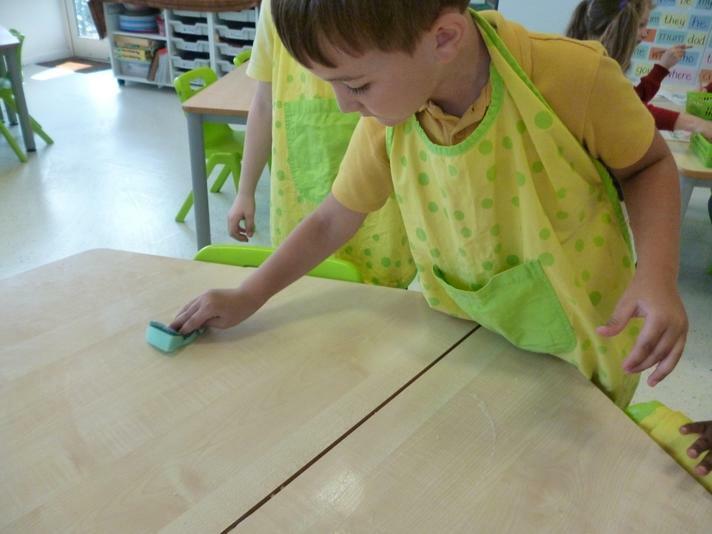 The sounds we have learnt are on our windows. 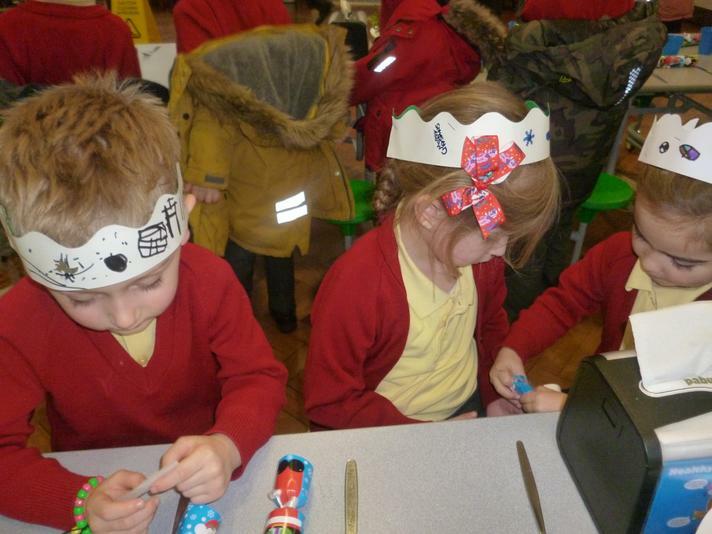 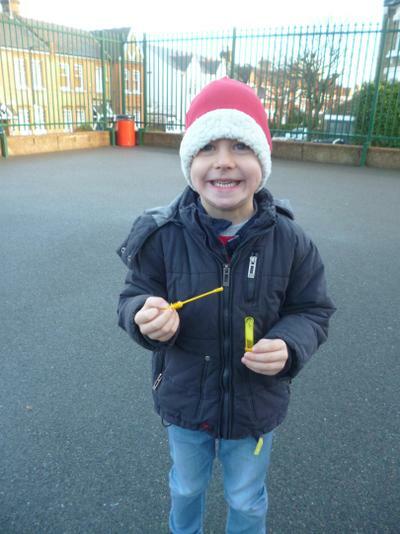 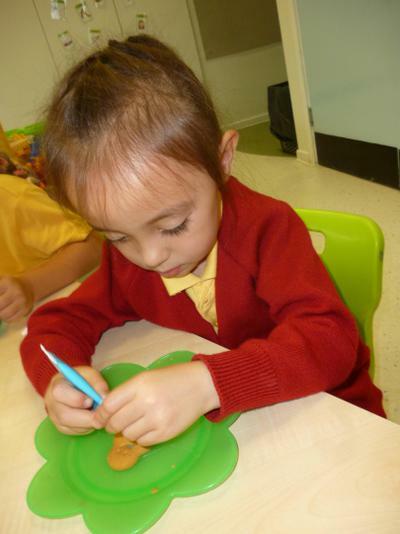 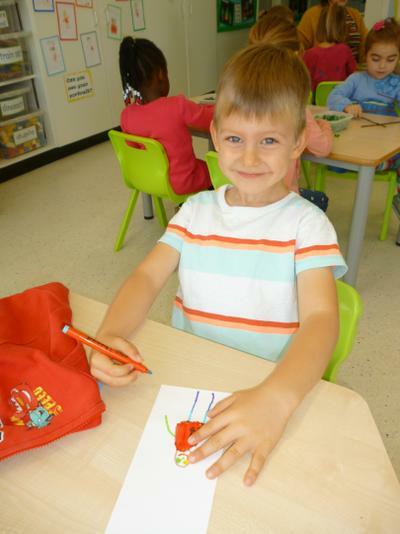 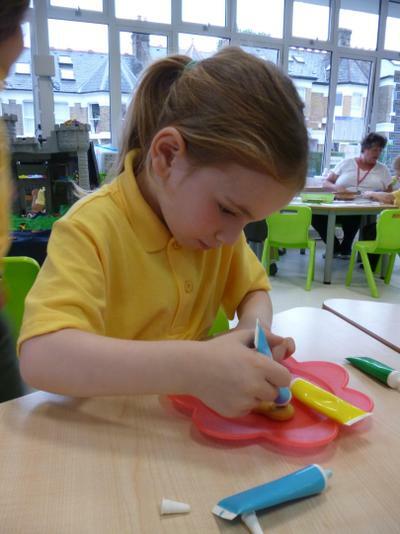 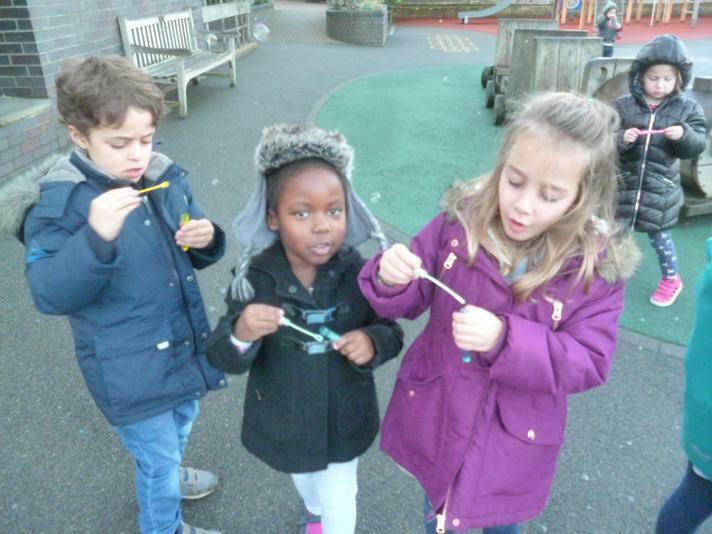 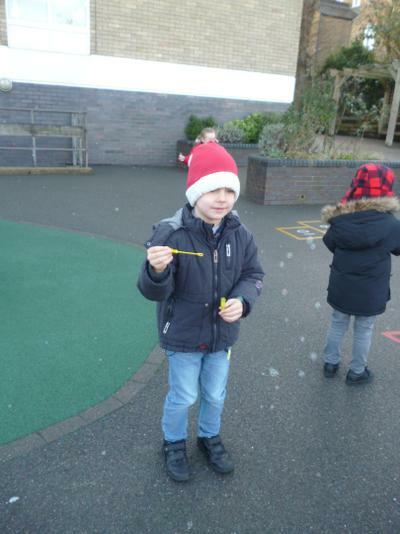 The children have lots of opportunities to write and draw. 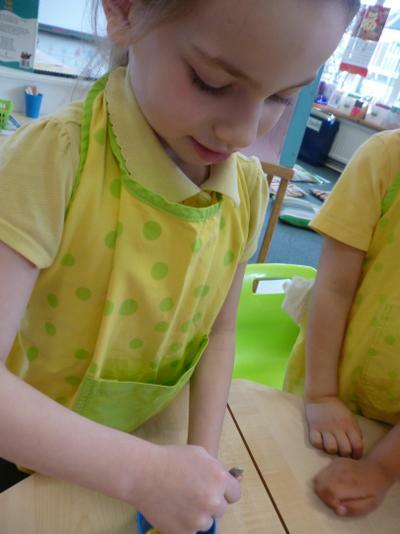 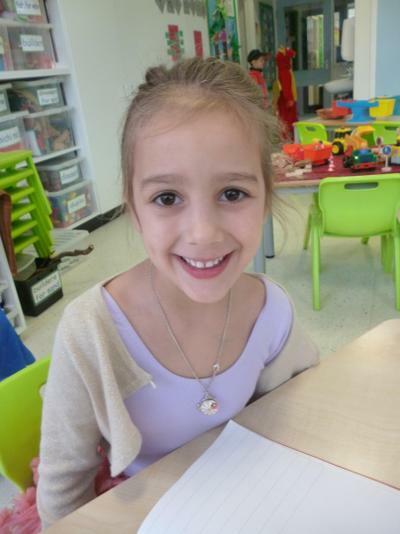 We encourage children to form their letters correctly when writing. 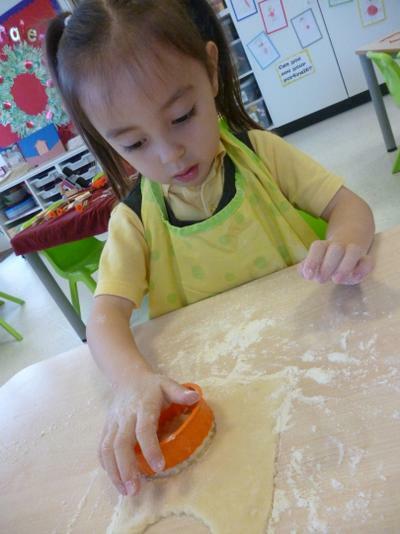 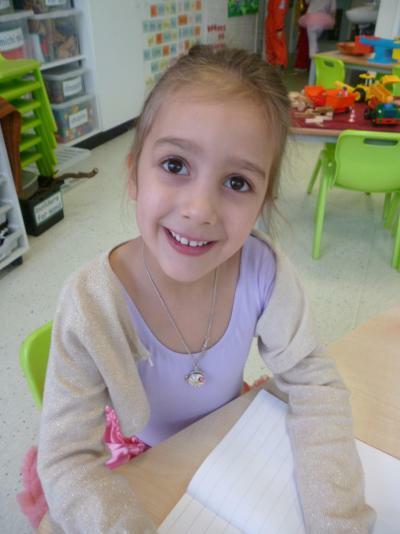 Please continue to support children in forming their letters correctly at home, according to the school's handwriting policy, lots of people have good handwriting but letter formation is incorrect. 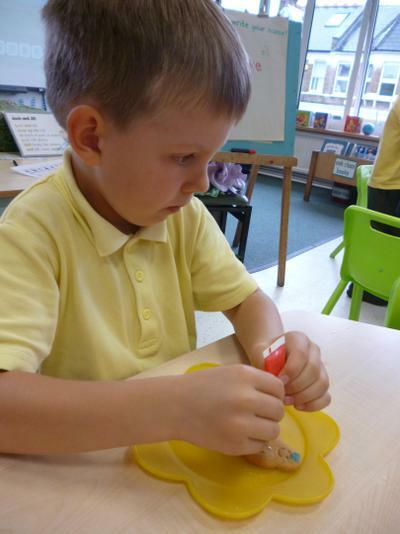 We are working on the correct use of capital letters, full stops and finger spaces, applying our phonics and knowledge of tricky words to help us when writing. 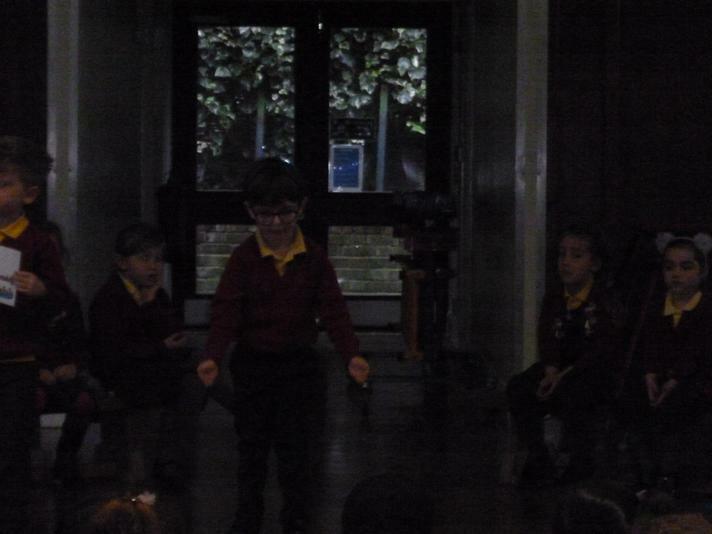 We are also working on using adjectives and n eg question marks, exclamation marks and eclipses, to make our writing more interesting with those who are ready. 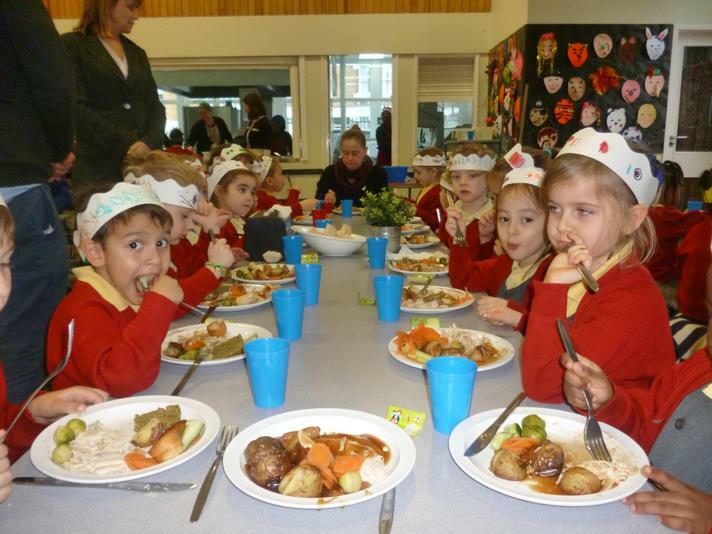 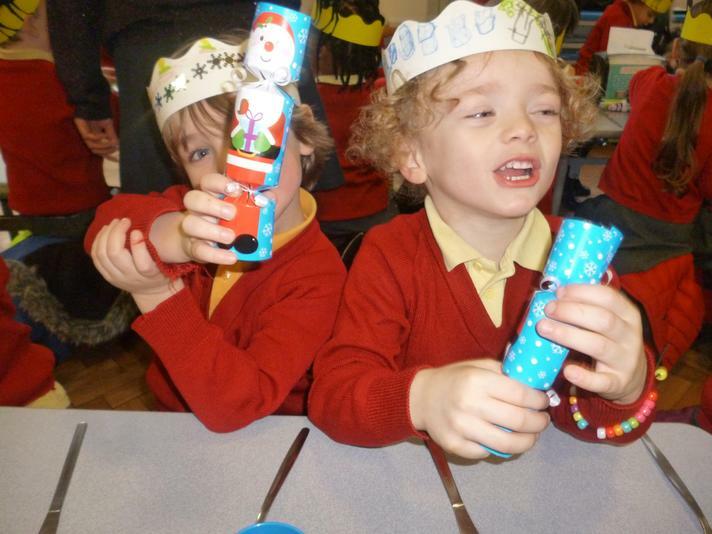 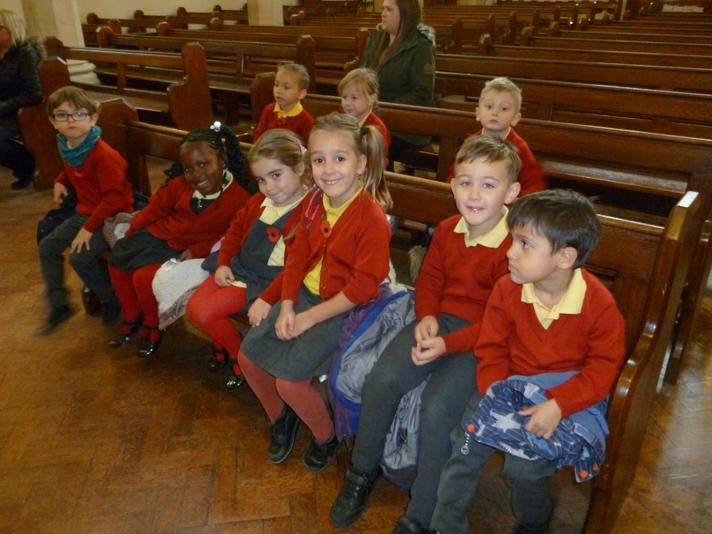 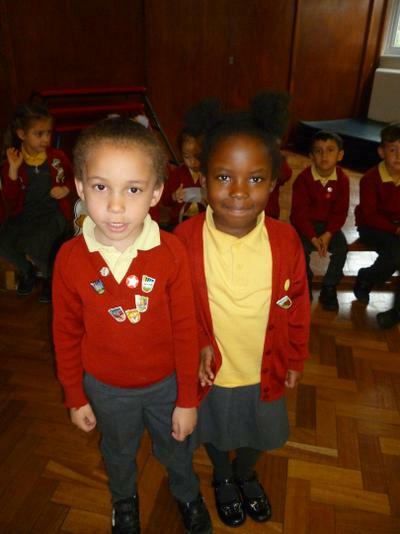 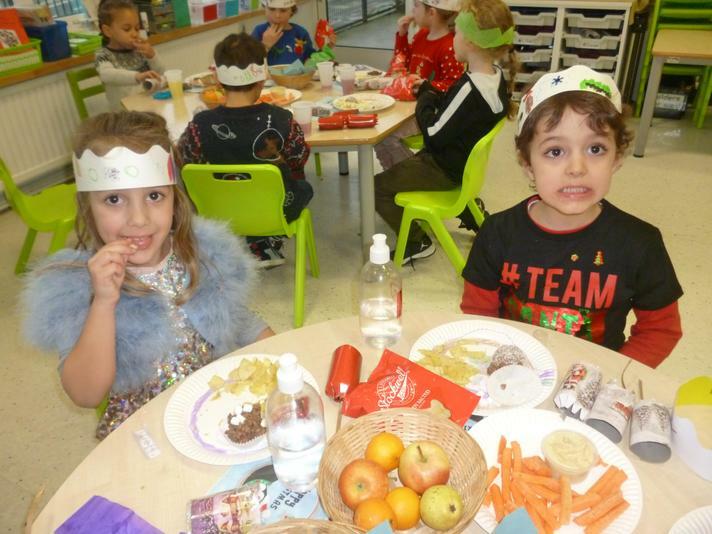 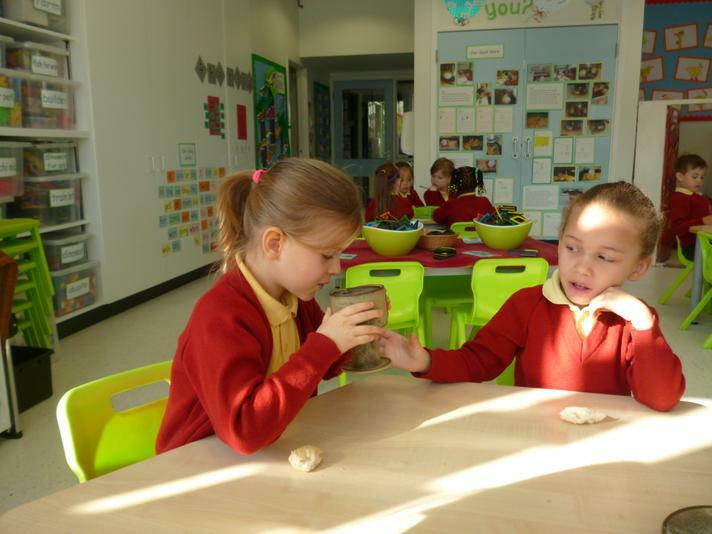 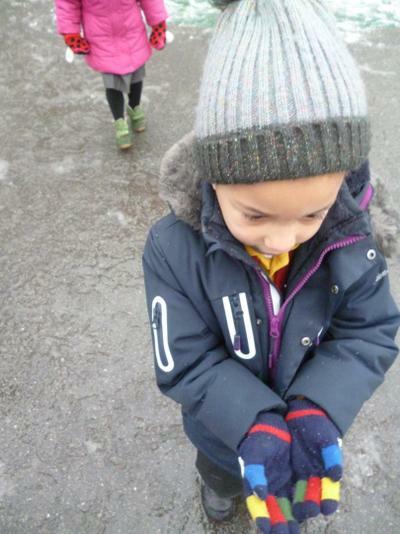 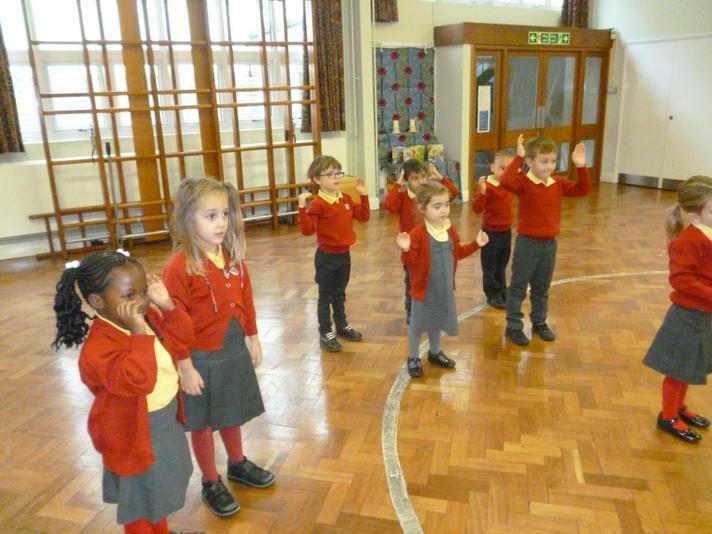 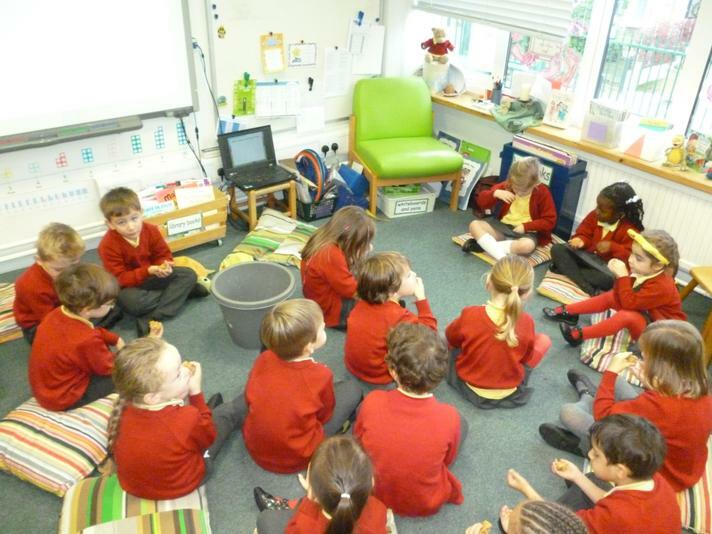 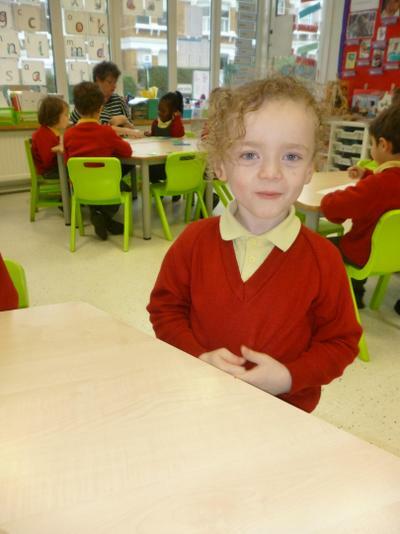 All the children will be encouraged to share their thoughts and ideas with their classmates. 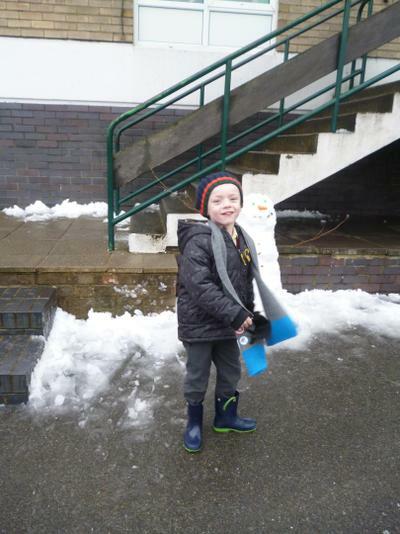 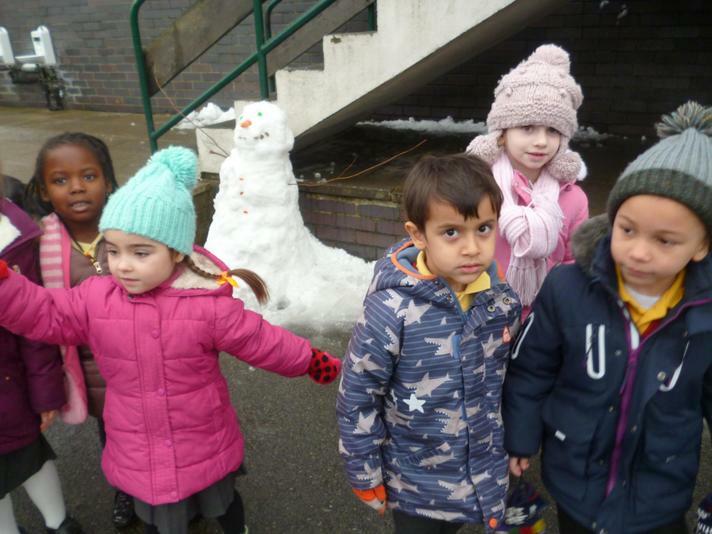 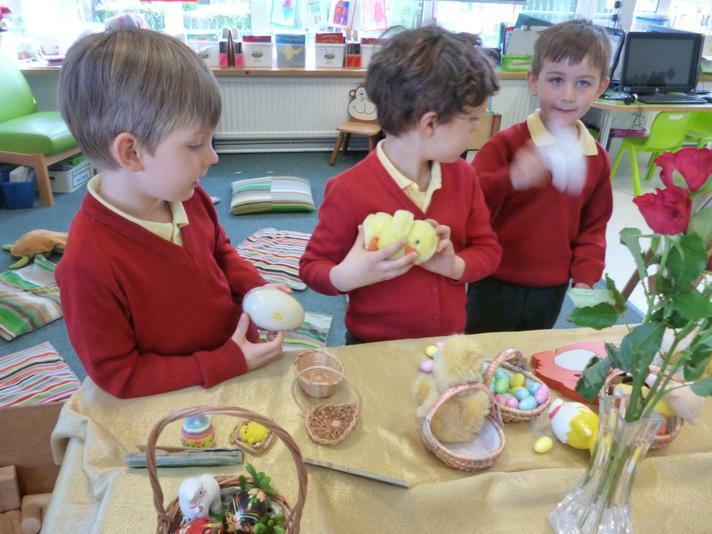 Children will be supported to speak in full sentences and use as much interesting Our talk topics for this half term are 'Differences', Signs of Spring','Our Garden' and 'Pentecost'. 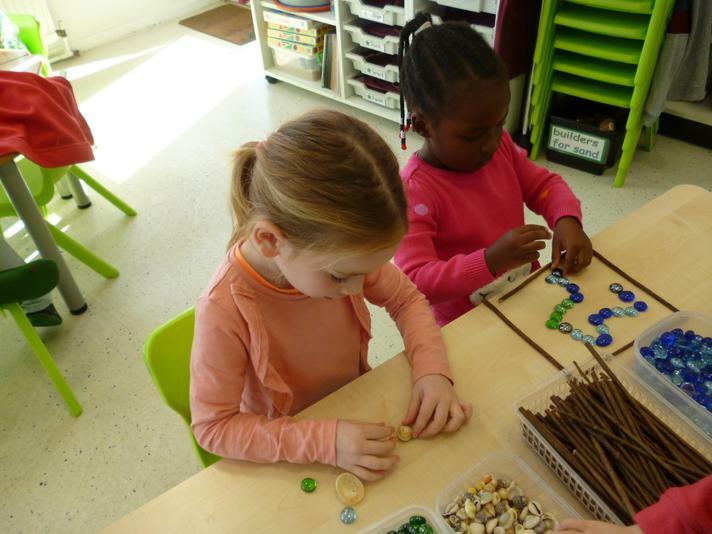 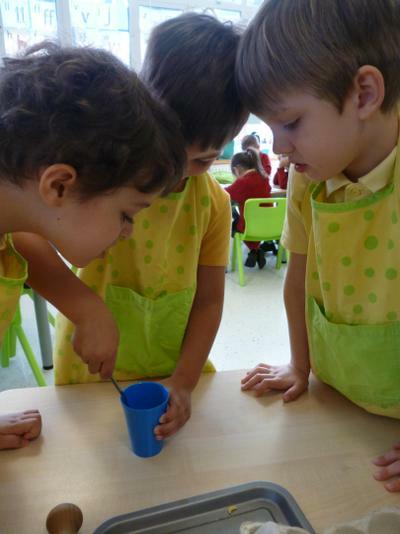 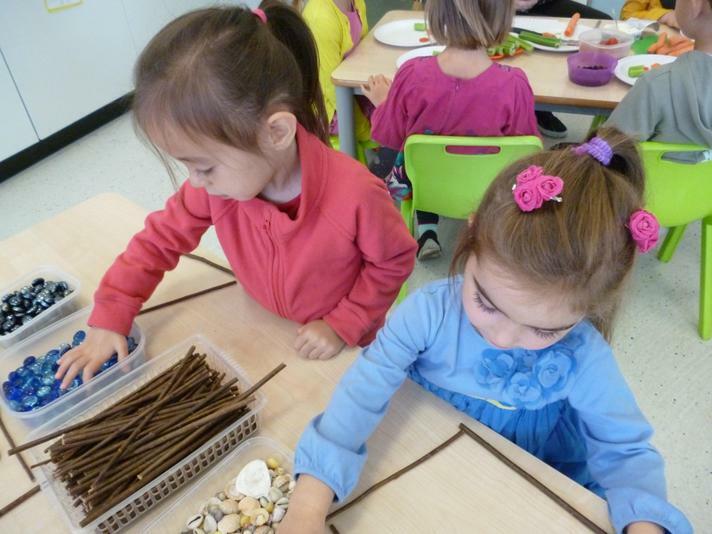 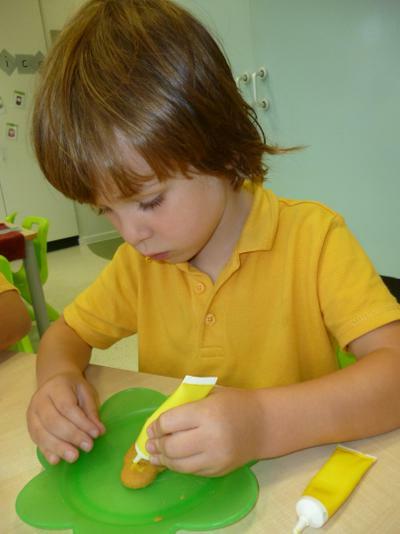 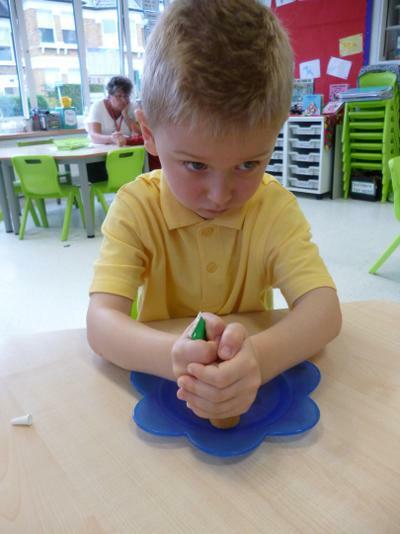 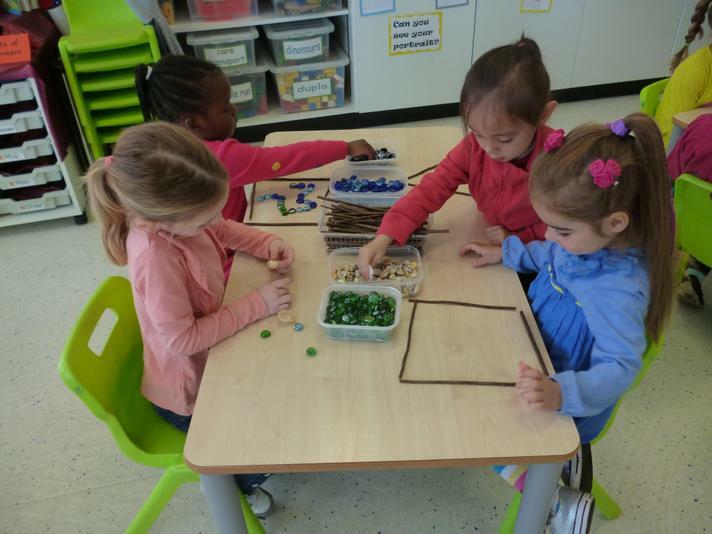 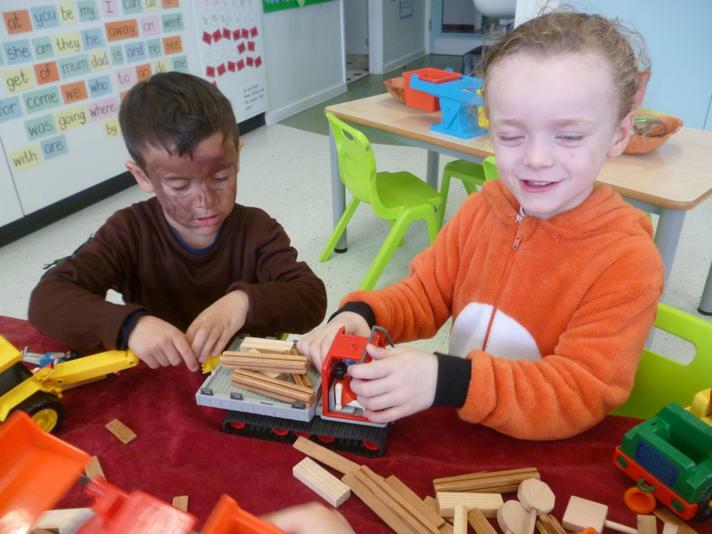 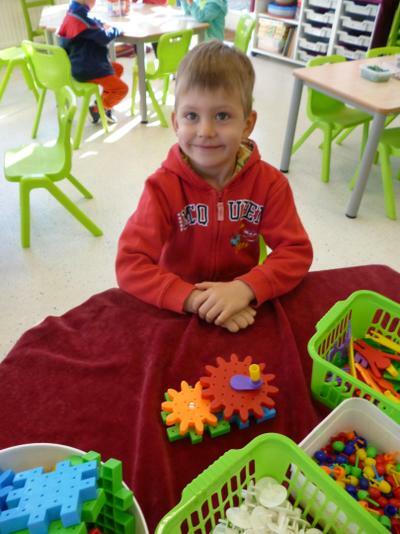 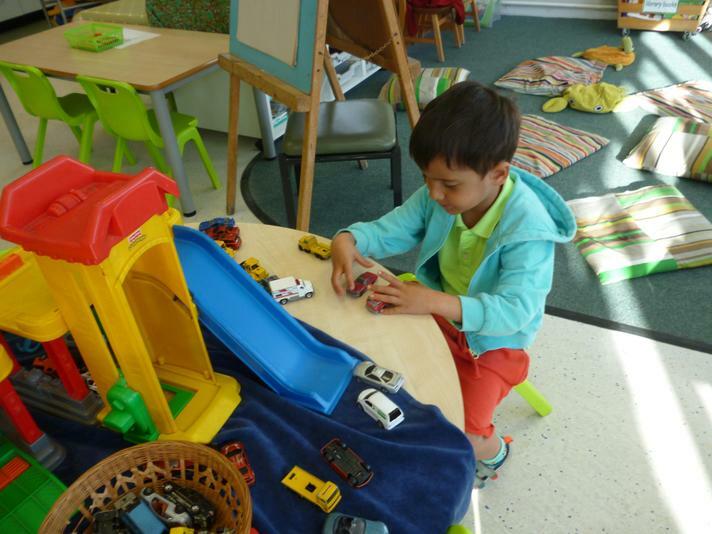 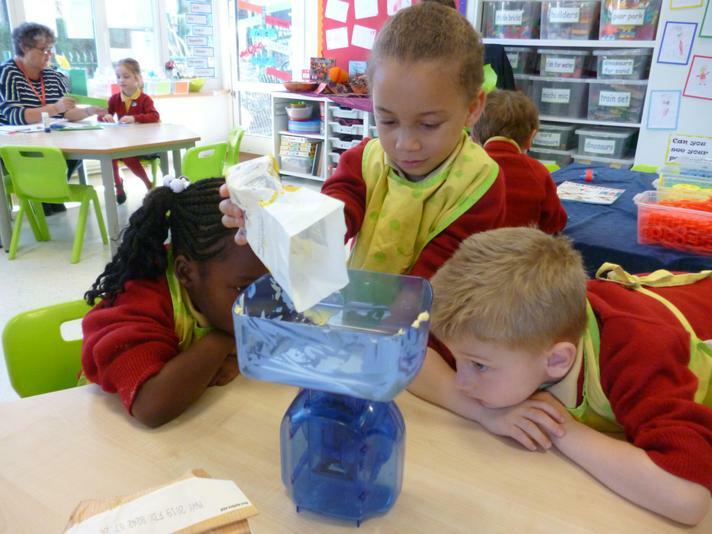 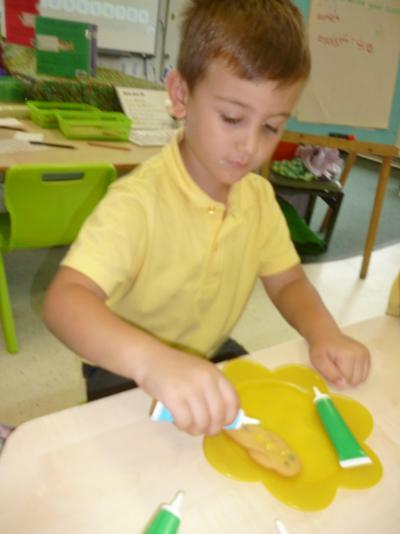 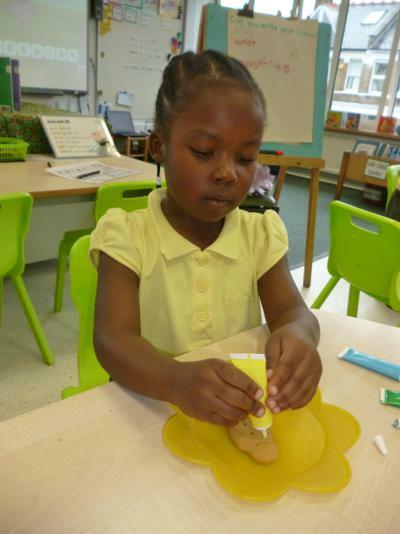 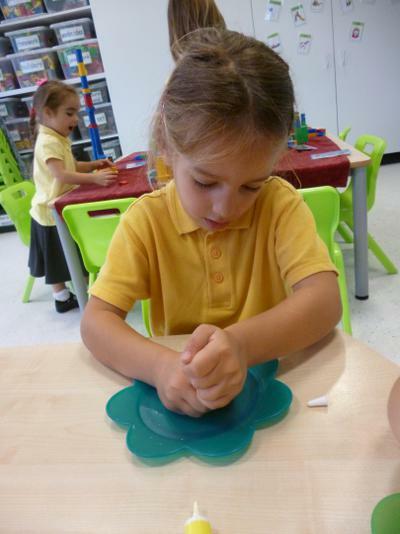 Every day we have problem solving, reasoning and numeracy activities. 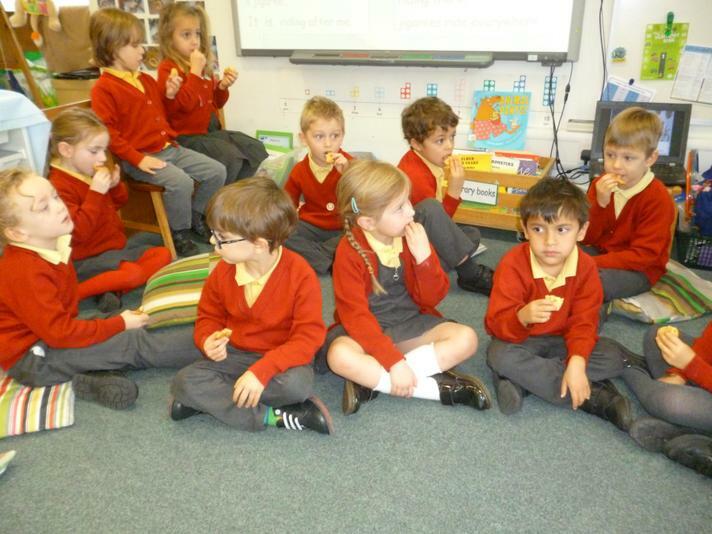 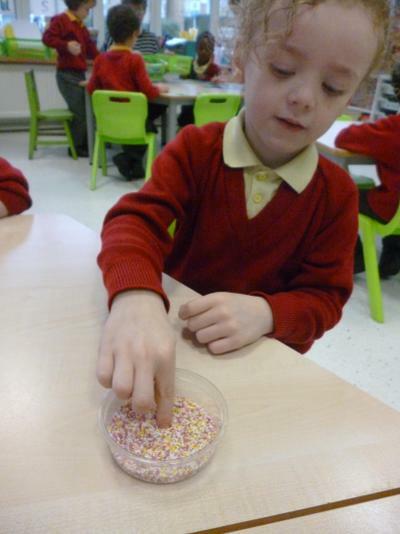 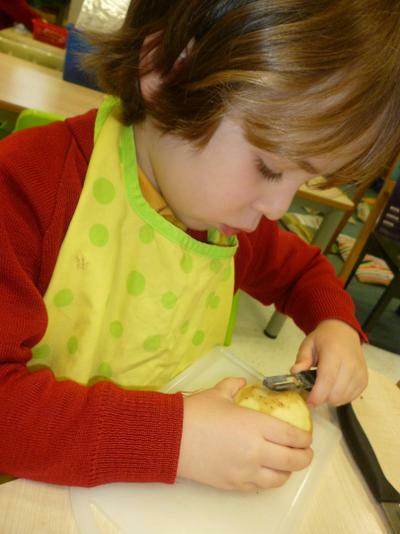 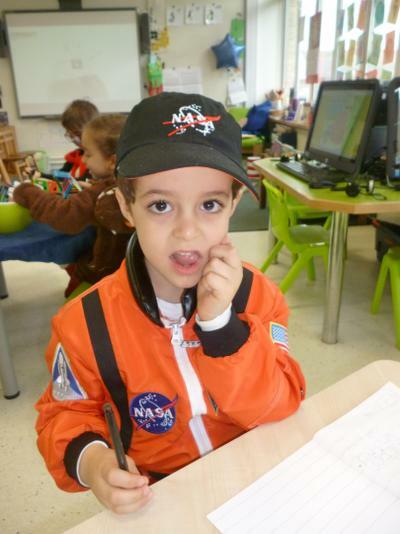 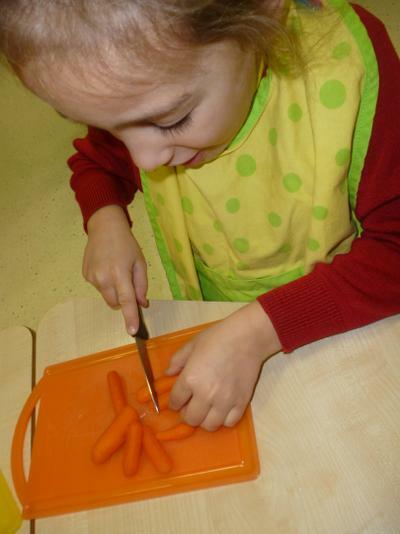 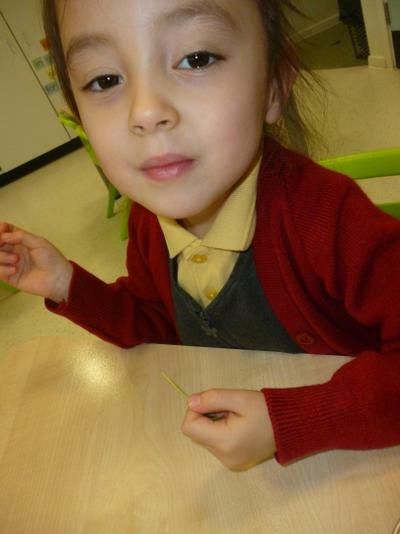 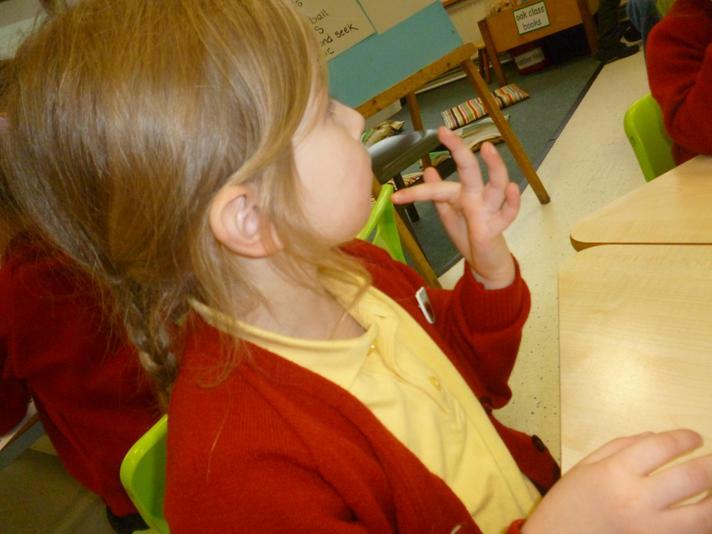 We are teaching the children to count, read and write numbers to 20 and beyond. 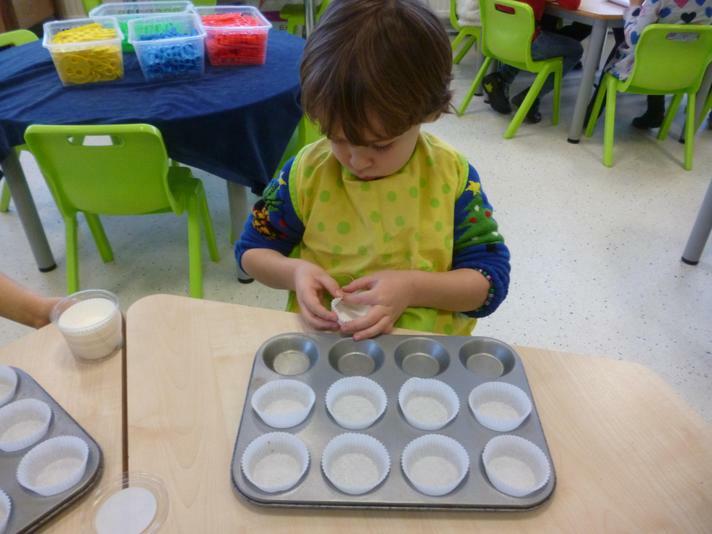 This includes counting backwards from 20! 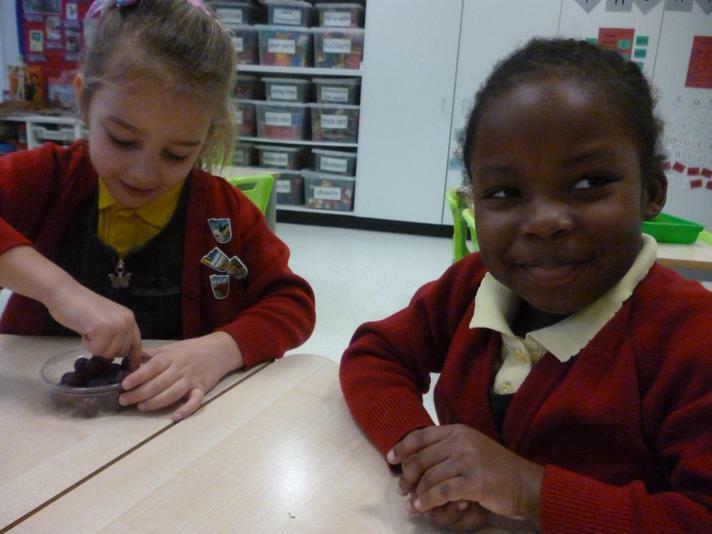 We are also learning to count in 2s, 5s and 10s. 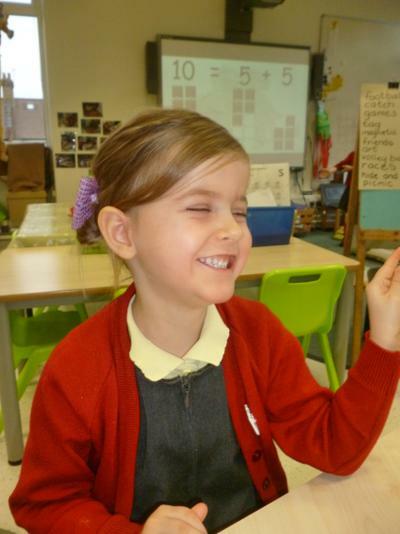 We are exploring mathematical , so children will be confident in identifying 1 more/less than a given number. 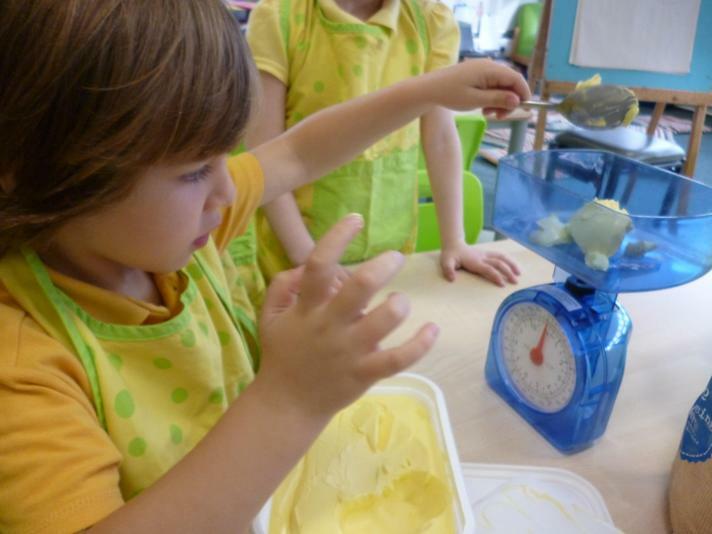 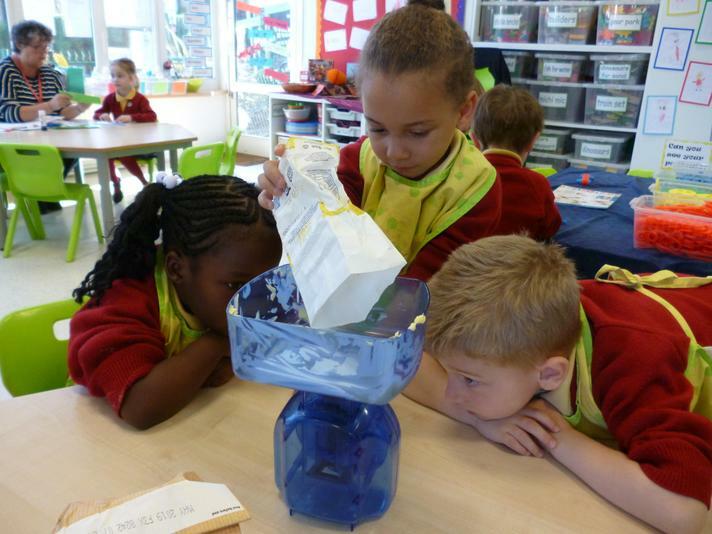 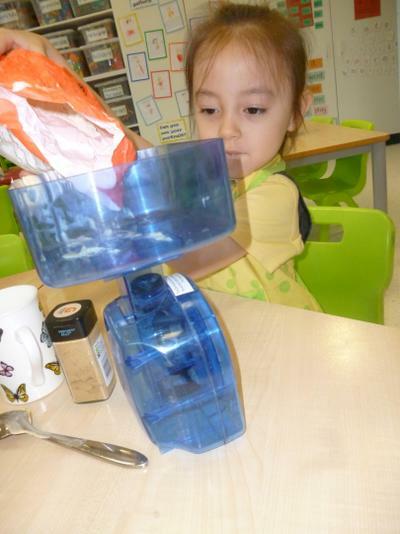 This half term we will be exploring practical activities linked to money, basic time (using o’clock), comparing weight, capacity and length. 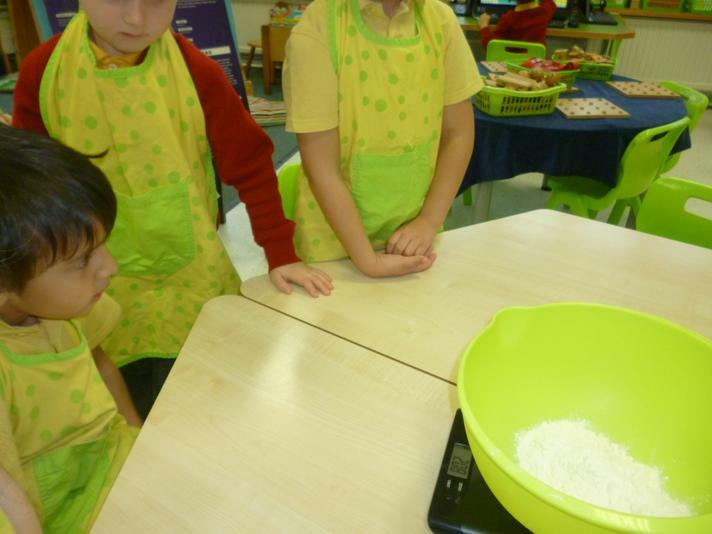 We will also be learning quantities, as well as basic sharing. 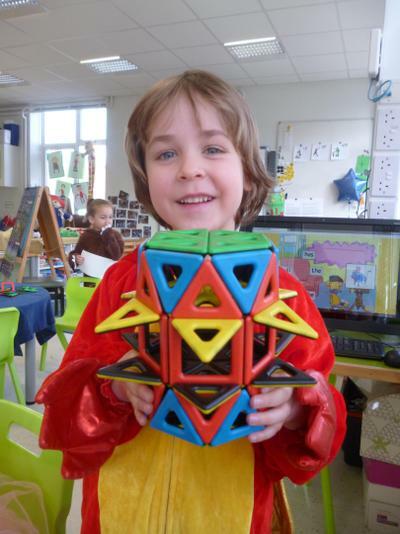 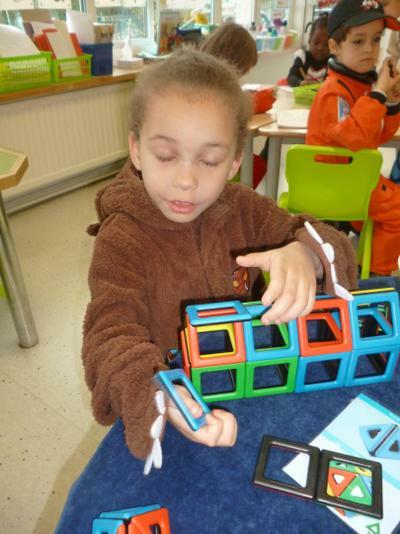 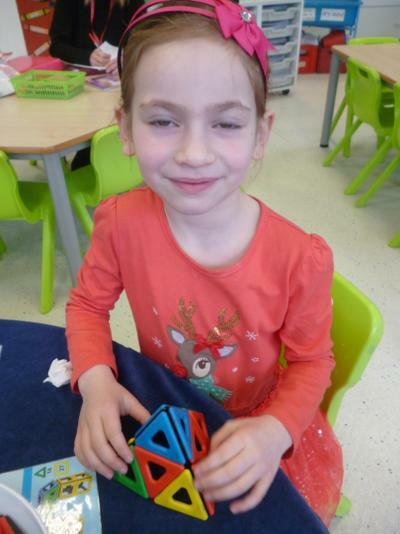 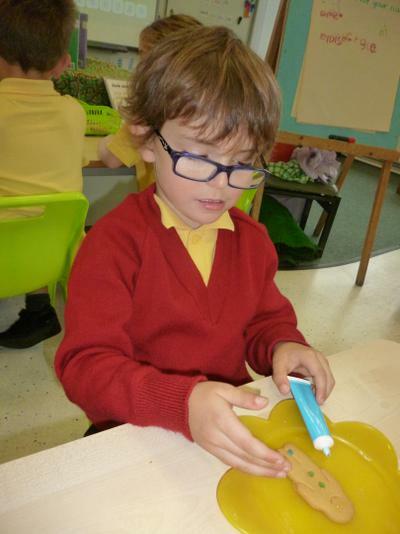 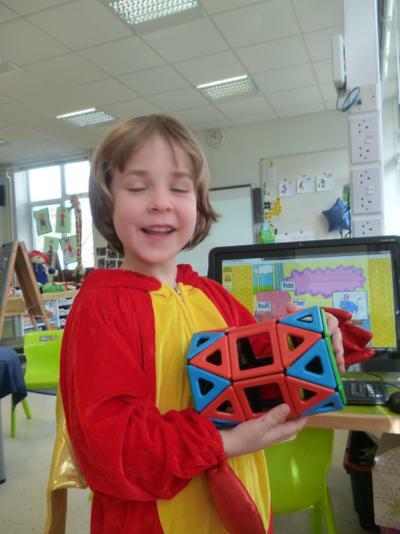 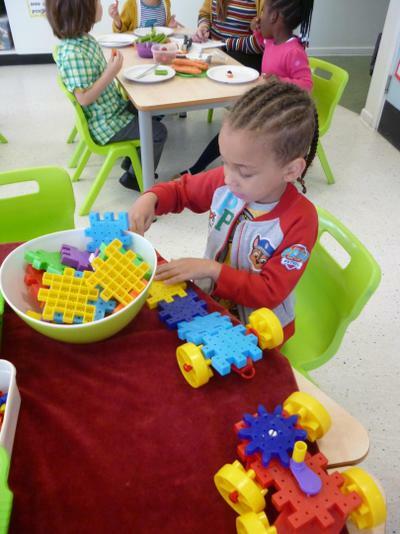 We will learn to add and take away using different mathematical methods and apparatus, including cubes, objects, Numicon and number lines. 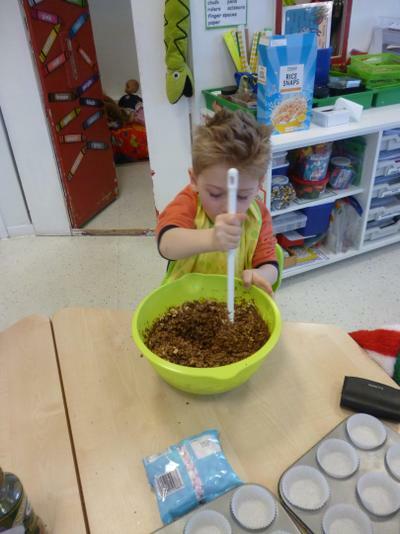 Please take any opportunityounting and basic practical adding and taking away. 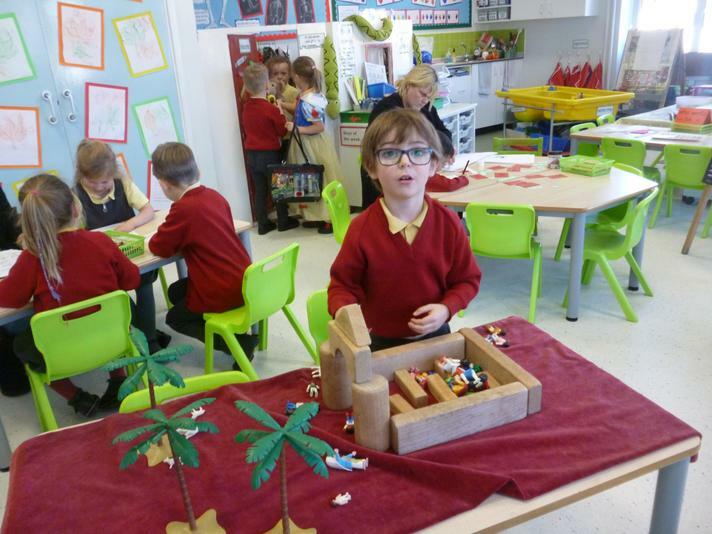 The children have lots of opportunities to use computing to support their literacy and numeracy skills as well as creative work. 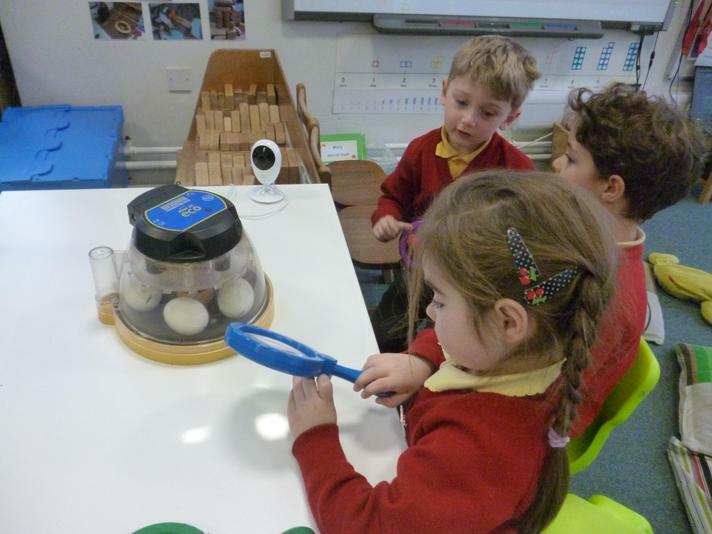 We will be using Easi- speak microphones to record also be learning simple programming, through devices such as our Beebot. 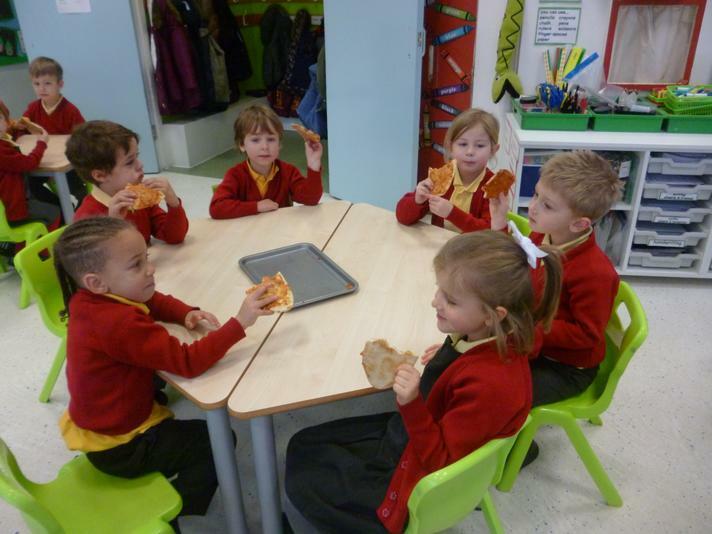 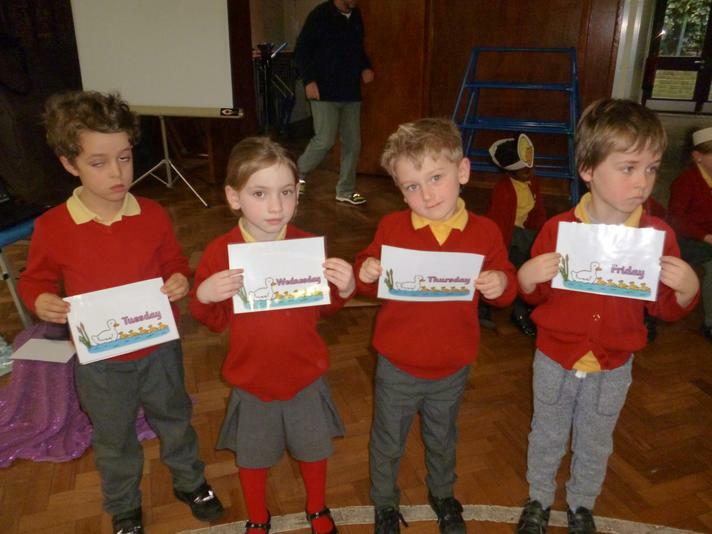 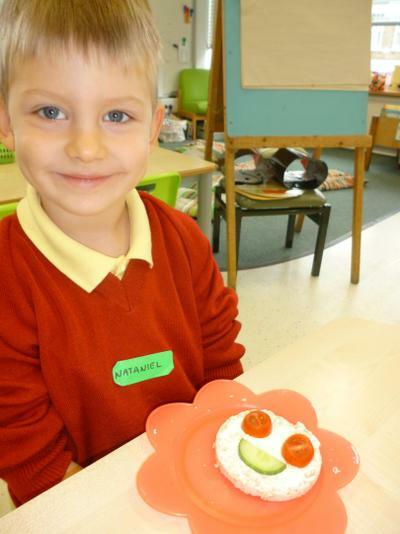 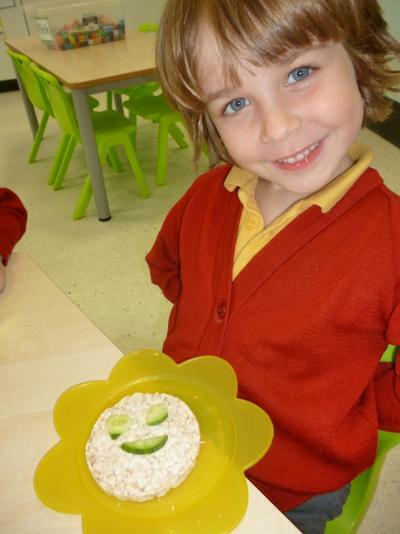 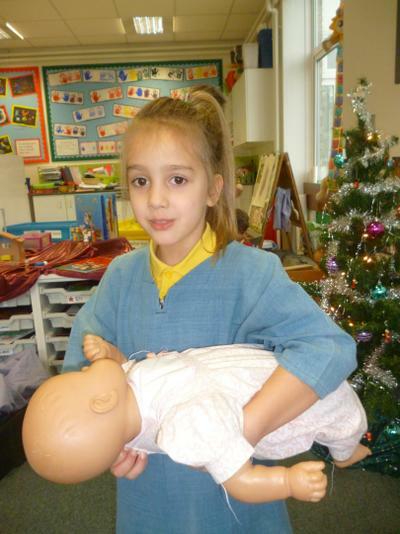 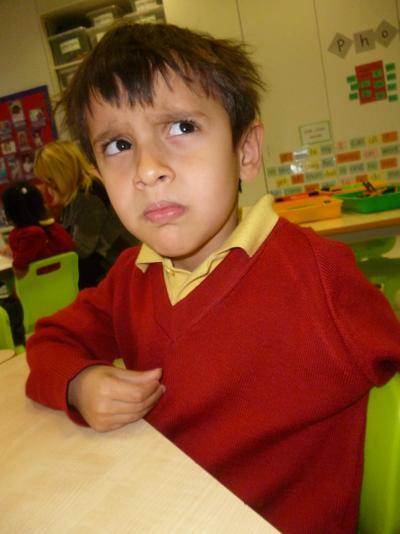 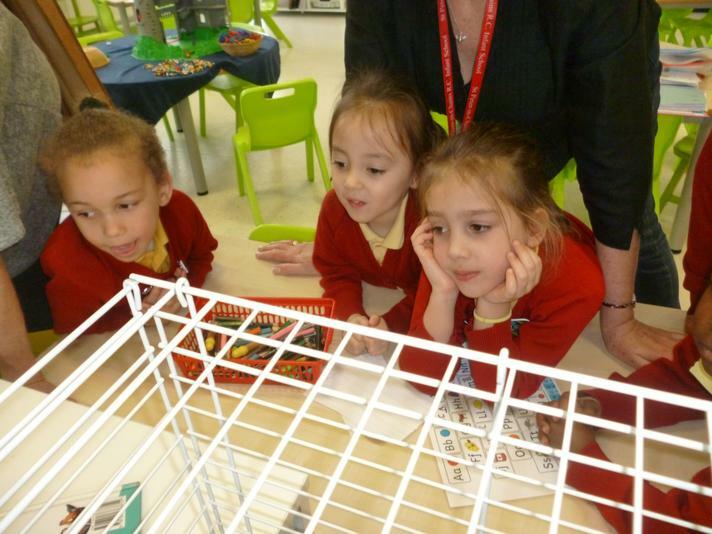 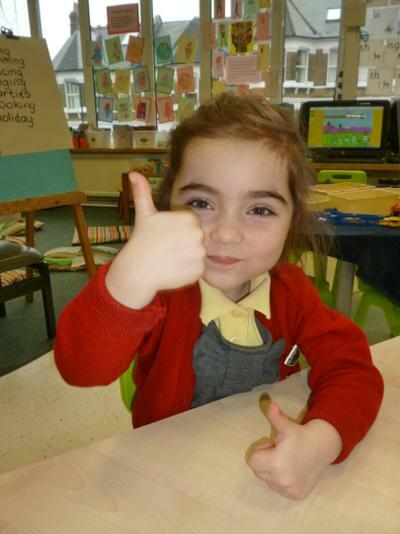 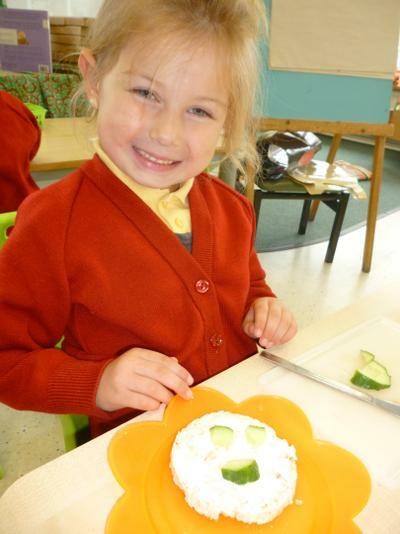 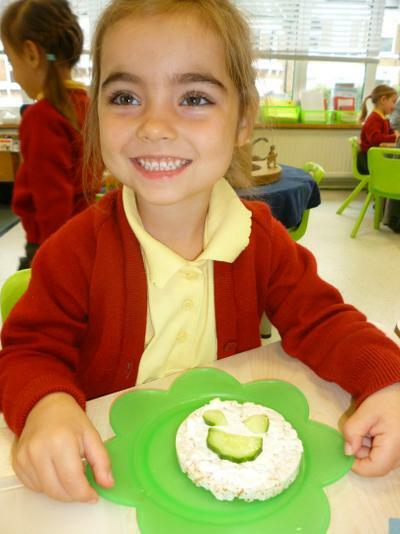 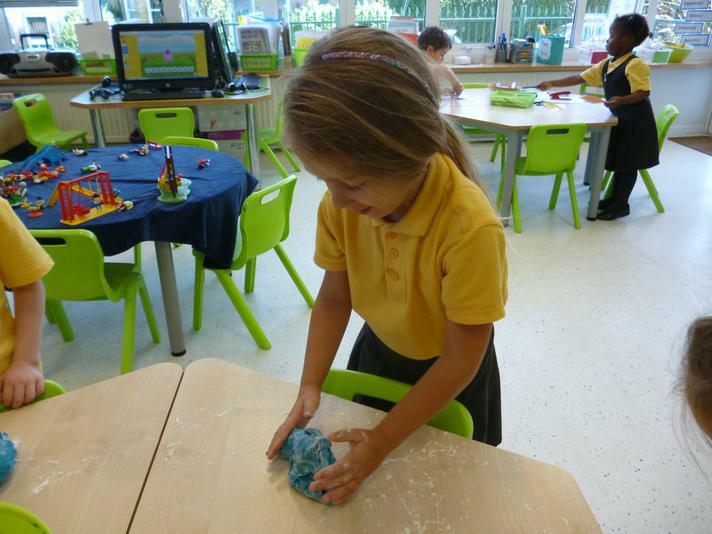 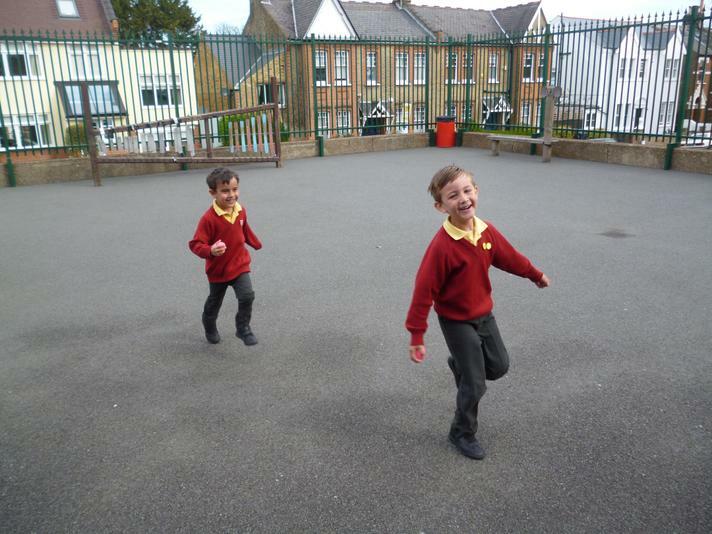 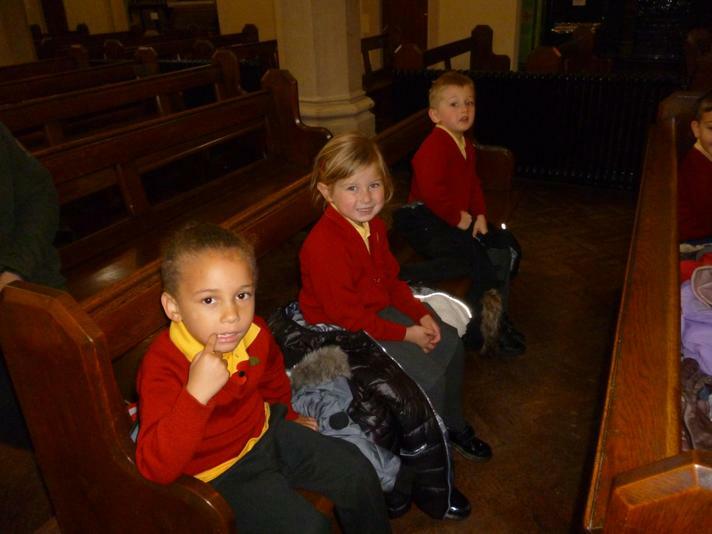 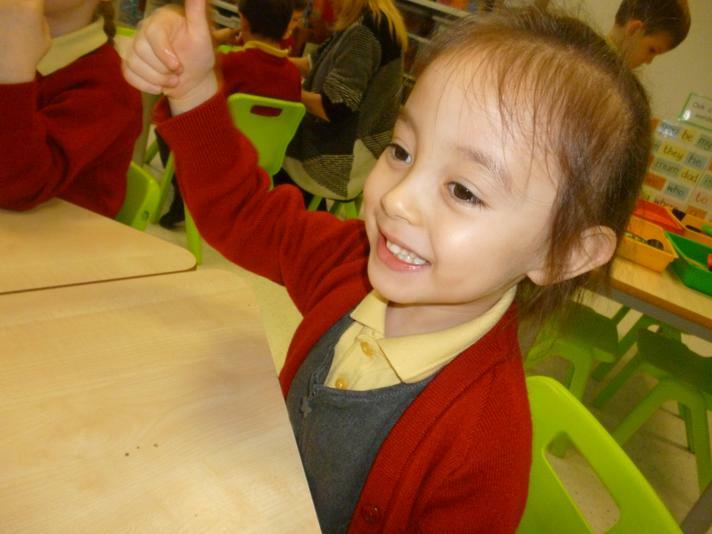 Children have also enjoyed learning from websites such as topmarks, phonicsplay and cbbc. 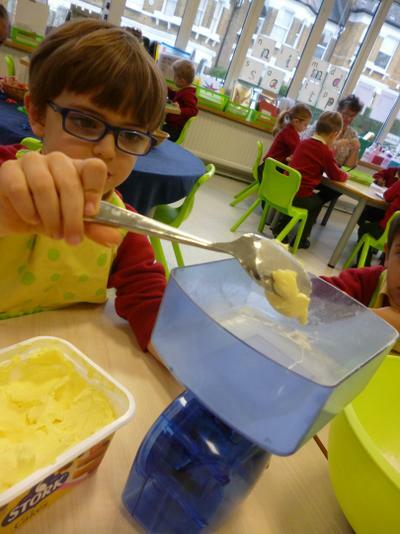 We try to cook once a week and would appreciate a weekly contribution of 50p to go towards the cost of ingredients in the world money box on the windowsill. 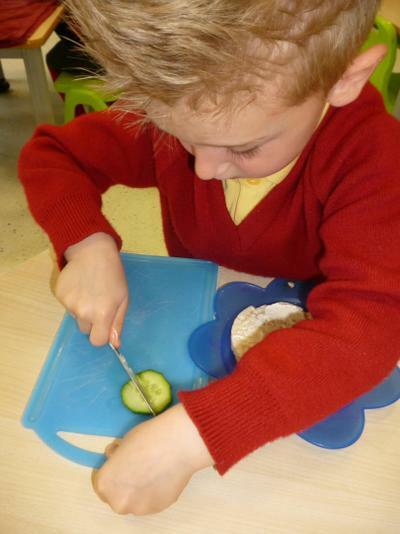 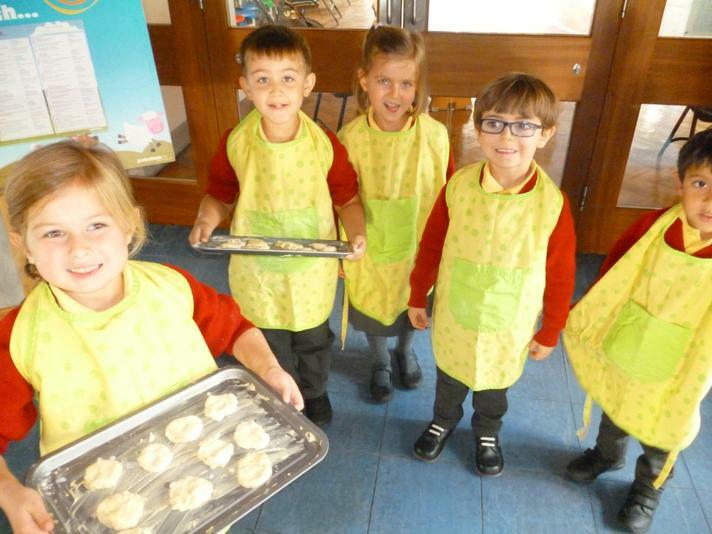 We have cooked lots of delicious treats, most of the recipes can be found at the bottom of this page. 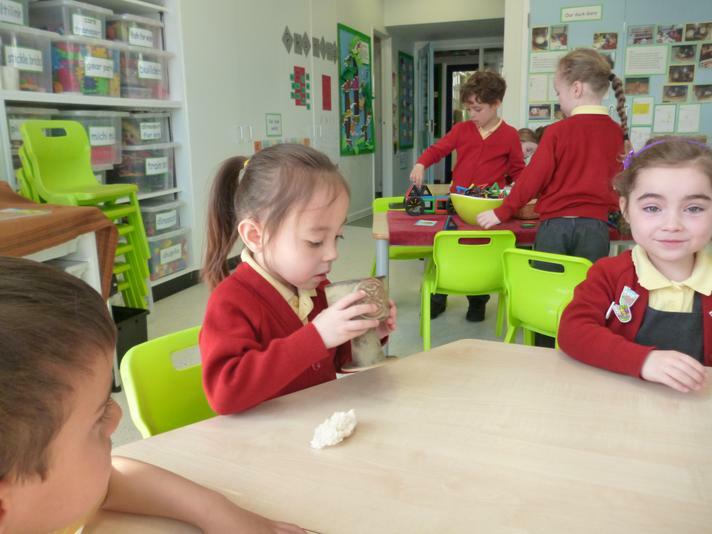 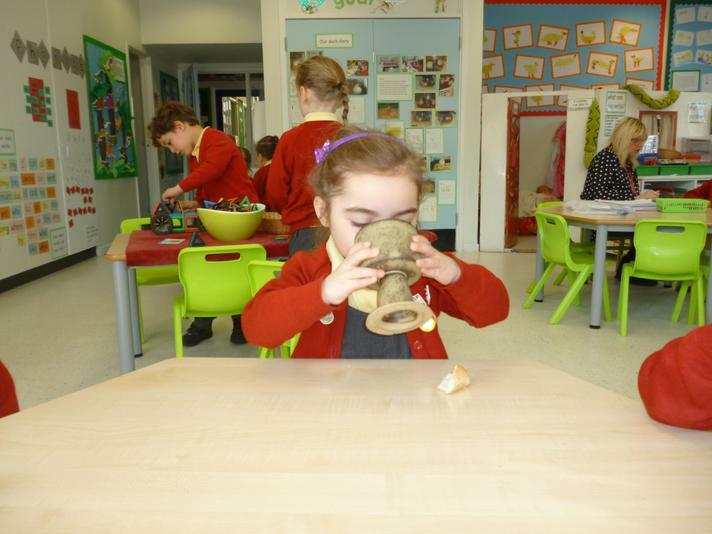 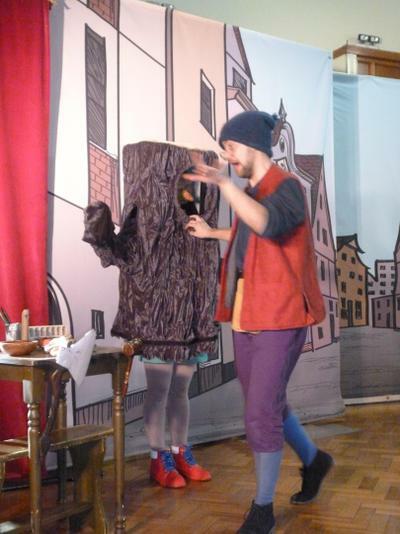 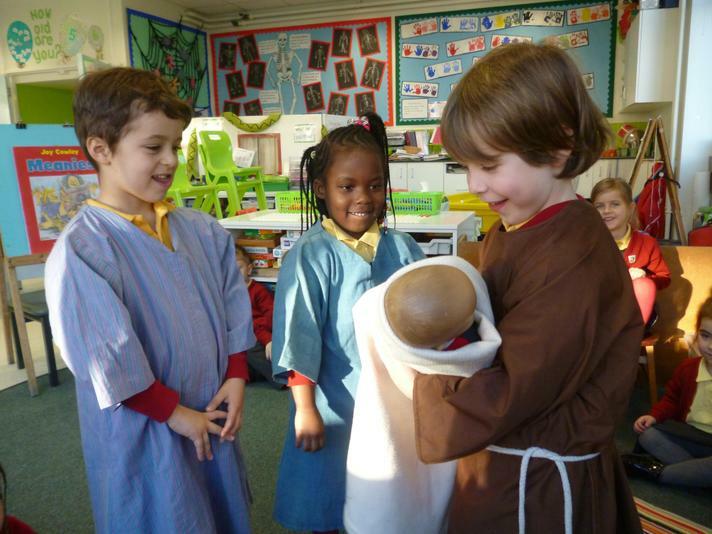 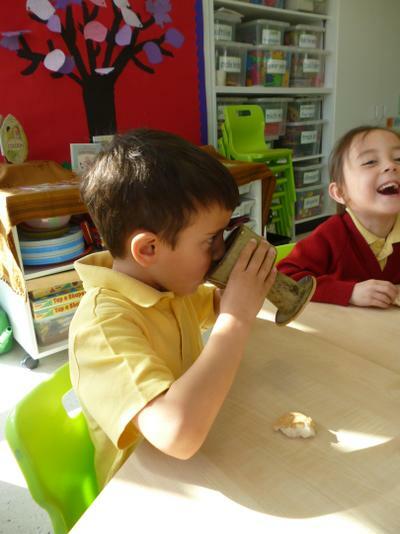 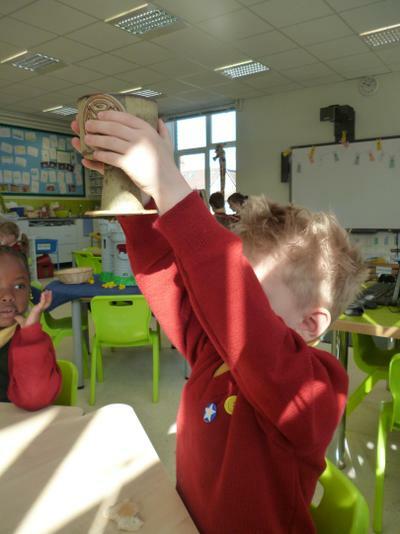 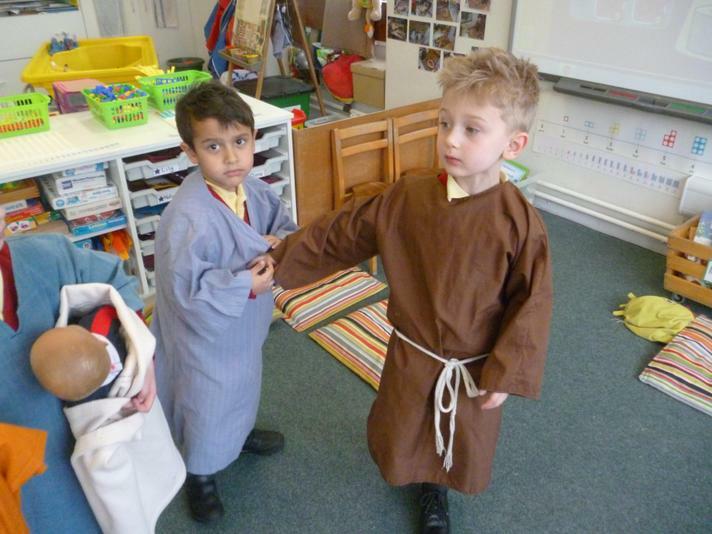 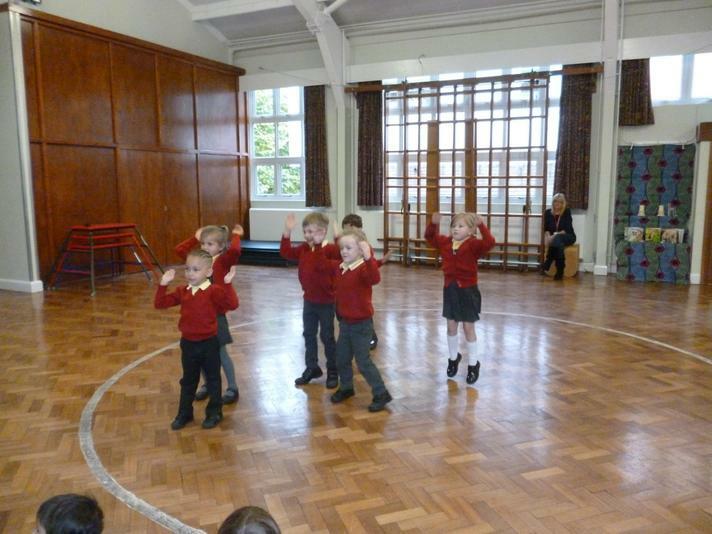 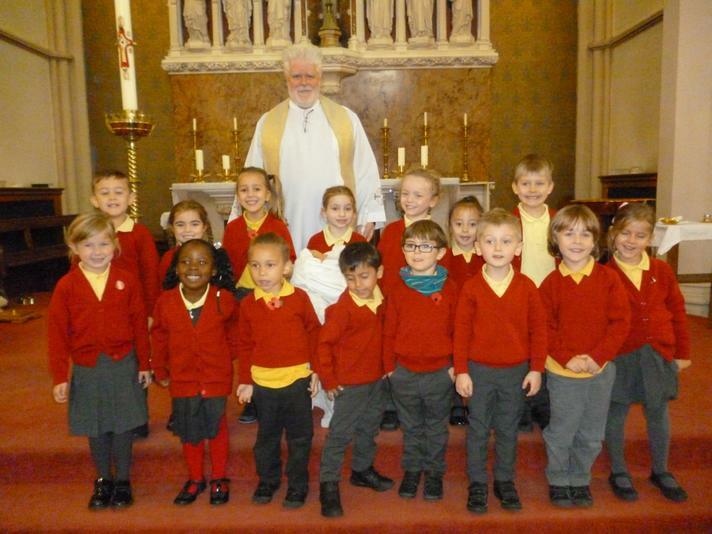 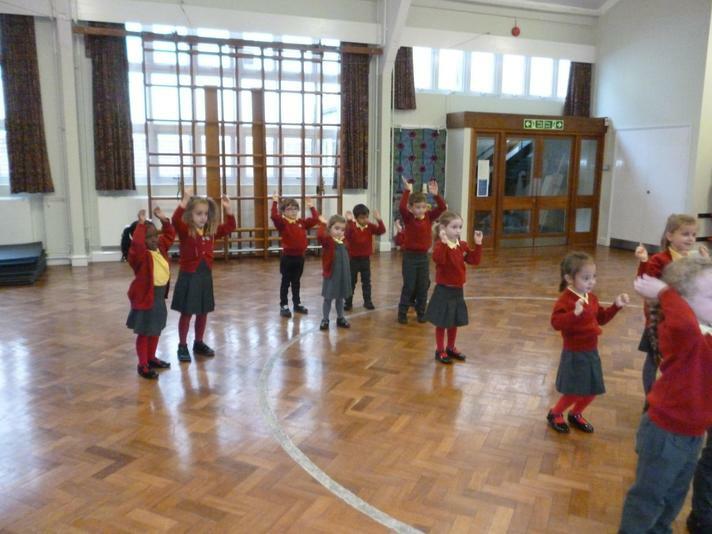 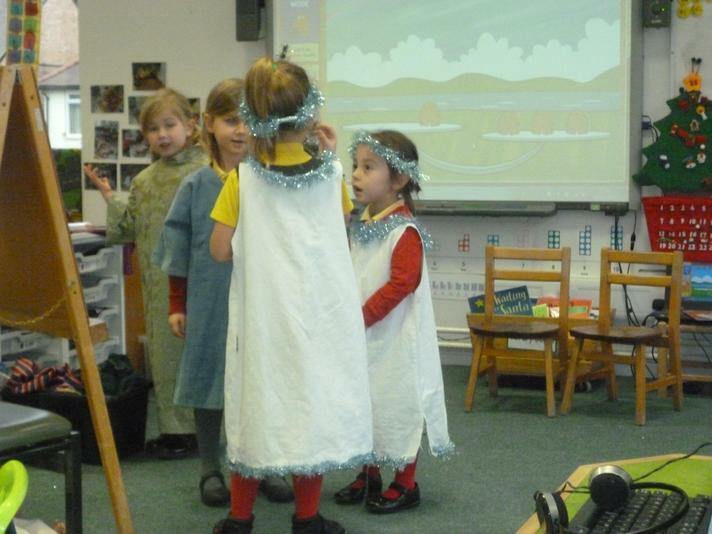 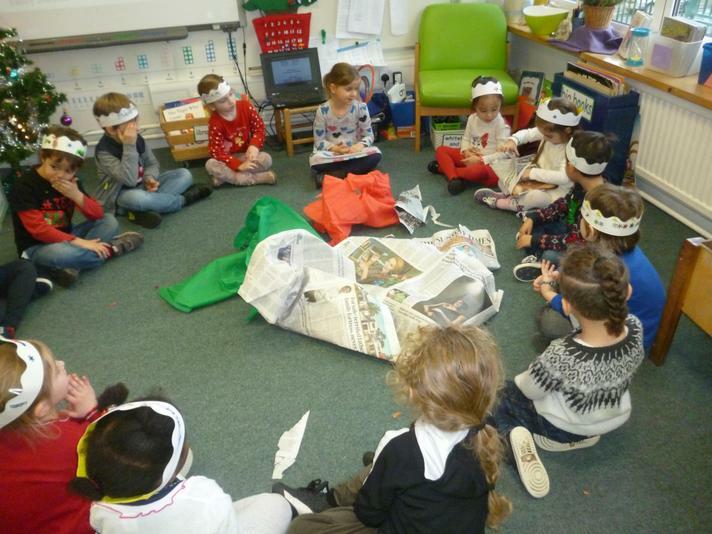 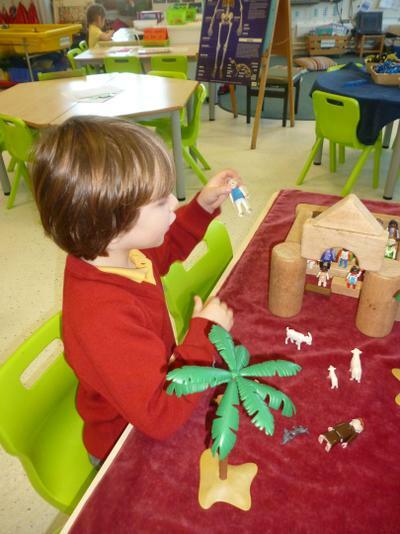 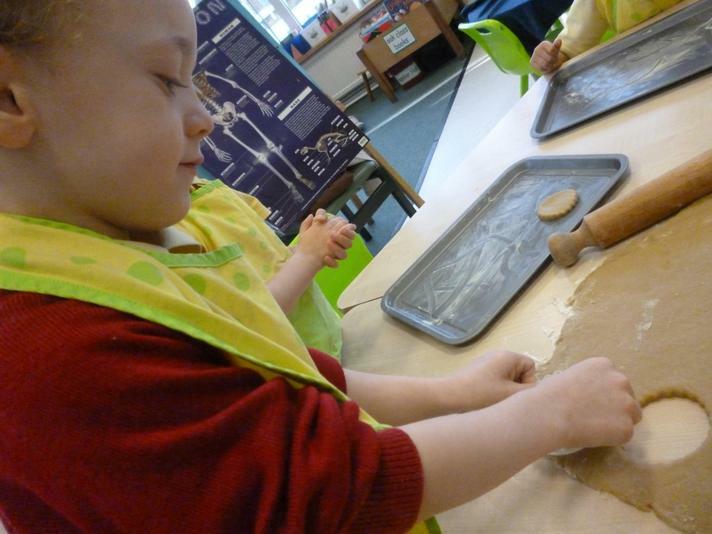 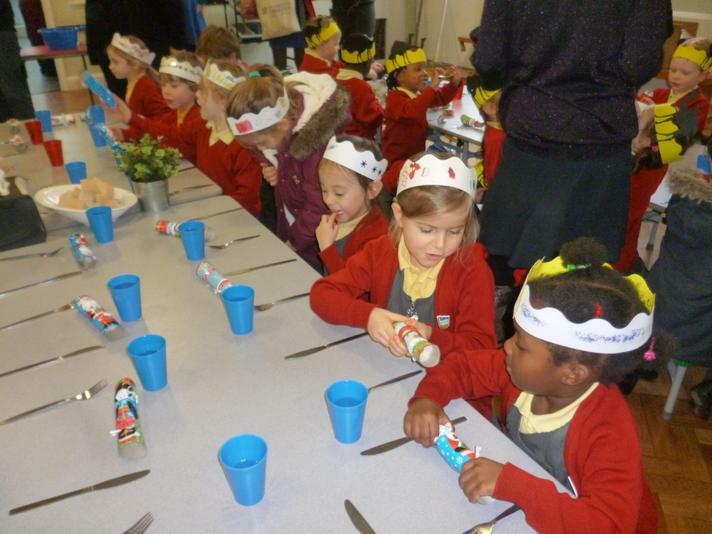 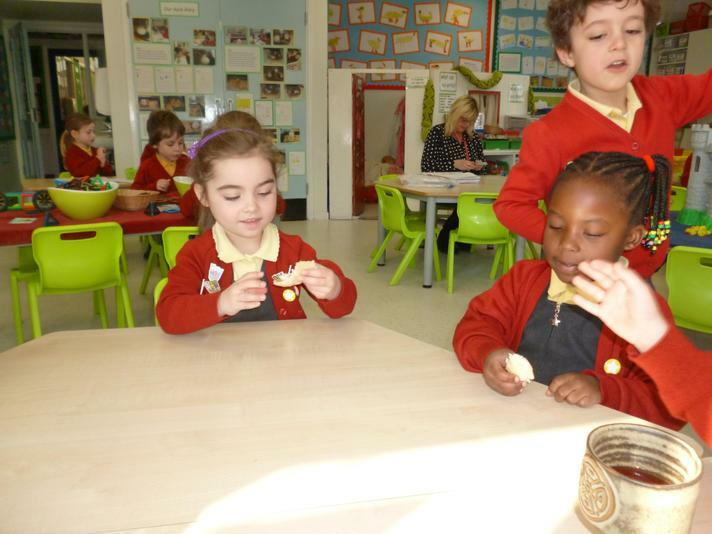 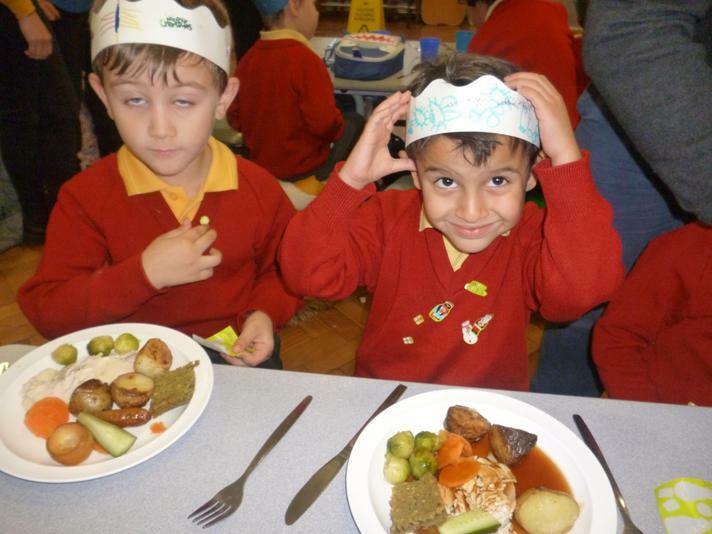 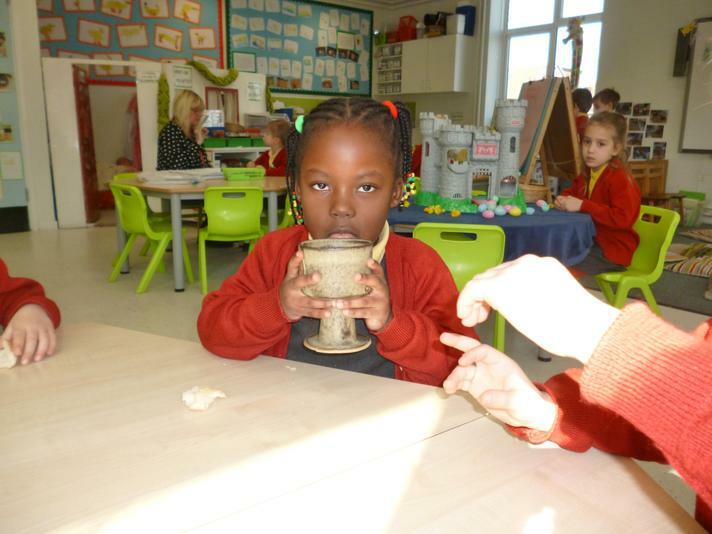 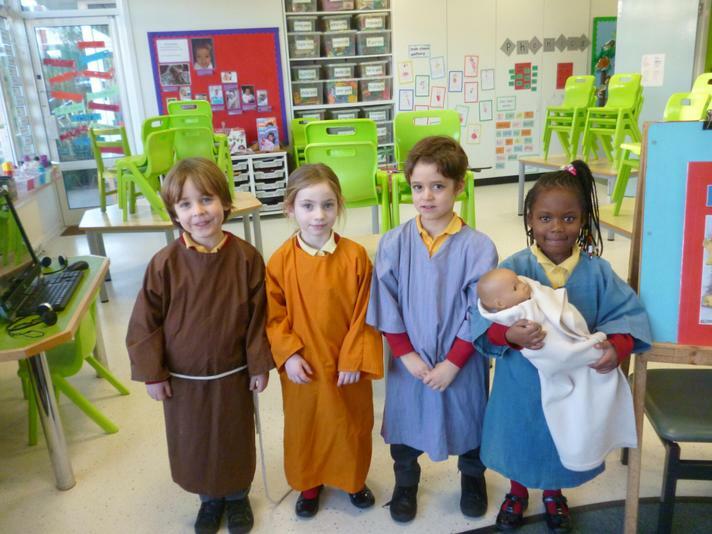 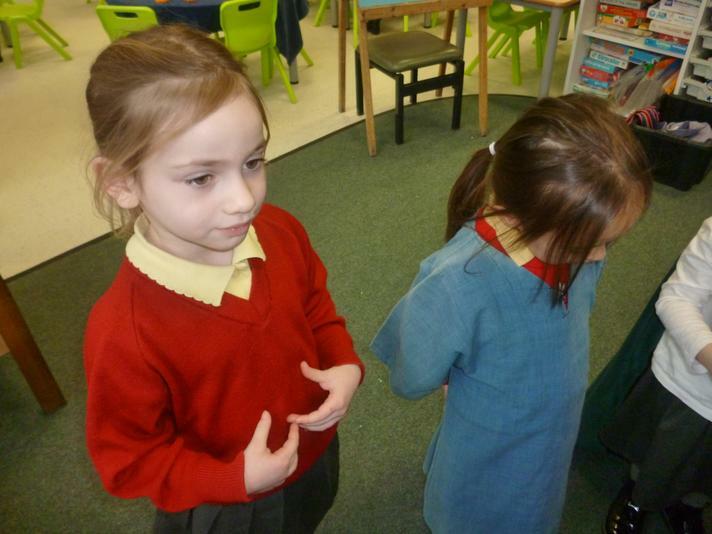 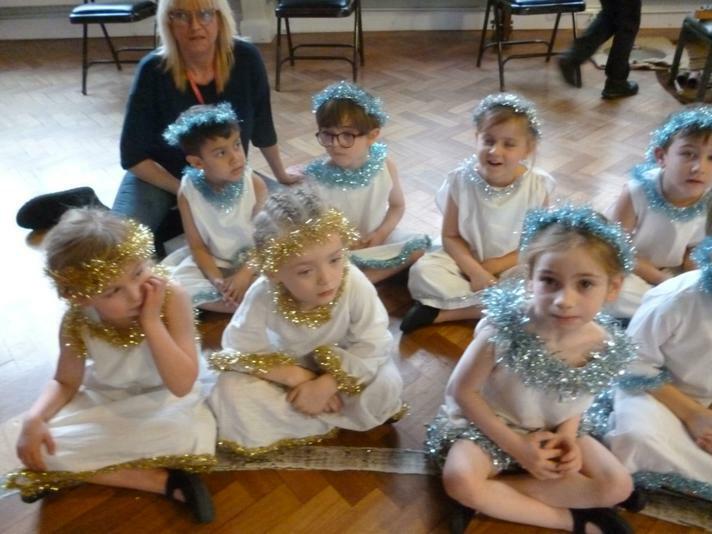 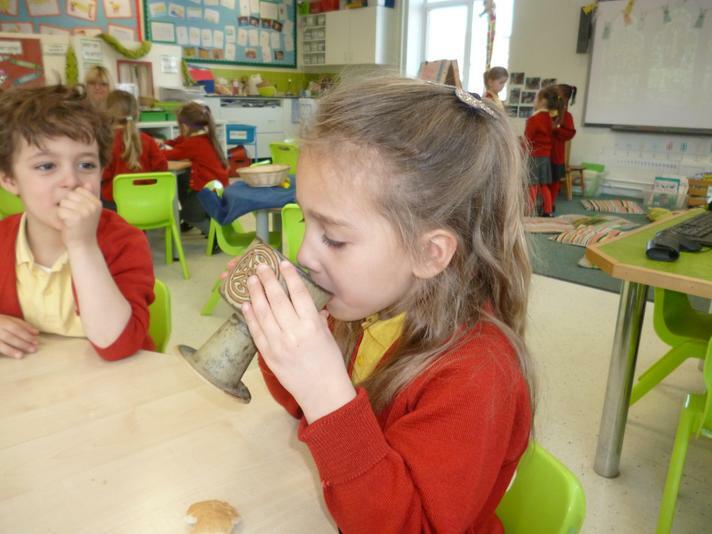 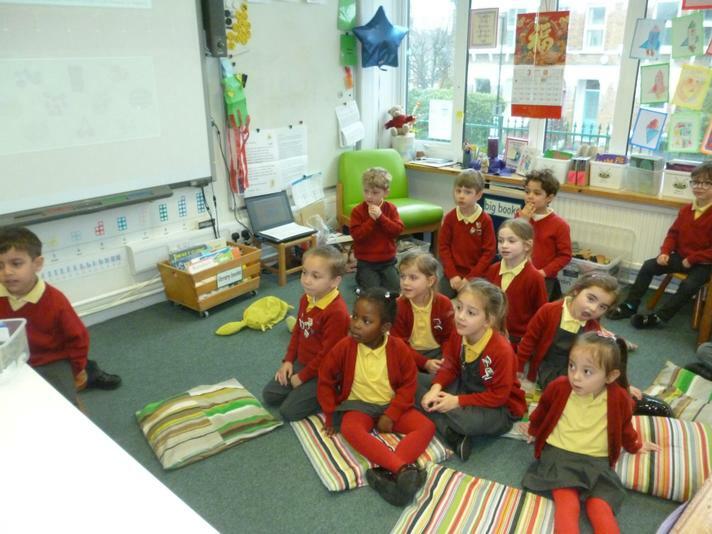 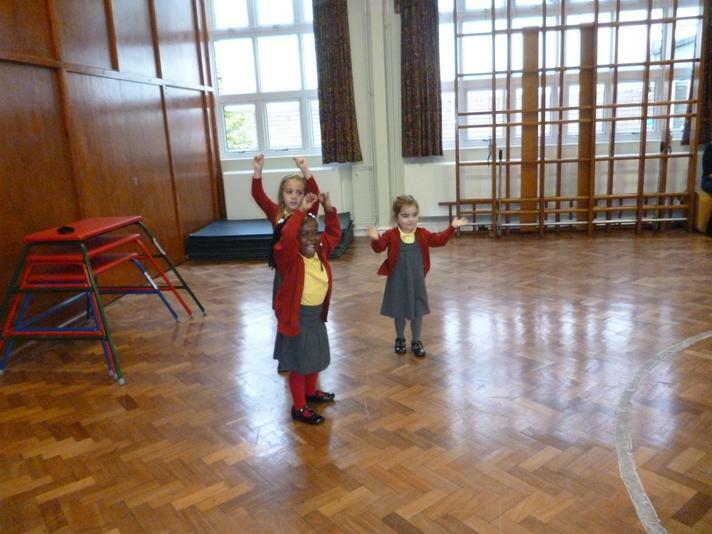 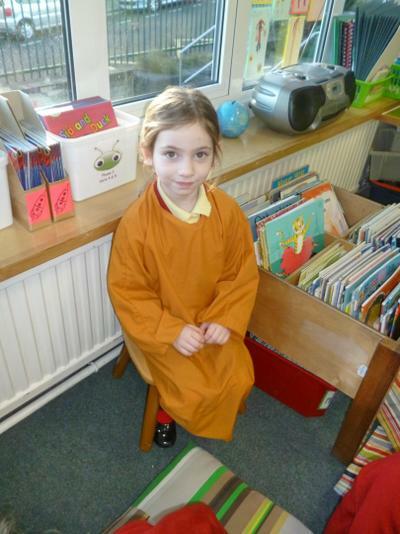 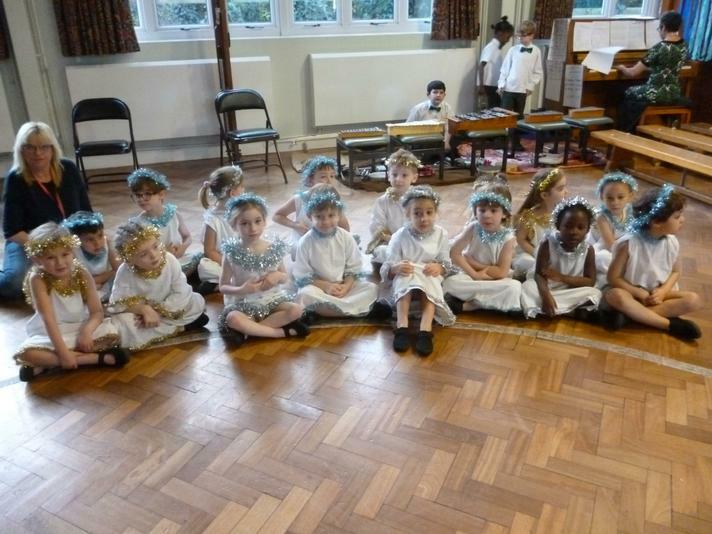 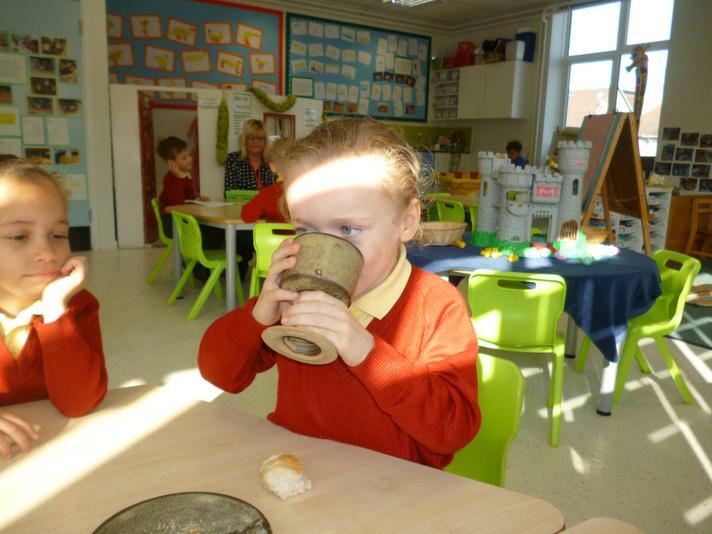 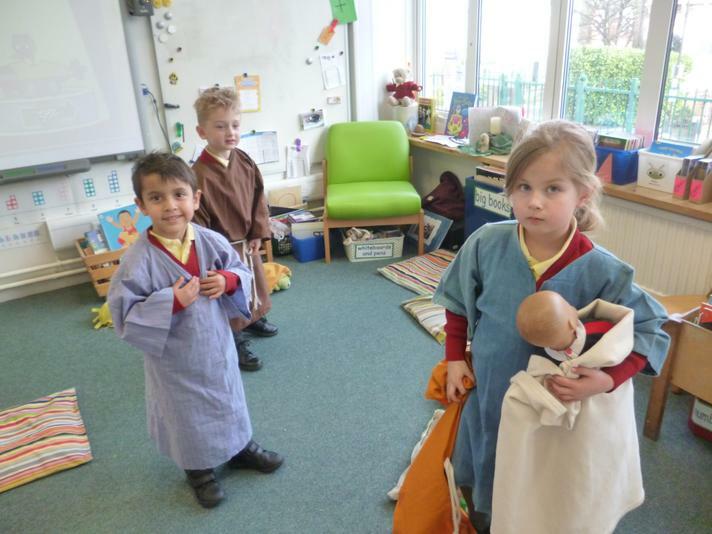 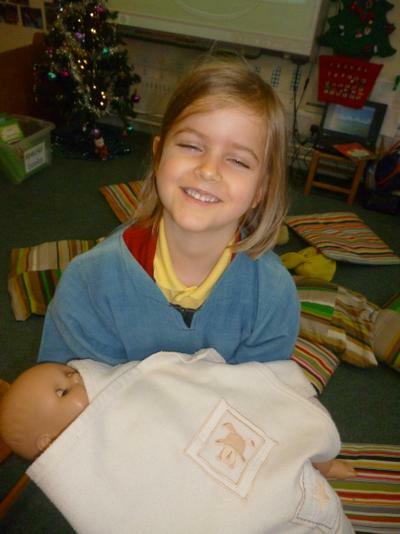 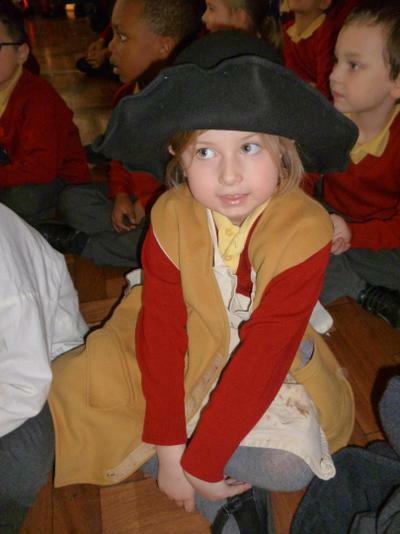 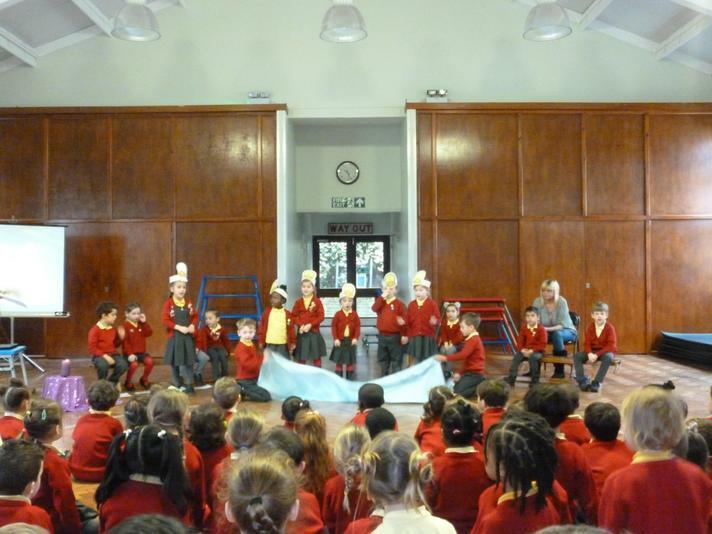 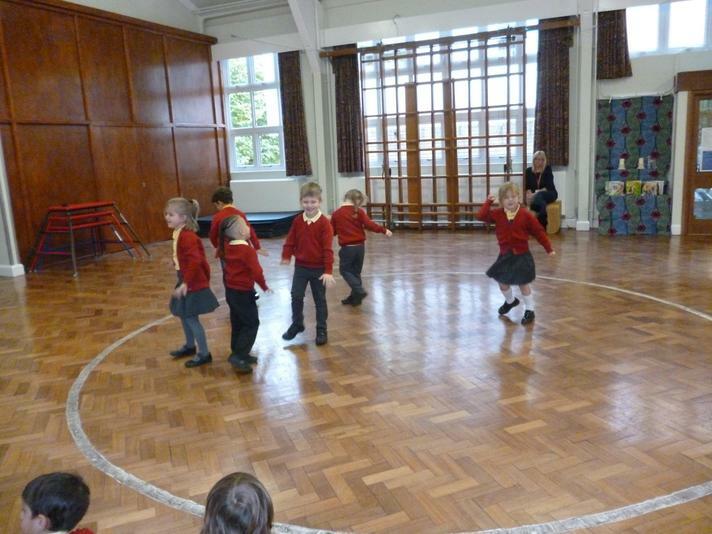 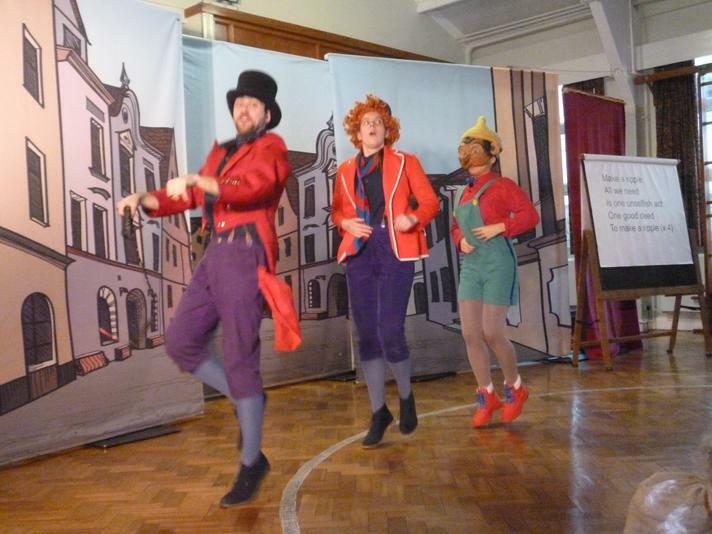 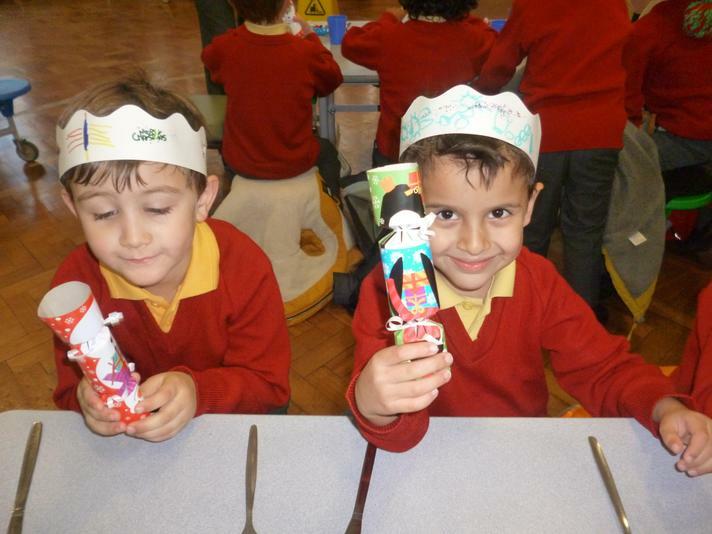 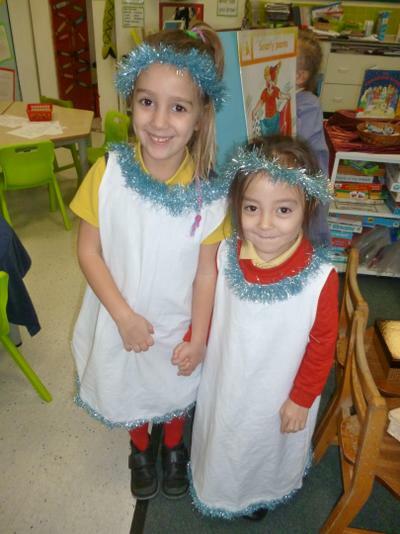 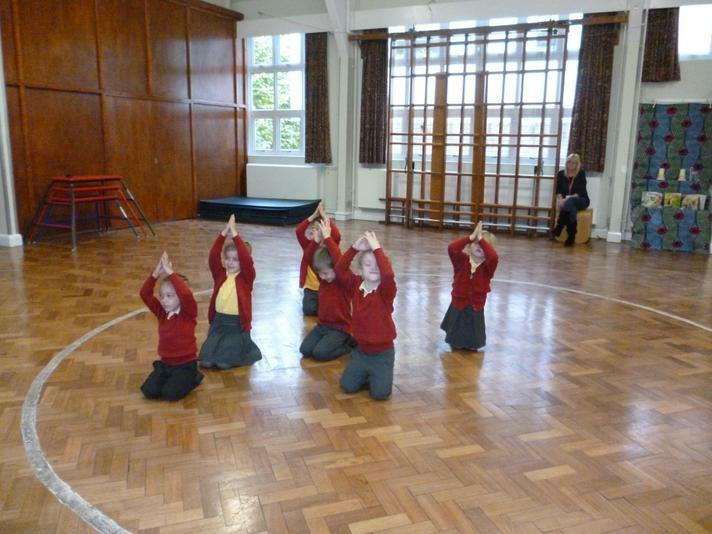 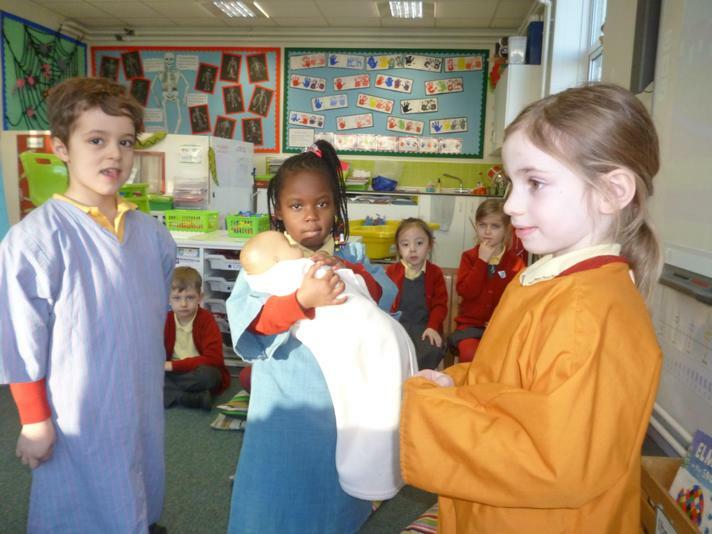 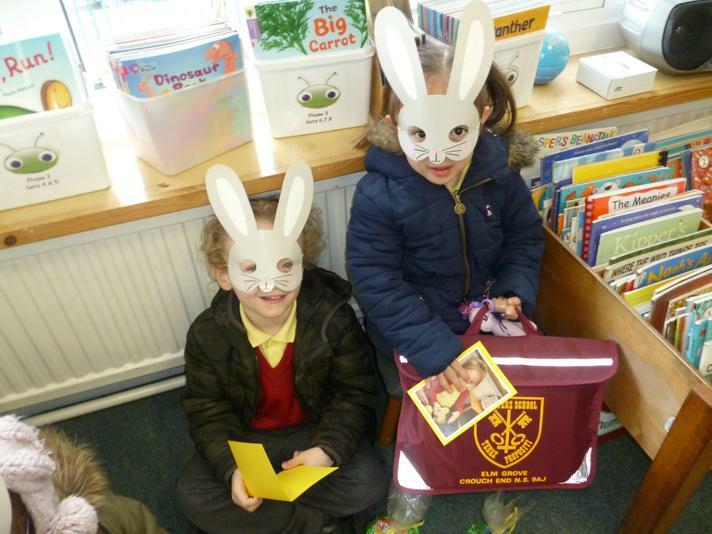 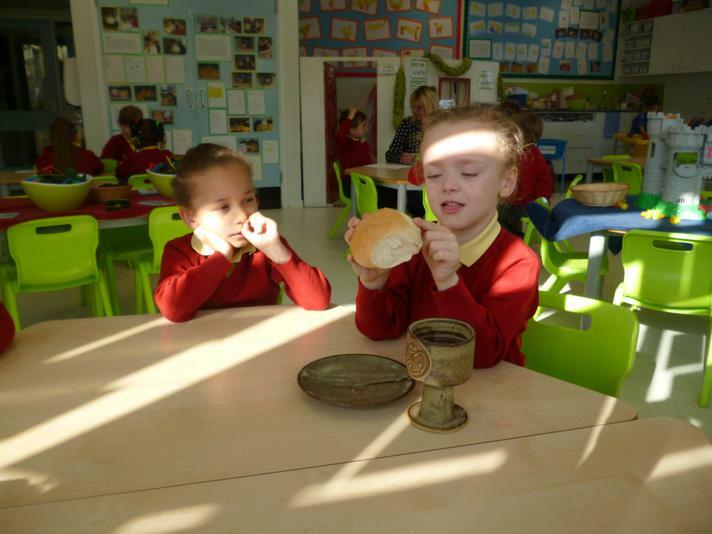 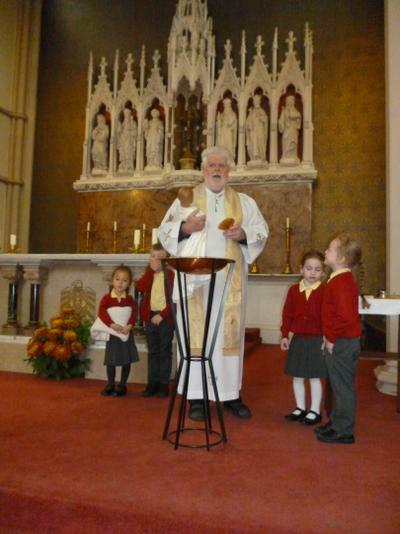 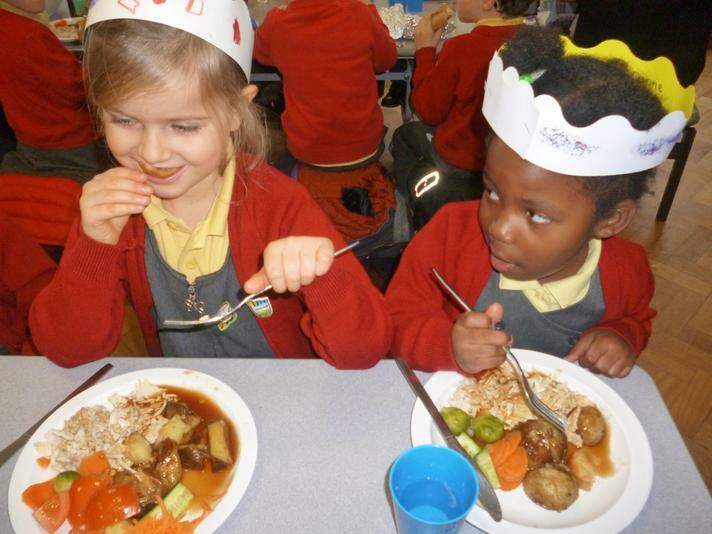 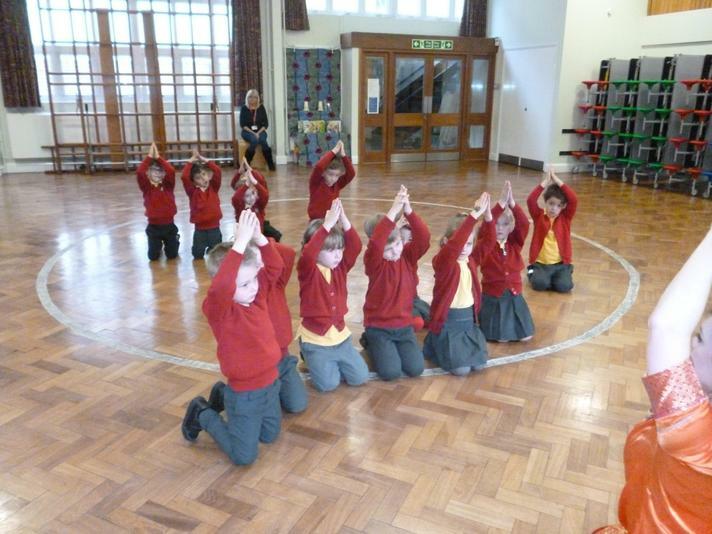 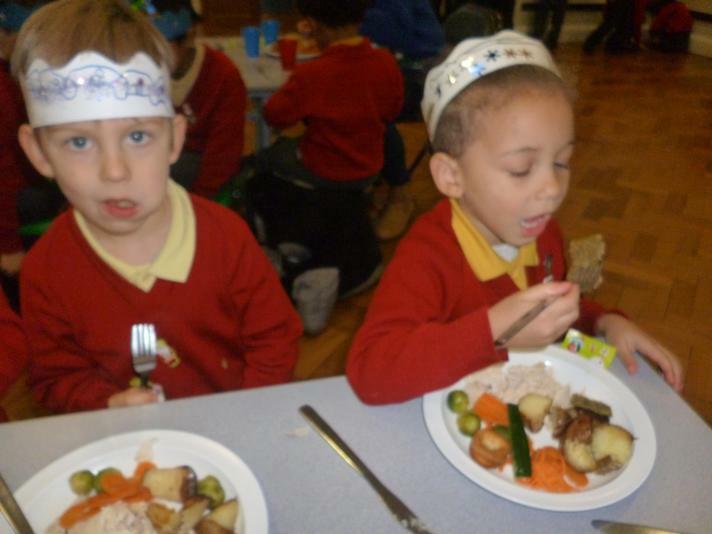 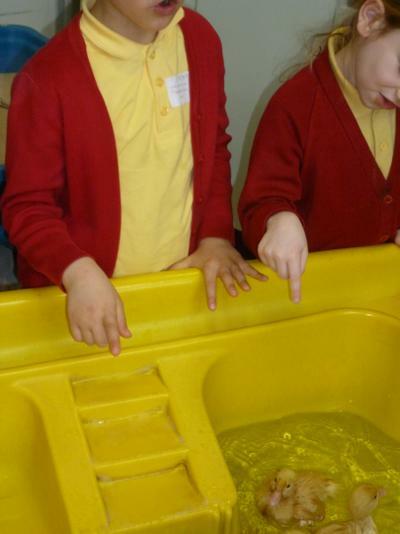 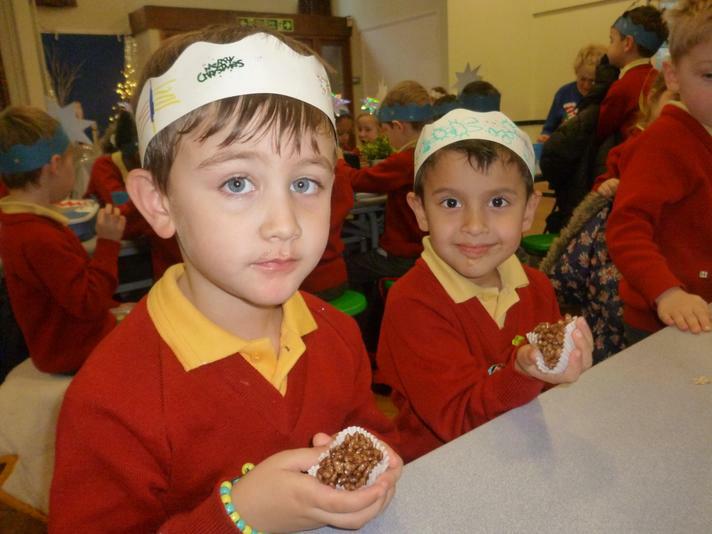 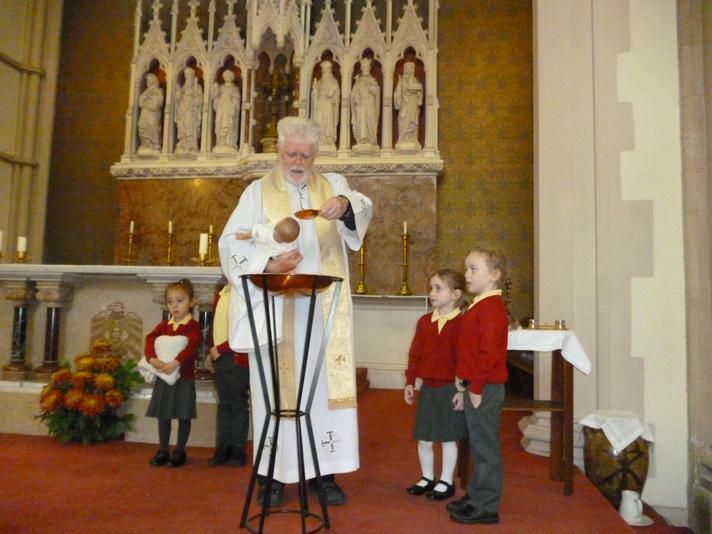 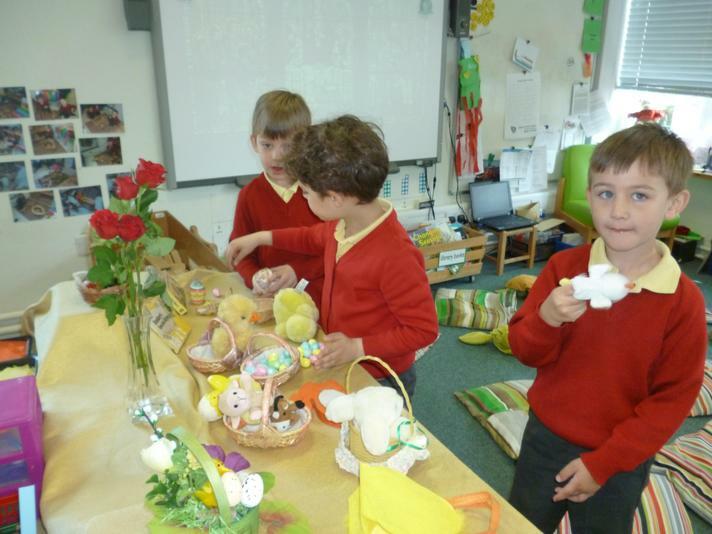 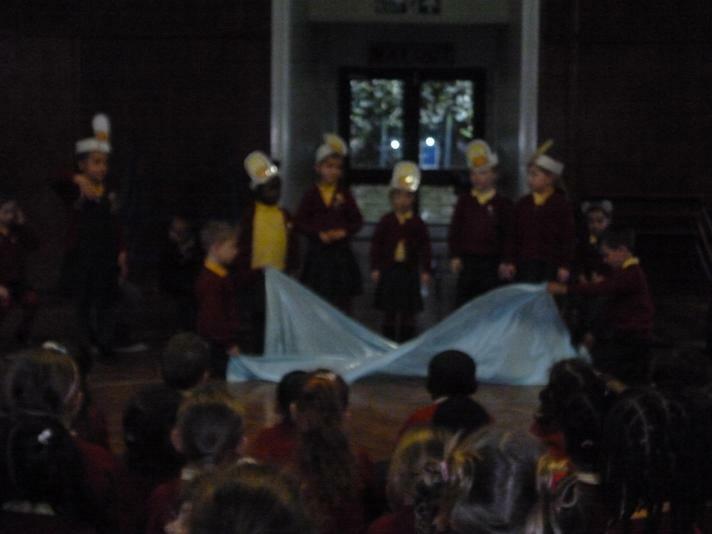 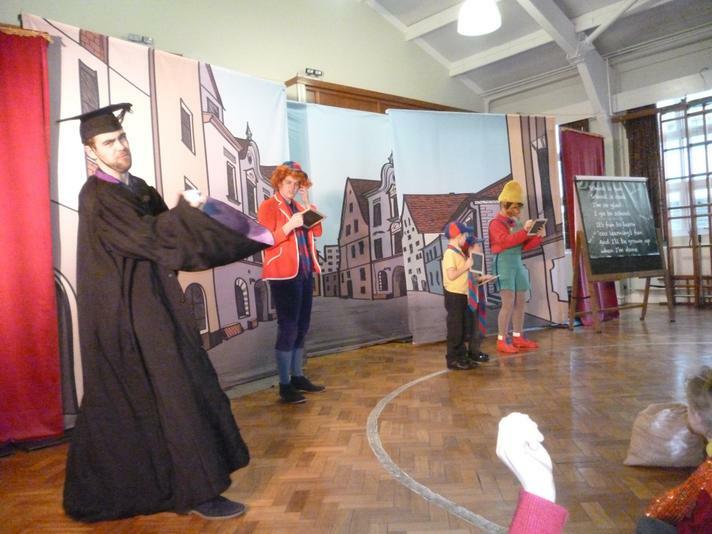 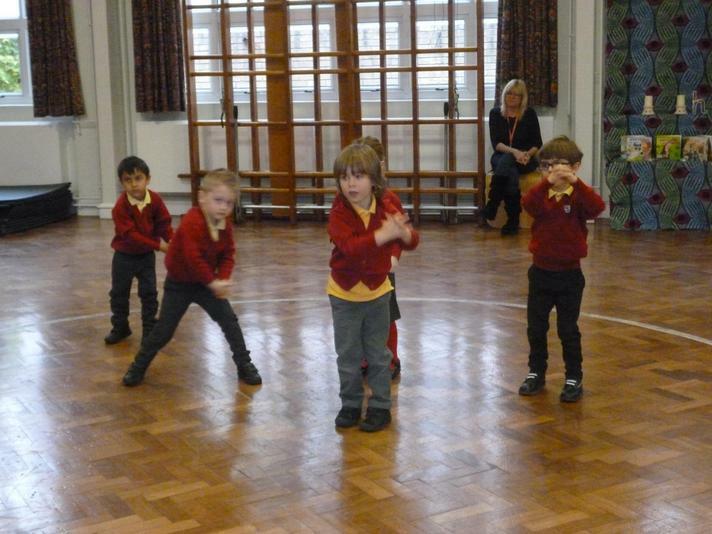 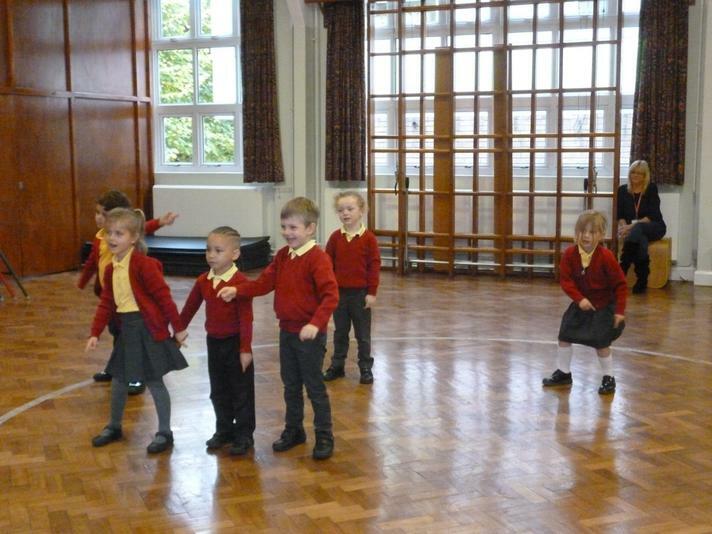 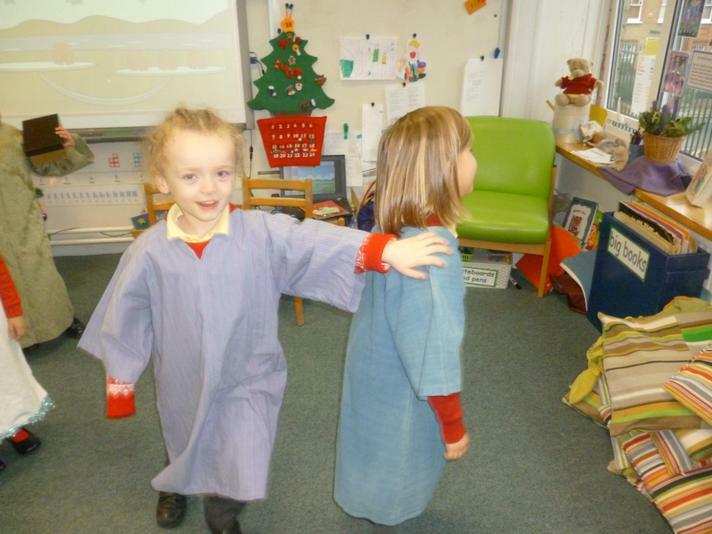 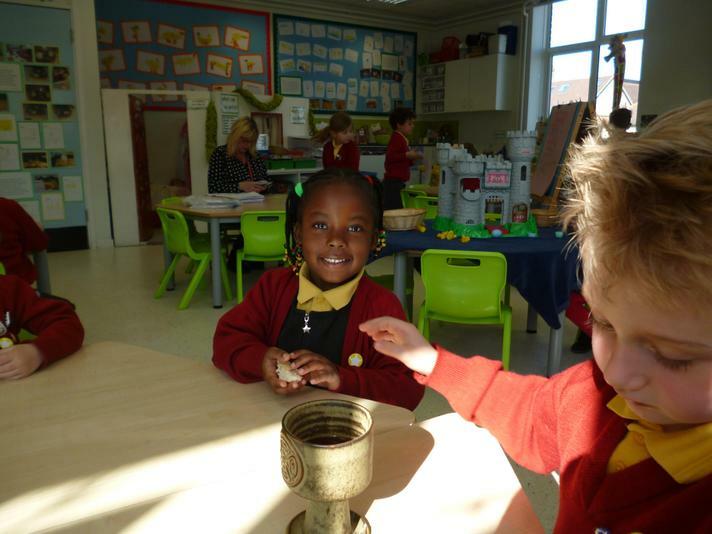 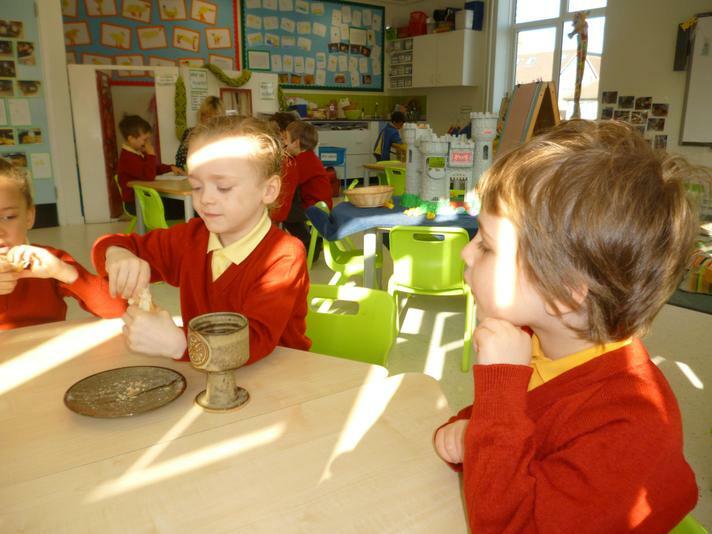 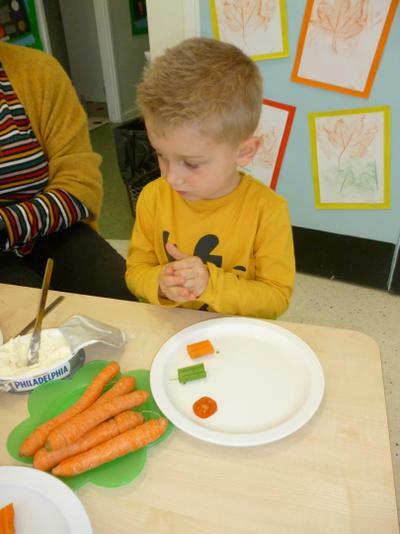 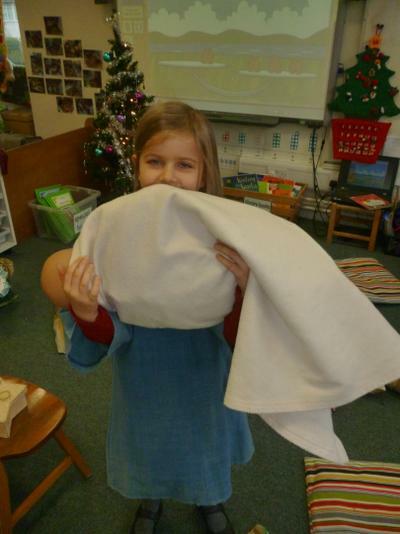 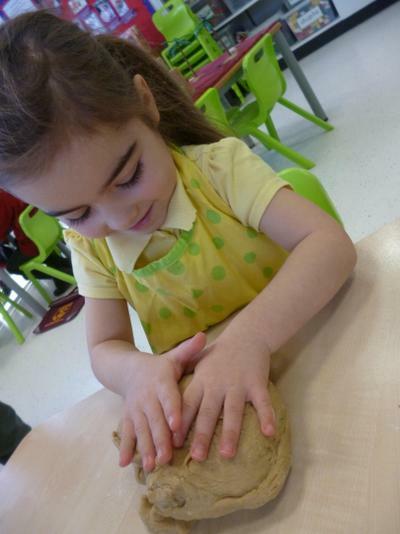 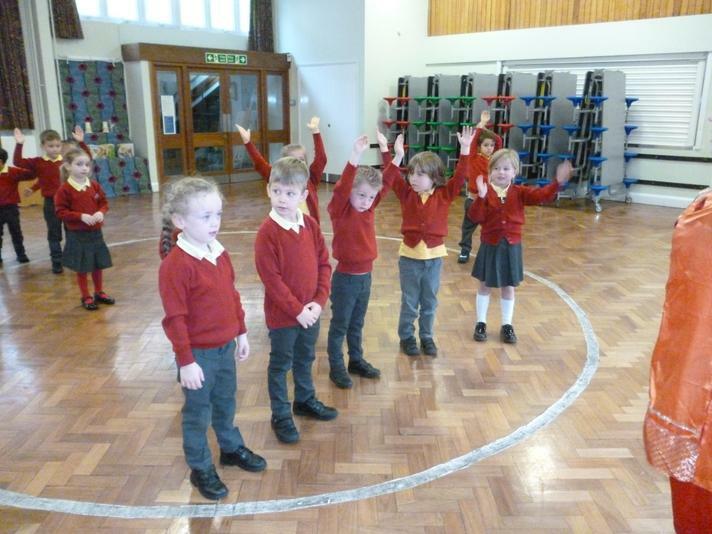 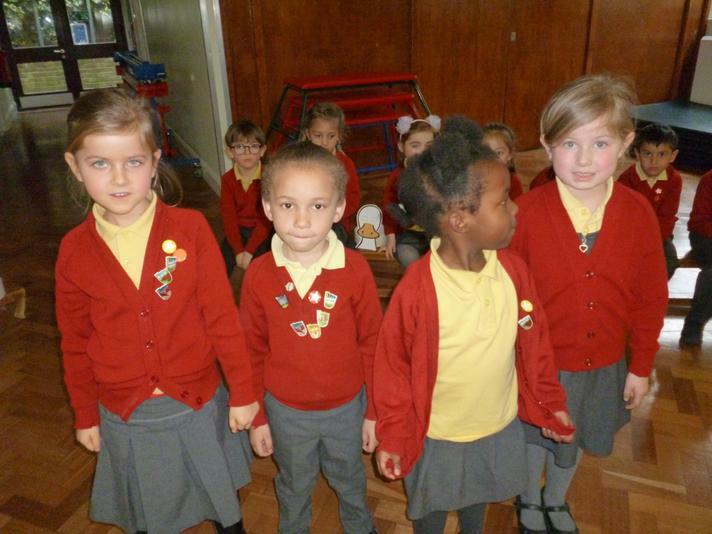 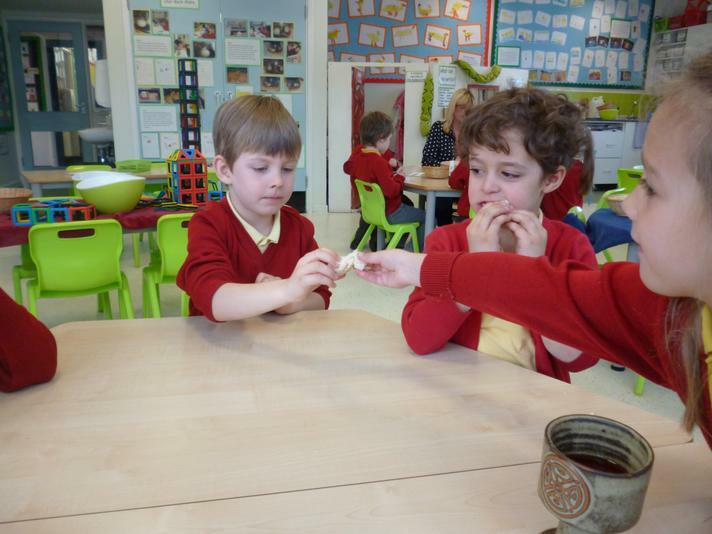 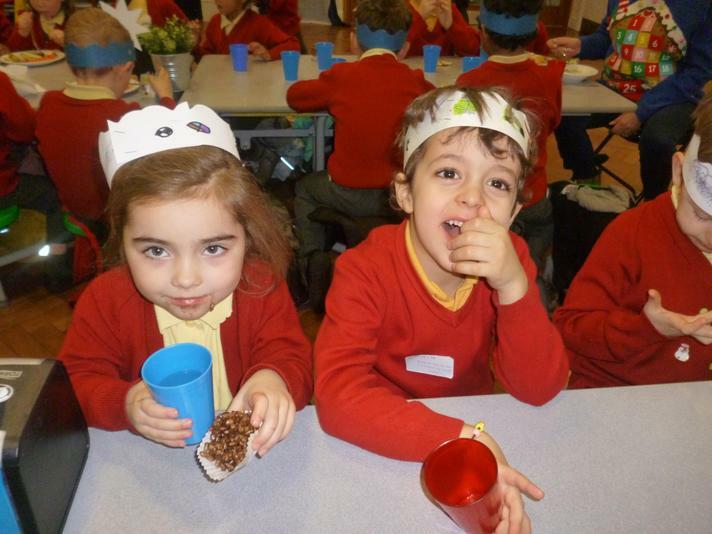 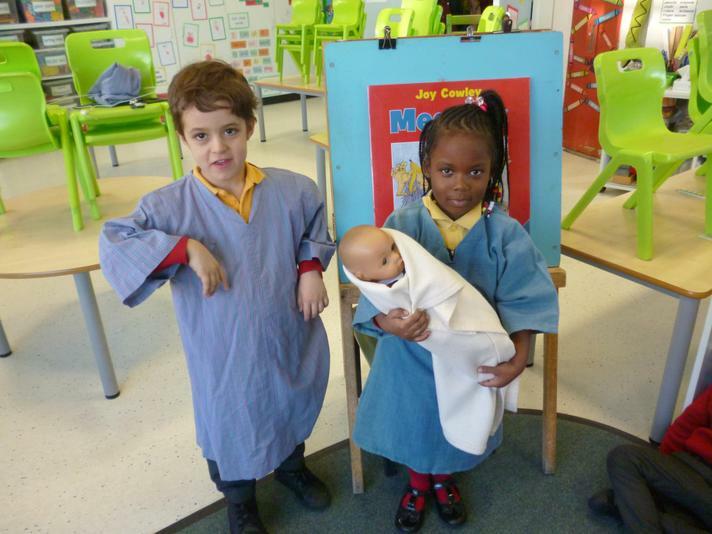 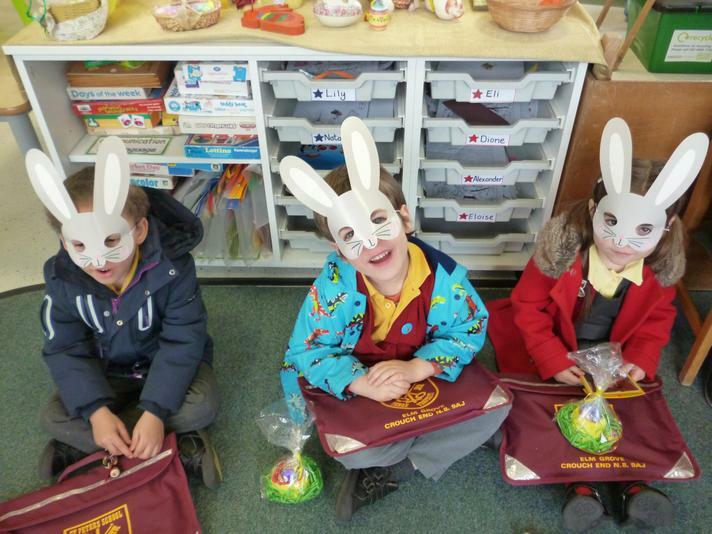 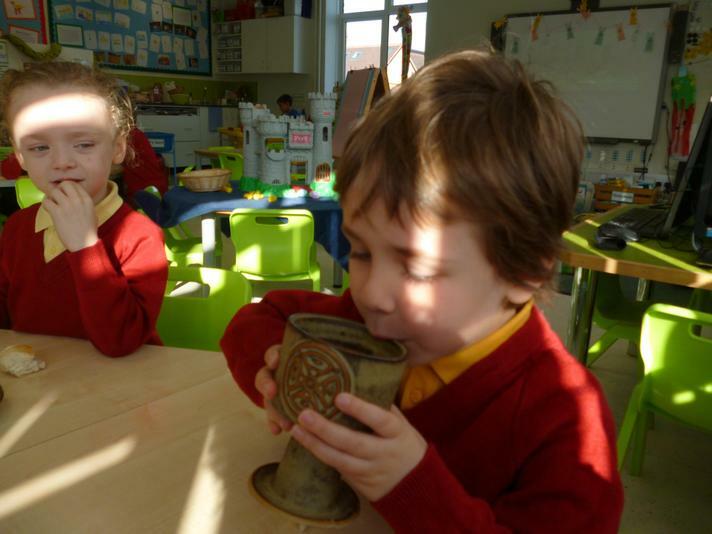 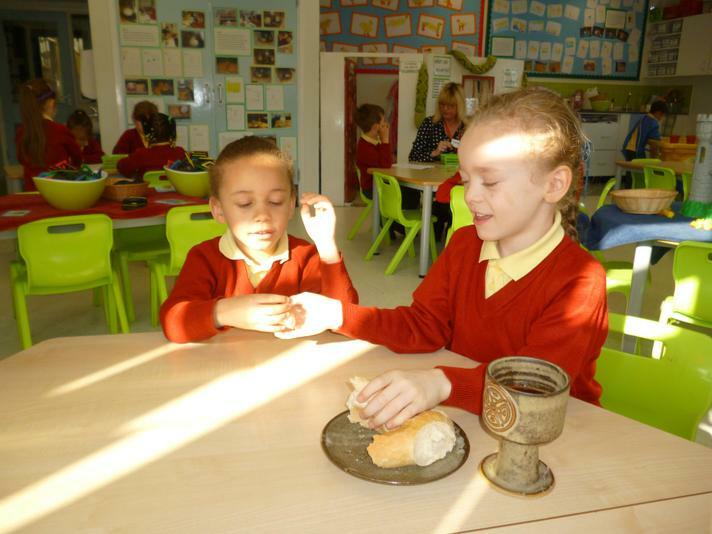 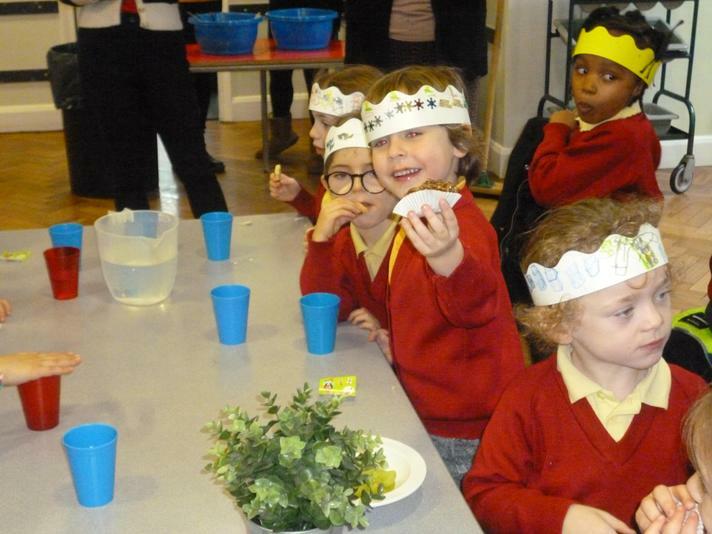 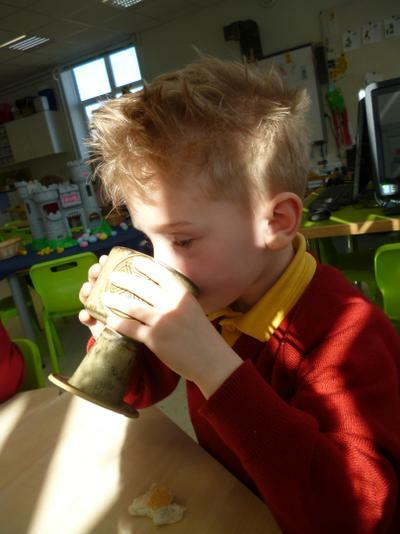 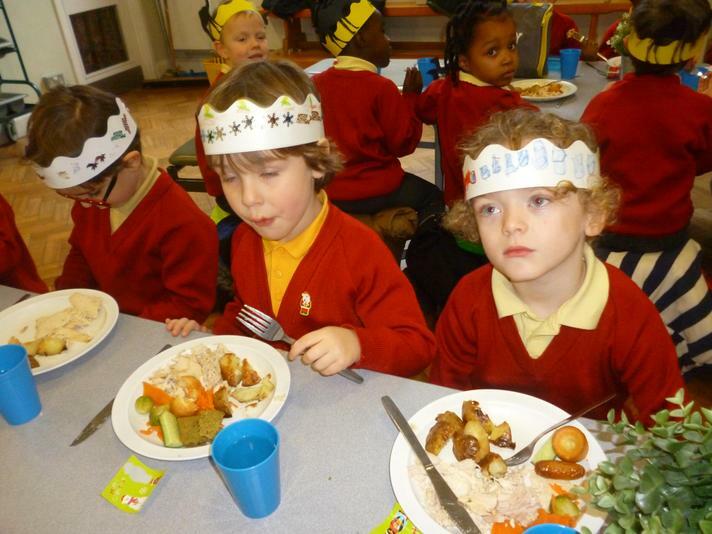 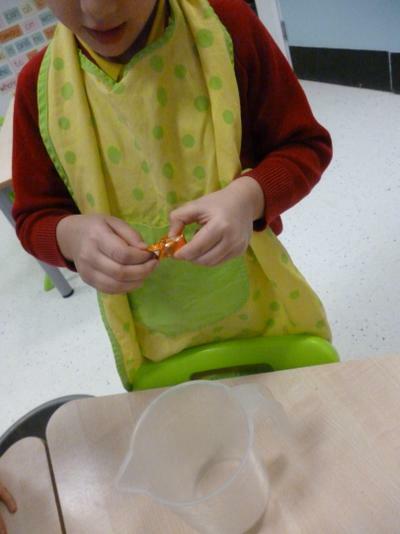 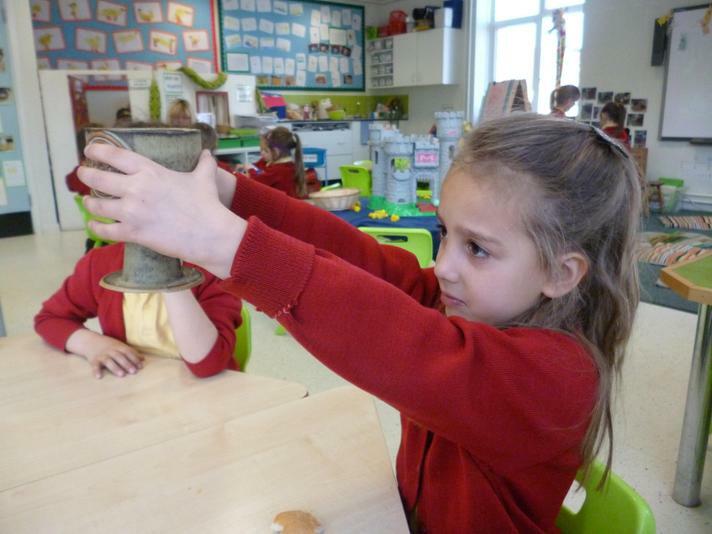 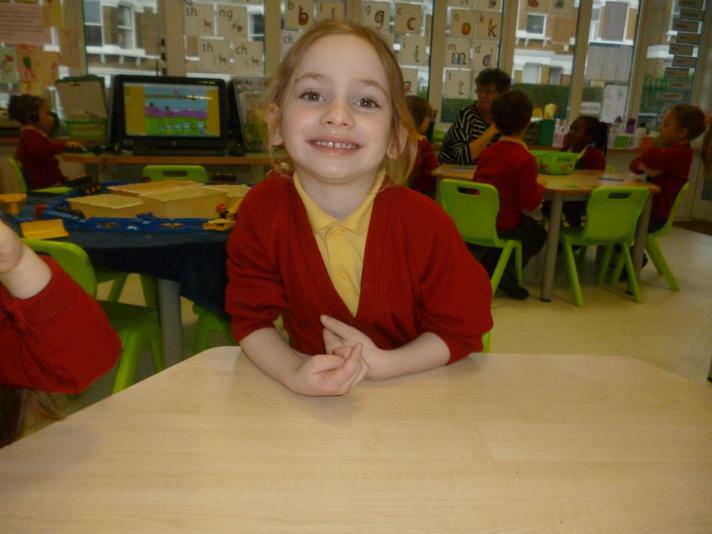 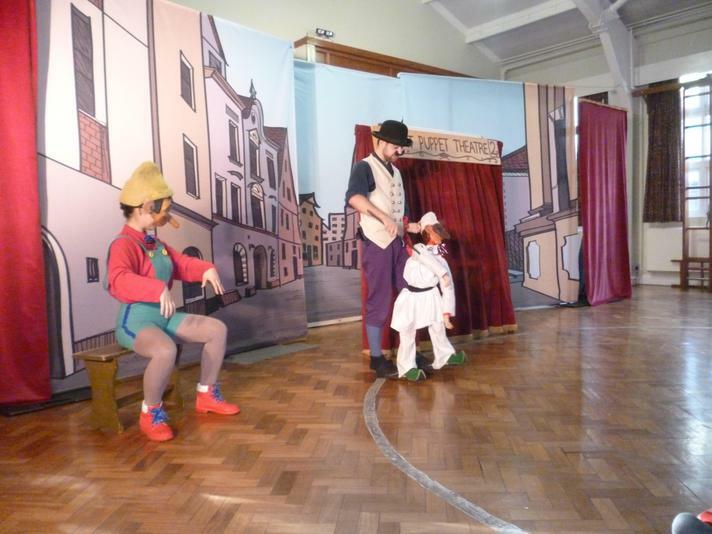 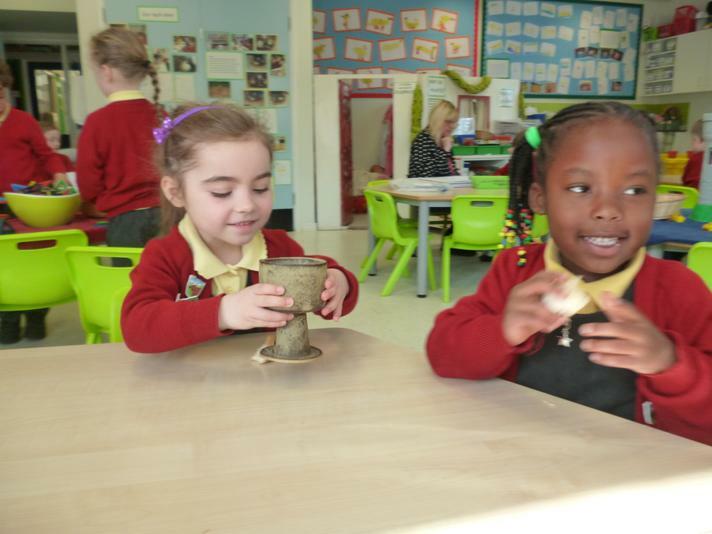 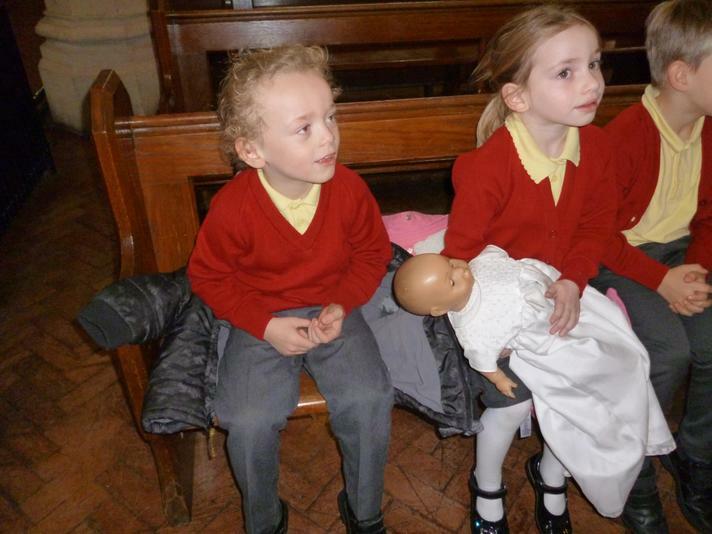 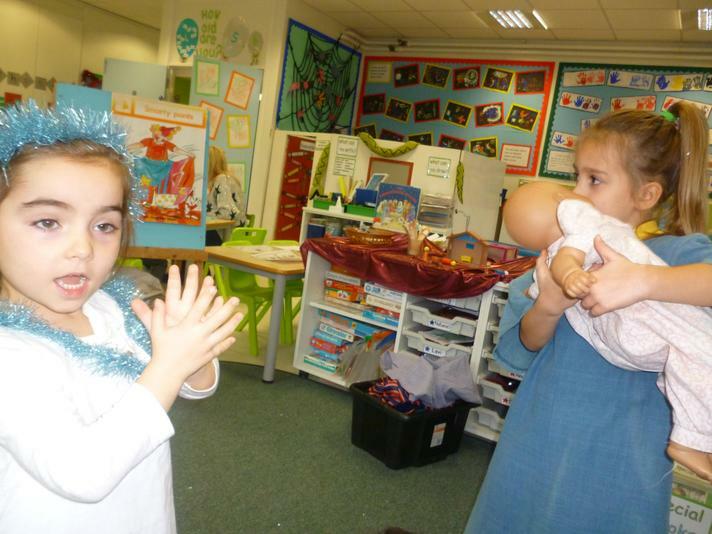 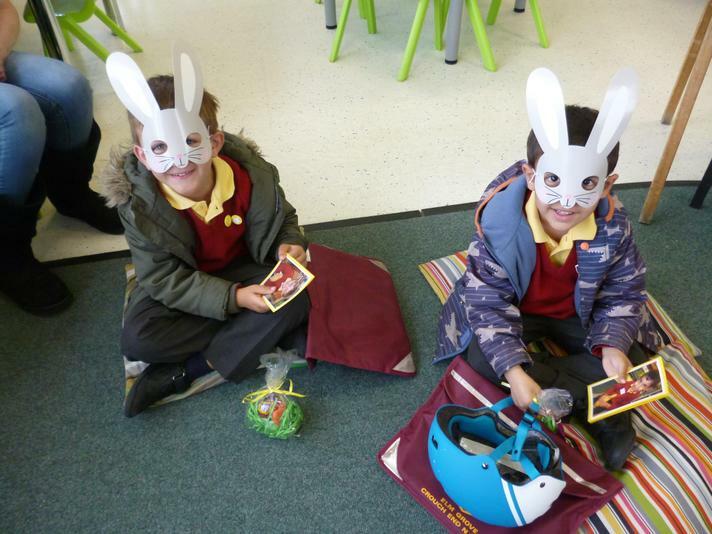 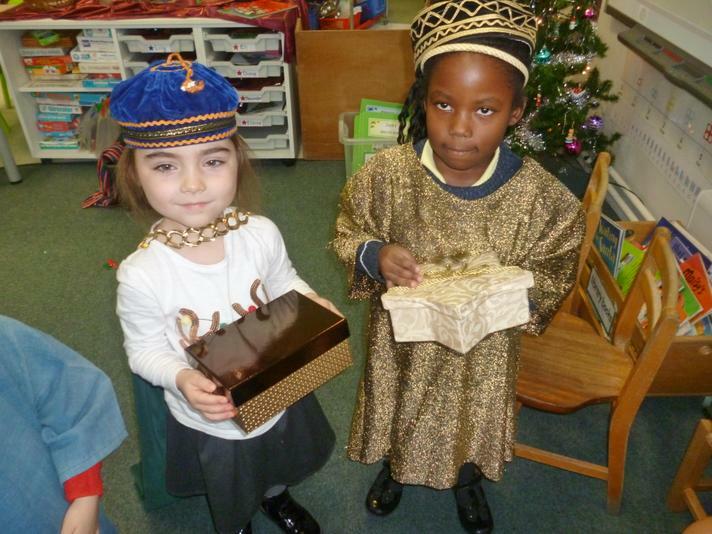 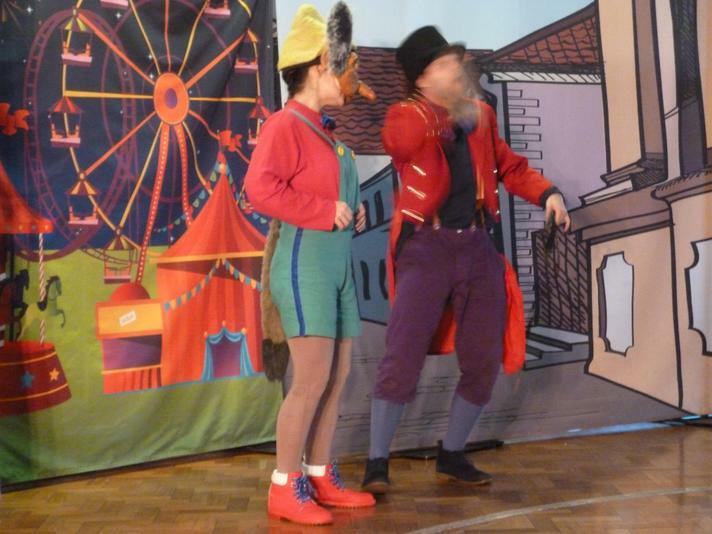 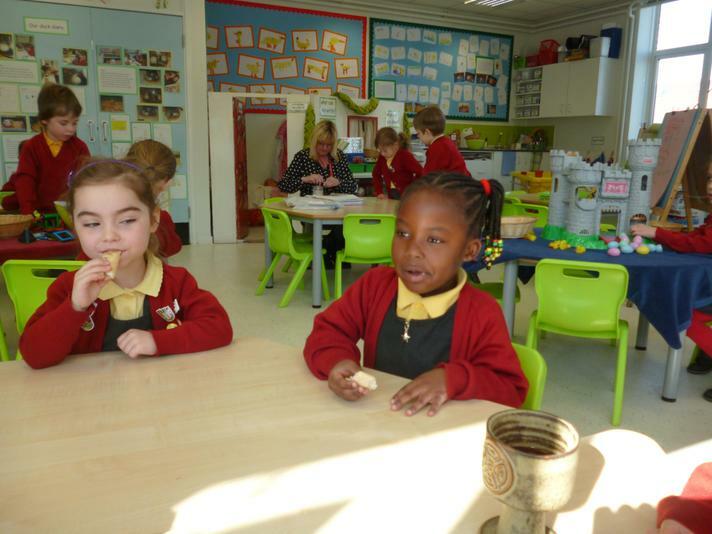 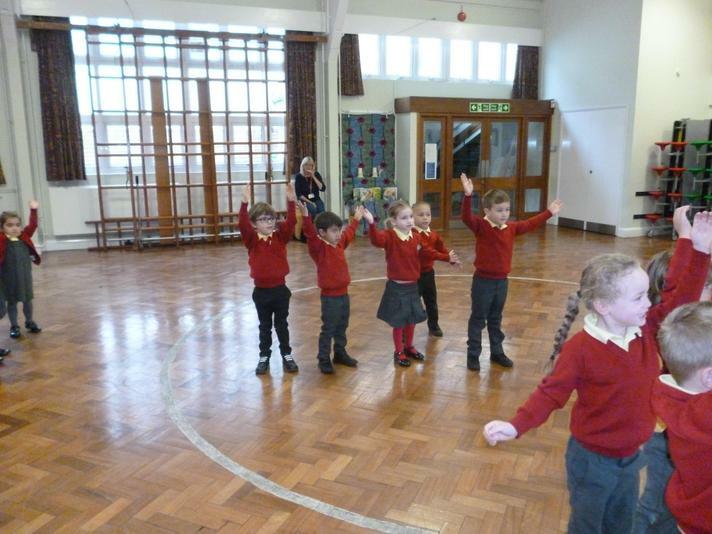 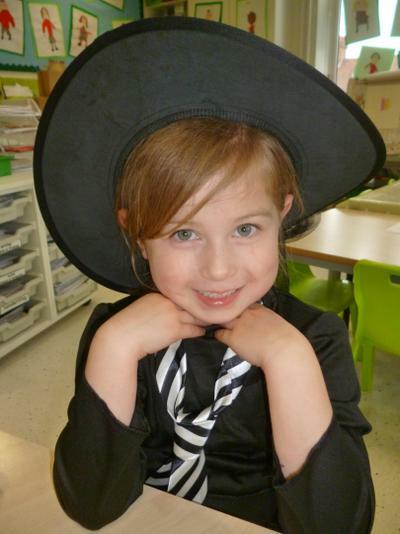 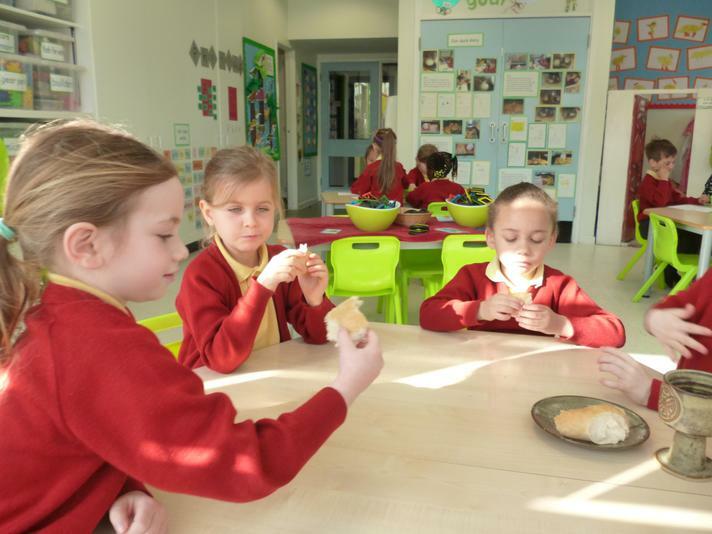 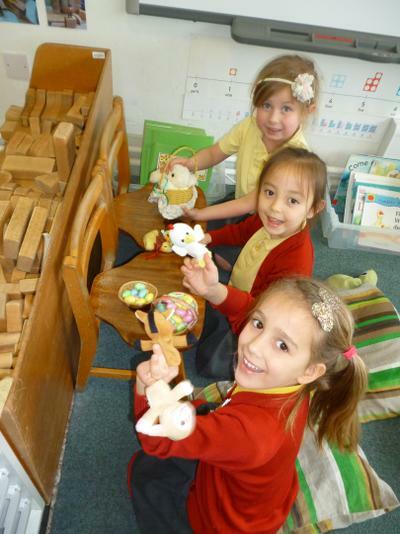 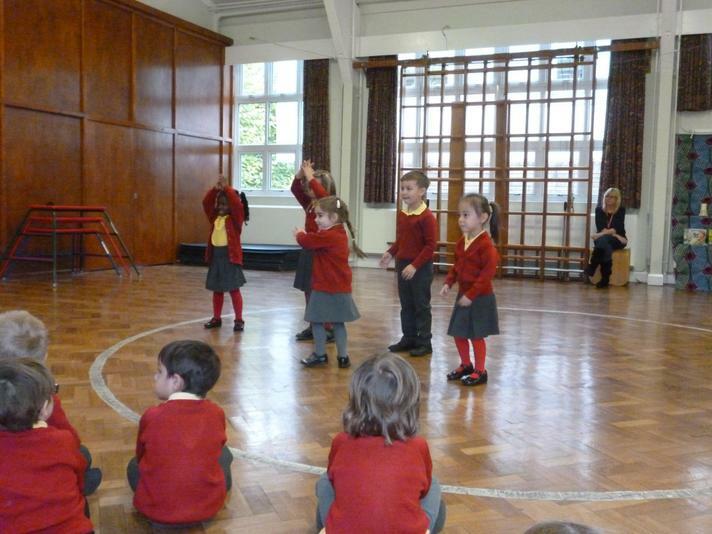 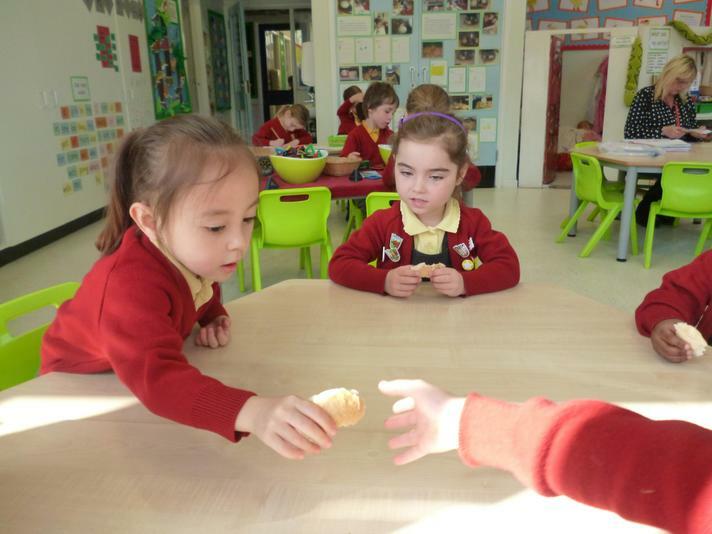 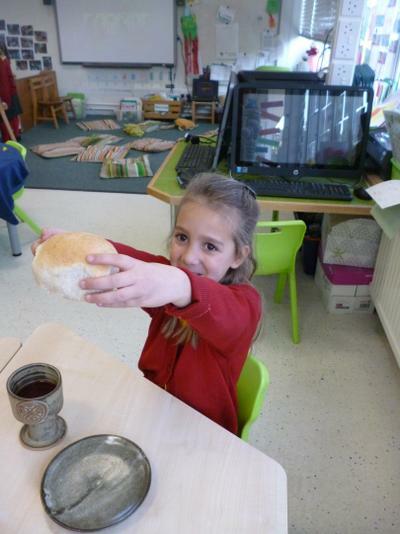 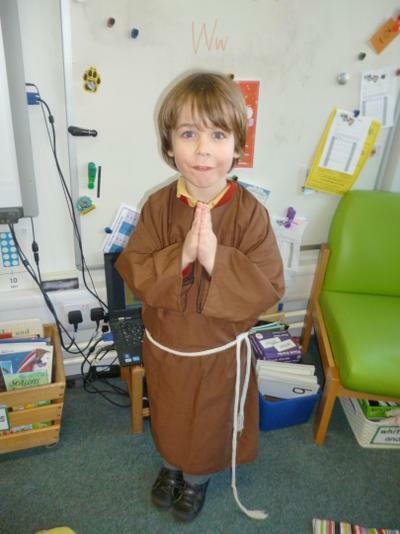 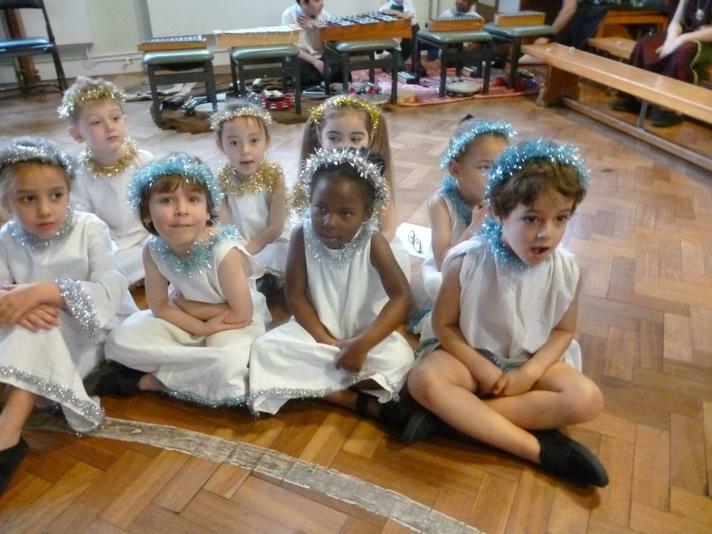 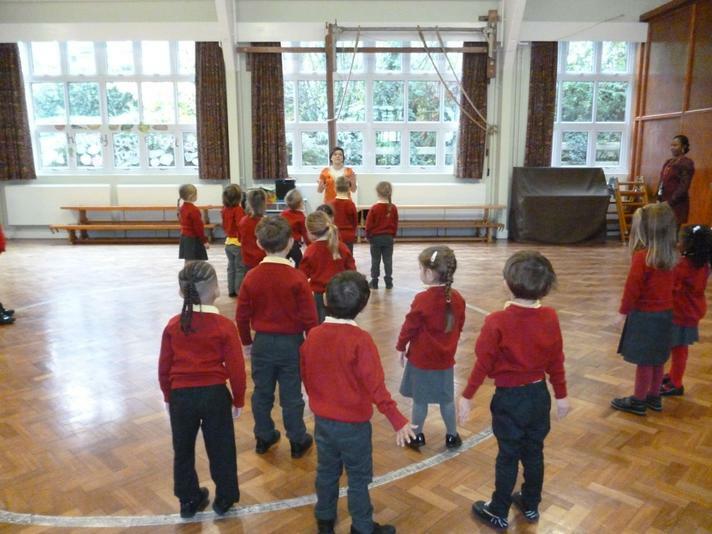 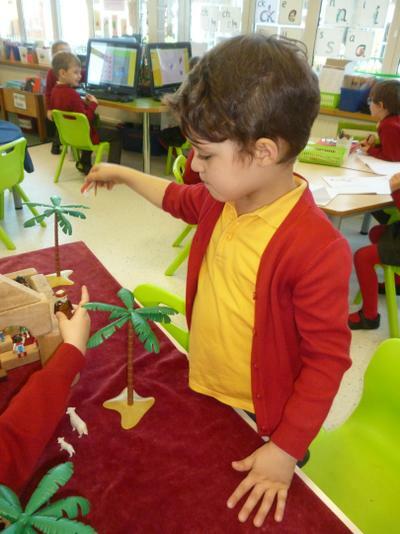 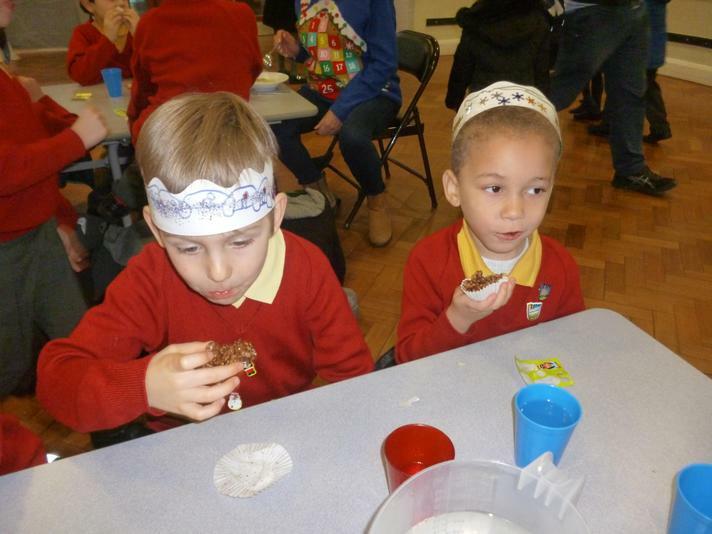 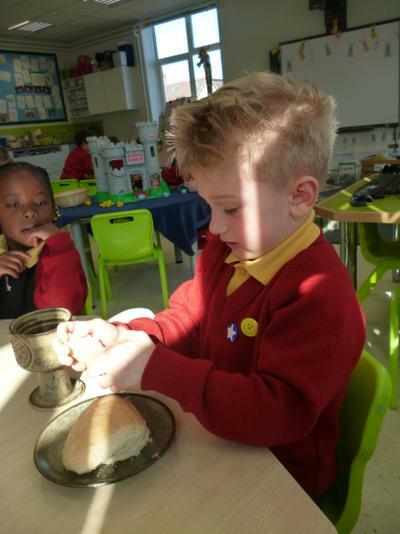 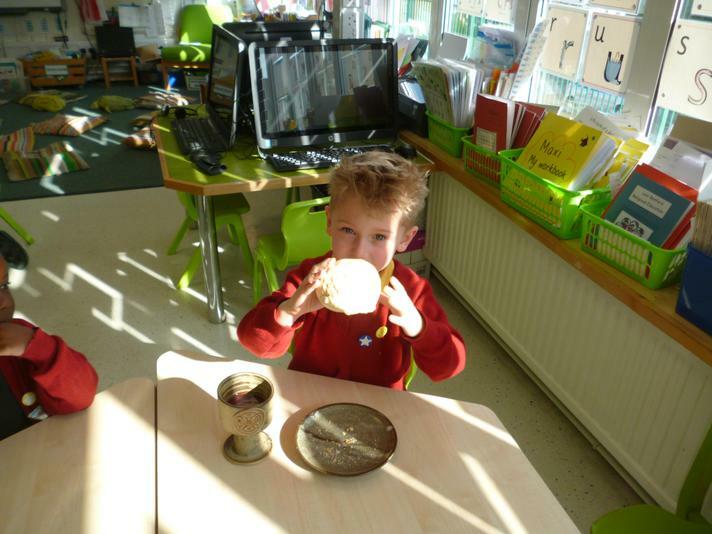 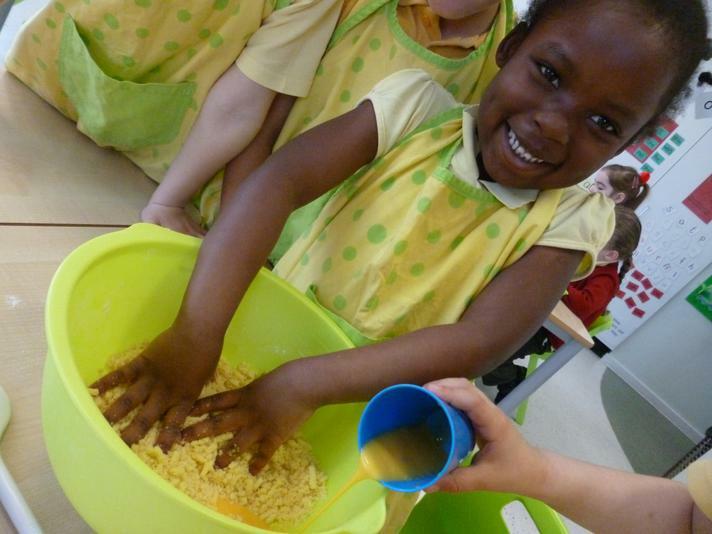 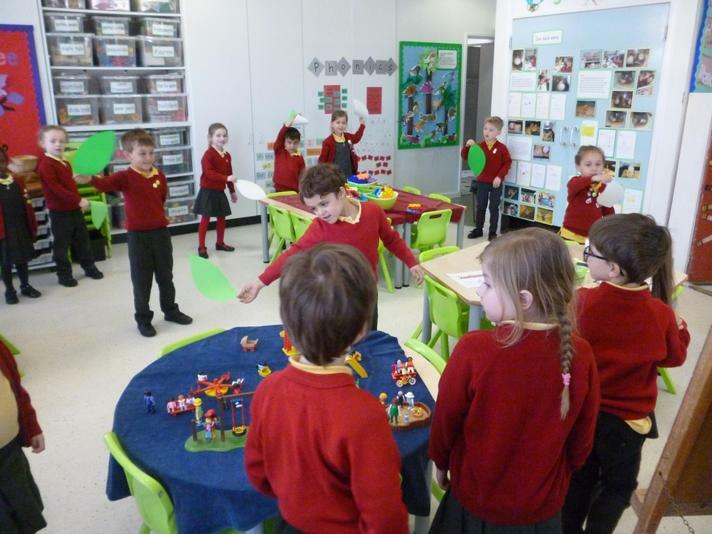 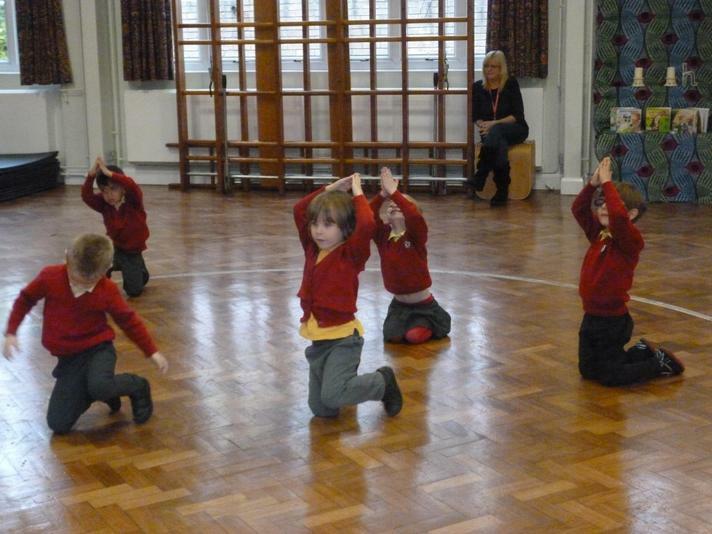 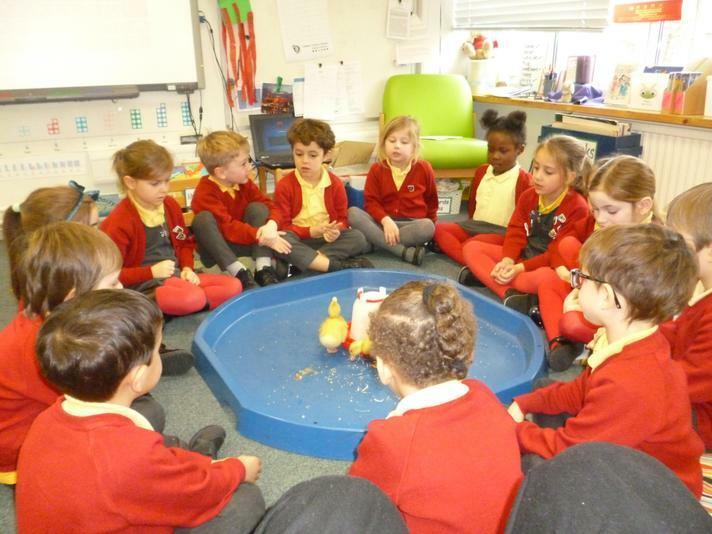 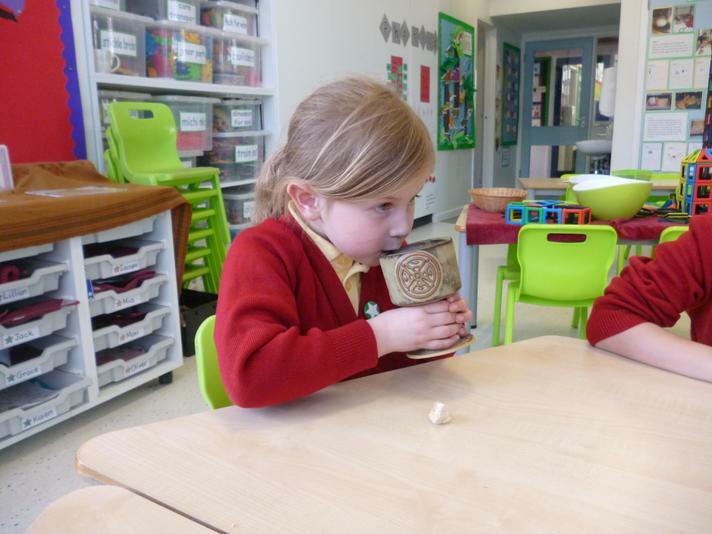 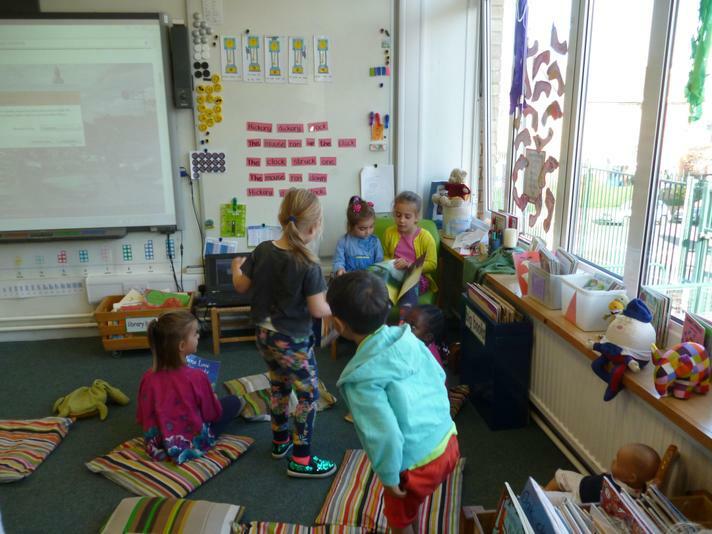 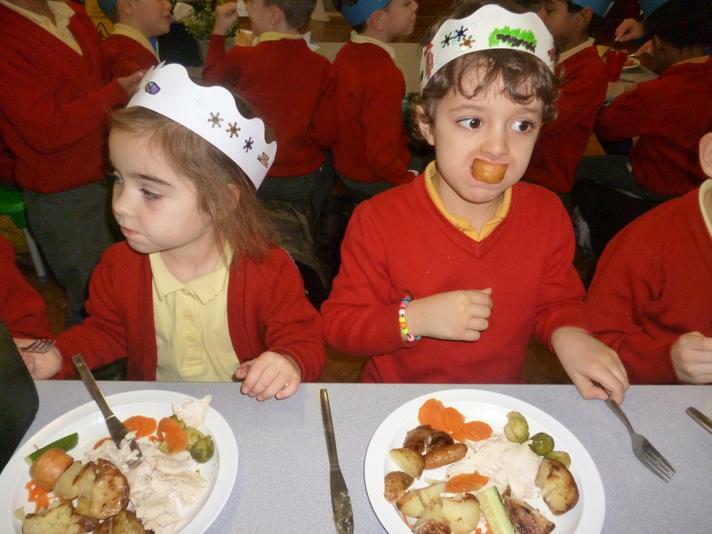 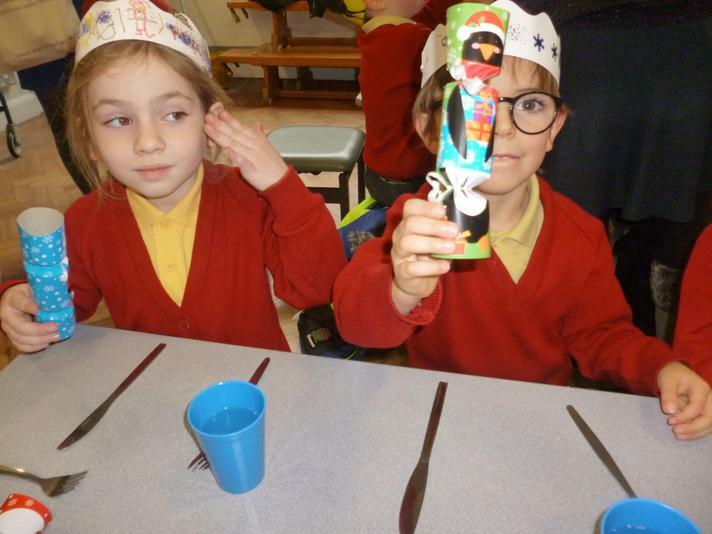 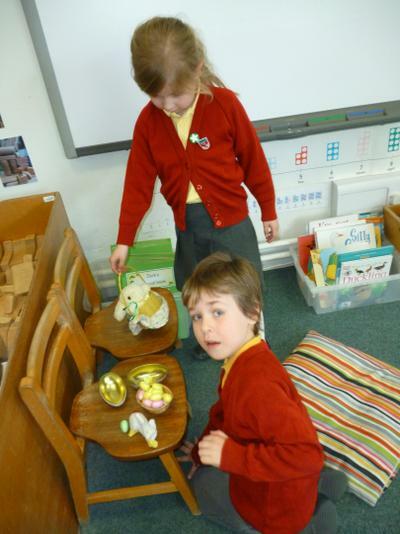 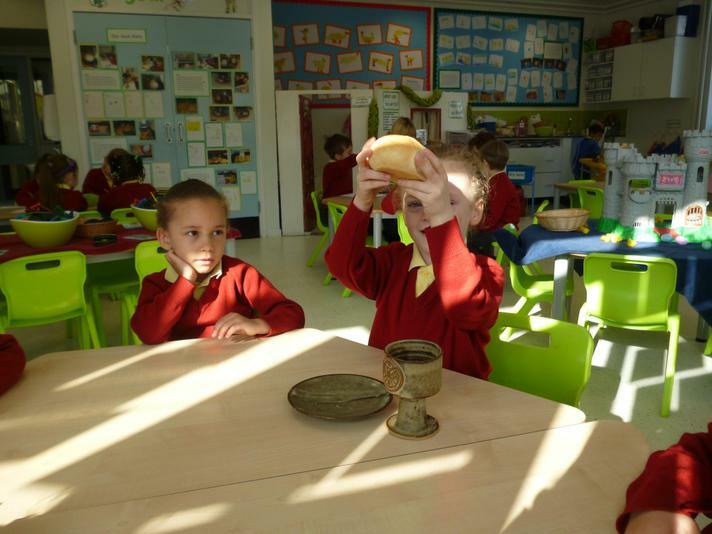 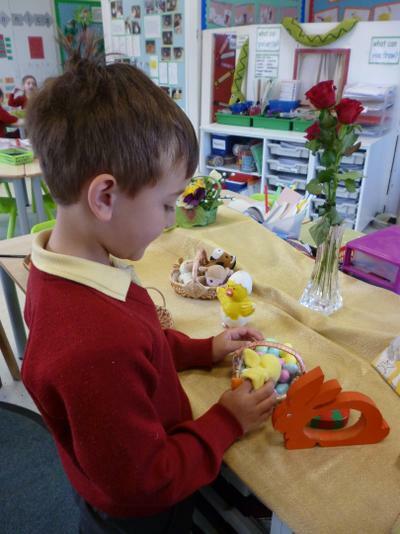 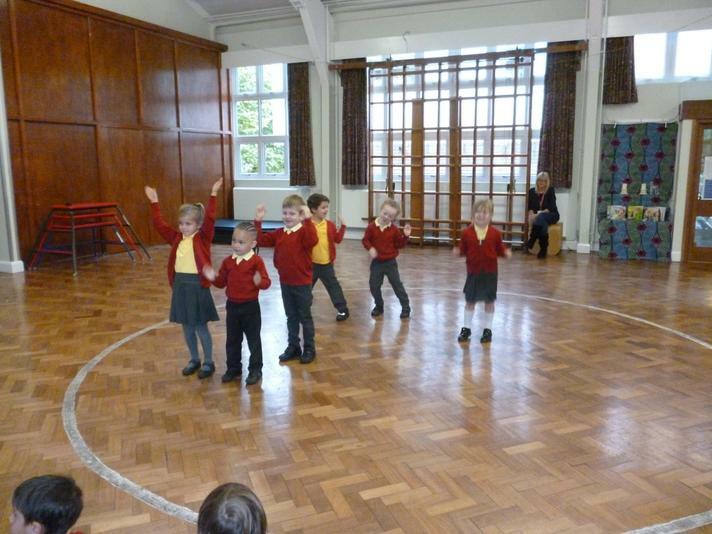 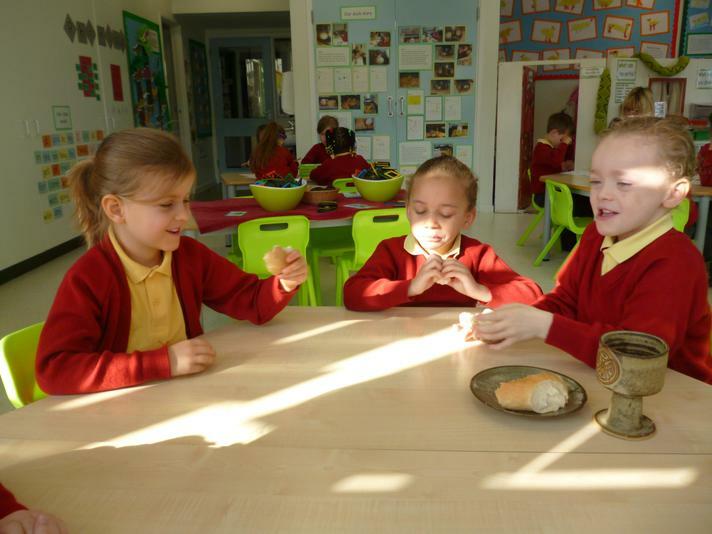 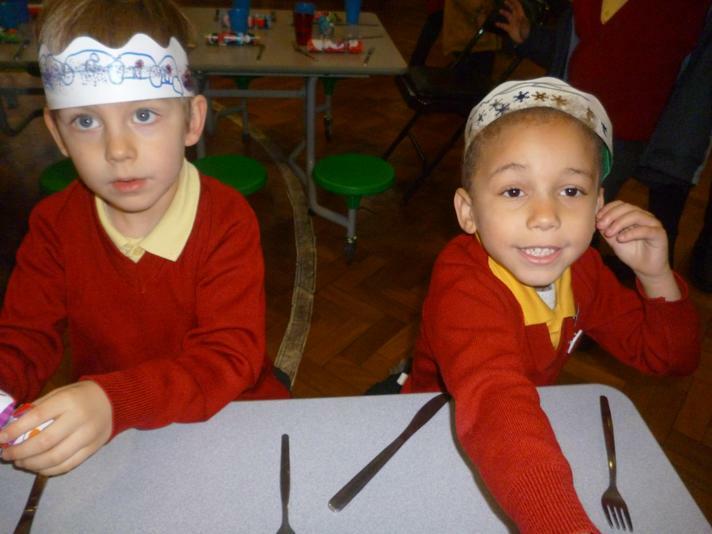 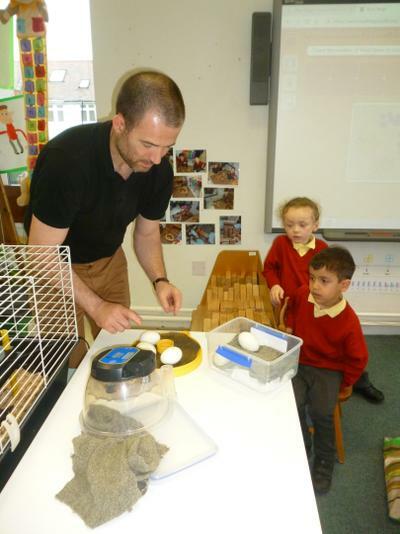 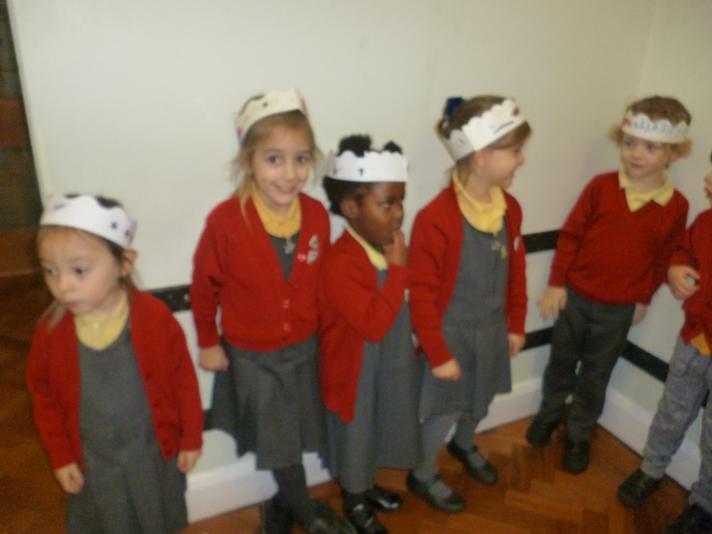 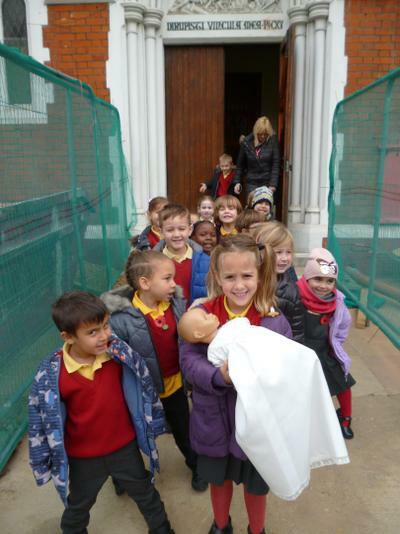 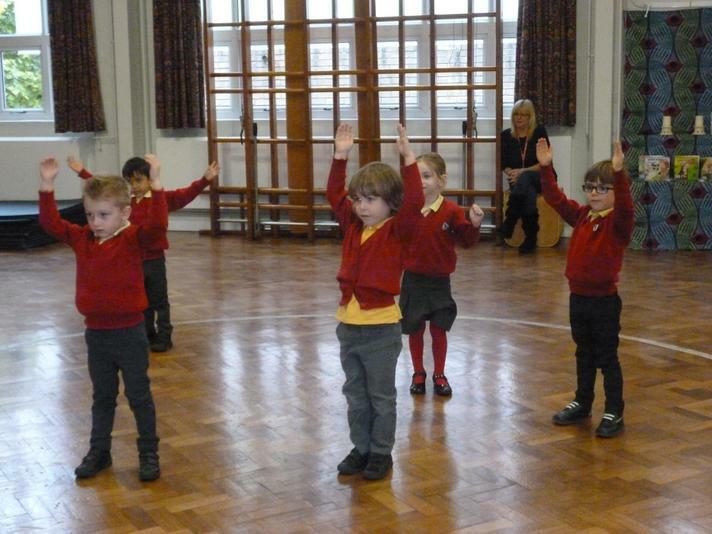 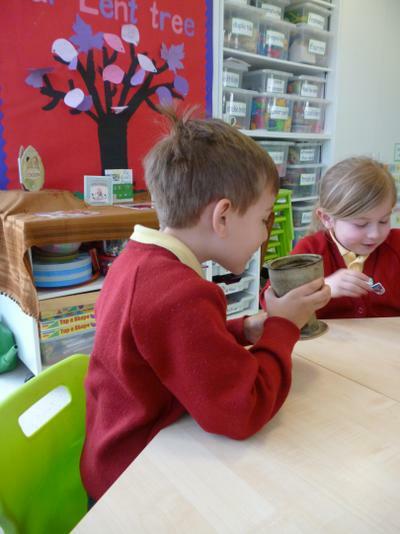 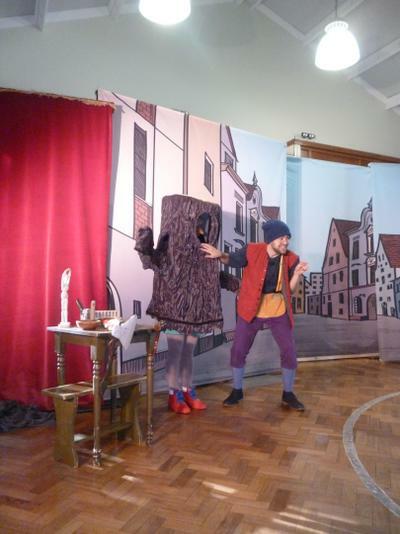 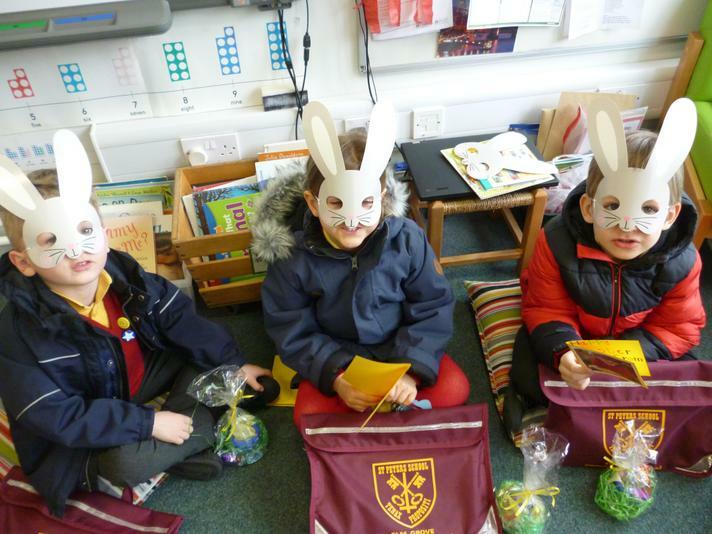 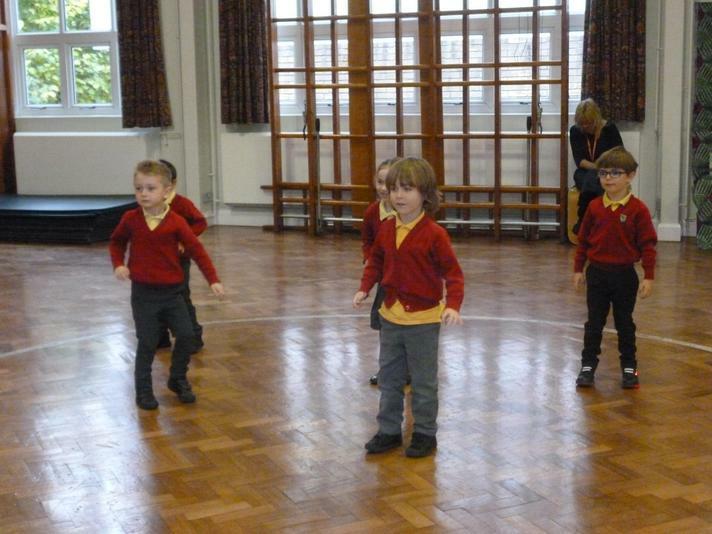 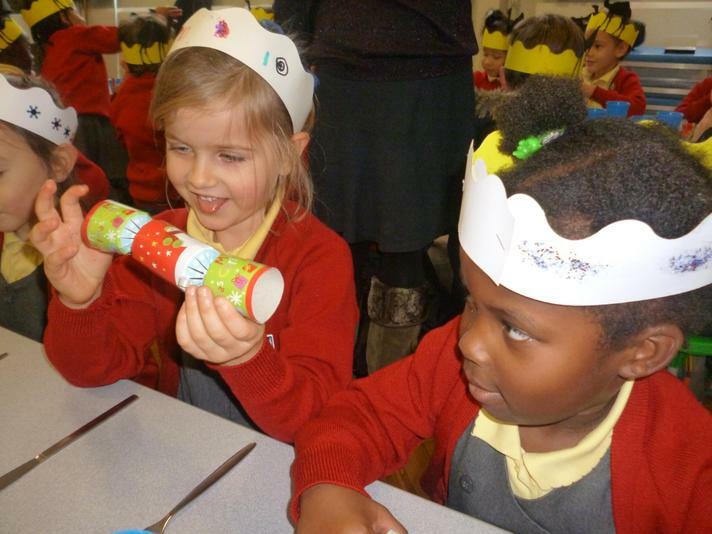 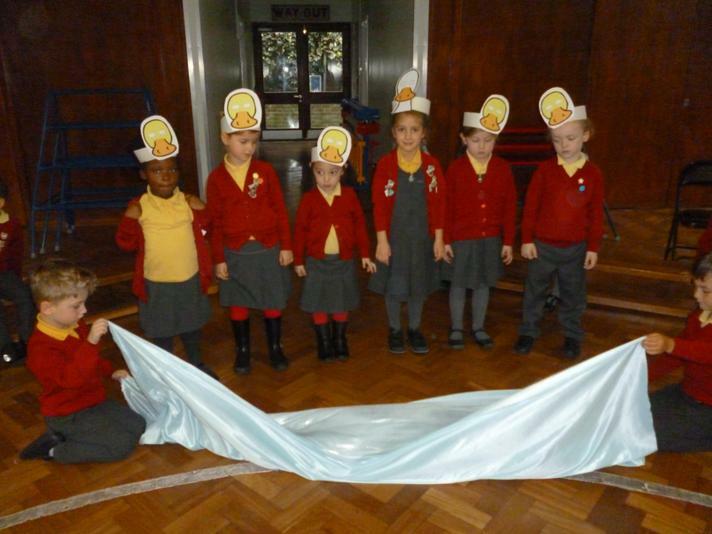 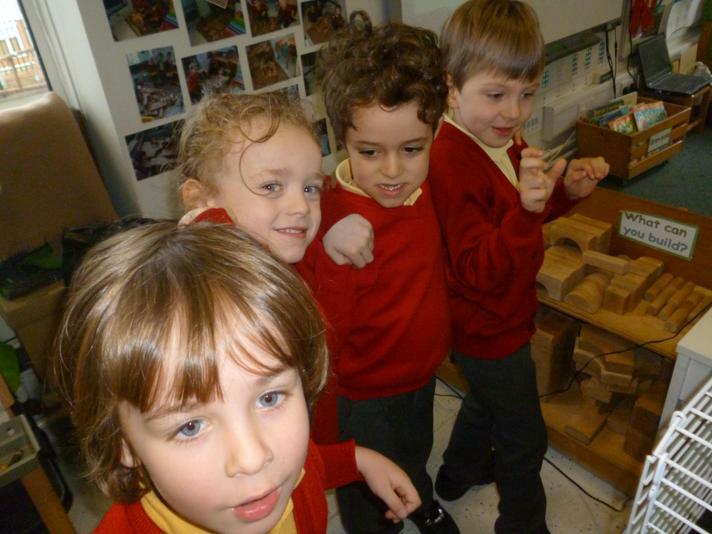 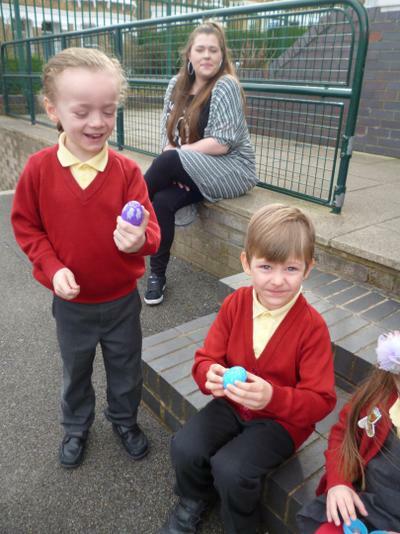 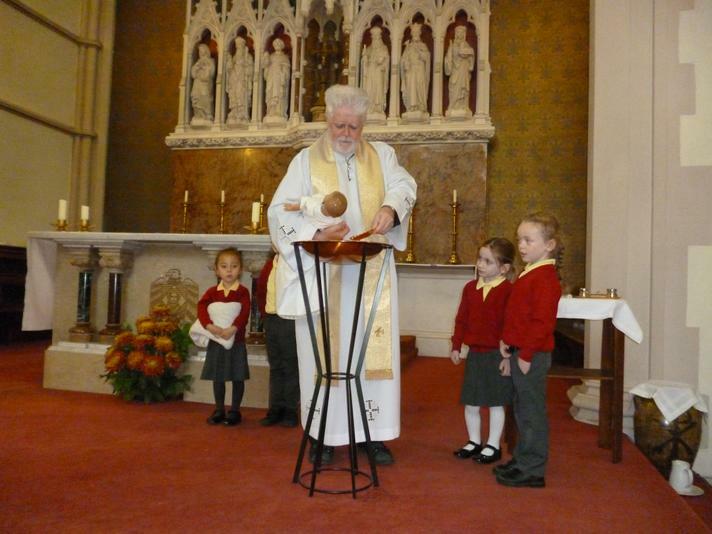 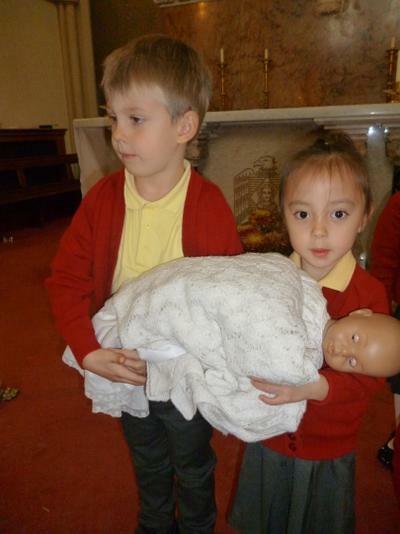 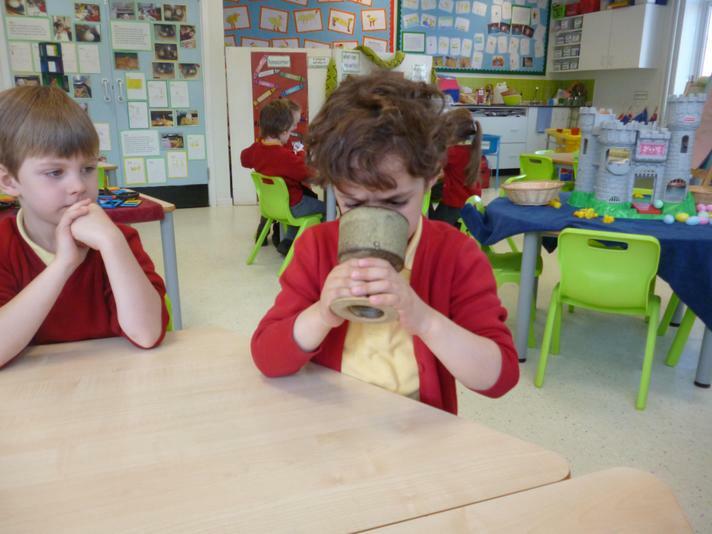 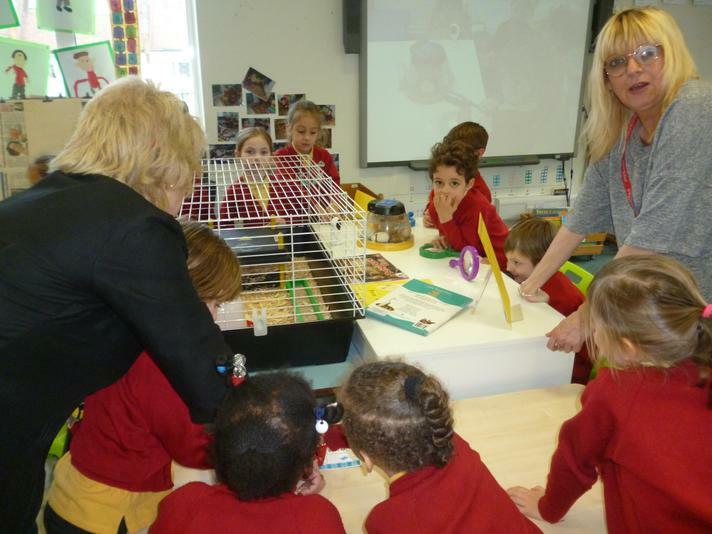 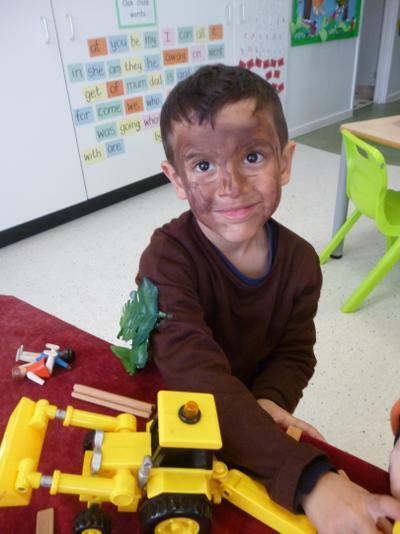 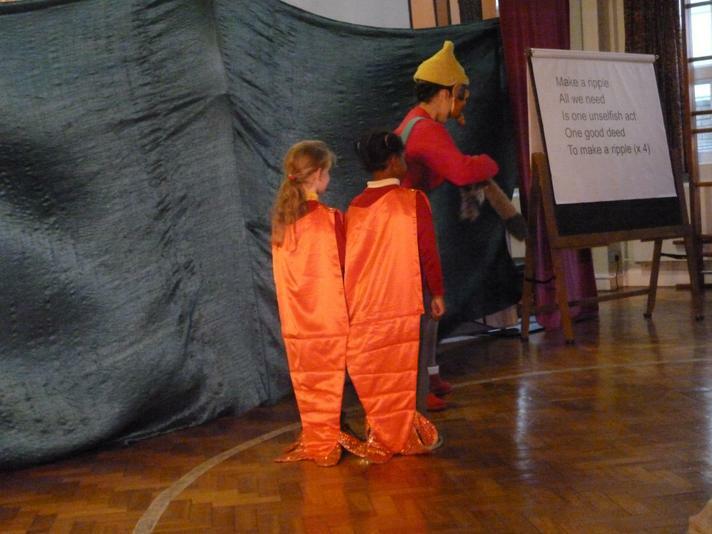 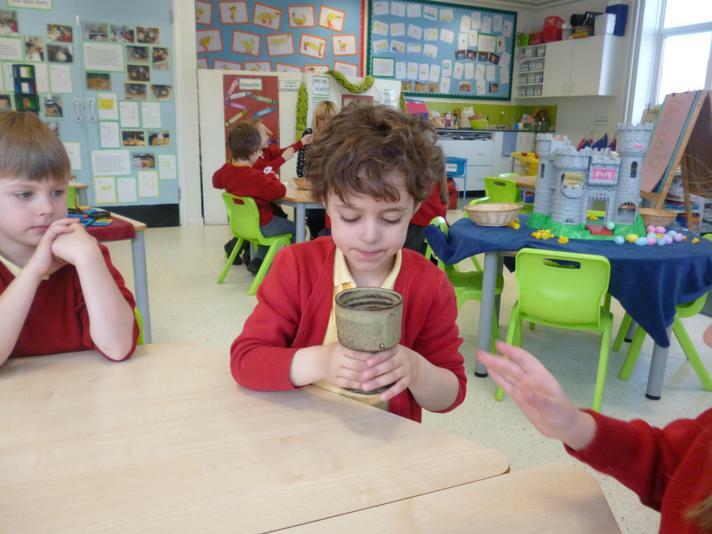 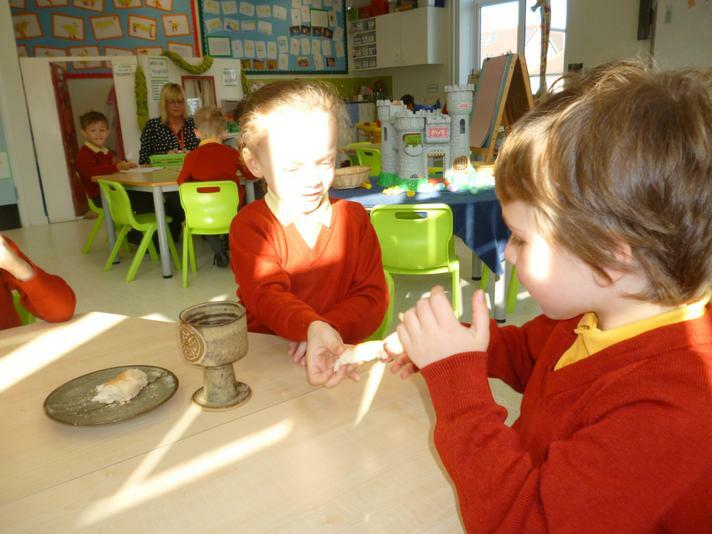 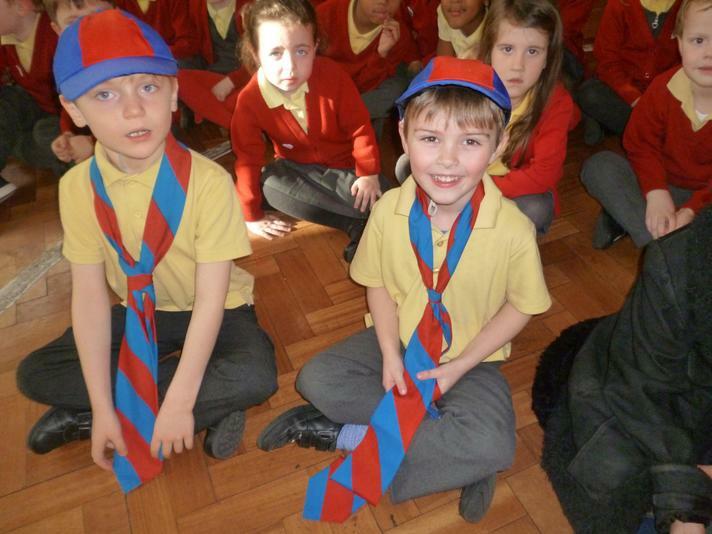 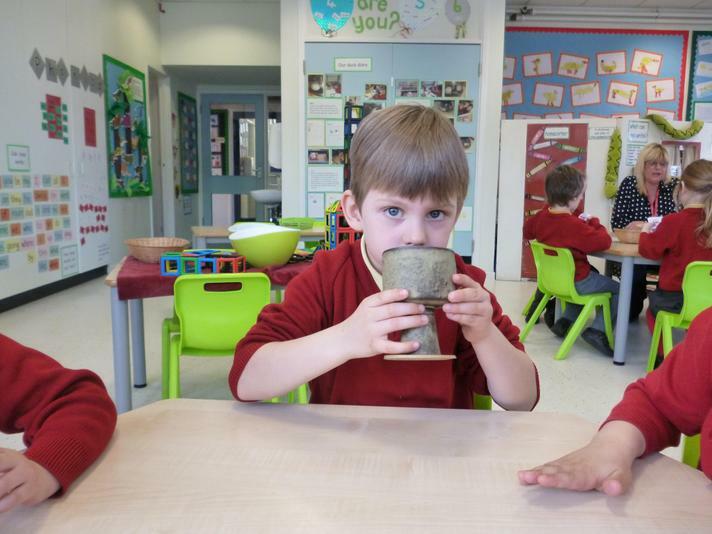 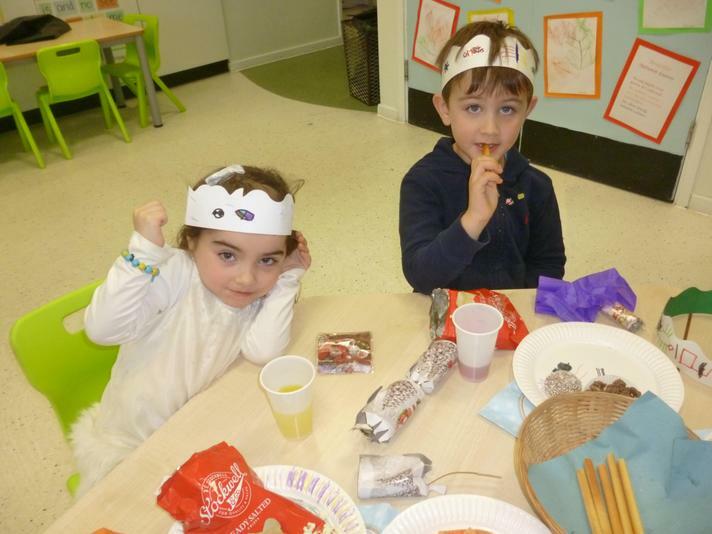 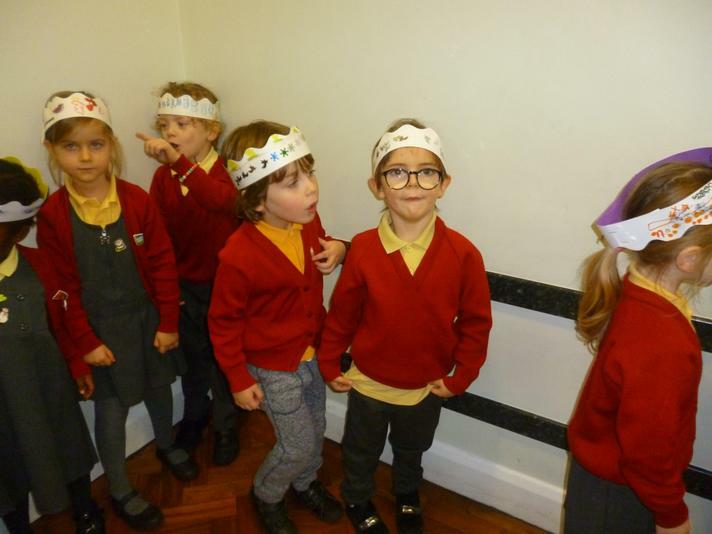 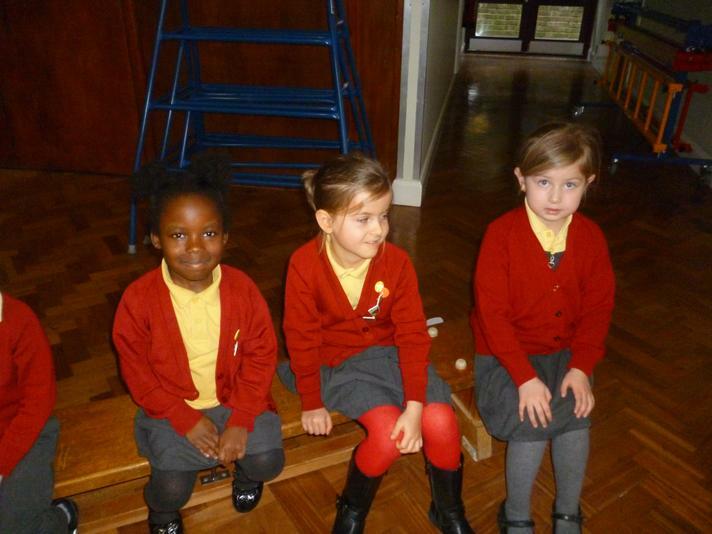 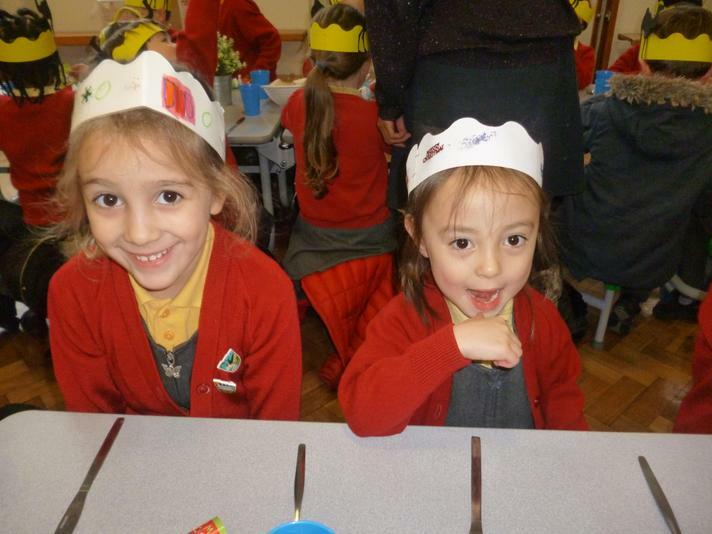 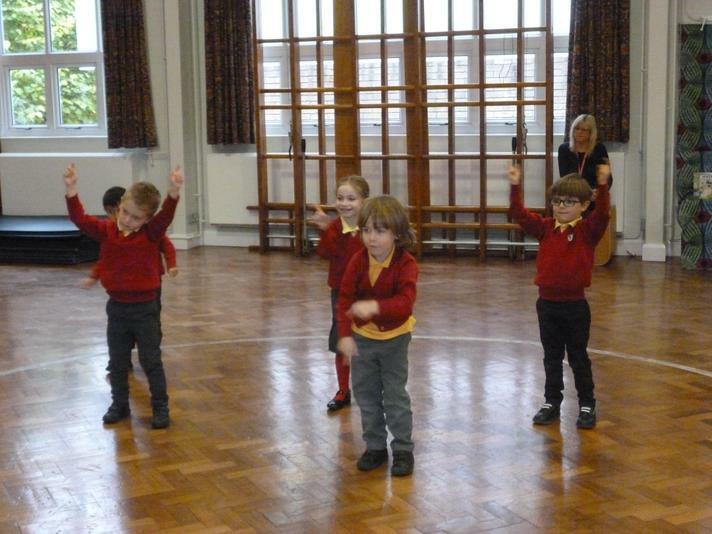 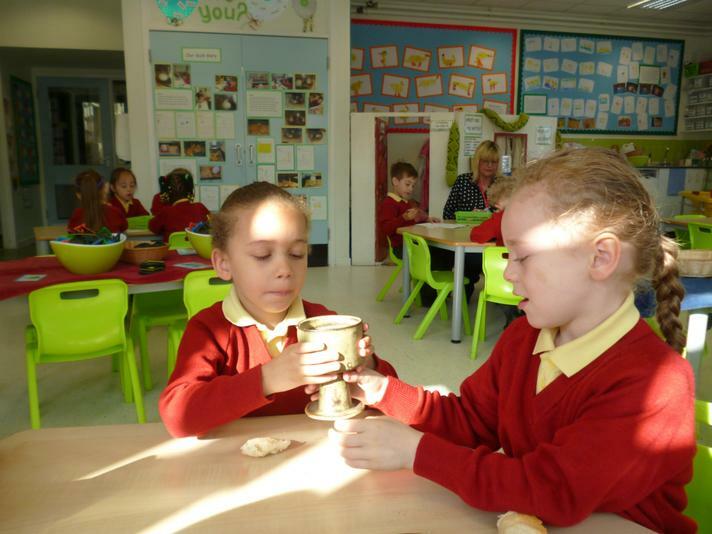 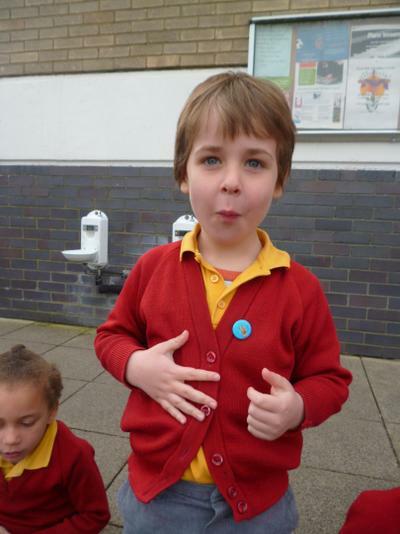 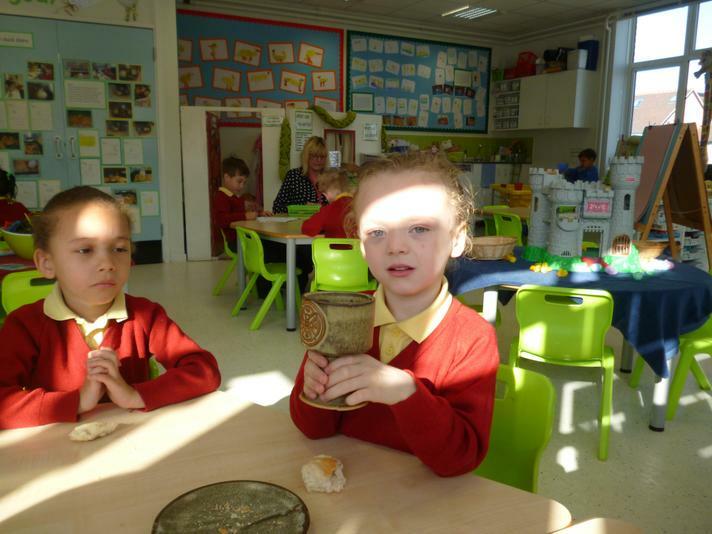 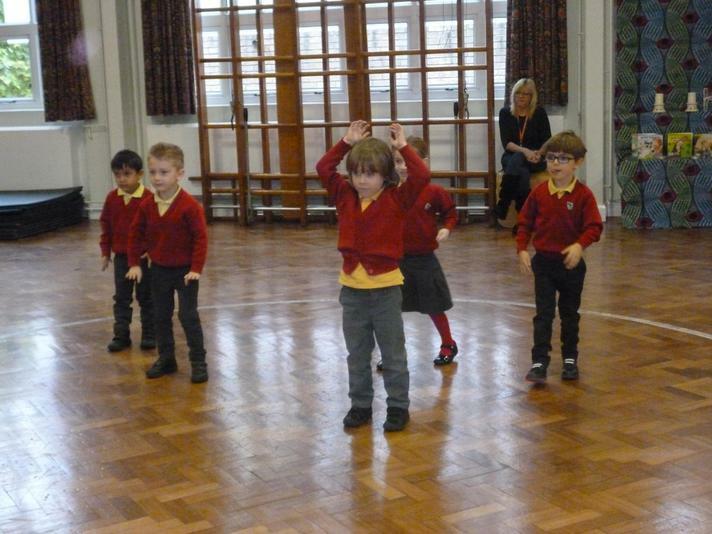 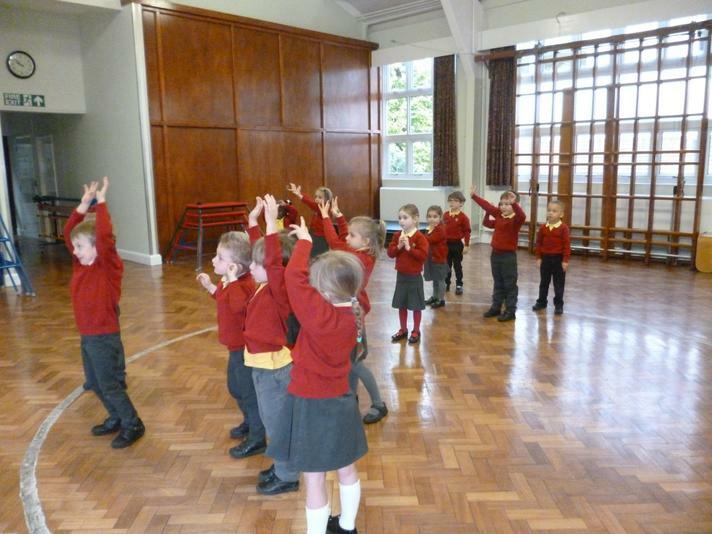 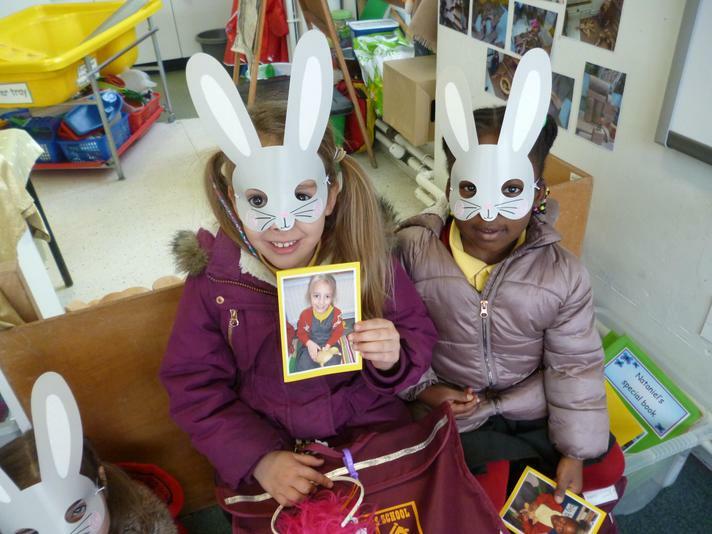 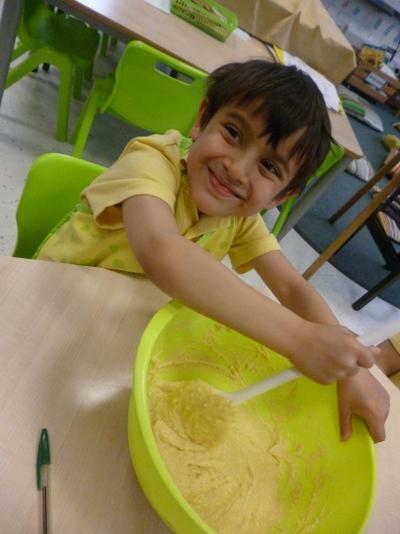 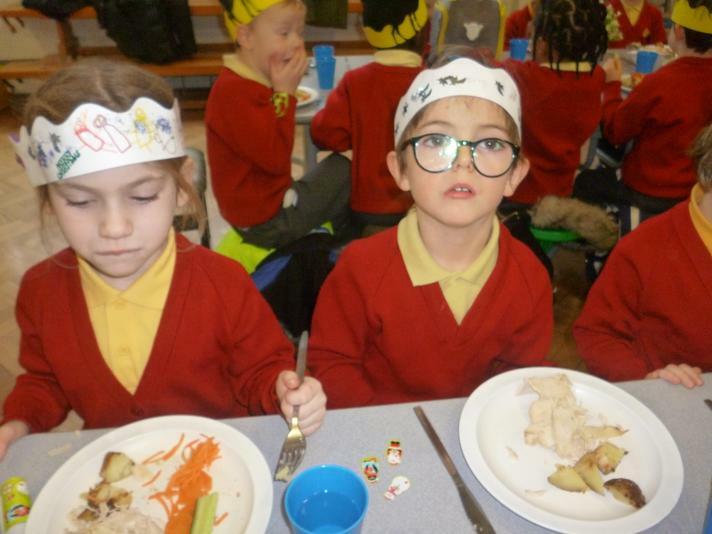 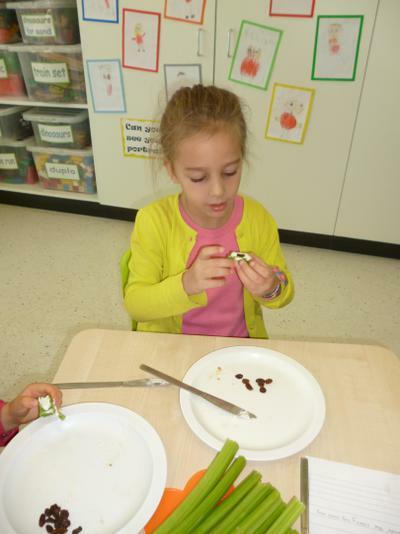 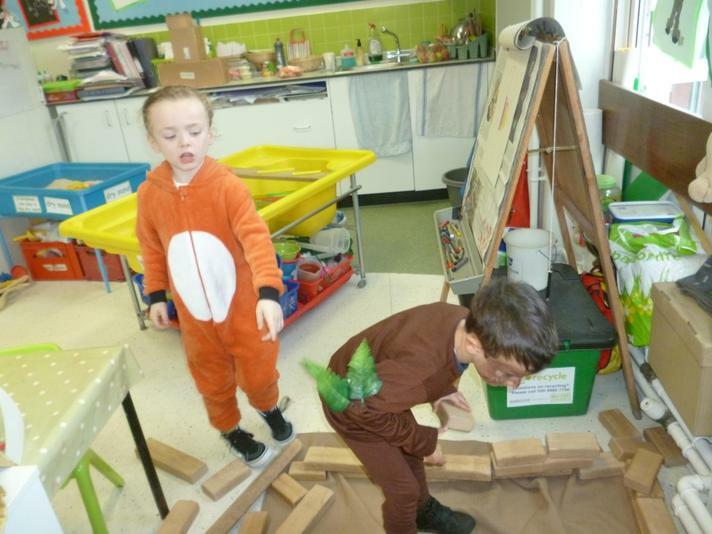 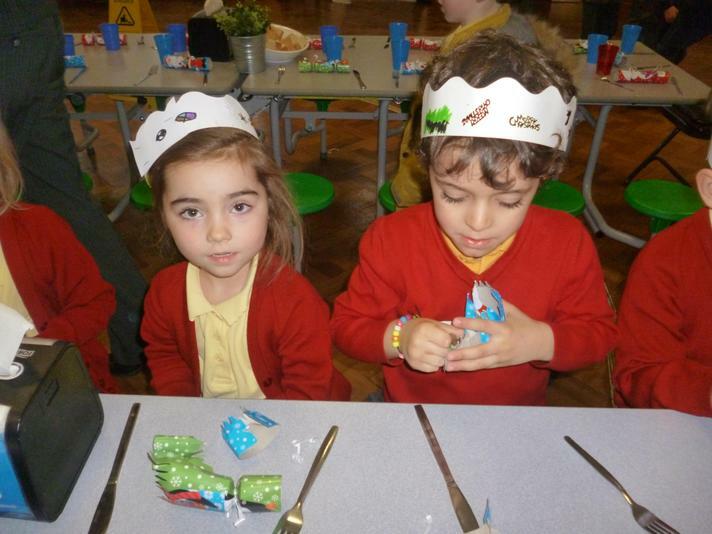 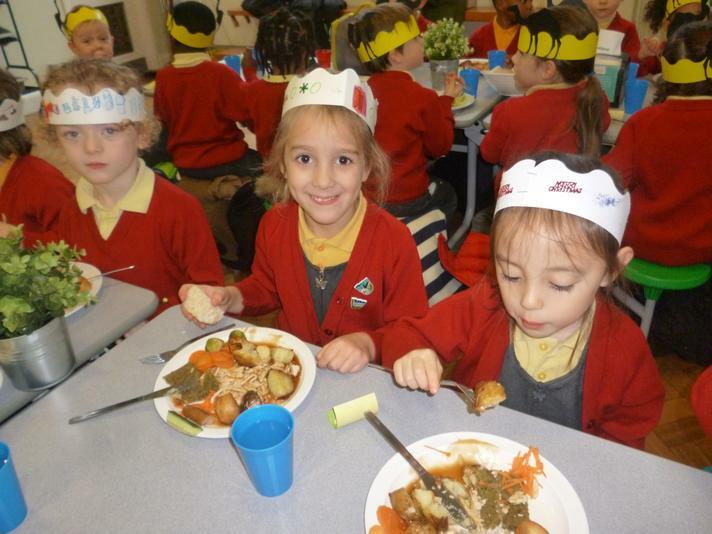 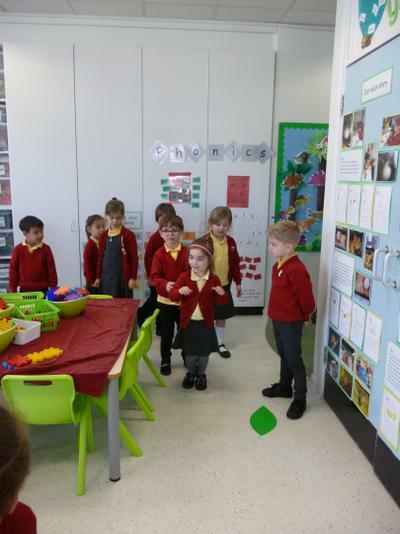 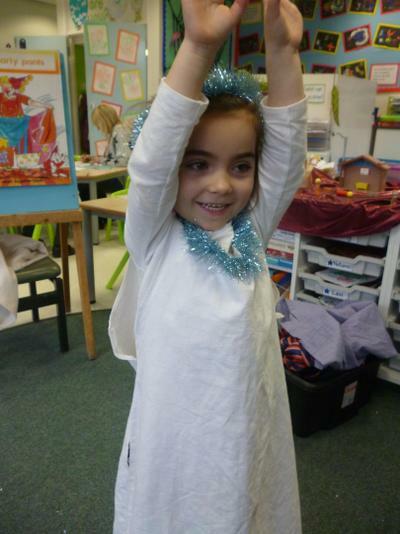 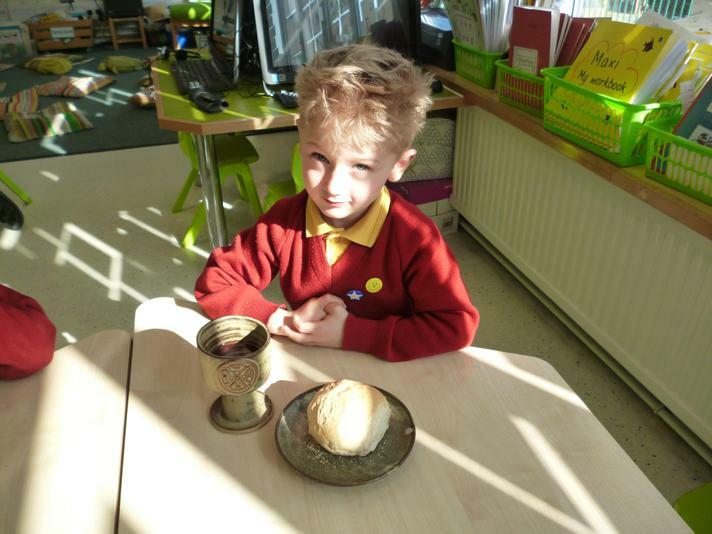 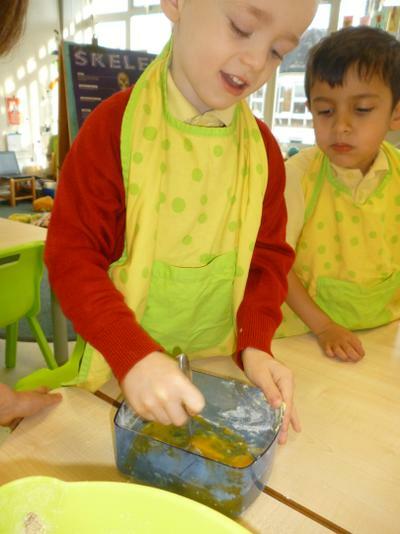 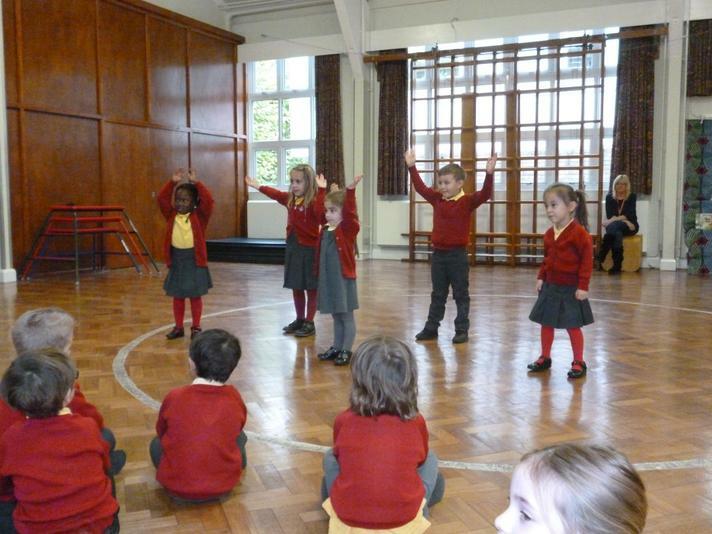 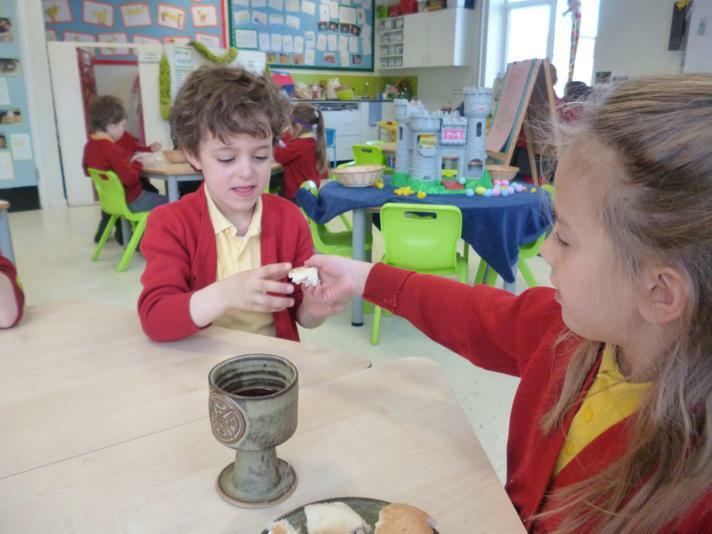 Easter story and Easter fun, we have been acting out the story of the first Easter. 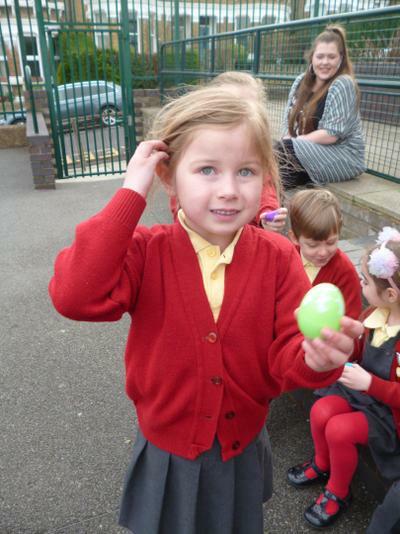 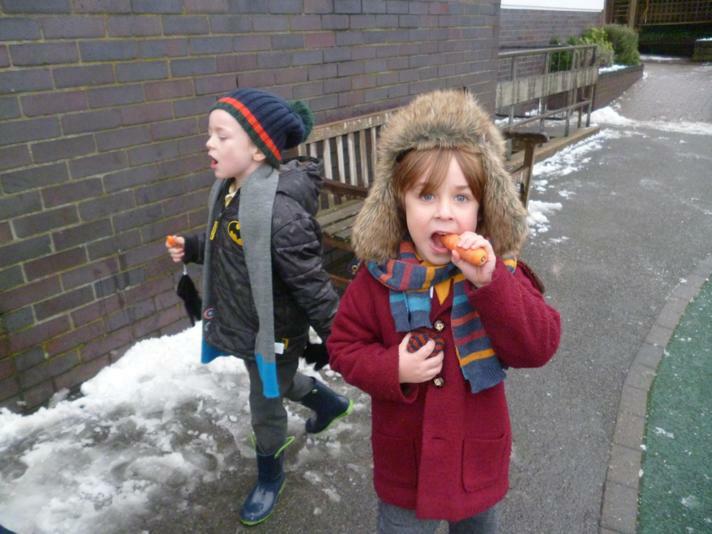 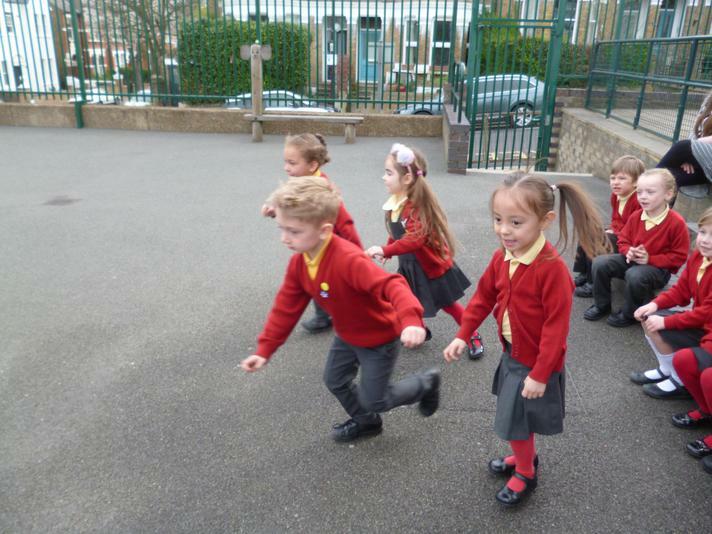 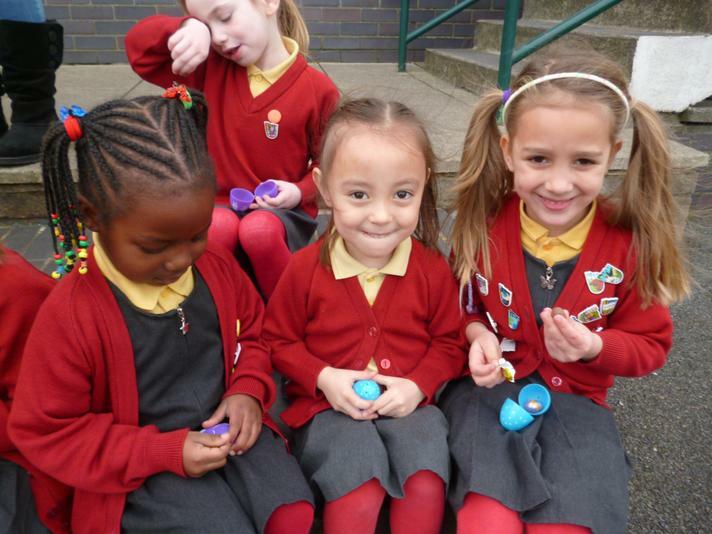 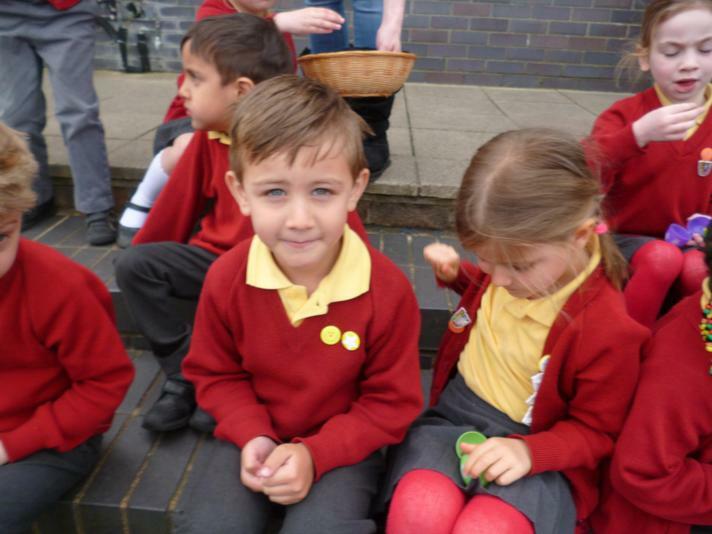 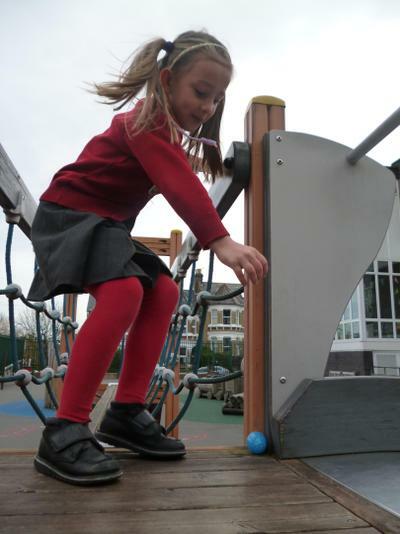 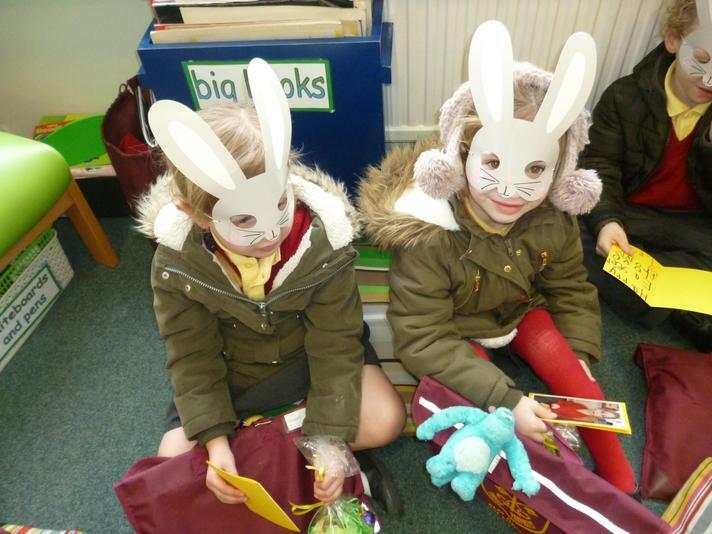 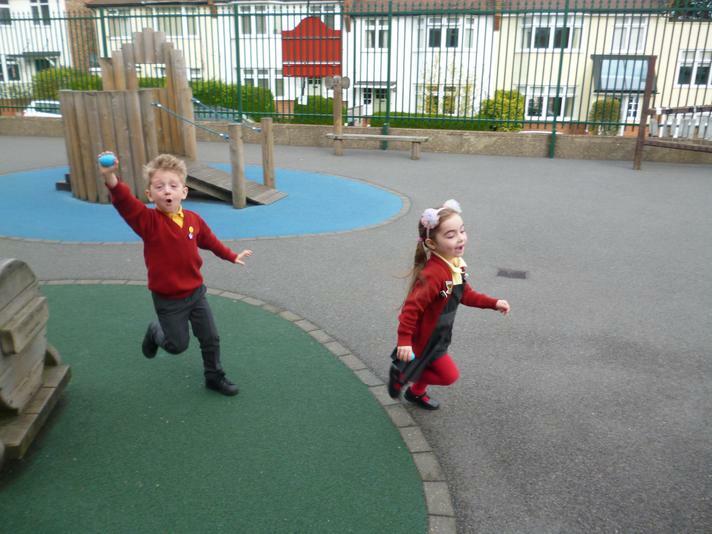 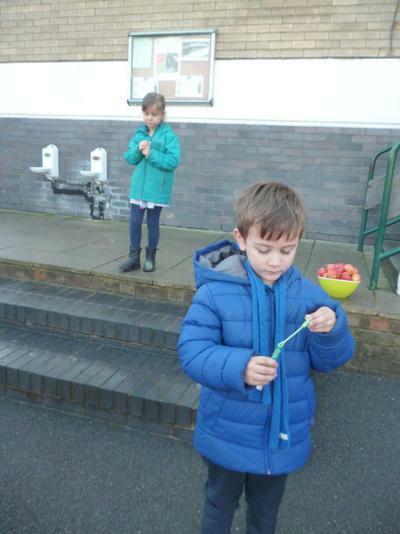 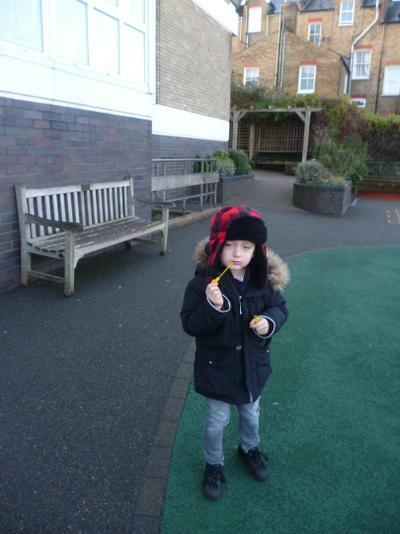 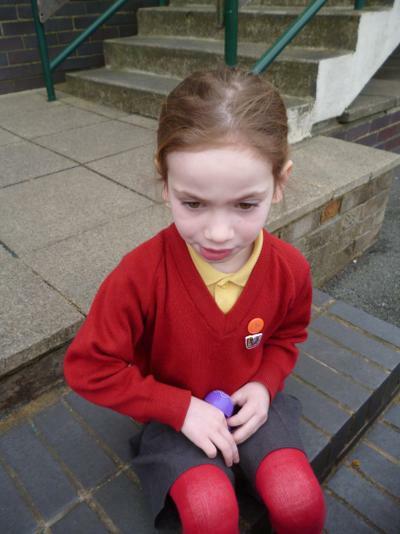 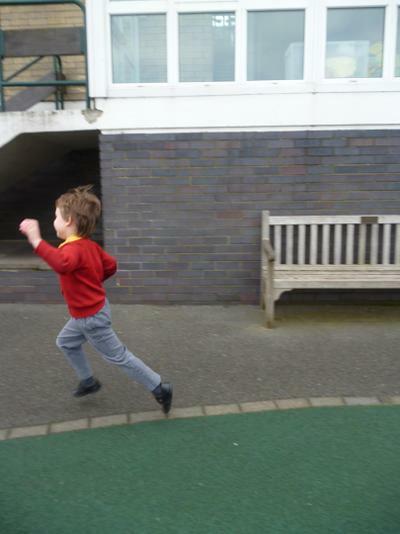 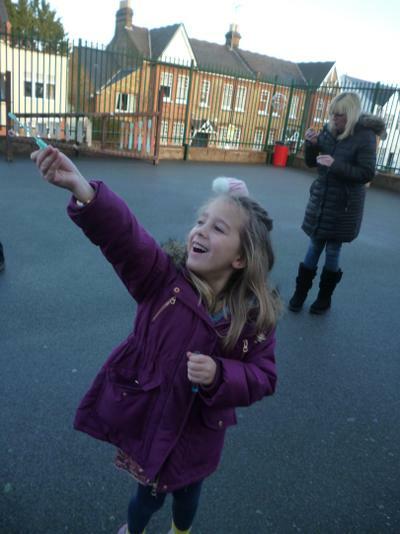 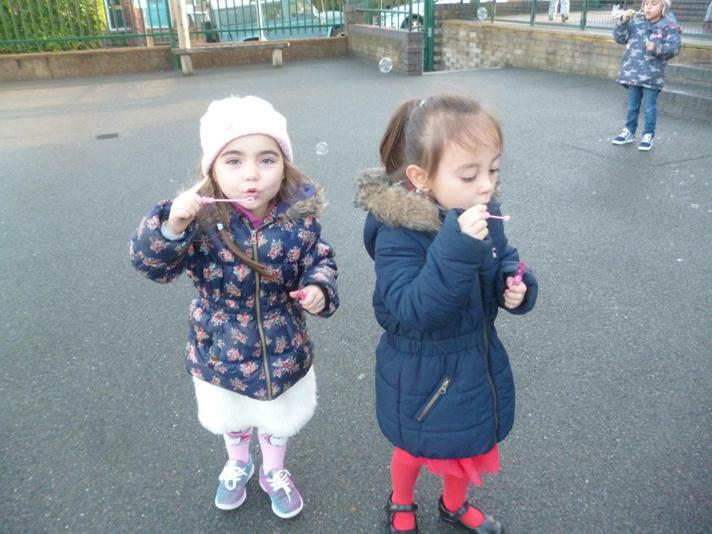 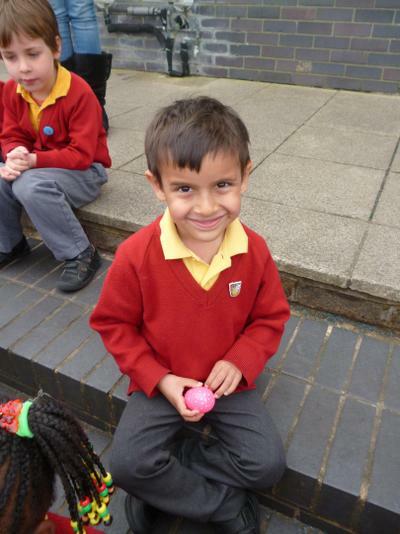 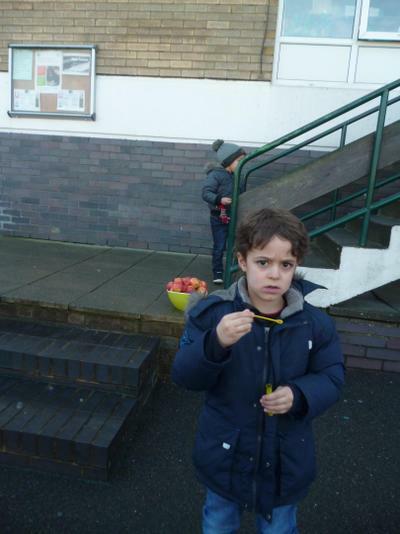 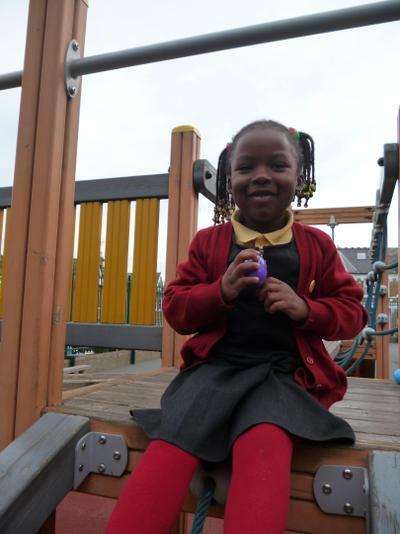 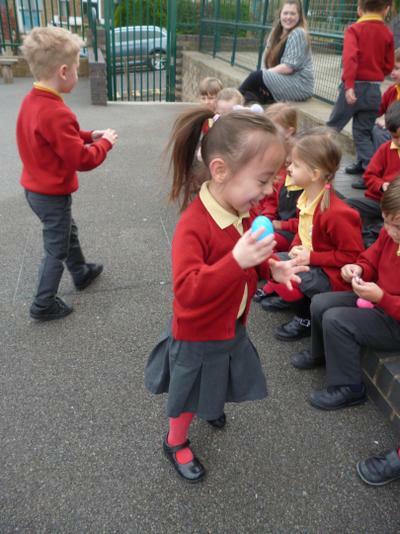 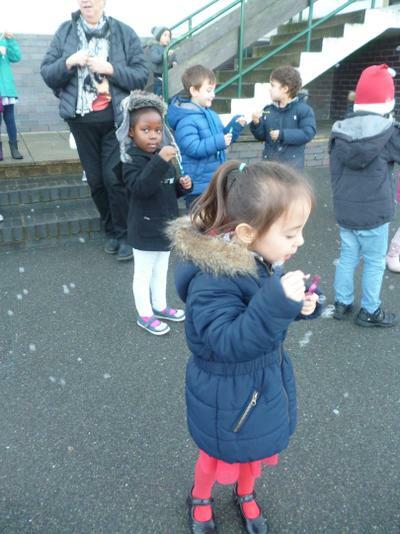 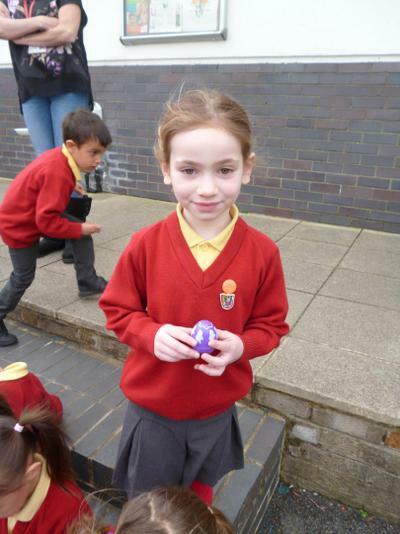 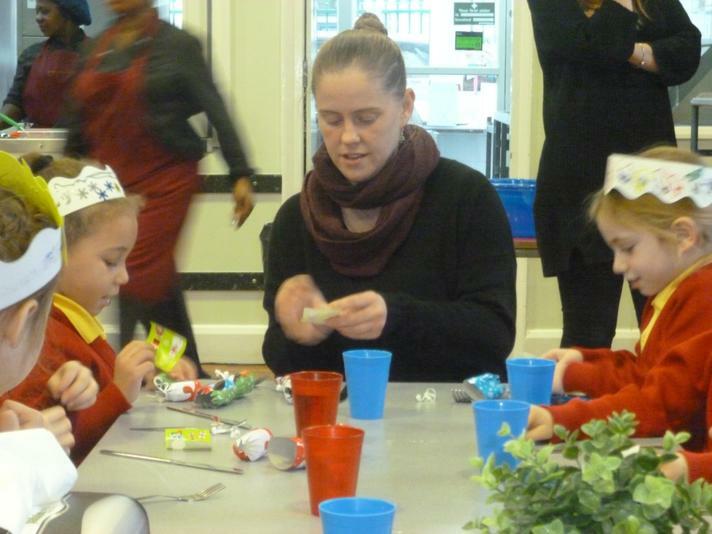 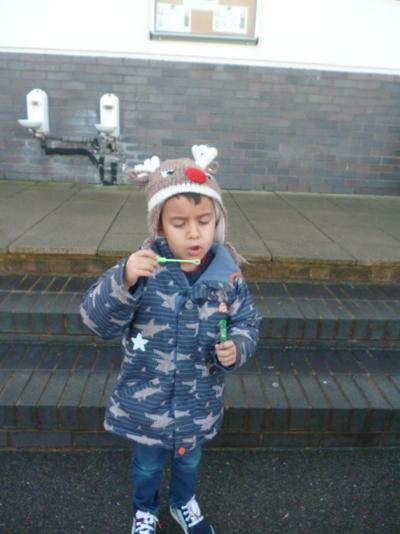 We had lots of fun on the last day of term with an Easter egg hunt and lots of treats. 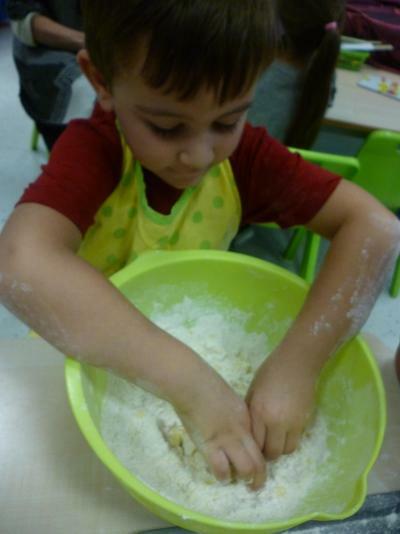 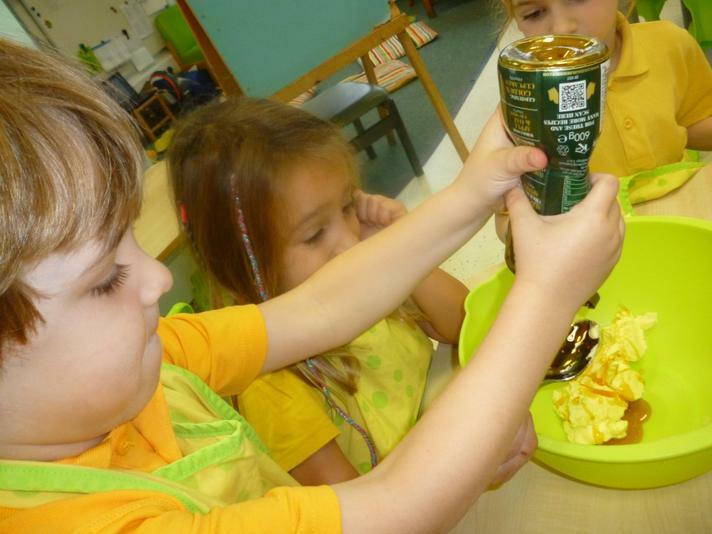 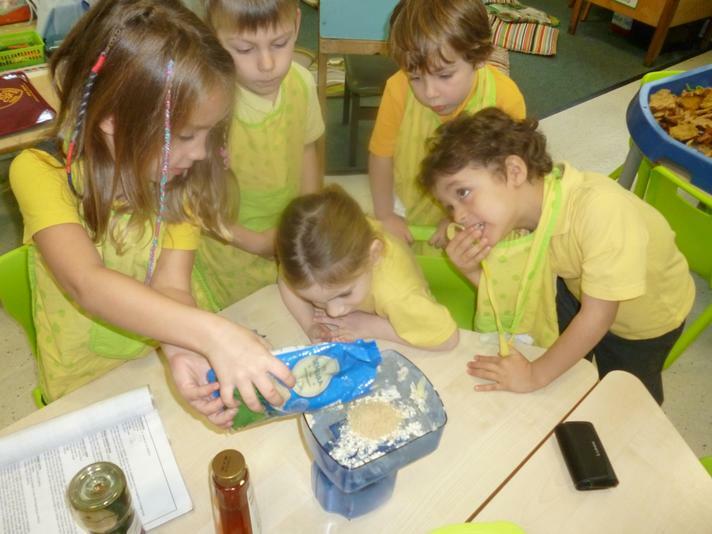 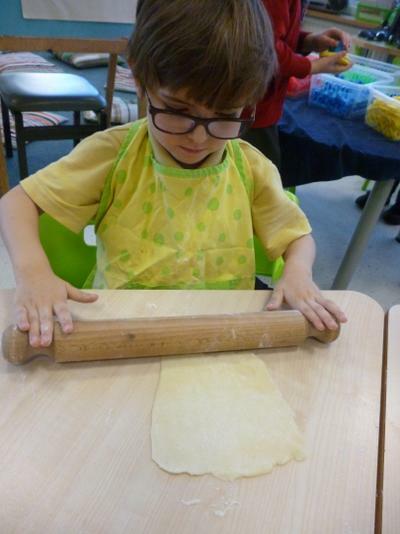 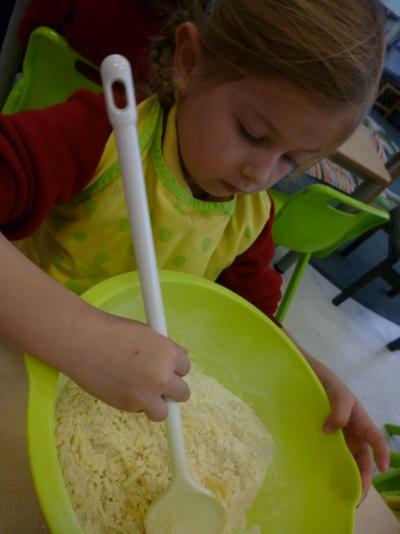 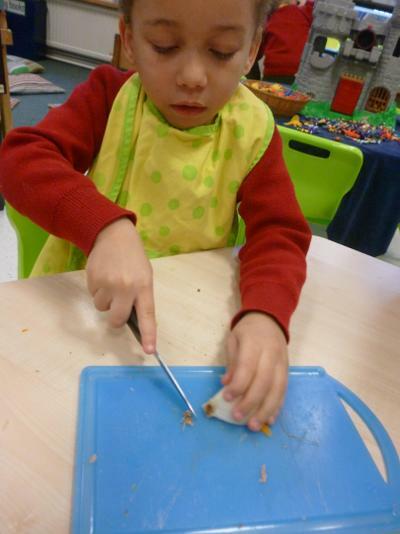 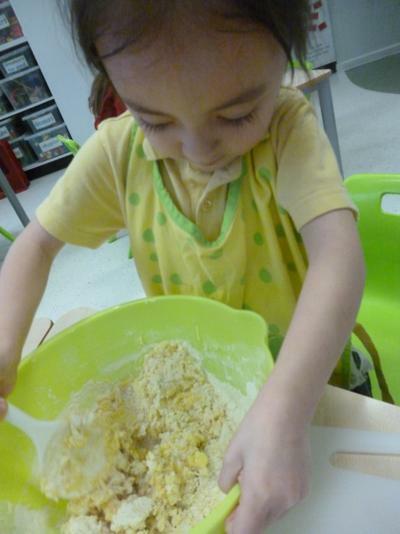 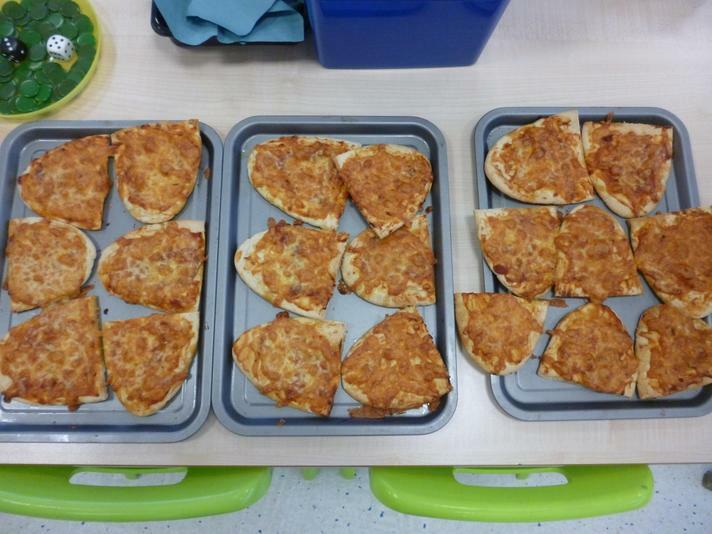 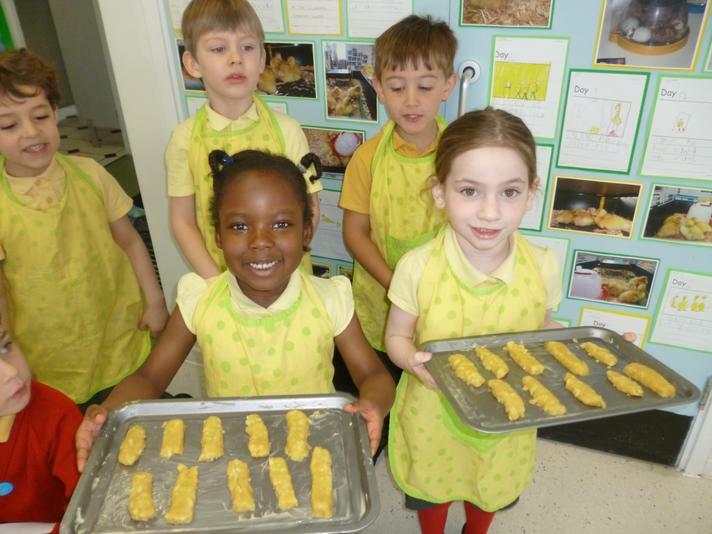 Cheese straws- Today our cooks were Alexander, Dione, Max, Natatniel and Casey. 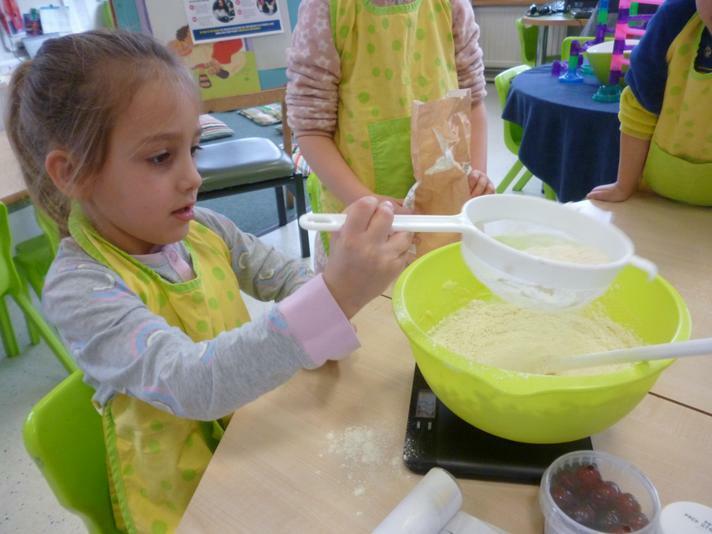 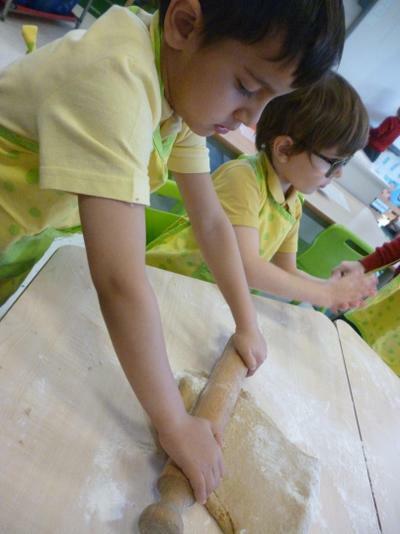 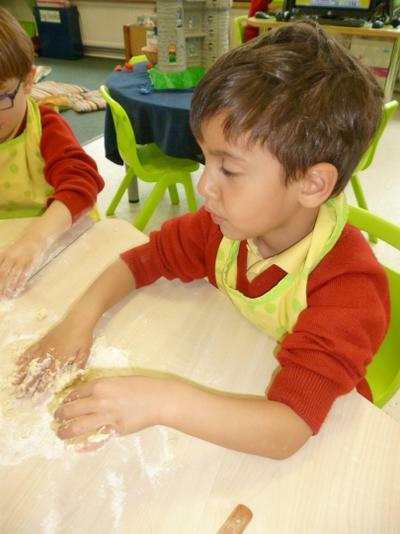 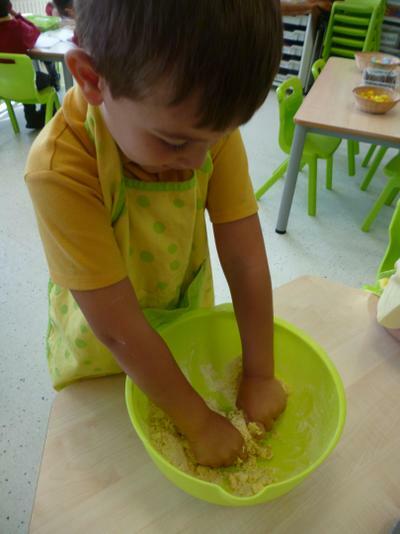 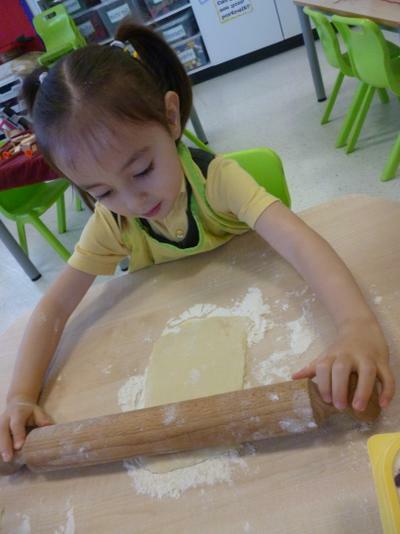 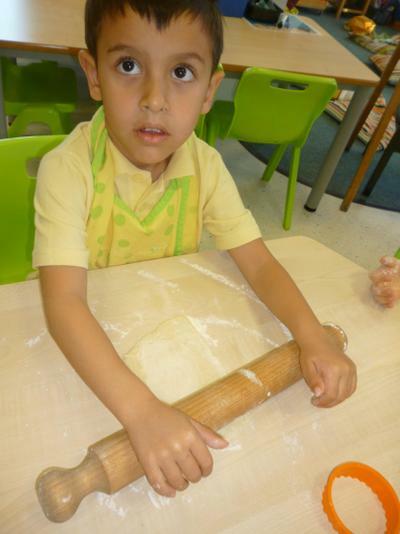 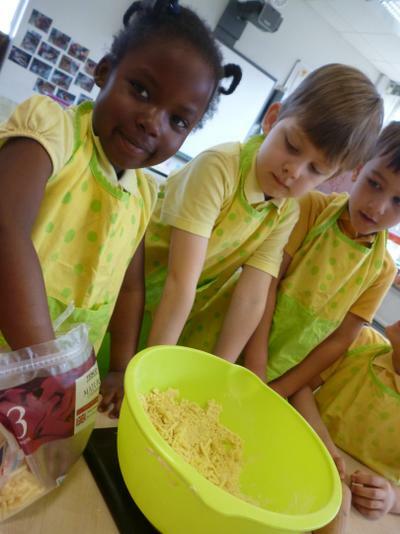 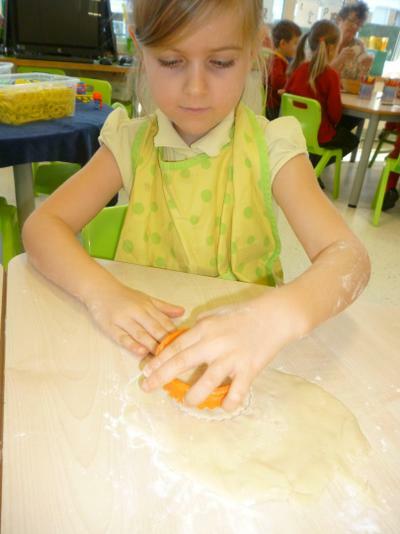 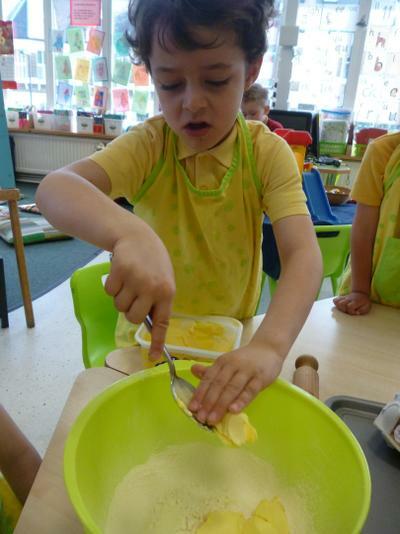 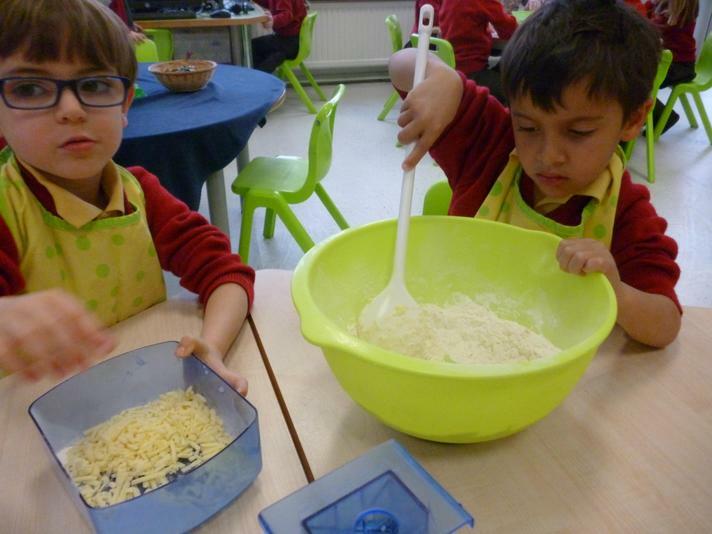 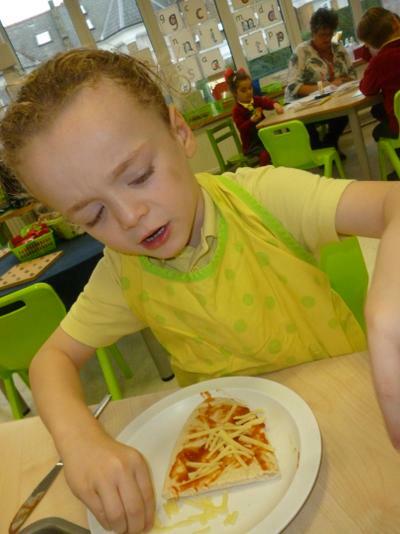 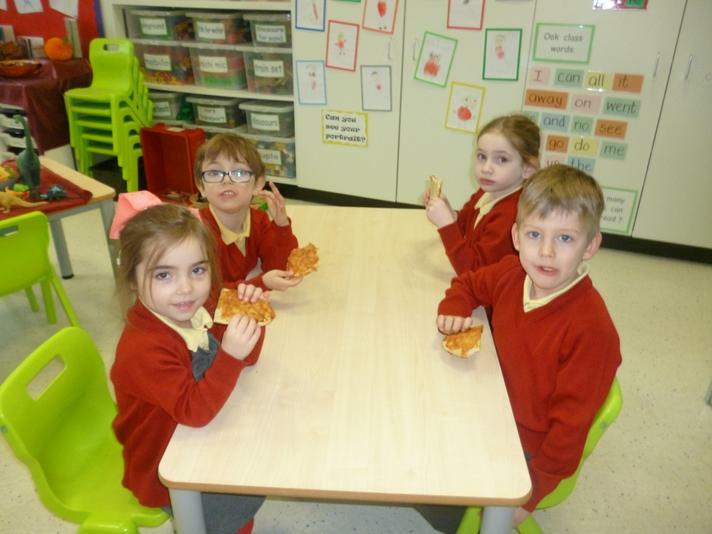 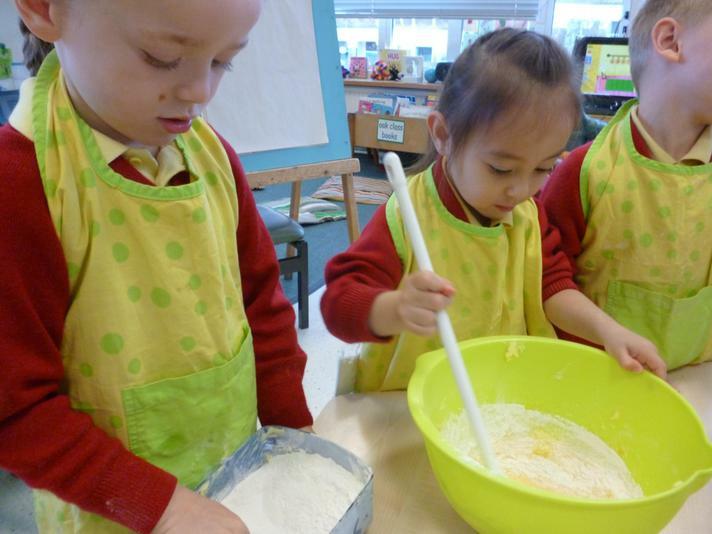 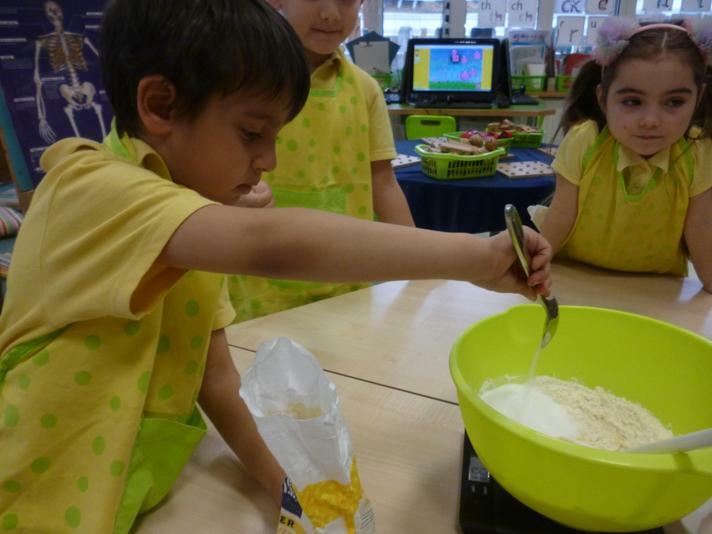 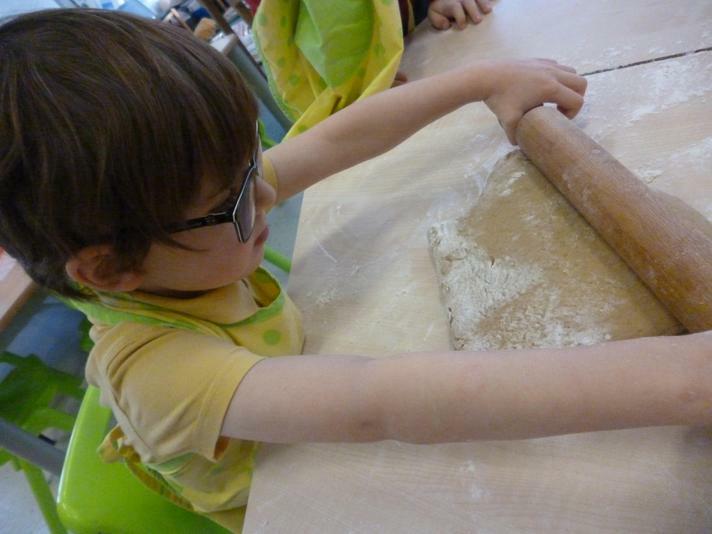 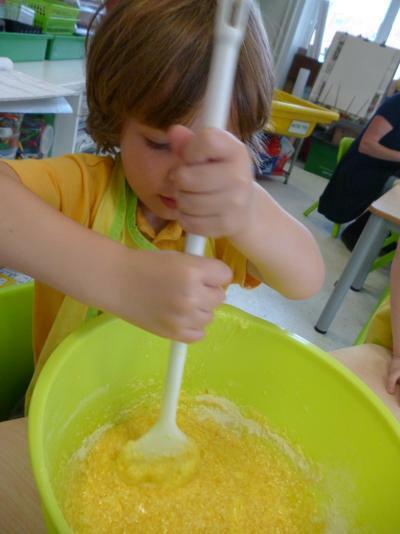 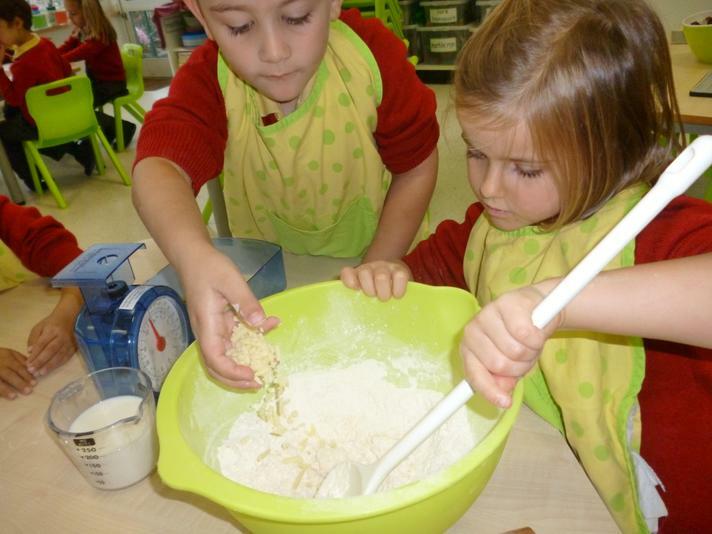 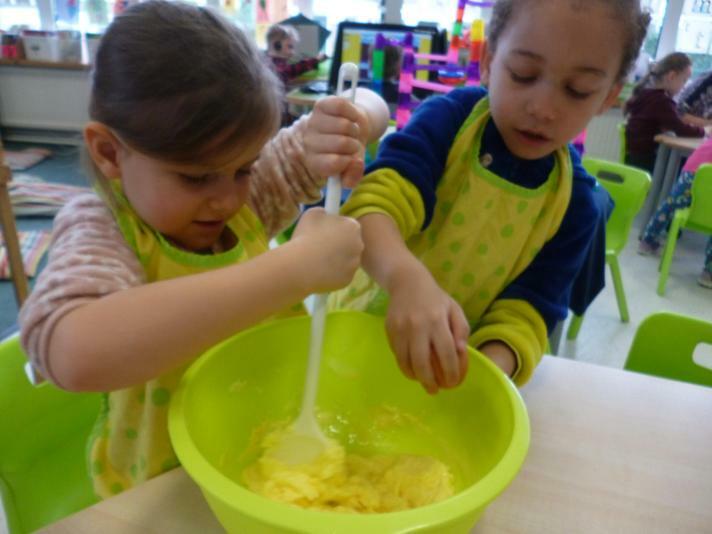 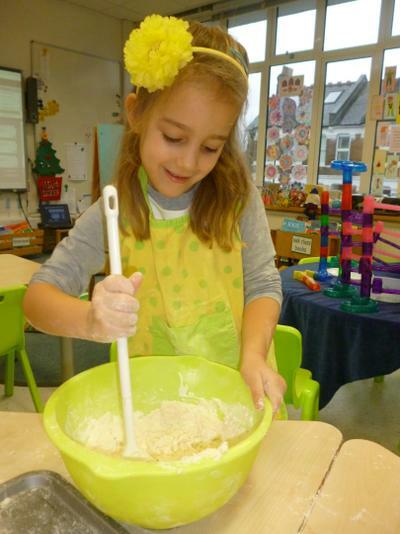 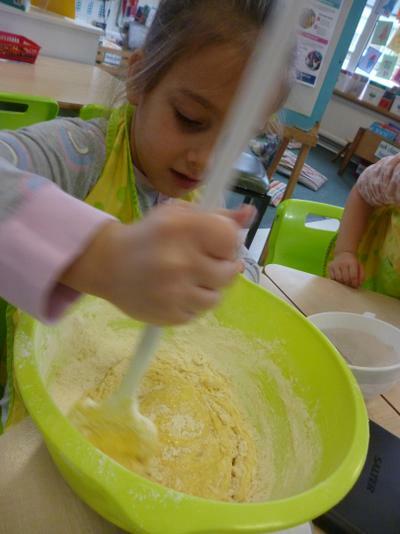 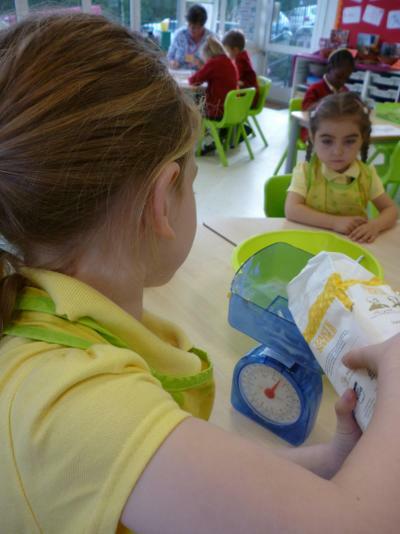 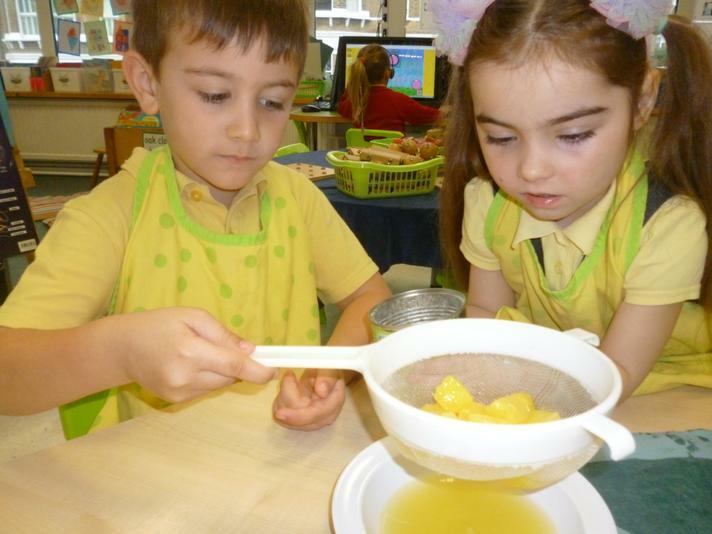 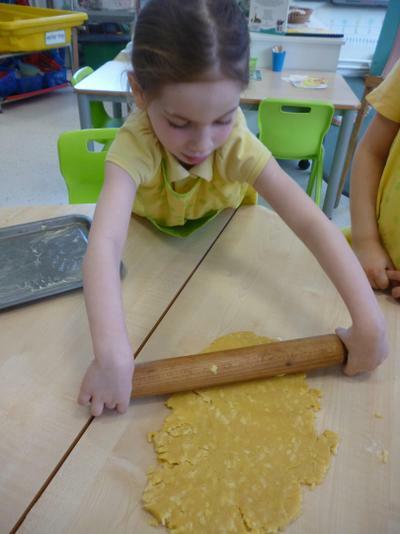 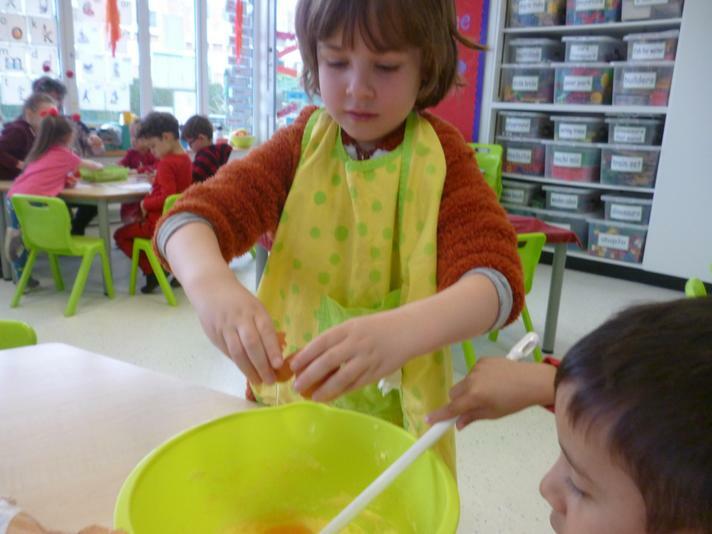 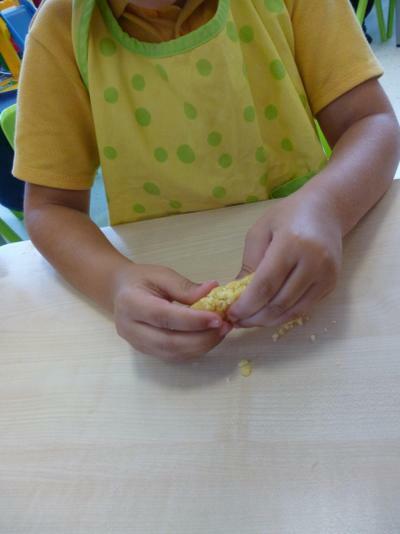 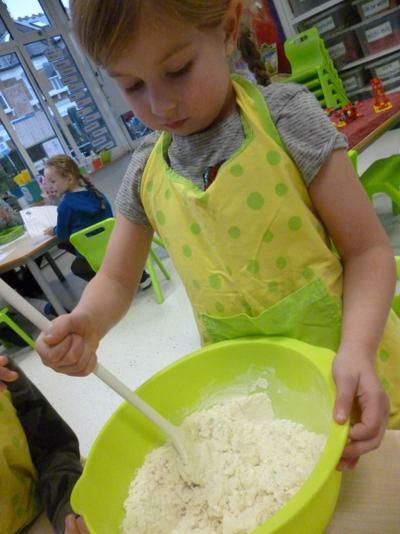 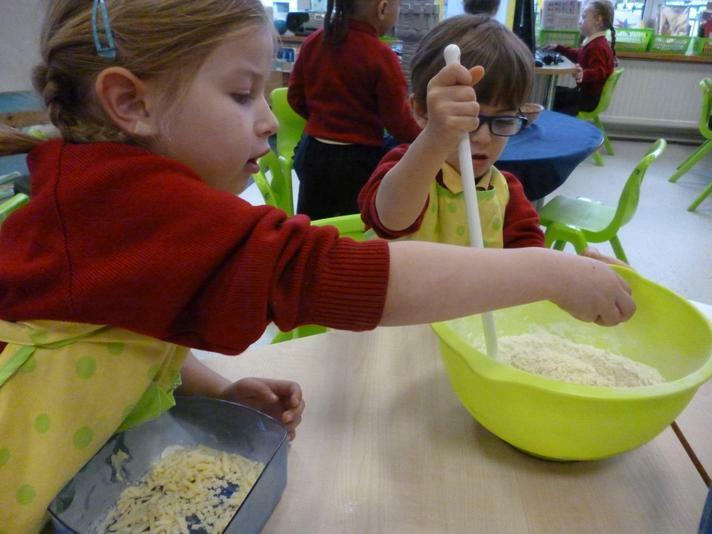 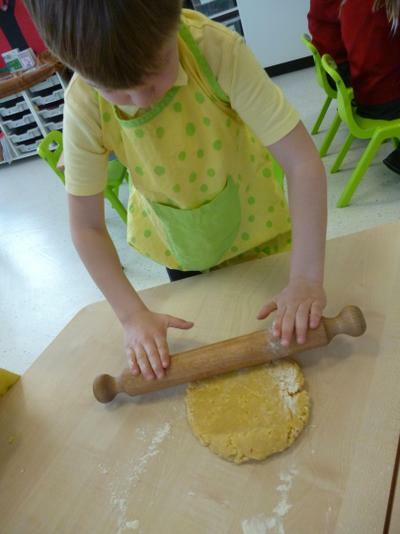 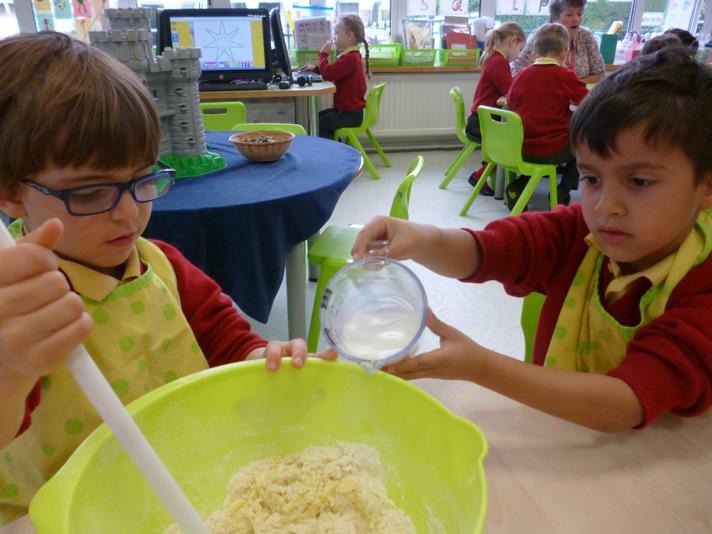 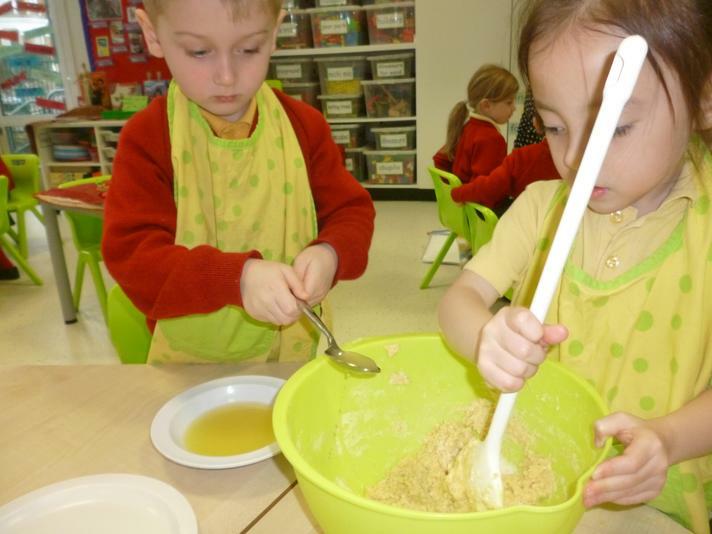 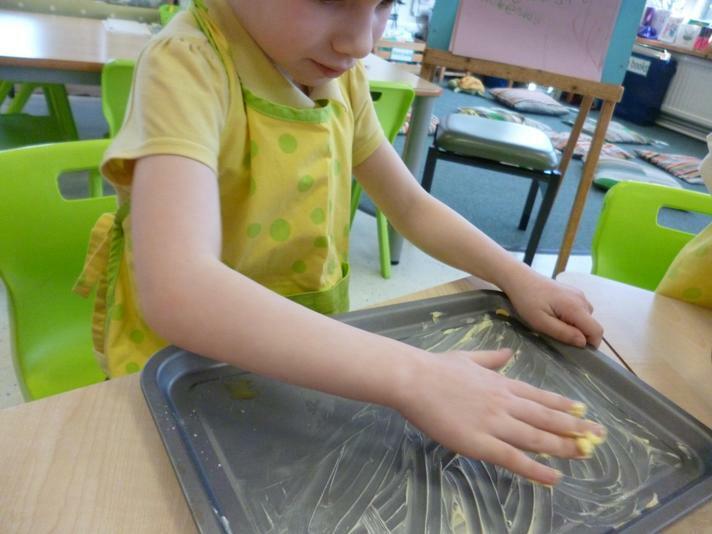 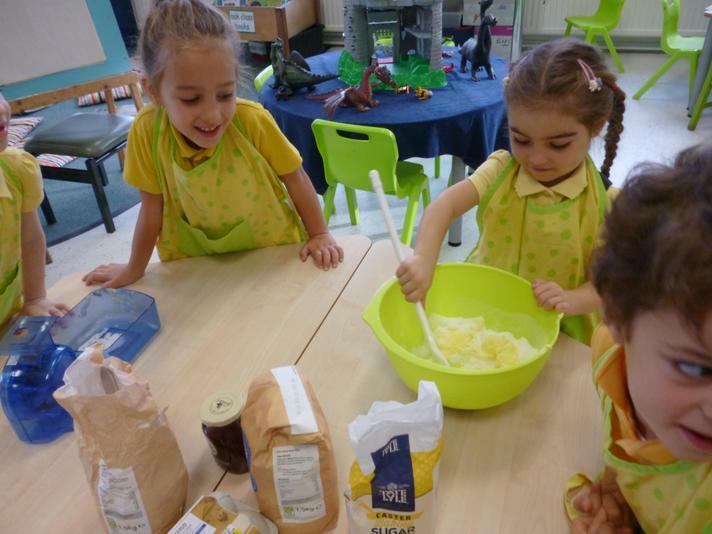 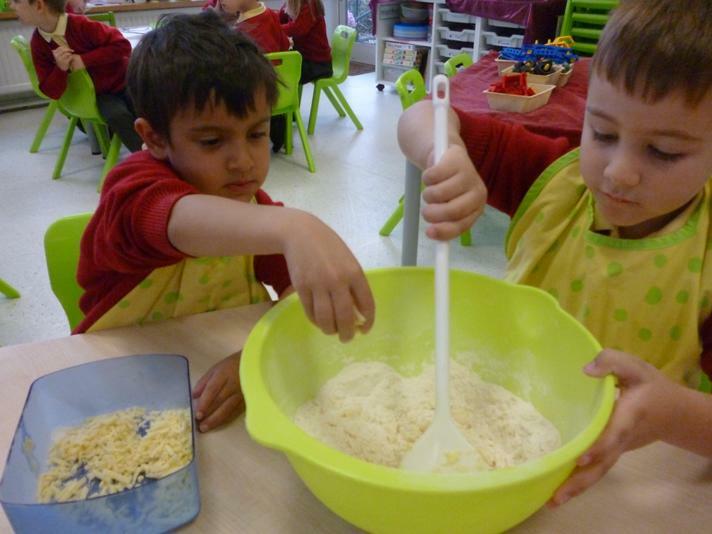 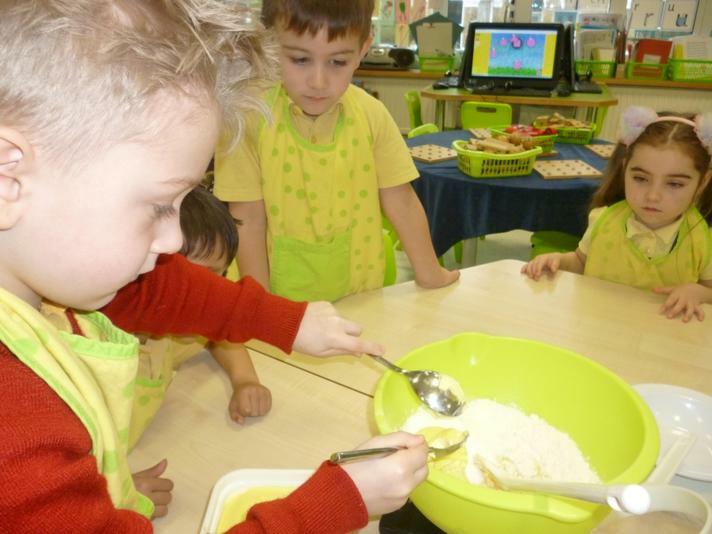 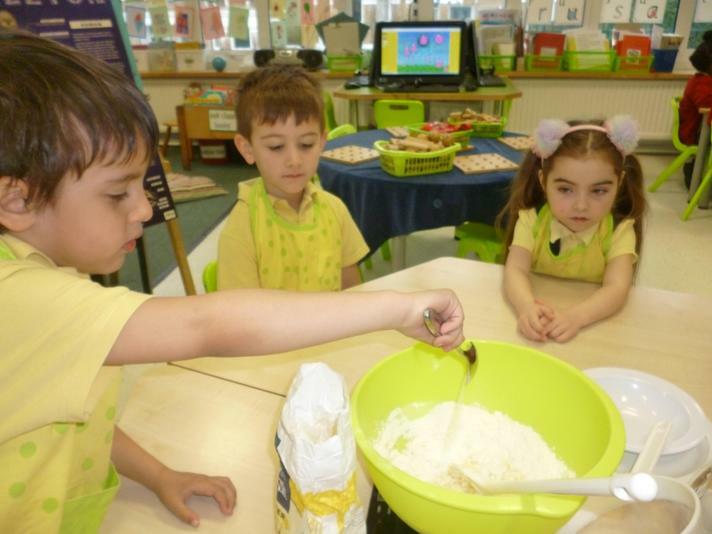 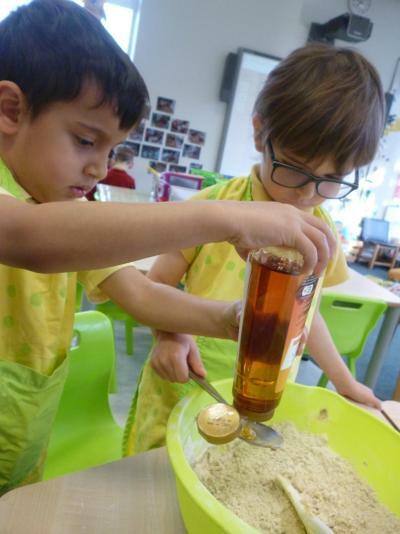 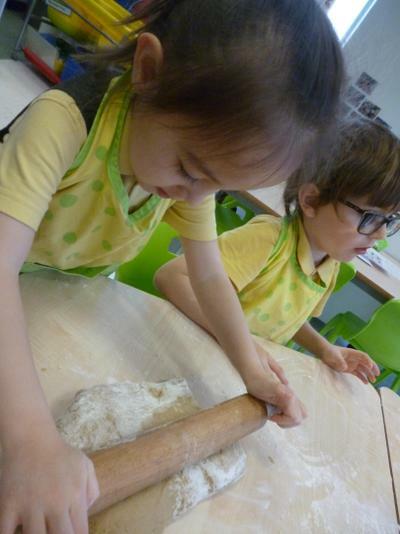 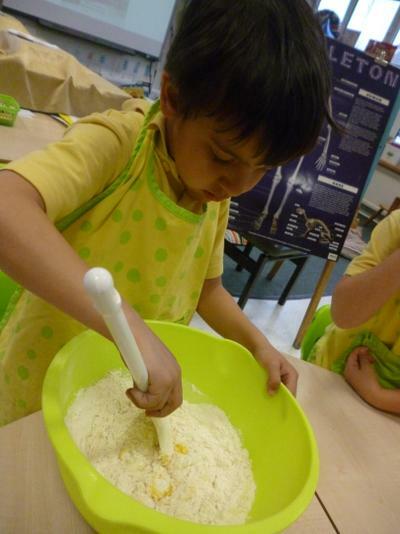 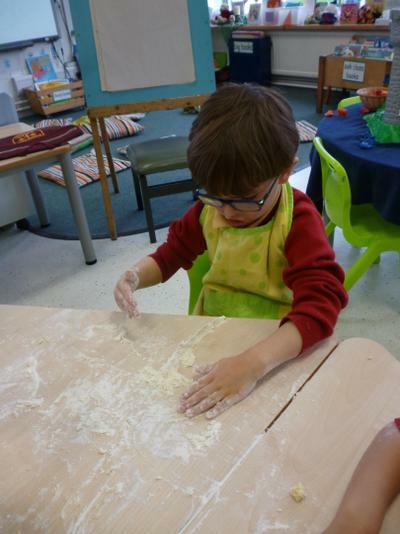 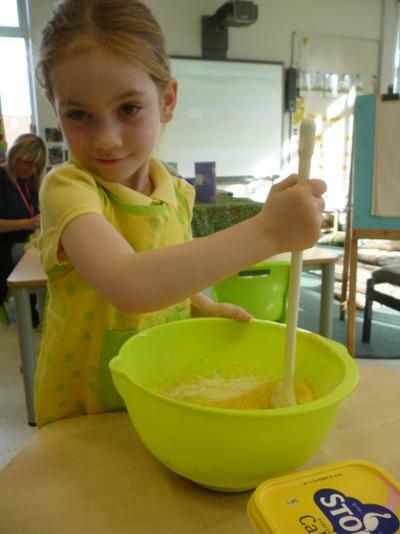 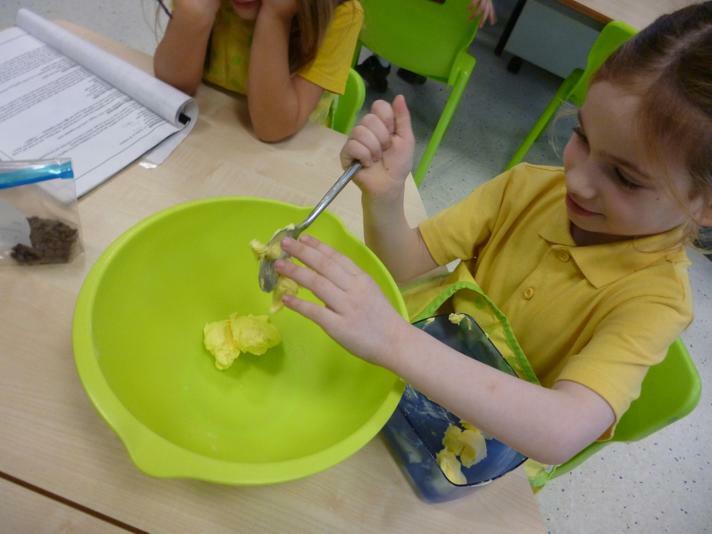 They made yummy cheese straws, here is the recipe, You will need 200g plain flour, 100g butter/marg, 100g grated cheese, 2tblsp water, 2 egg yolks. 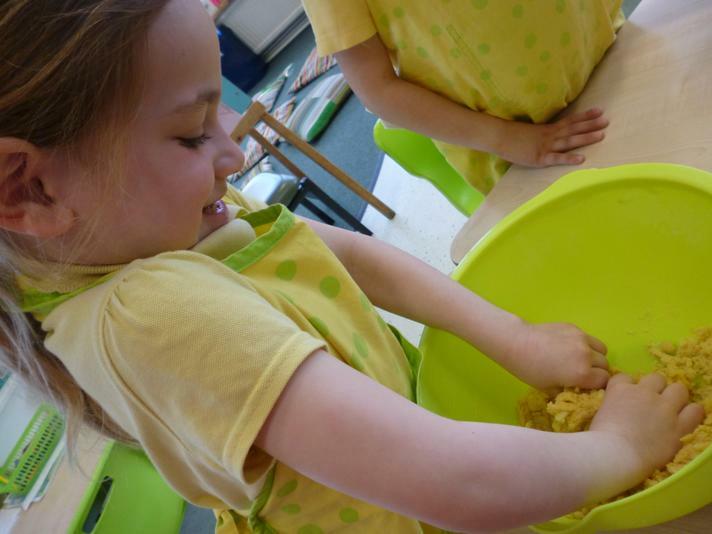 Sift the flour, rub in the butter or marg' and cheese. 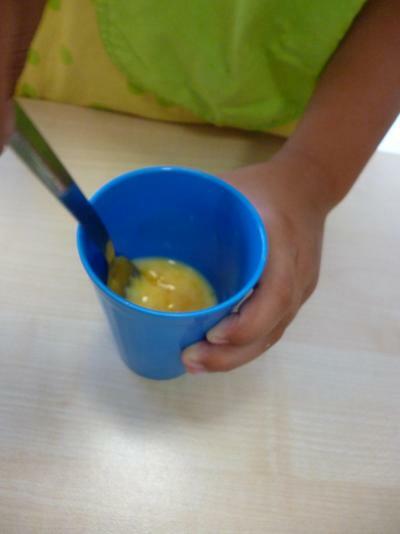 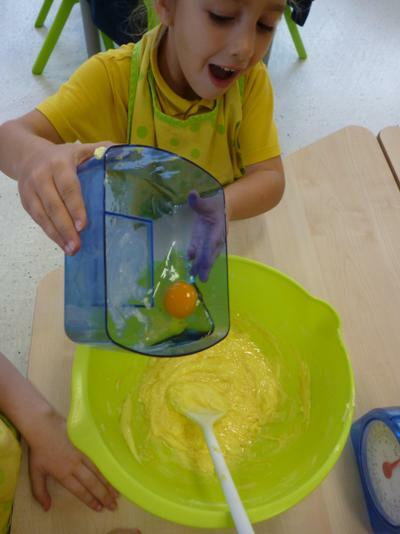 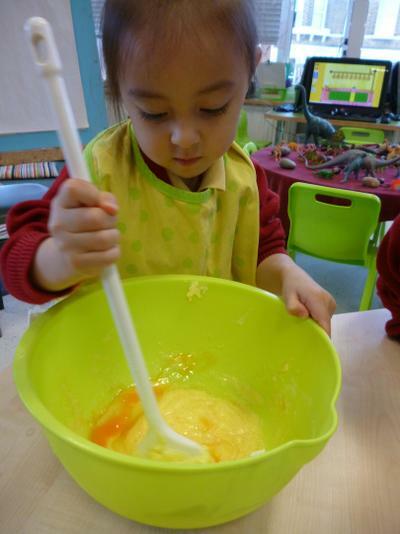 beat the egg yolks, mix with the water and add gradually to the mixture. 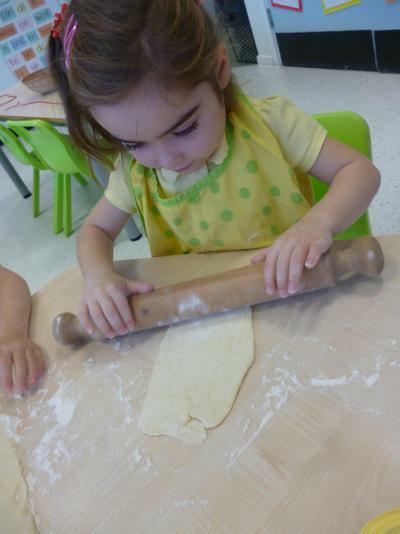 mix to a stiff pastry, knead lightly, roll out and cut into strips. 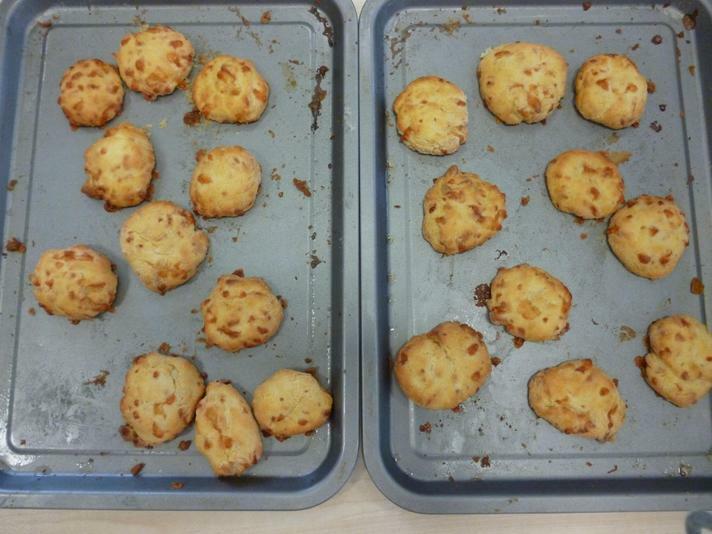 Place on a greased baking tray and cook on 160 degrees for about 15 minutes...ENJOY! 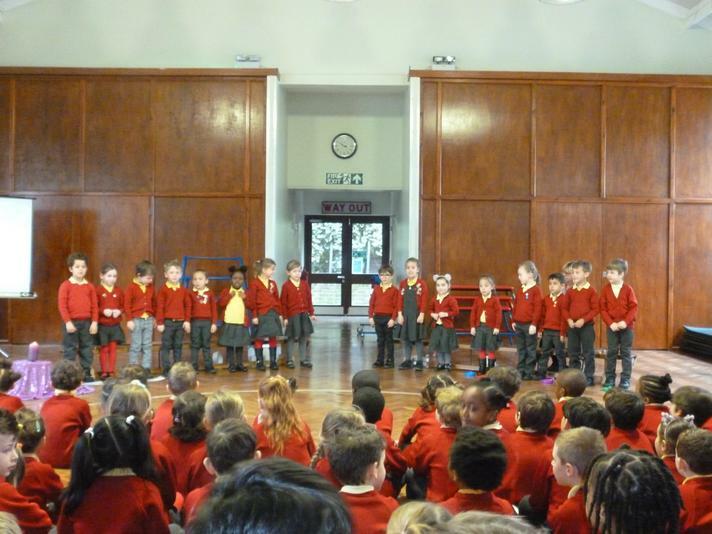 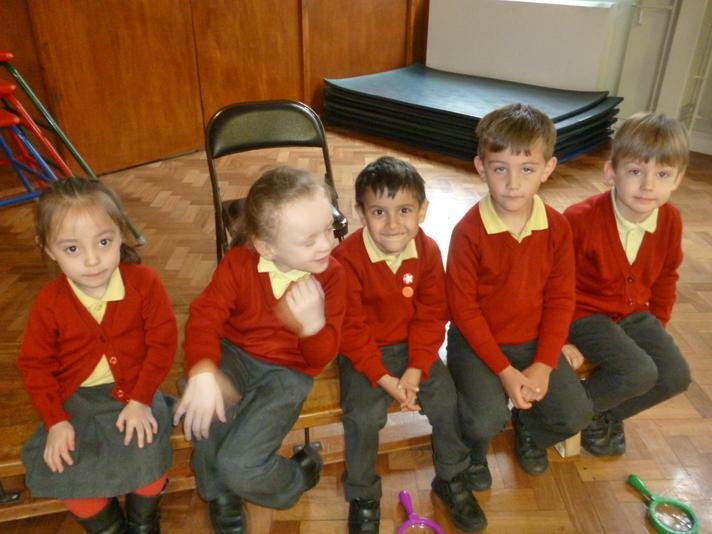 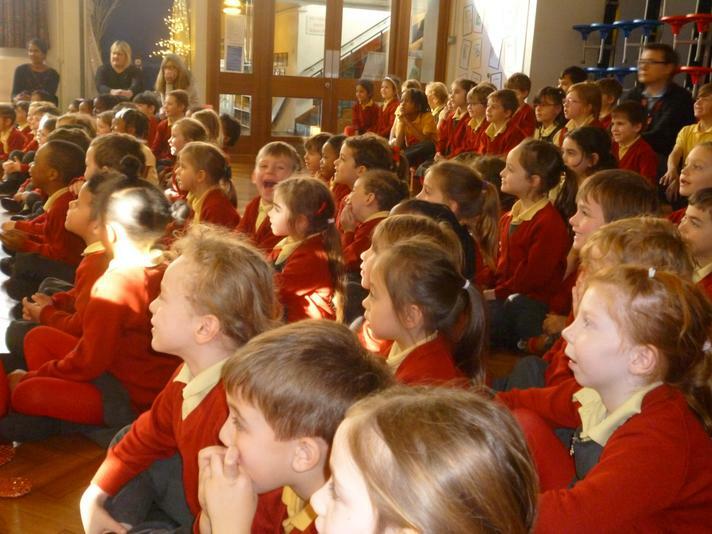 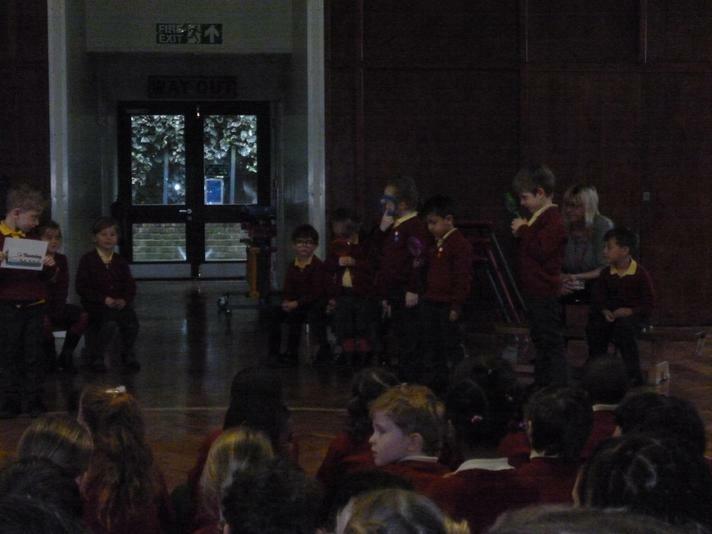 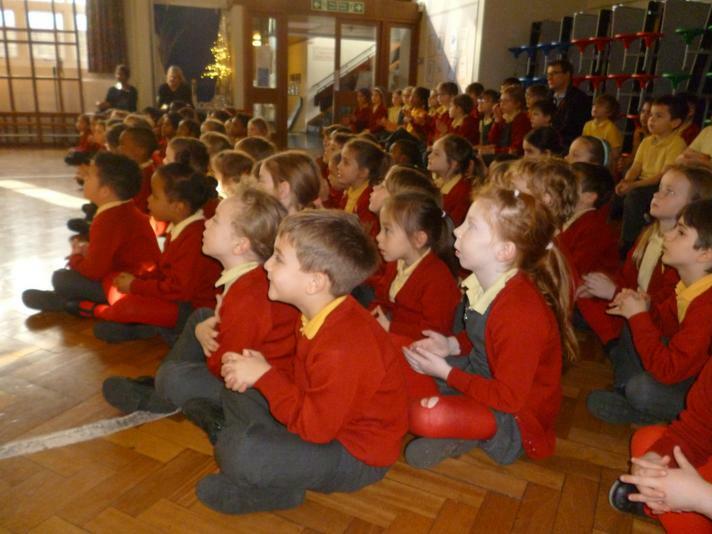 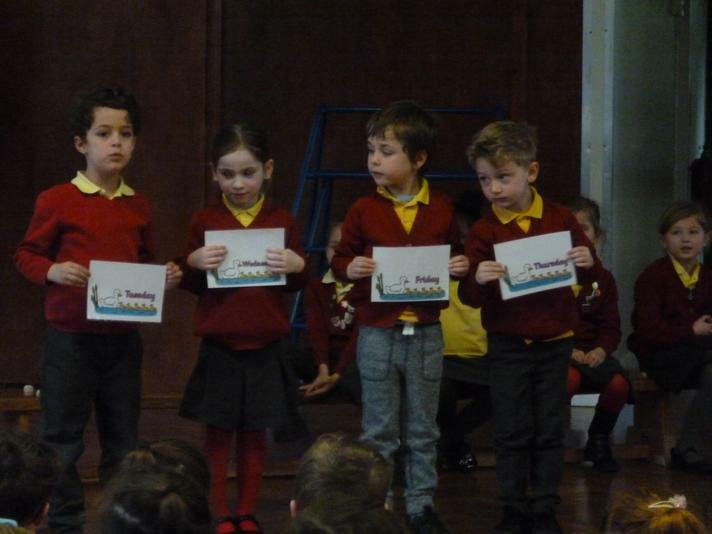 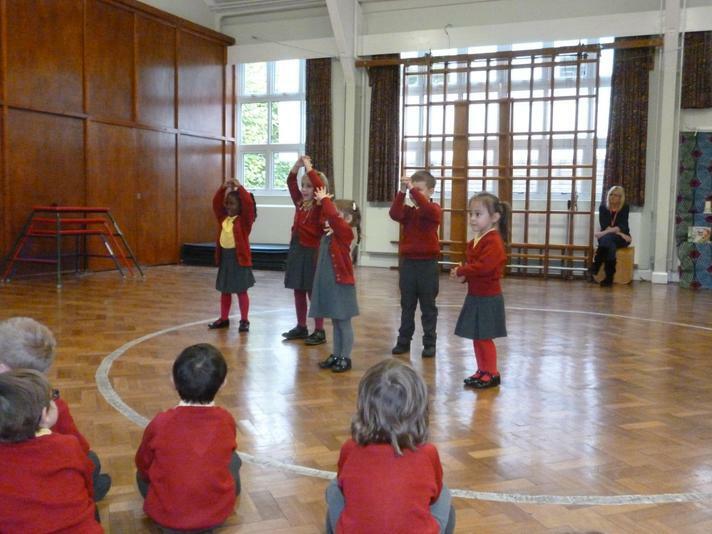 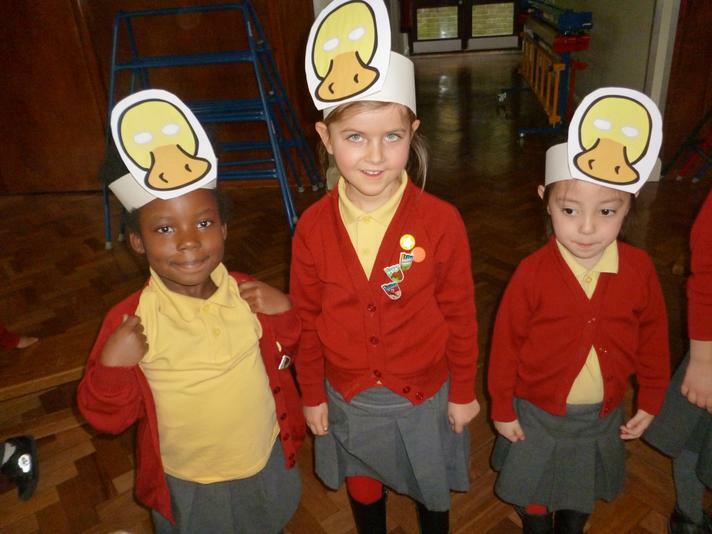 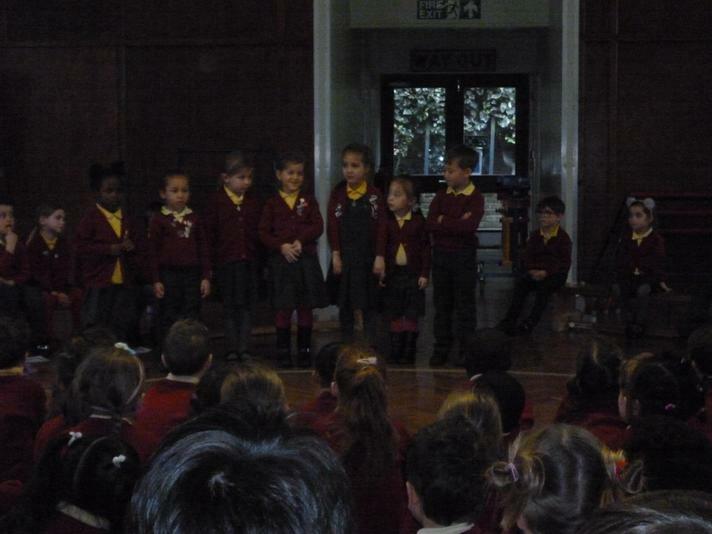 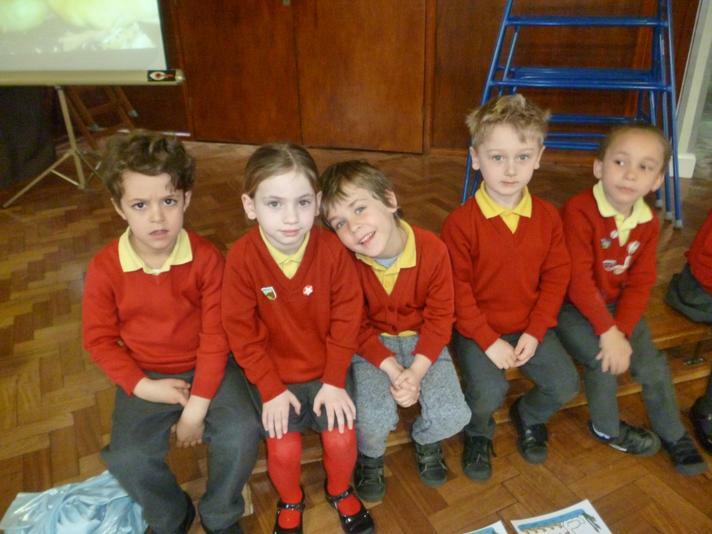 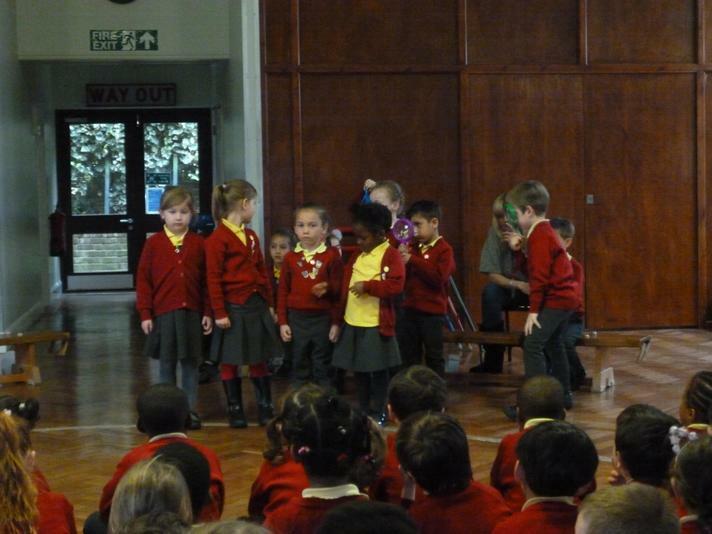 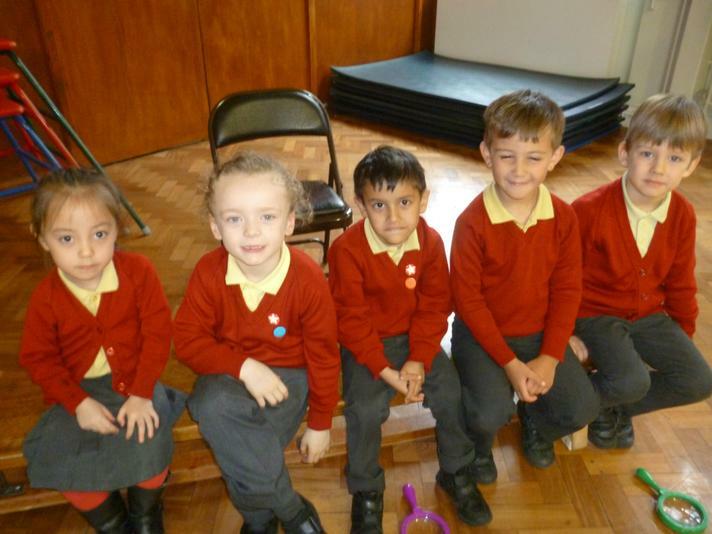 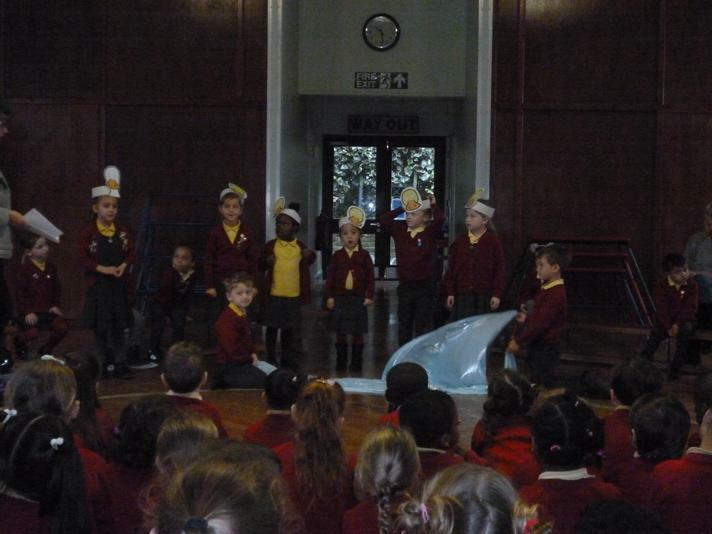 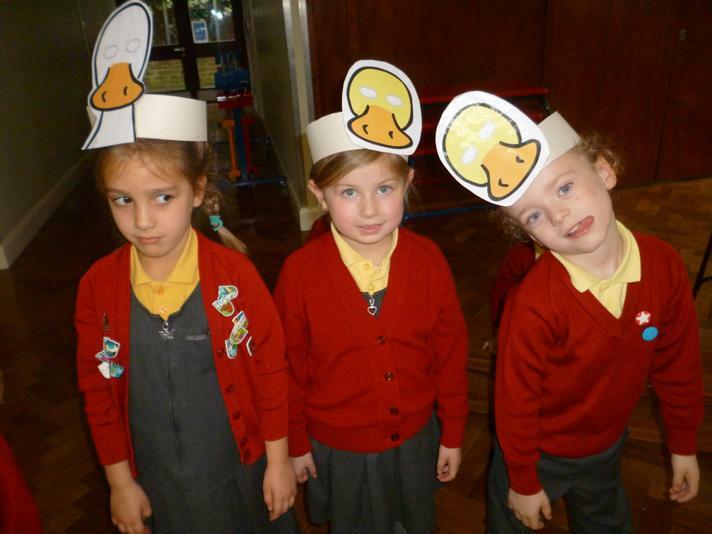 Our assembly We enjoyed sharing work and songs about our ducks in assembly today. 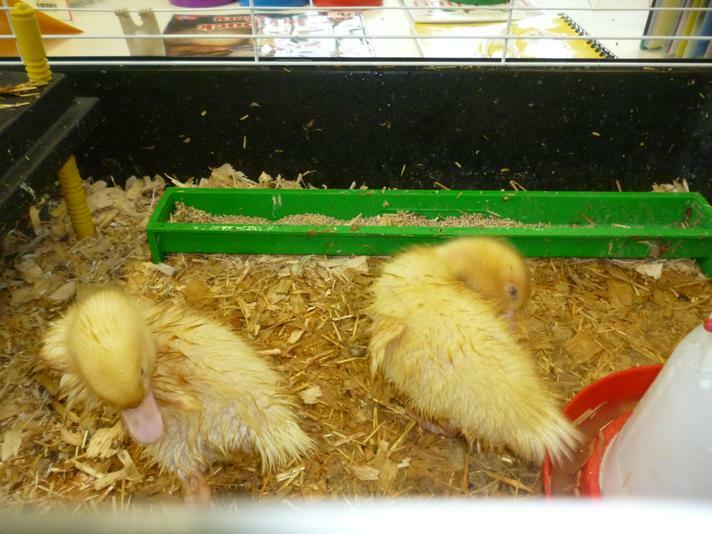 Day 9 & 10 We have enjoyed watching our ducklings grow. 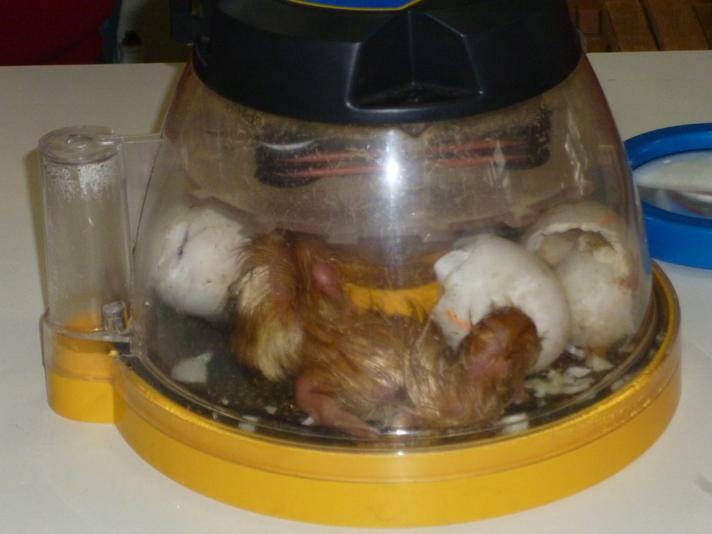 They are very big now and really need more room to run and exercise than there is for them in the brooder. 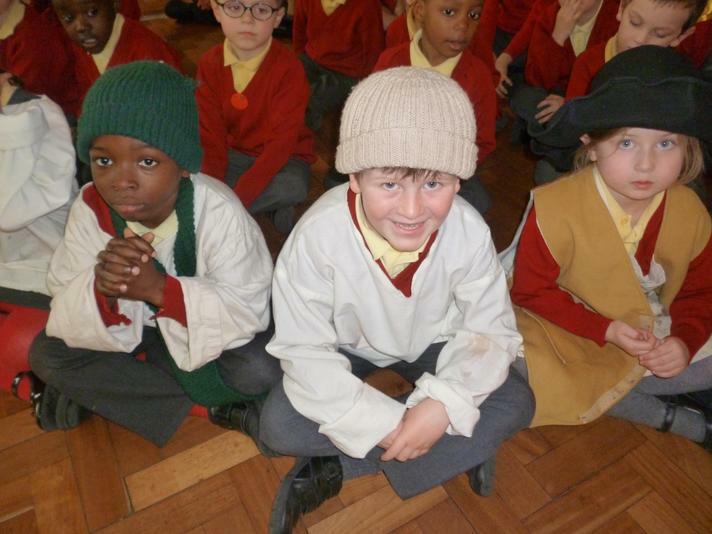 Farmer Ted is coming tomorrow to pick them them up and take them back to the farm. 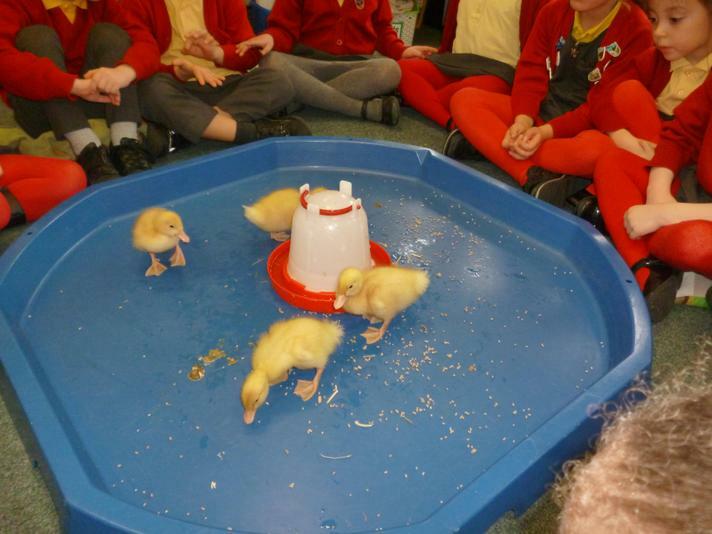 Today we enjoyed watching them have a little bath and swim. 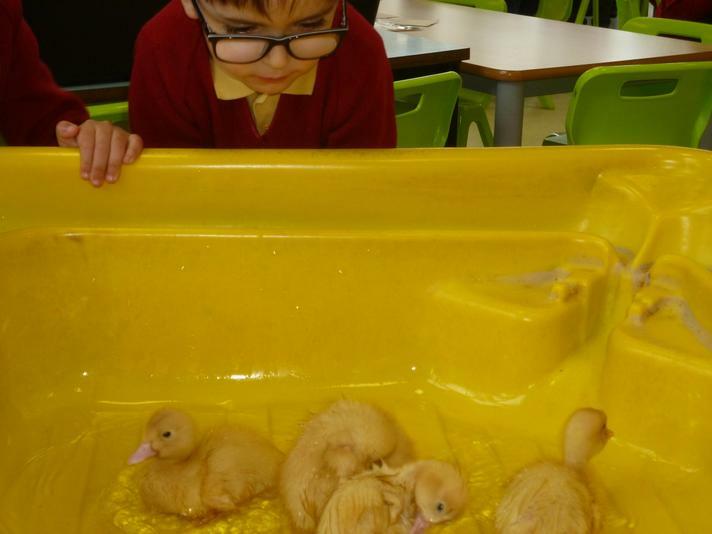 Day 8- Today the ducklings had a little run around in the big blue tray and we all got to have a cuddle with one of them. 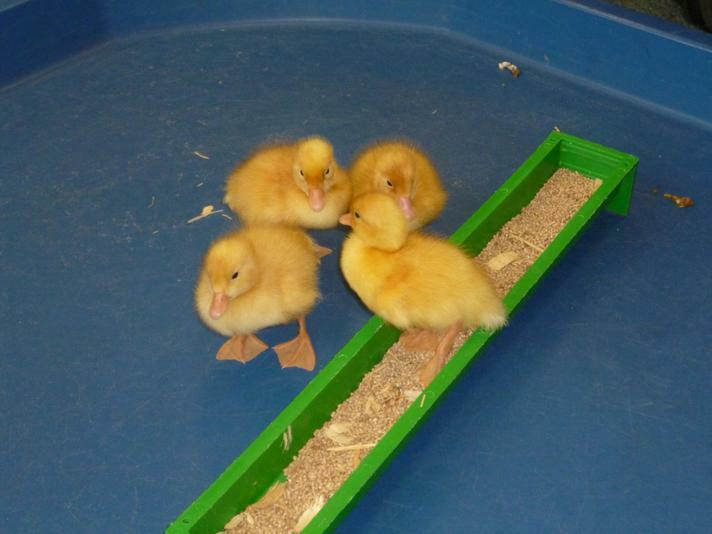 Day 5,6&7 The ducklings spent the weekend with Miss Robertson and enjoyed lots of exercise even jumping up on the heated part of the brooder, they are growing fast. 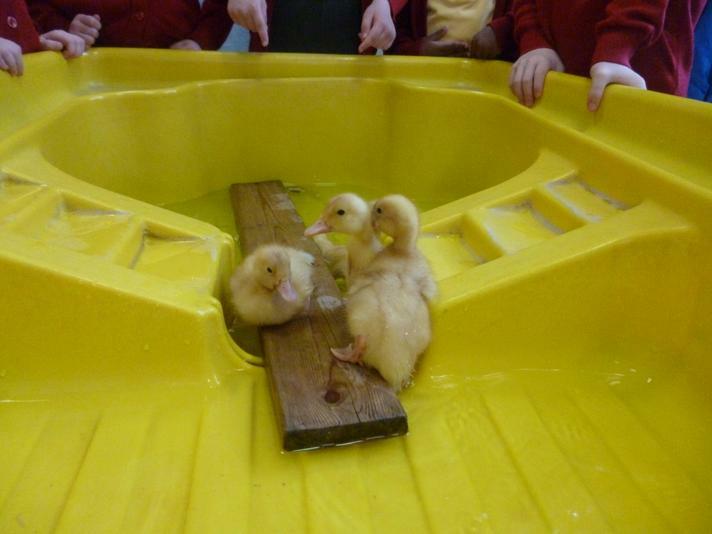 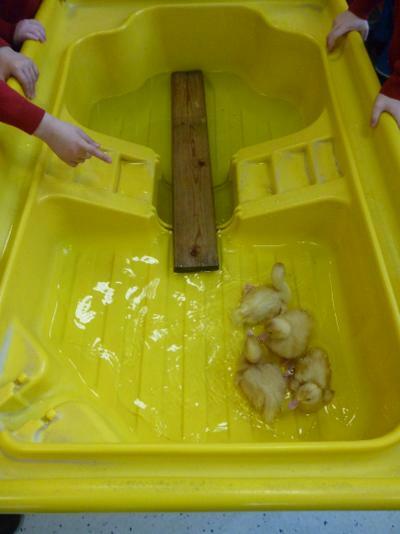 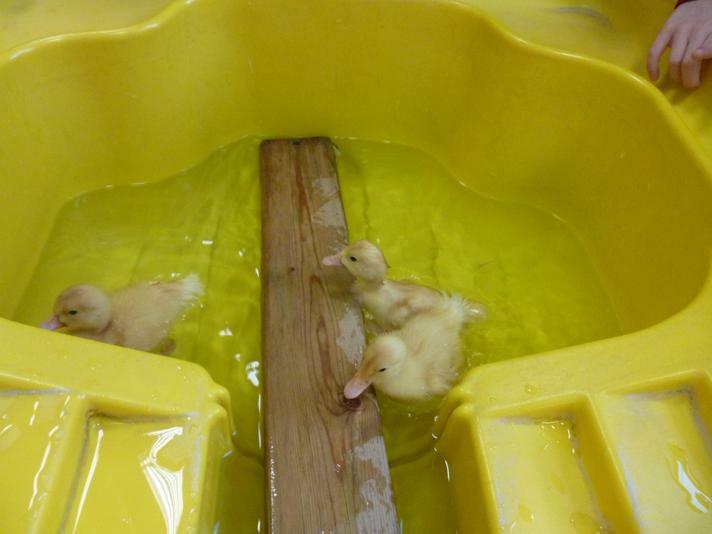 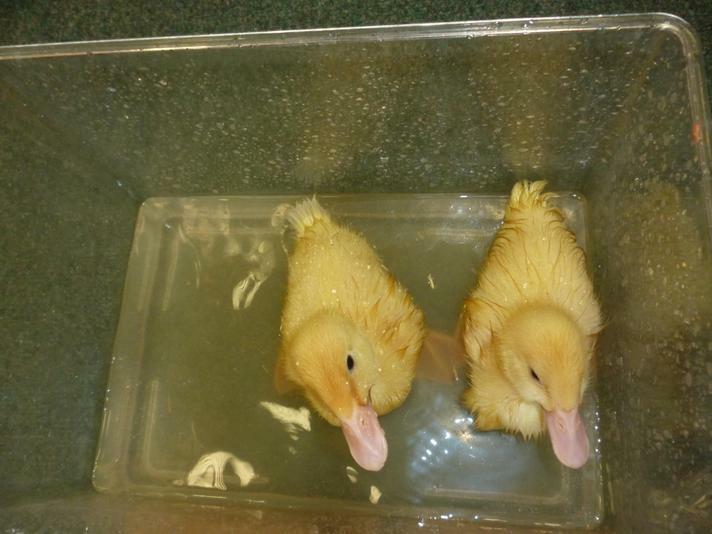 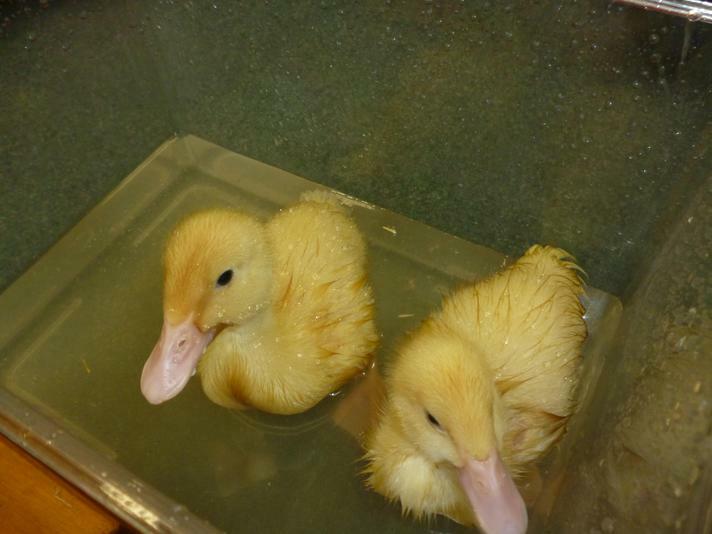 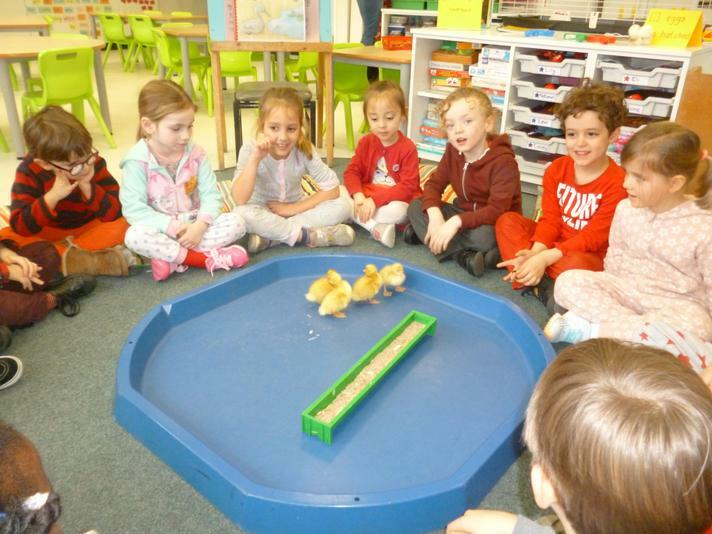 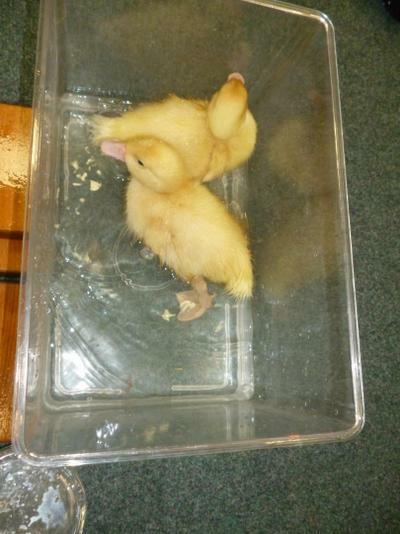 Today at school we gave them their first swim in the water tray, at first they were a little scared but seemed to relax and enjoy it. 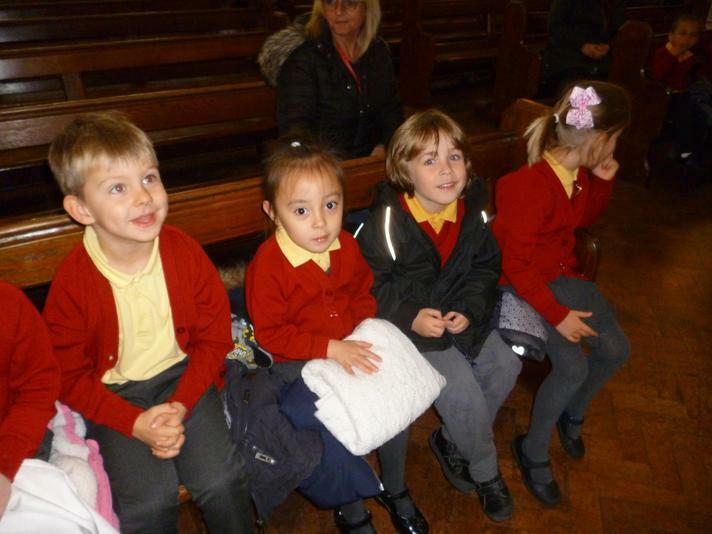 We enjoyed watching them! 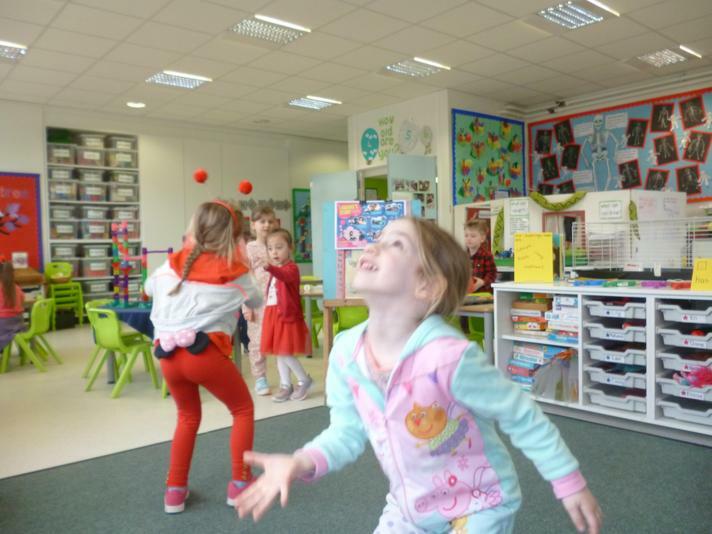 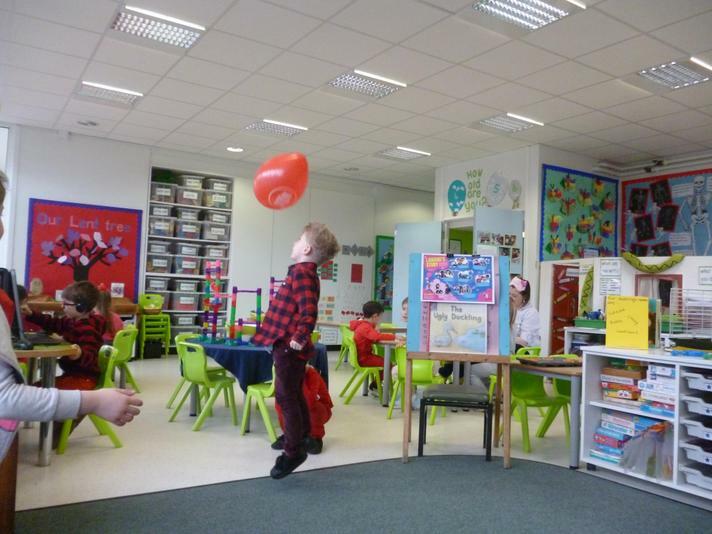 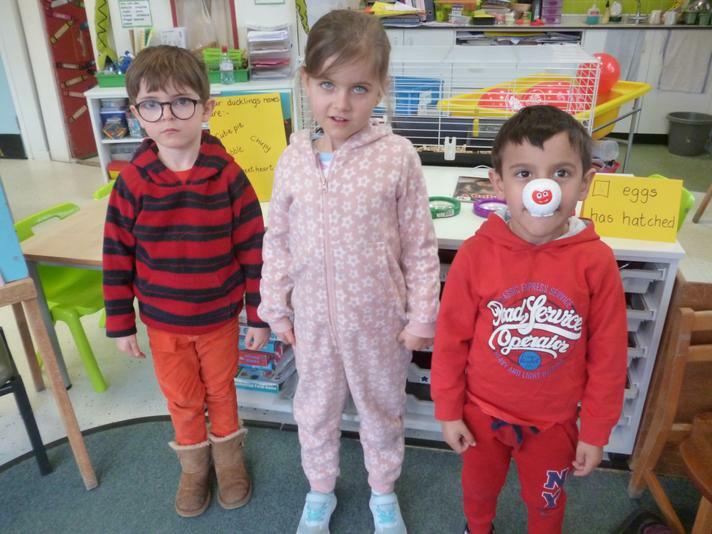 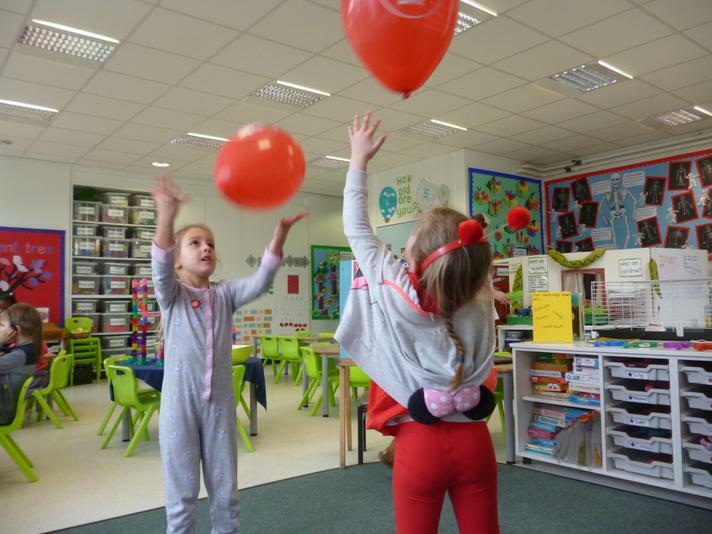 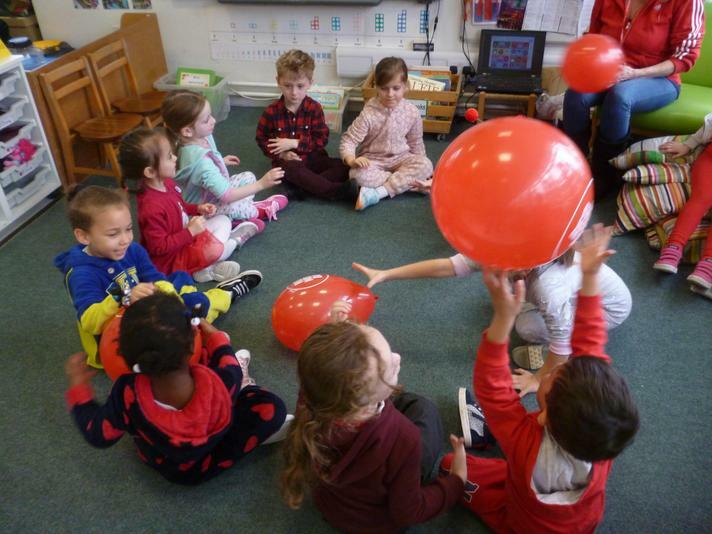 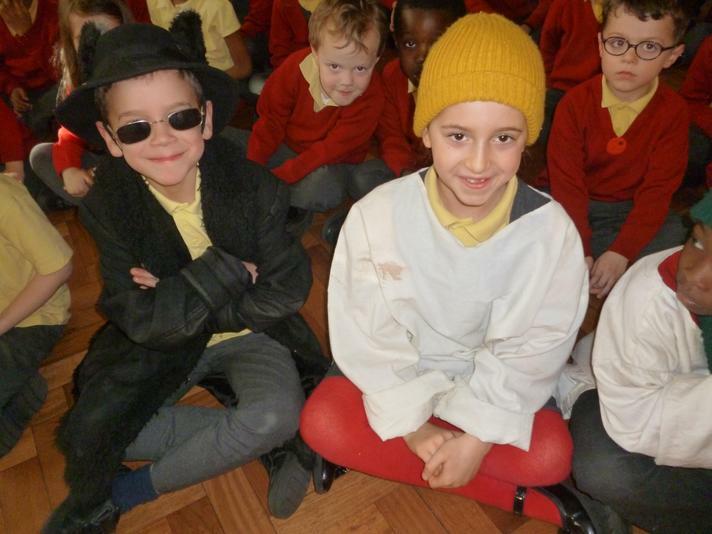 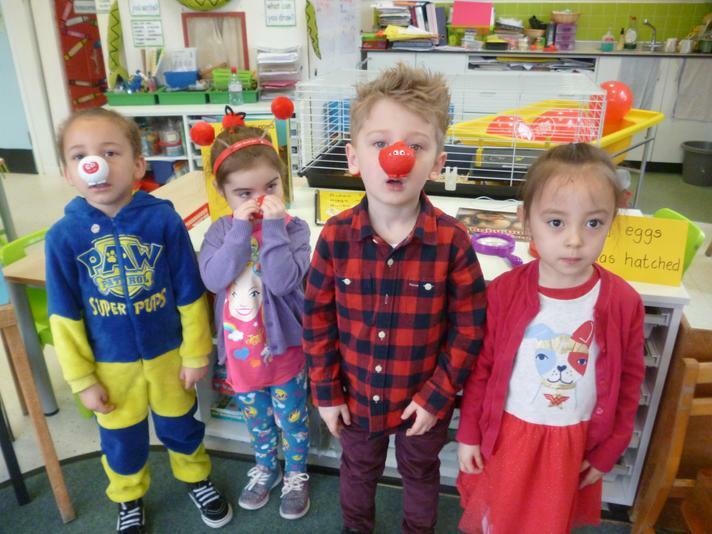 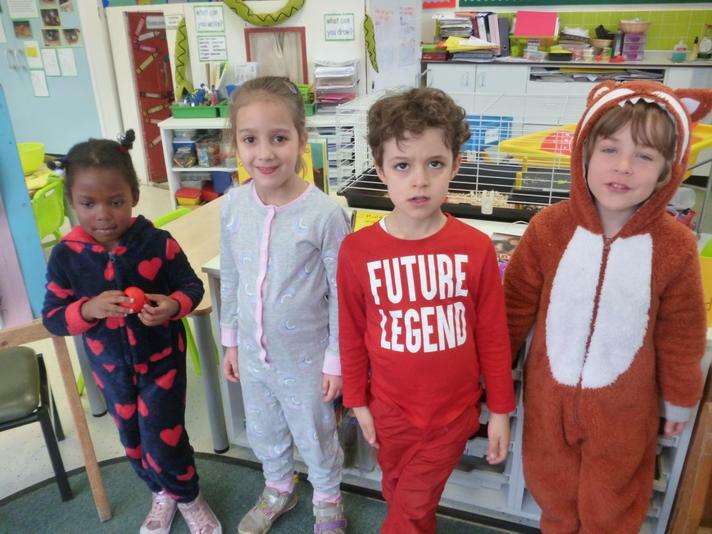 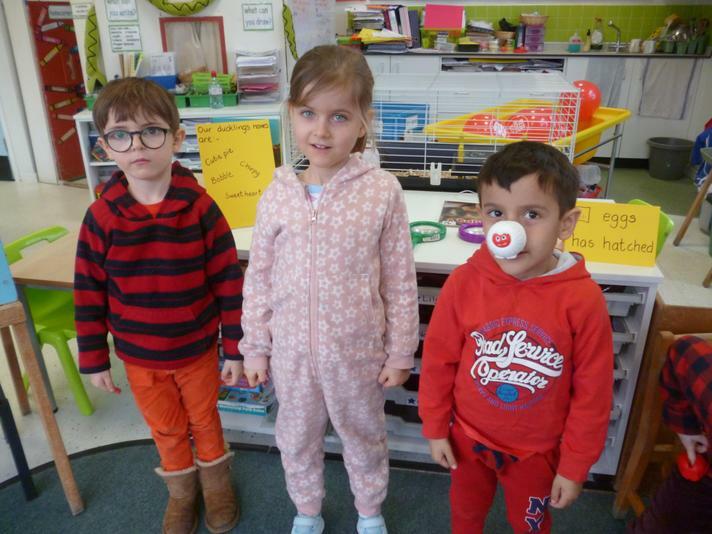 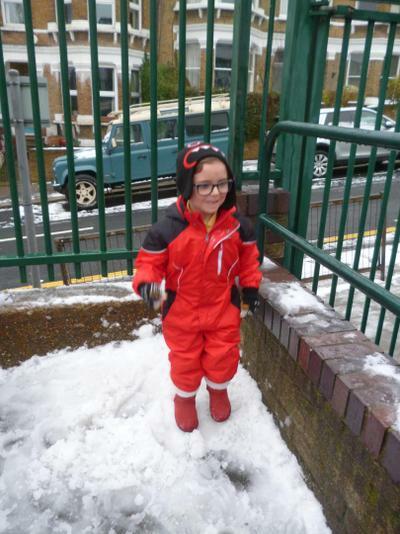 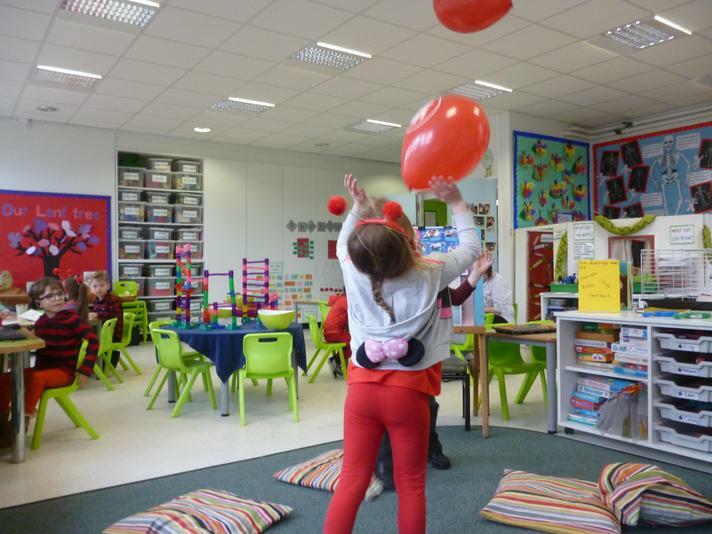 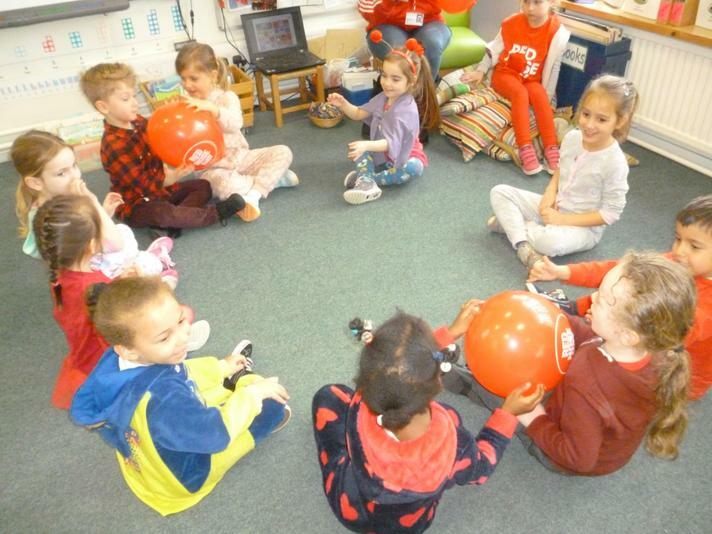 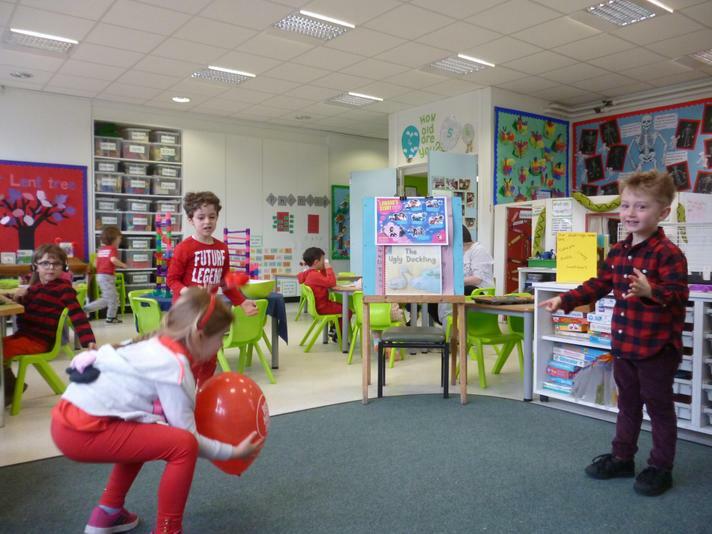 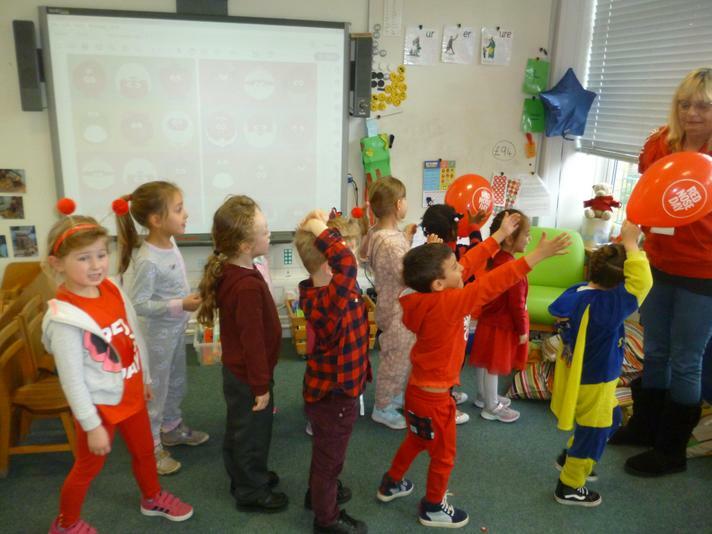 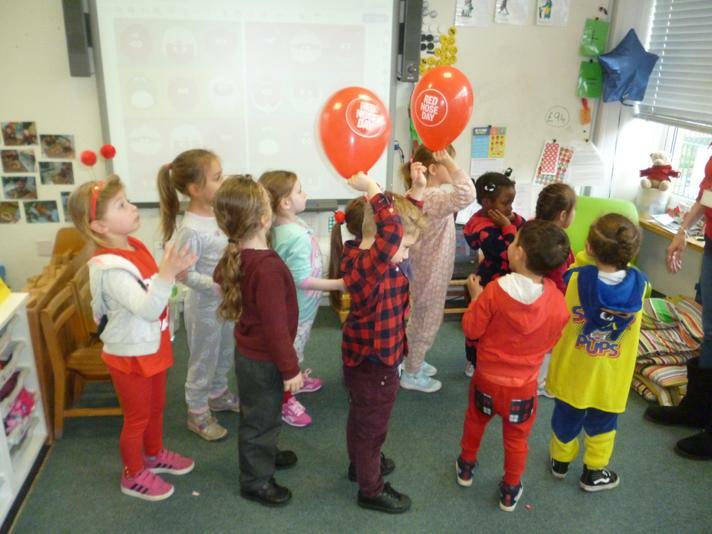 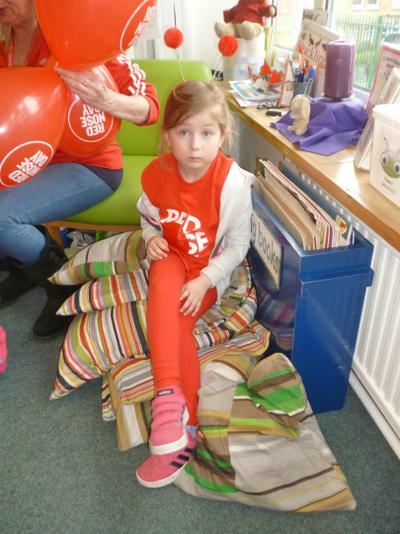 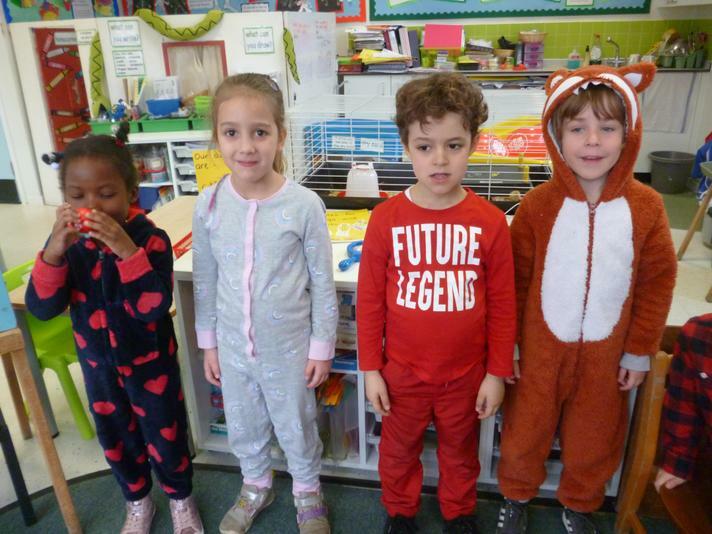 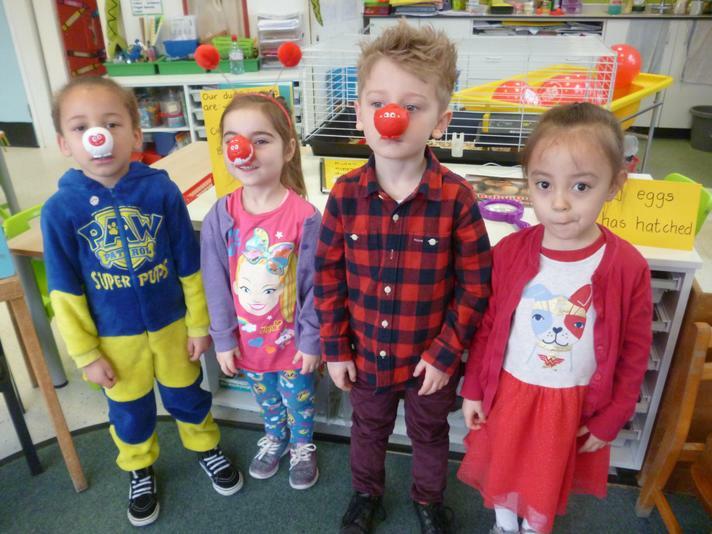 Red Nose day fun- We dressed up in red clothes, onesies and pyjamas today for red nose day. 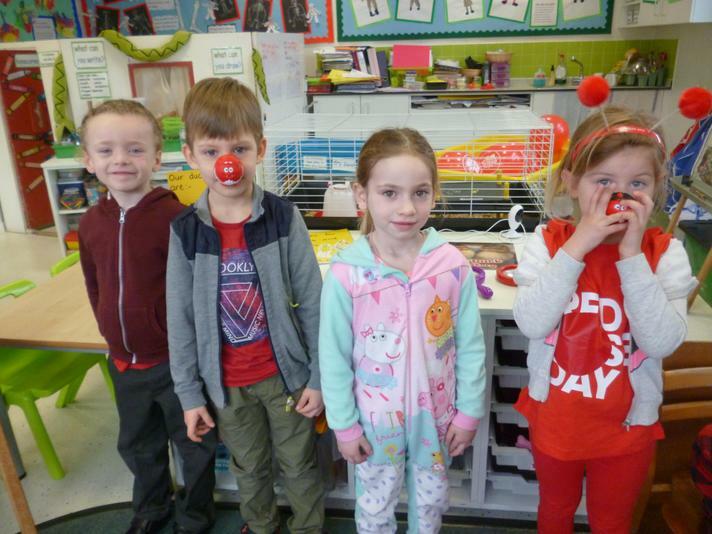 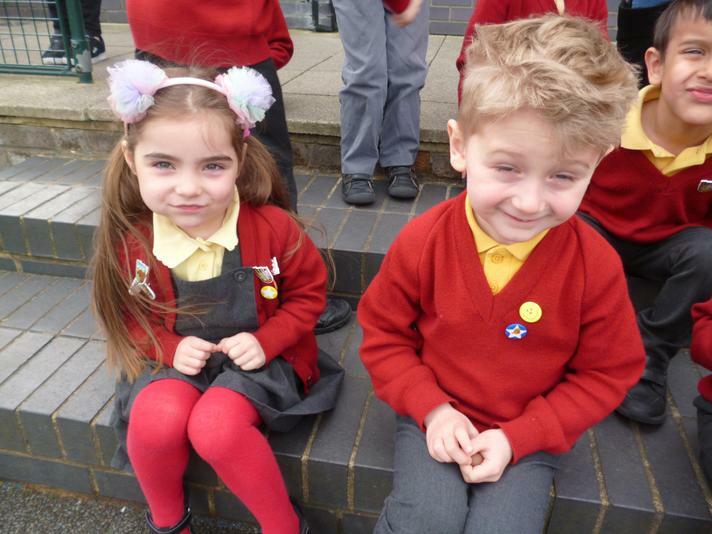 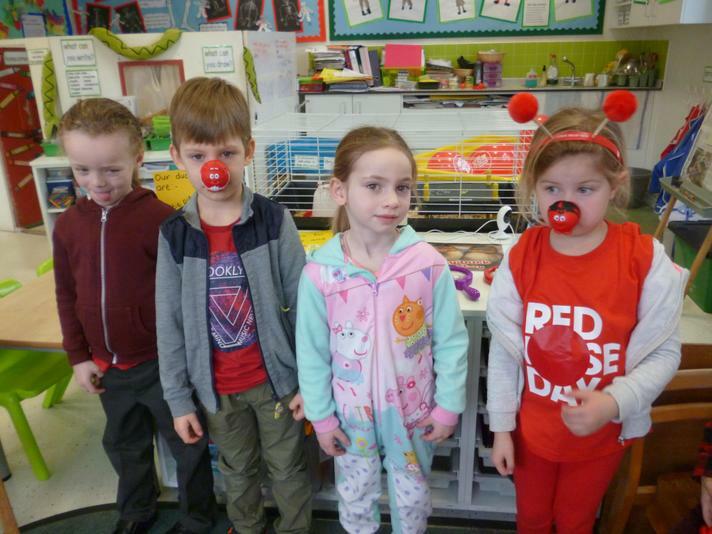 We collected money for comic relief, Oak class collected a massive £94 and won the prize for the class that collected the most money, thank you very much yet again for your generosity. 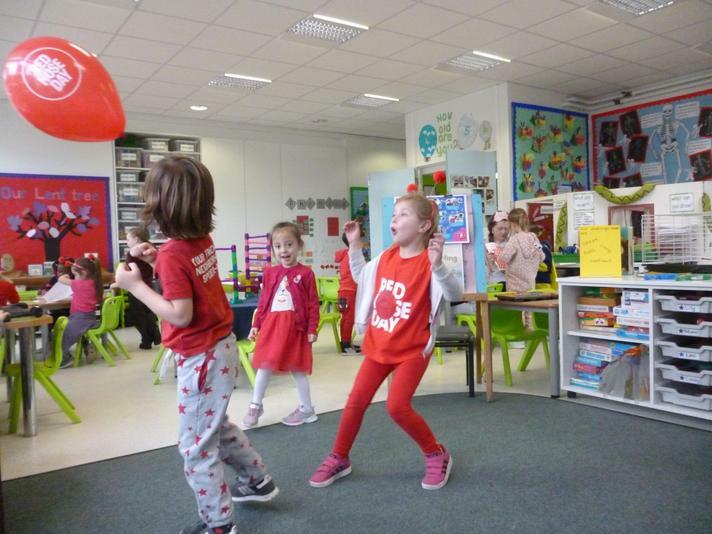 We have had a great day playing games dancing and having fun. 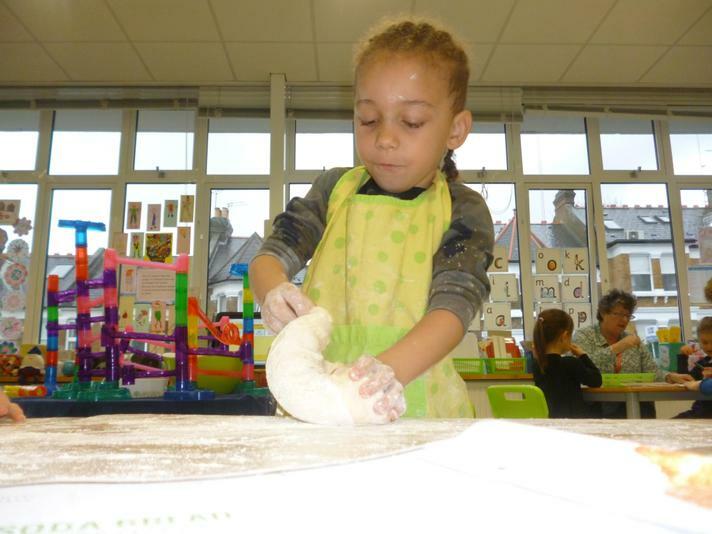 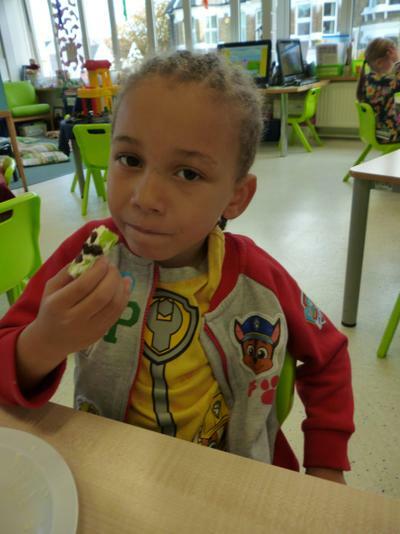 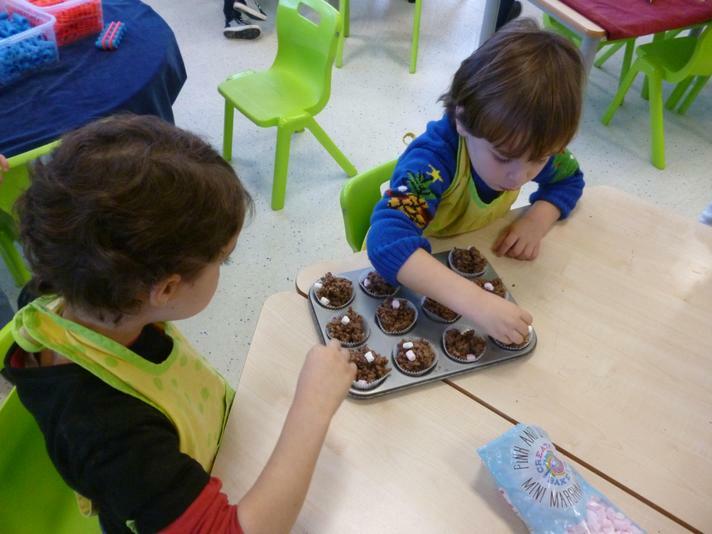 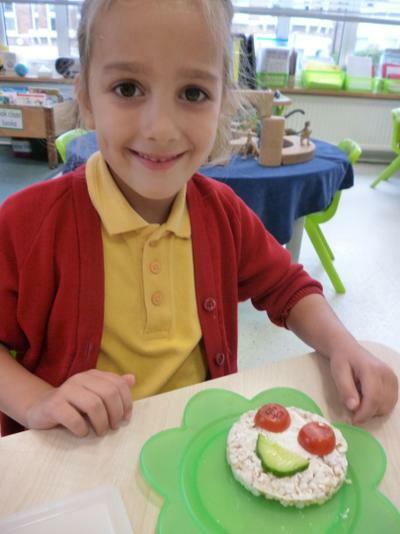 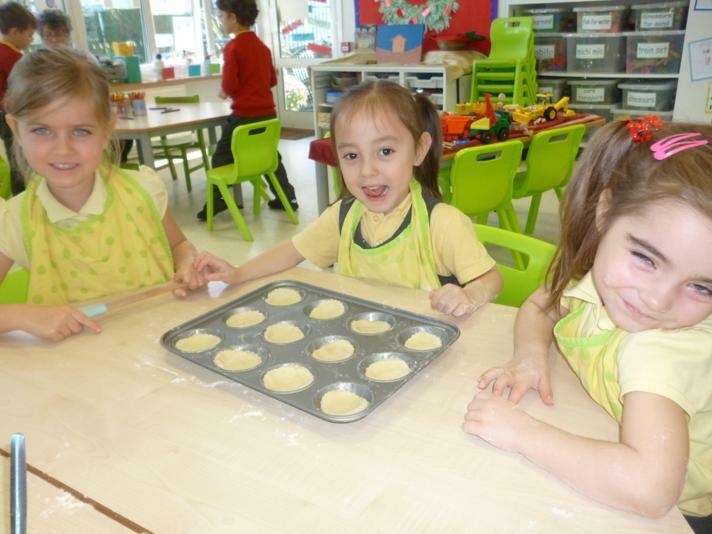 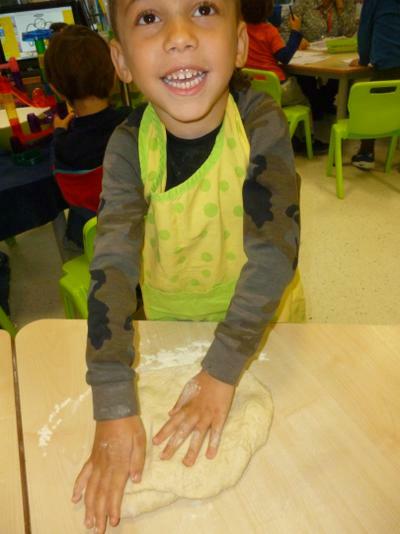 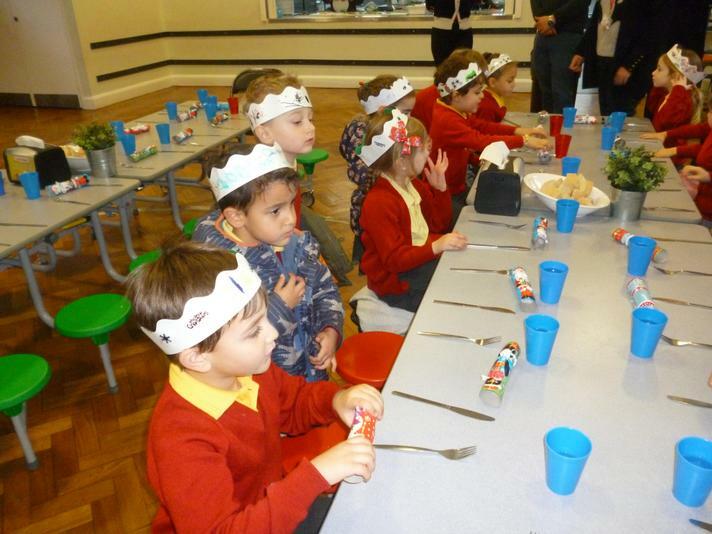 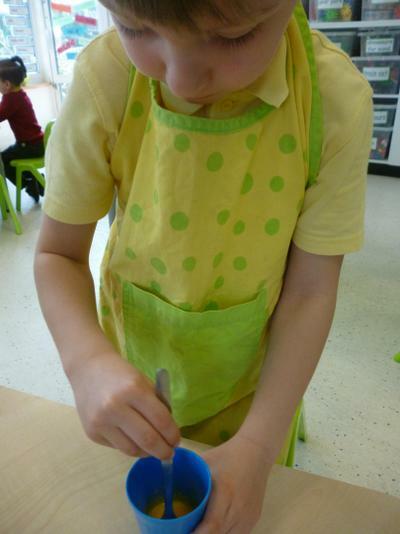 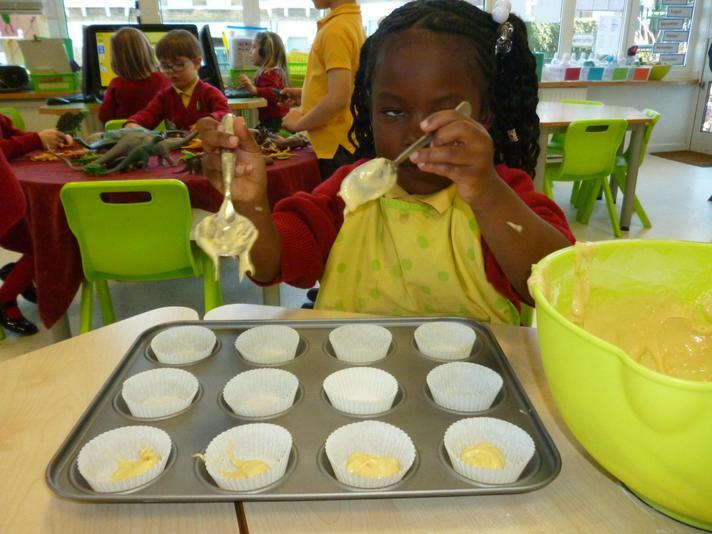 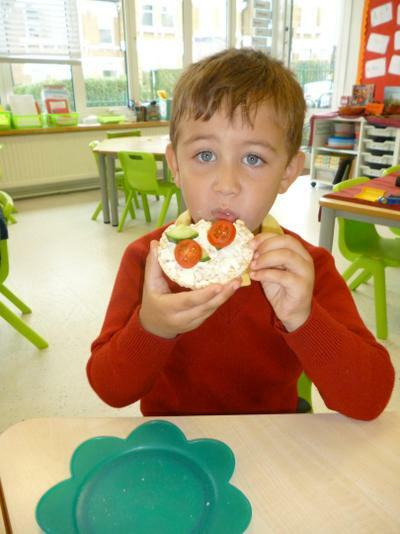 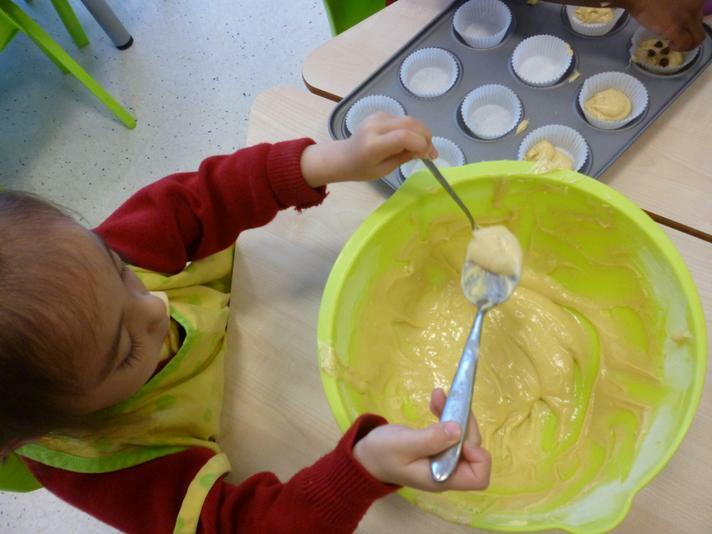 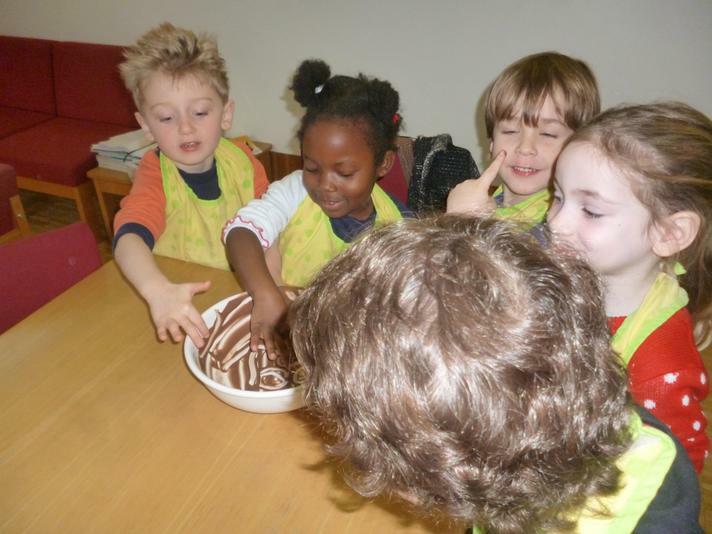 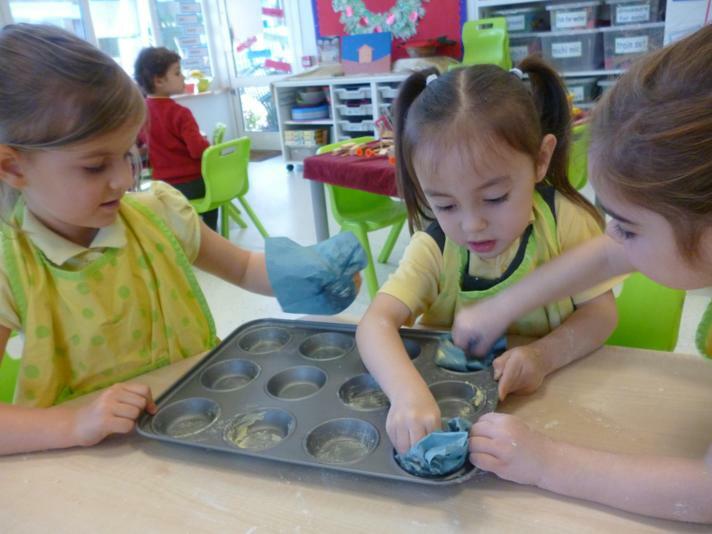 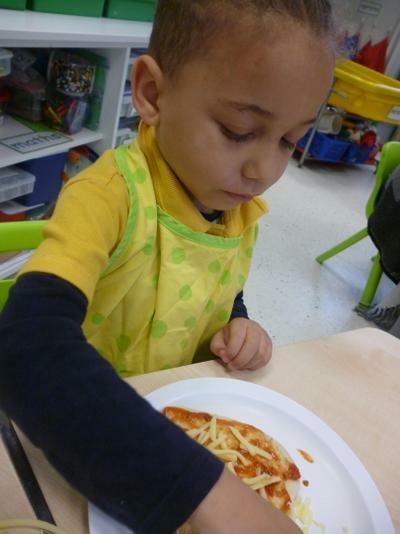 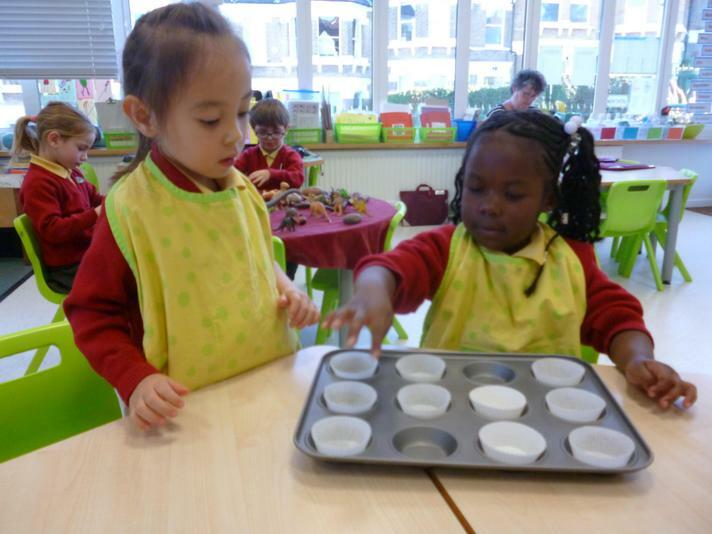 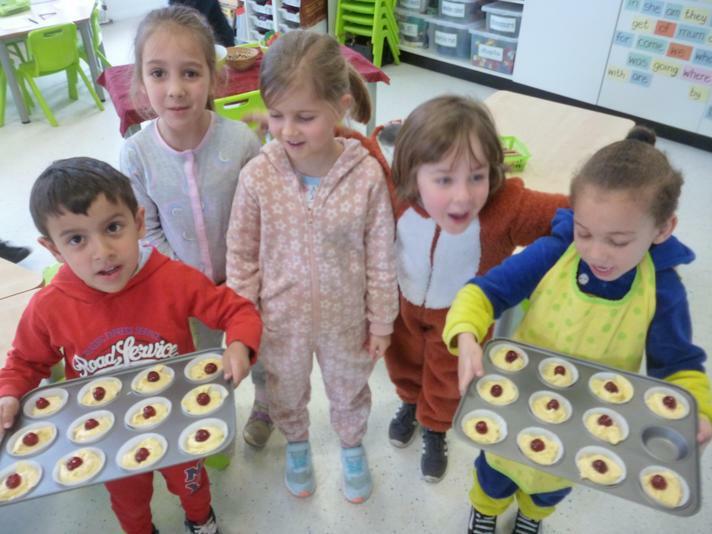 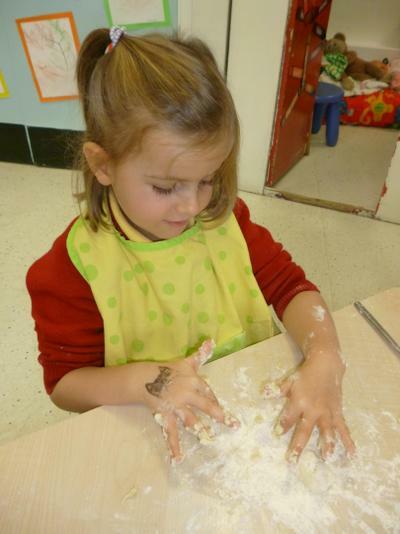 We also made suprise red nose cakes, our cooks were Mia, Iacopo, Kaien, Eloise and Eli. 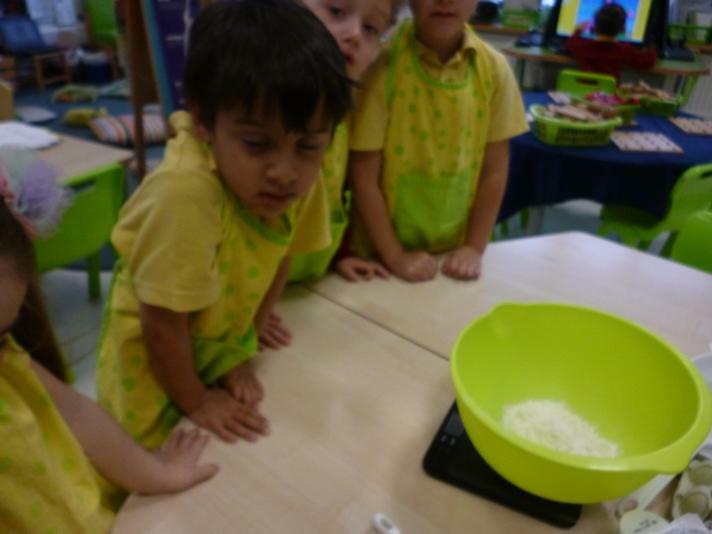 We used 200g S.R. 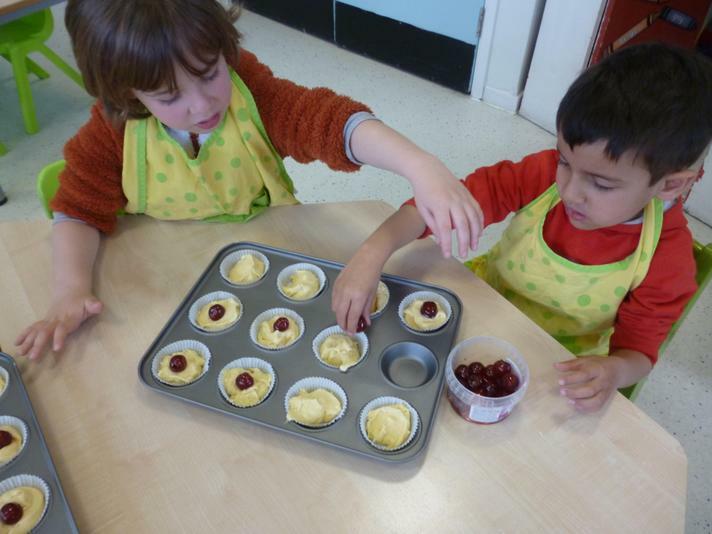 flour, 200g butter, 200g caster sugar tsp baking powder glace cherries and 3 eggs. 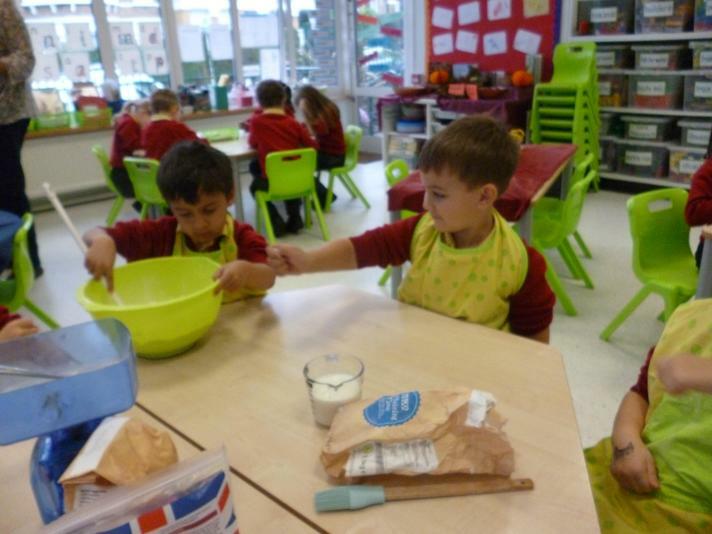 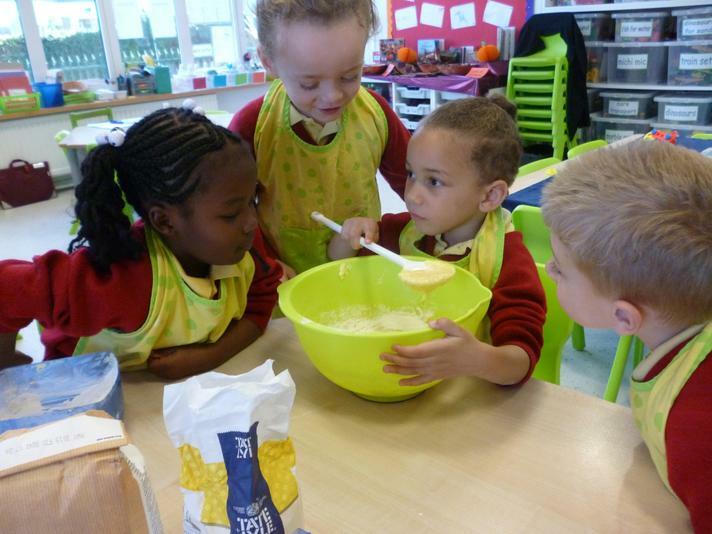 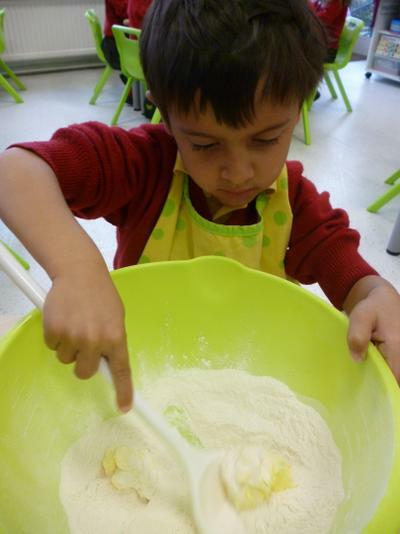 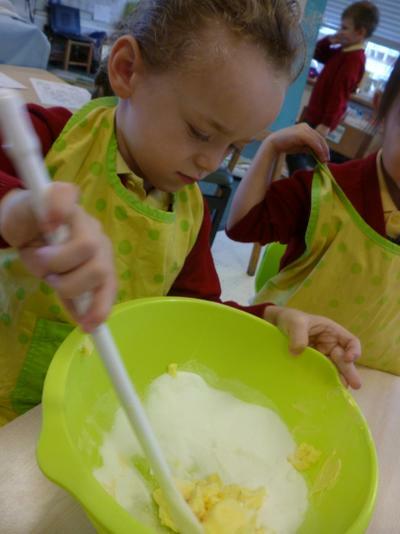 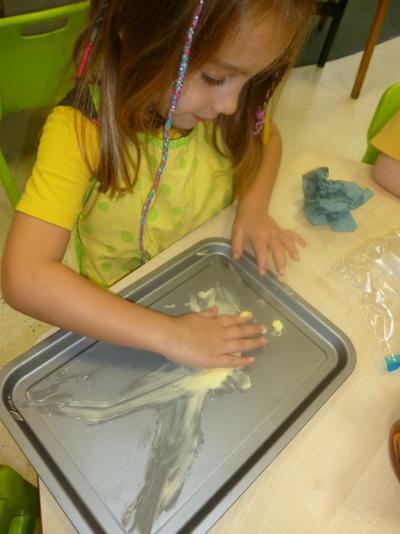 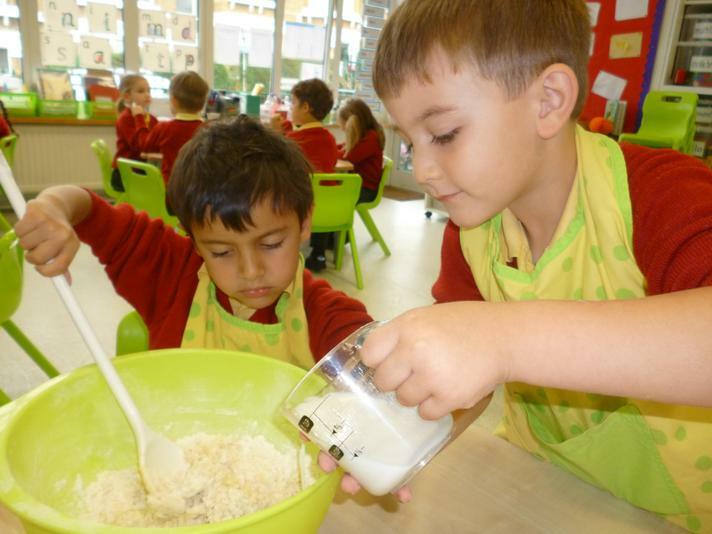 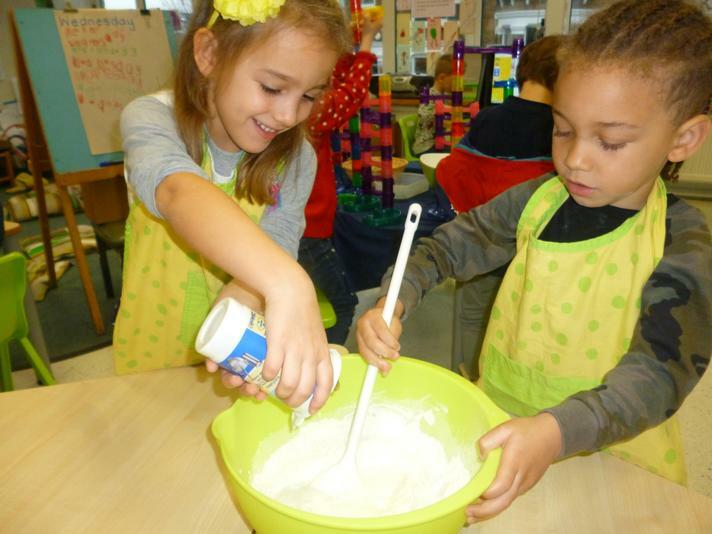 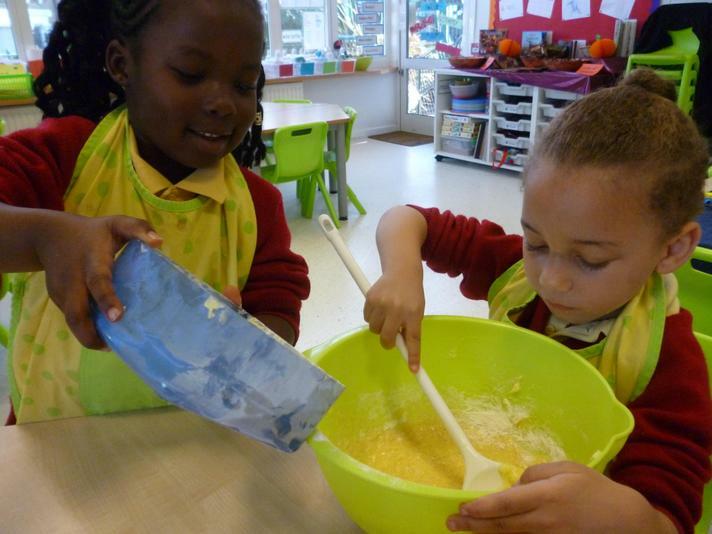 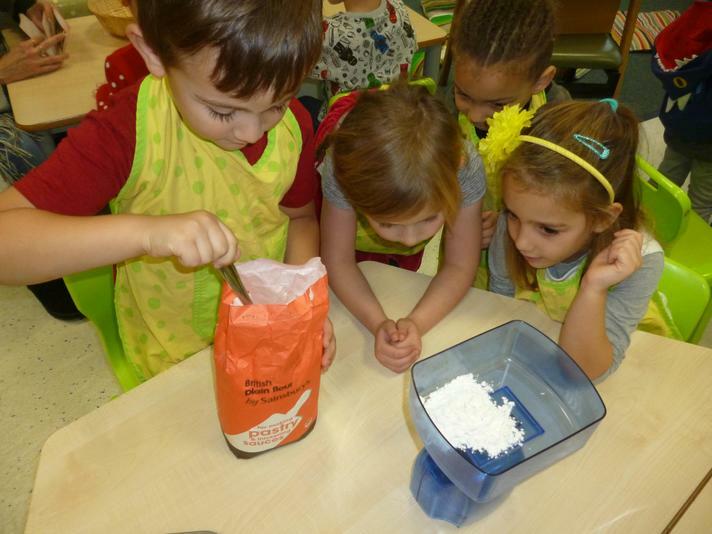 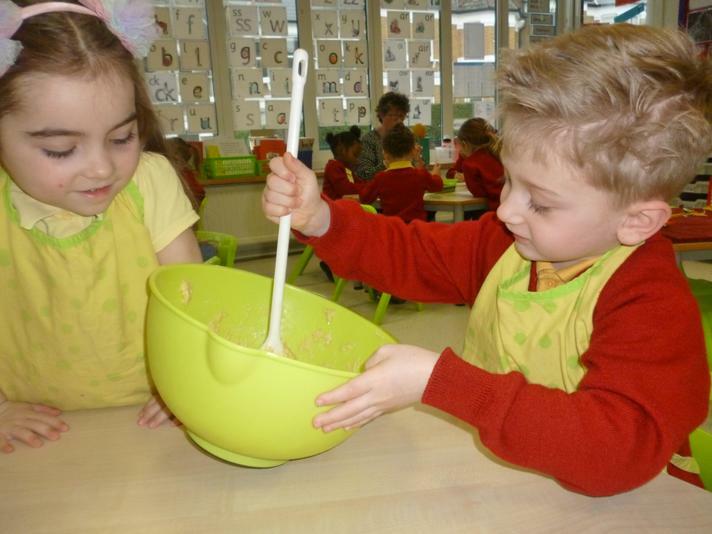 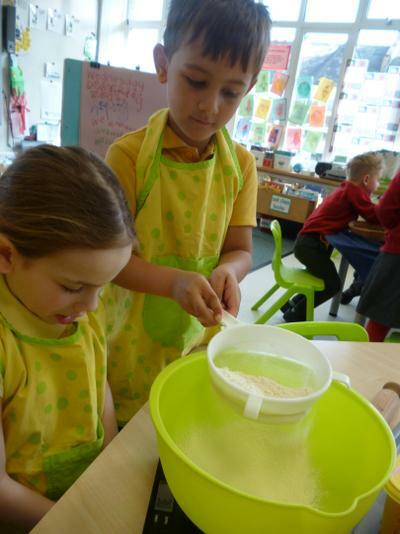 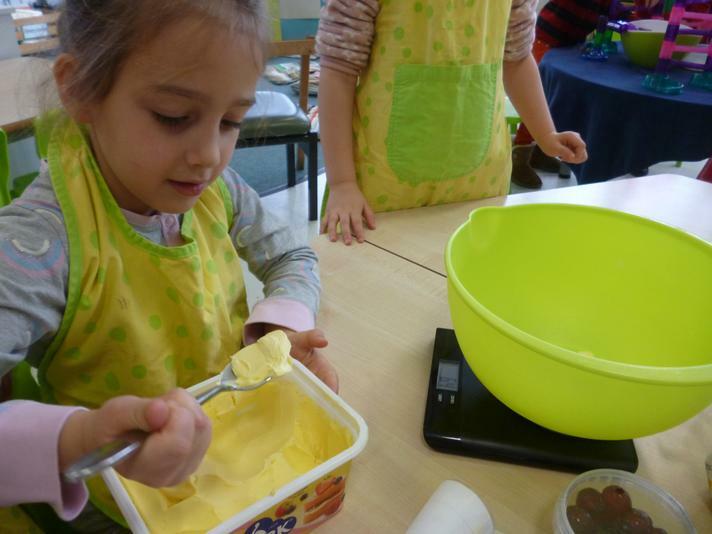 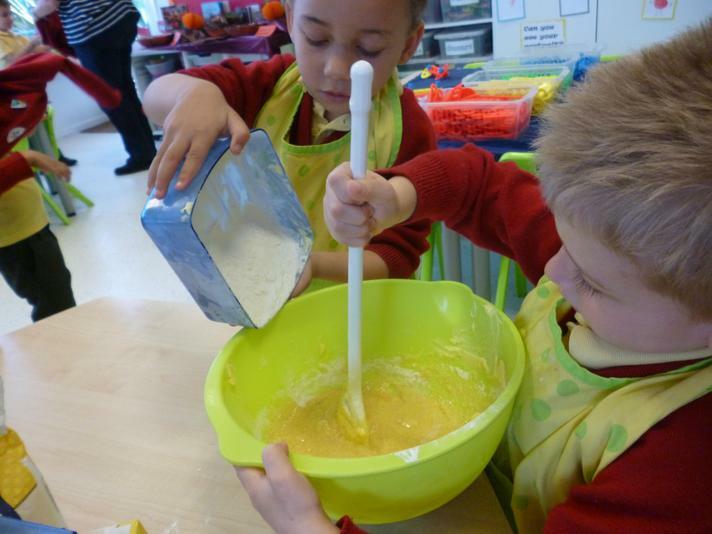 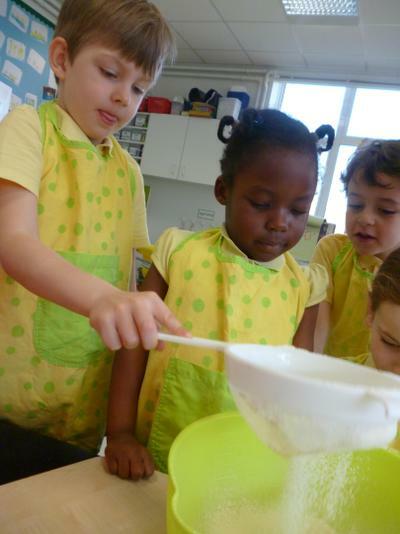 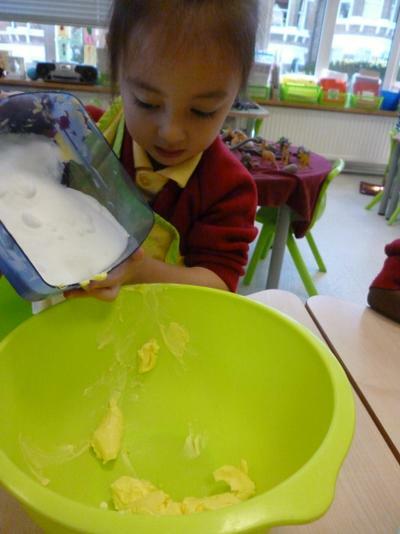 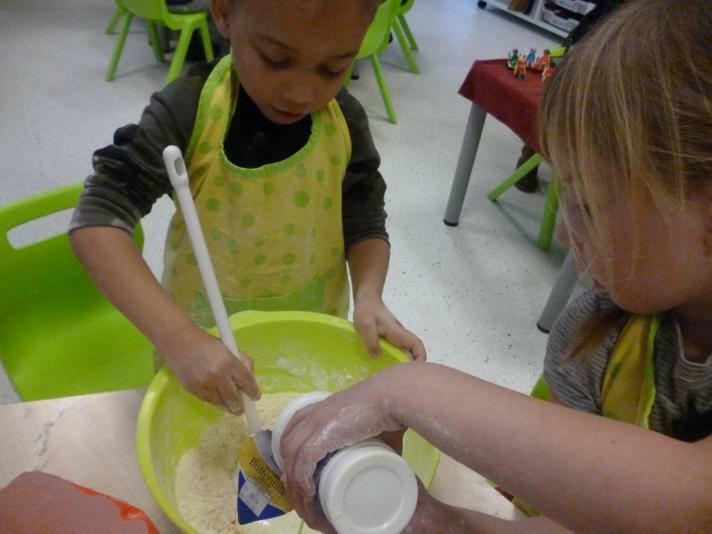 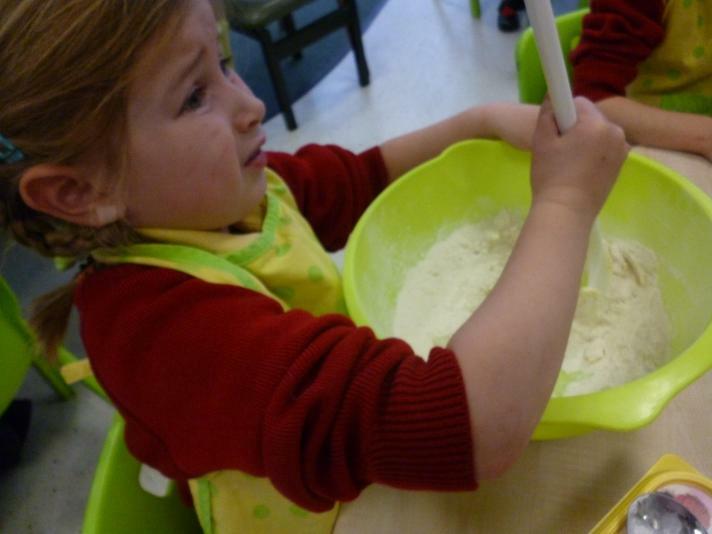 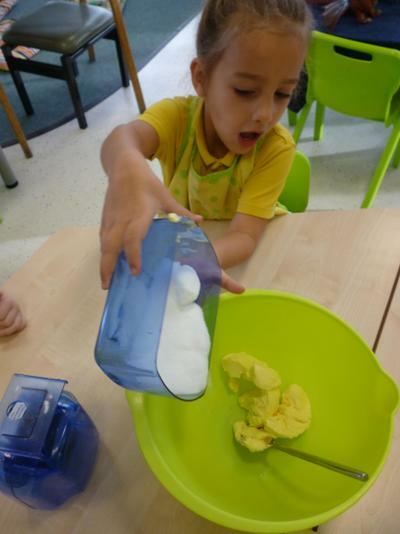 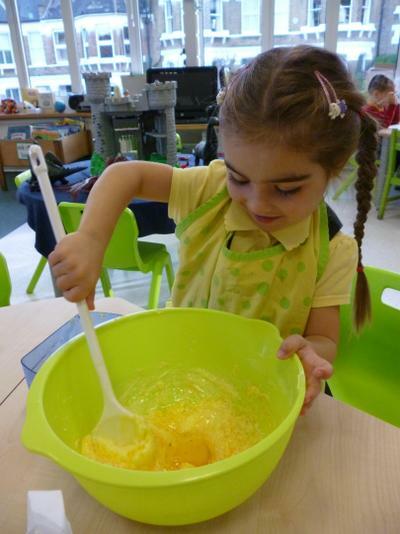 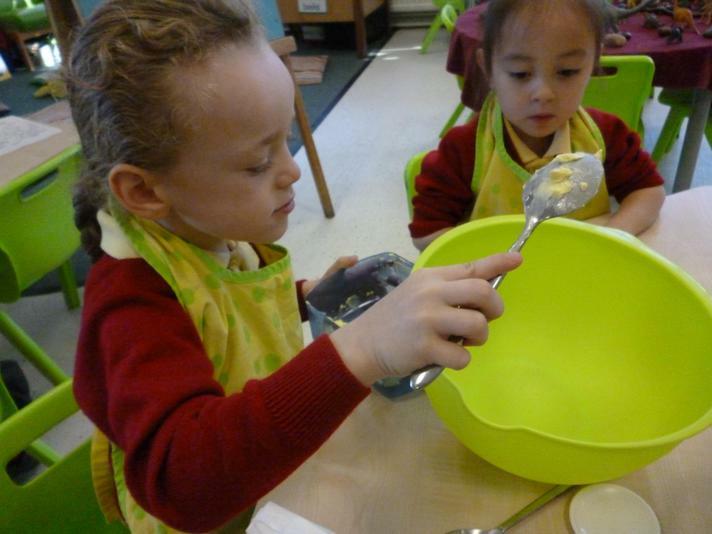 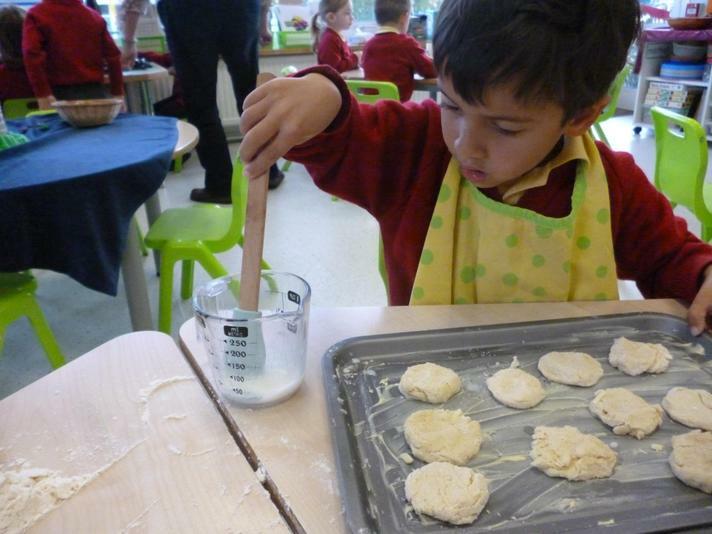 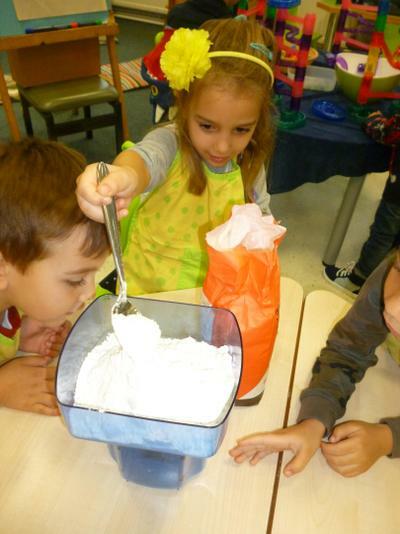 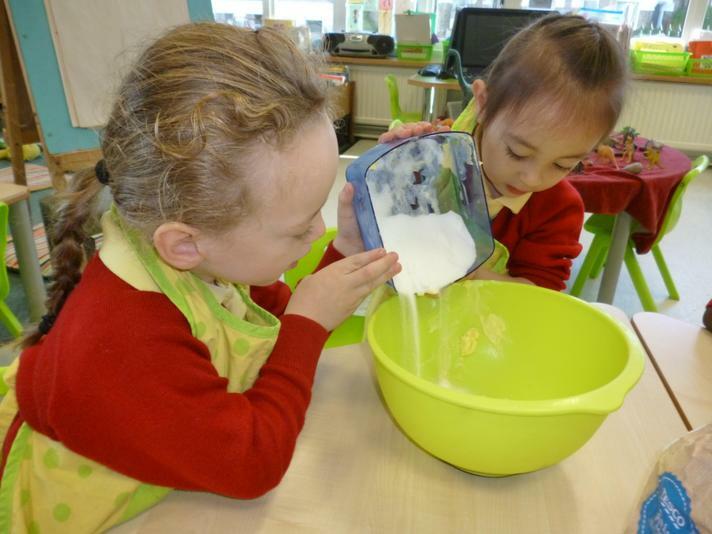 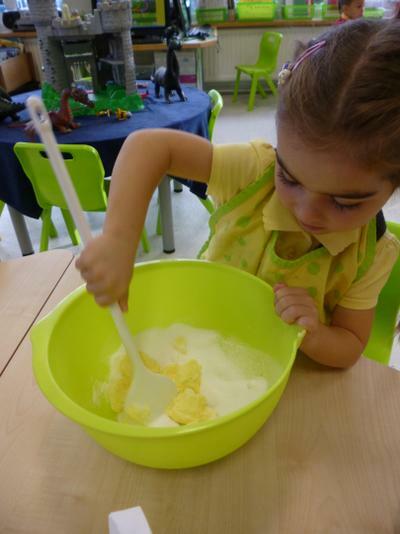 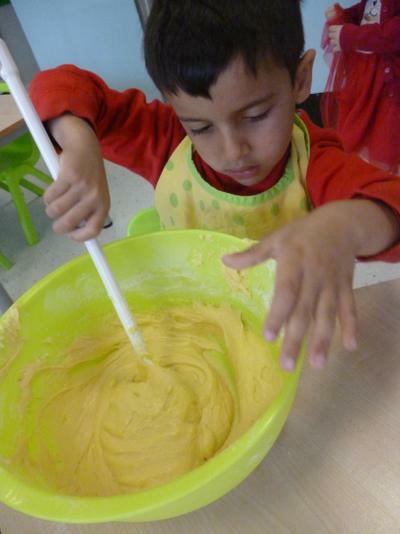 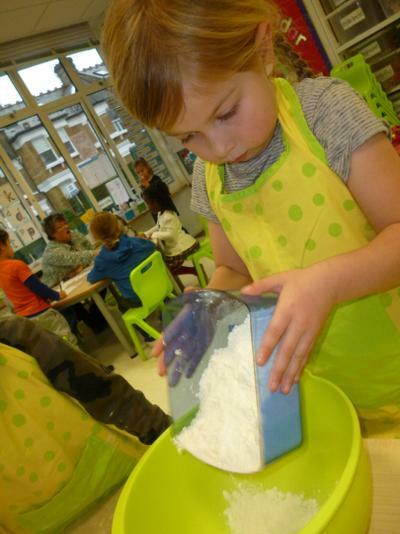 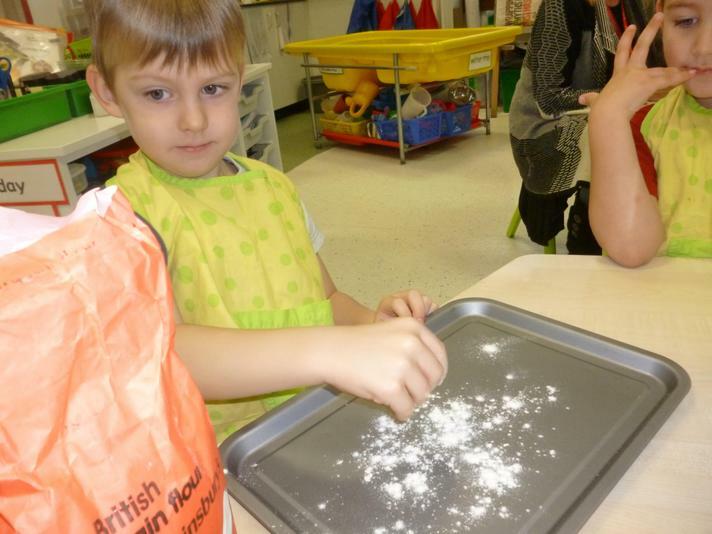 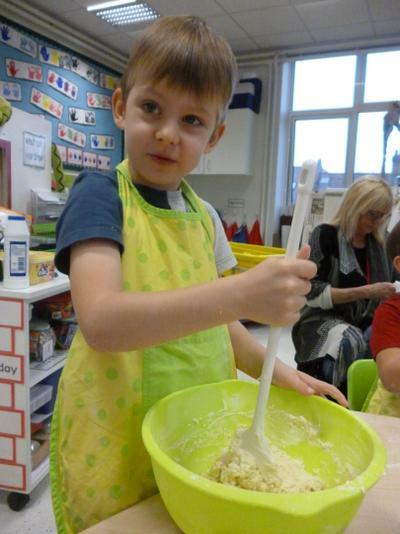 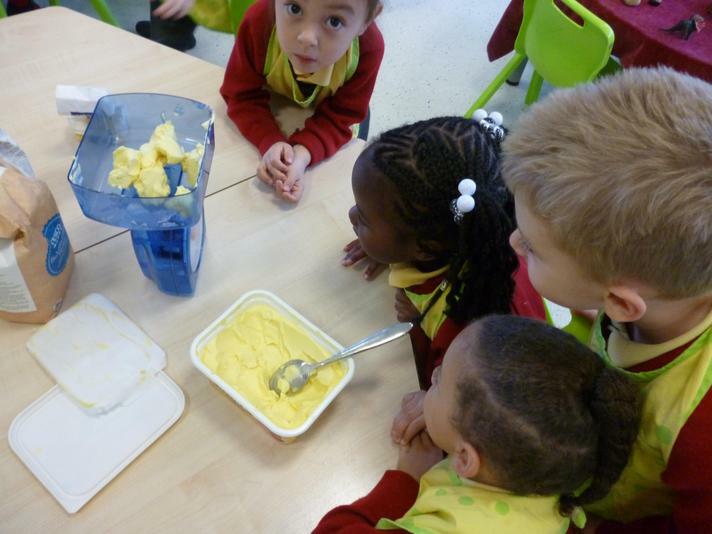 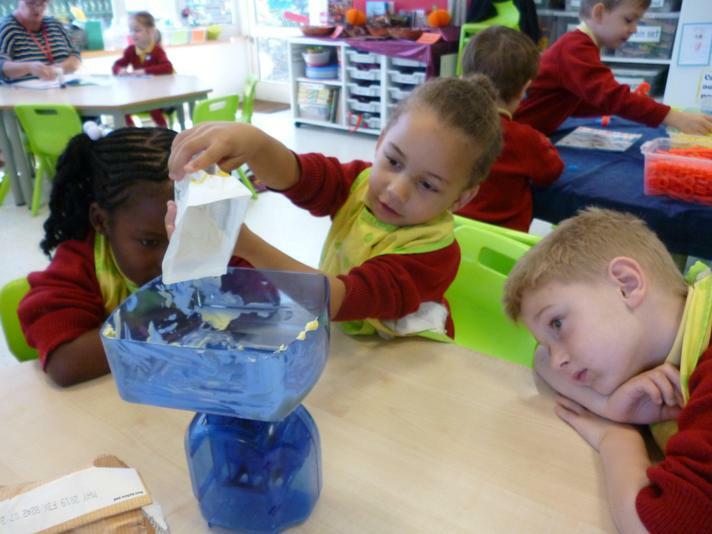 cream the butter and sugar together add the flour and eggs and the baking powder. 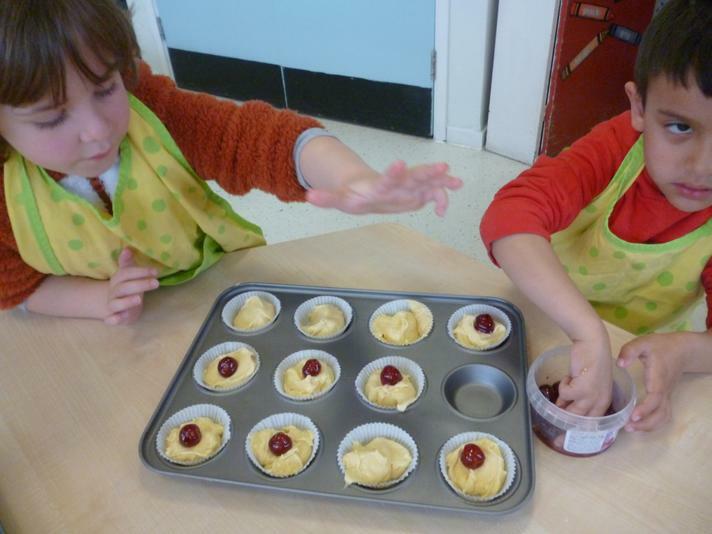 Spoon into cake cases and place a glace cherry on the top of each cake, bake for 15-20 minutes at 190 degrees. 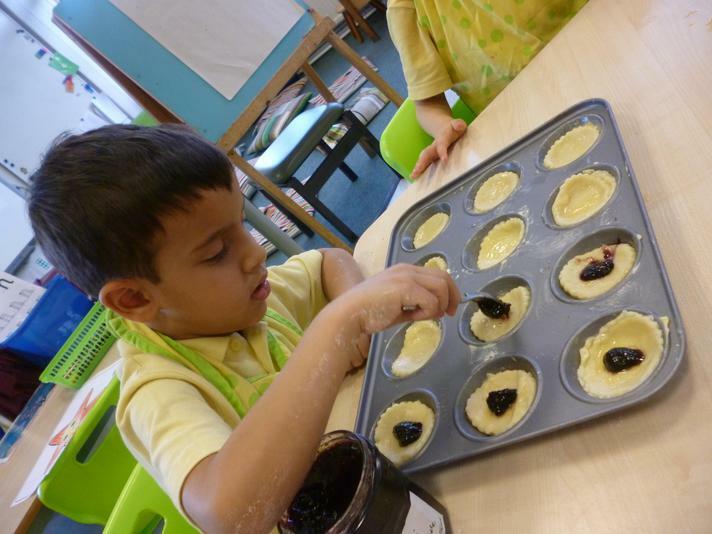 as the cakes cook the cherries disappear into the cake hence the surprise when you bite into it!!! 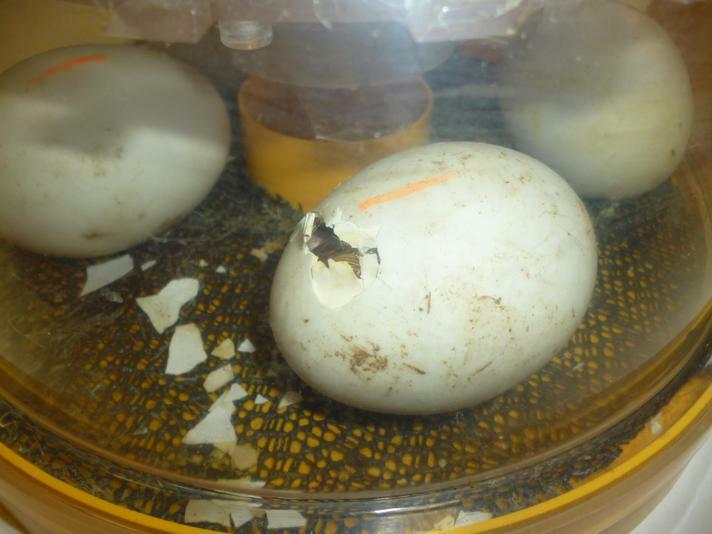 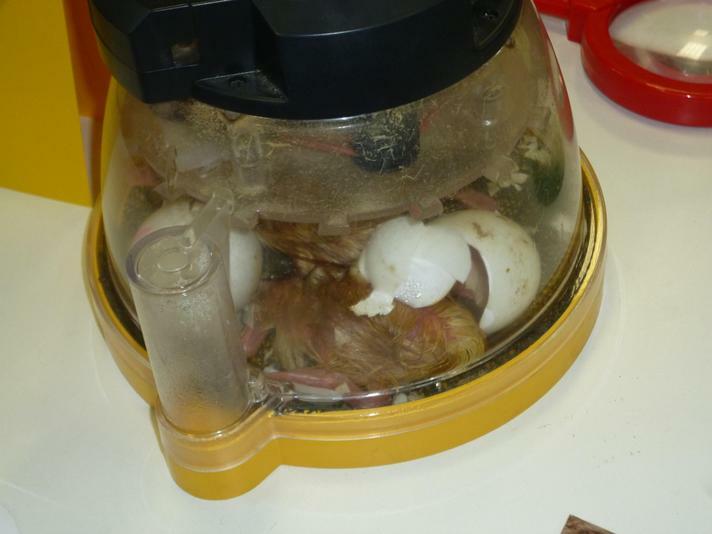 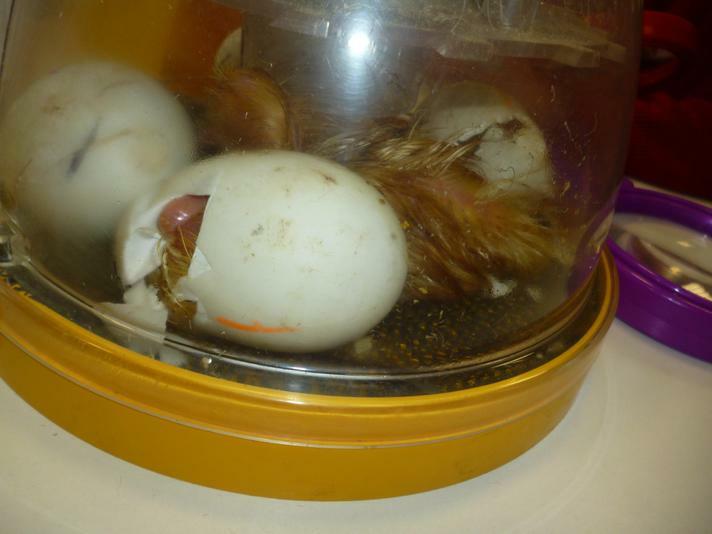 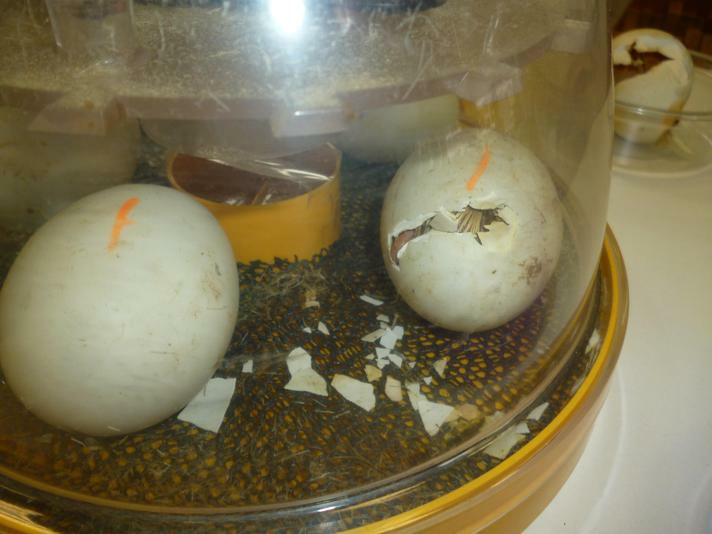 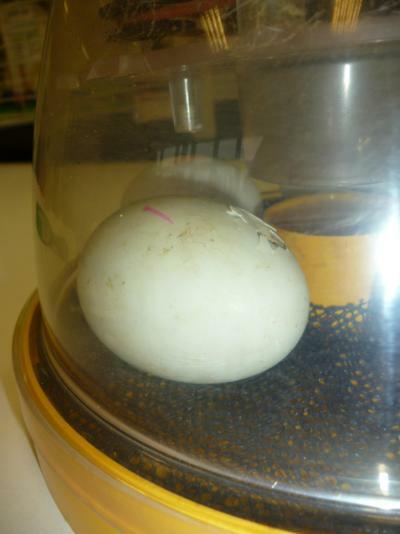 Duck Diary Day 4- Unfortunately the last egg in the incubator did not hatch out of the egg and has died. 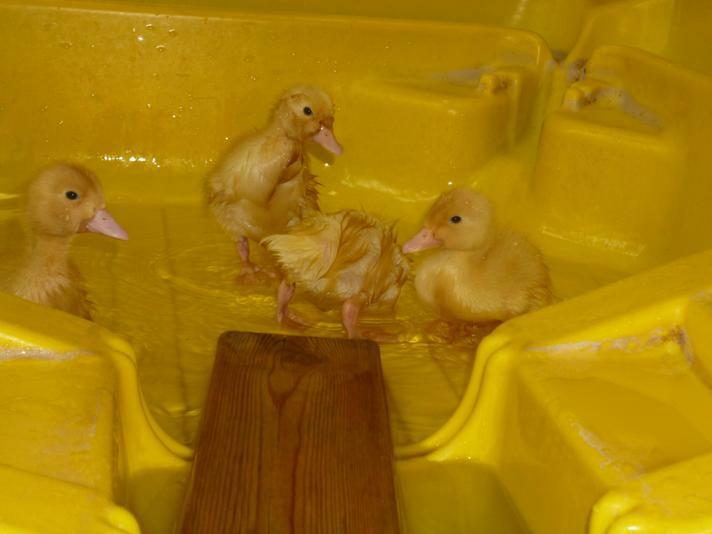 We still have our four lovely ducklings in the brooder and they are very active, stretching their legs and wings and running around. 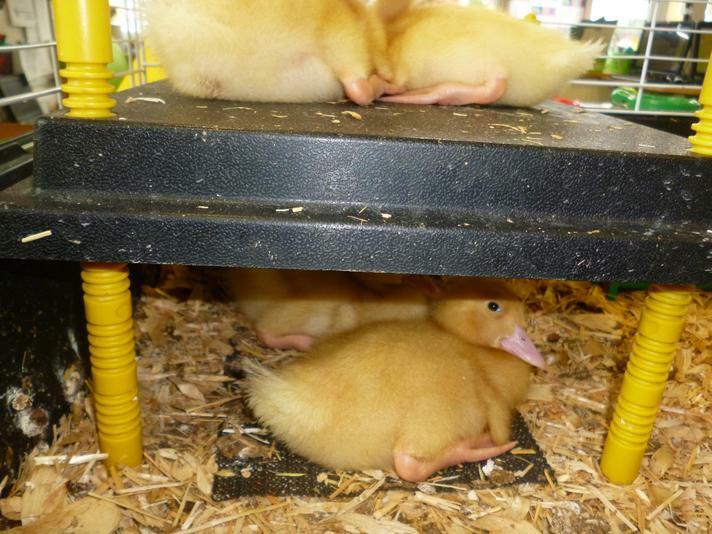 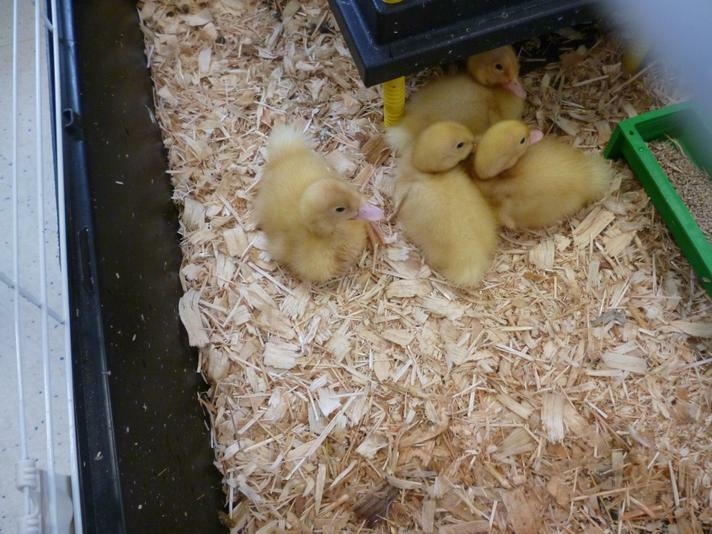 They get tired very quickly and like to sleep in a ducky pile all cosy together. 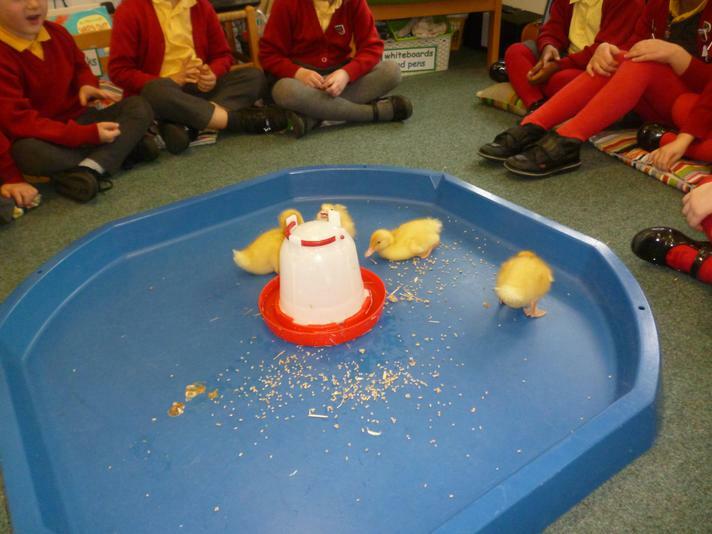 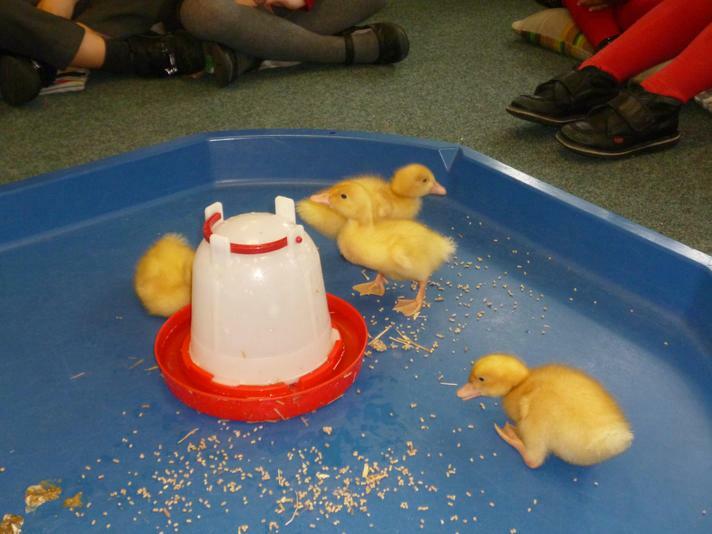 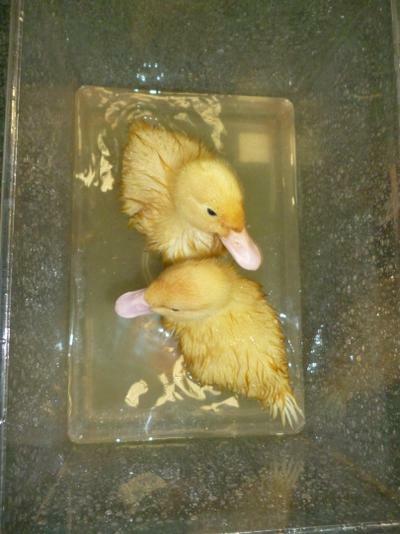 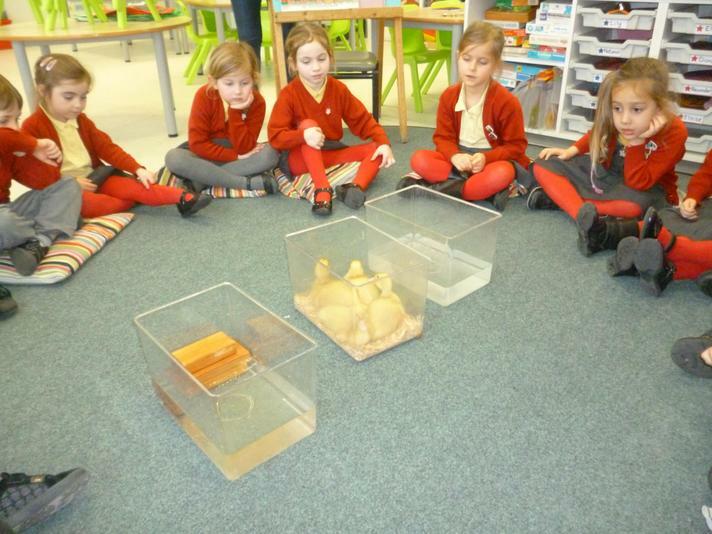 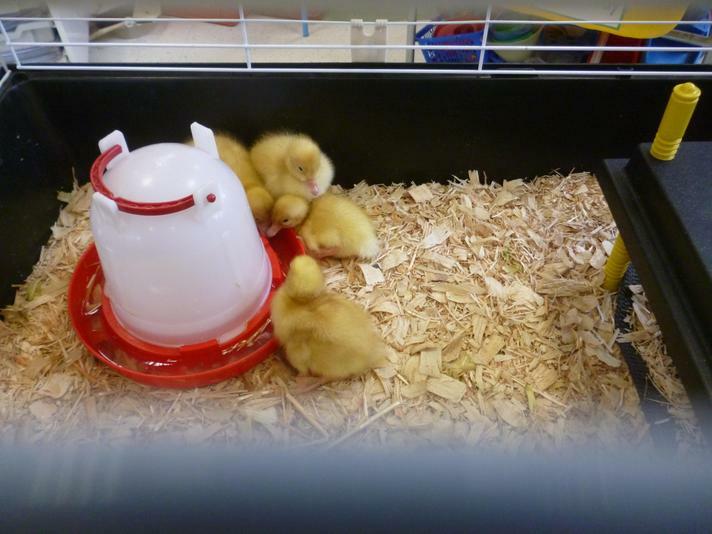 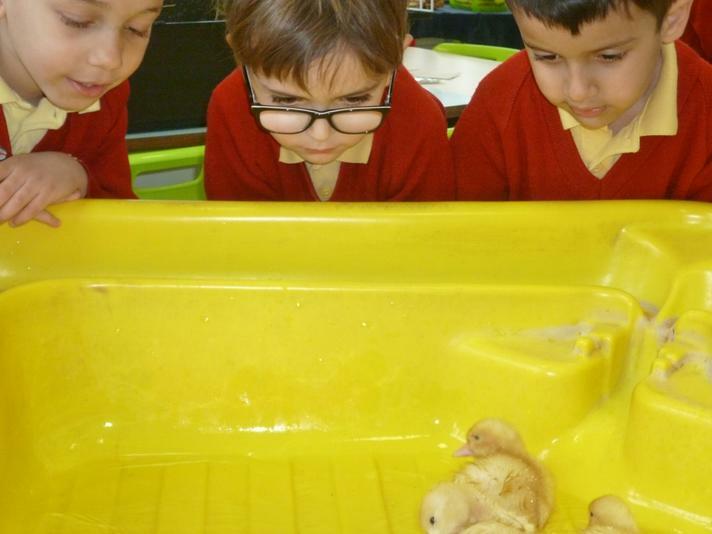 We are enjoying watching them and cannot wait to see them swim in our water tray next week. 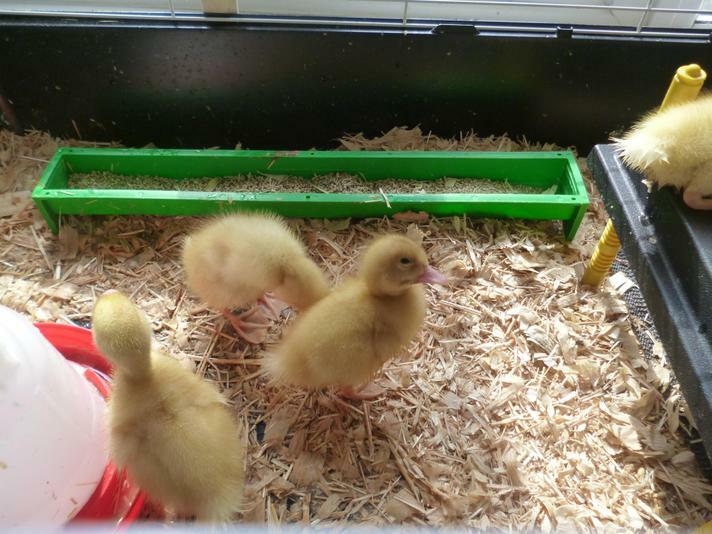 Duck Diary -Day 3 Another duckling hatched last night so now we have 4 lovely ducklings.The new ones have been named Bobble, Chirpy and Sweetheart. 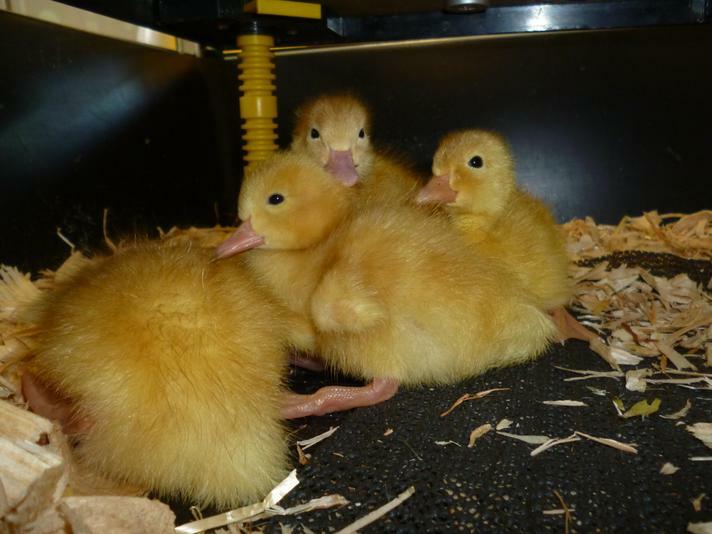 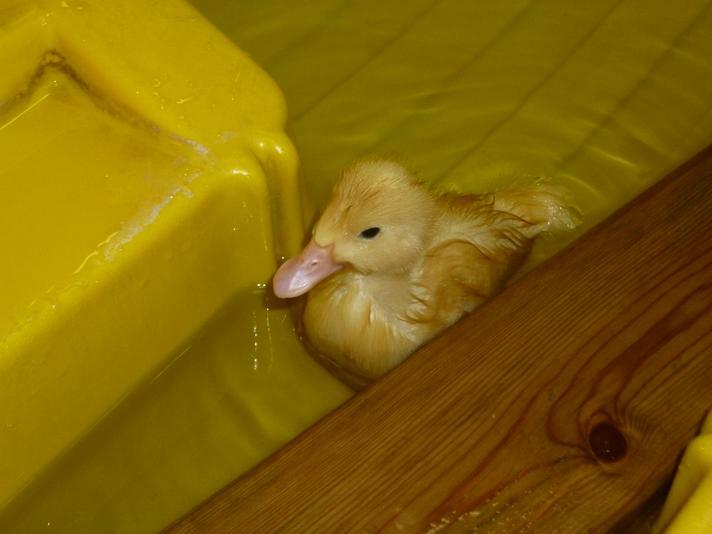 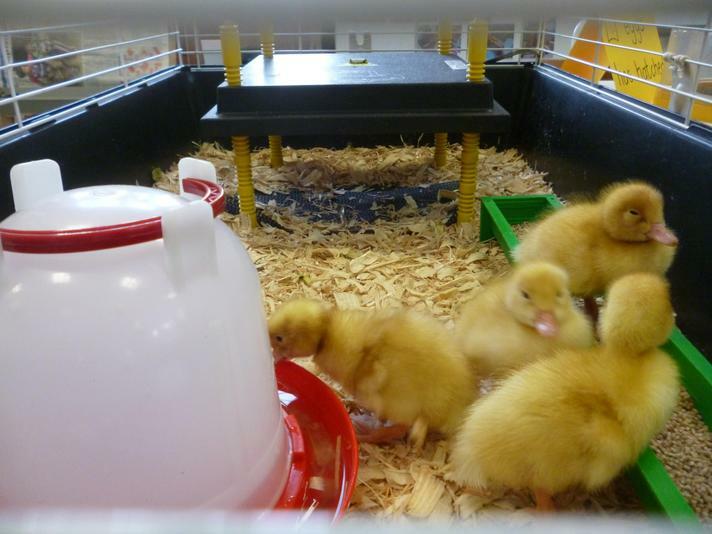 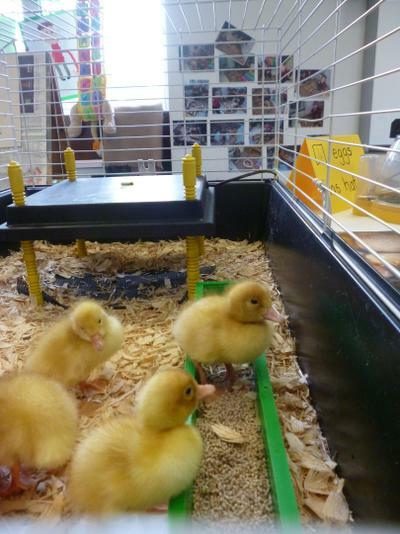 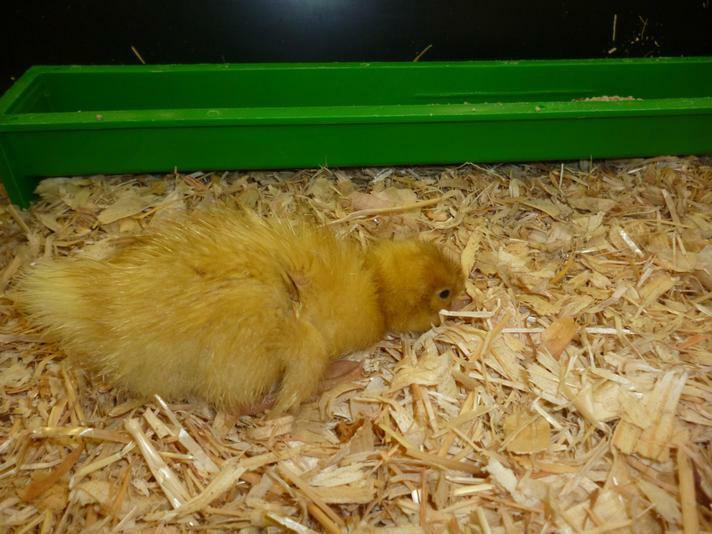 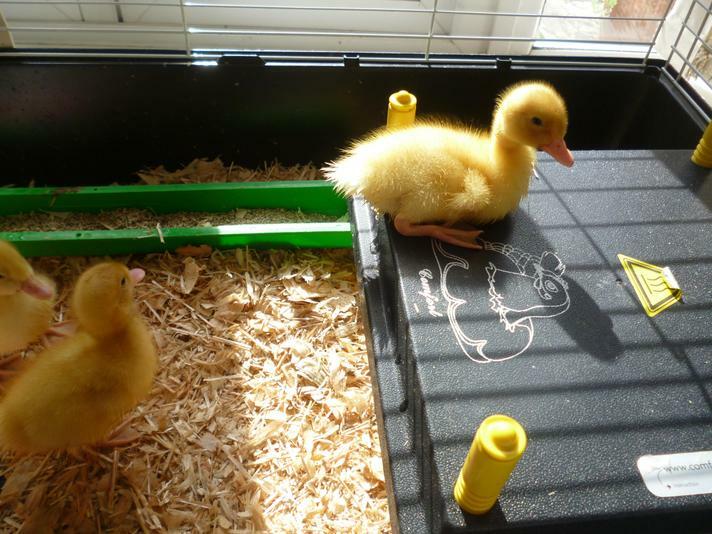 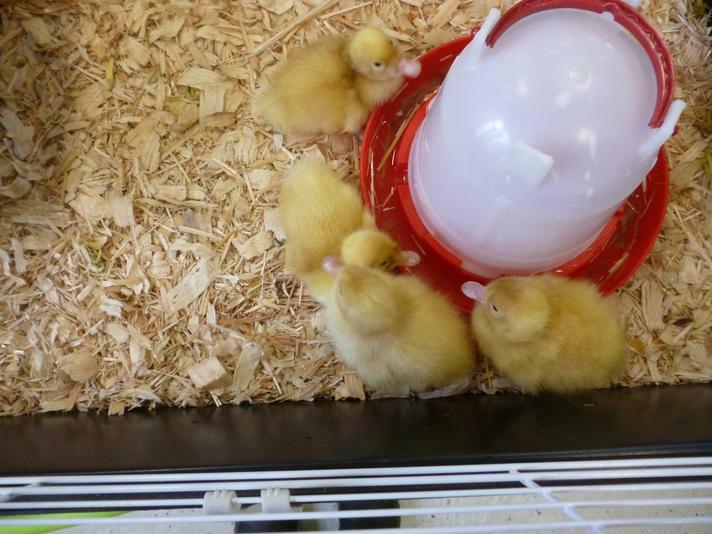 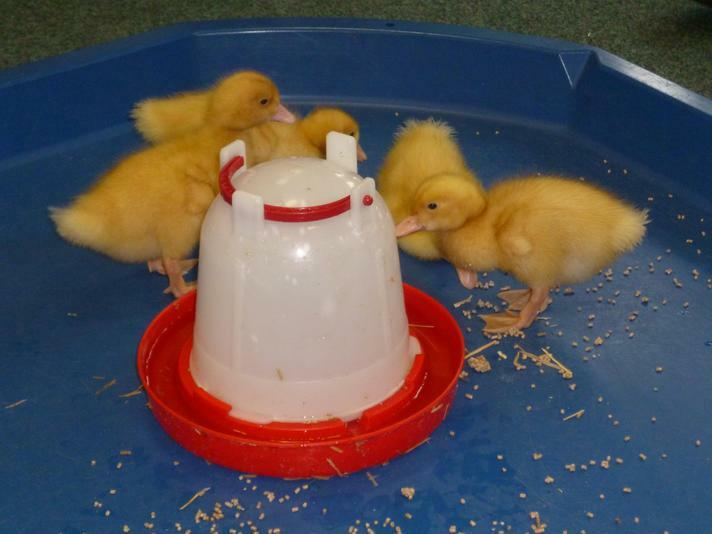 They are in the brooder with Cutie Pie and are all enjoying drinking lots of water and tasting the duckling food. 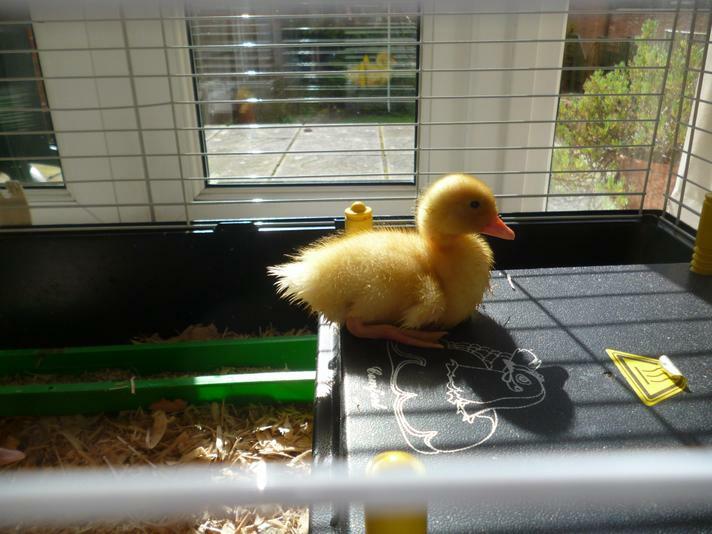 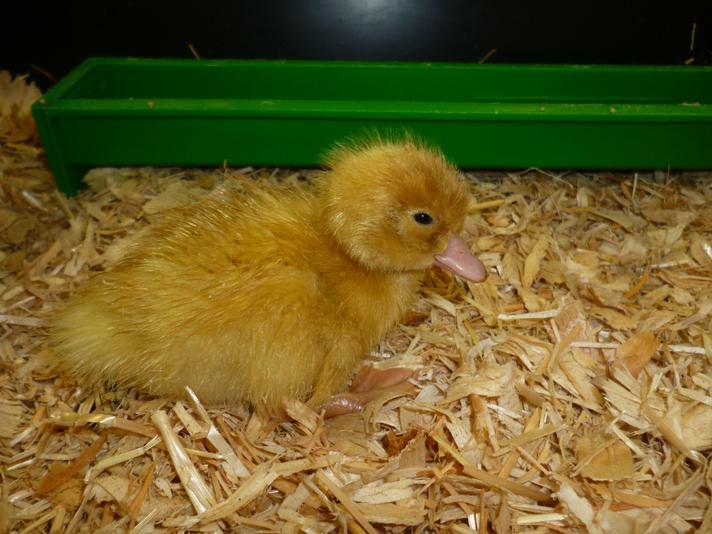 Duck Diary Day 2 Last night one duckling hatched, this morning we put her in the brooder and choose the name Cutie Pie for her. 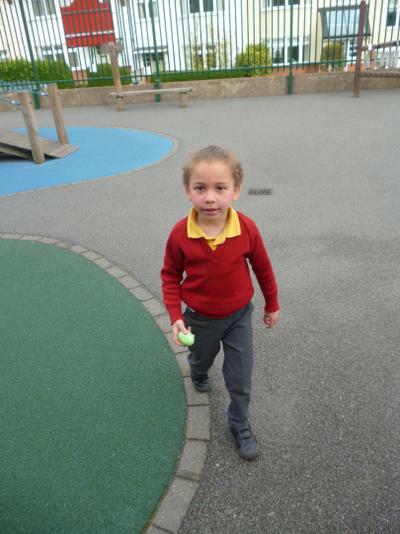 She is very active and very noisy. 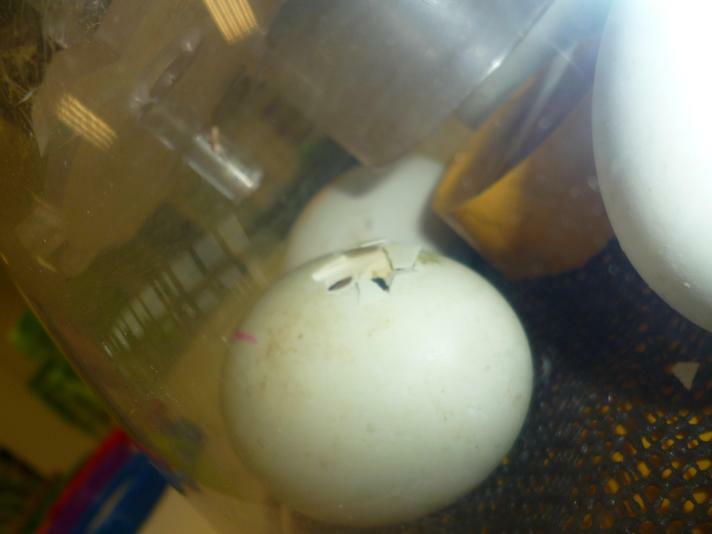 We could see that 2 other eggs had big holes in the shell, so we watched them closely and just before lunch they both hatched. 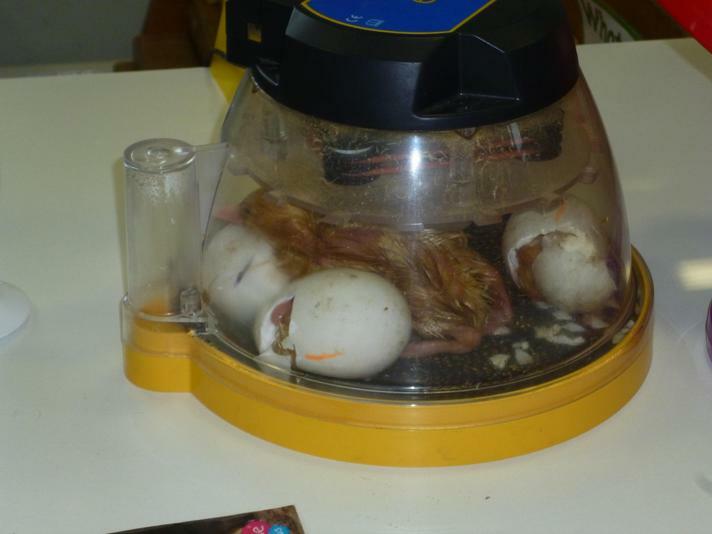 We left them in the incubator all afternoon to dry out. 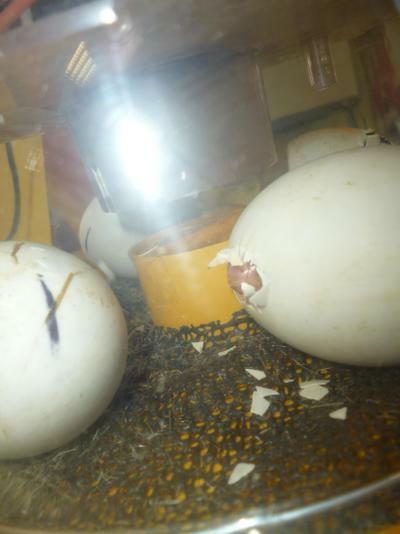 About one hour after home time another duckling cracked out of the shell. 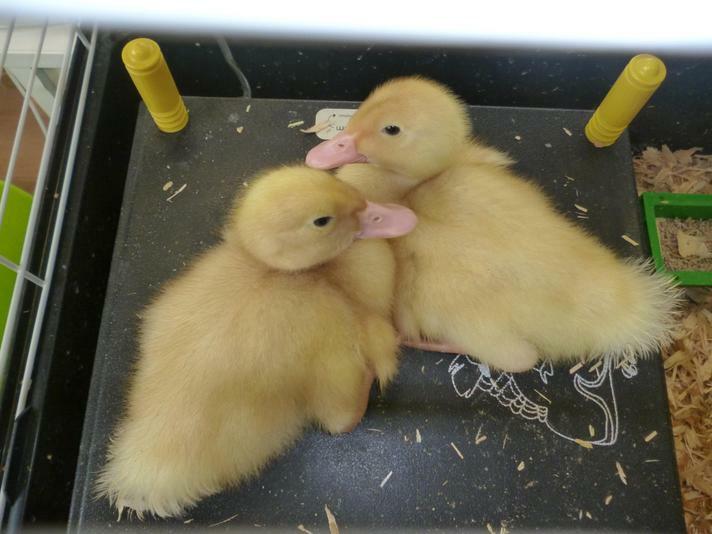 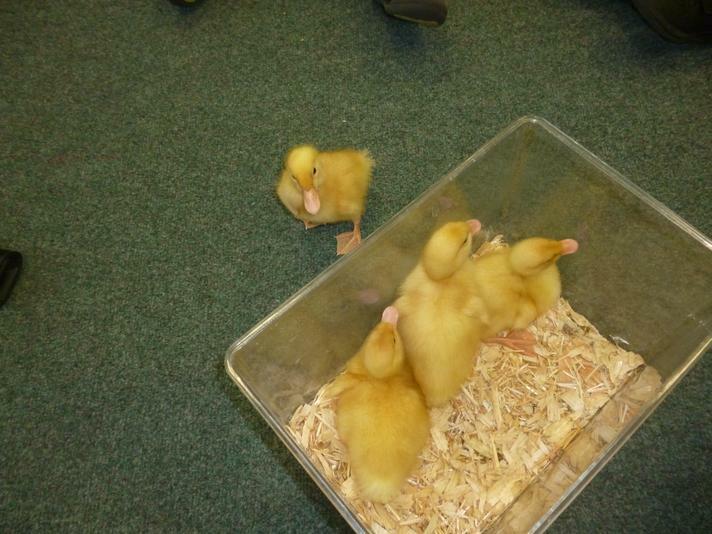 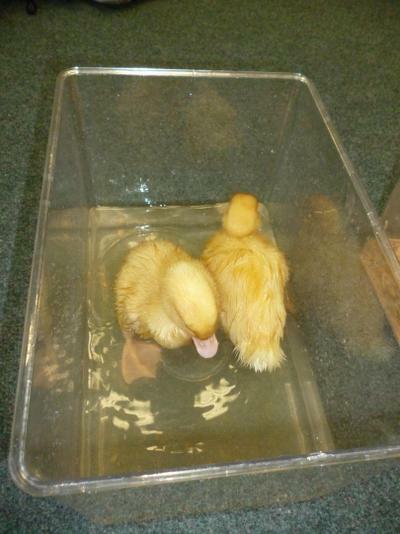 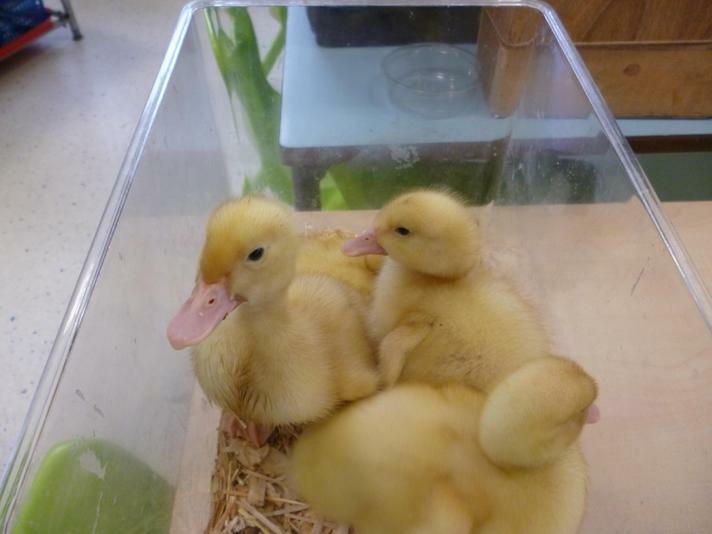 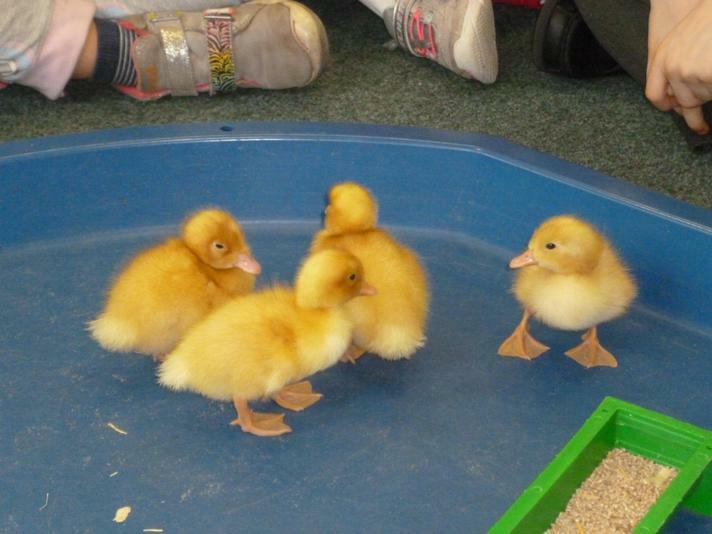 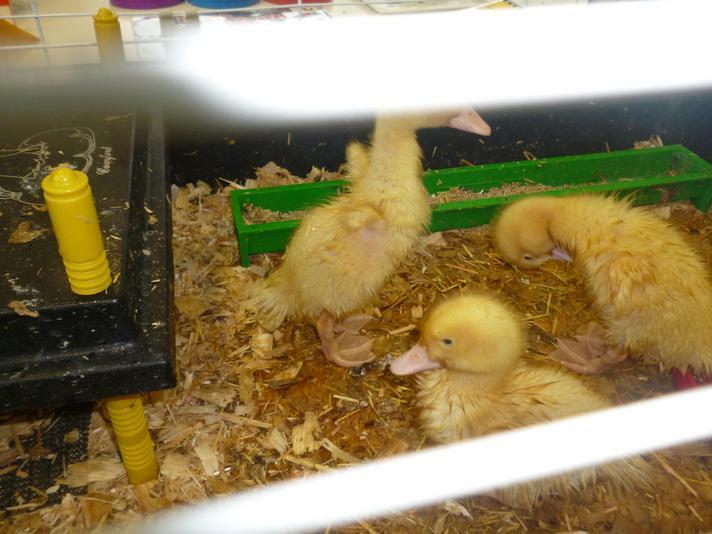 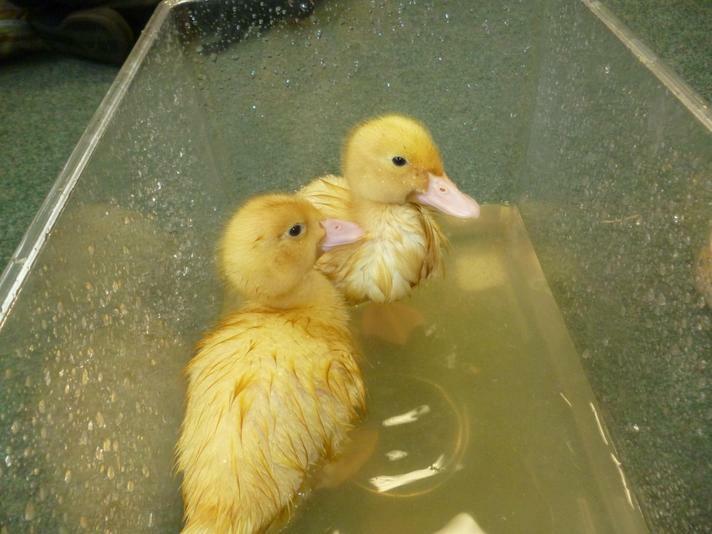 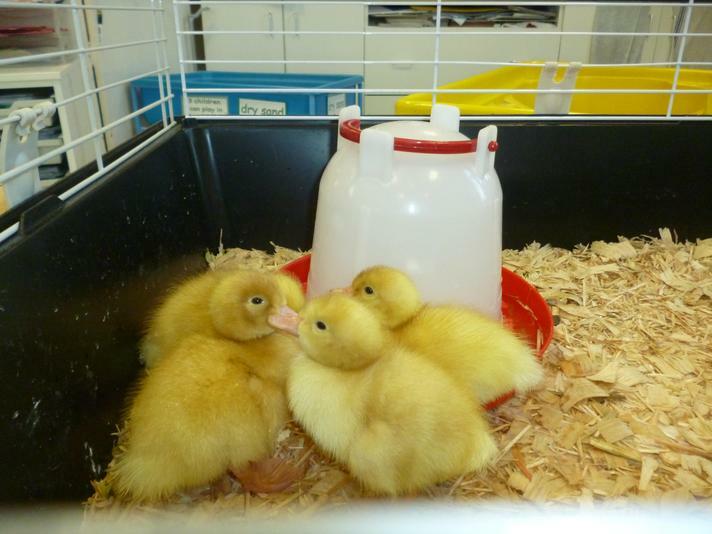 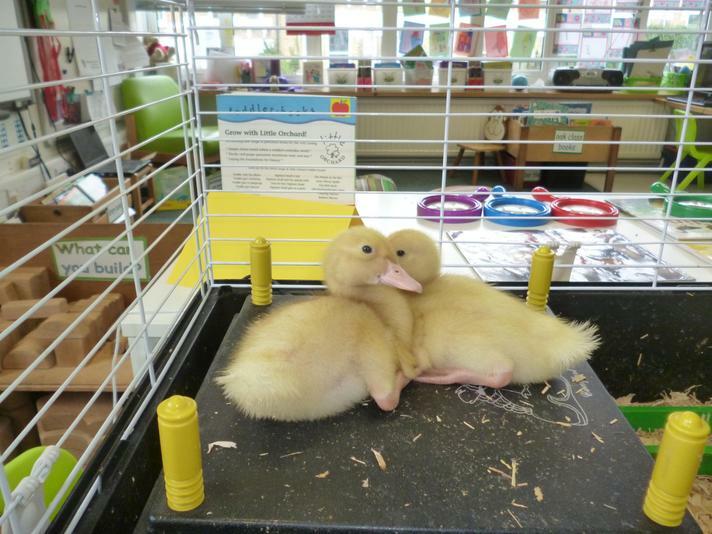 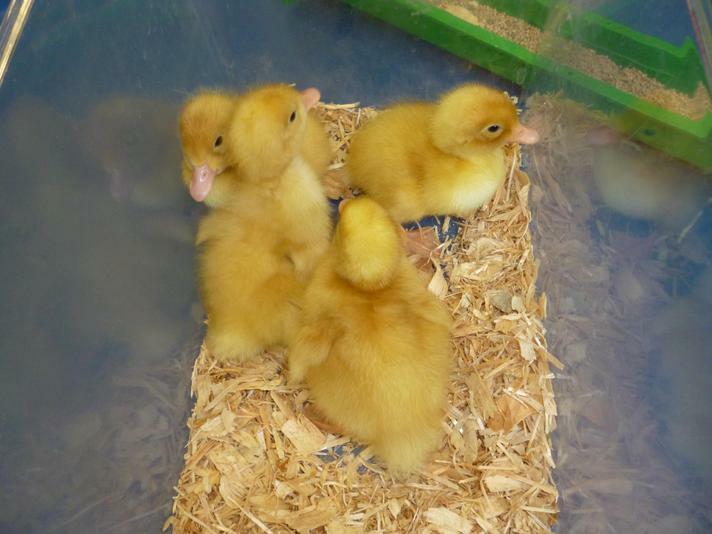 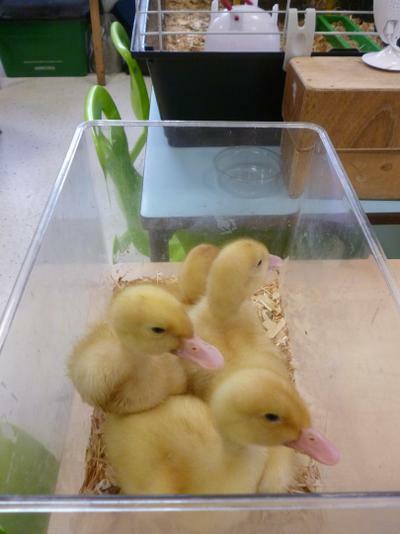 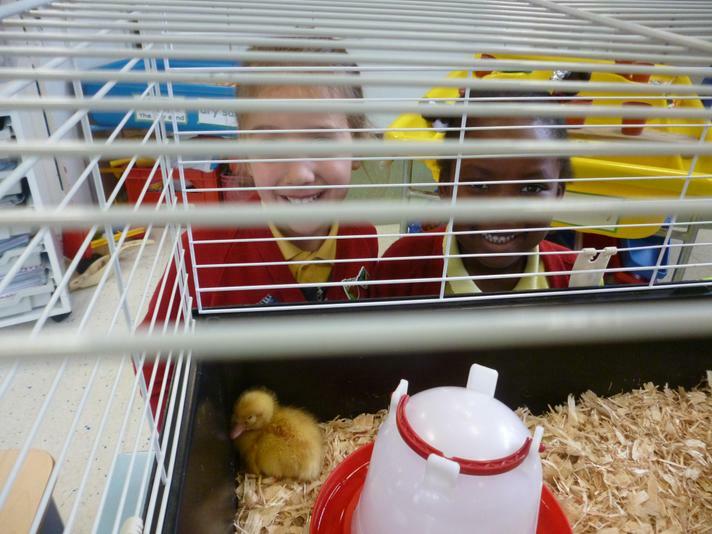 We have to choose names for these ducklings tomorrow. 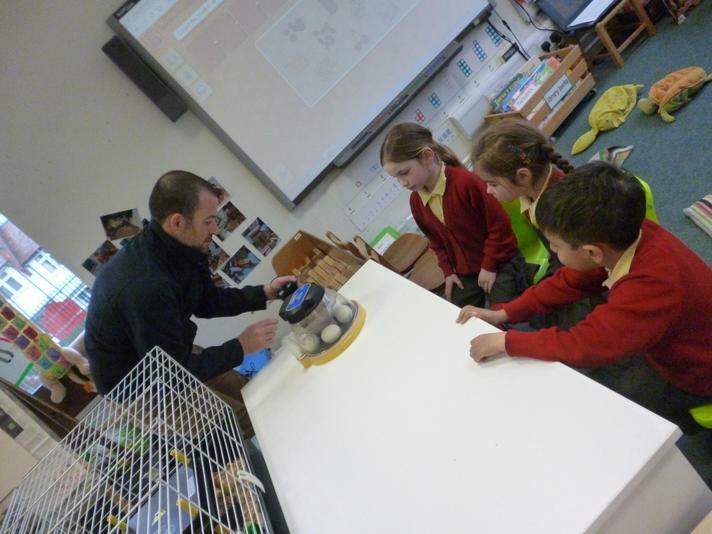 Duck diary- day 1 Today farmer Ted arrived with the eggs for Oak and Chestnut classes. 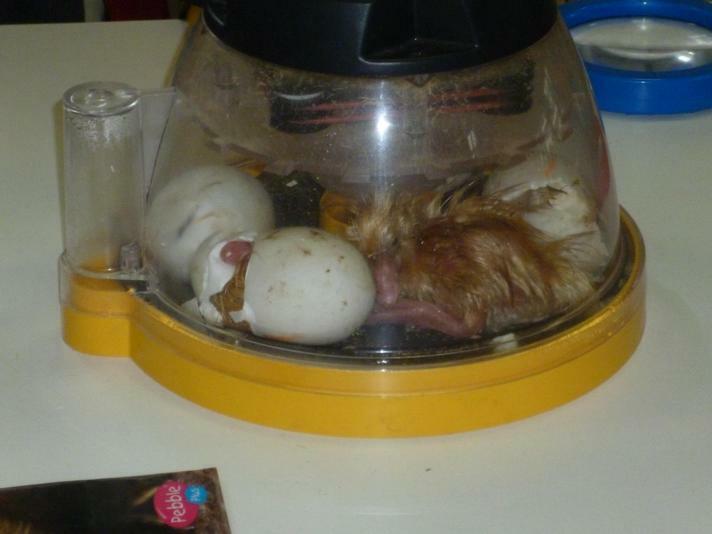 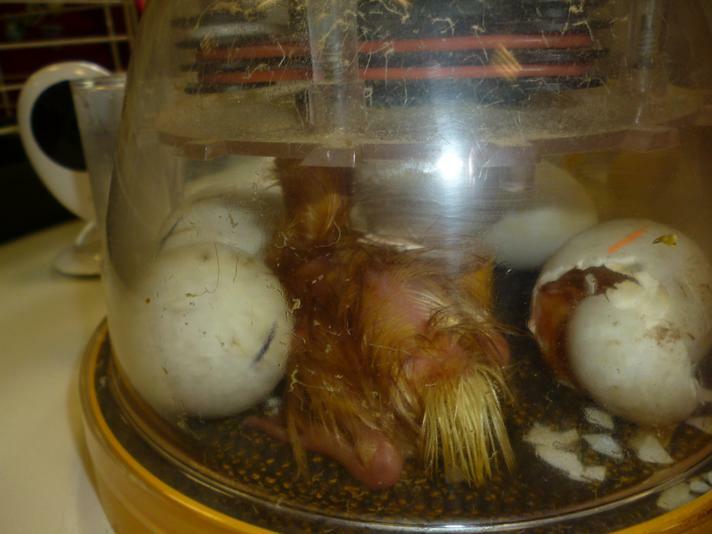 He brought us 5 eggs each, he set up the incubator and the brooder and got everything ready for us. 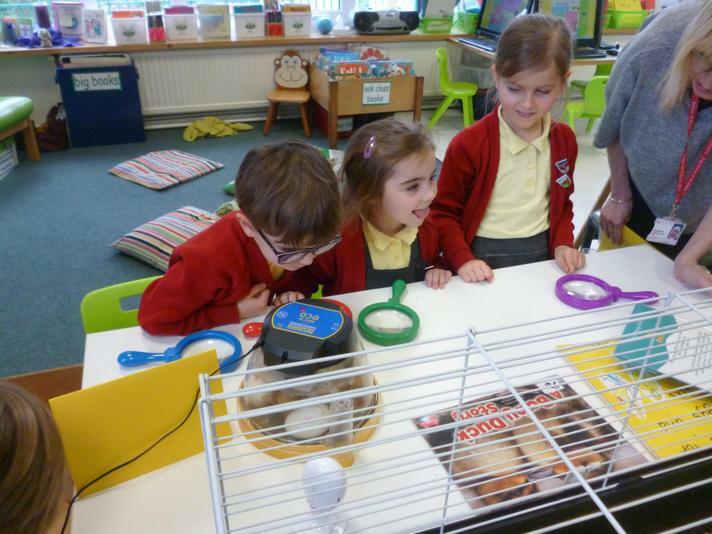 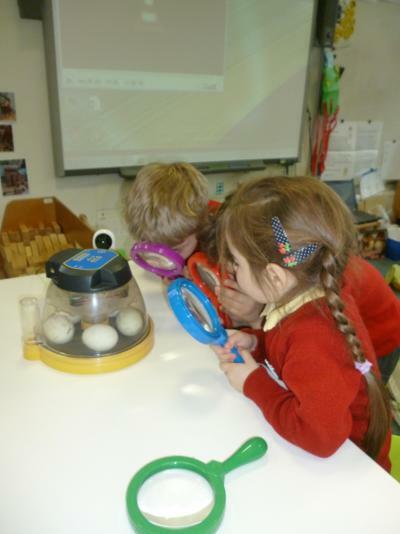 He told us that 2 of the eggs already had little peck holes so we have been watching them carefully. 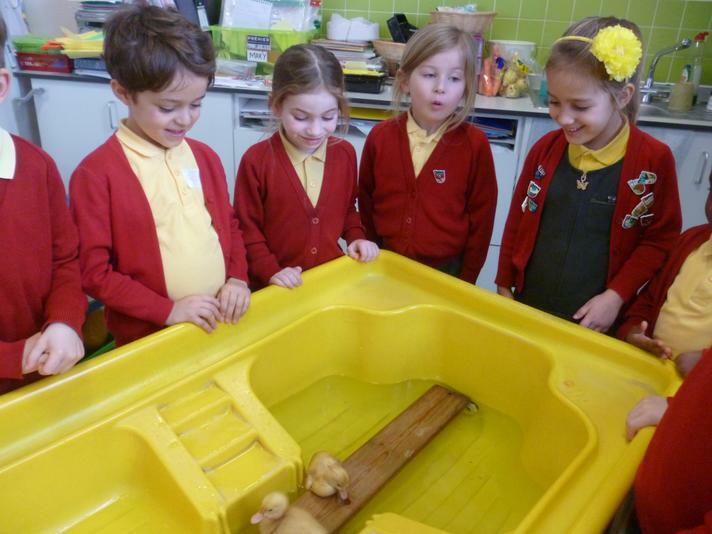 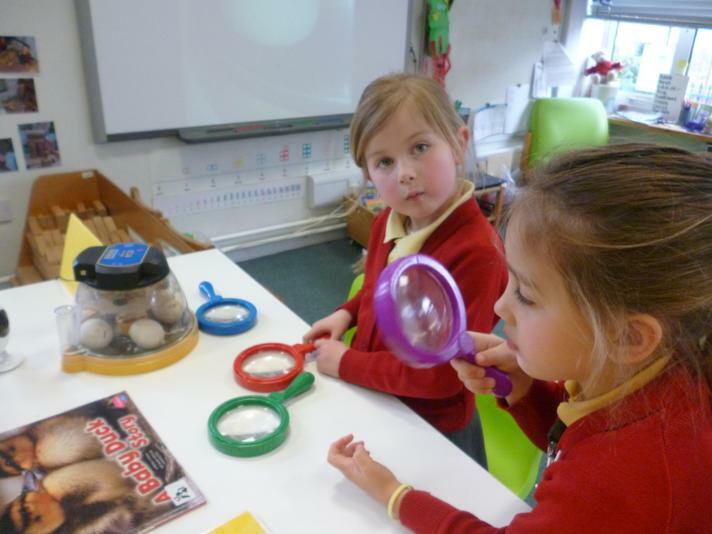 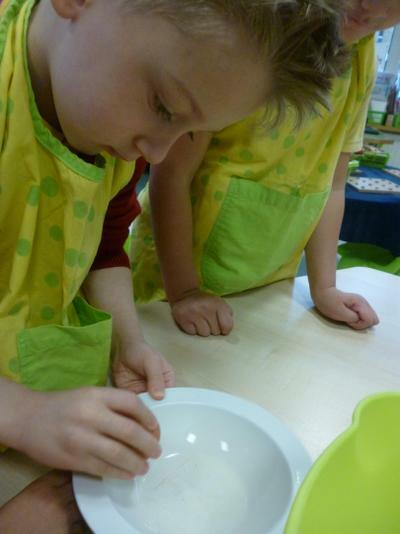 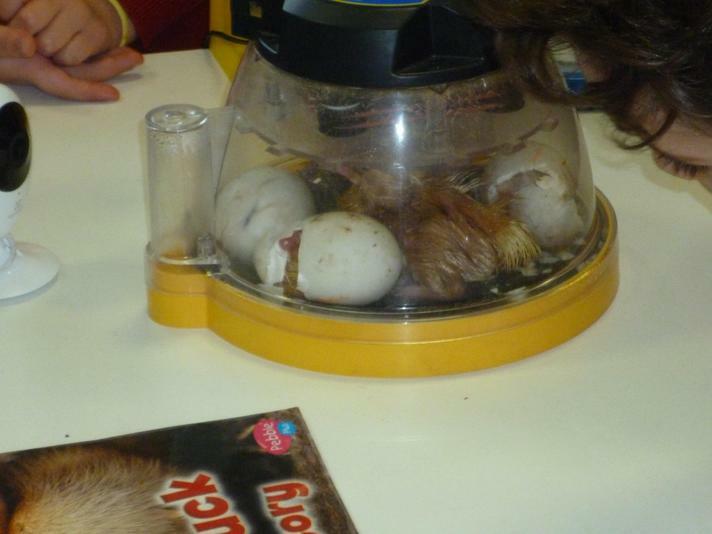 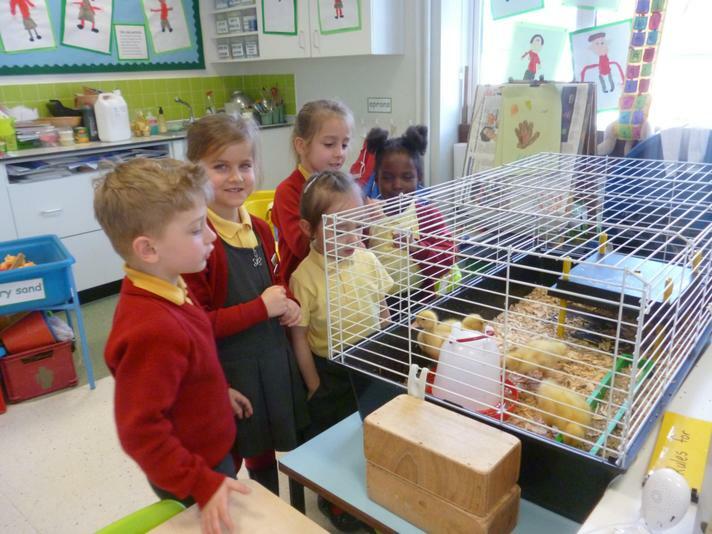 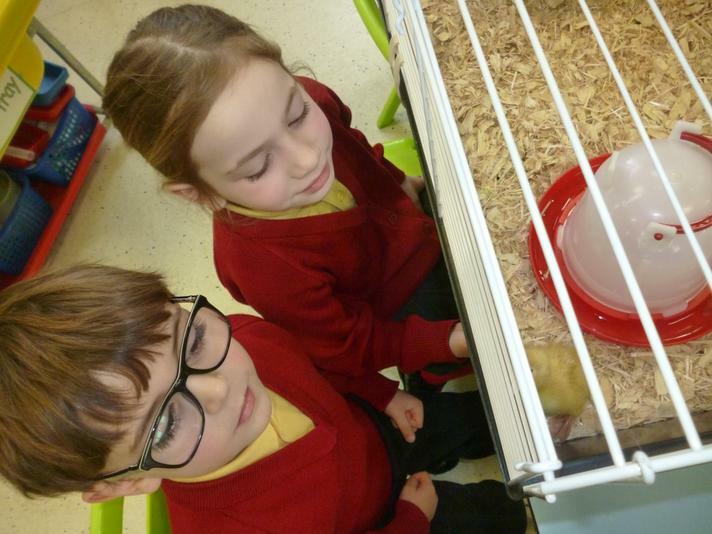 We can hear the ducklings inside the eggs cheeping if we are very quiet. 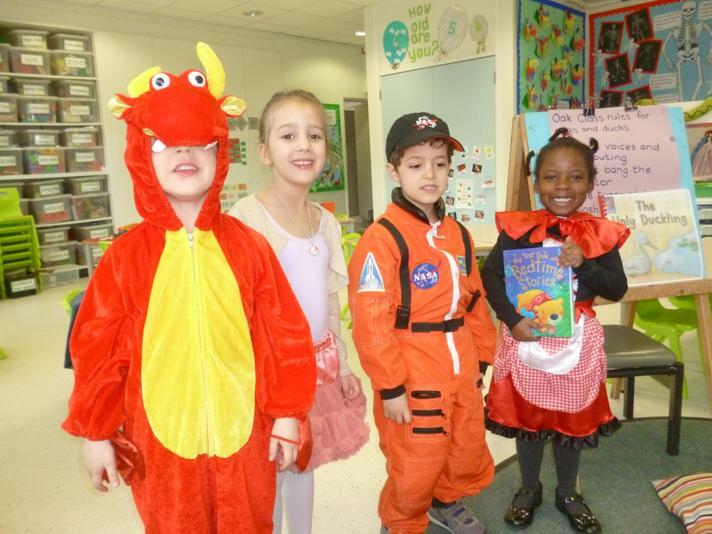 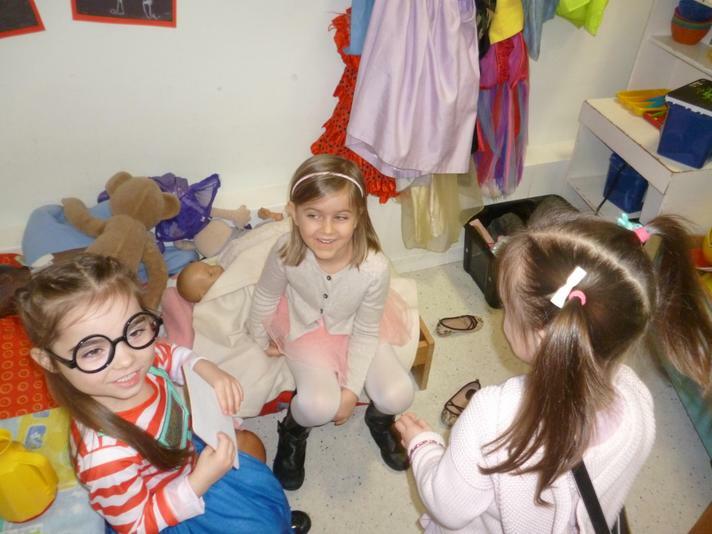 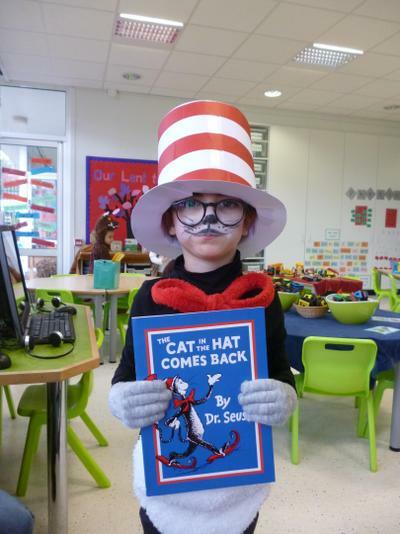 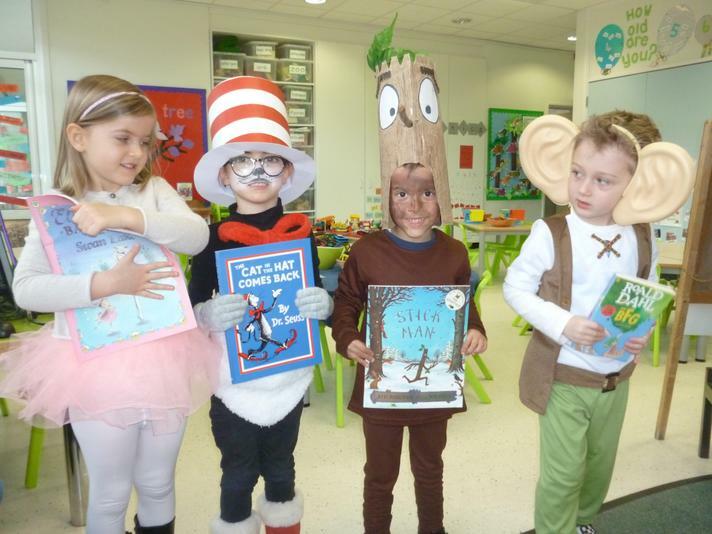 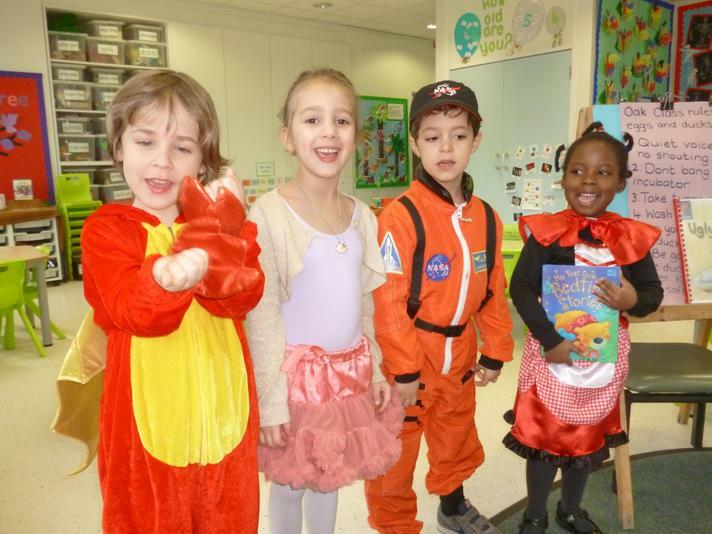 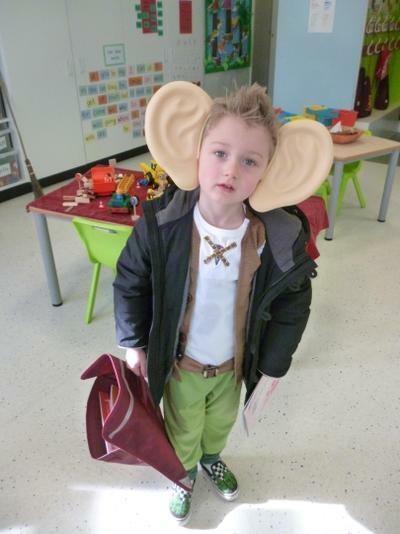 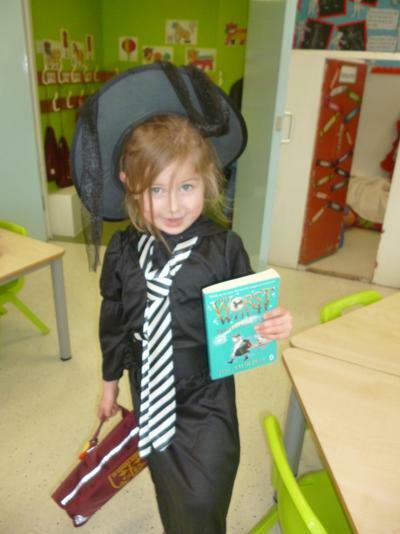 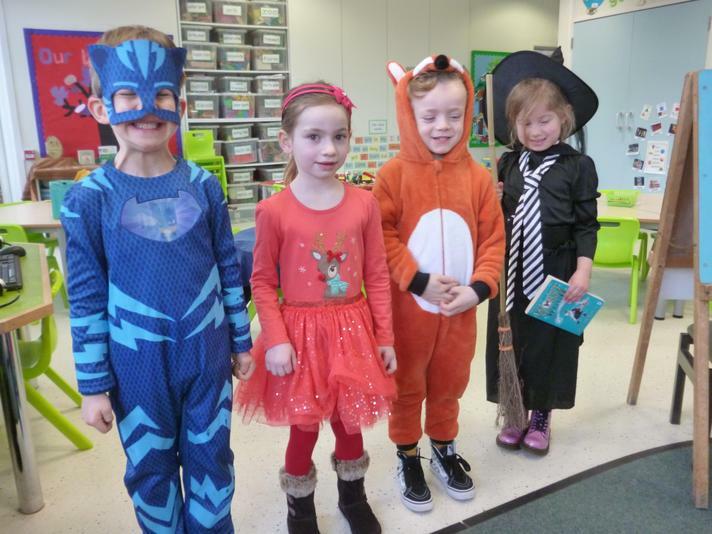 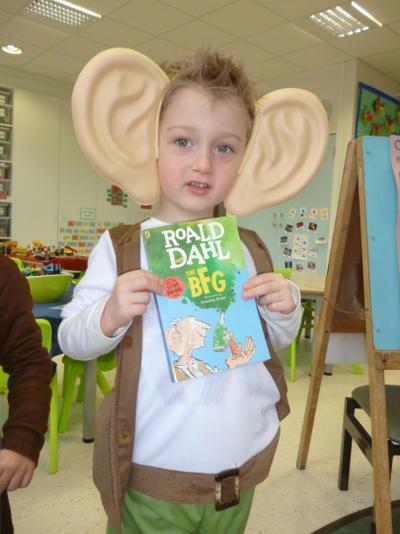 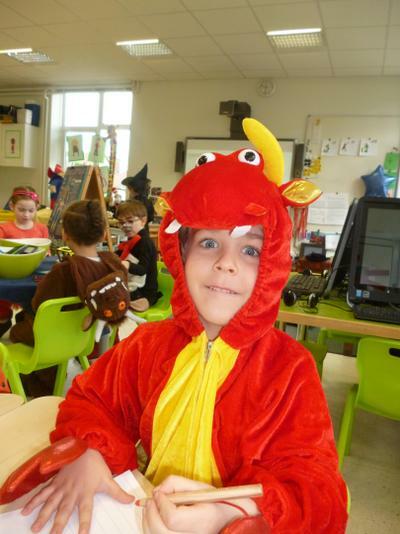 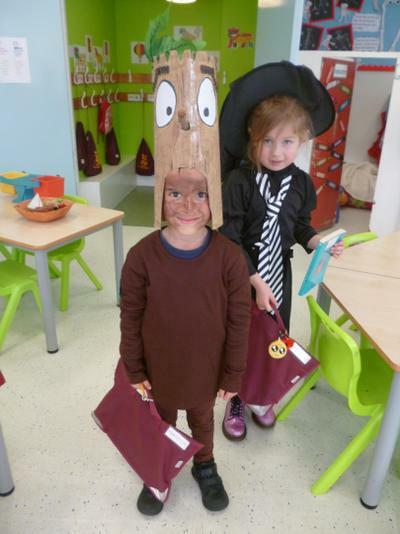 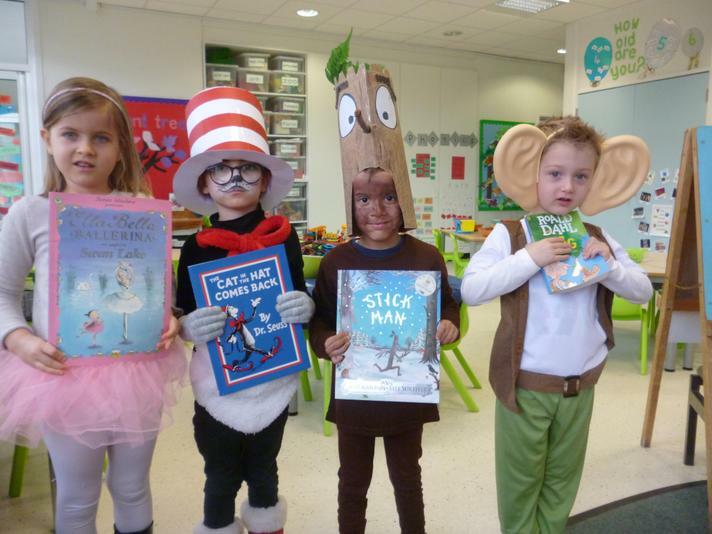 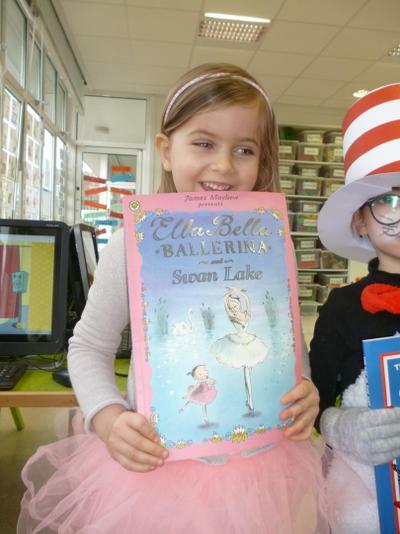 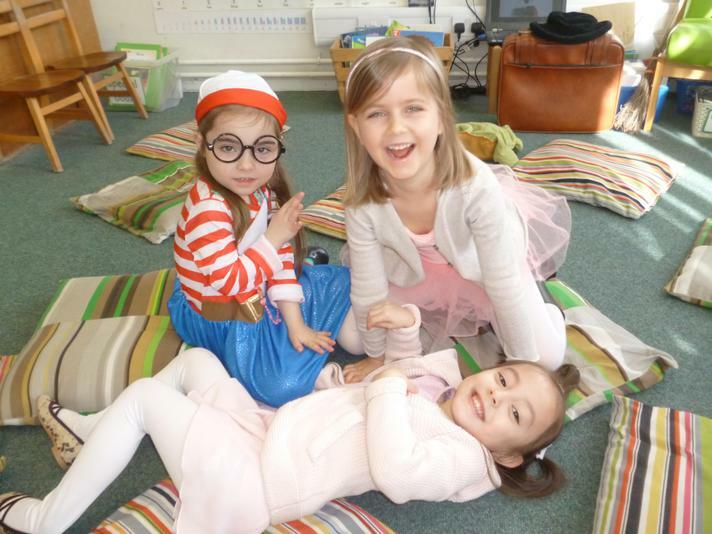 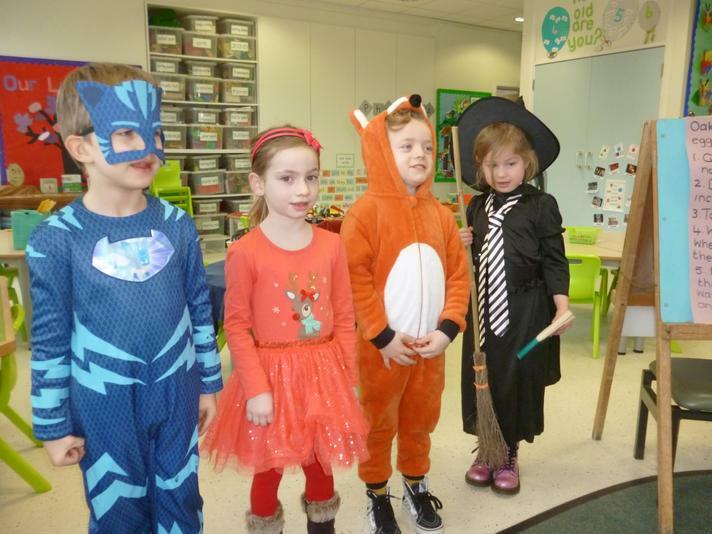 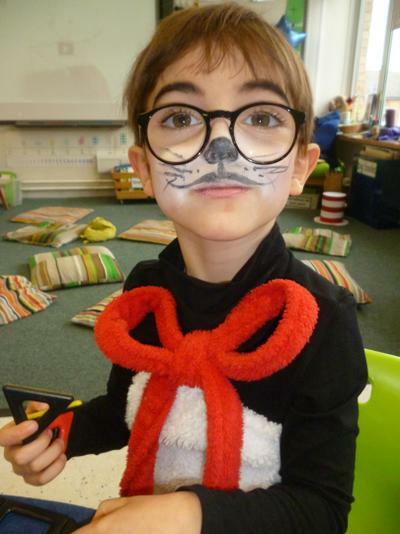 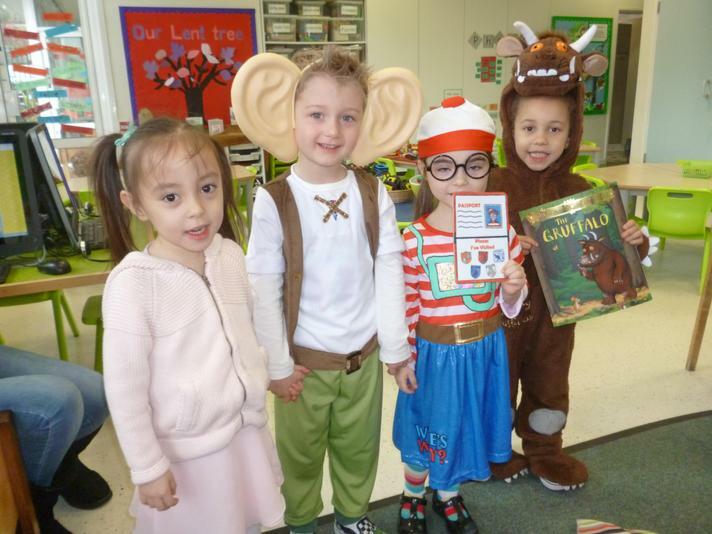 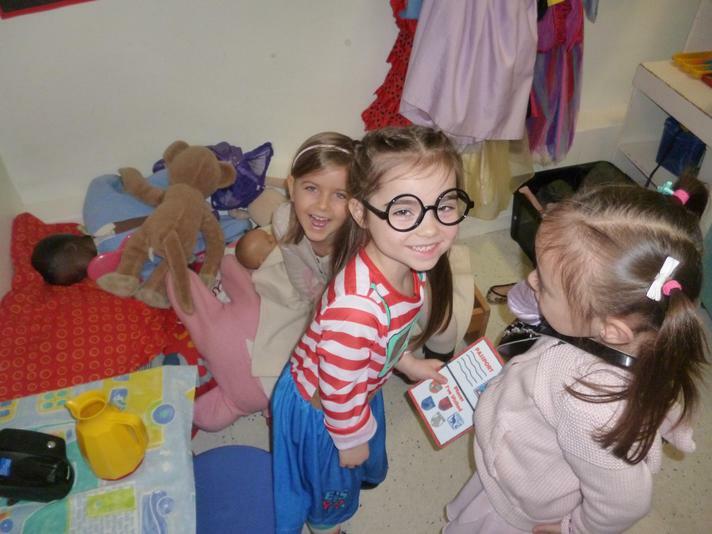 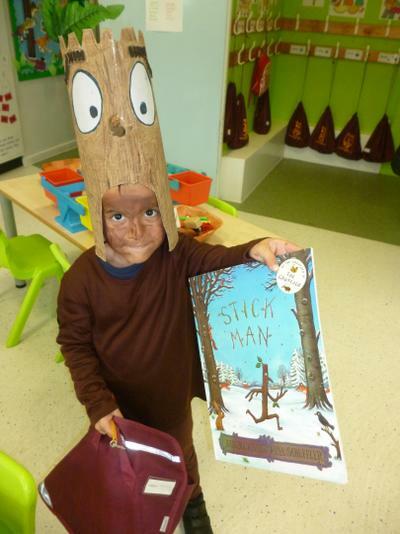 Fantastic fun on World book day, we had lots of book characters in class today! 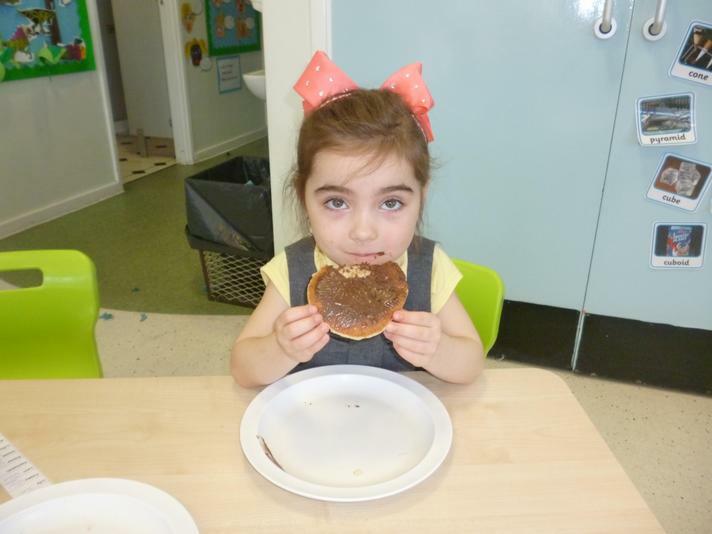 Pancake day. 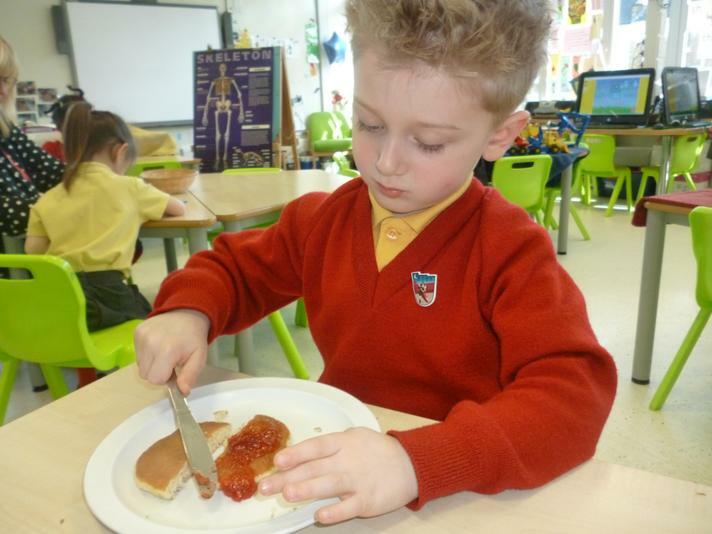 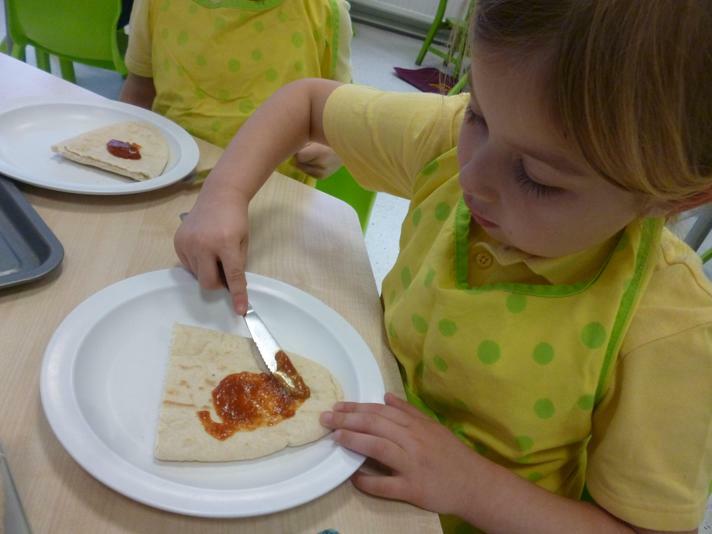 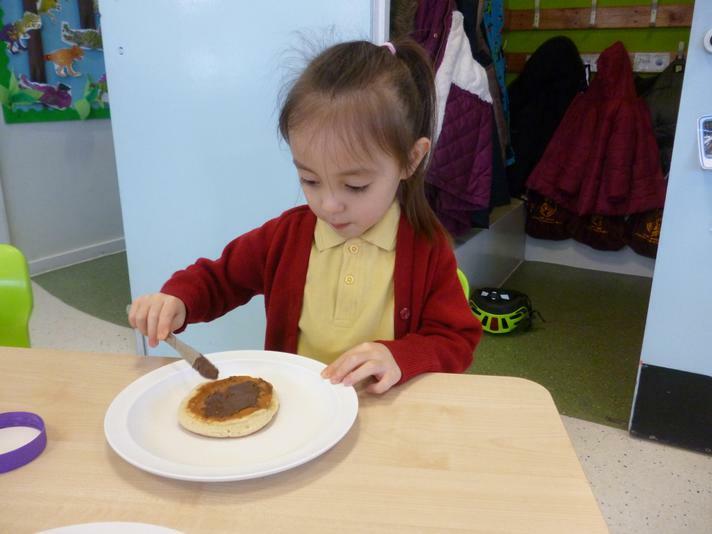 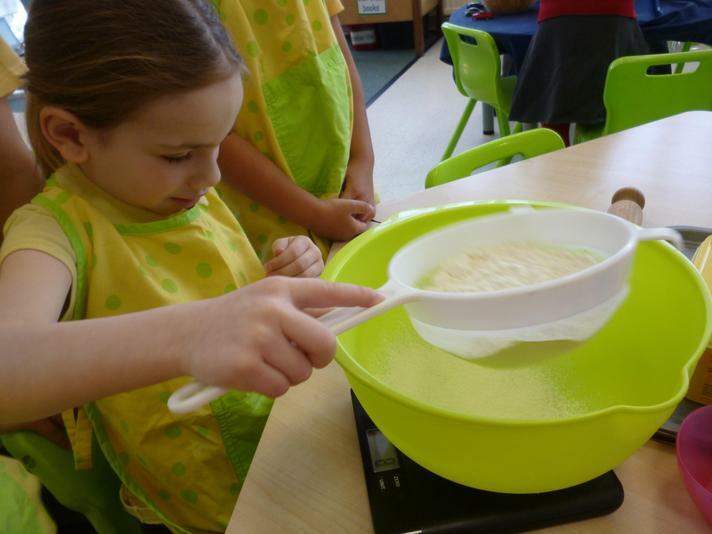 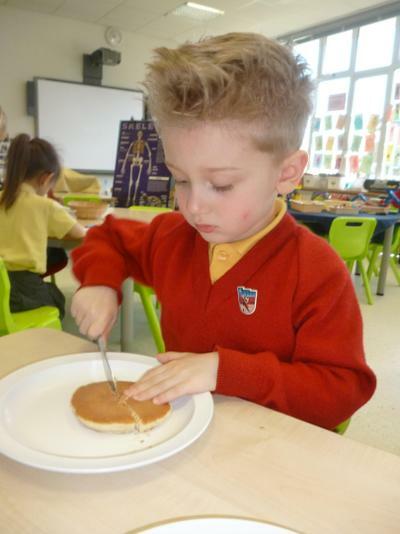 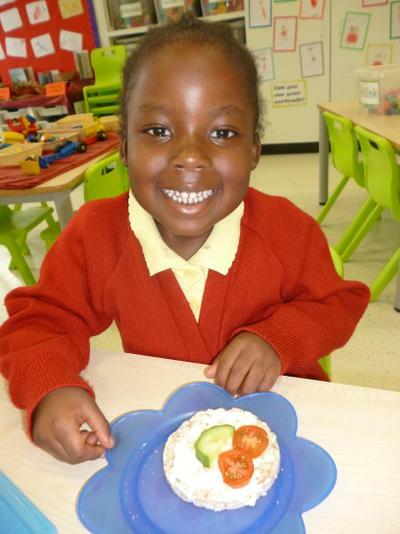 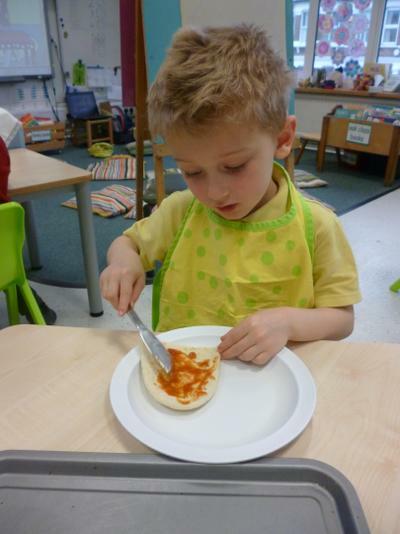 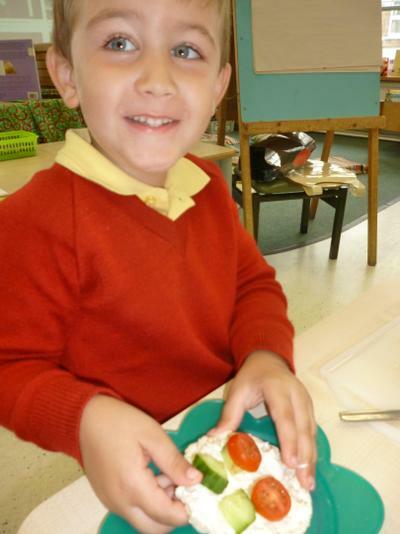 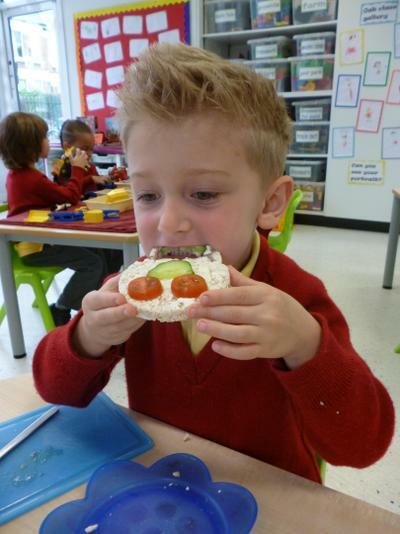 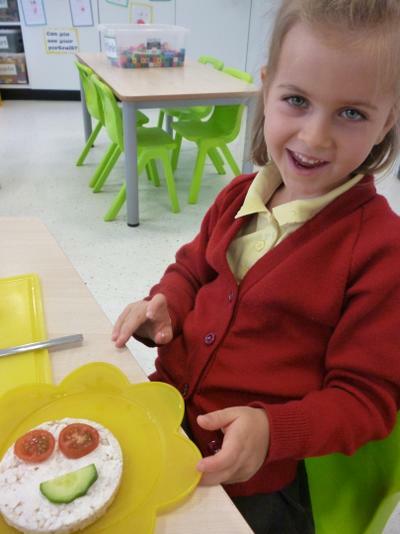 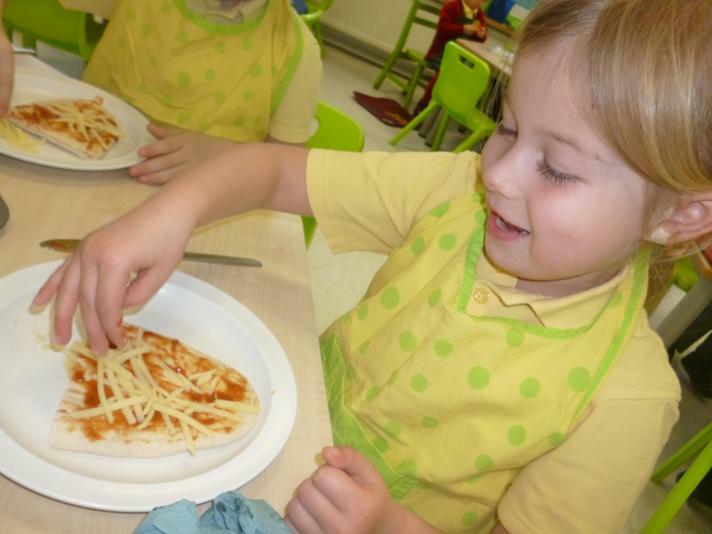 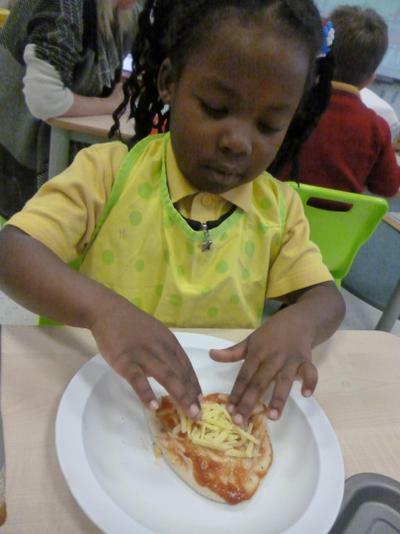 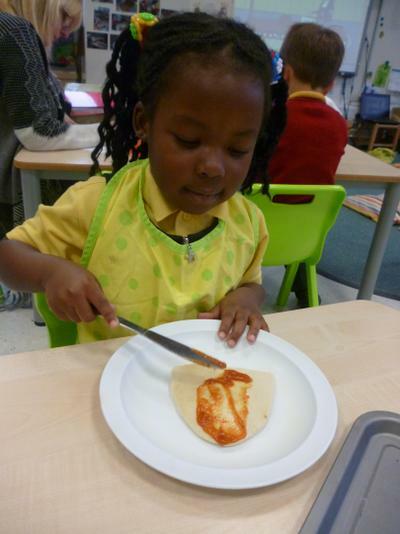 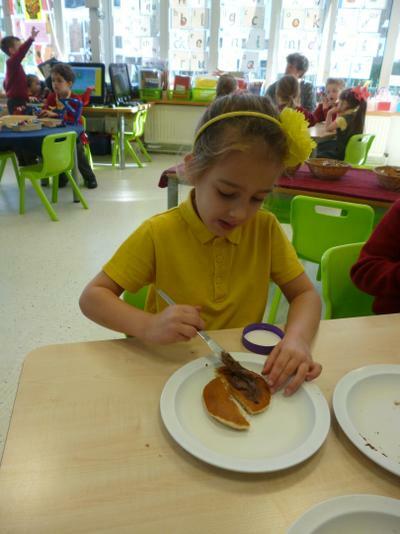 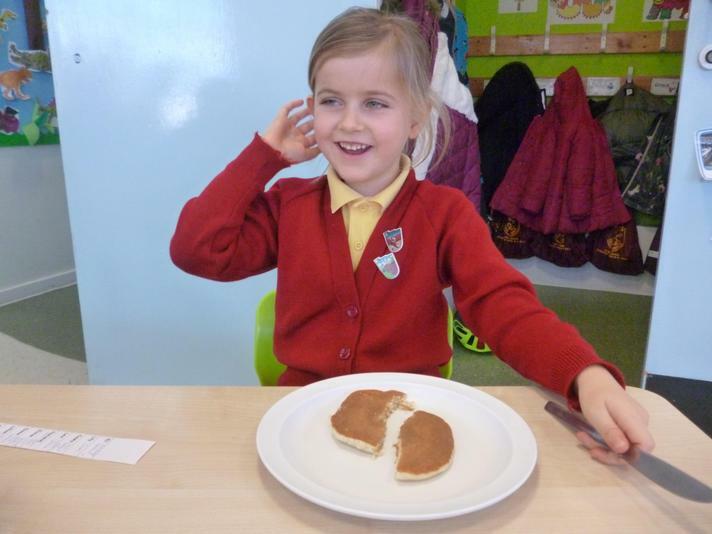 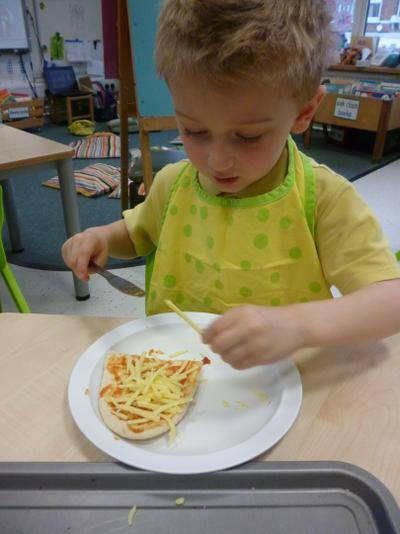 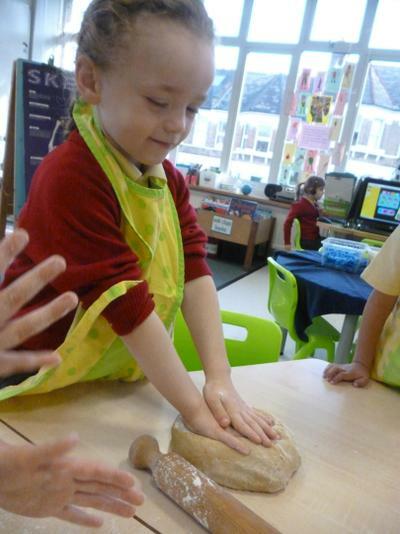 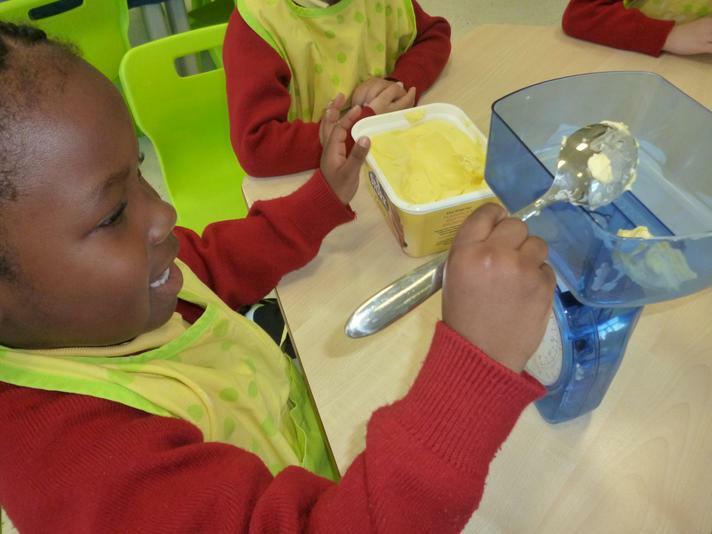 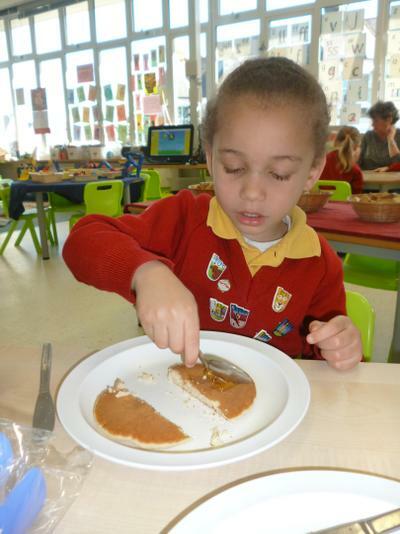 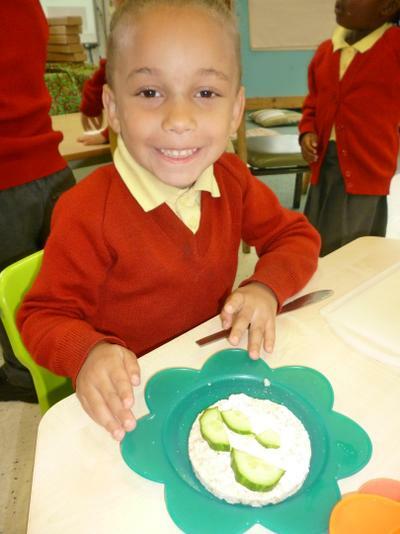 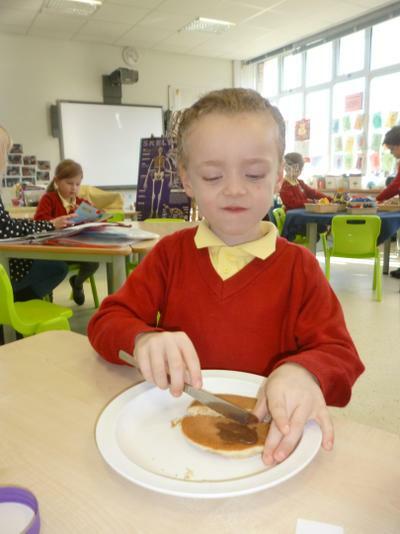 Today we all got to choose toppings to put on our pancakes. 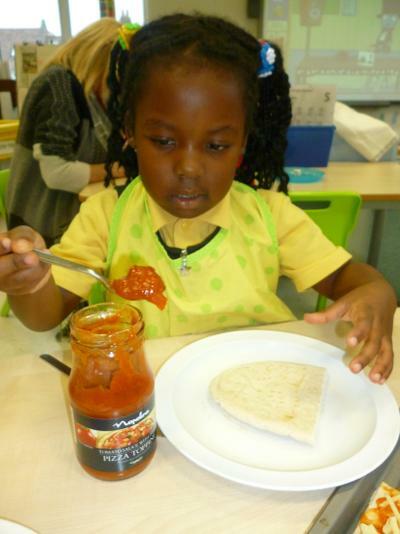 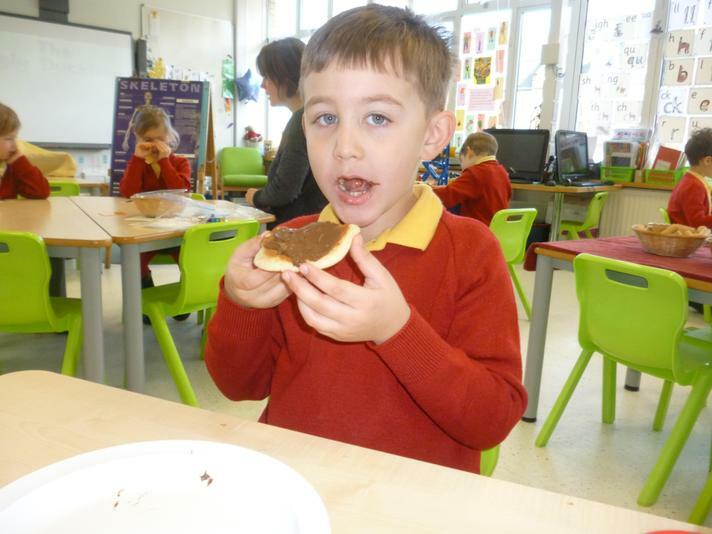 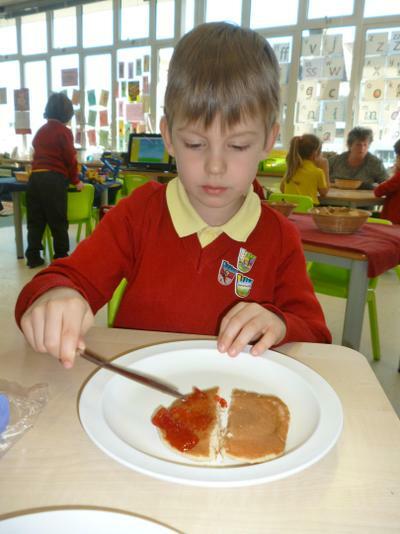 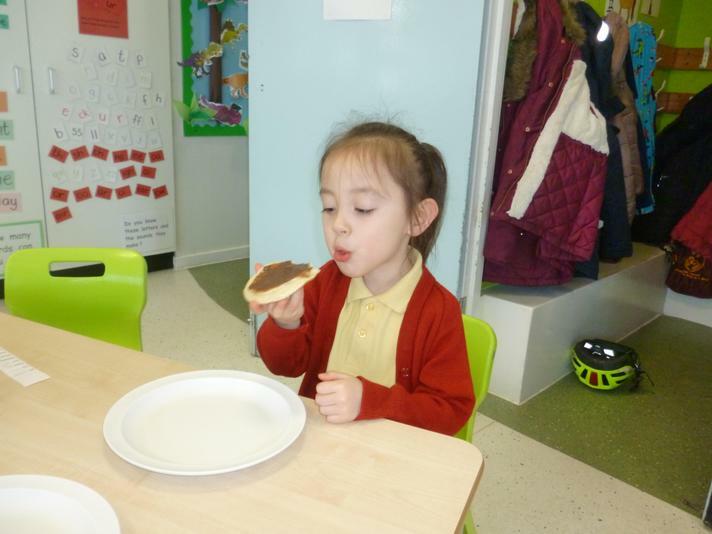 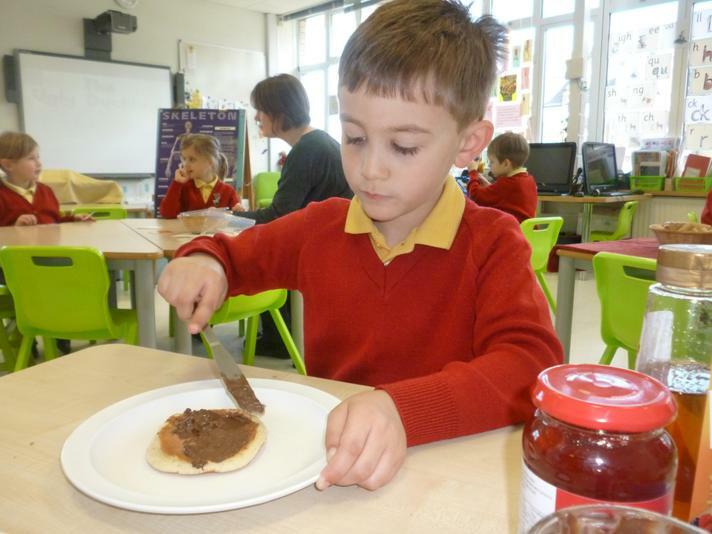 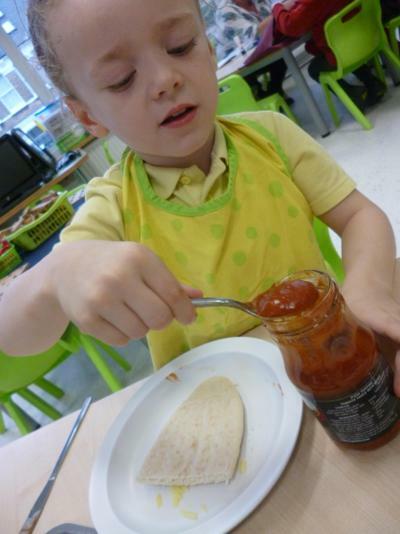 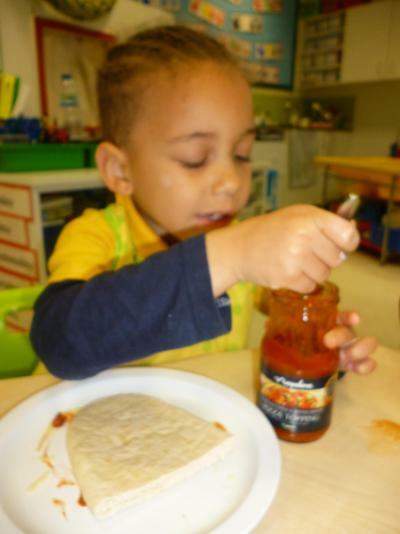 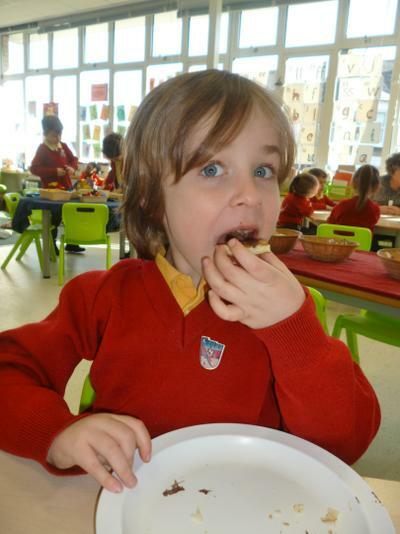 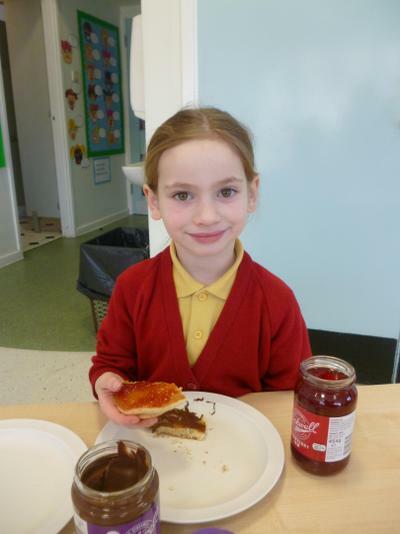 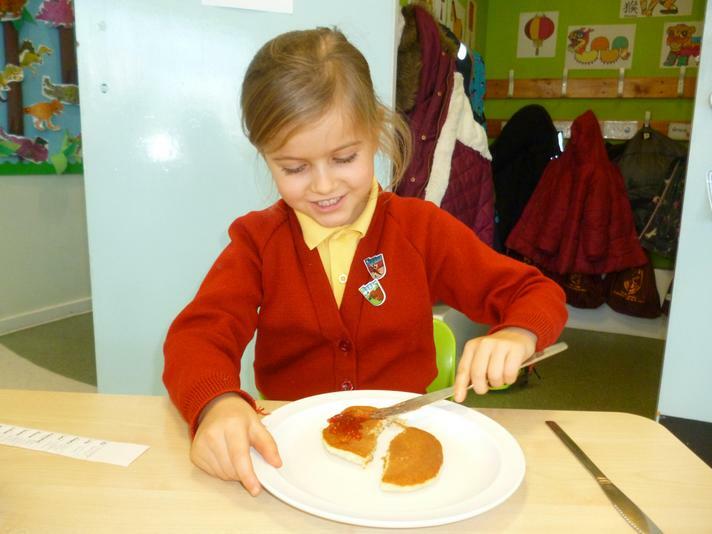 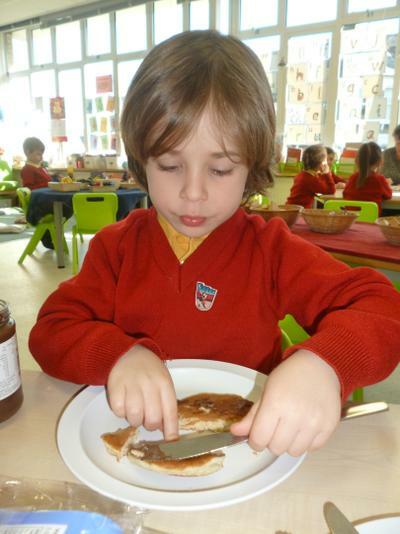 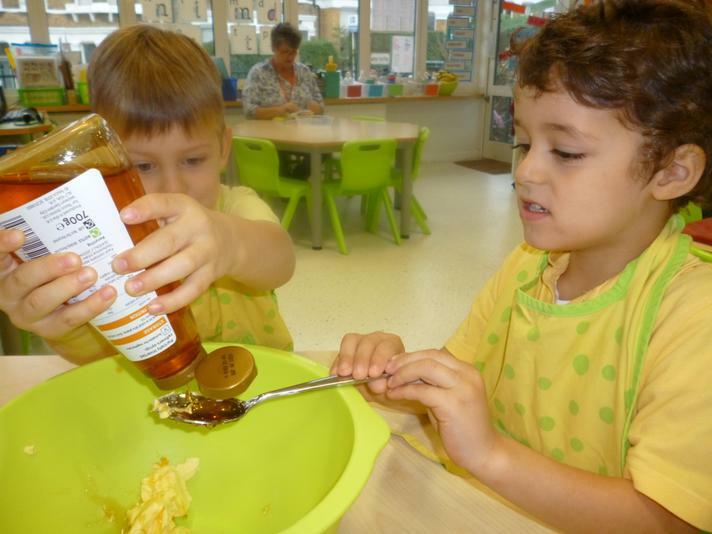 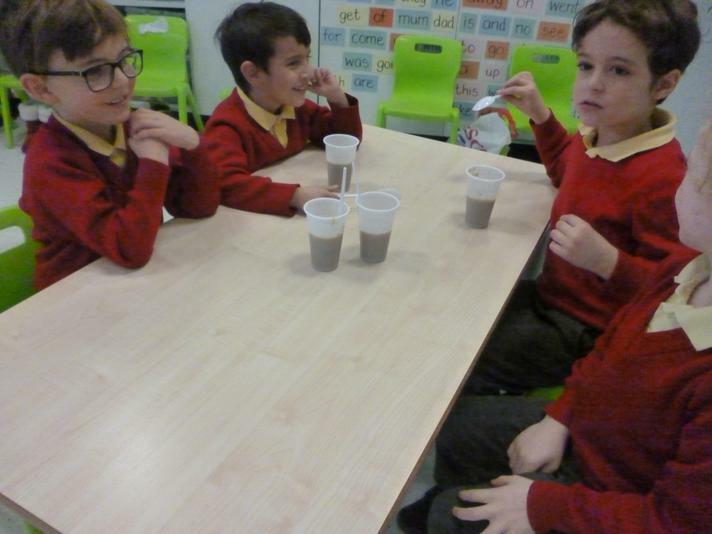 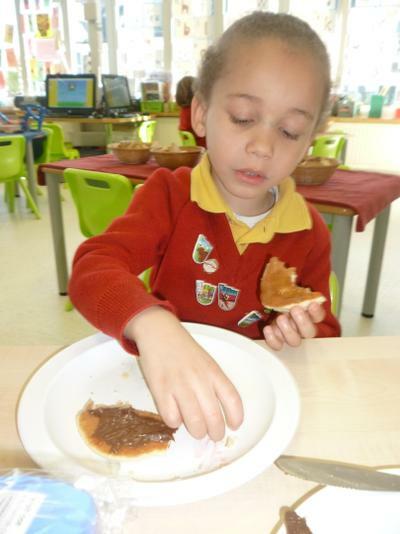 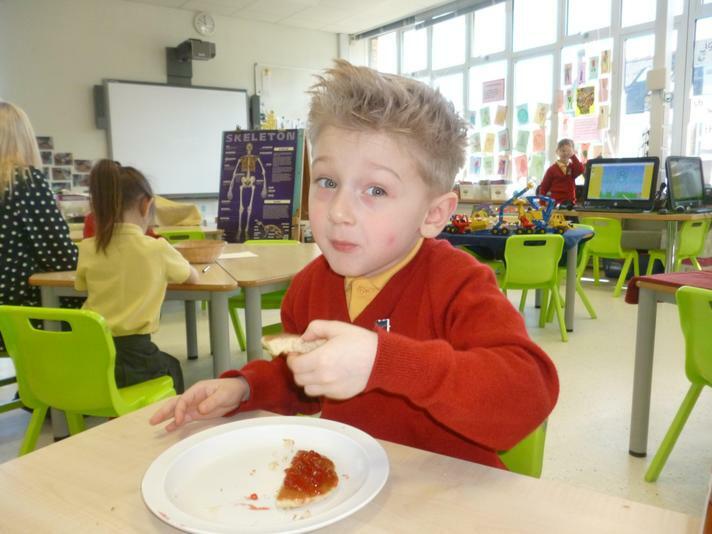 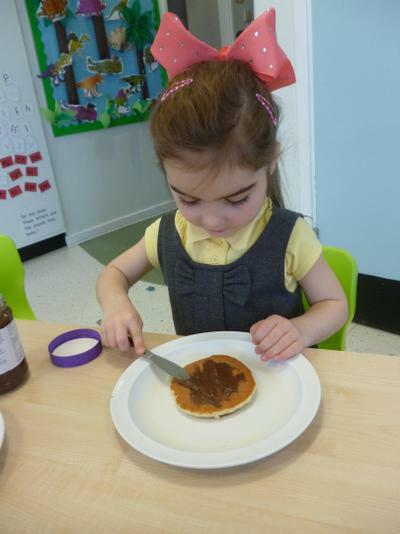 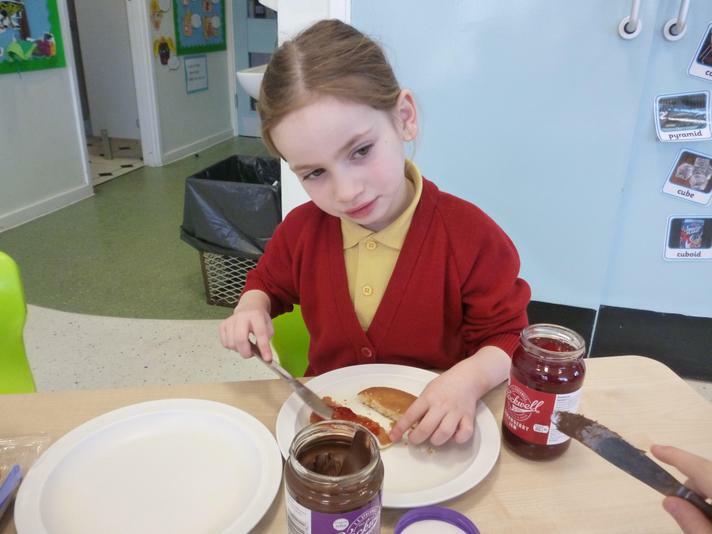 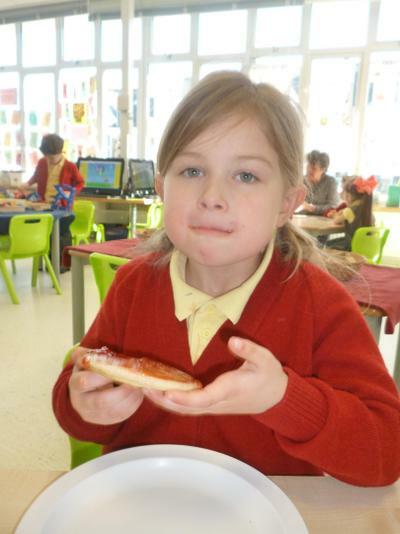 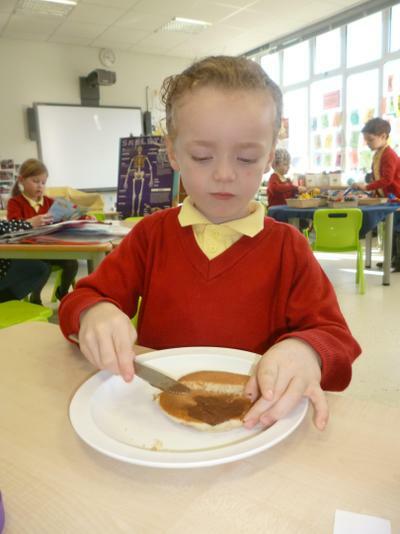 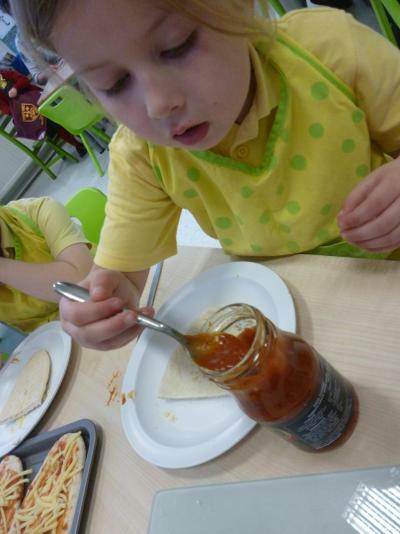 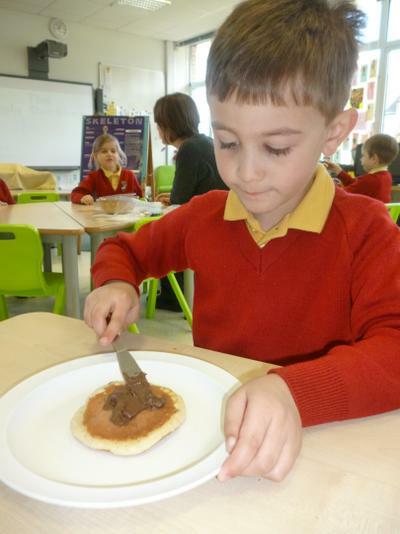 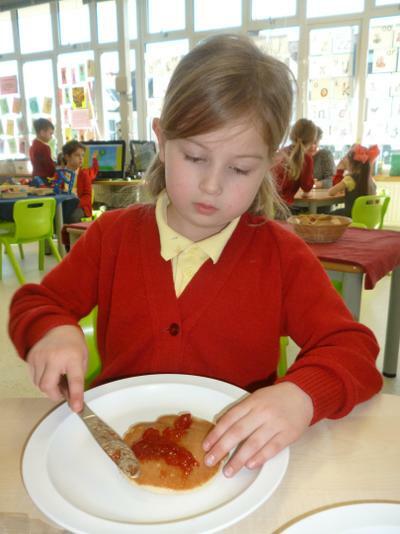 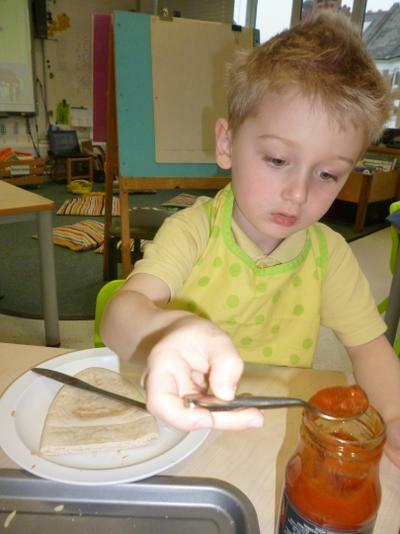 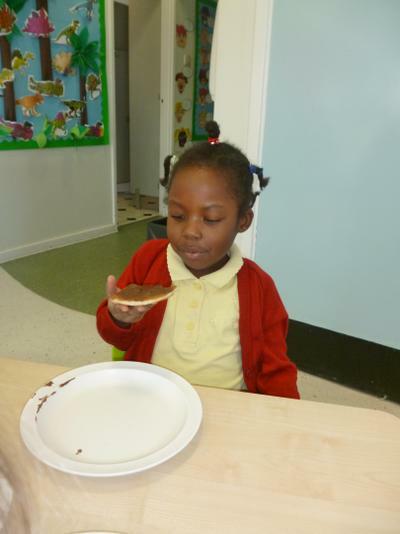 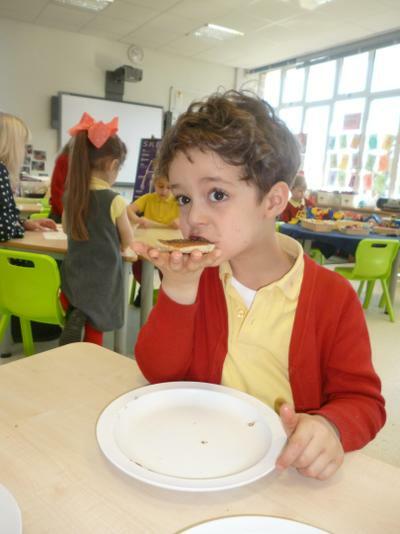 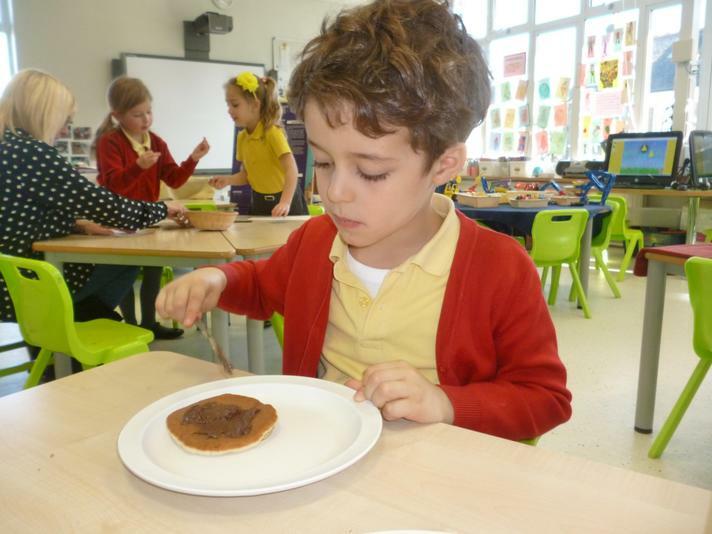 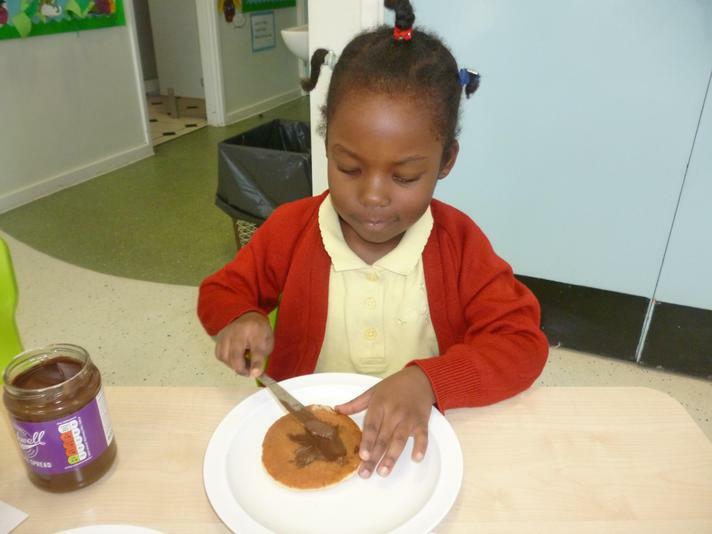 The favourite topping was chocolate spread, then jam and then syrup...some people chose two or three toppings...yummy! 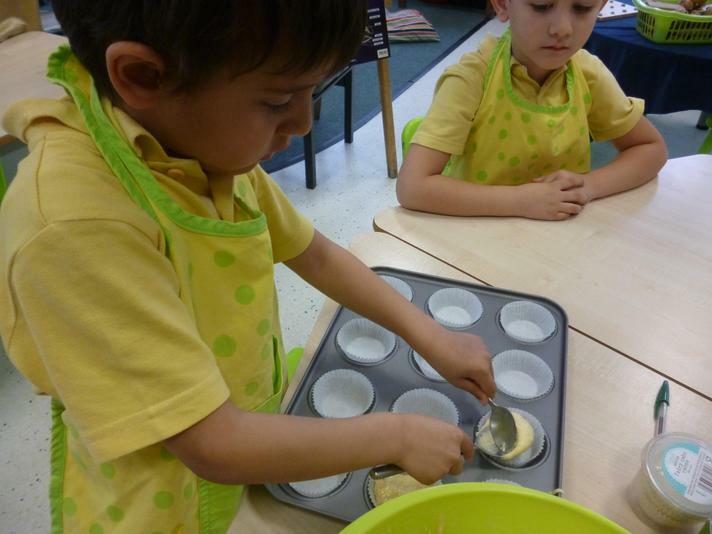 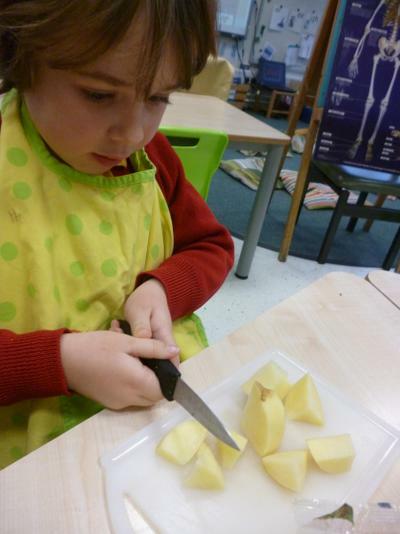 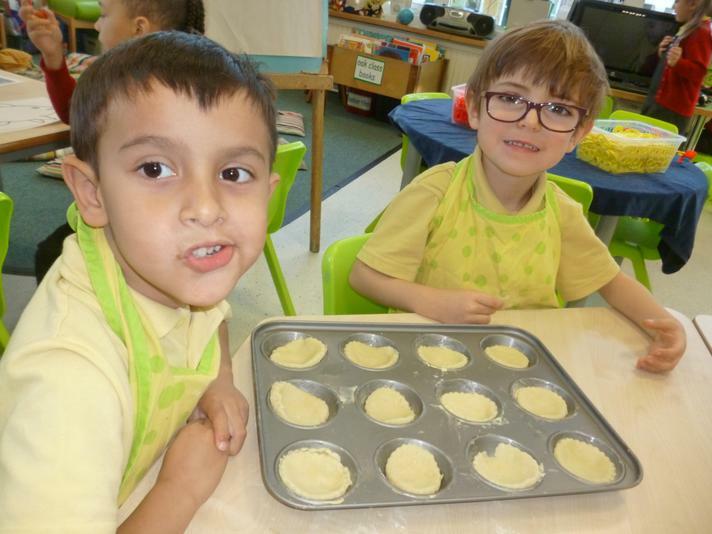 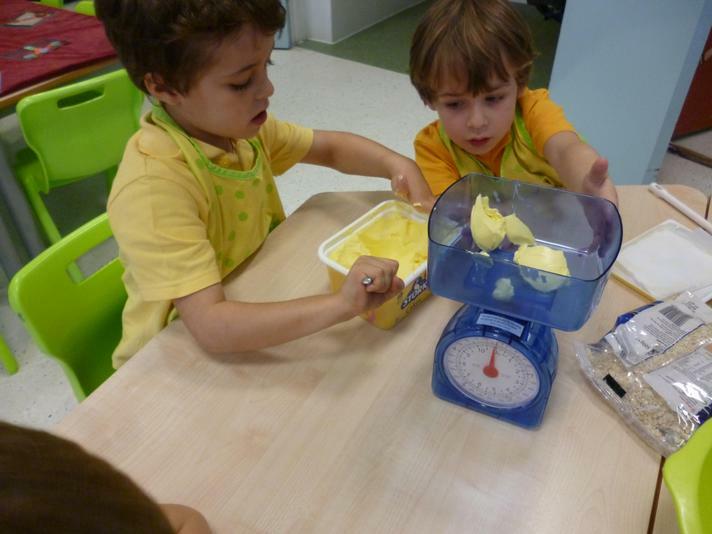 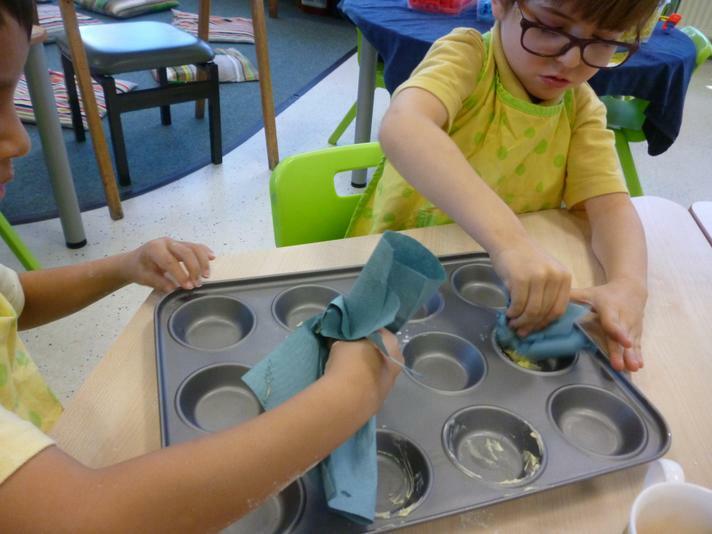 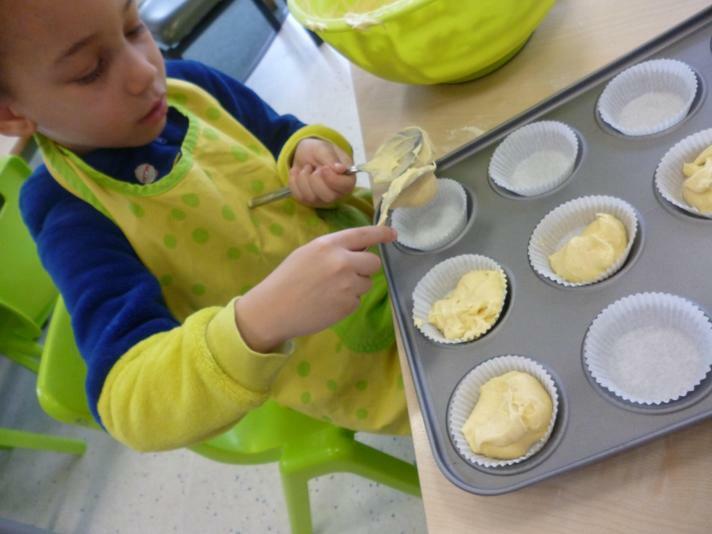 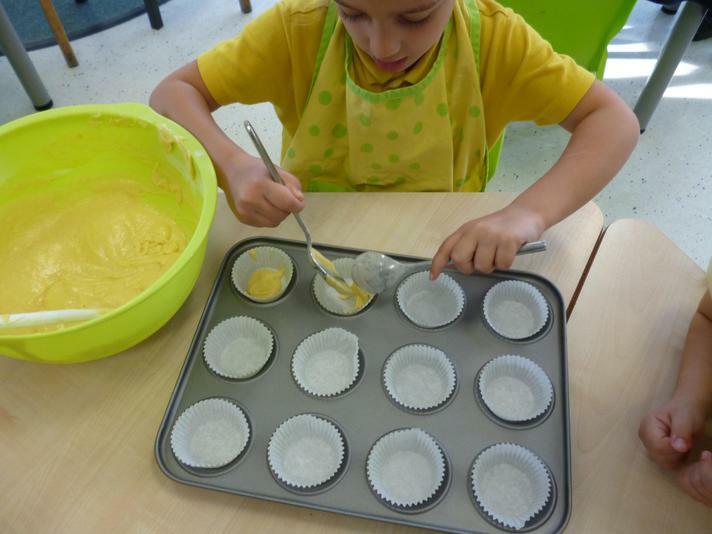 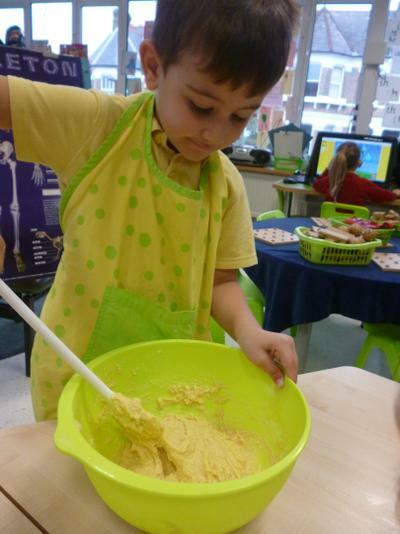 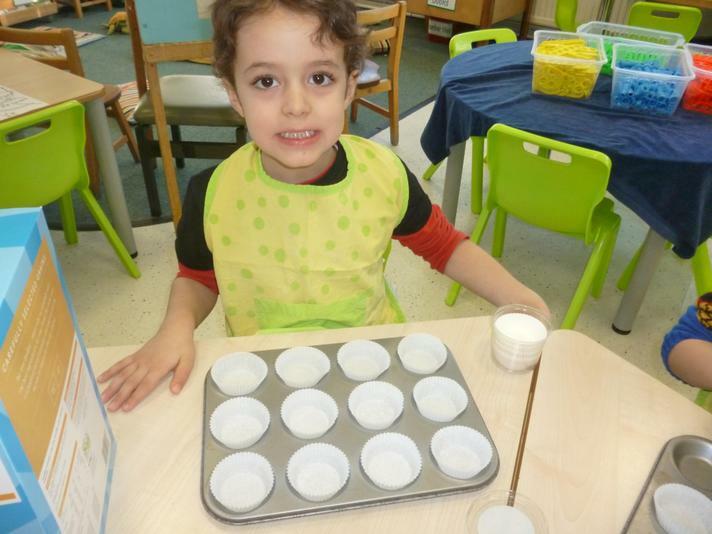 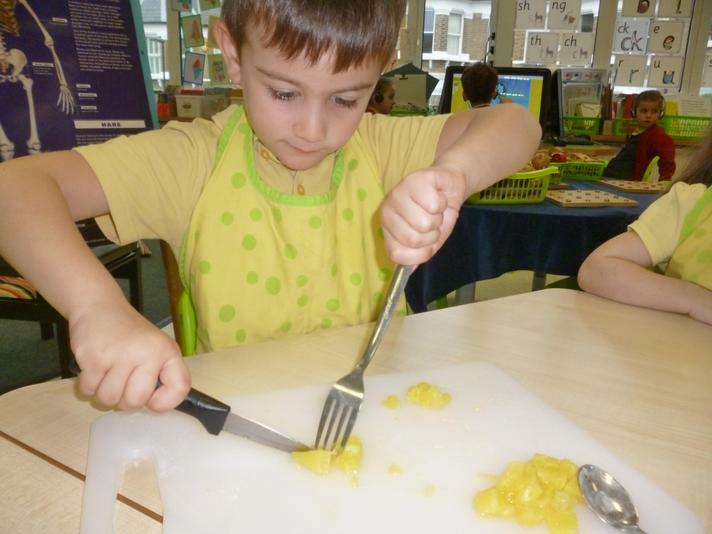 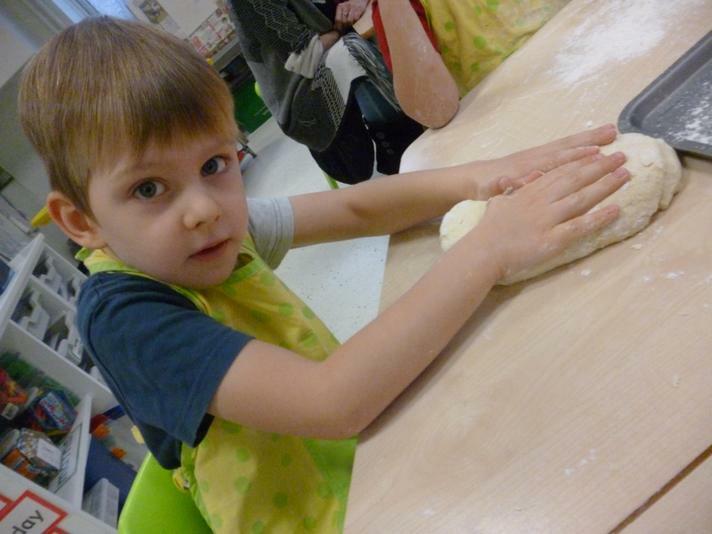 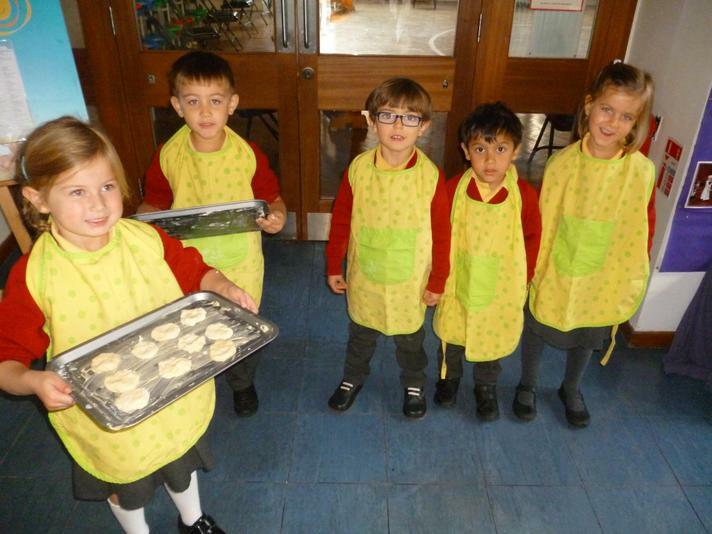 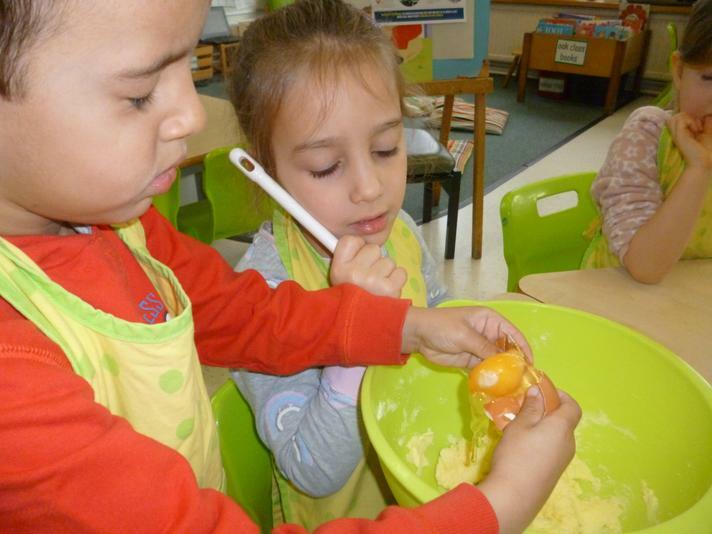 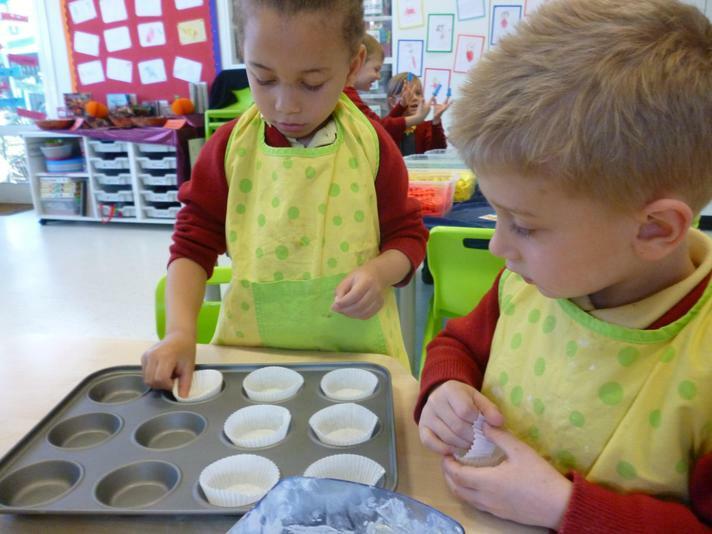 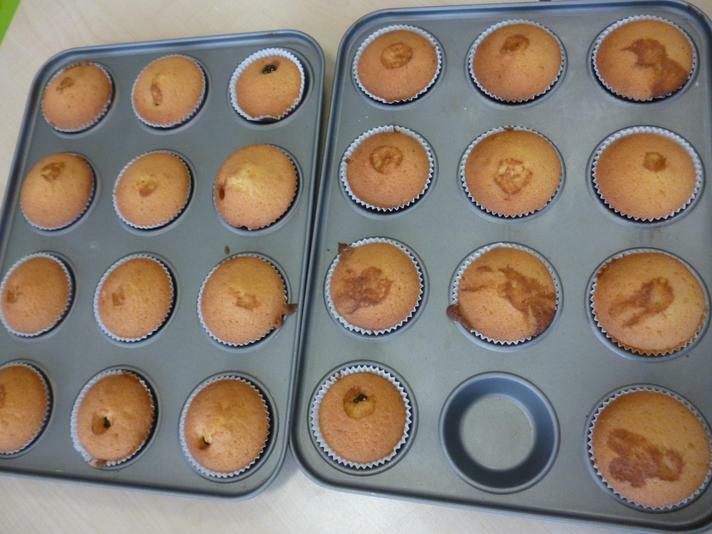 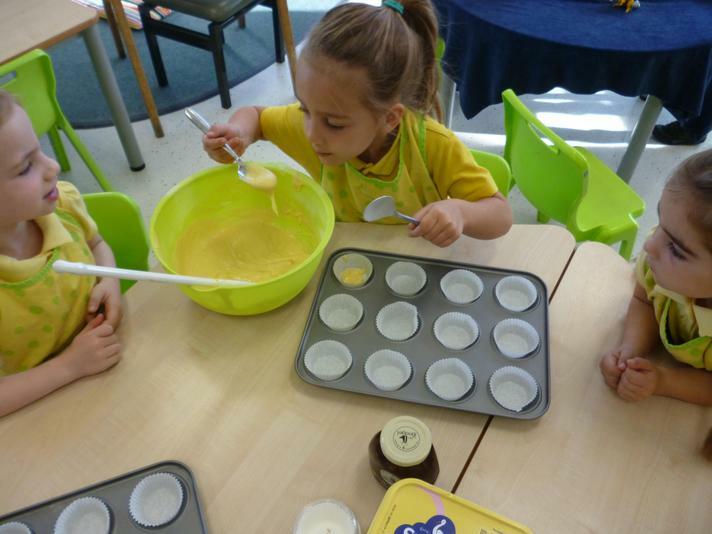 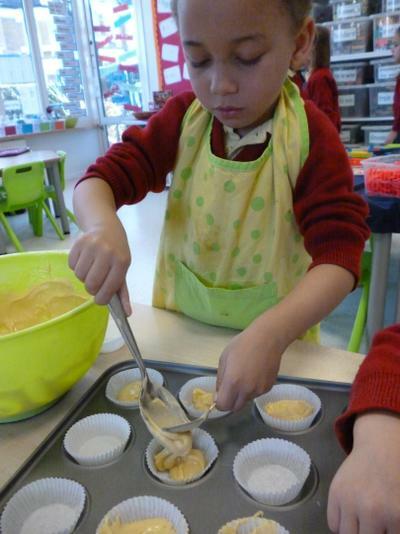 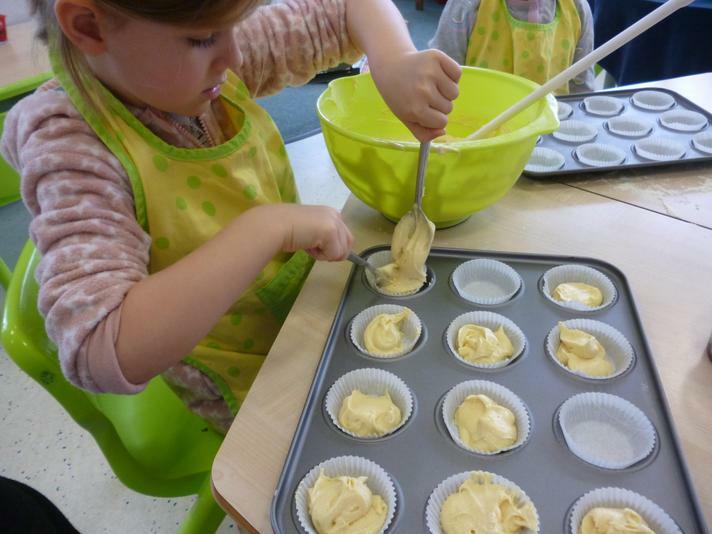 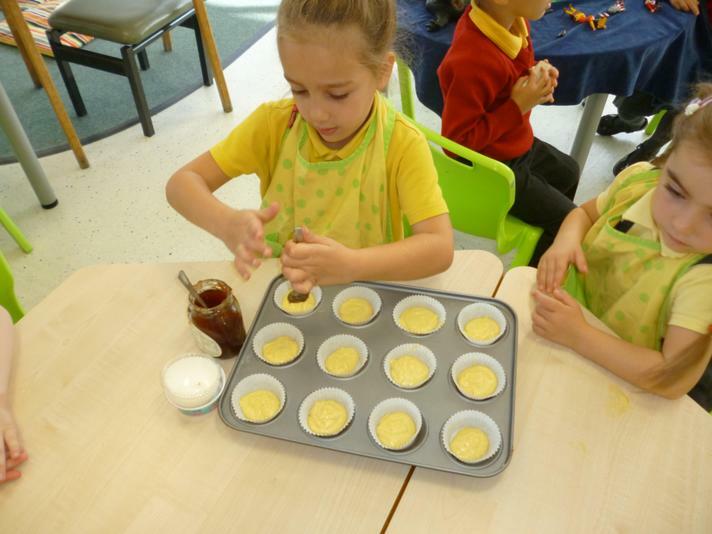 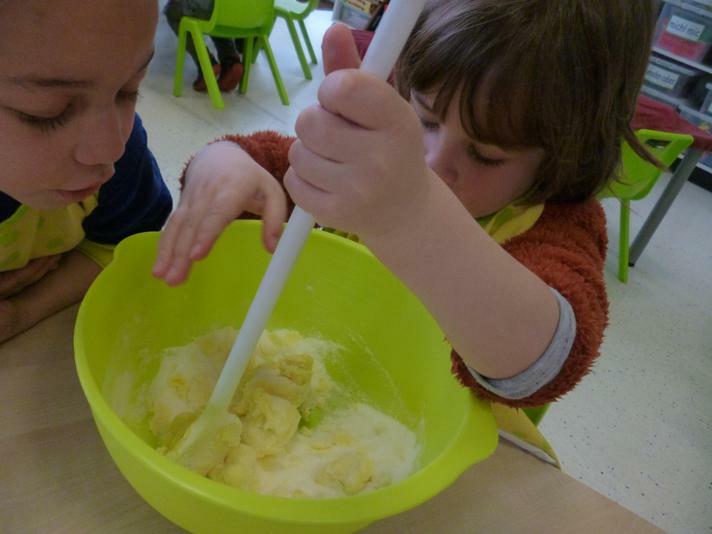 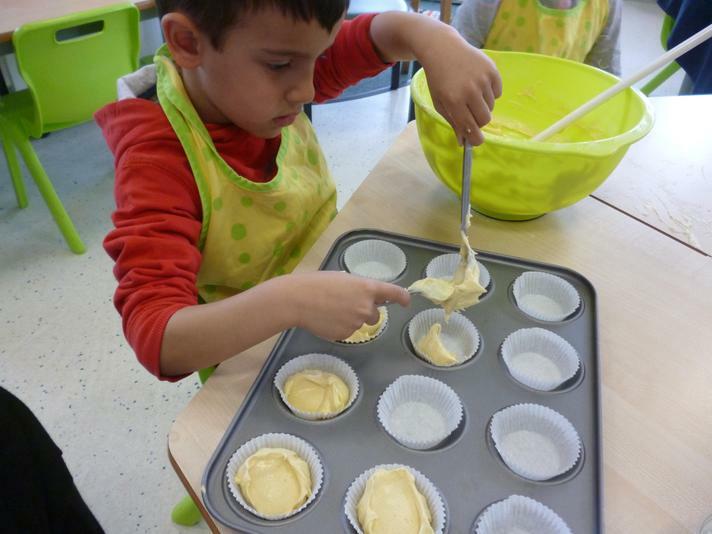 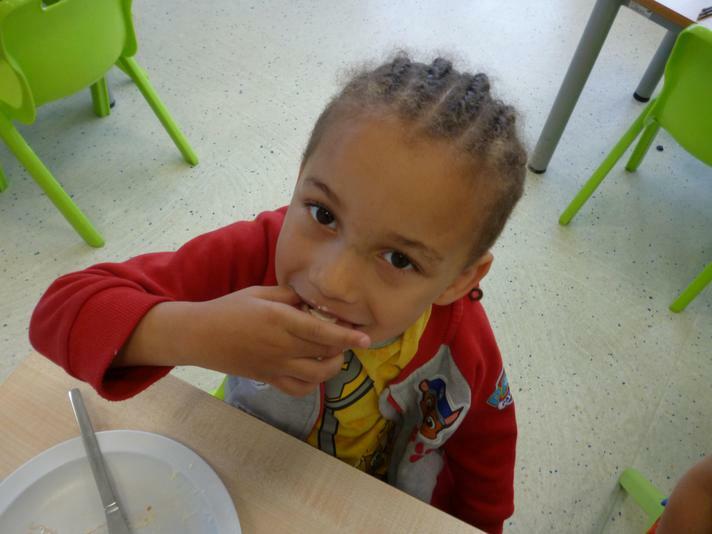 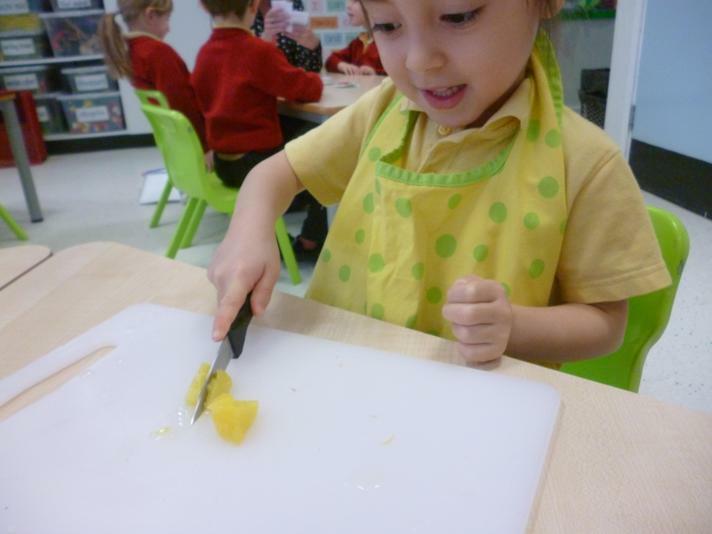 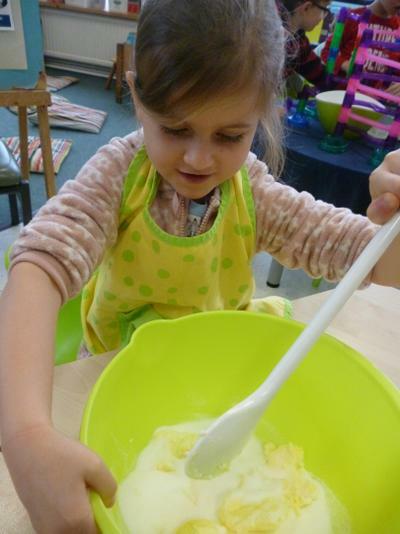 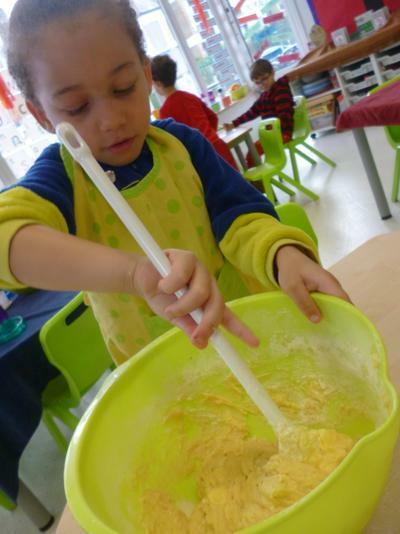 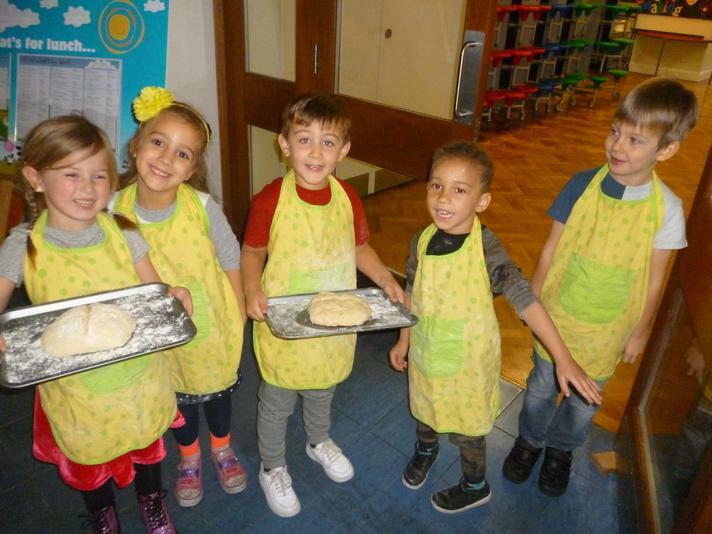 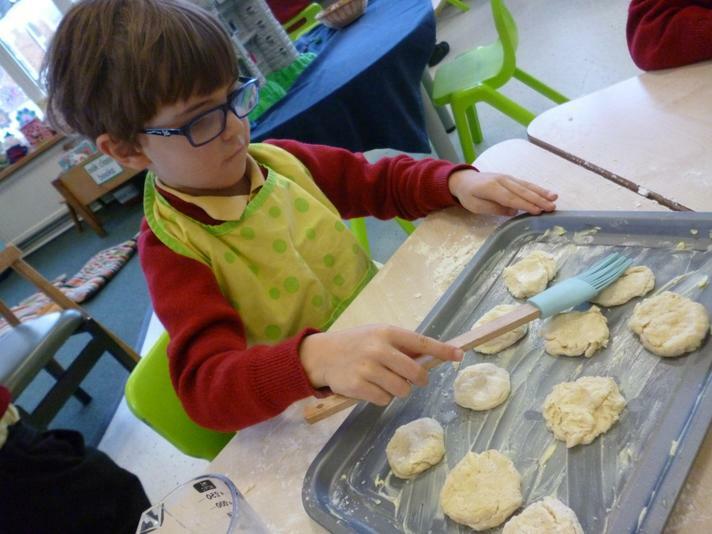 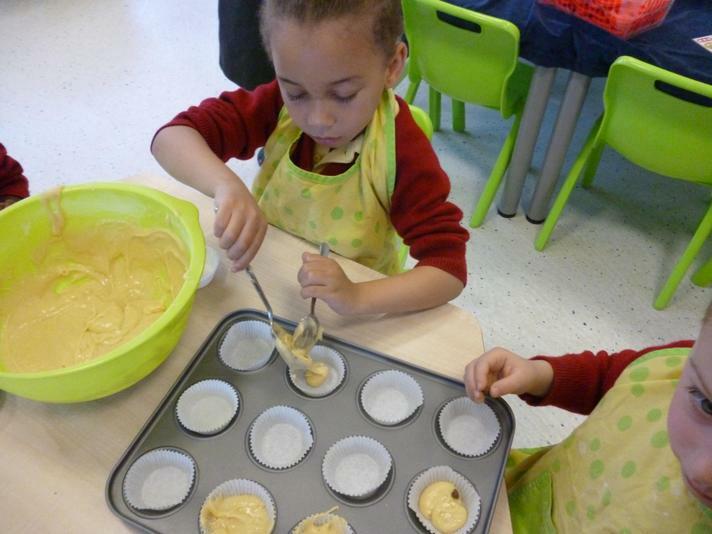 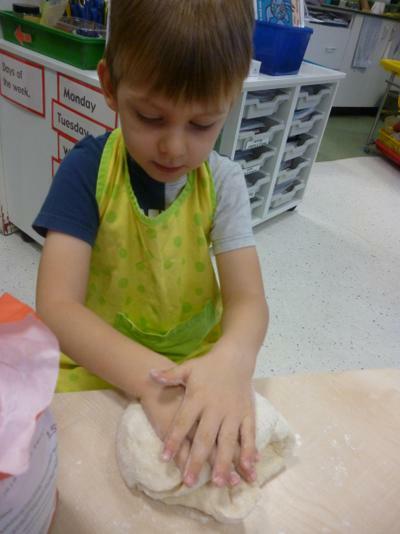 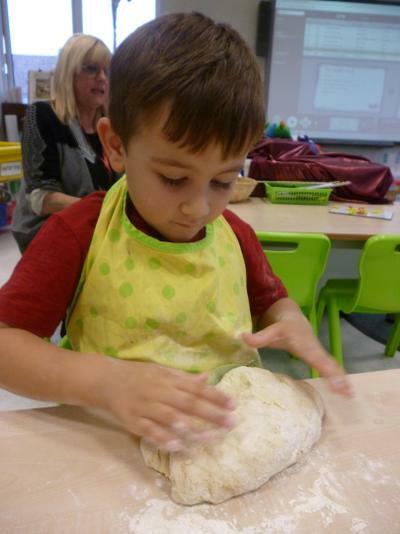 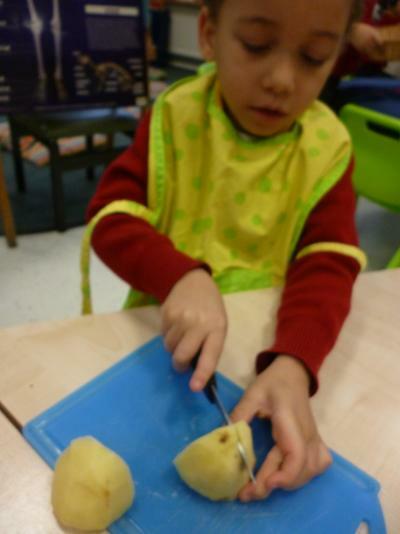 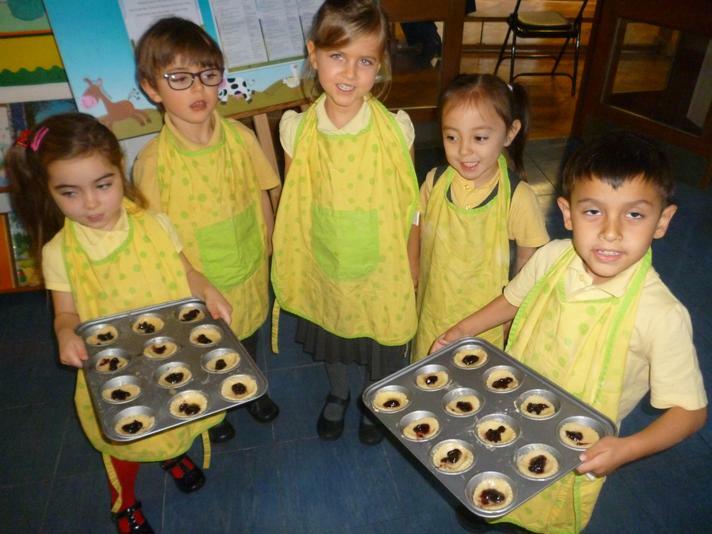 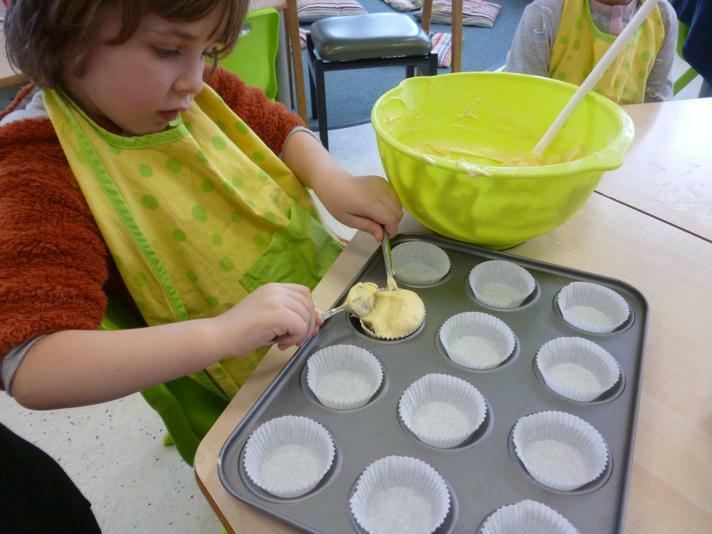 Today our cooks were Grace, Iacopo, Max, Jack and Lillian they made pineapple buns. 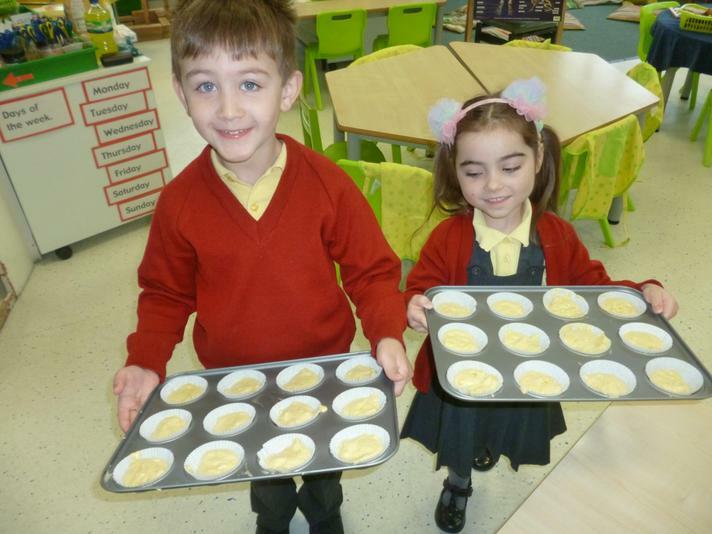 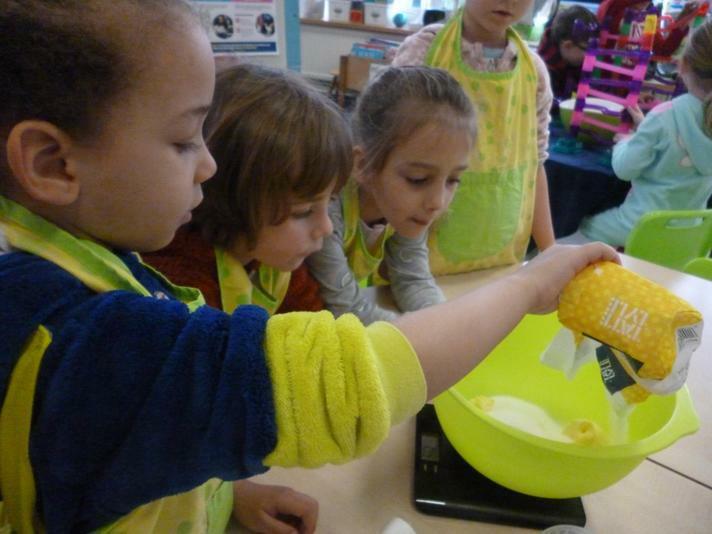 They were really delicious, here is the recipe for you to try at home; 1 227g can pineapple pieces in juice 50g Margarine,2 large eggs,100g caster sugar,175g self raising flour,1/2tsp baking powder,1tbsp milk. 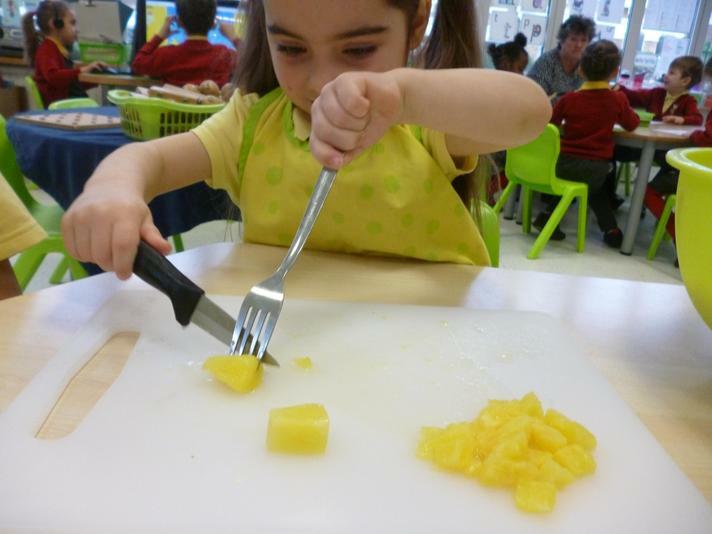 Drain the pineapple keeping the juice and some pieces for the top of the cakes. 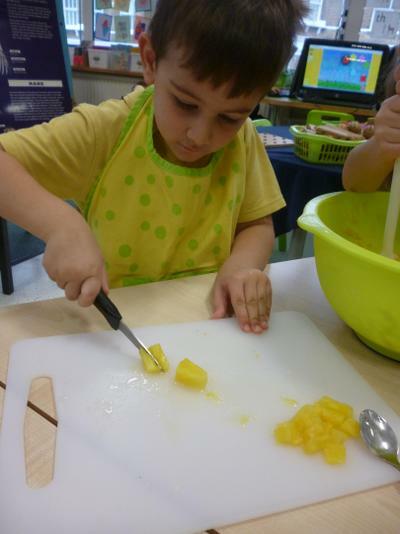 Chop the rest and put in a bowl and the rest of the ingredients and mix thoroughly ( we added more juice and not the milk) Divide between 12 cake cases and bake in a preheated oven for 20 minutes at 180 degrees leave to cool and place the pineapple pieces on the top to decorate. 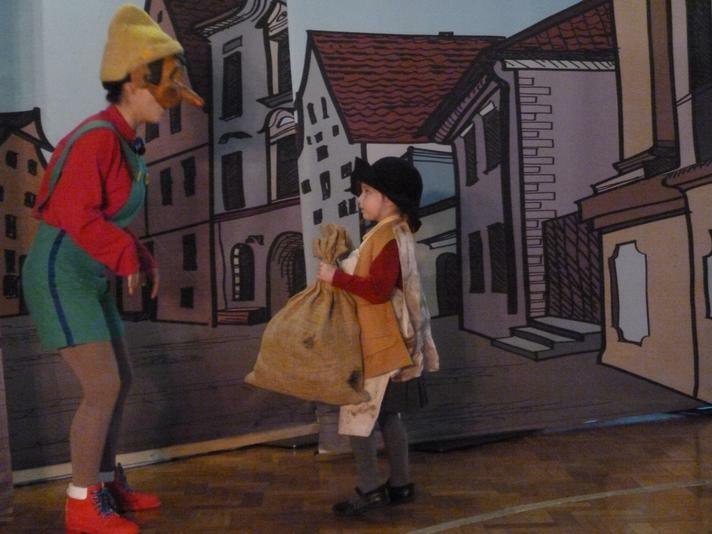 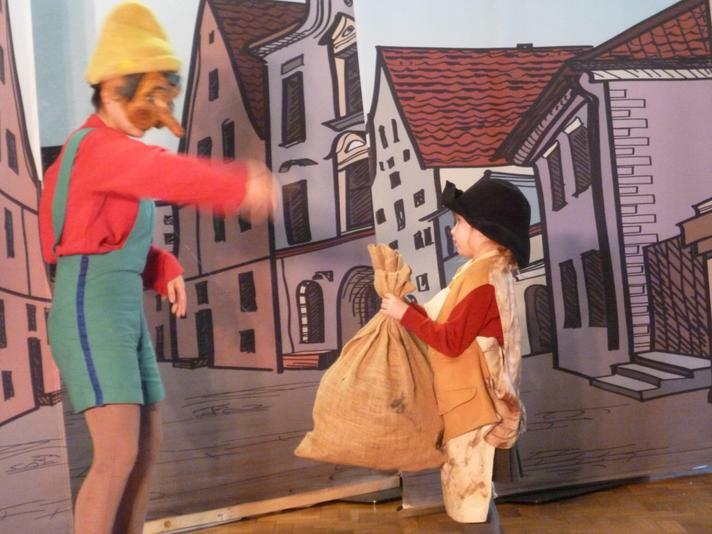 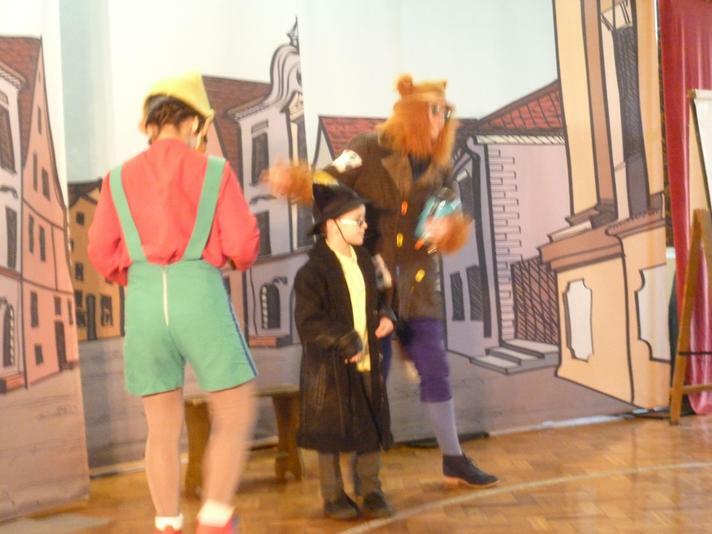 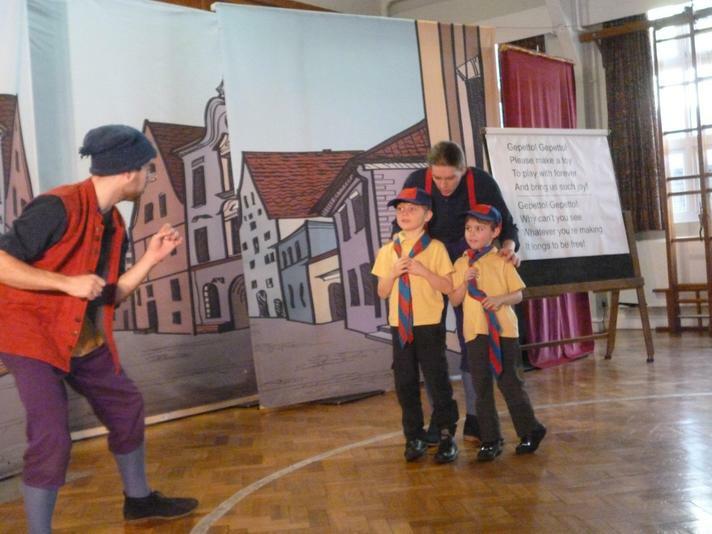 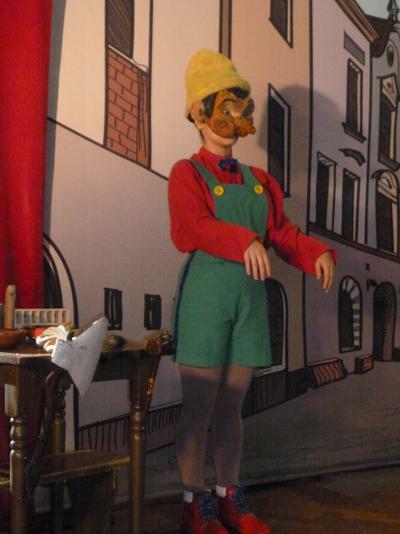 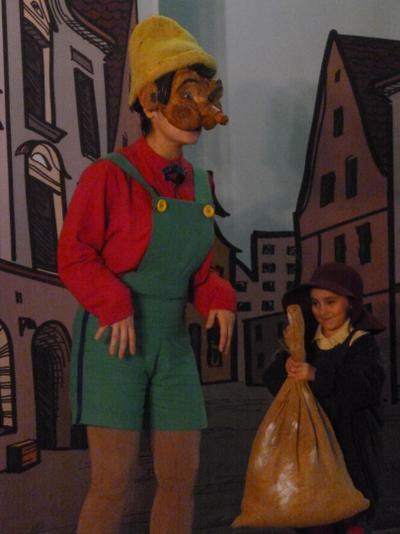 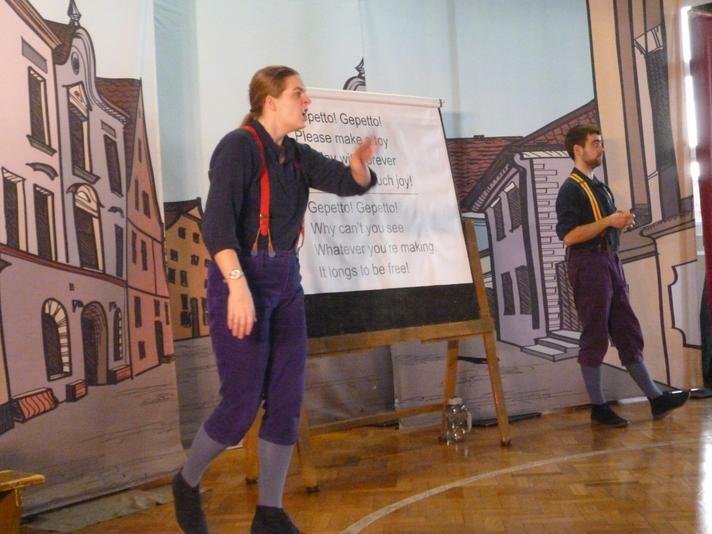 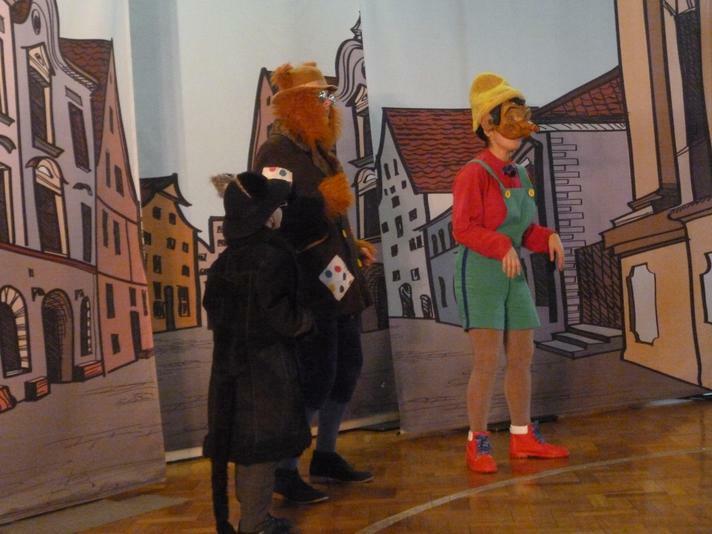 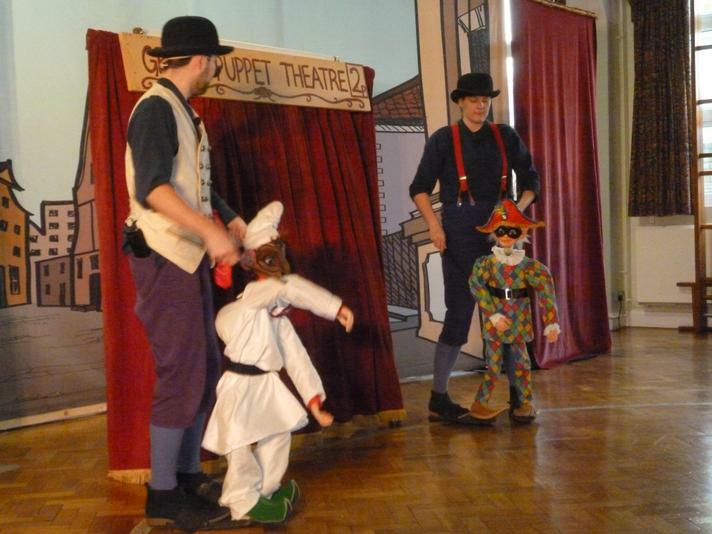 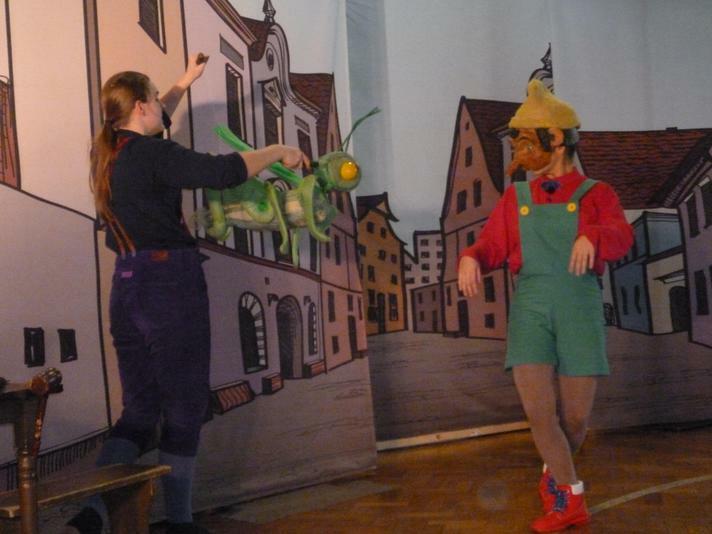 We saw a great production of Pinocchio today. 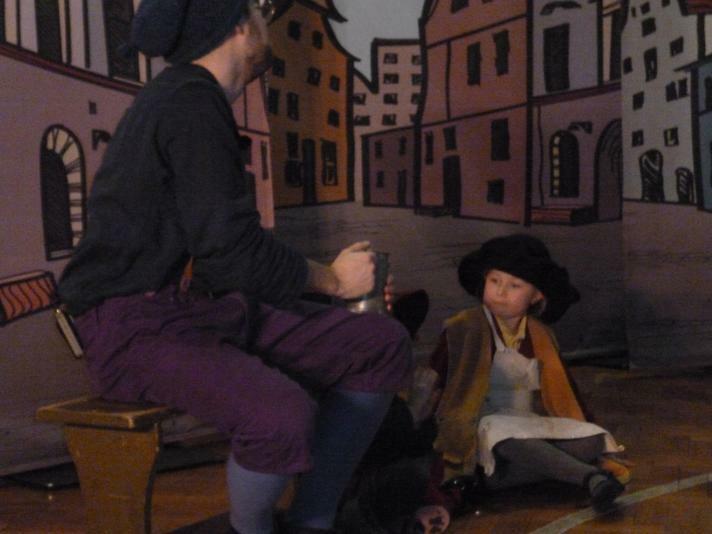 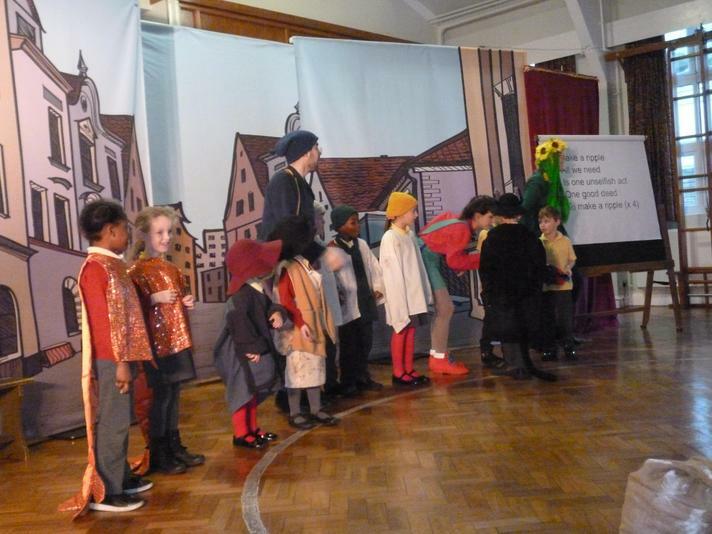 Ten children were chosen to be part of the show, Lily had fun being an actor. 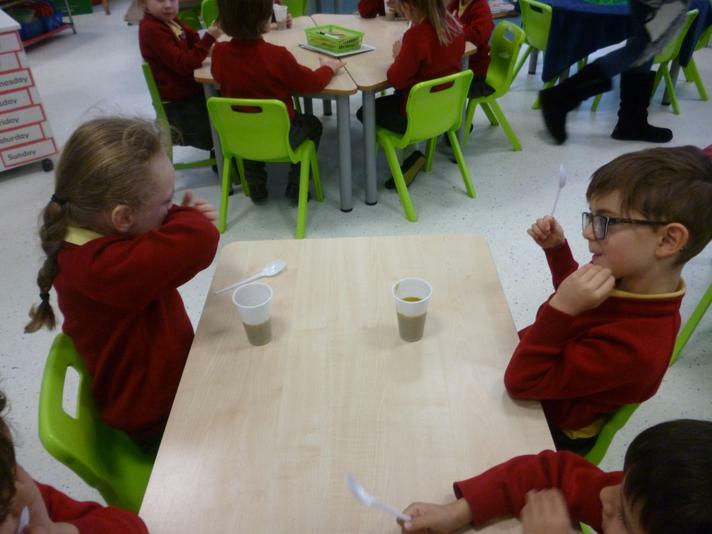 Taste experiment. 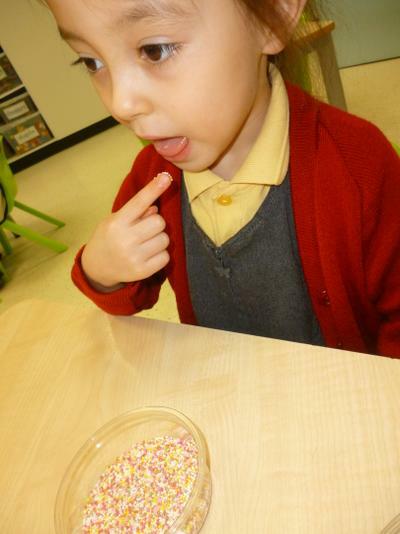 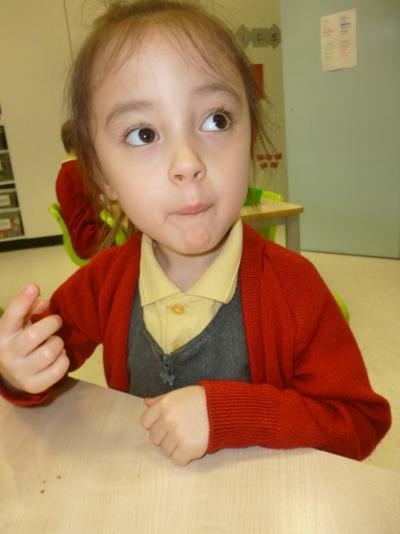 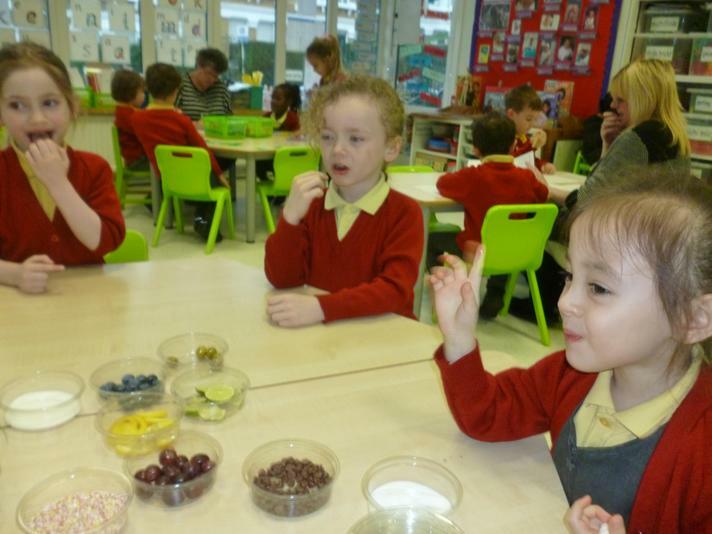 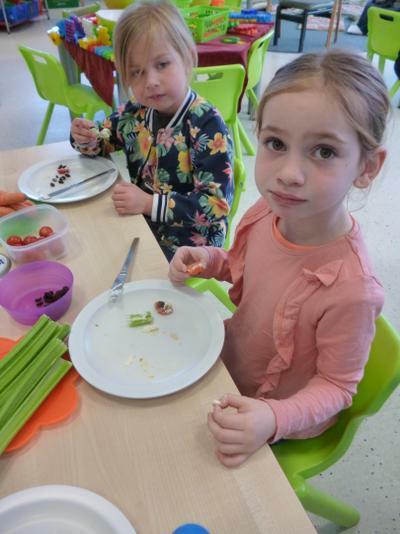 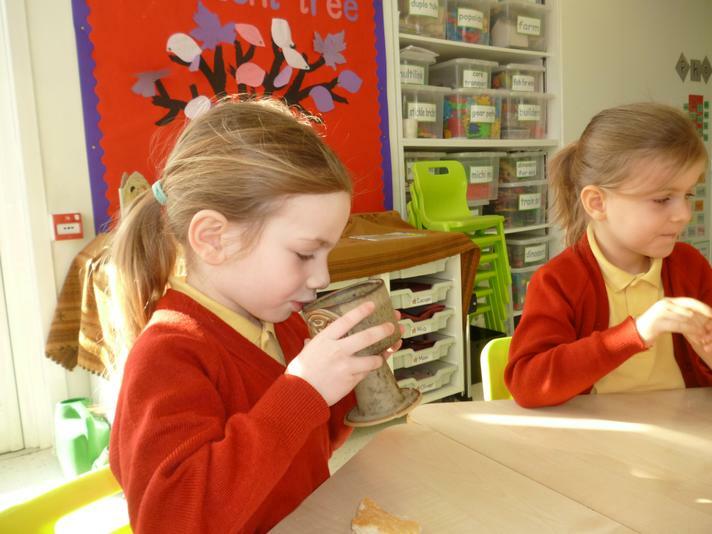 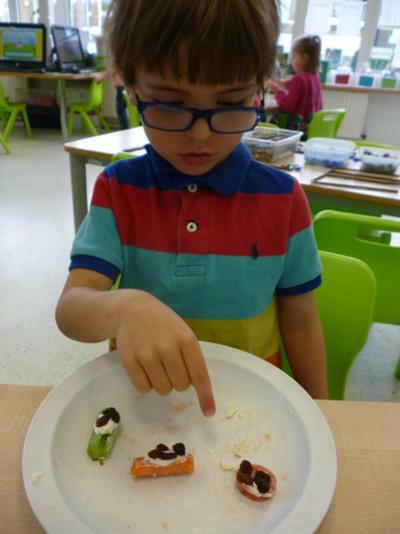 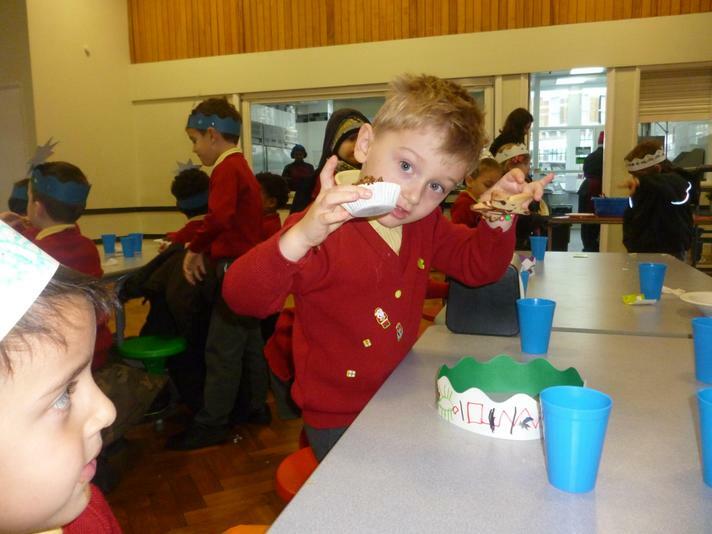 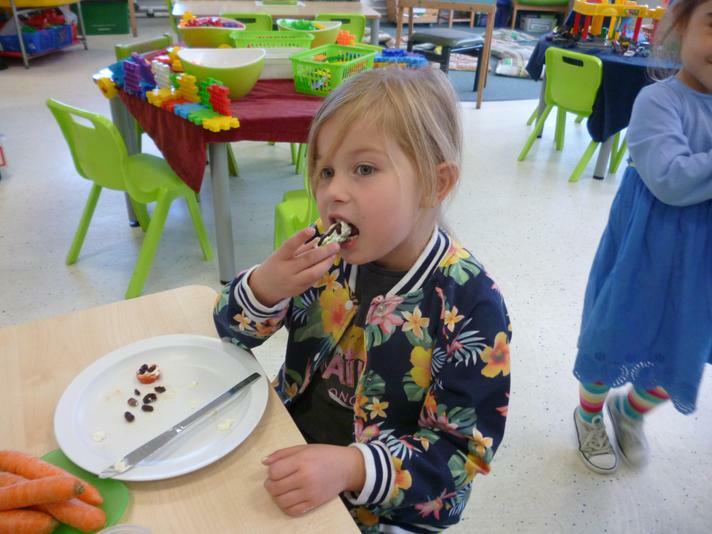 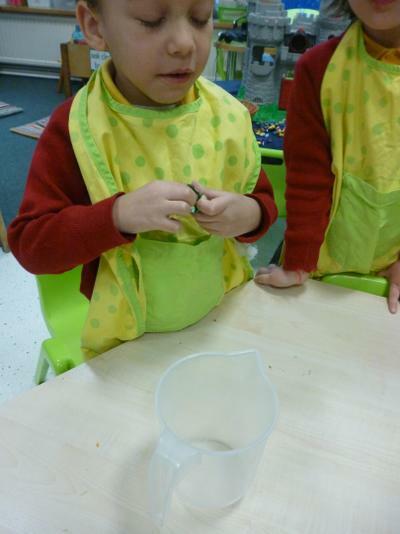 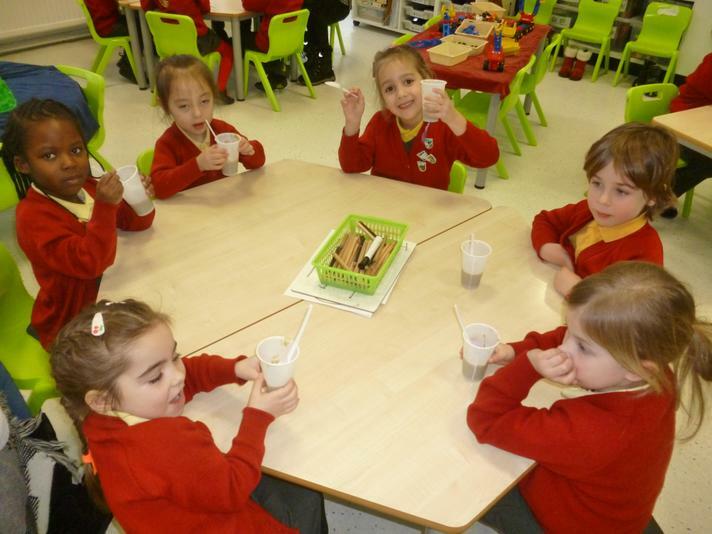 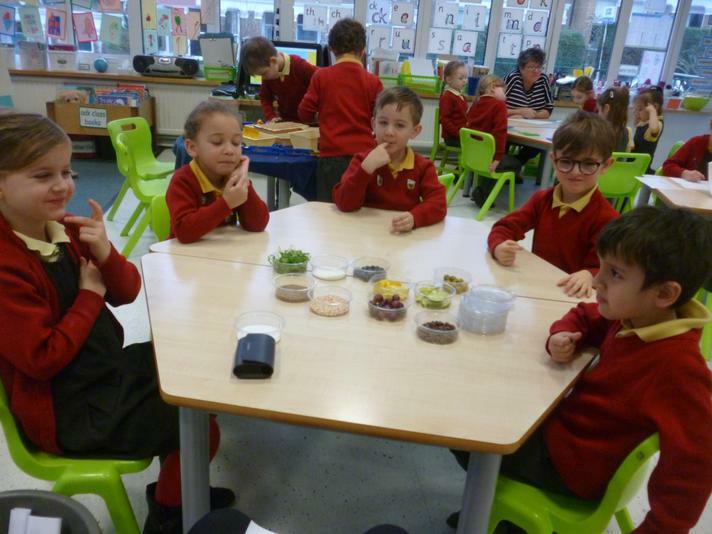 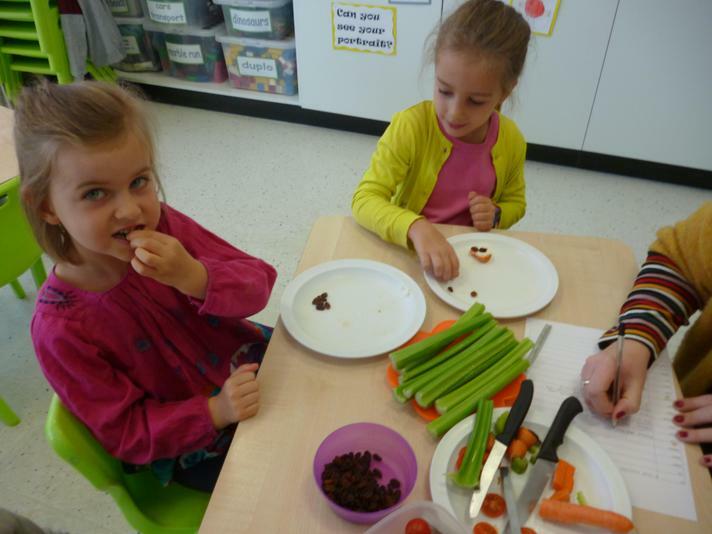 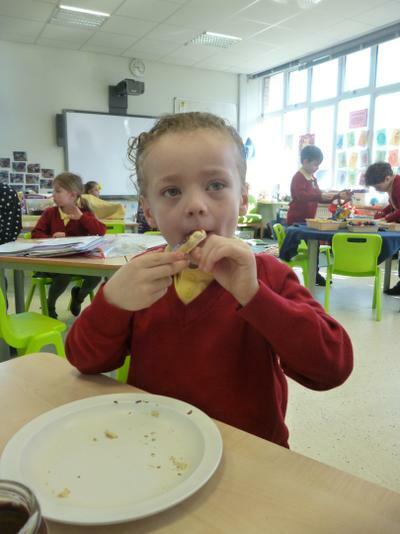 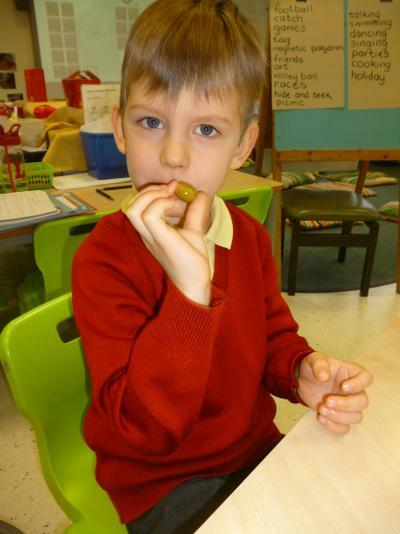 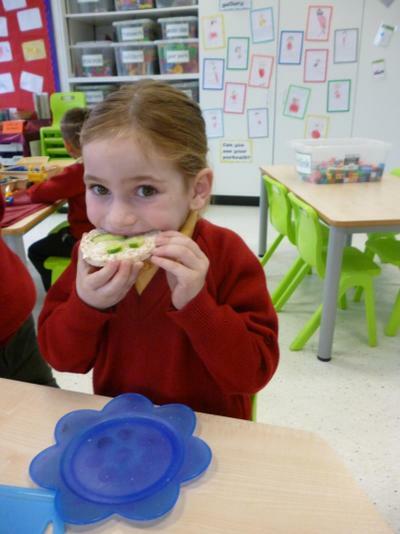 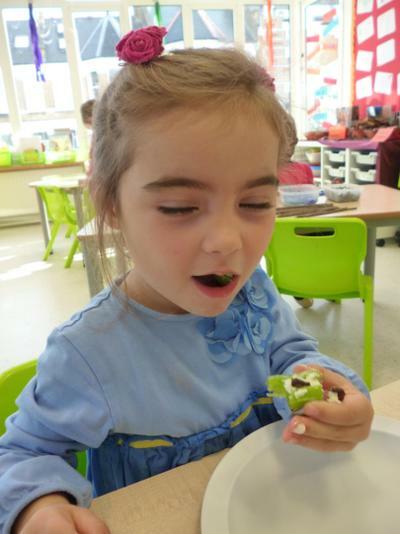 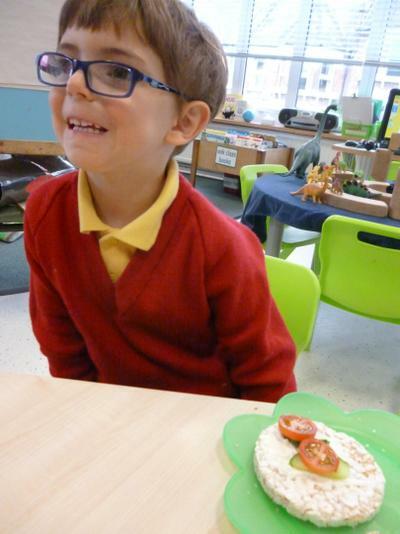 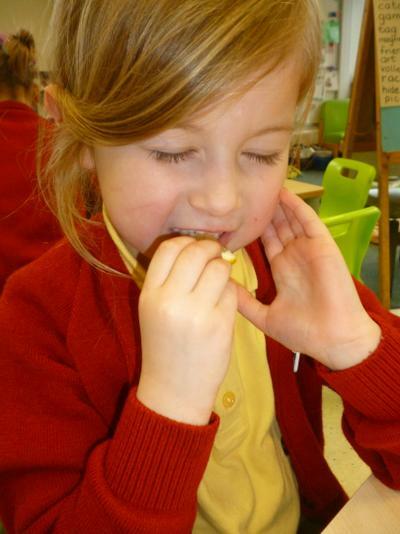 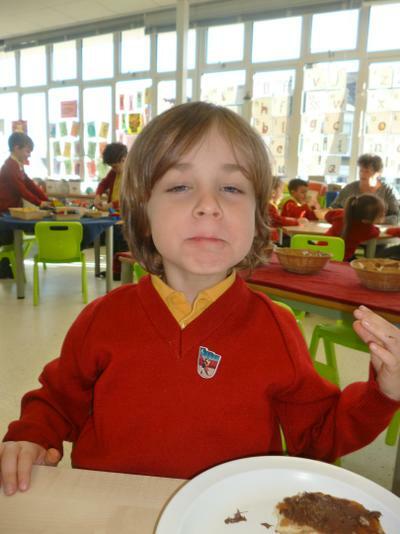 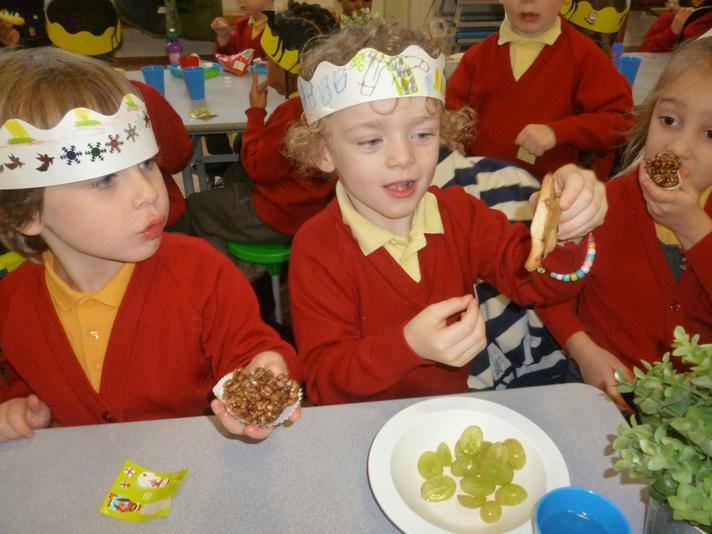 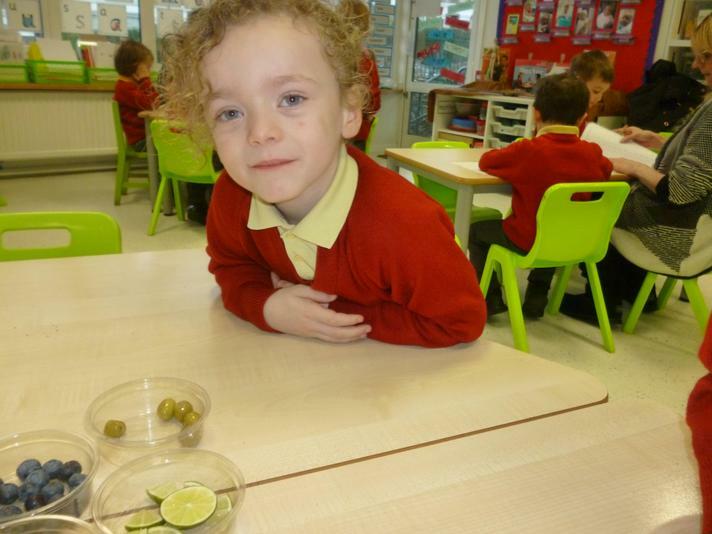 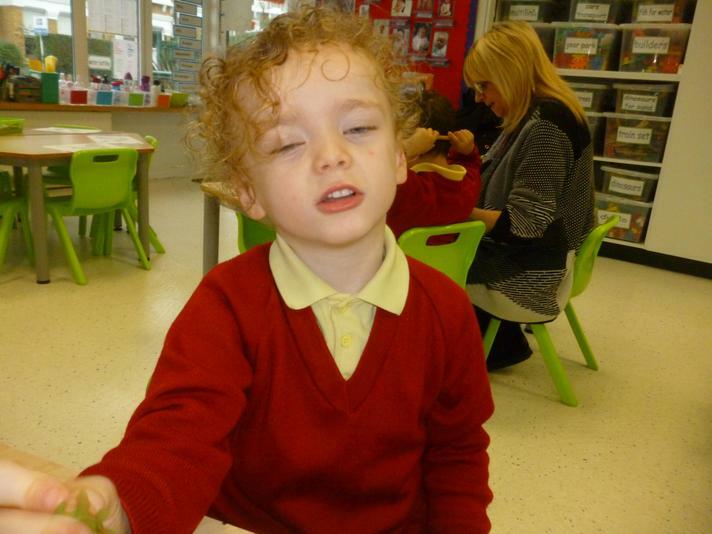 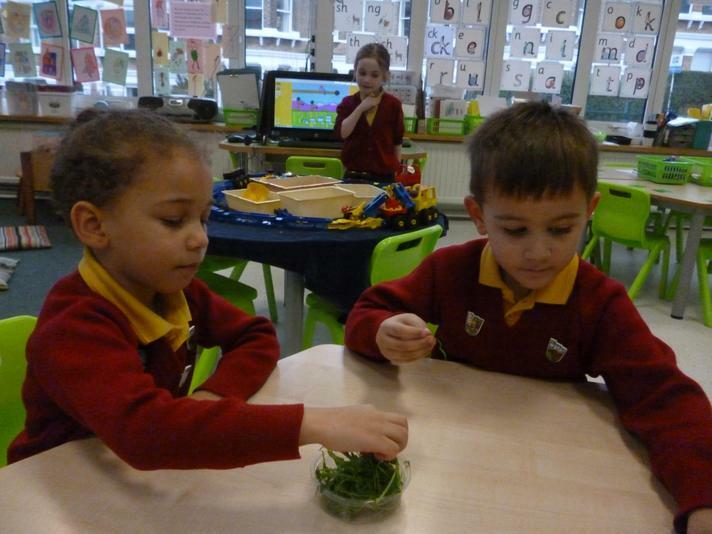 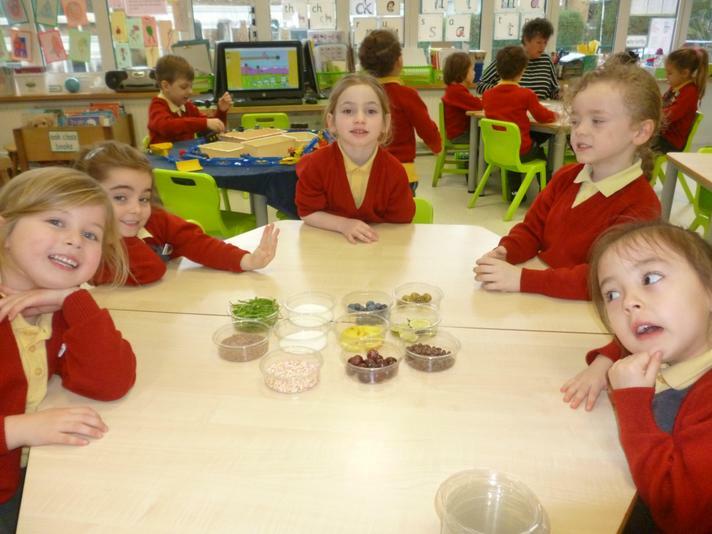 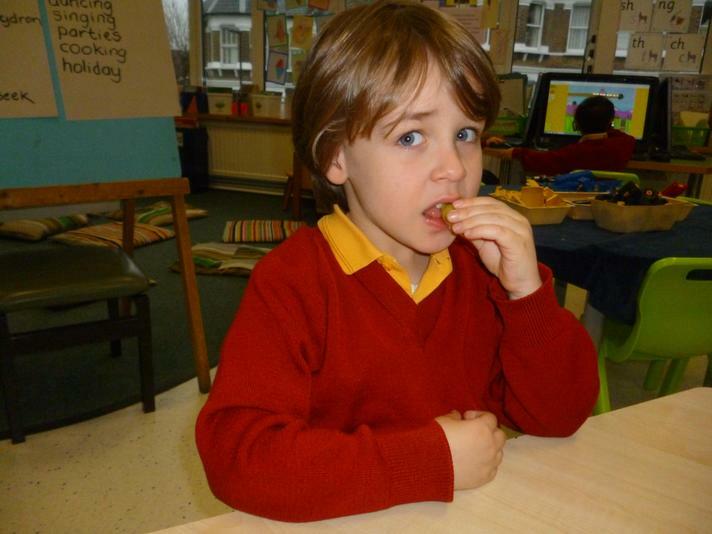 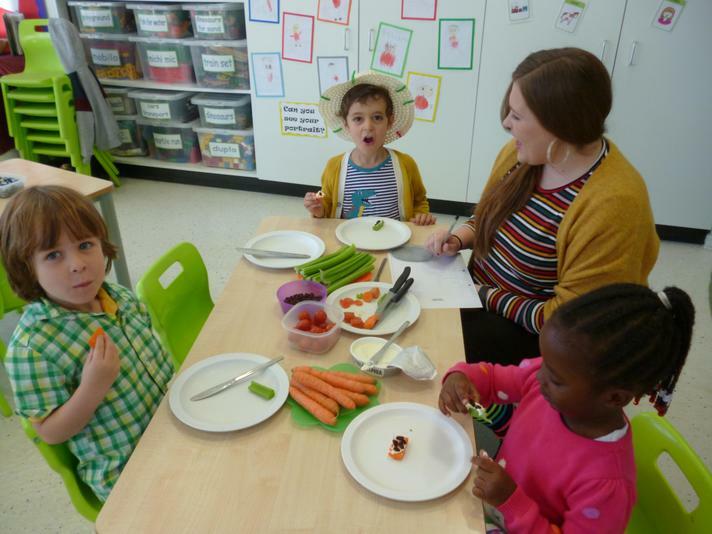 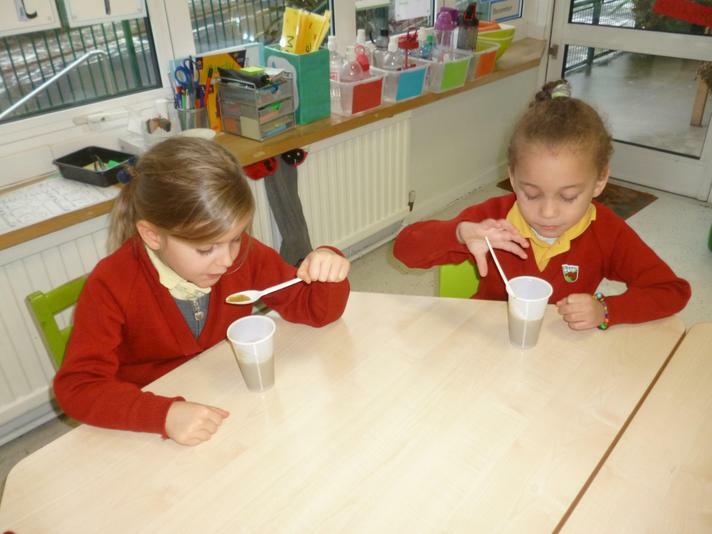 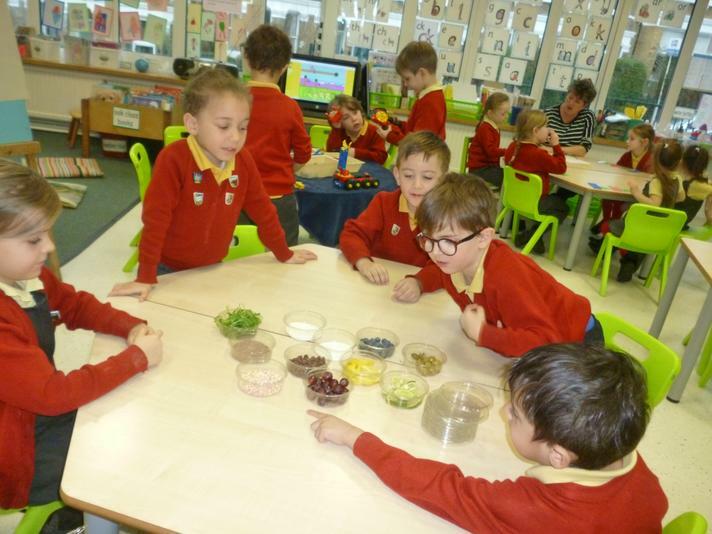 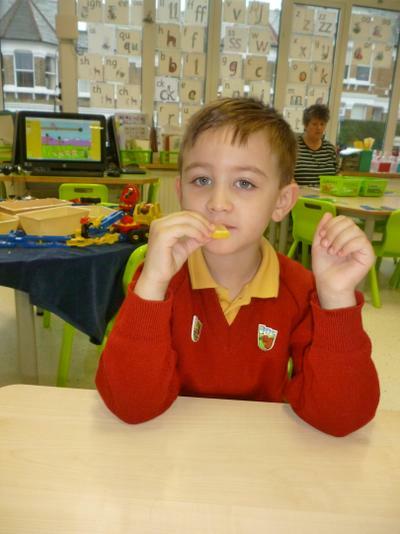 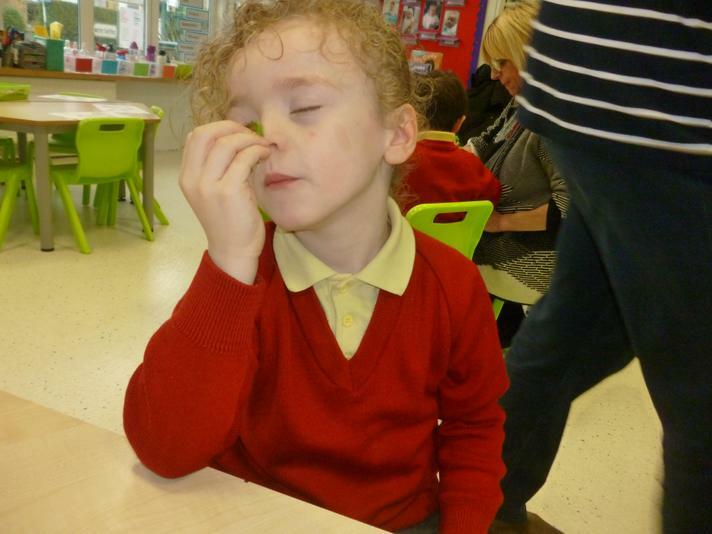 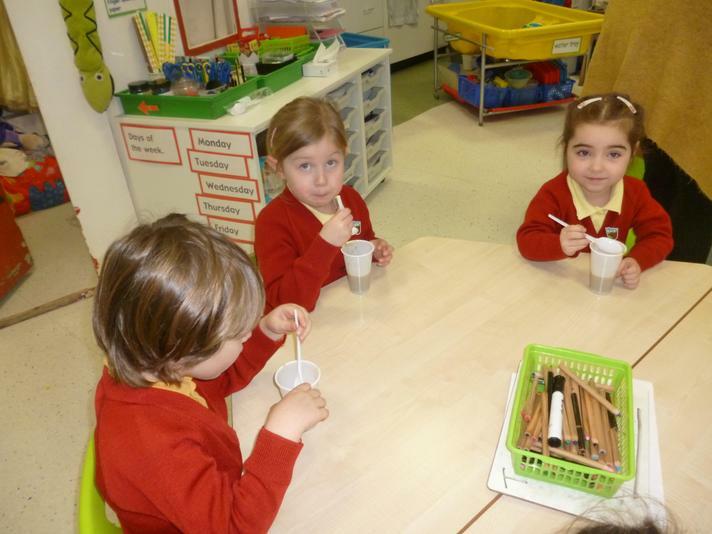 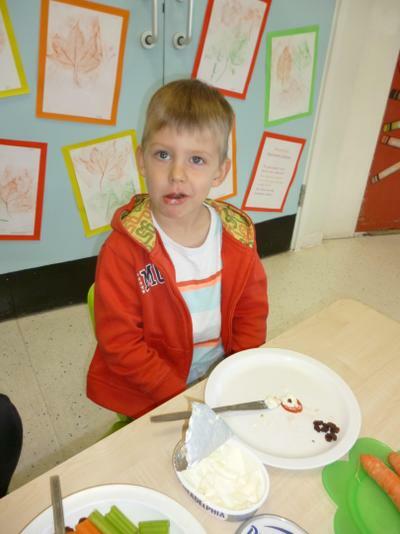 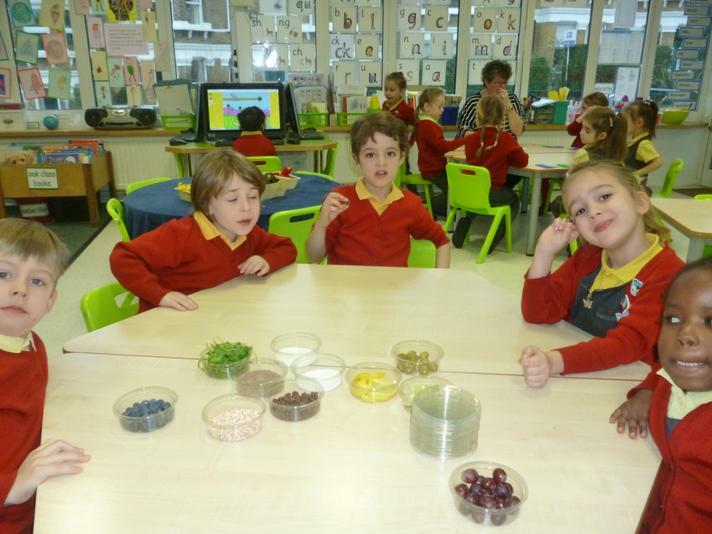 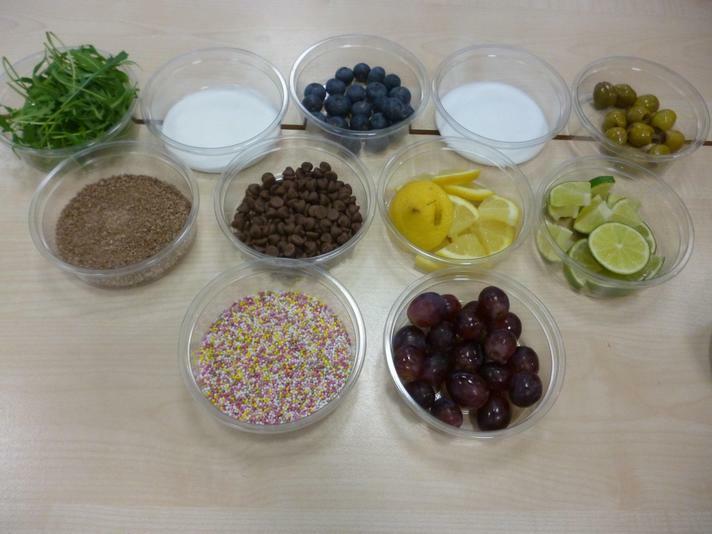 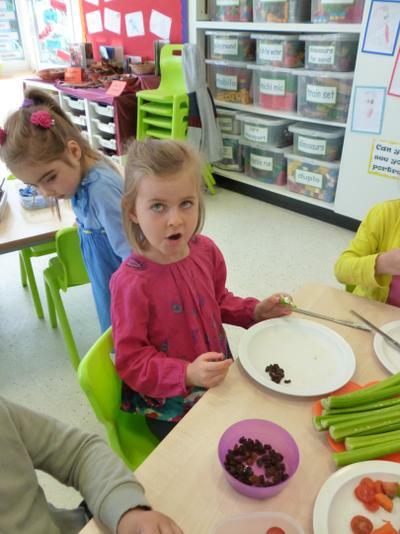 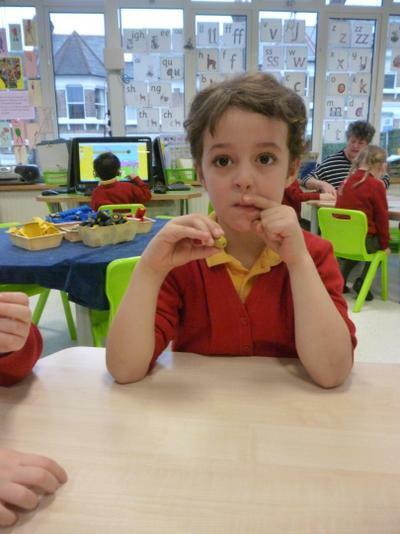 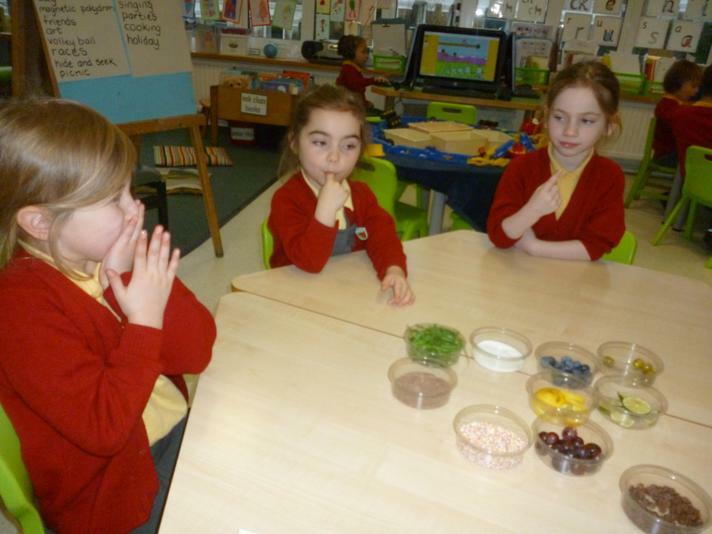 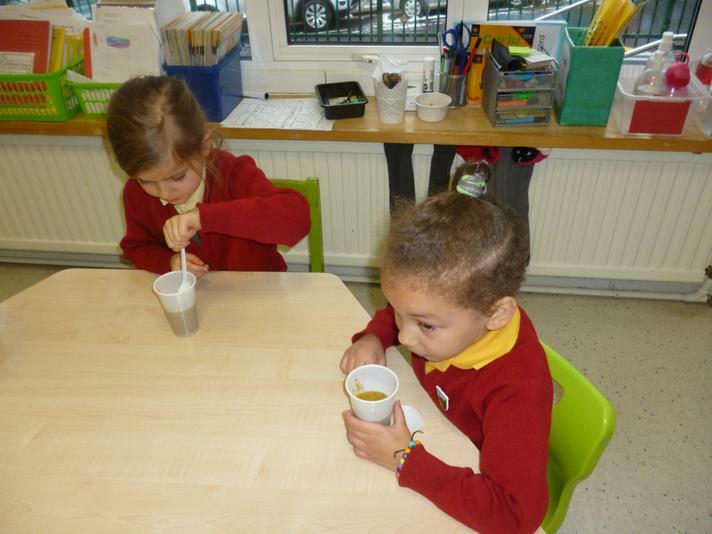 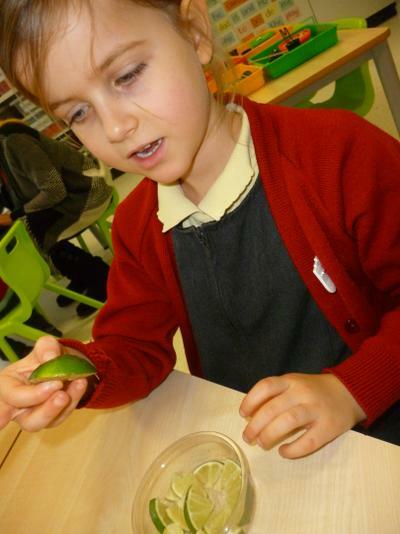 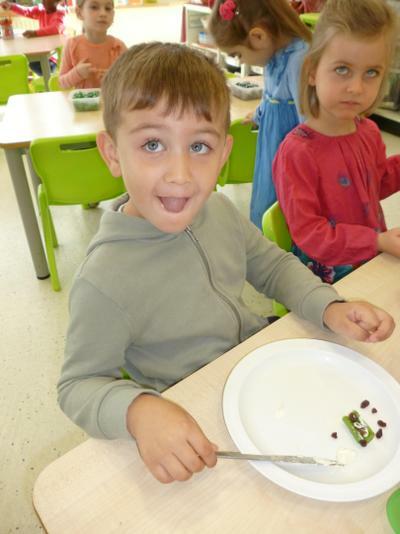 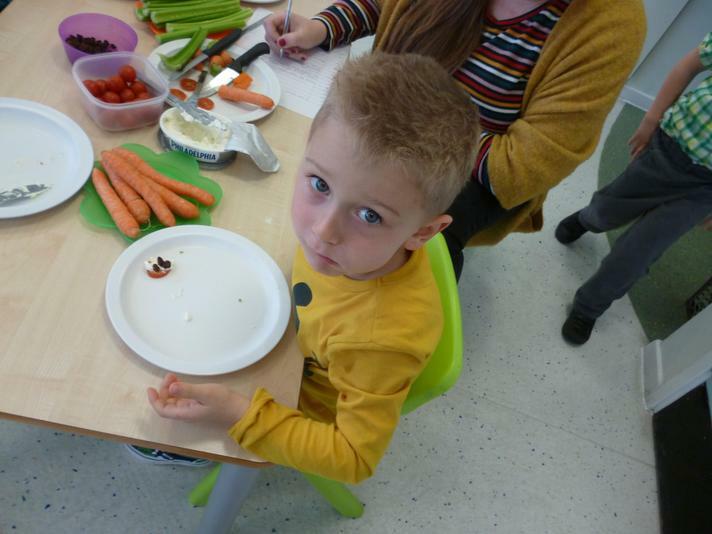 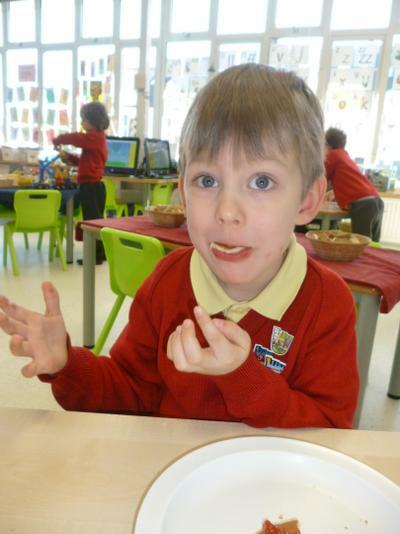 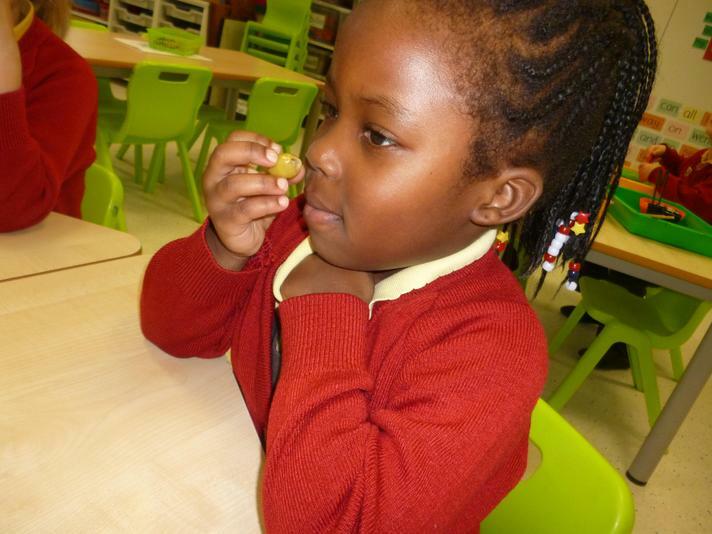 Today we used our taste buds to explore lots of different flavours...we tasted grapes, olives, blueberries, chocolate chips, salt, sugar, sprinkles, lemon, lime and rocket leaves. 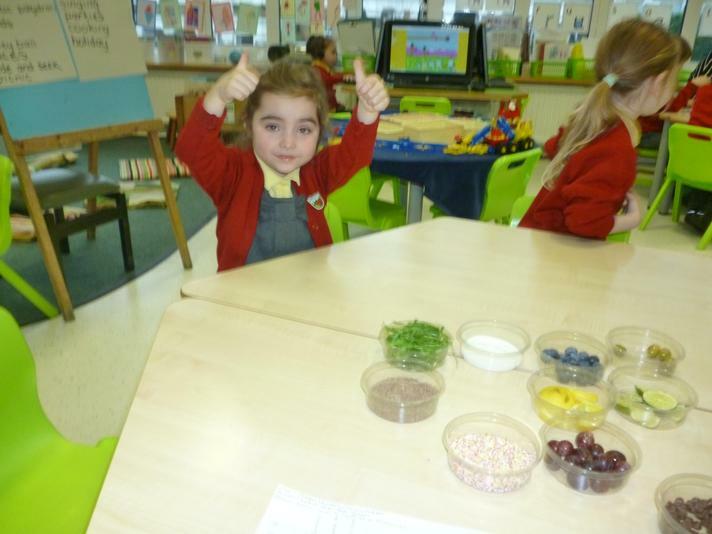 Different people liked different tastes and a couple of people liked EVERYTHING! 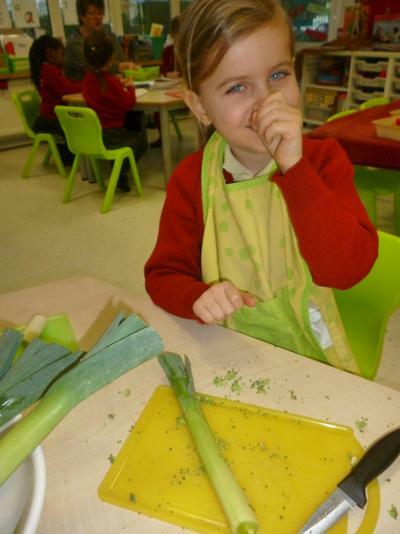 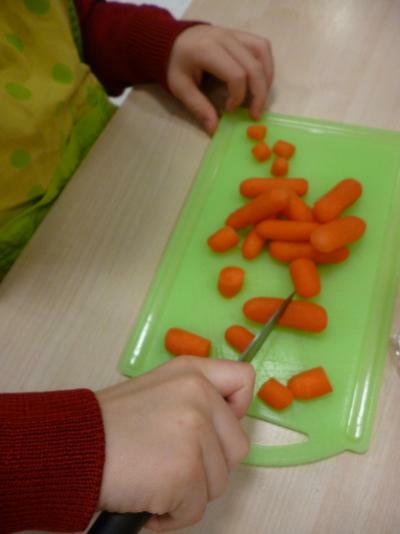 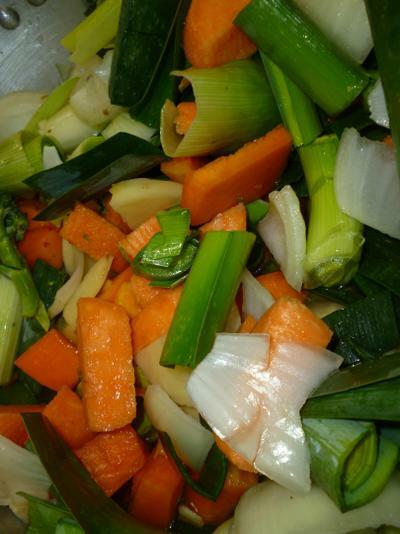 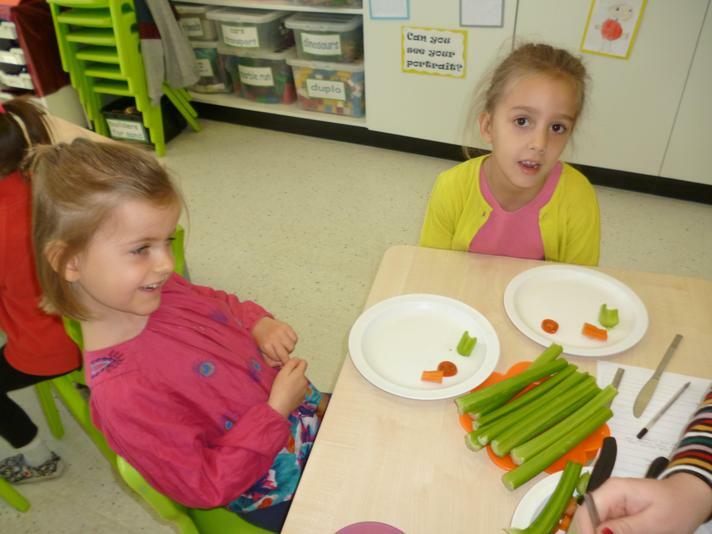 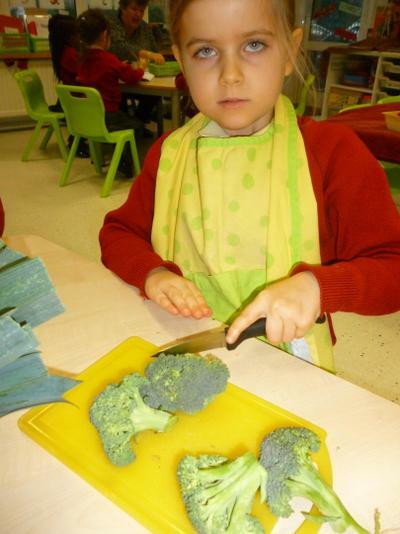 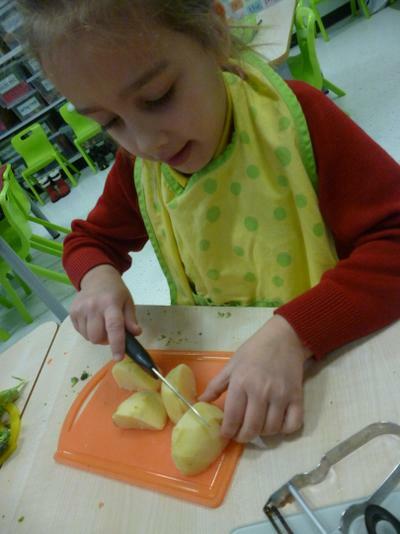 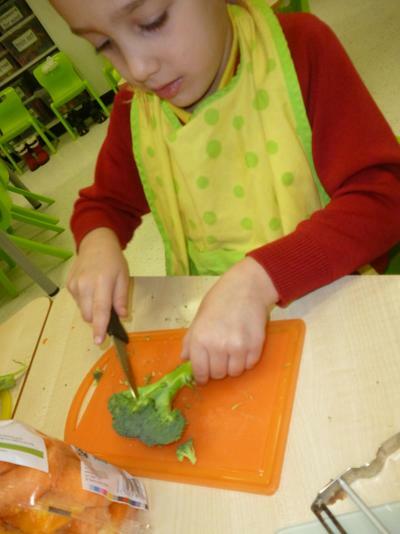 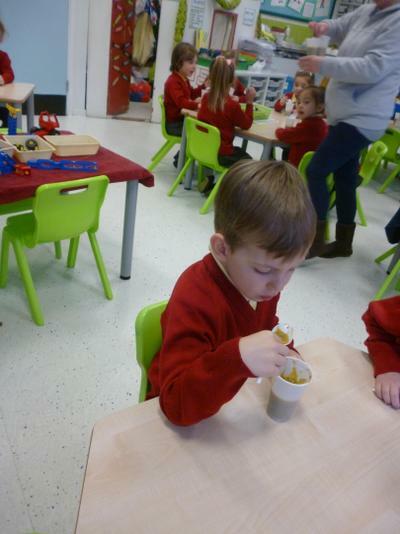 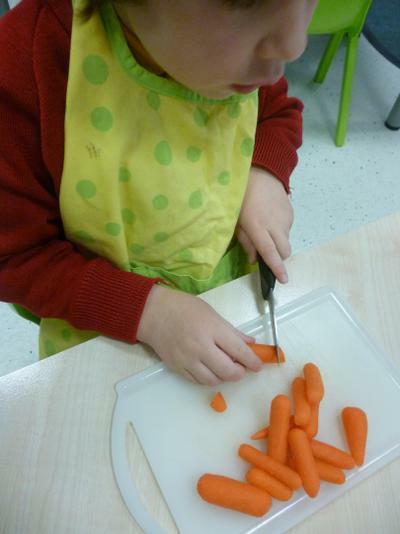 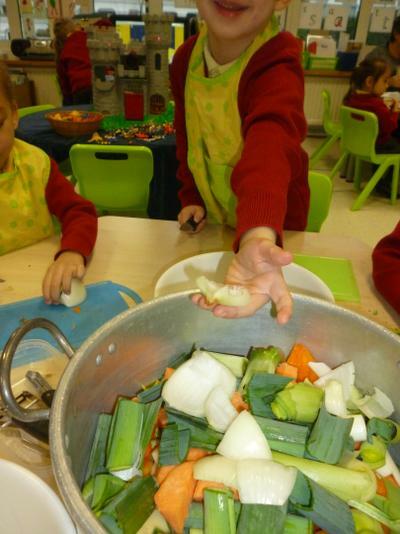 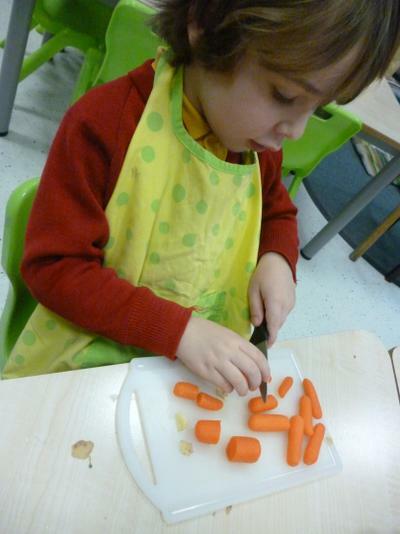 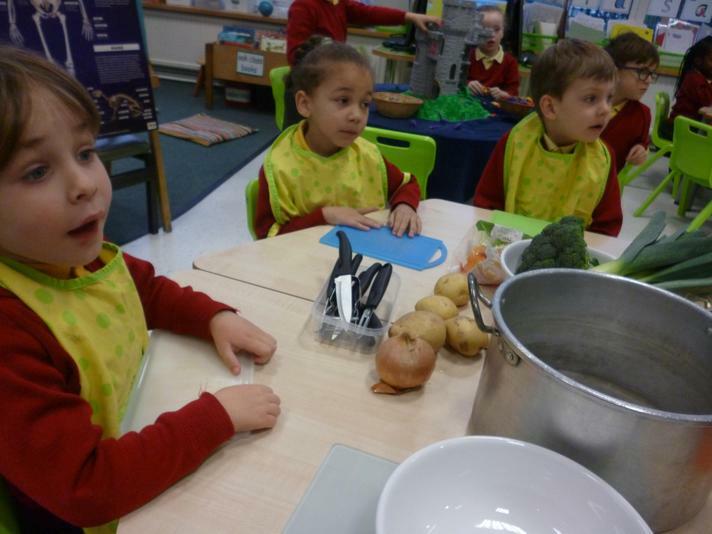 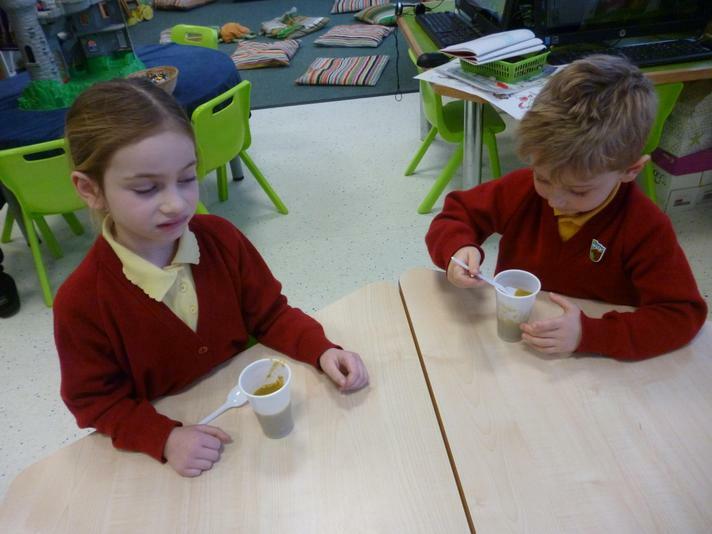 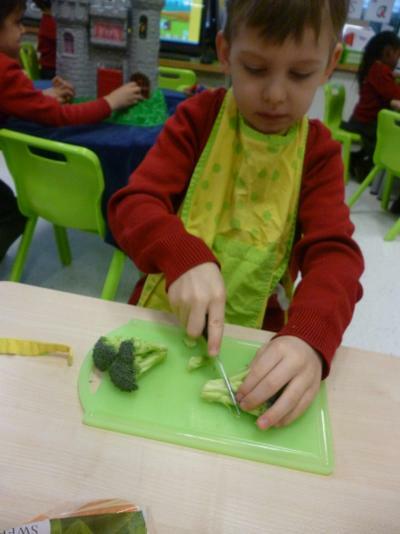 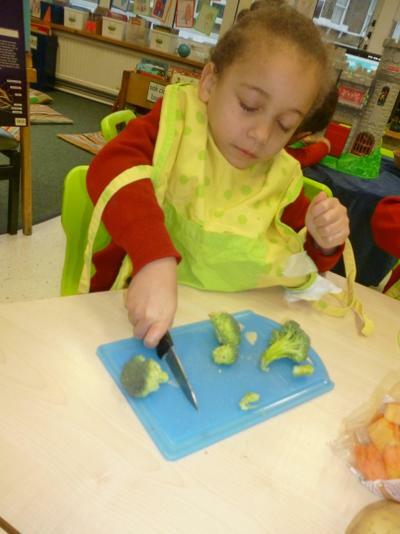 Today we made lovely vegetable soup. 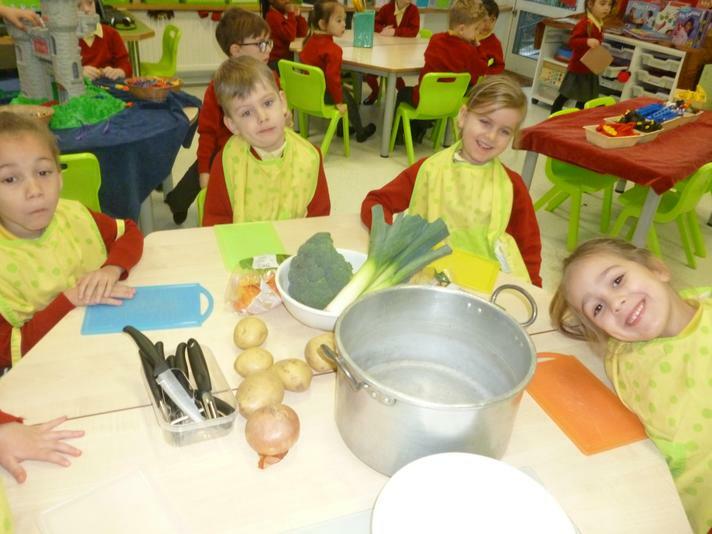 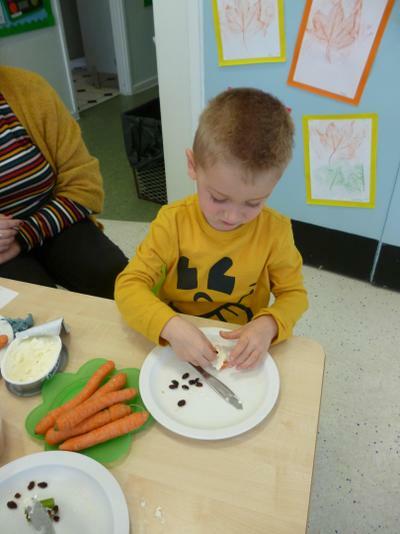 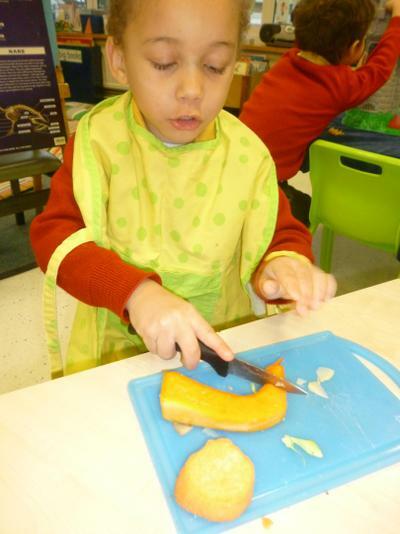 Our cooks were Eloise, Kai, Nataniel,Eli and Mia, they had a lot of peeling and chopping to do...they did a very good job.Hot soup was just what we needed on a cold snowy day. 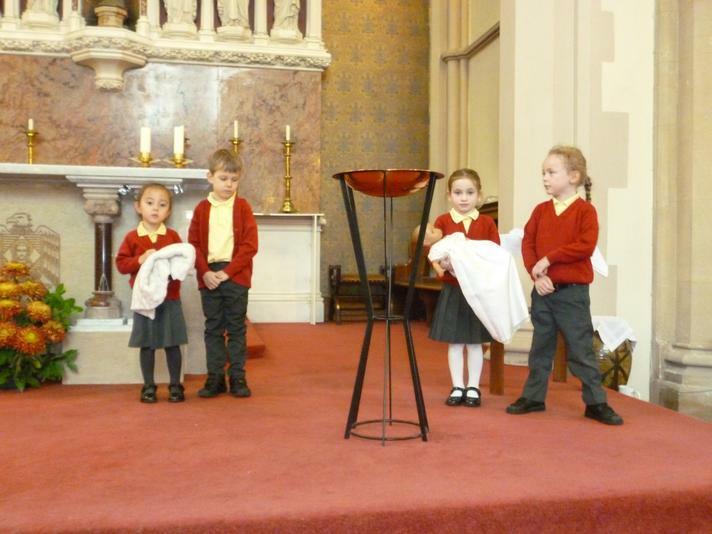 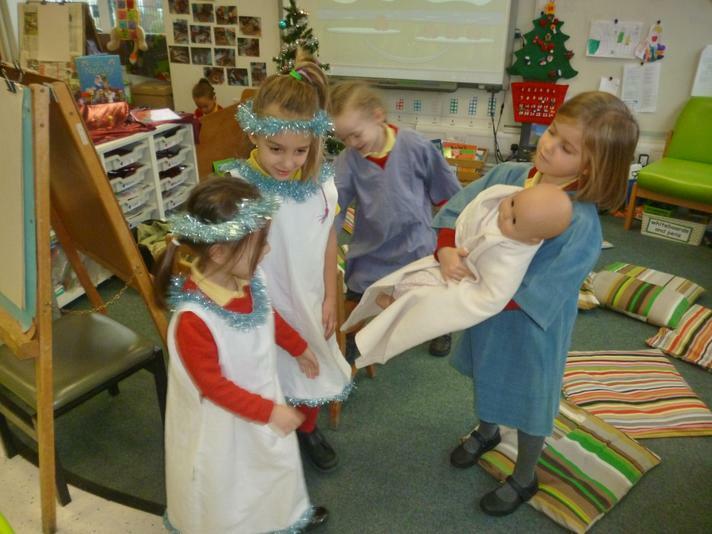 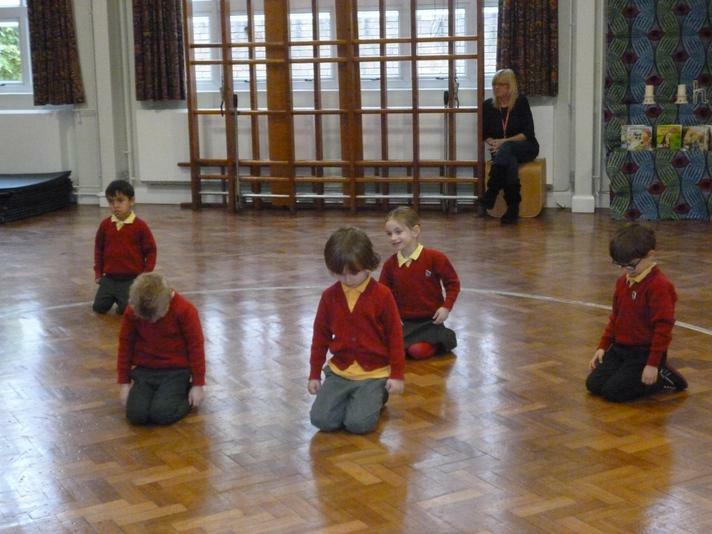 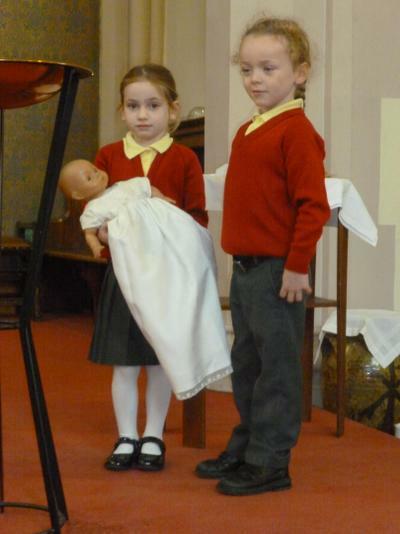 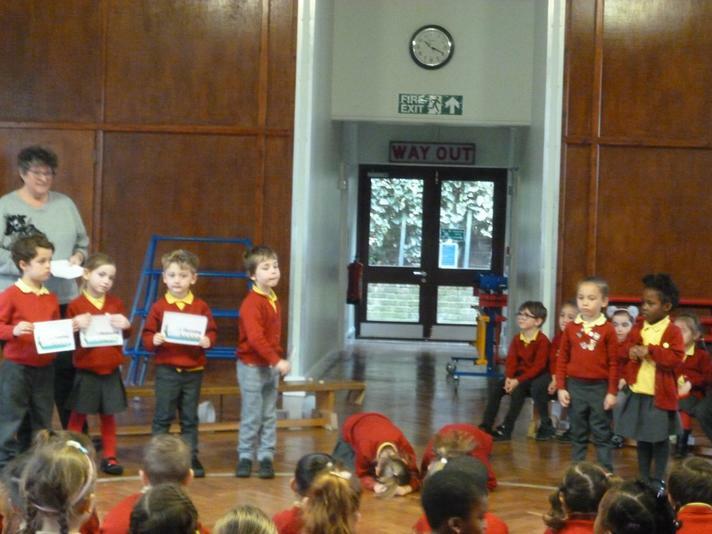 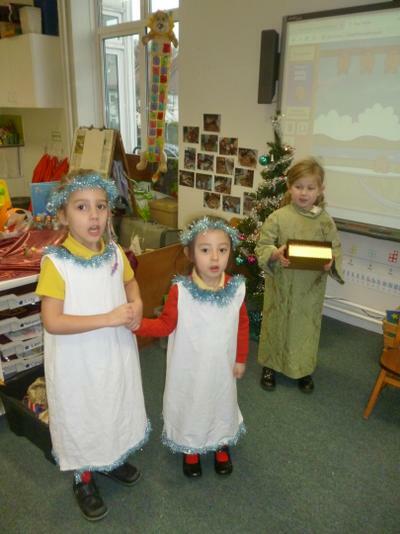 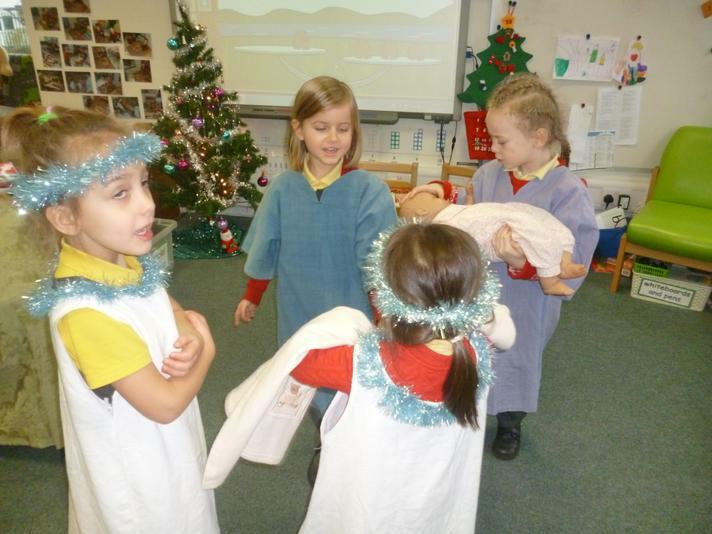 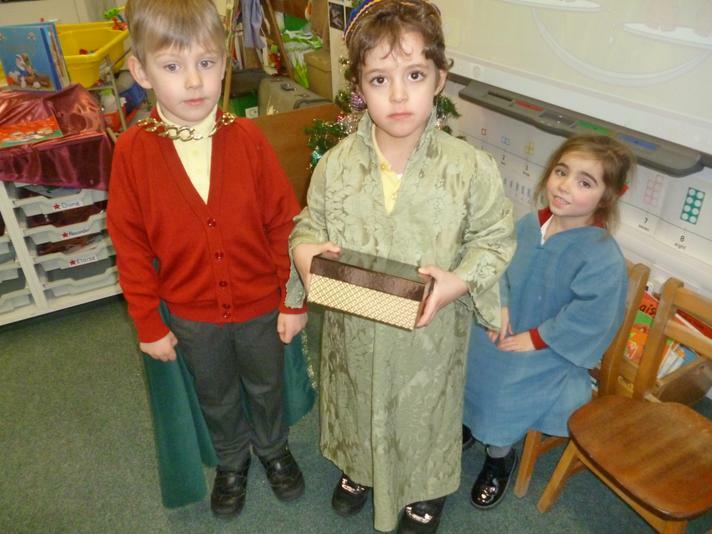 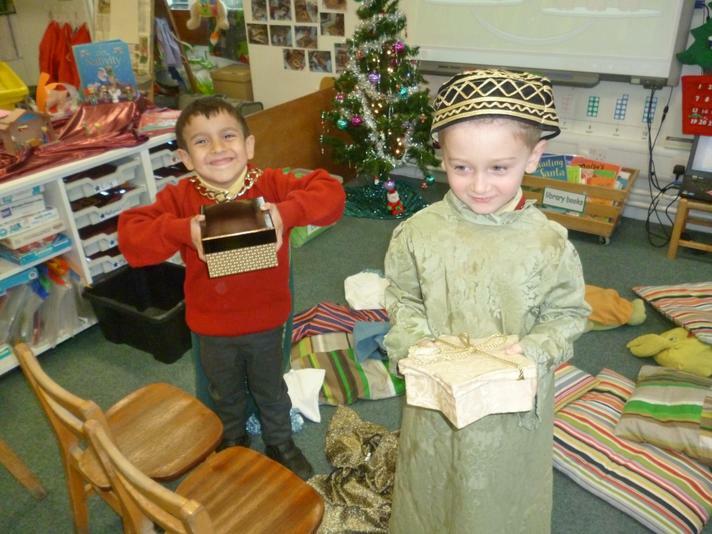 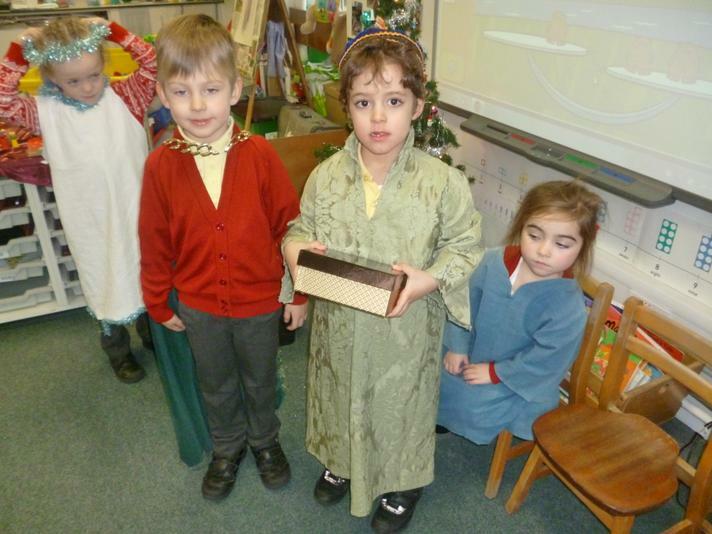 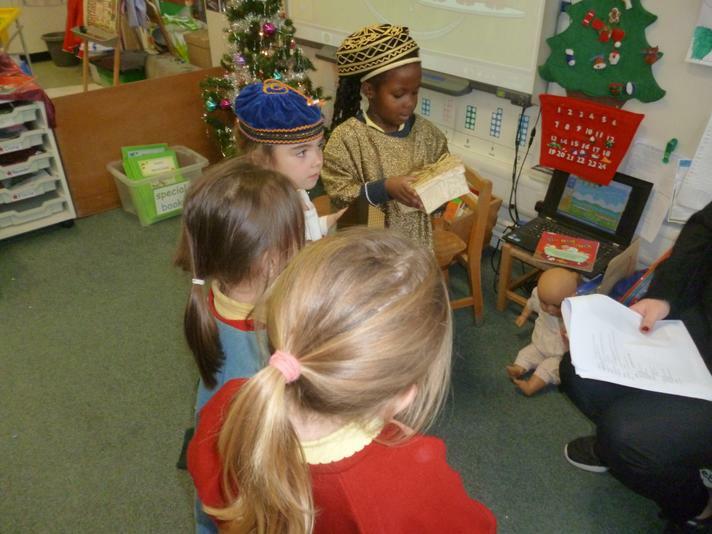 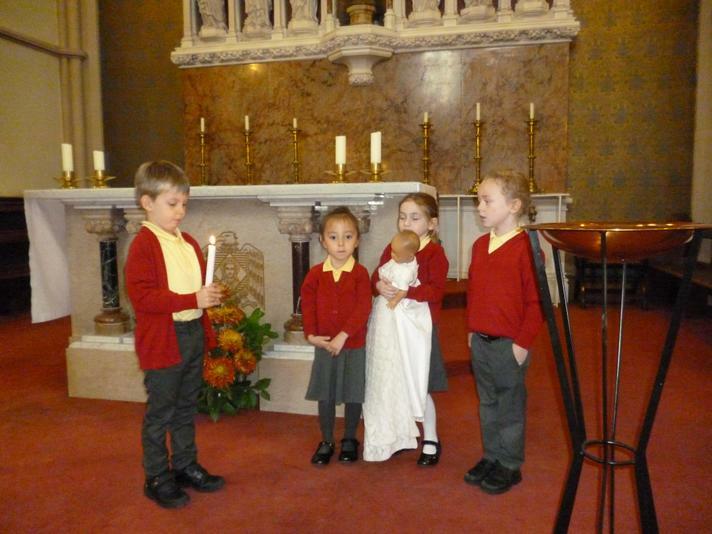 We acted out the story of Simeon and Anna meeting Jesus at the temple. 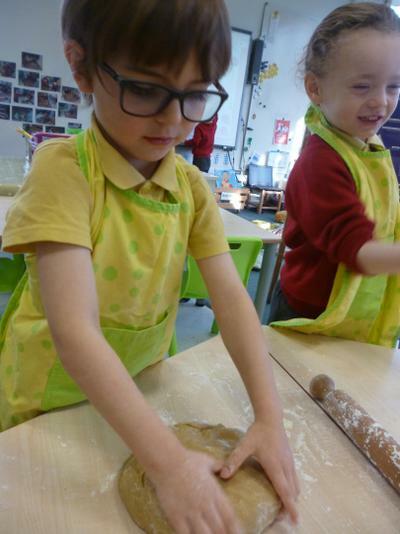 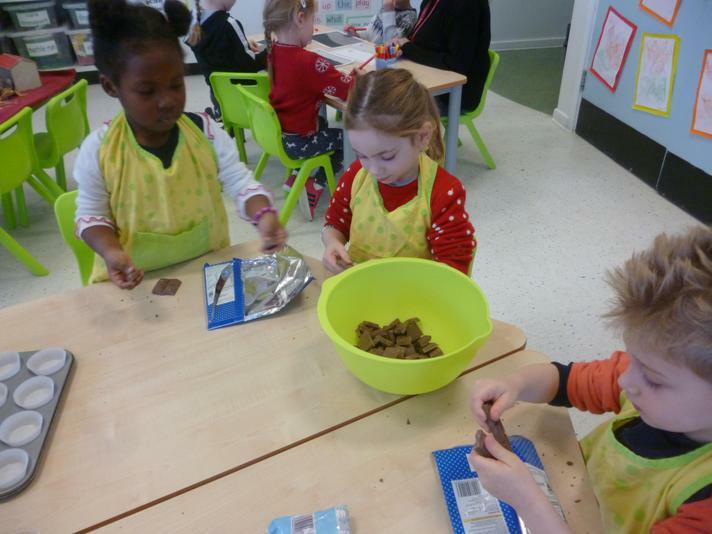 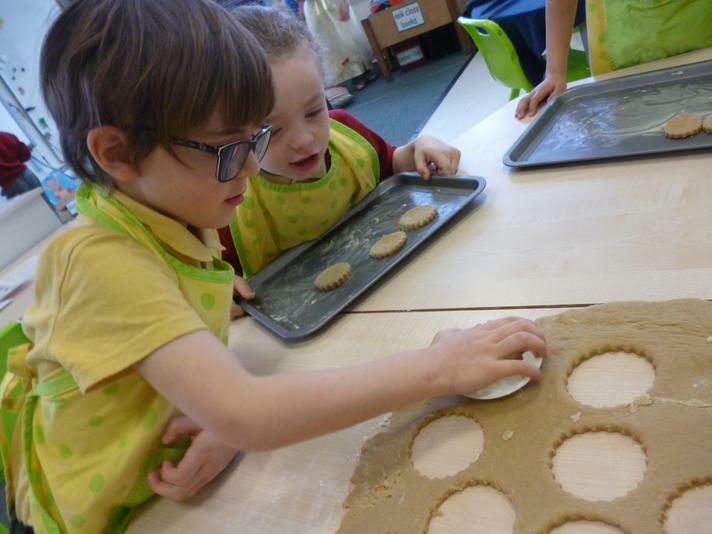 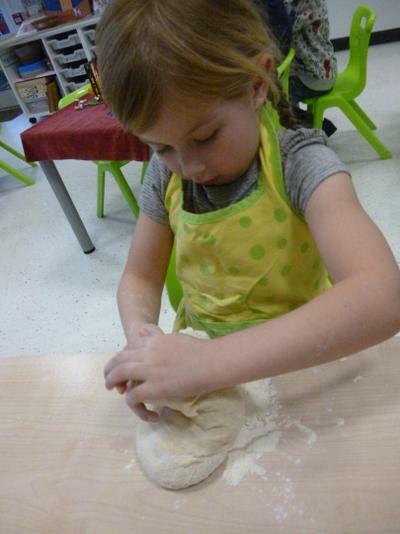 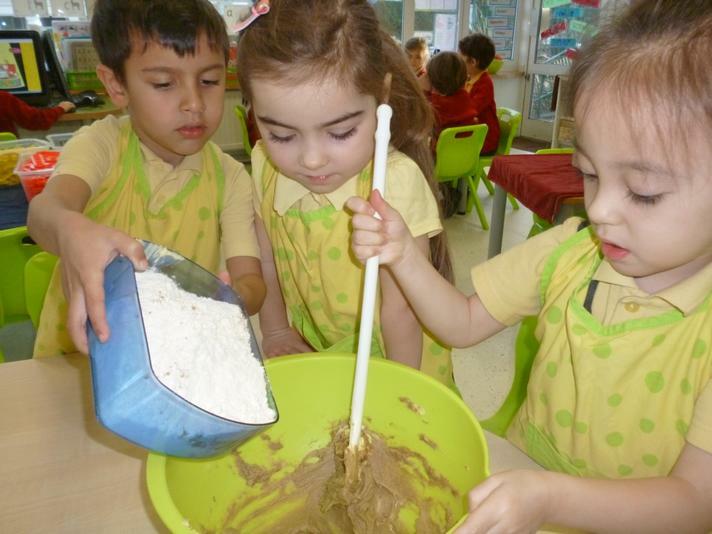 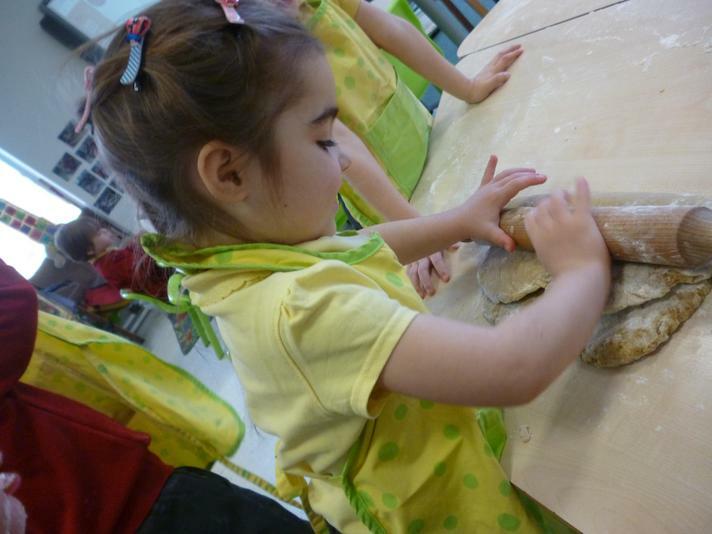 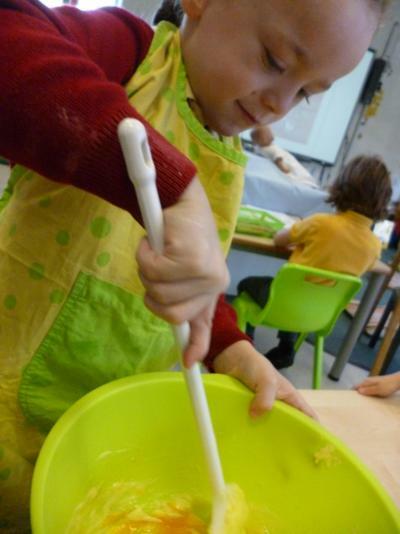 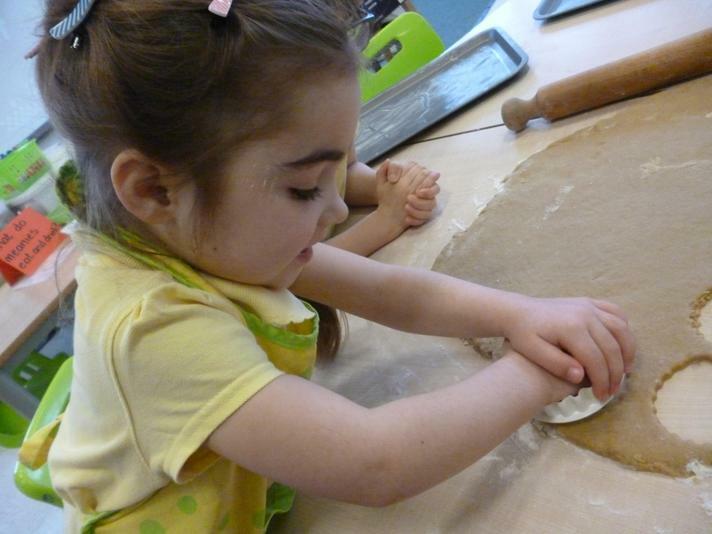 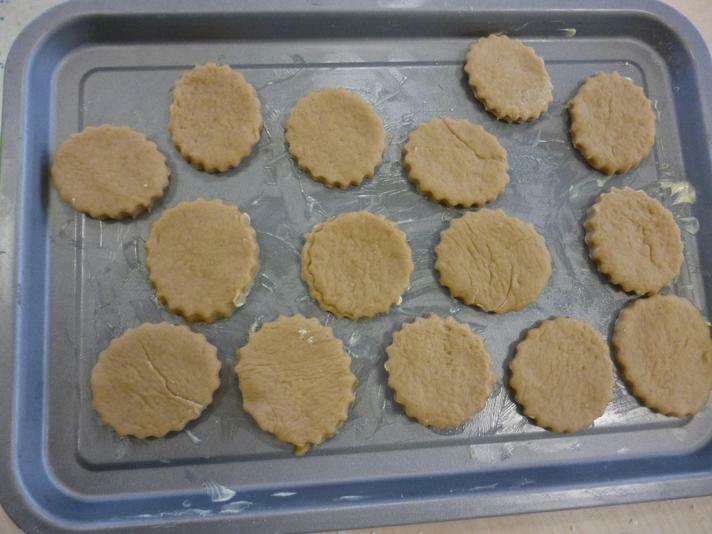 Gingerbread biscuits, Today our cooks were Iacopo, Levi, Grace,Lillian and Oli. 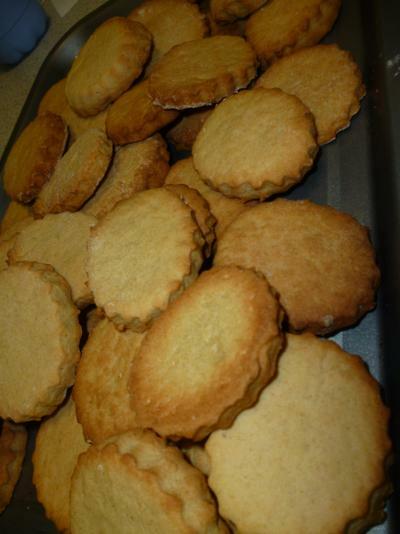 You need 150g butter, 150g soft brown sugar, 500g plain flour, 1tsp ground ginger, 1tsp milk 1tblsp syrup and 1 beaten egg. 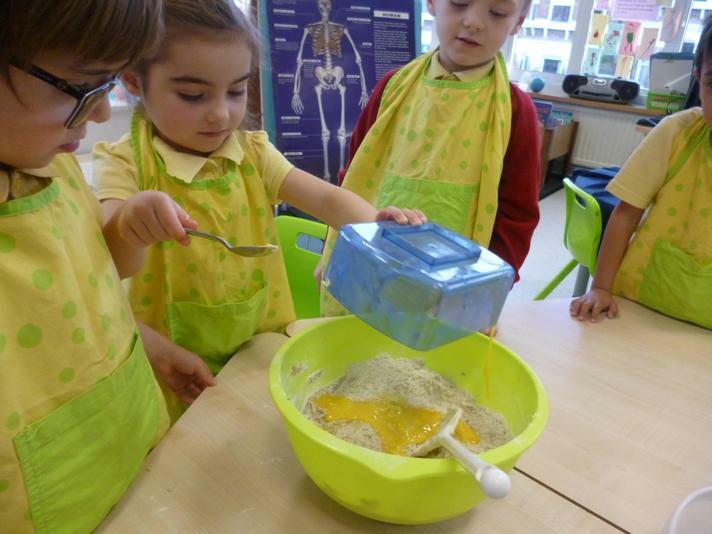 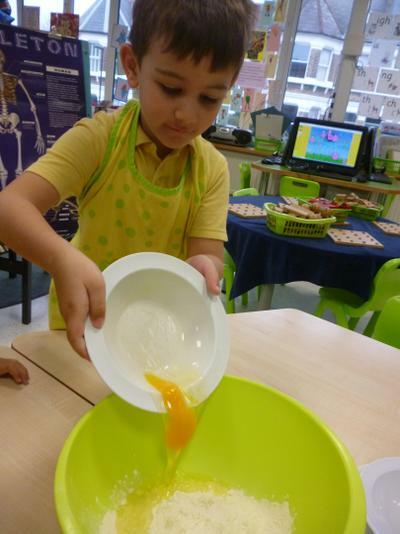 Beat the sugar and butter together, stir in the sieved flour and spice, add the syrup and egg. 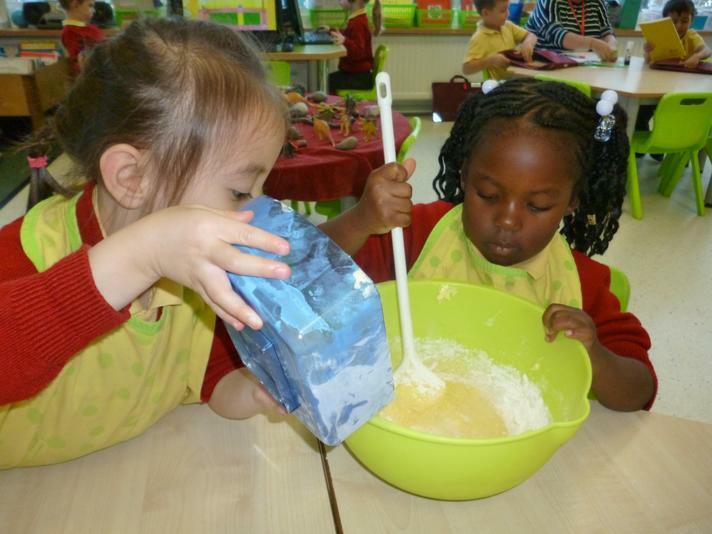 Mix together adding the milk if need to make a ball of dough. 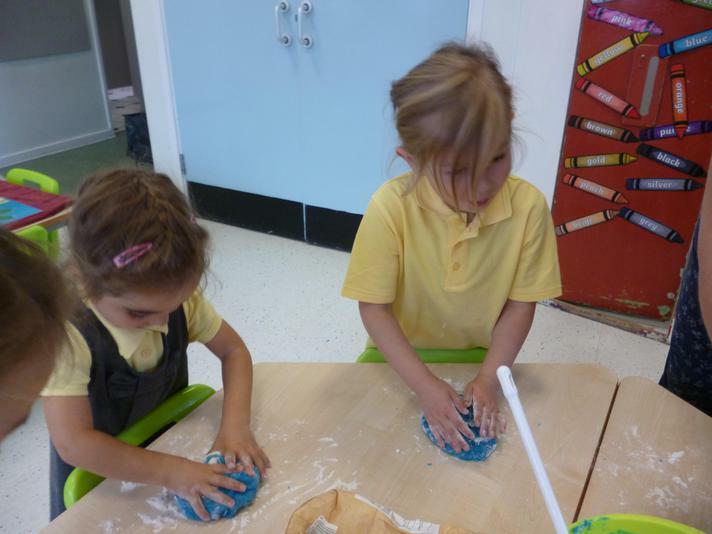 Knead onto a floured surface, roll out and cut into whatever shapes you like ( we made fancy circles) bake for about 15 minutes on 150C/gas mark 3. 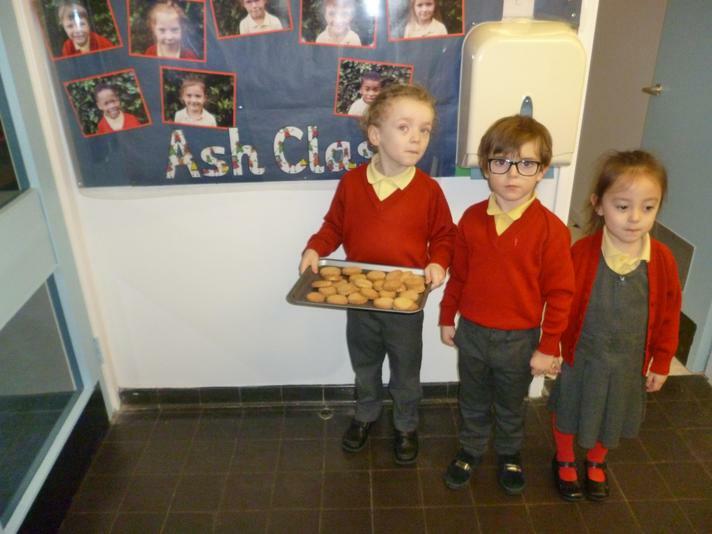 They were delicious and we made enough to share with our friends in Ash class as they acted out the story of the gingerbread man in their assembly today! 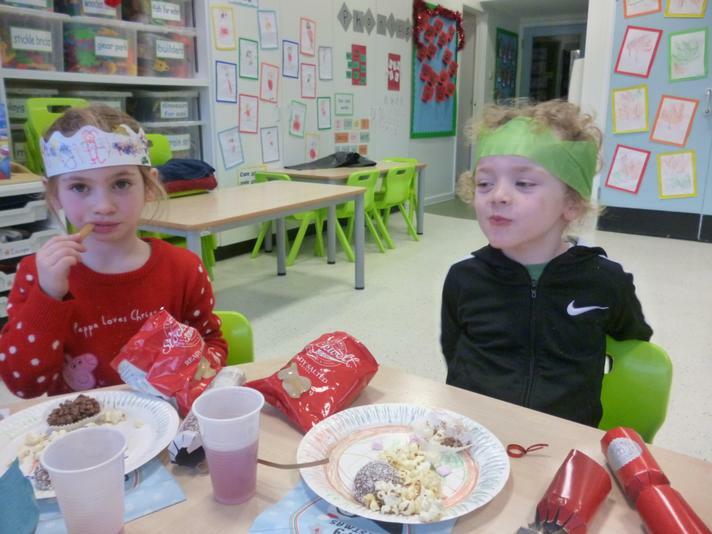 Christmas party fun! 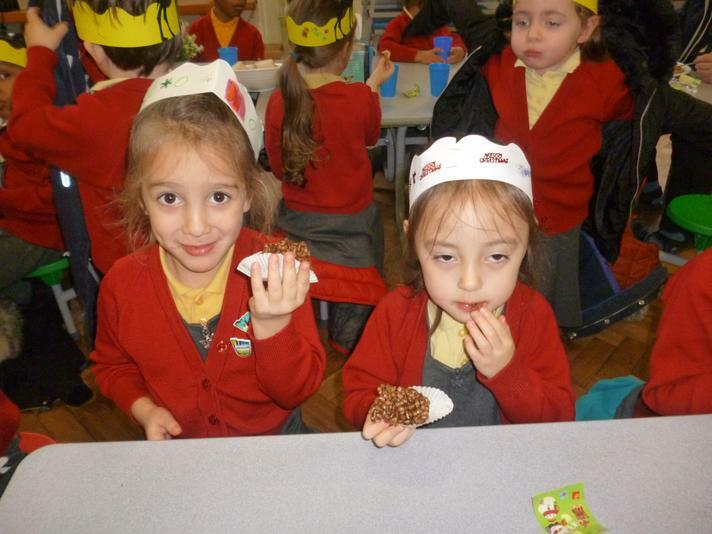 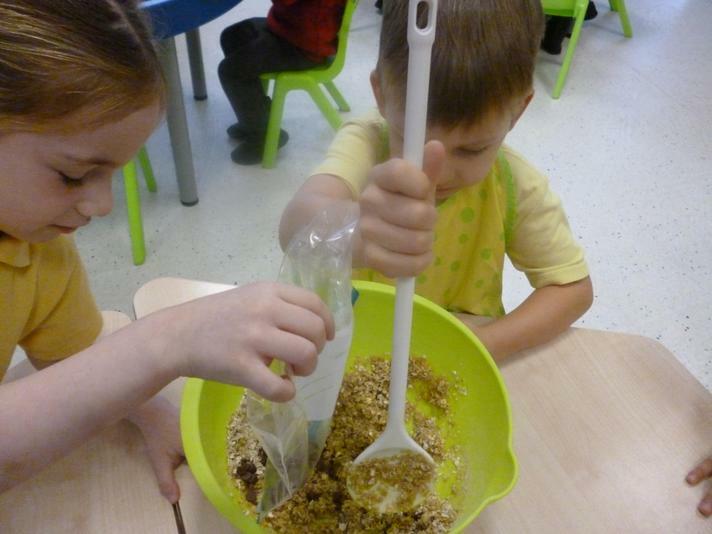 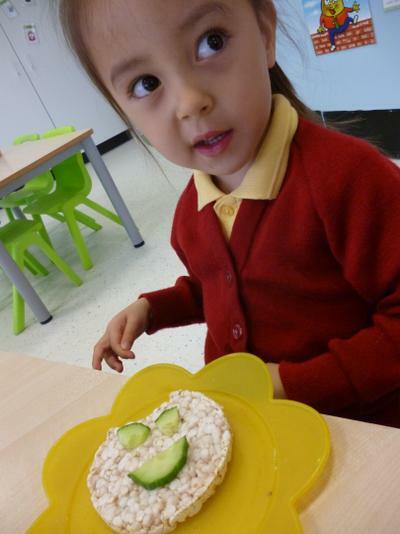 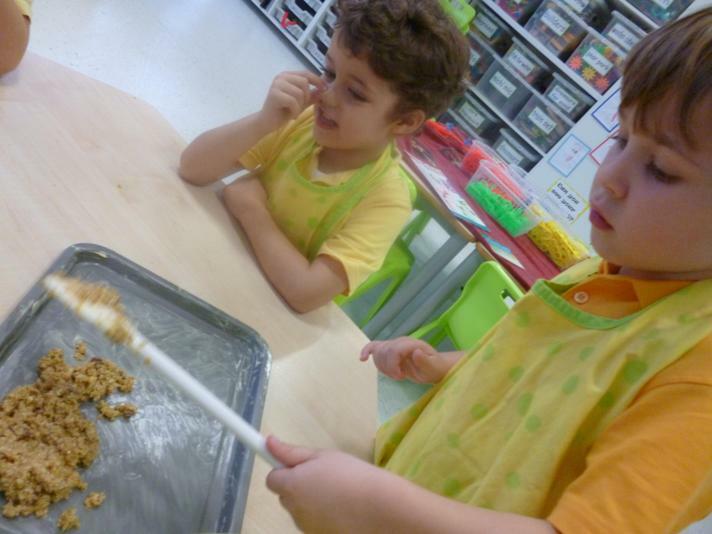 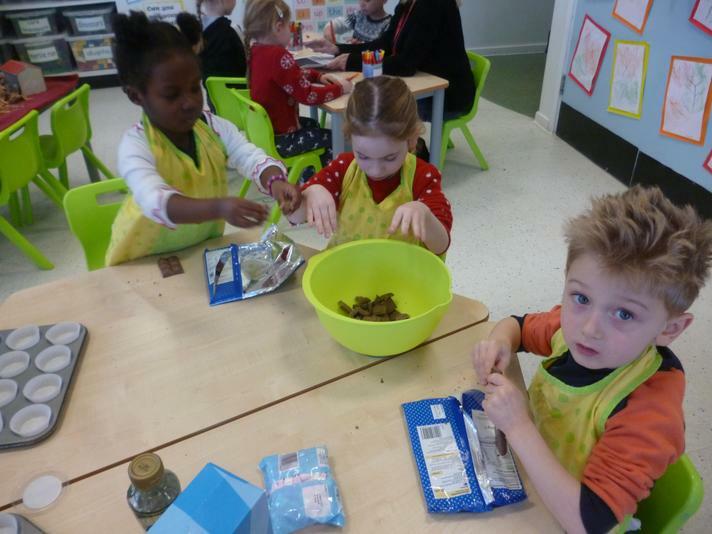 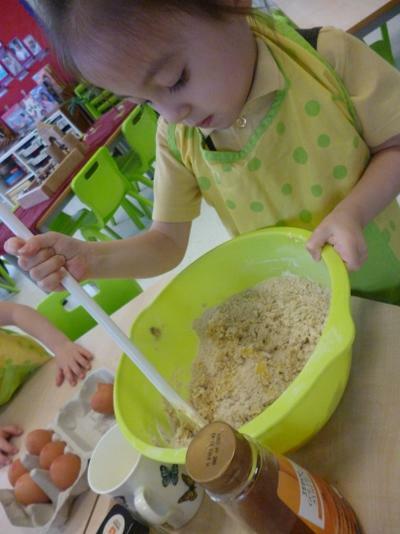 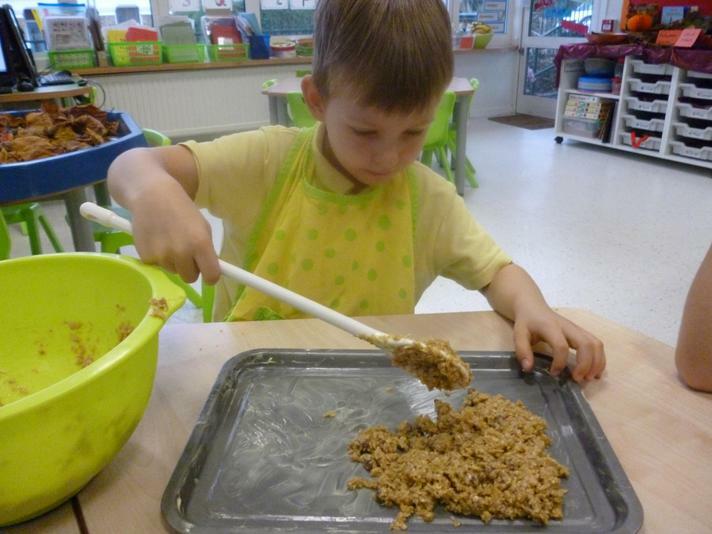 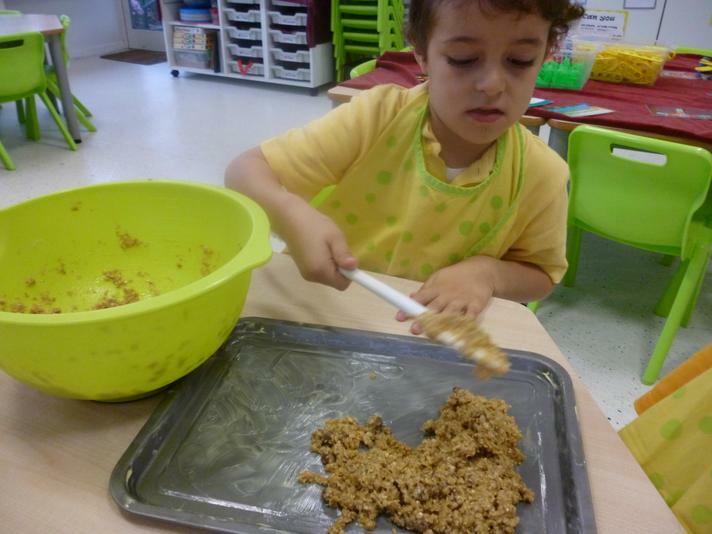 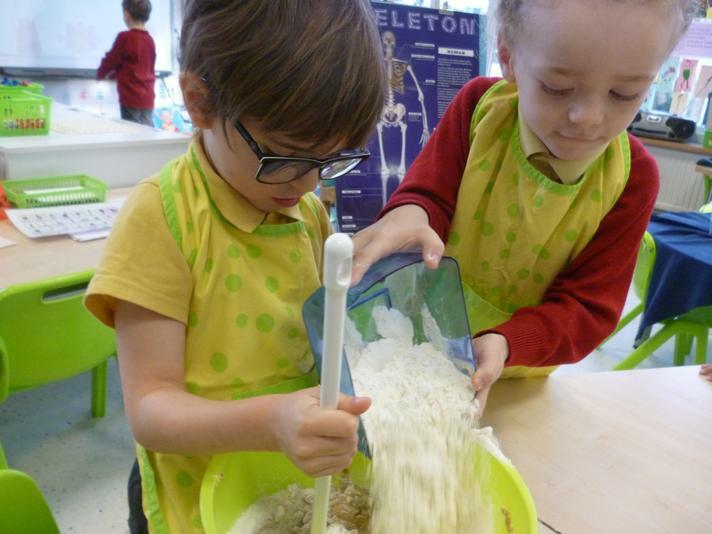 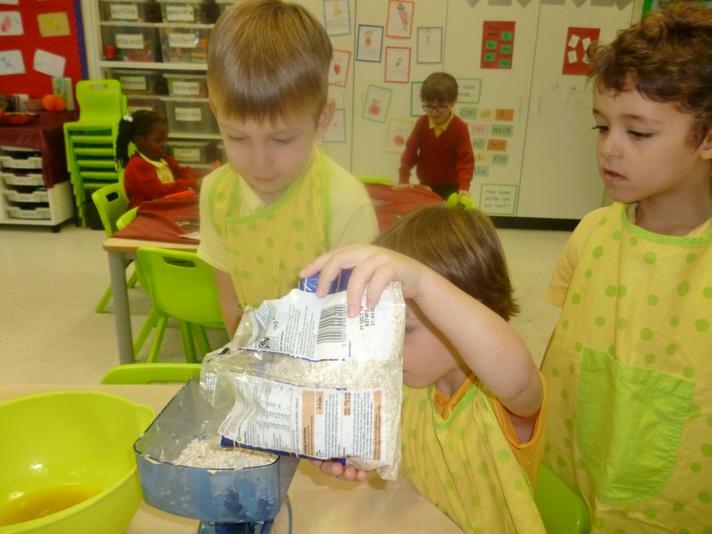 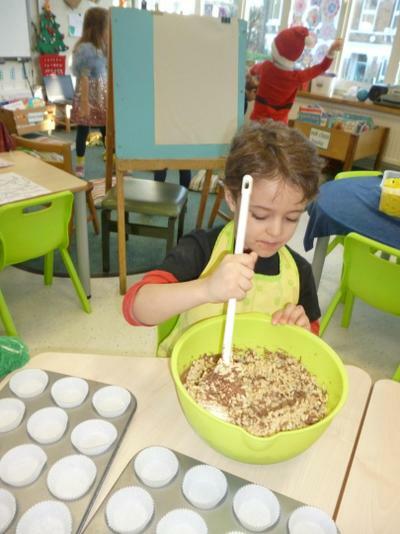 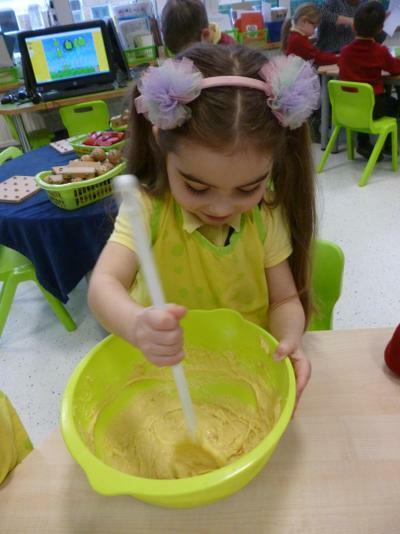 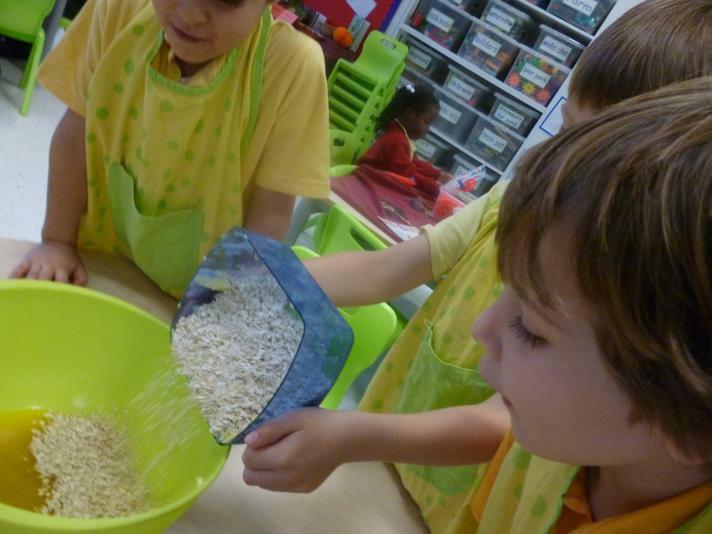 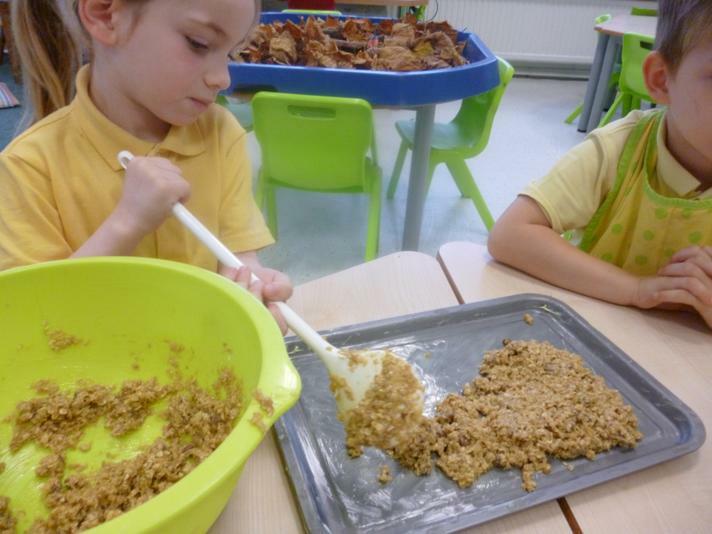 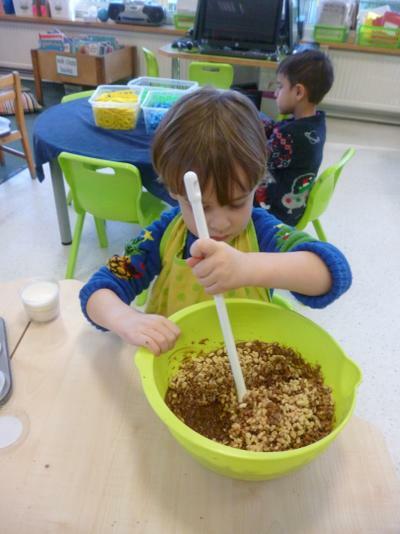 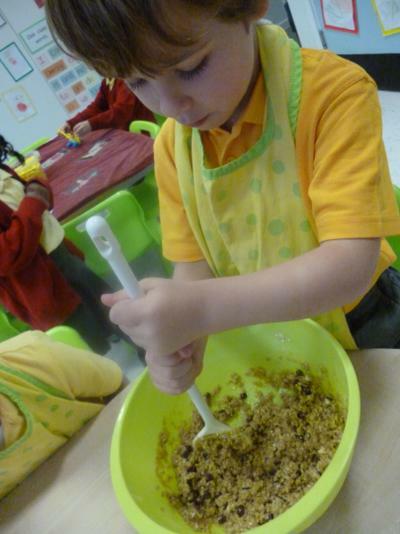 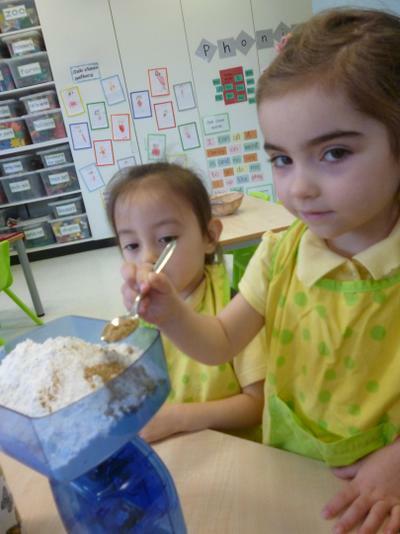 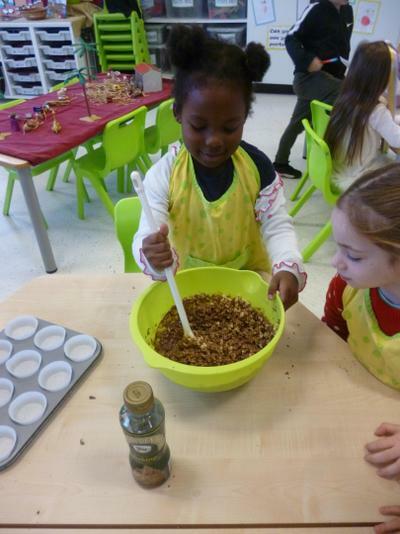 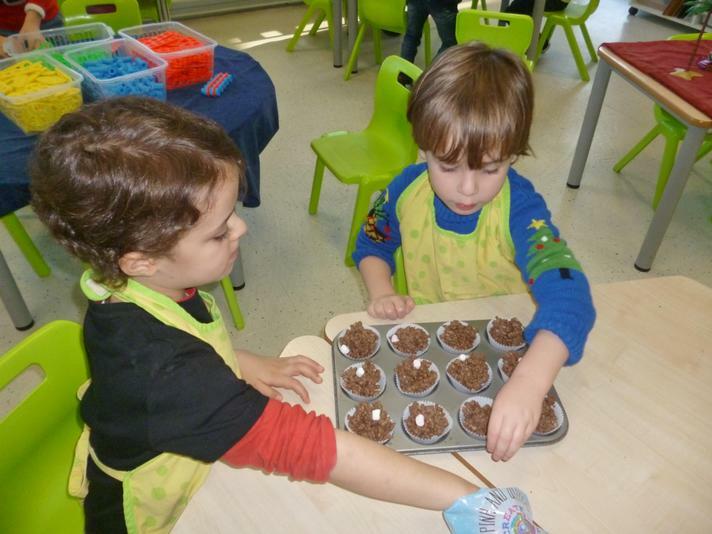 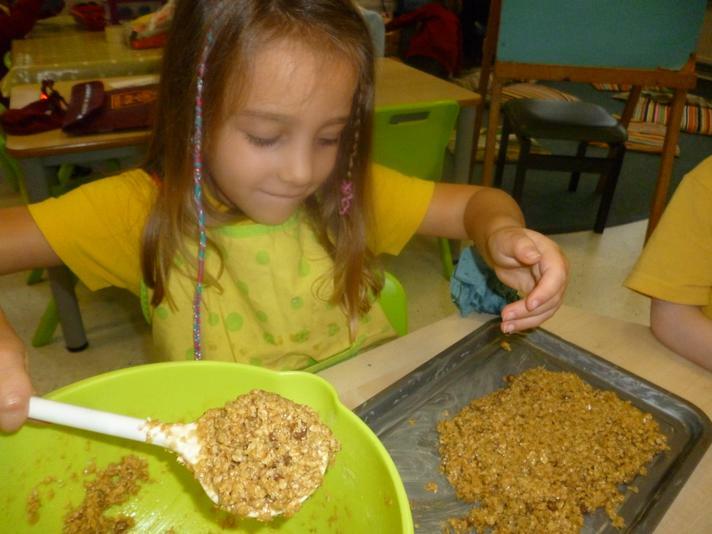 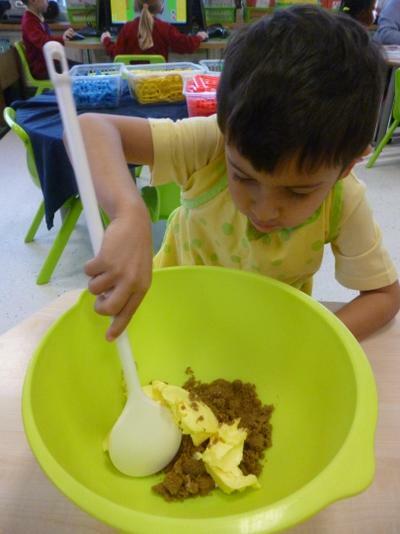 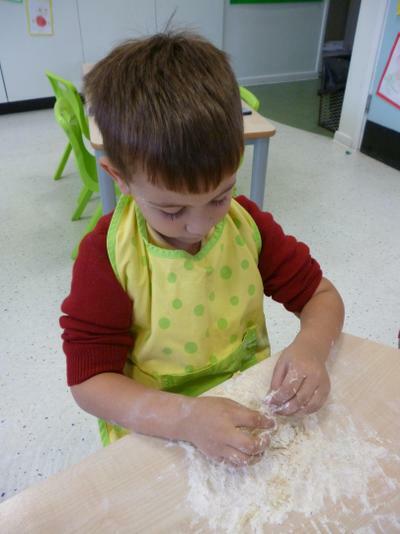 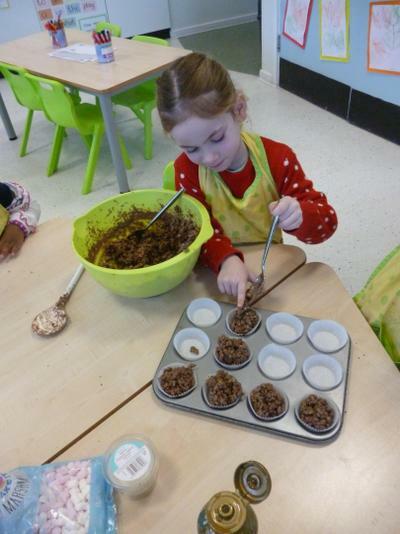 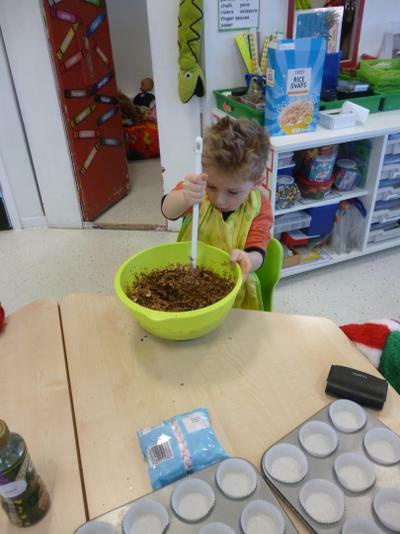 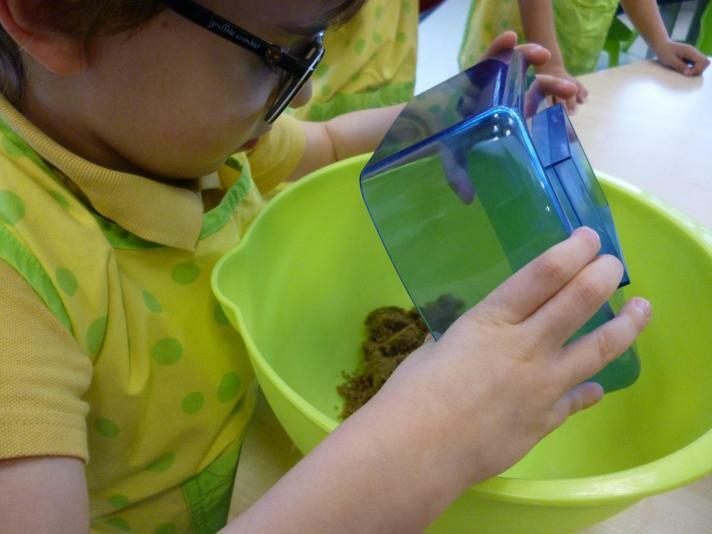 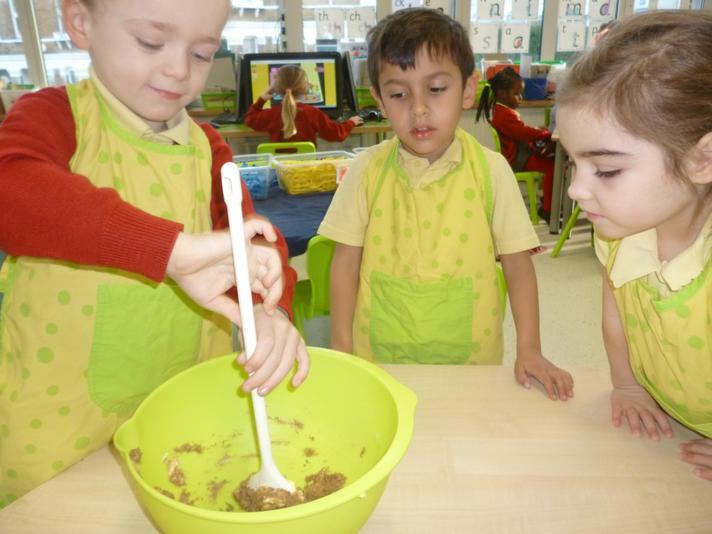 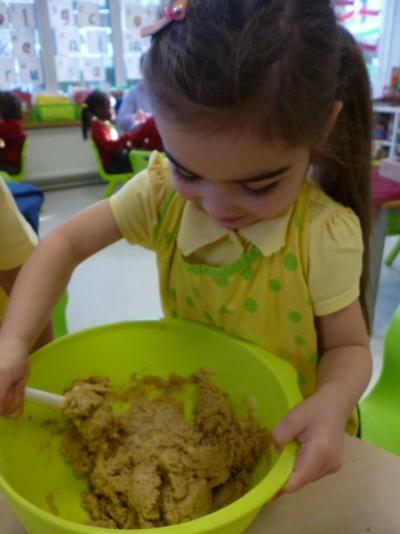 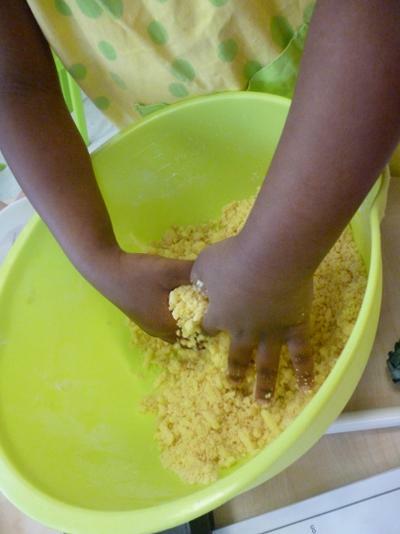 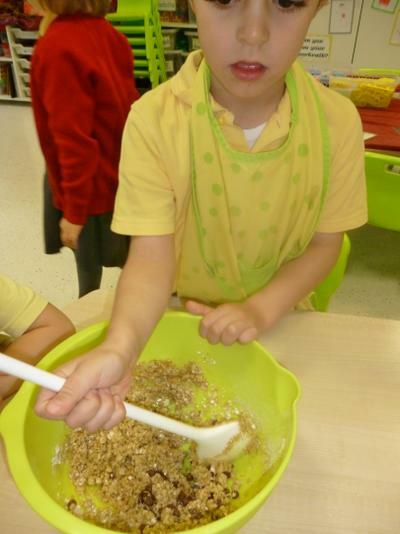 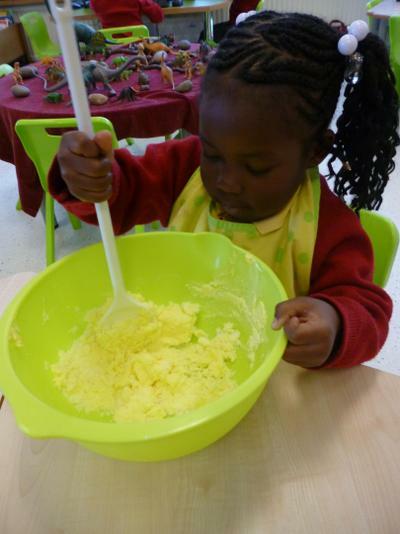 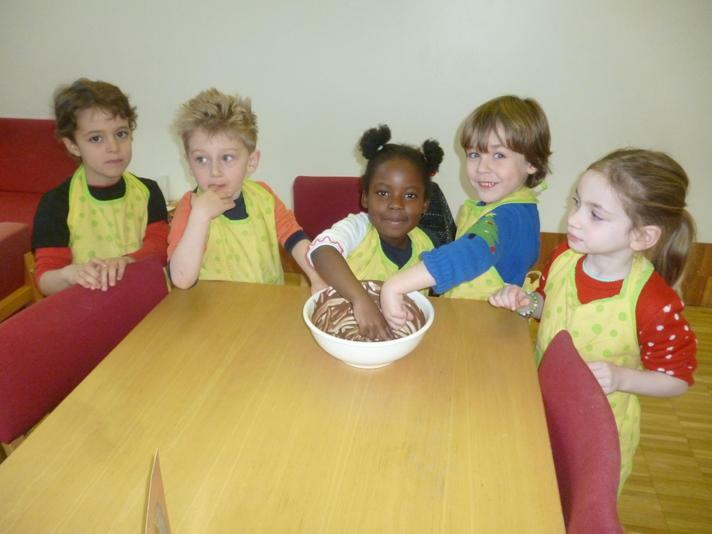 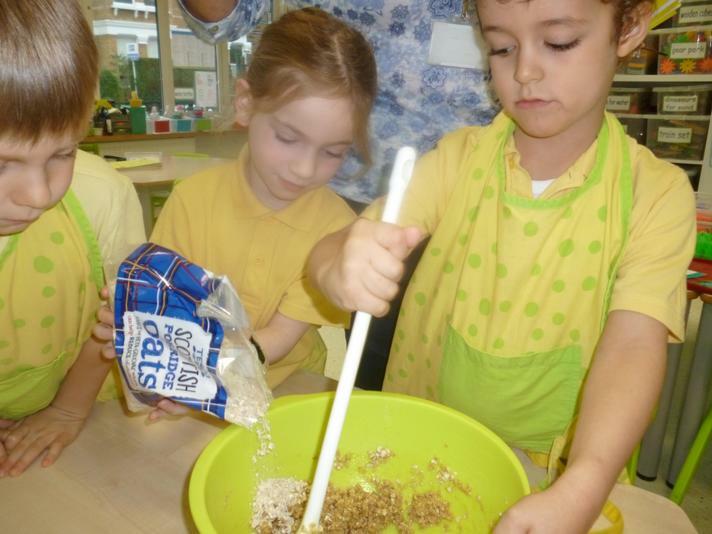 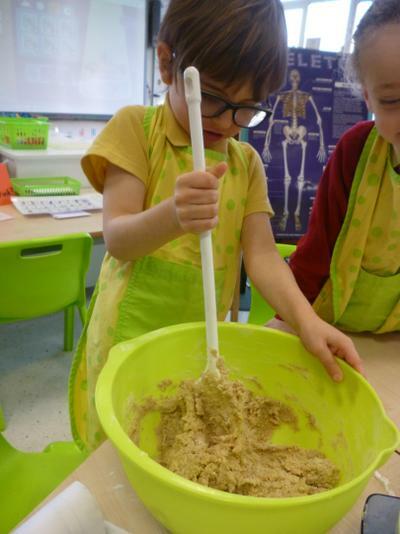 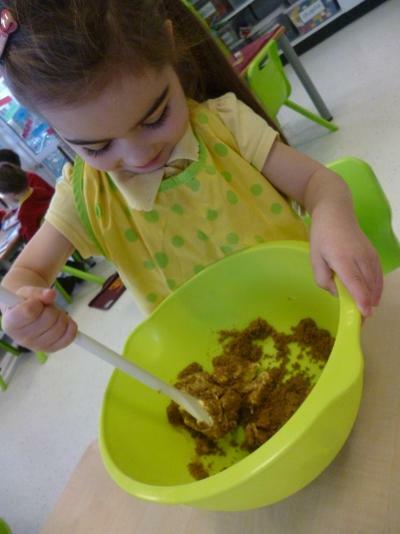 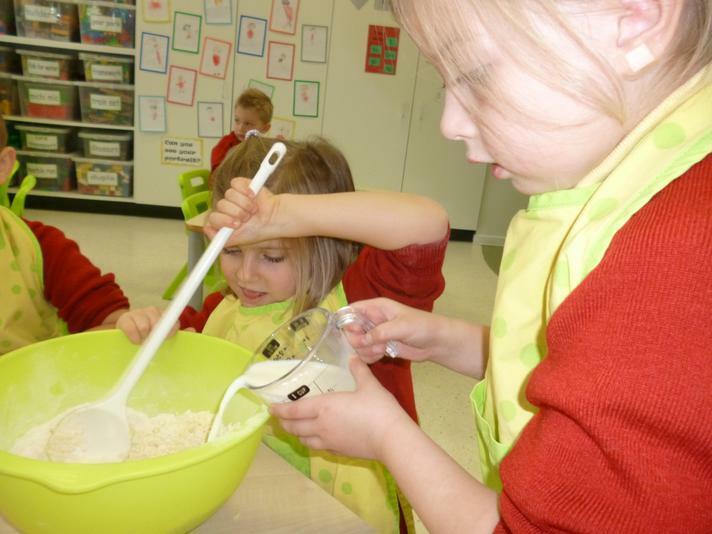 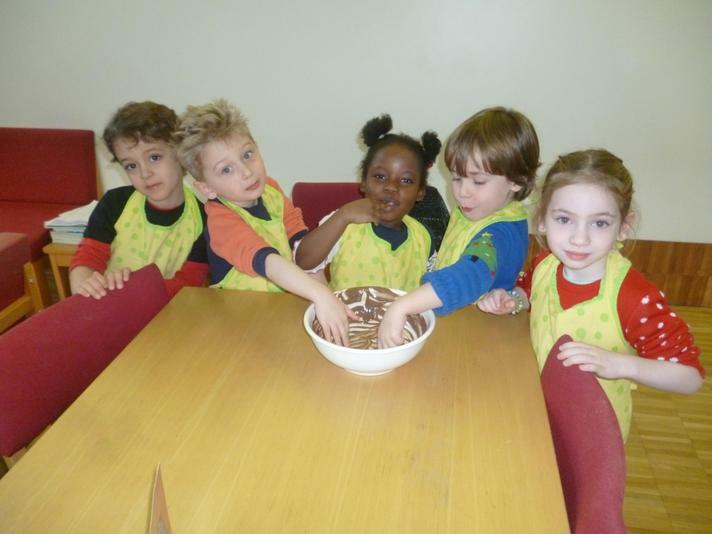 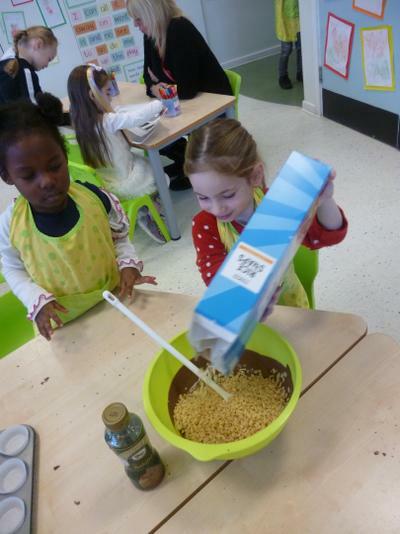 We were busy this morning making chocolate rice crispy cakes for our party. 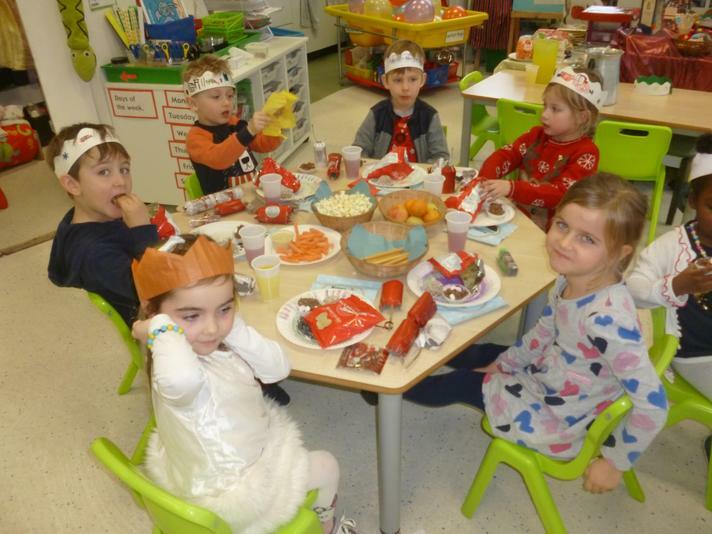 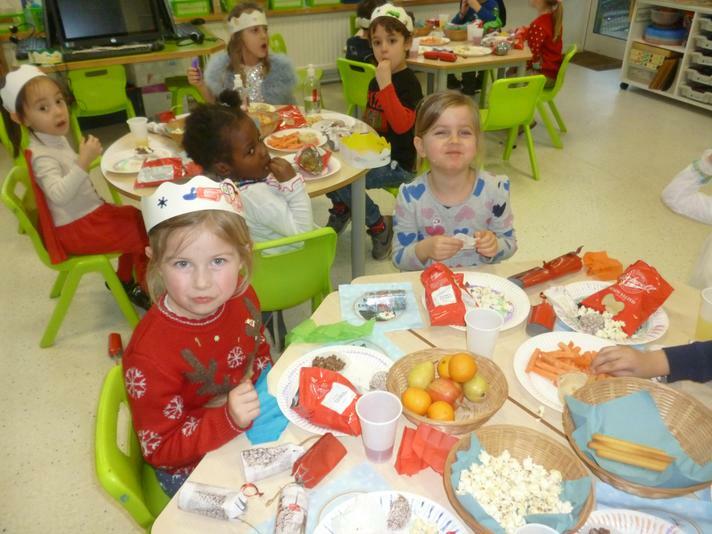 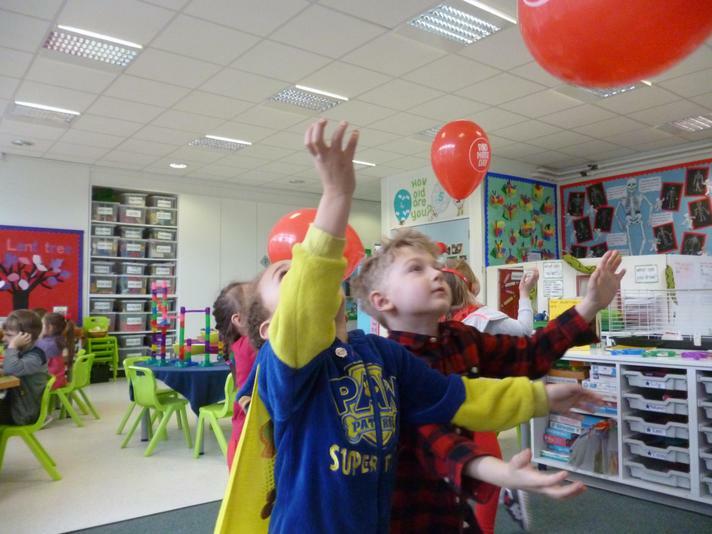 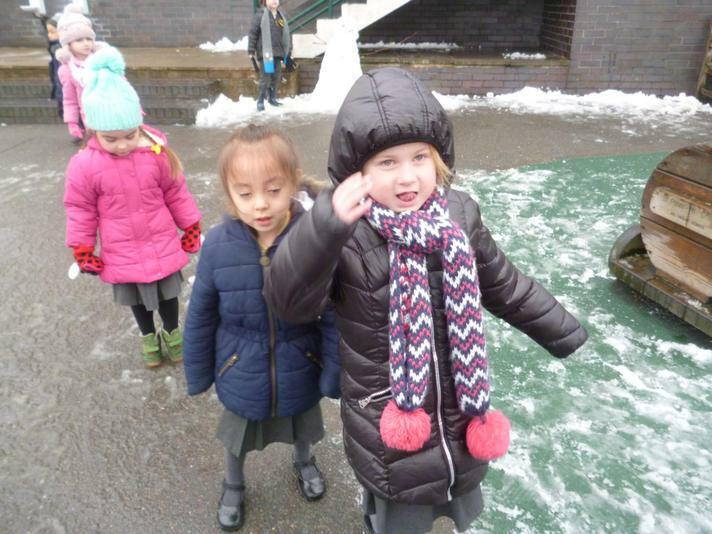 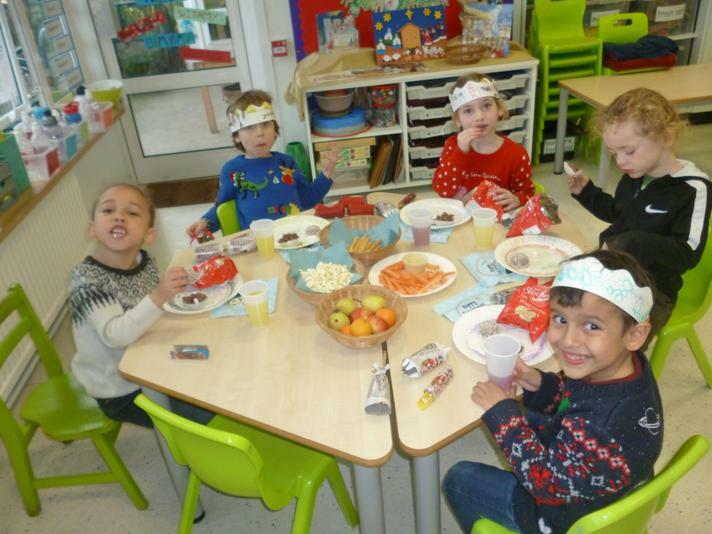 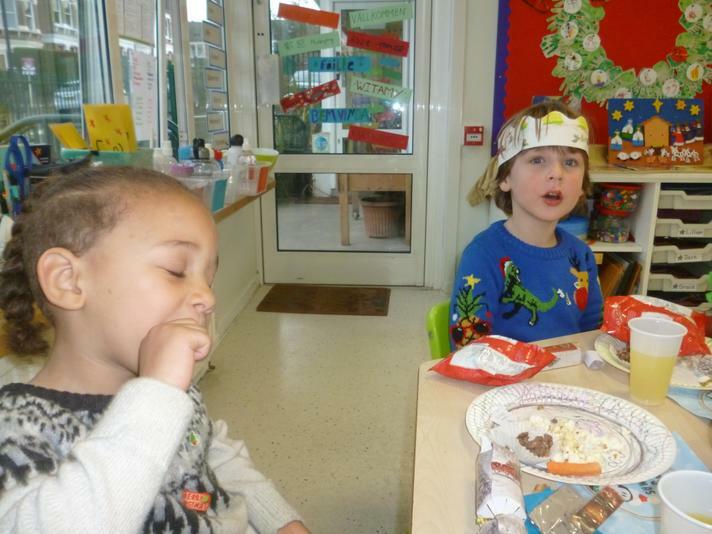 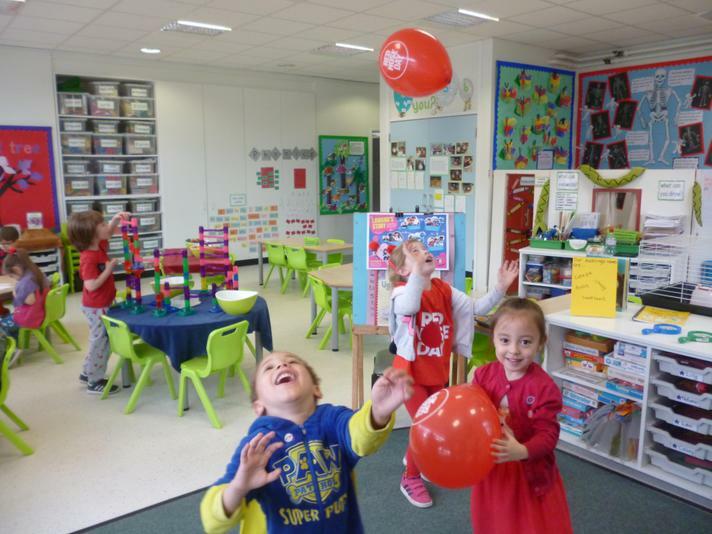 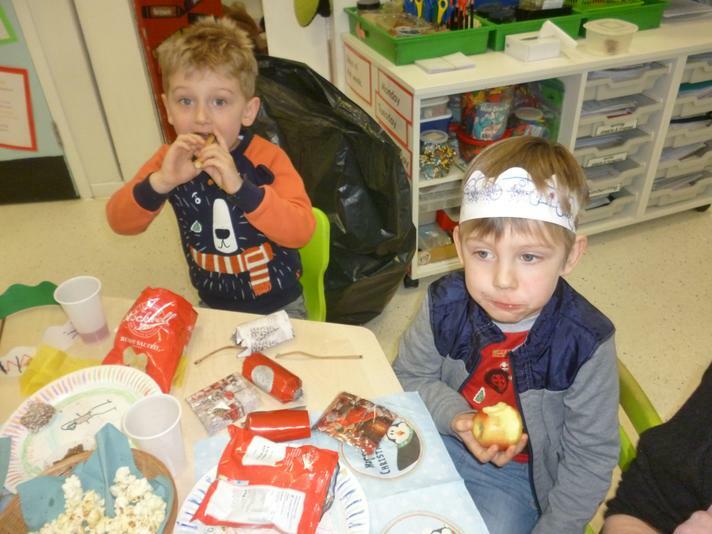 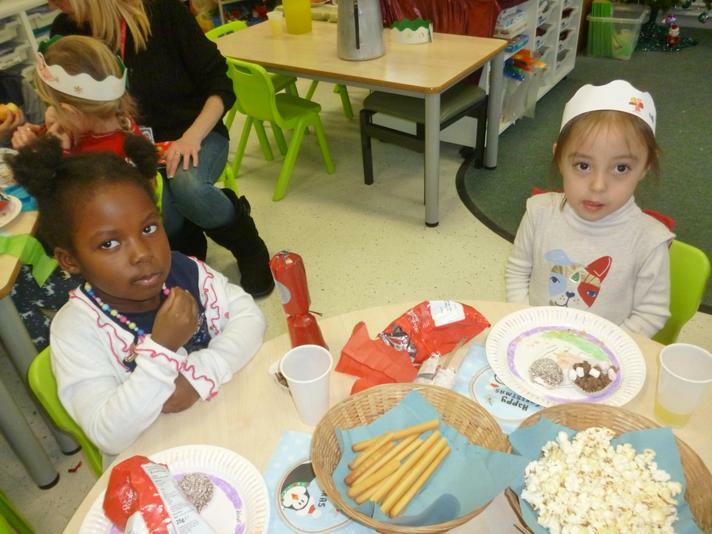 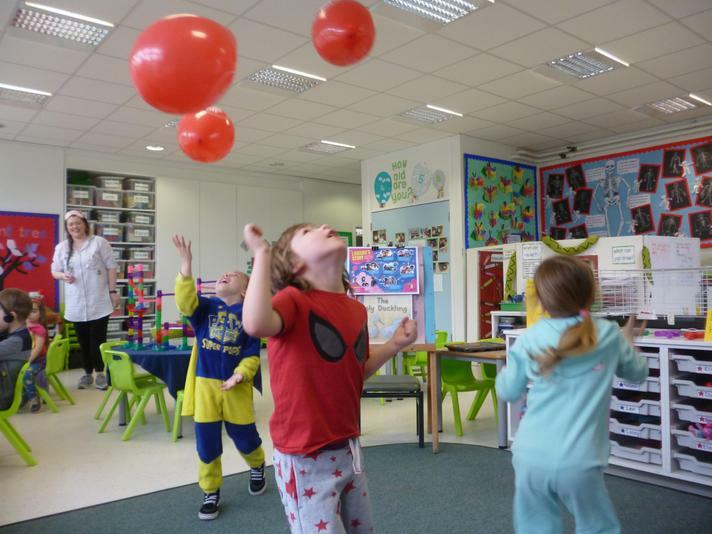 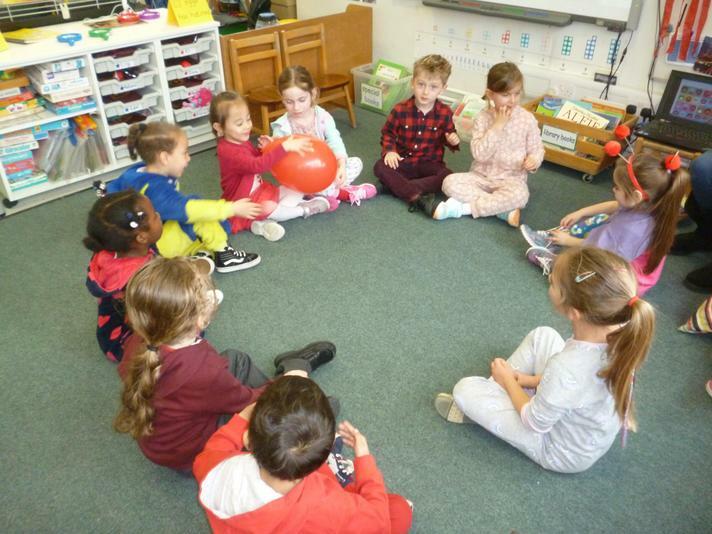 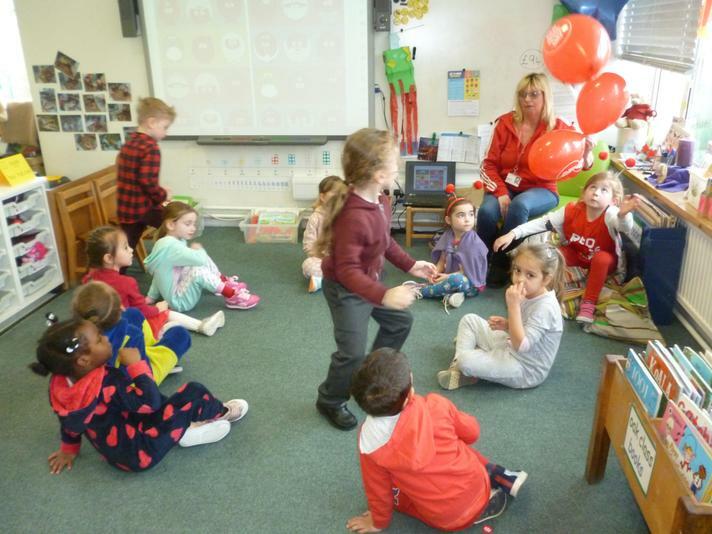 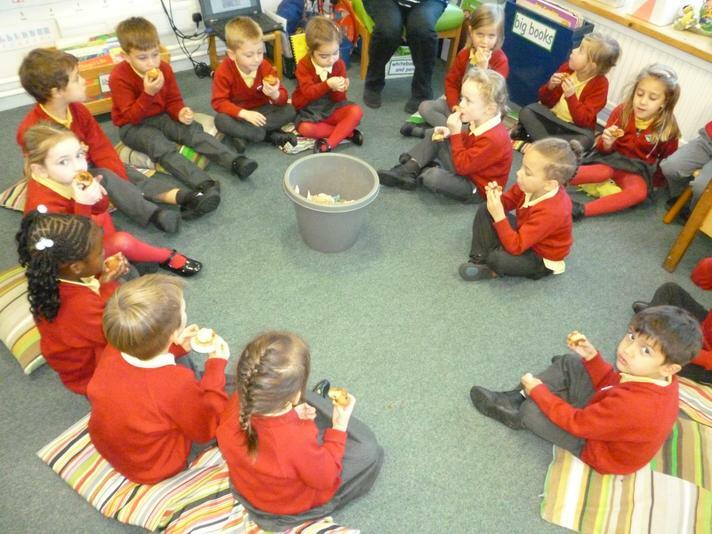 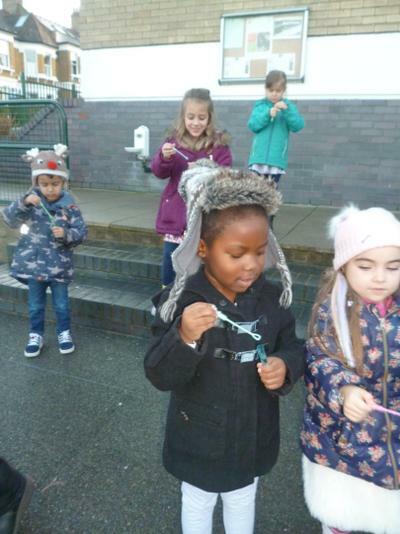 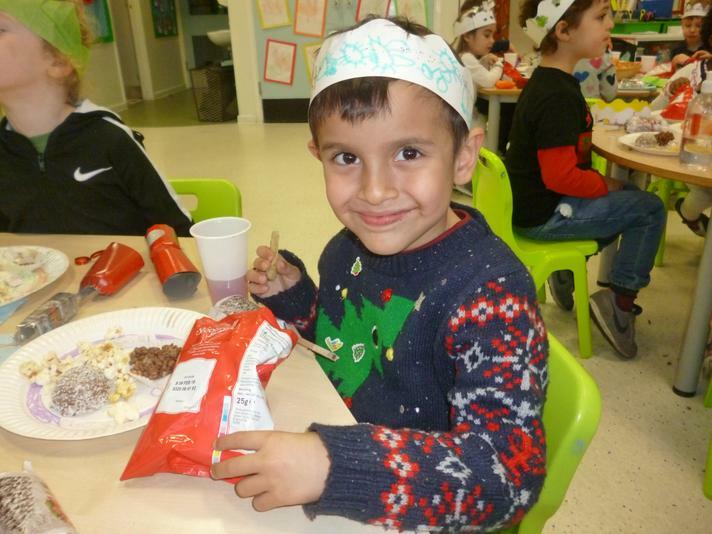 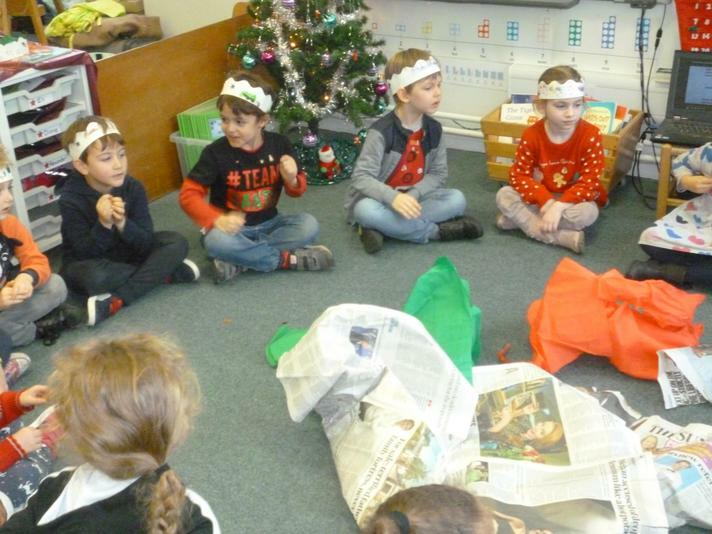 In the afternoon we played games musical statues, keepy uppy balloon, pass the parcel and many more then we ate our lovely party food. 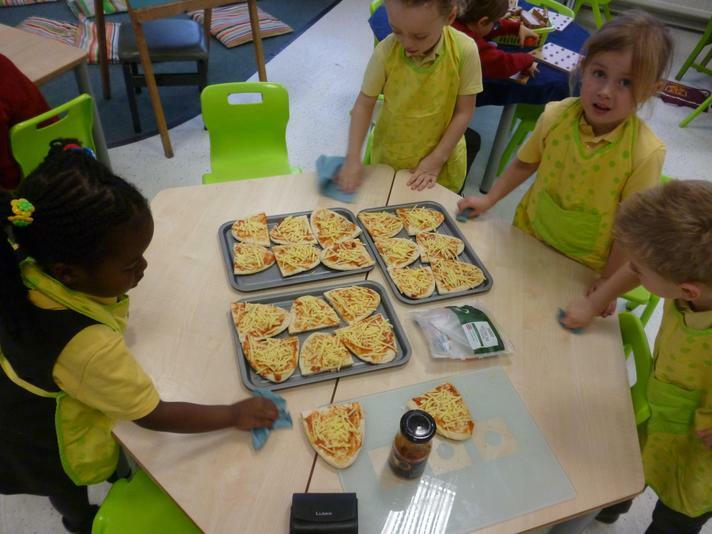 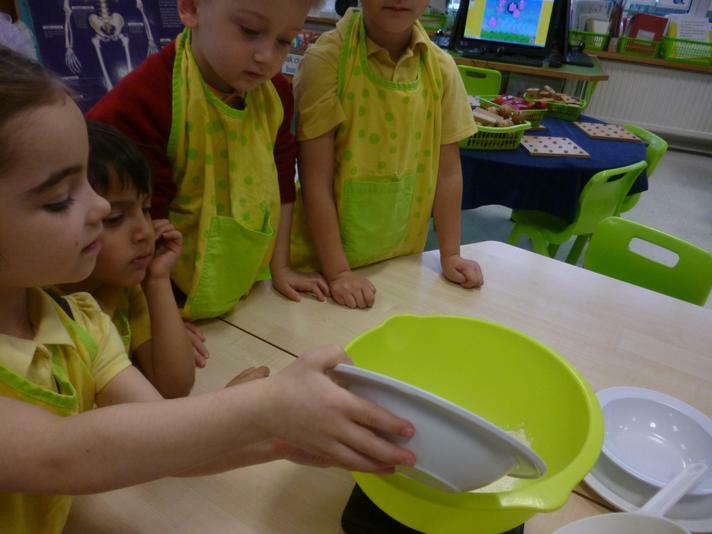 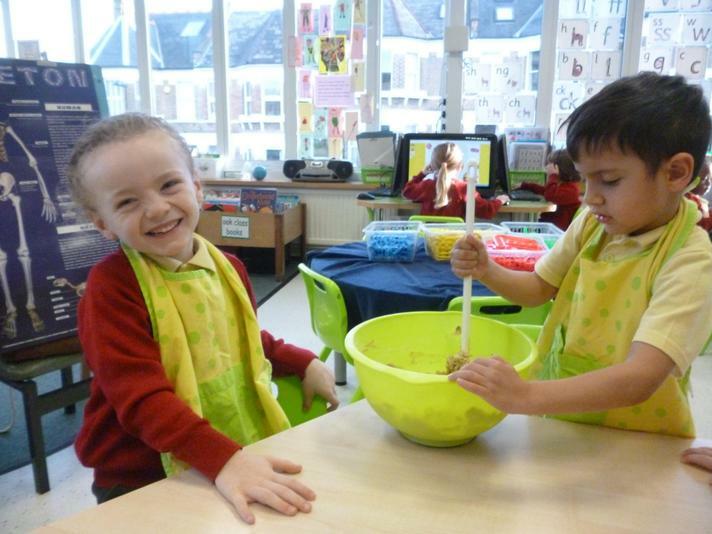 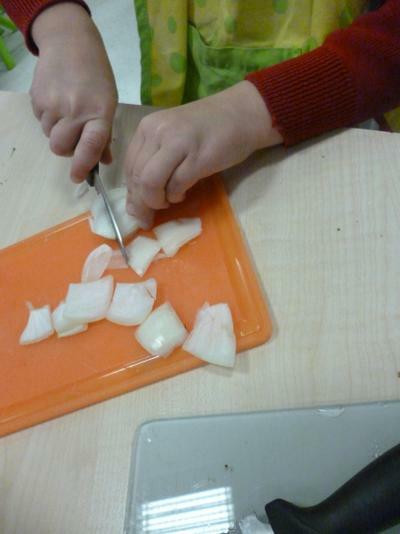 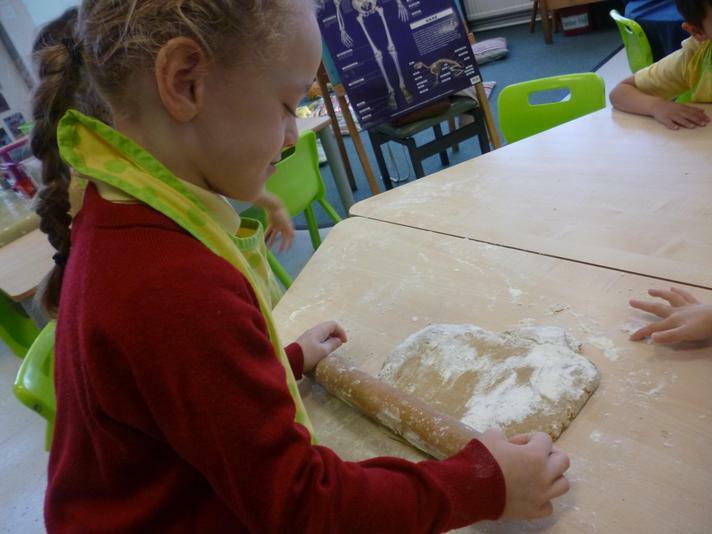 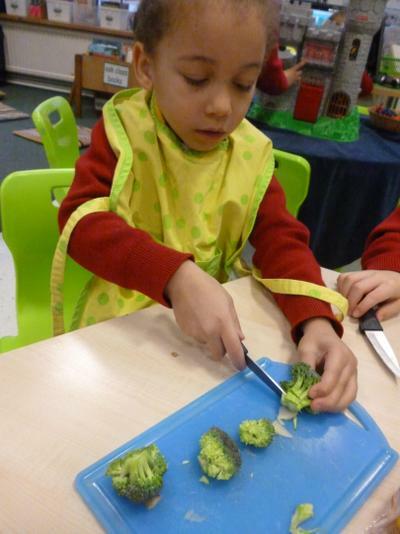 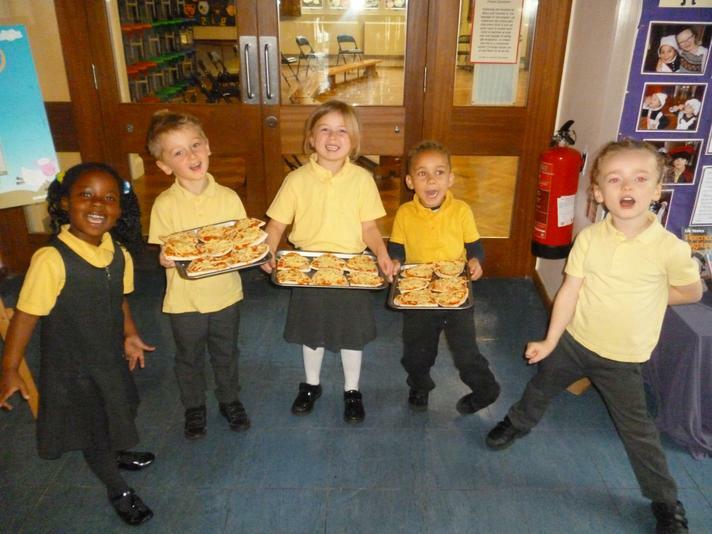 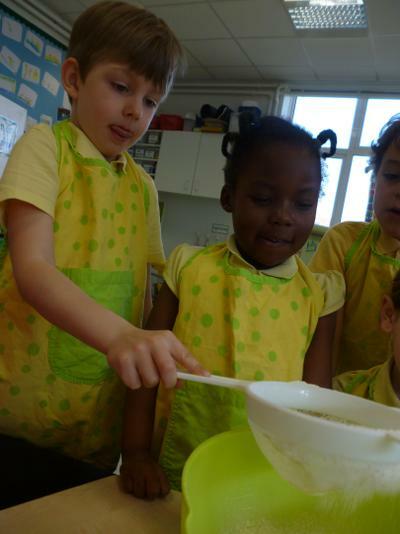 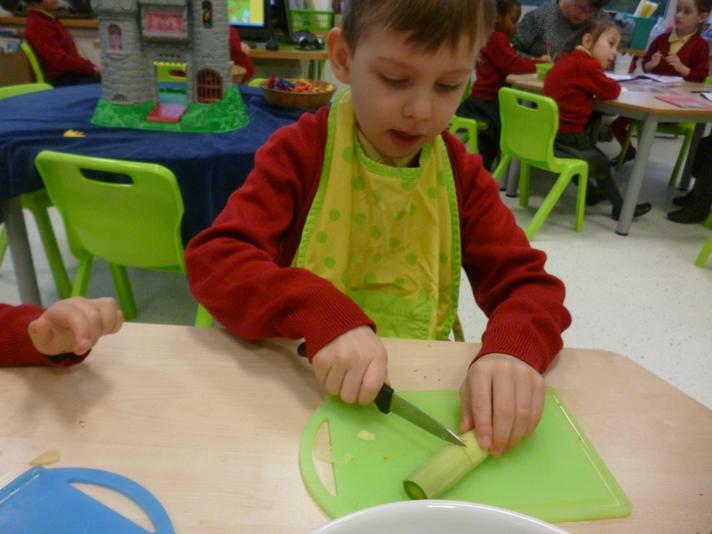 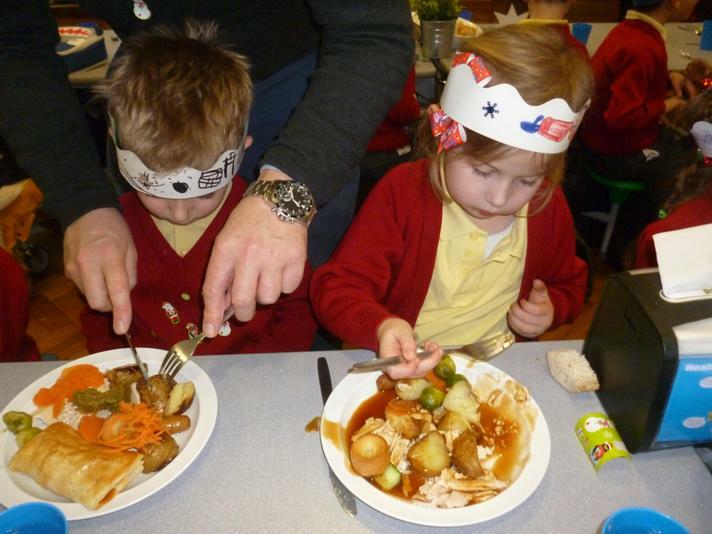 Today our cooks were Nataniel, Lily, Max, Kaien and Eloise. 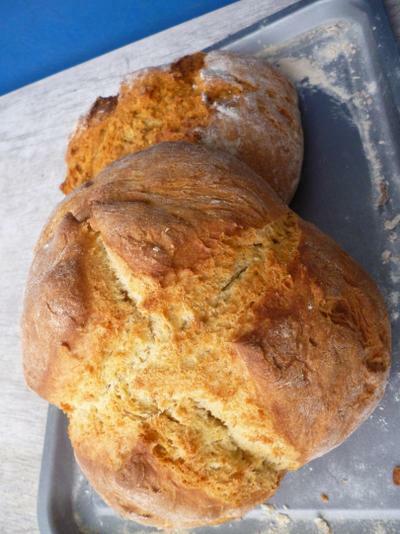 We made Irish Soda bread and it turned out really well. 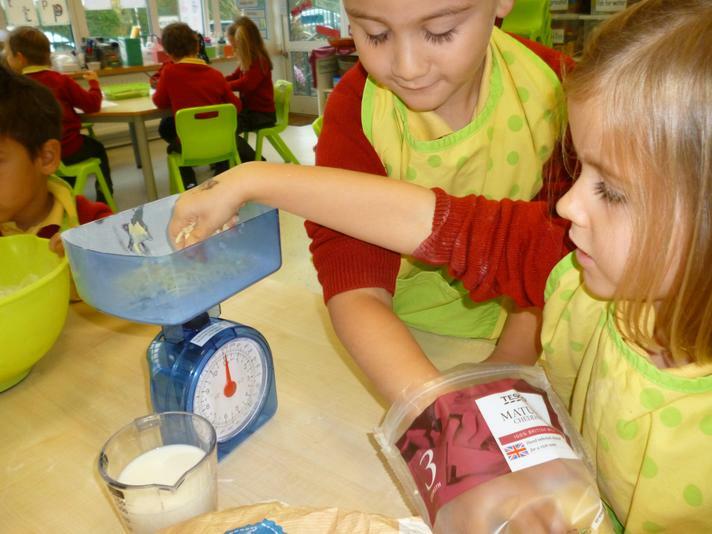 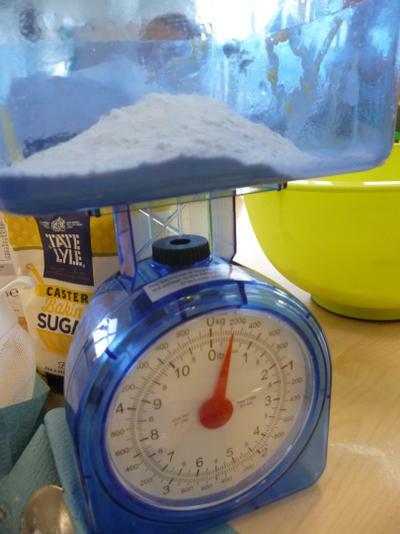 You need 450g Plain flour, 1 tsp salt, 1 tsp bicarbonate of soda, 50g butter, 300ml buttermilk. 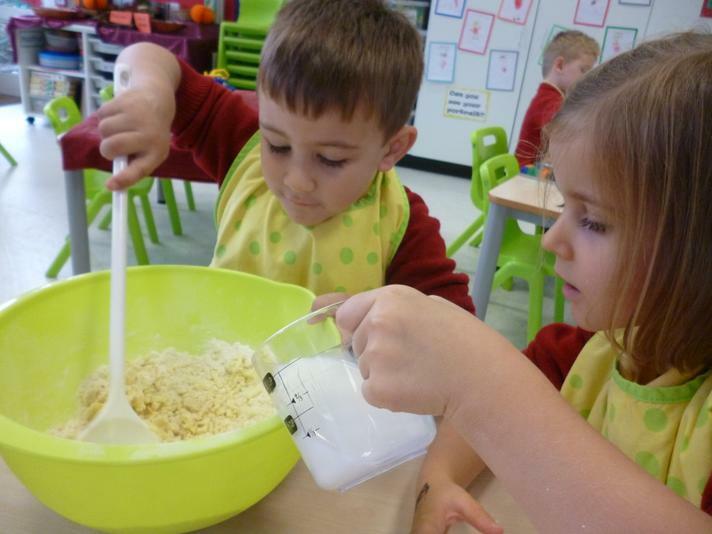 Preheat the oven to 200 degrees C. Sift the flour into a bowl, add the soda and salt then rub in the butter until it is like breadcrumbs. 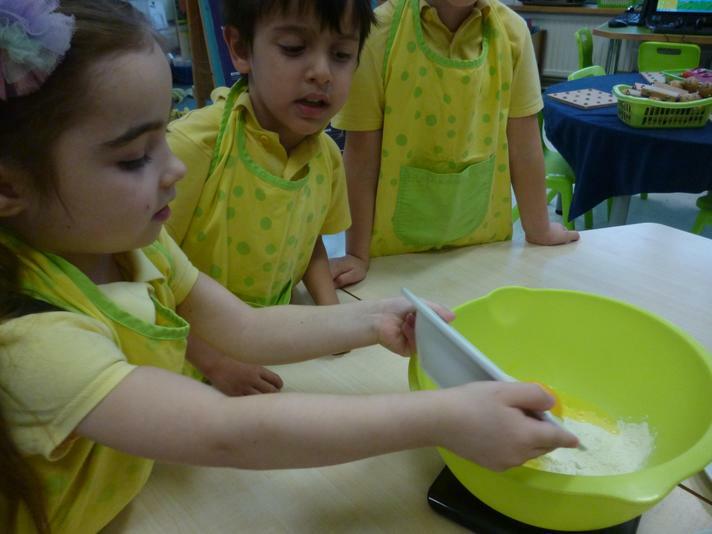 make a well in the middle of the mixture in the bowl and add the buttermilk. 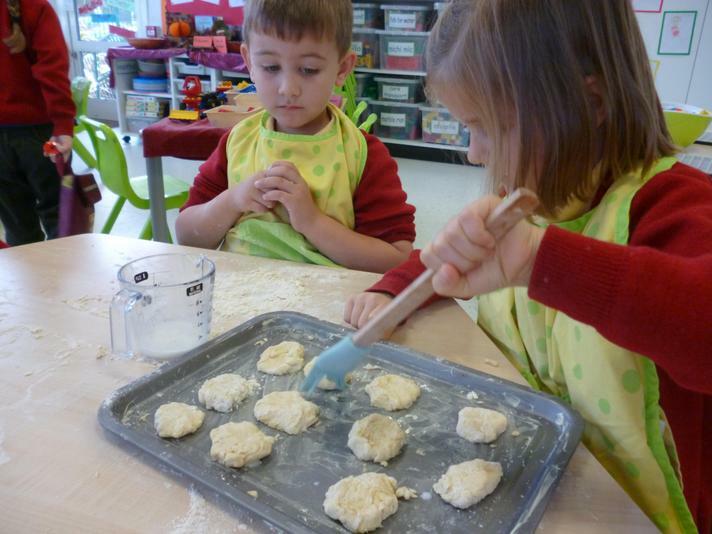 Mix to a scone like consistency then turn out the dough onto a floured surface and knead lightly. 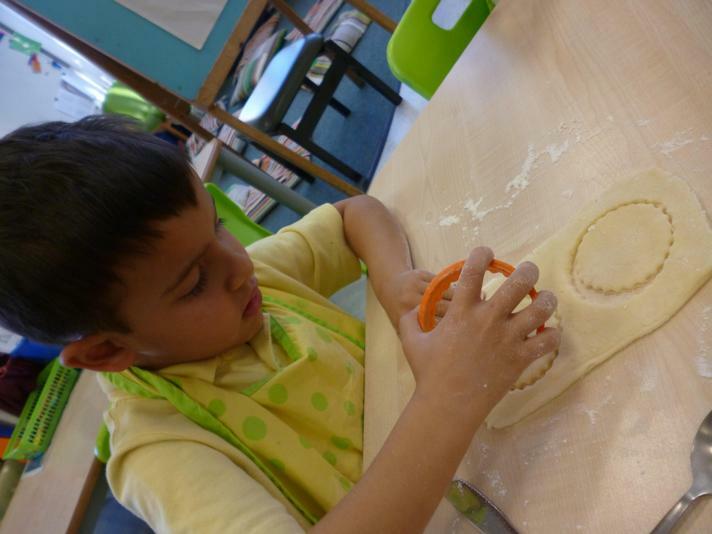 Shape into a round loaf and make a cut in a cross shape in the top. 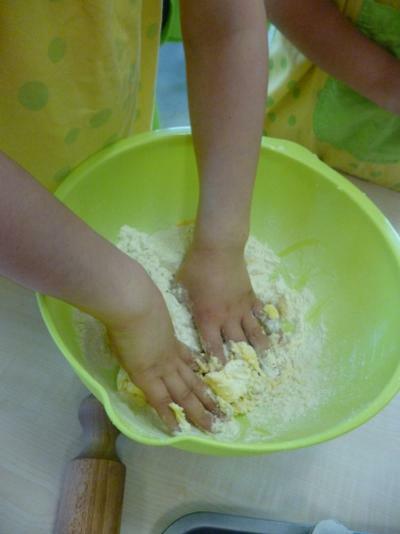 Place on a floured baking tray and cook for 30 minutes or until well risen and brown. 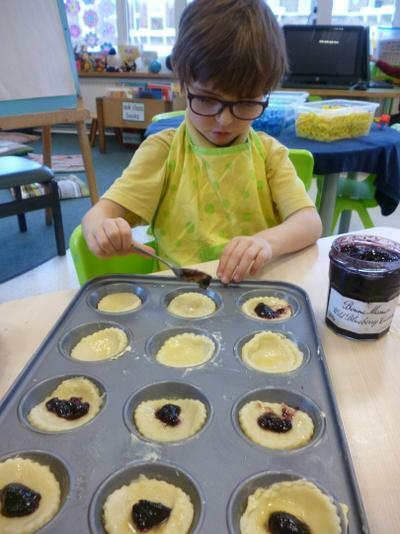 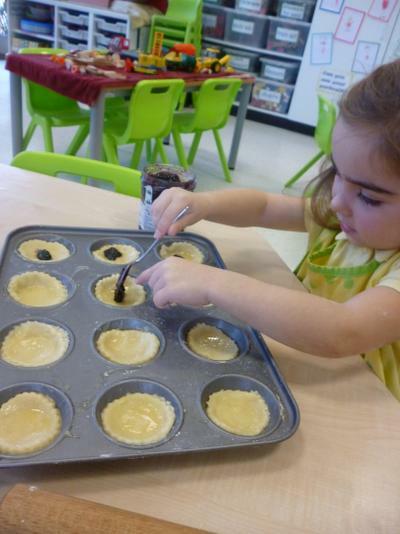 Today we made blueberry jam tarts. 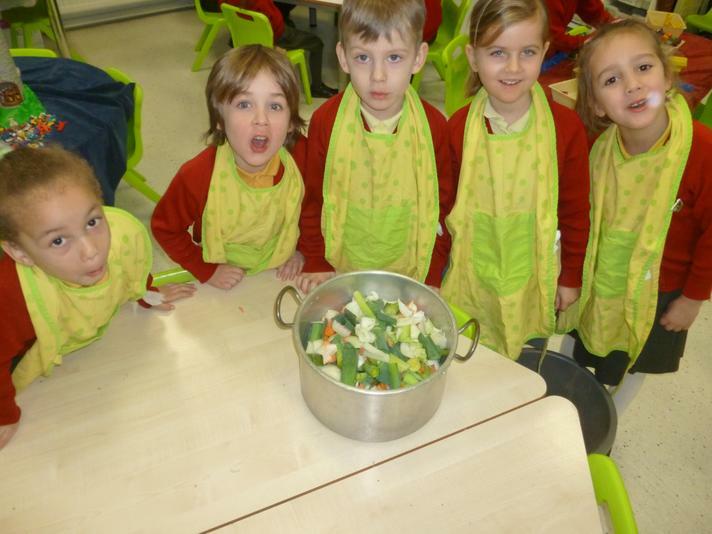 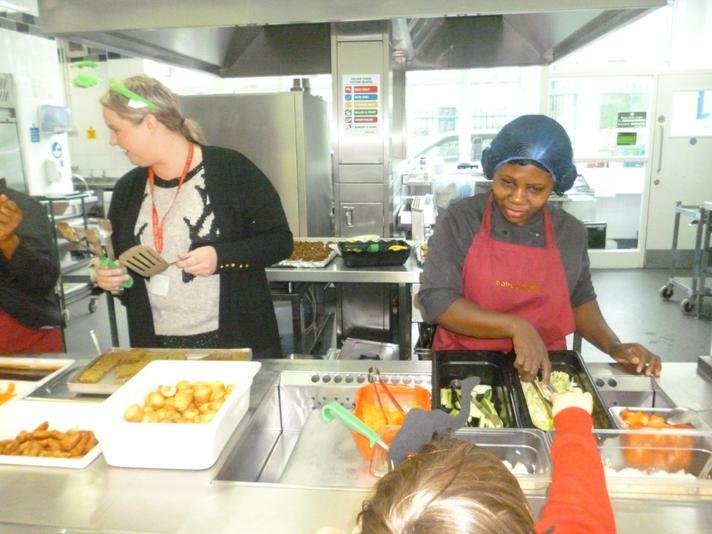 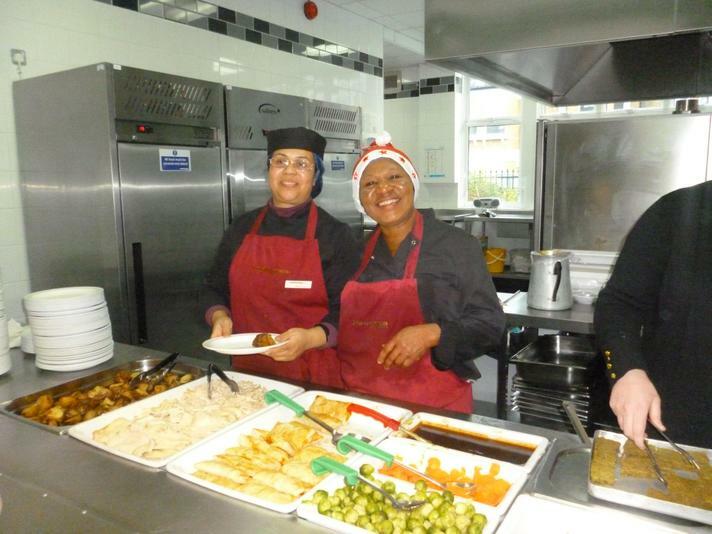 Our cooks were Mia, Iacopo, Lillian, Oli and Grace. 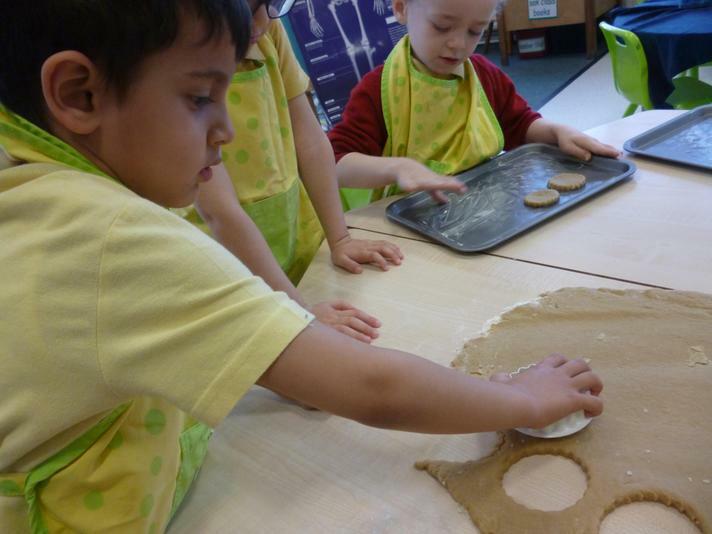 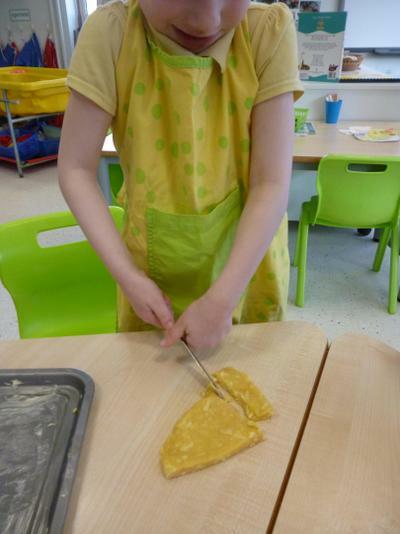 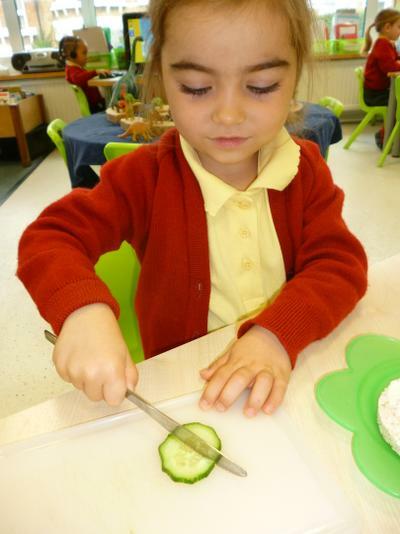 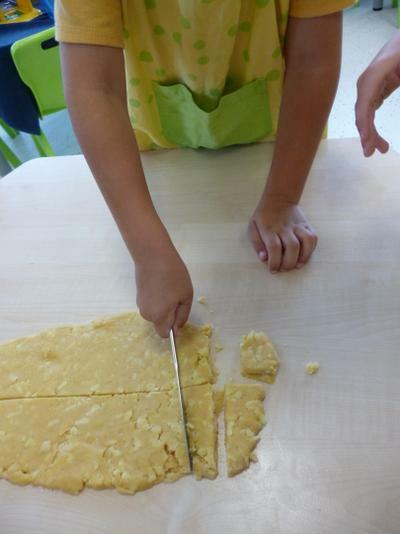 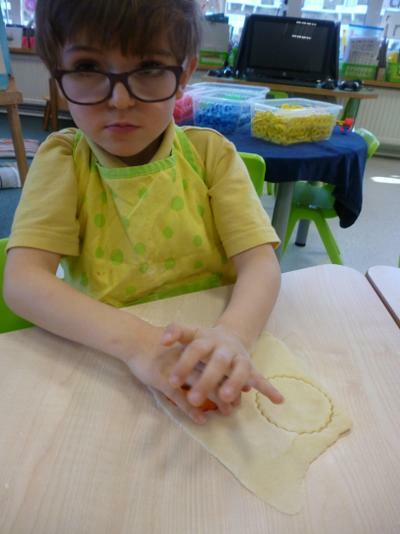 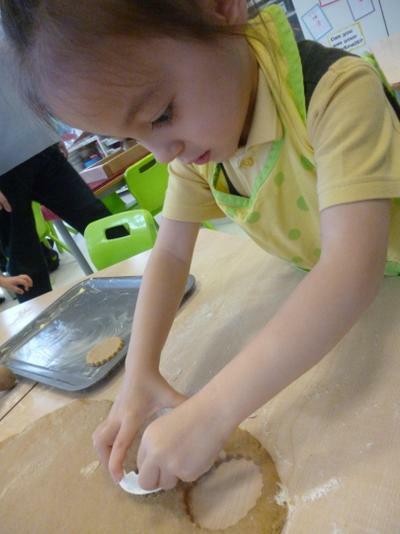 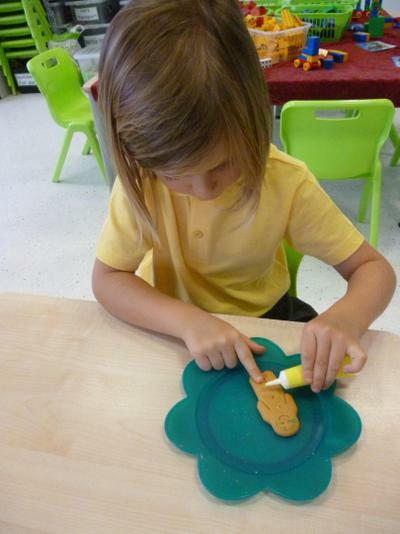 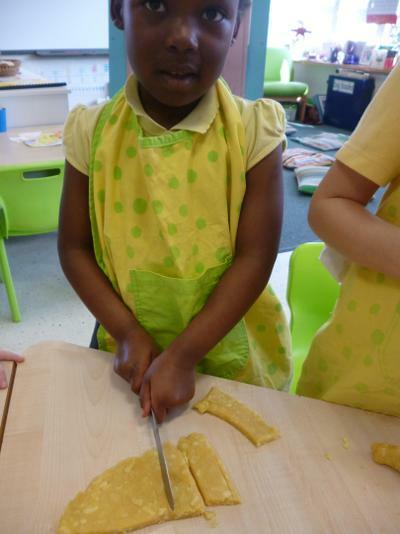 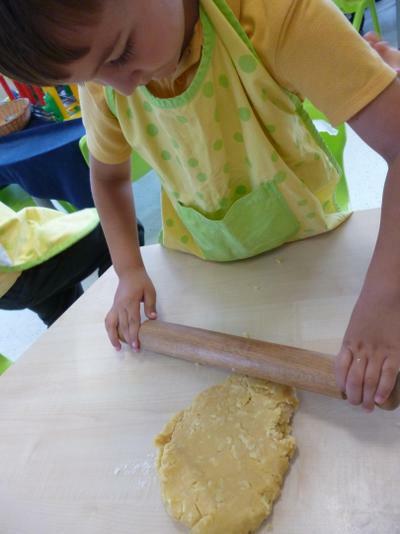 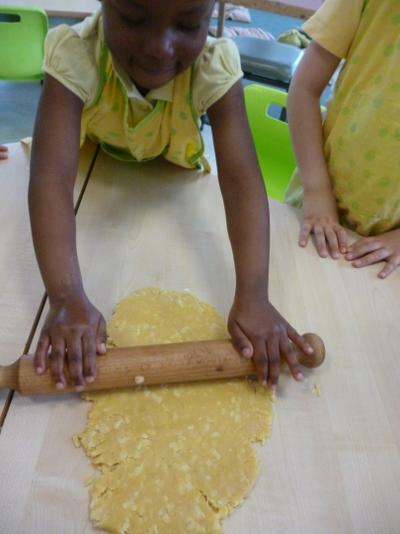 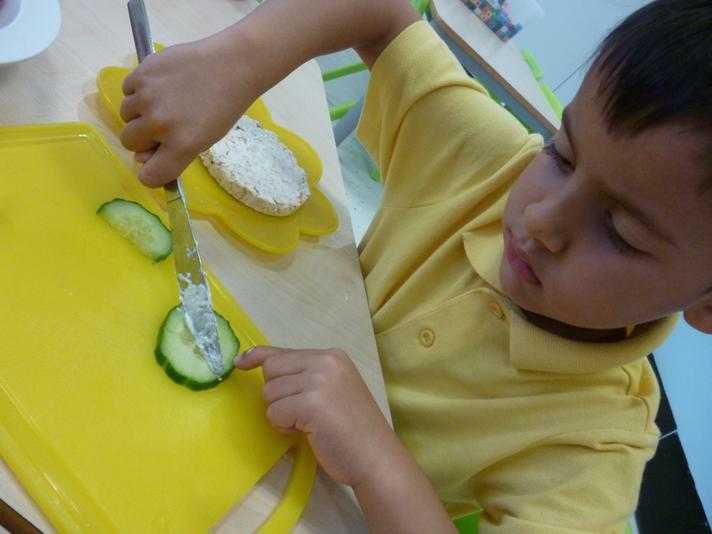 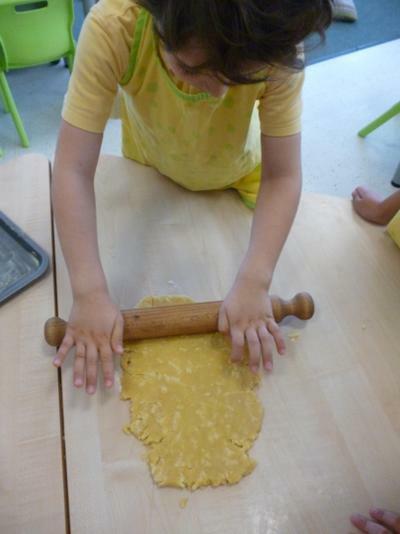 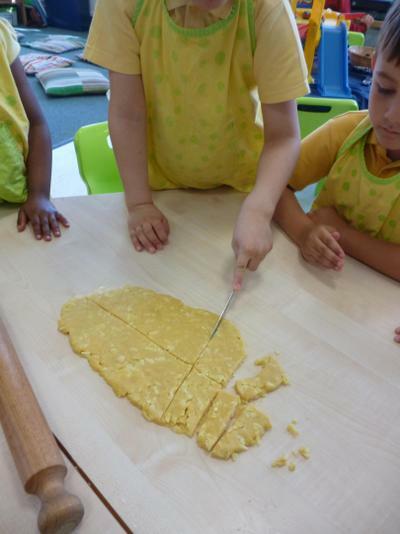 First we rolled out our pastry and cut out tart shapes with a cutter. 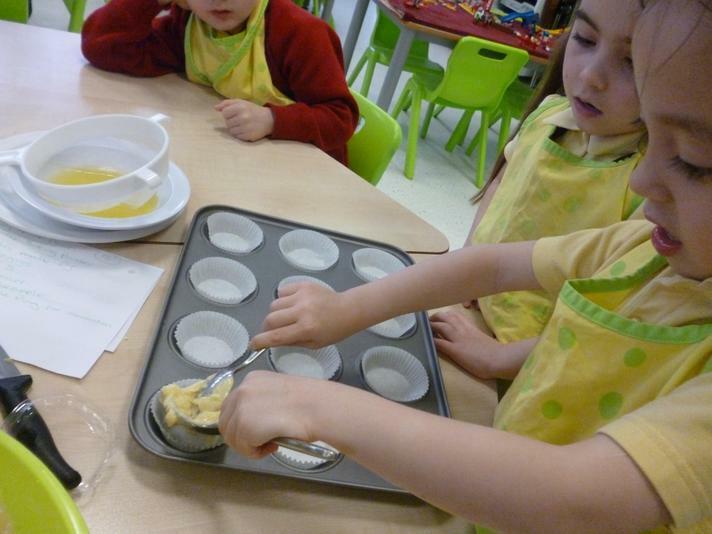 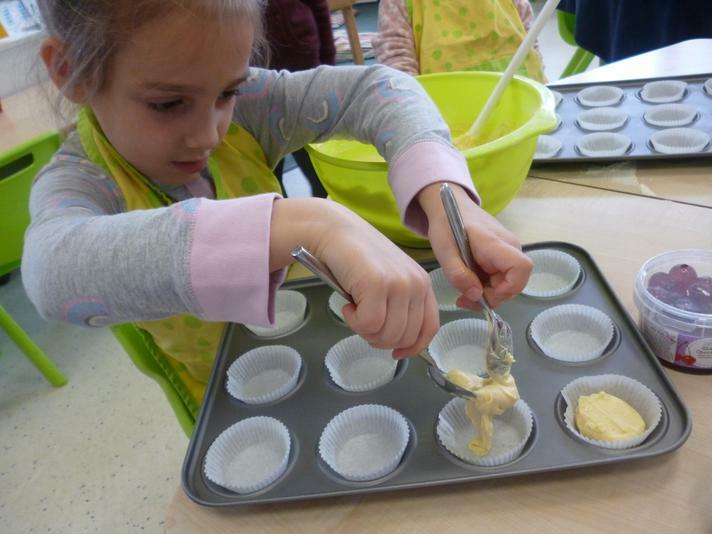 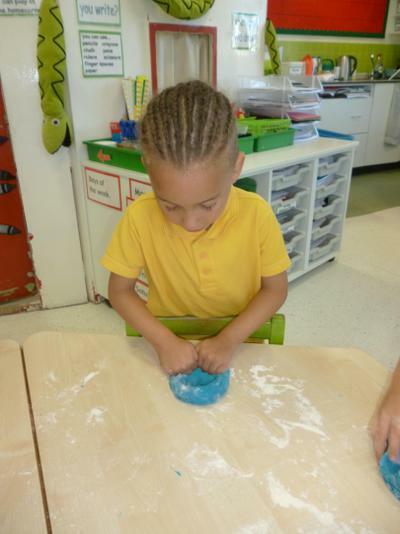 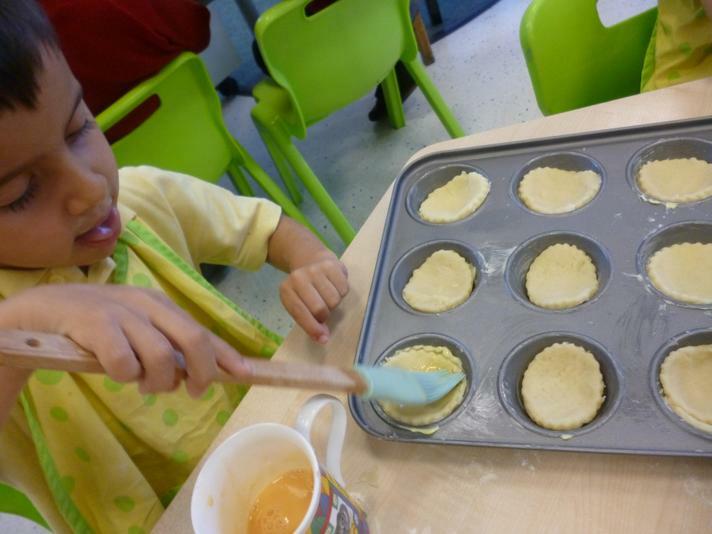 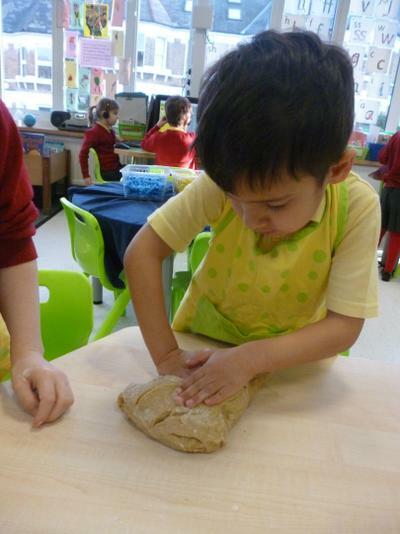 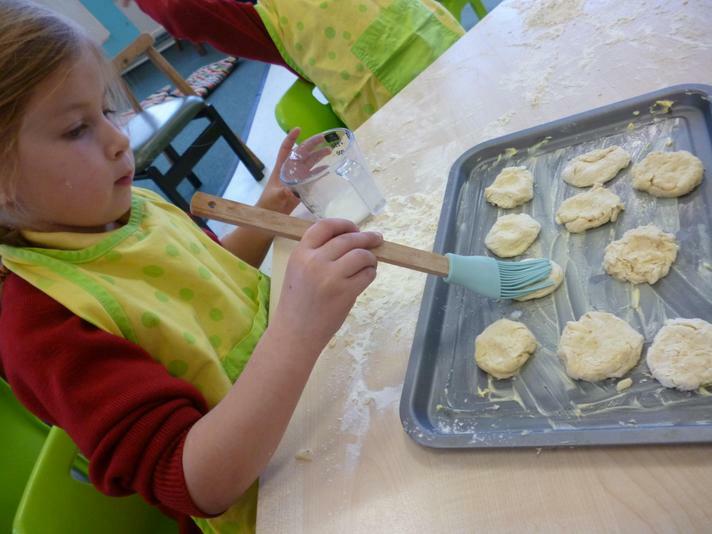 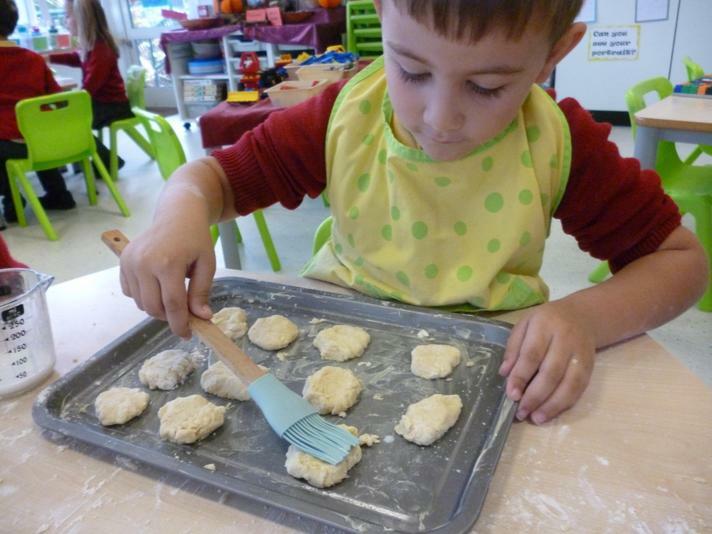 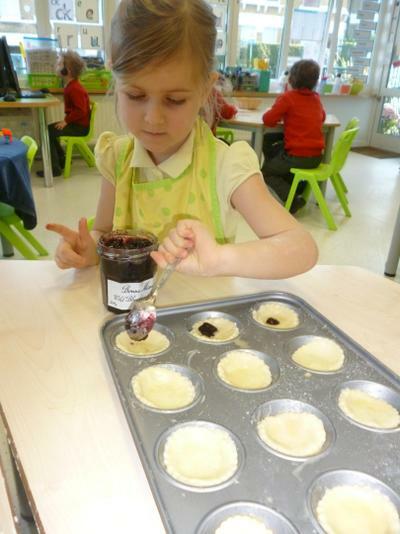 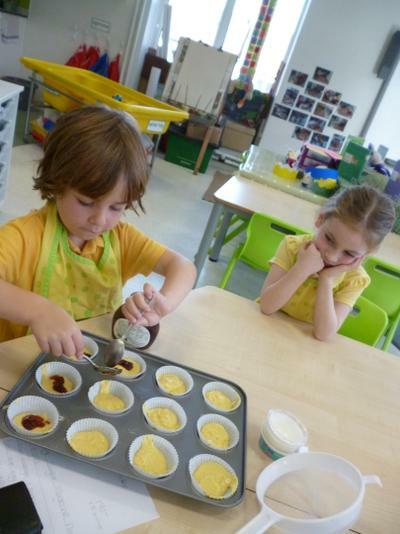 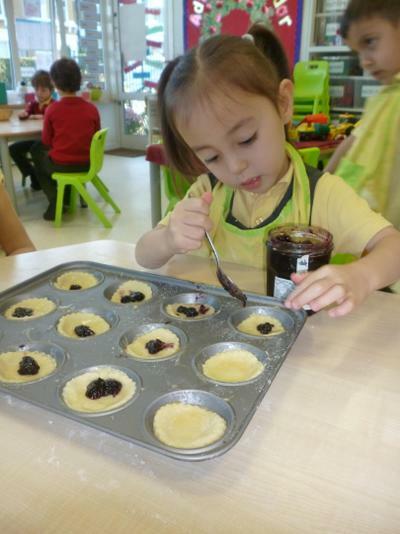 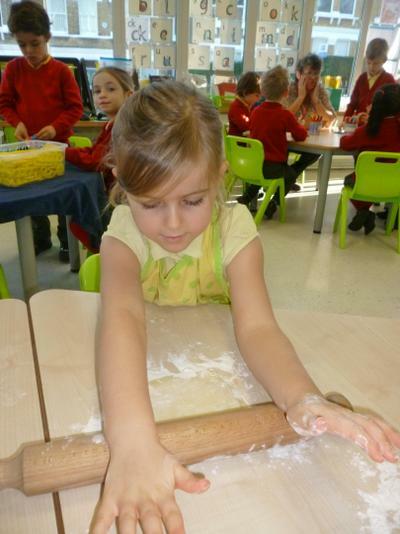 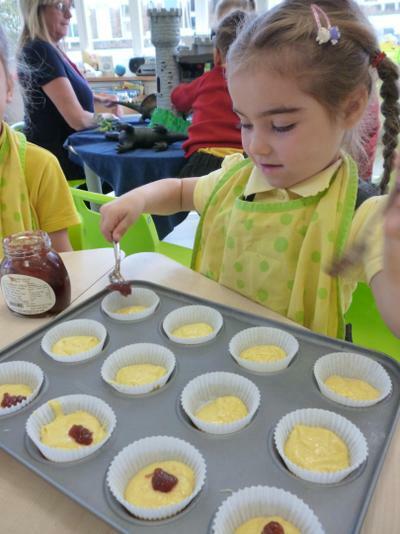 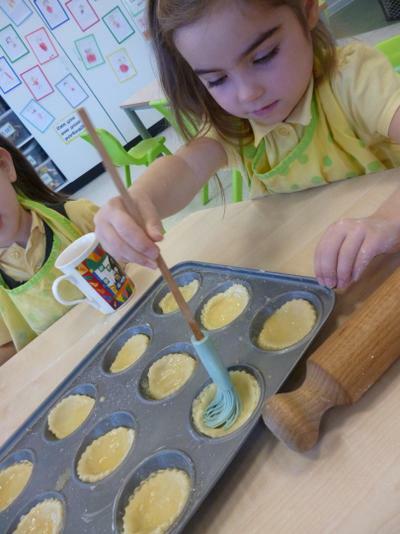 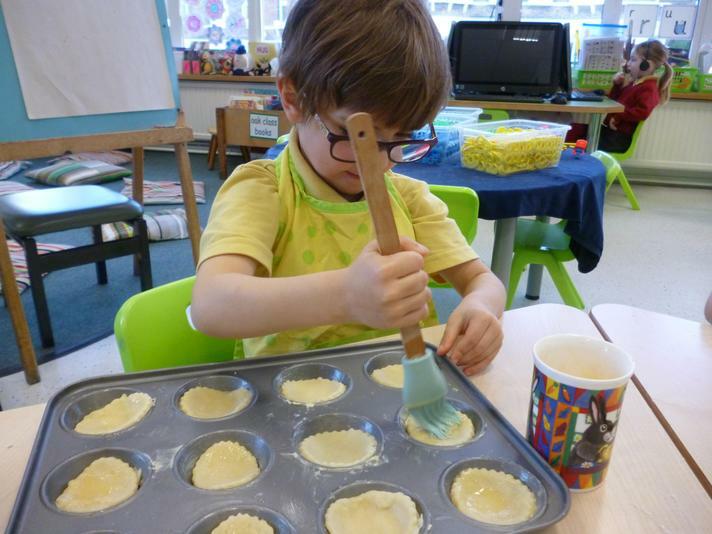 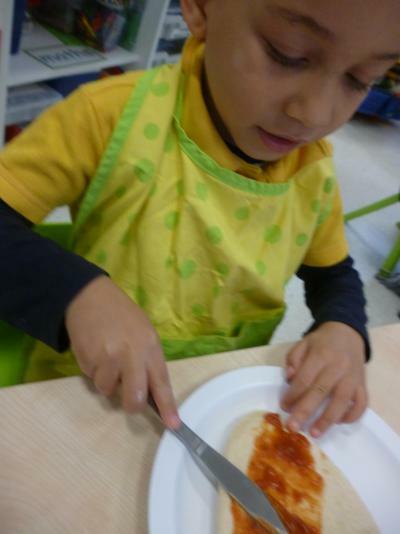 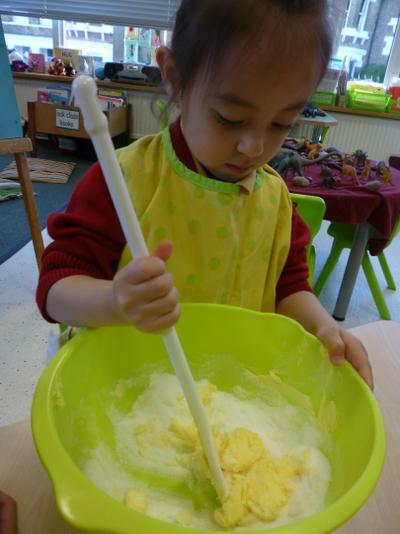 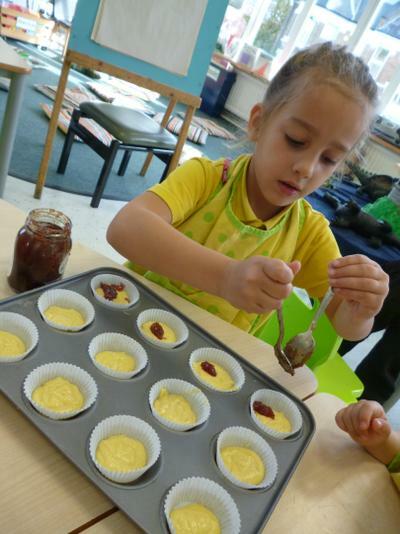 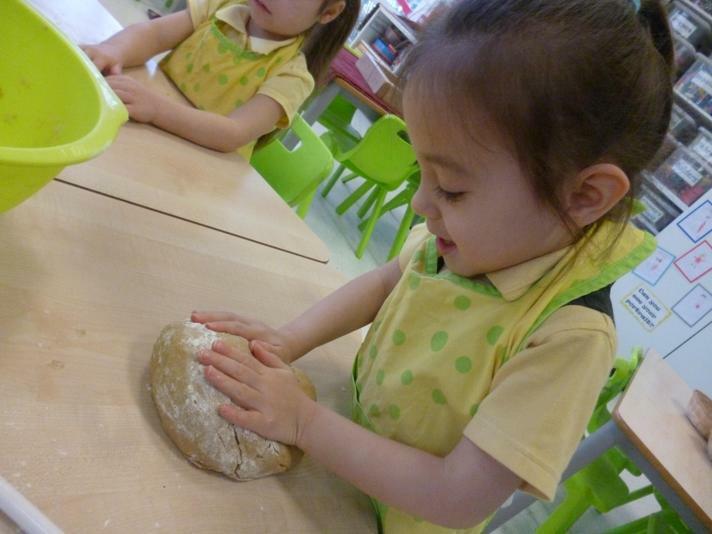 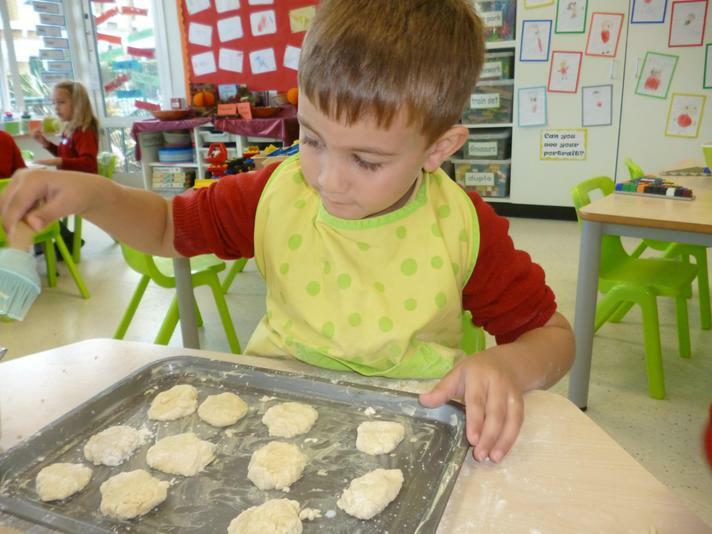 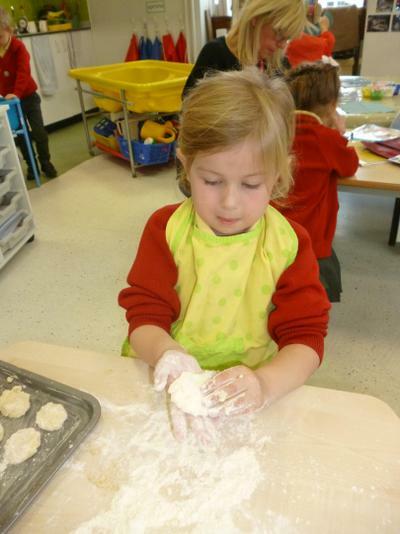 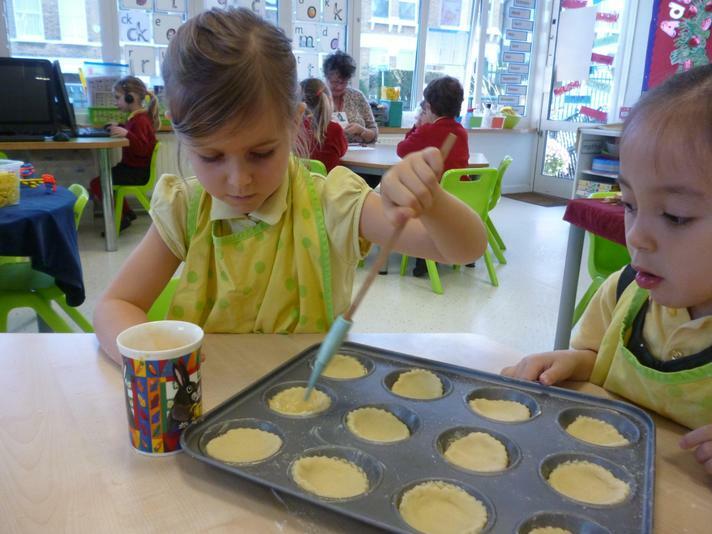 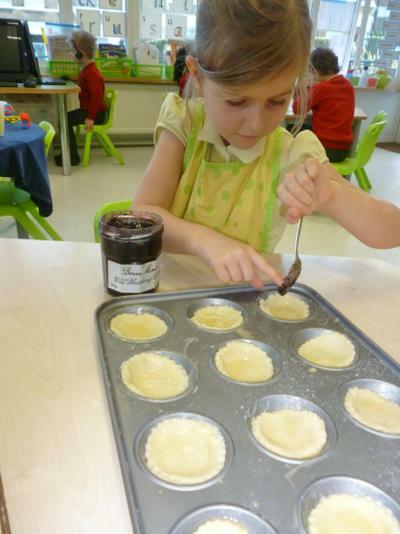 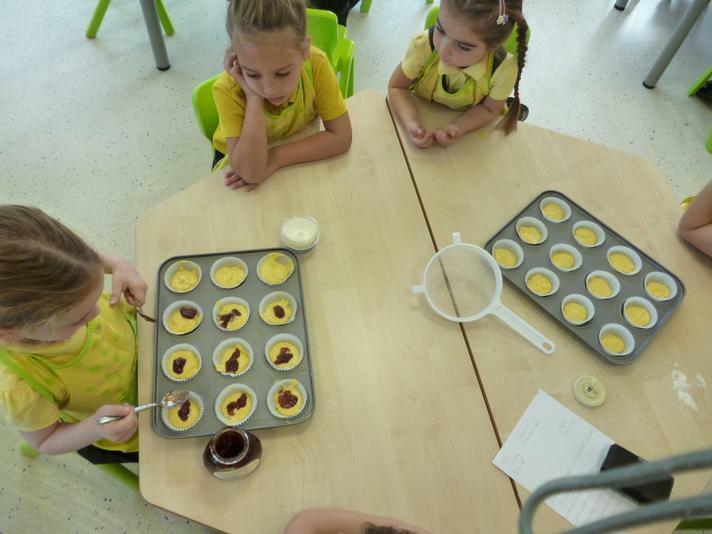 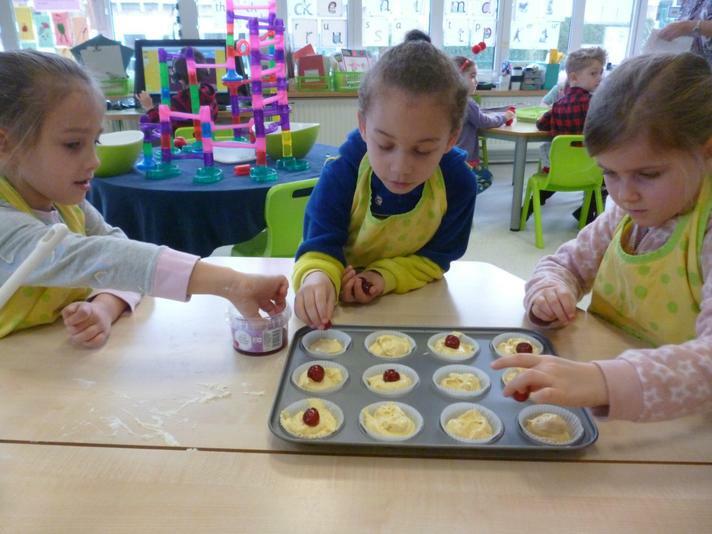 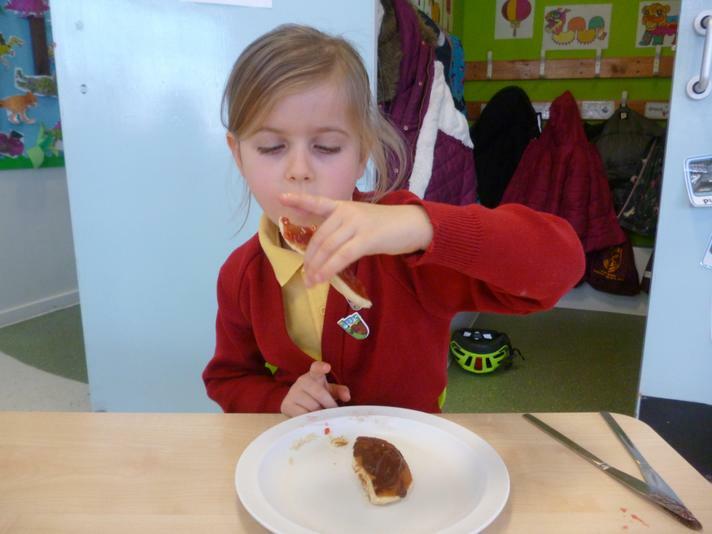 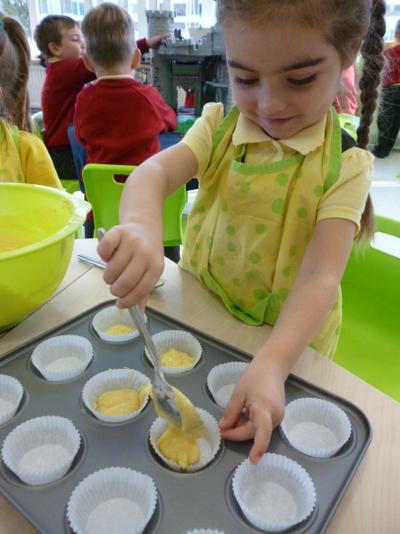 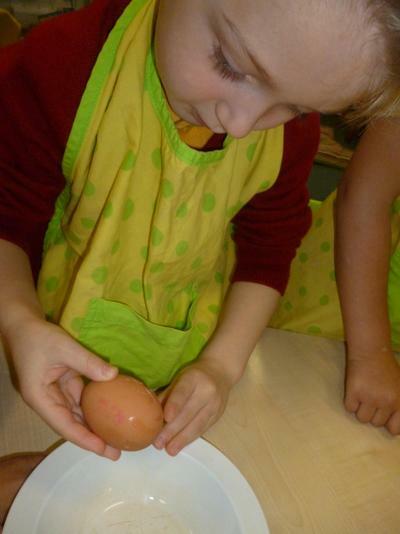 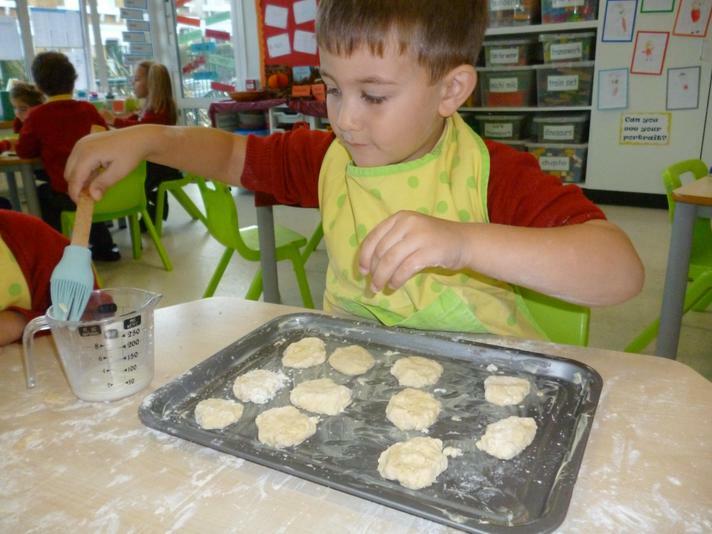 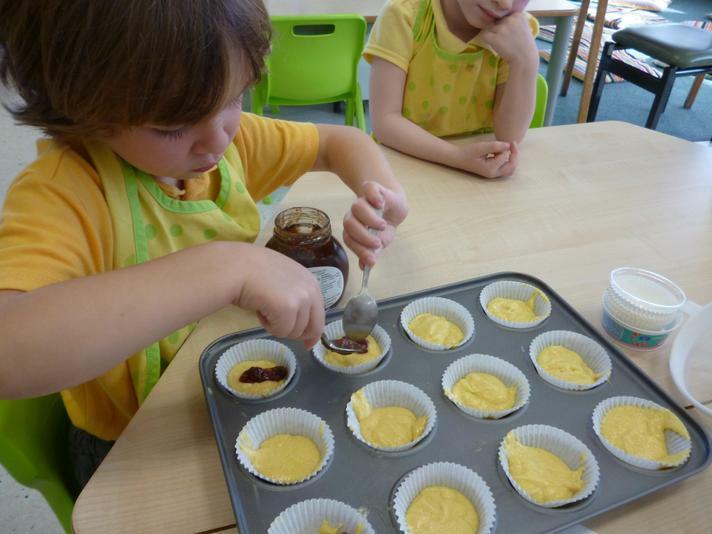 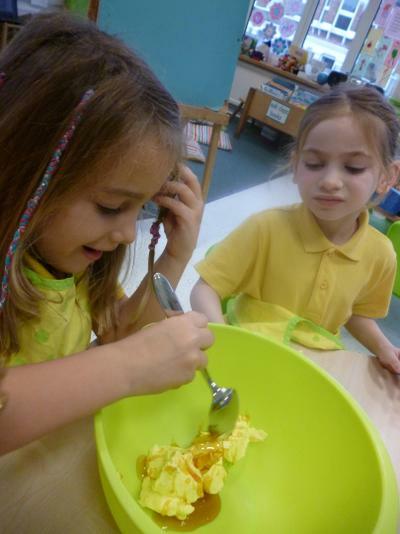 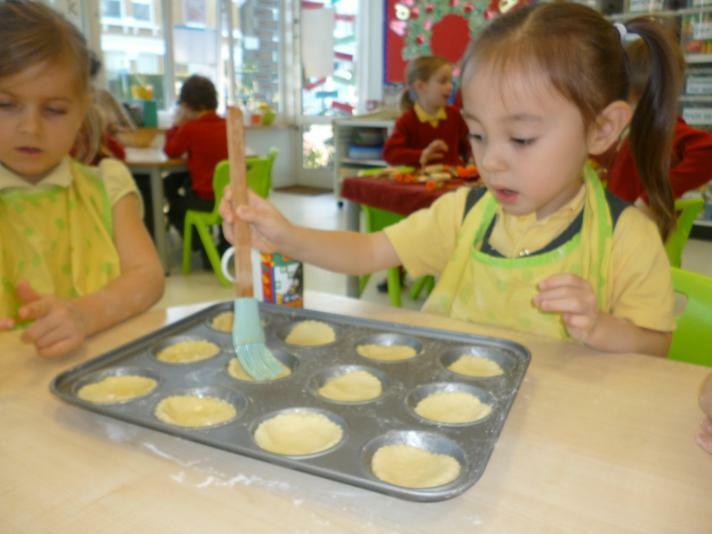 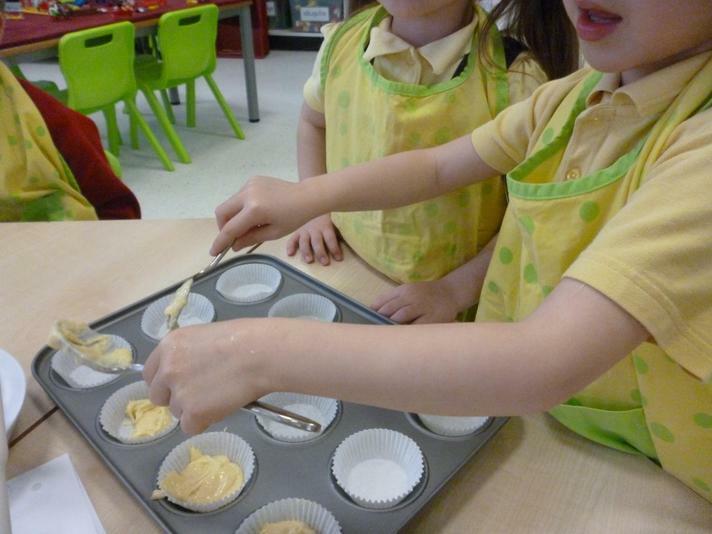 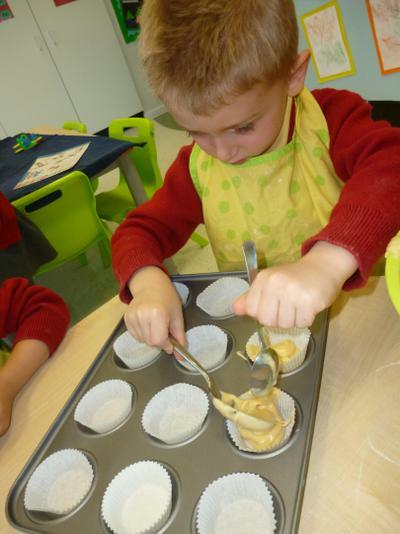 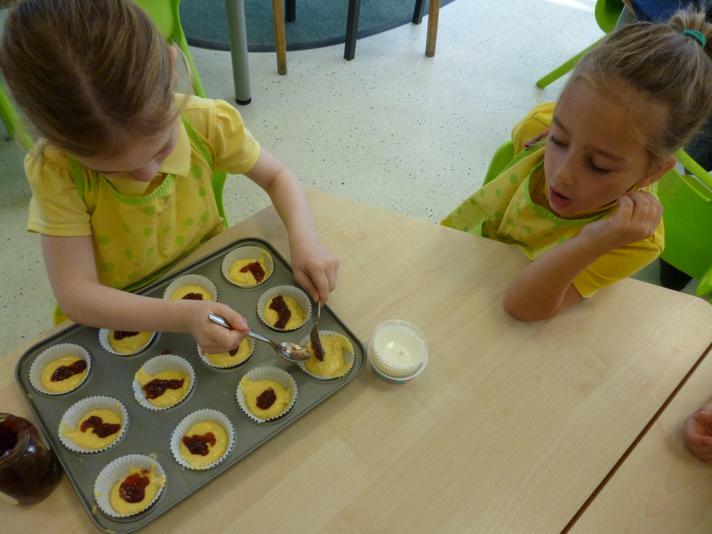 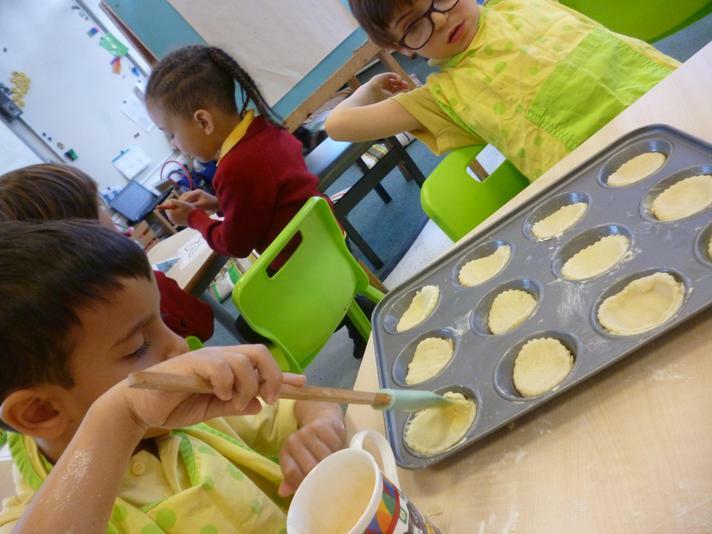 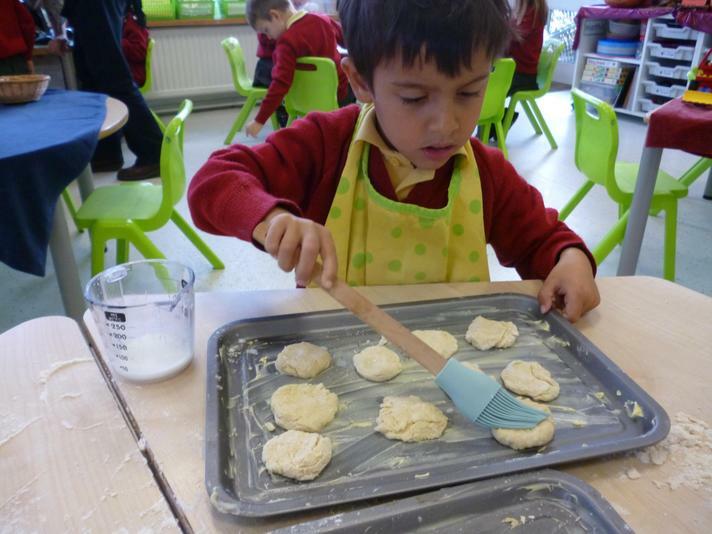 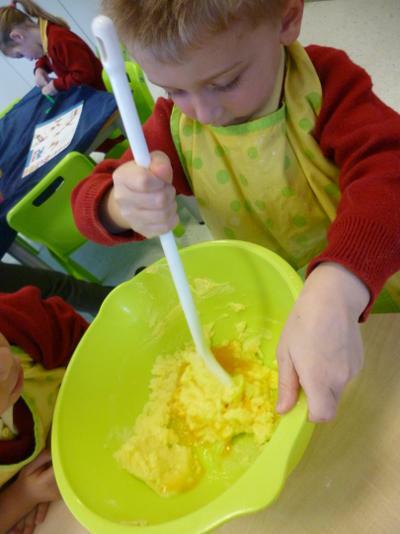 Then we washed the pastry with egg and put a spoonful of jam into each one. 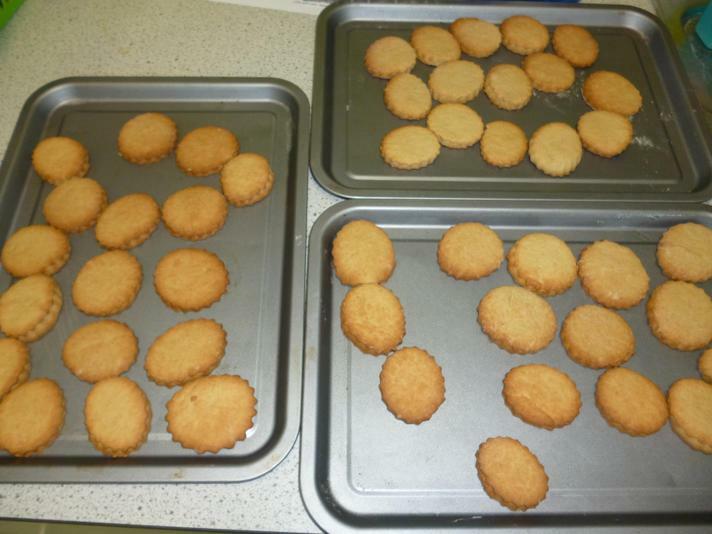 Then off to the oven...Yum Yum! 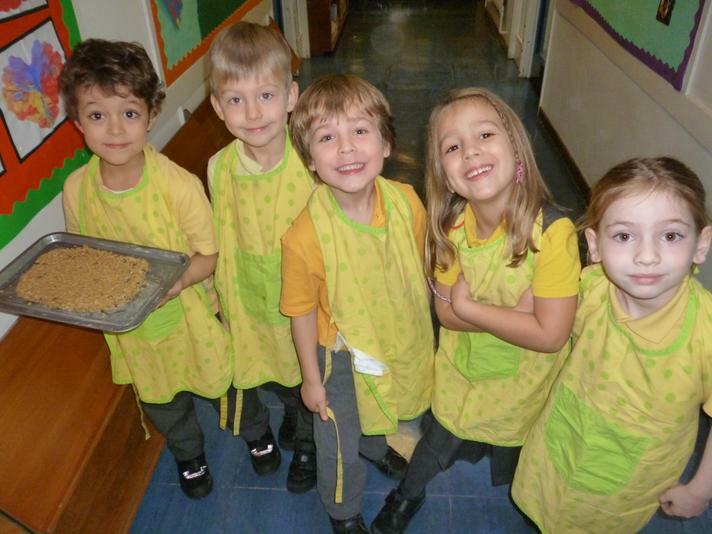 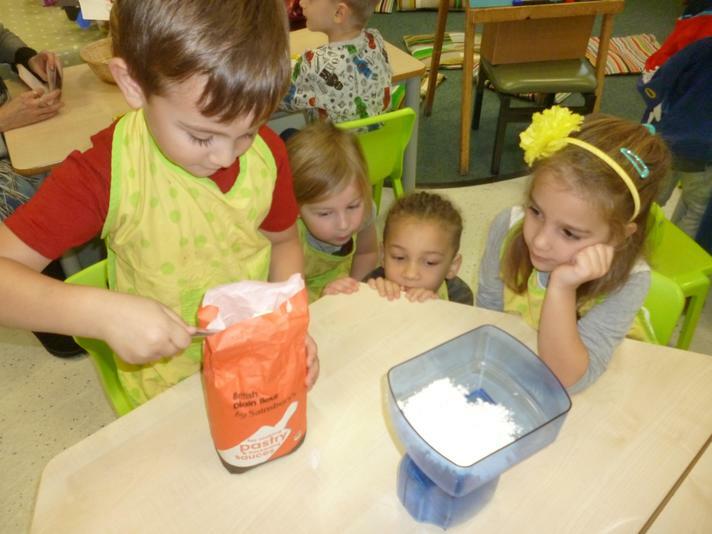 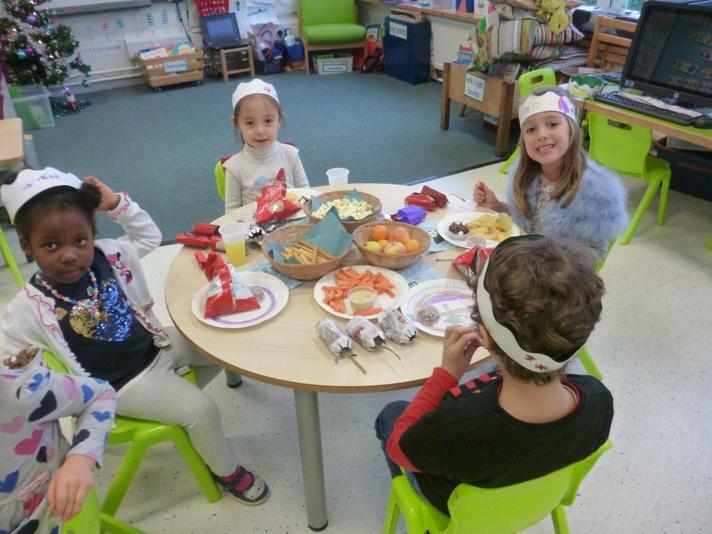 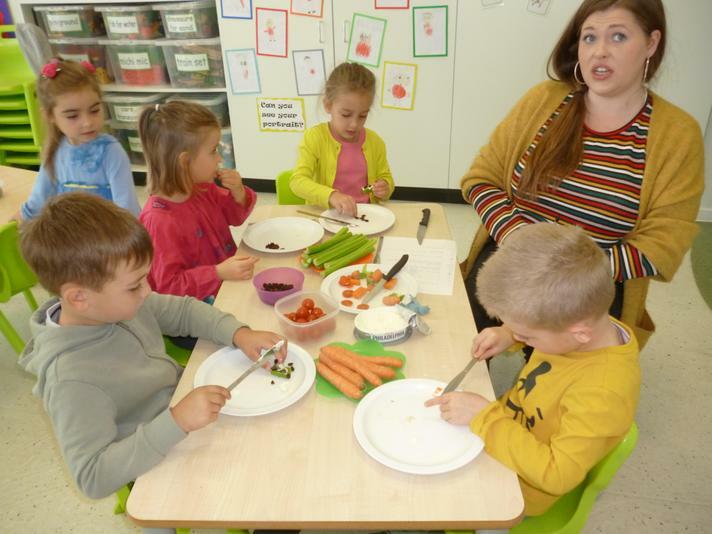 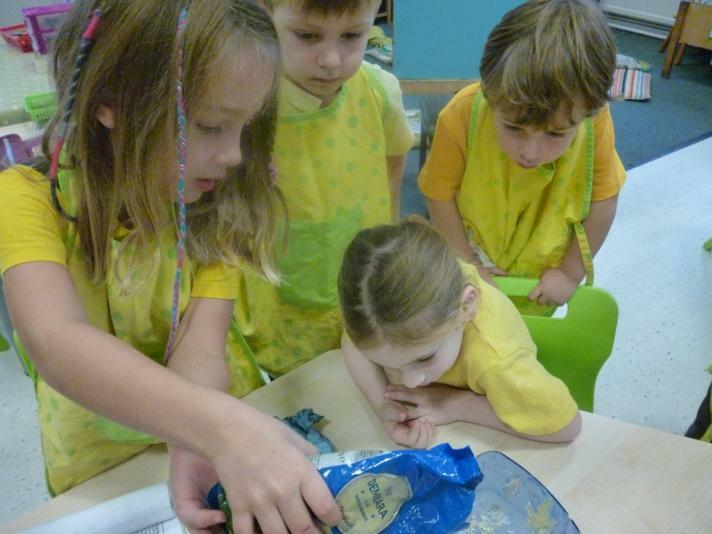 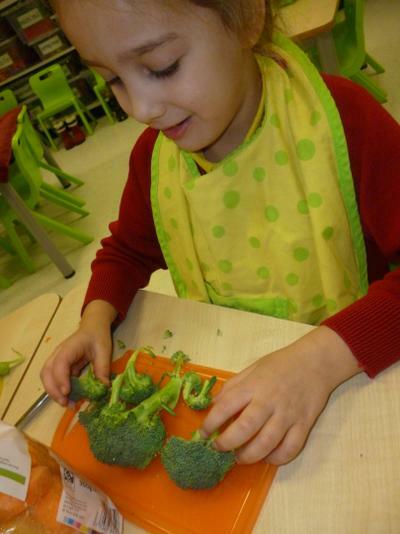 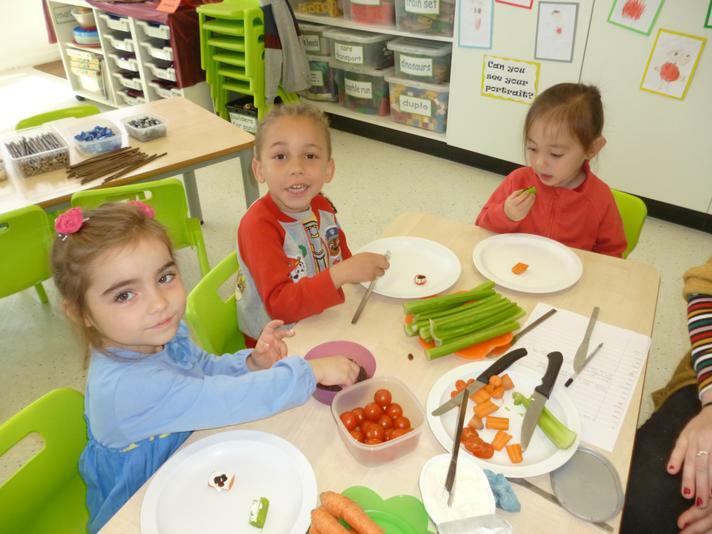 Today our cooks were Eli, Casey, Nataniel, Eloise and Alexander. 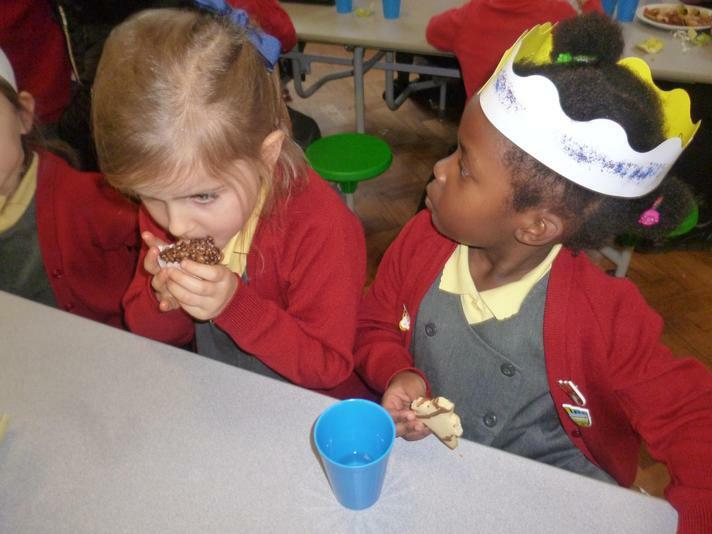 They made chocolate chip flapjacks for everyone. 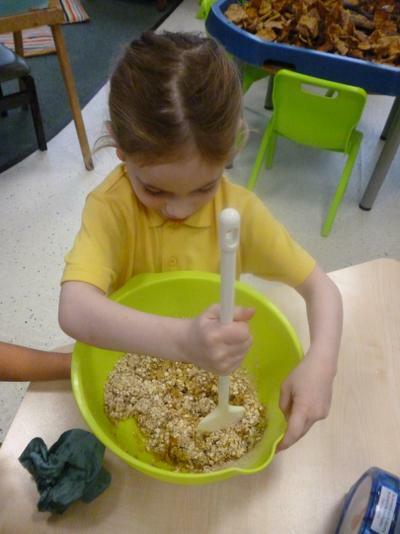 You need 150g butter, 4tblsp syrup, 100g sugar, 250g rolled oats and chocolate chips. 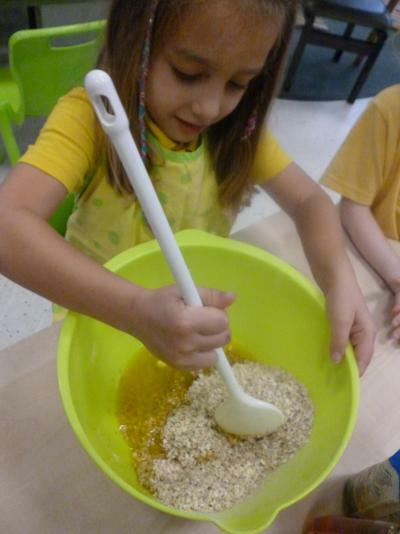 melt the butter and syrup together, add the dry ingredients mix together in a large bowl. 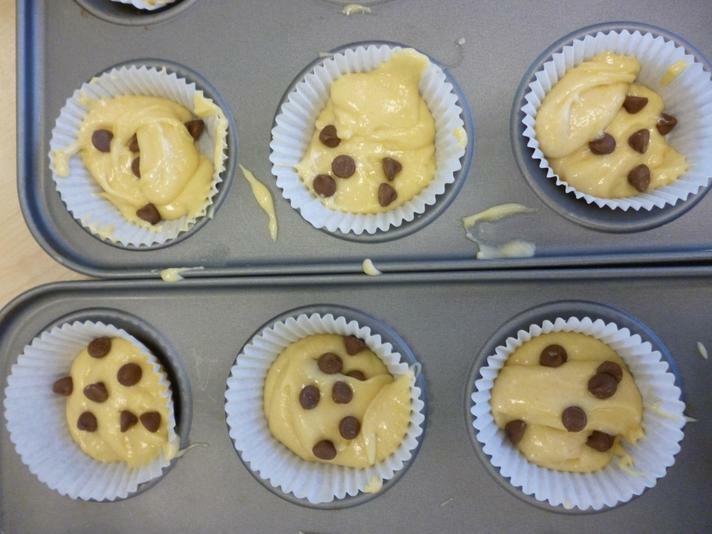 Turn mixture out onto a greased baking tray and spread evenly. 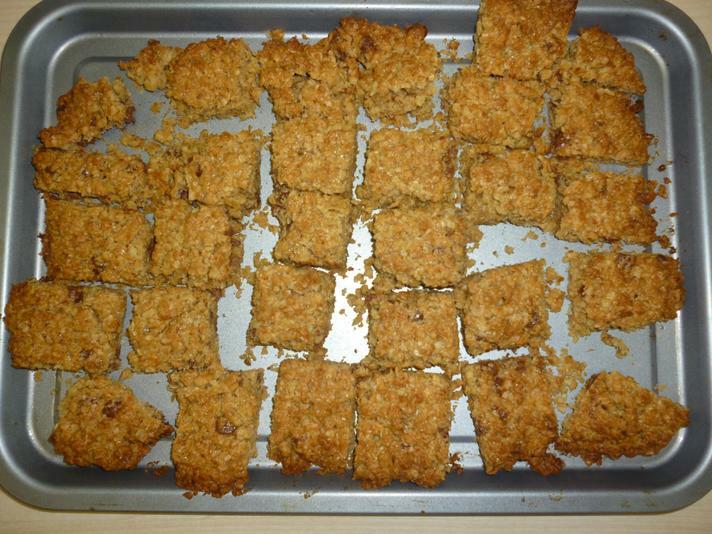 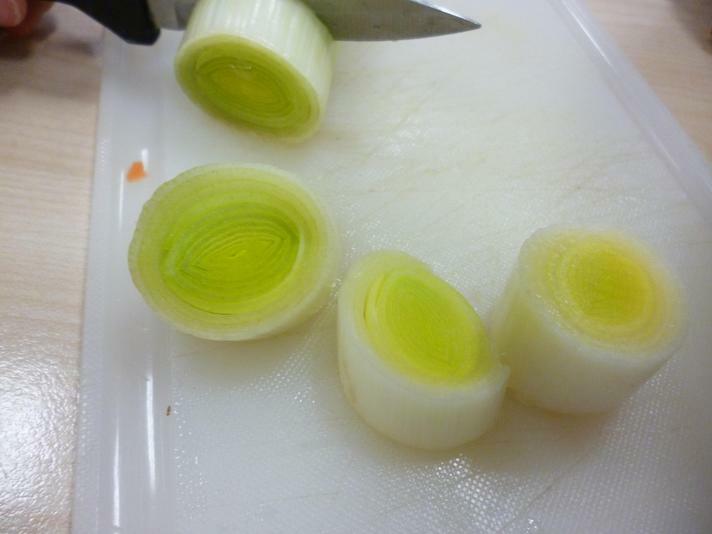 Cook in a medium oven for 30 minutes, leave to cool and cut into squares. 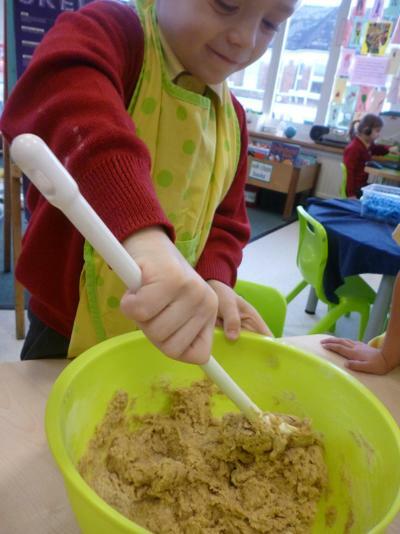 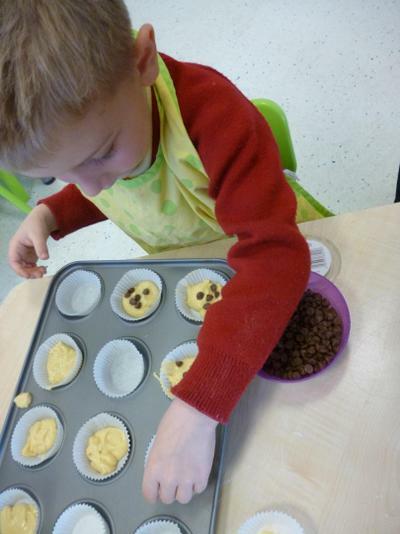 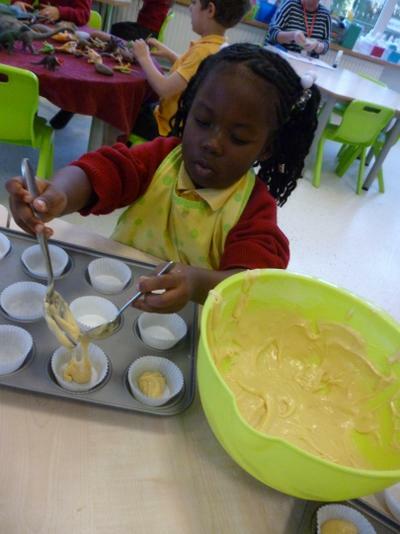 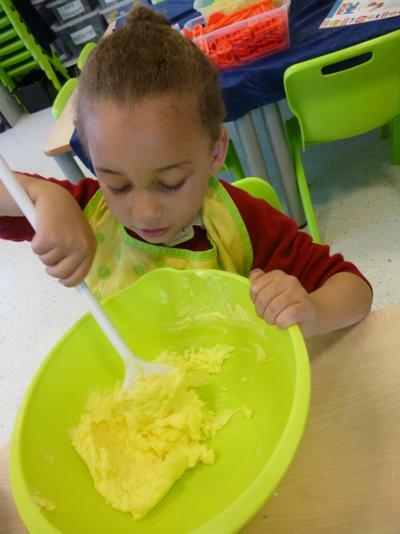 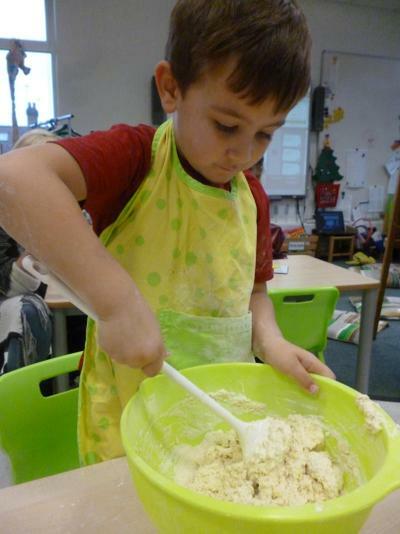 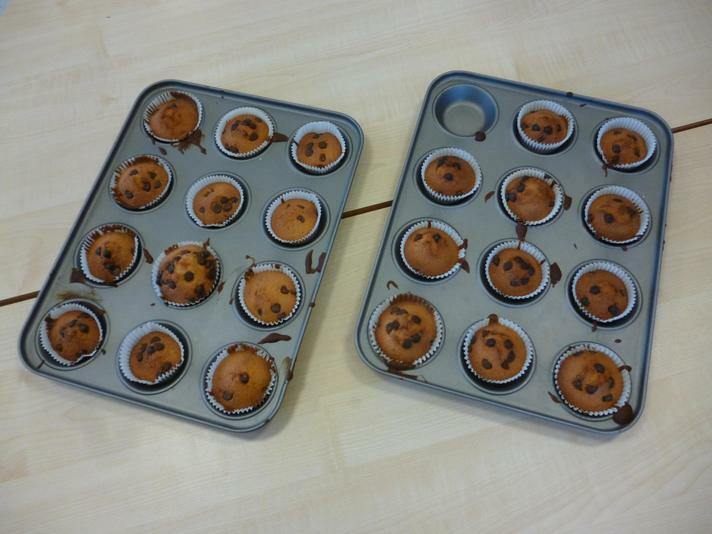 Chocolate chip cakes, today our cooks were Levi, Dione, Kaien, Jack and Grace. 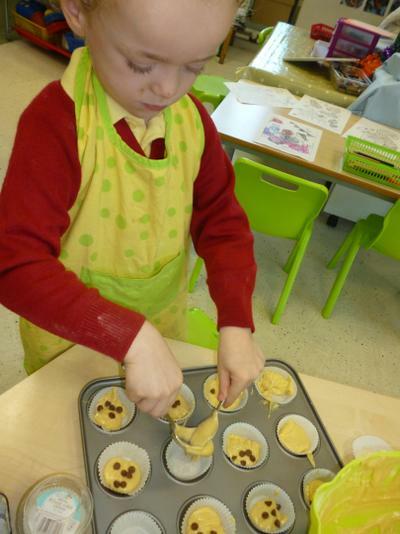 The recipe is the same as our jammy cakes just add chocolate chips instead of jam! 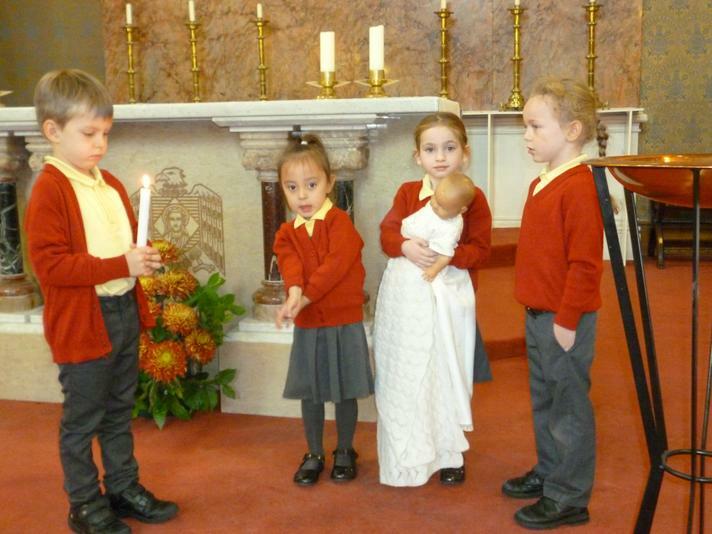 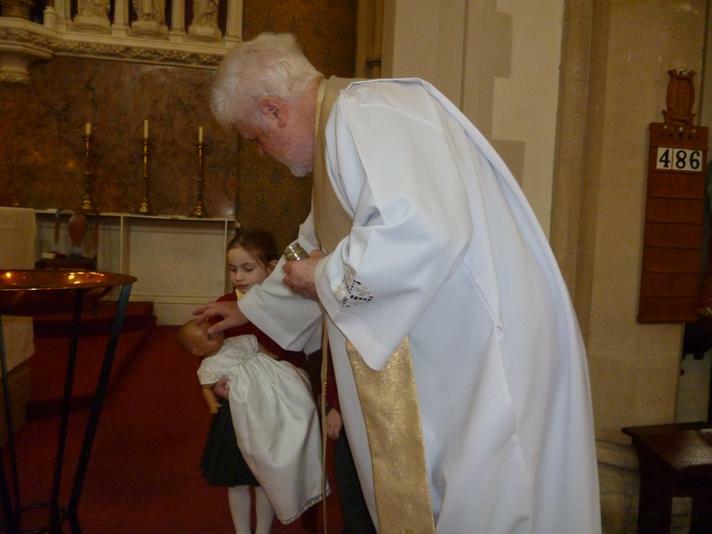 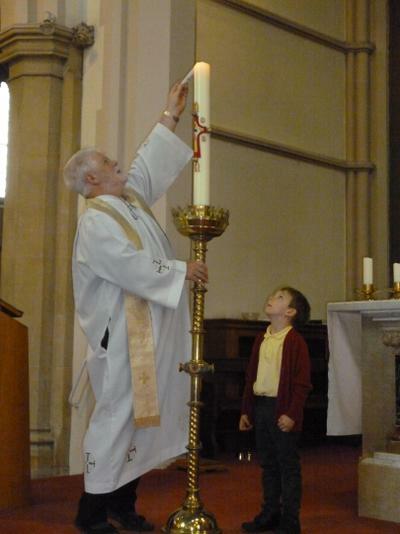 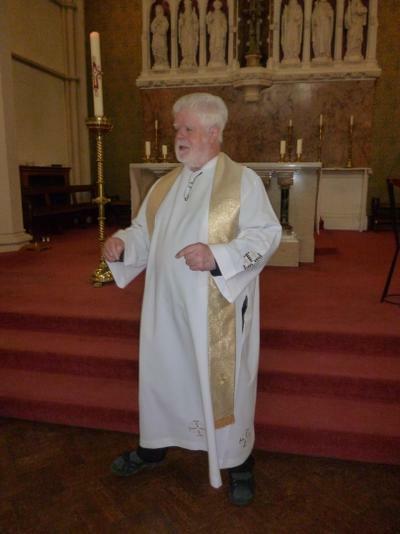 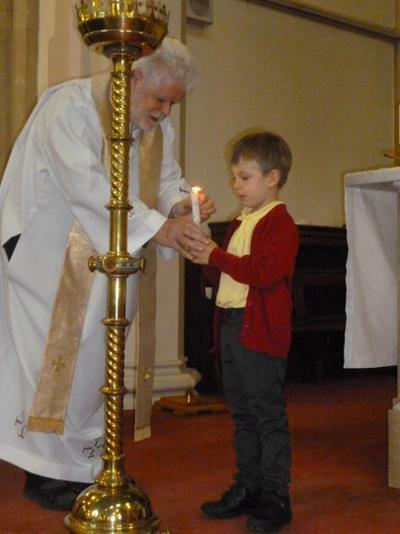 We took baby Peter to be baptised, do you remember who you were in Peter's family? 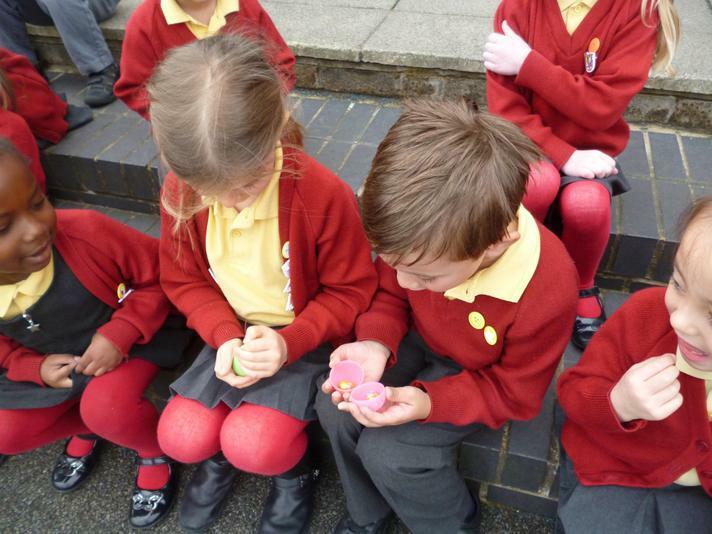 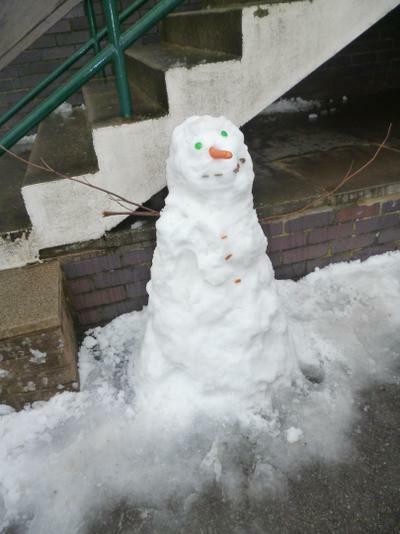 Brightening the lives of others with Cafod. 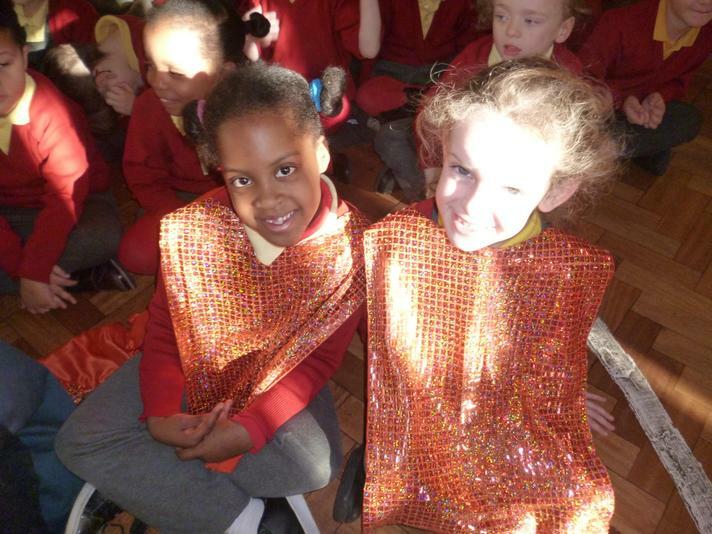 We had a great day today wearing our brightest clothes and raising money for the people of Indonesia. 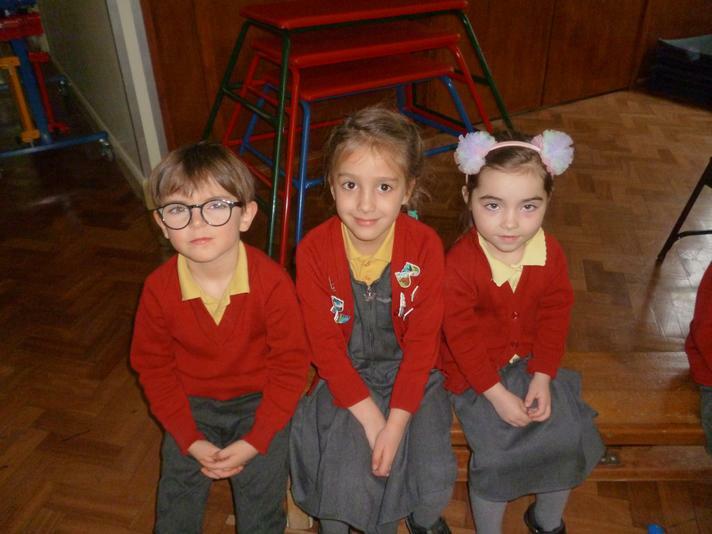 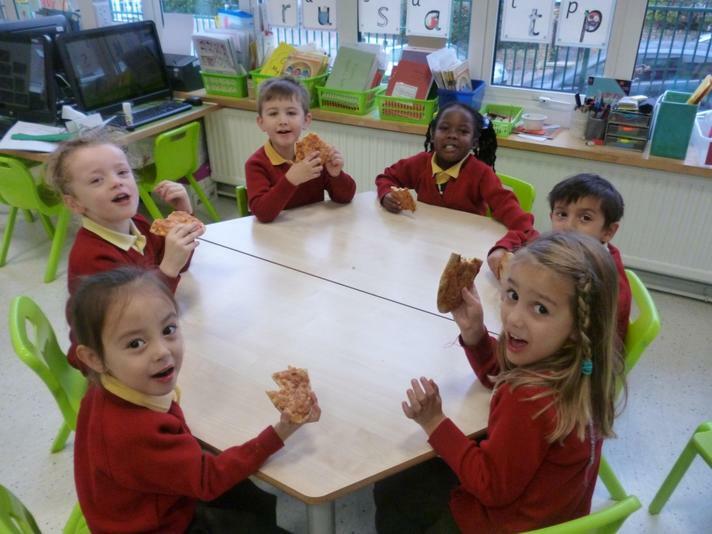 We raised a fabulous £195 in Oak class...Thank you very much for your support.